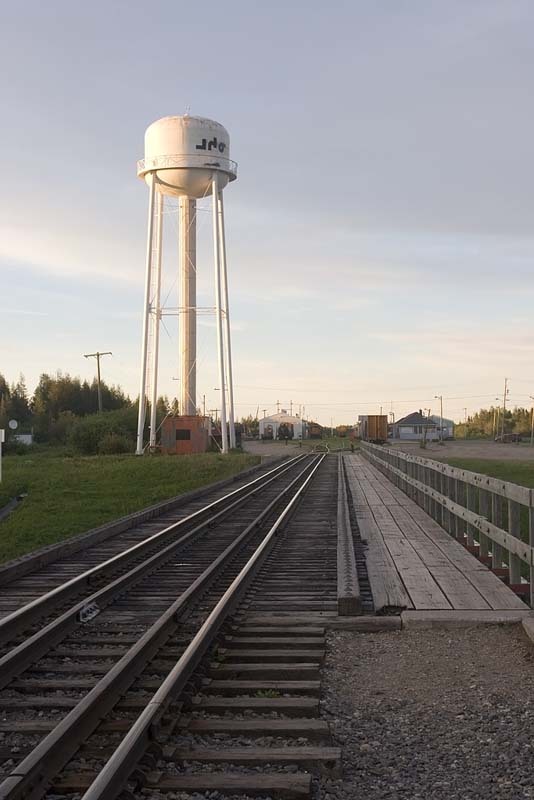 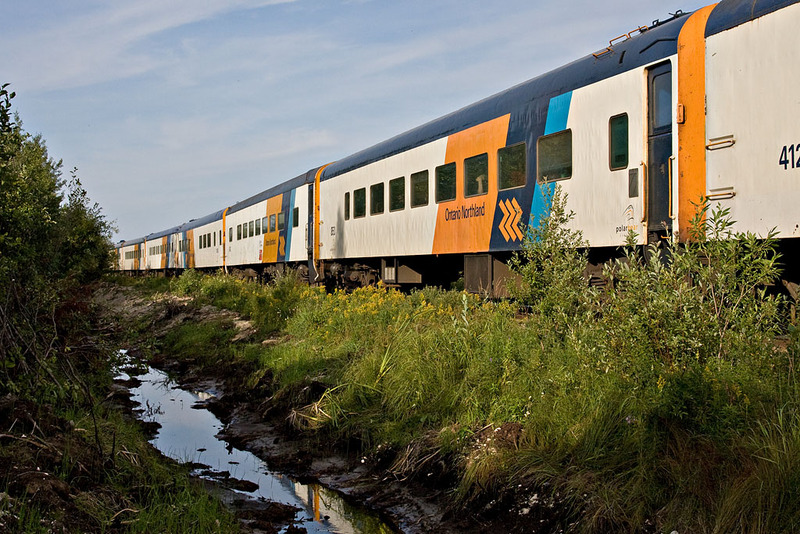 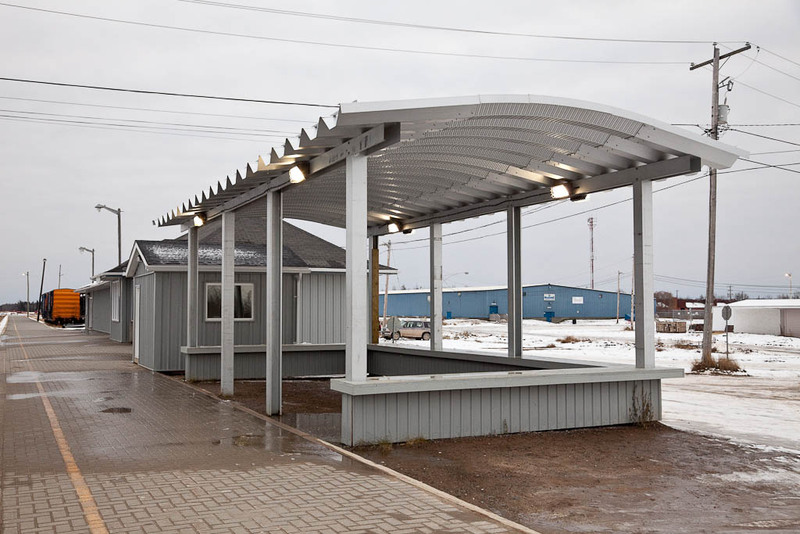 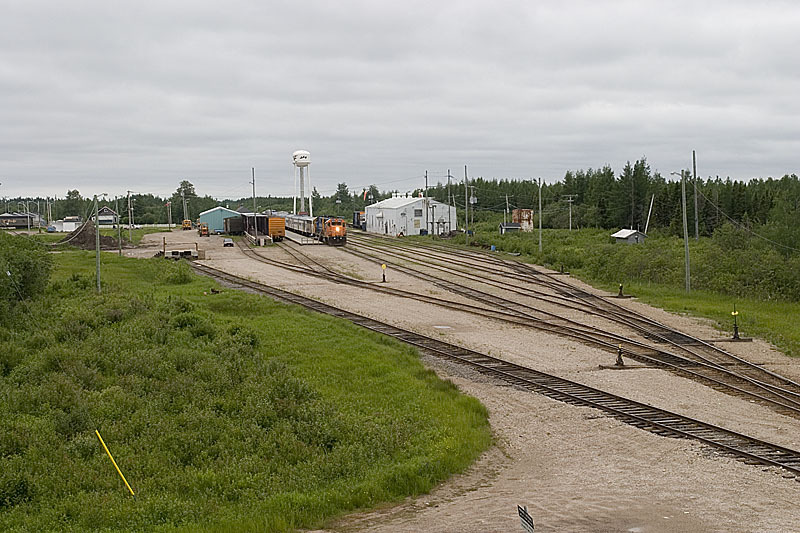 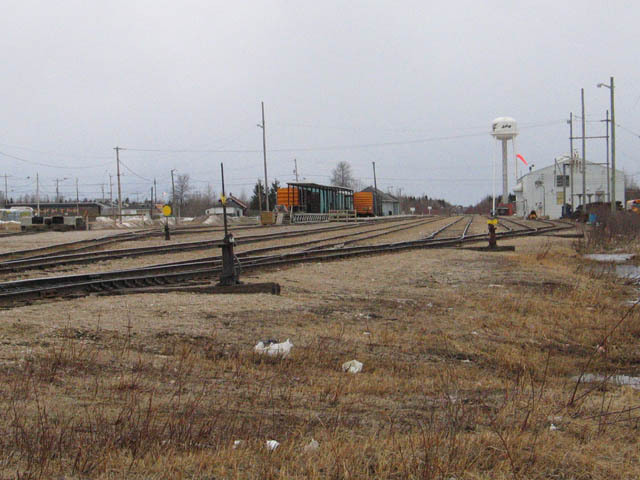 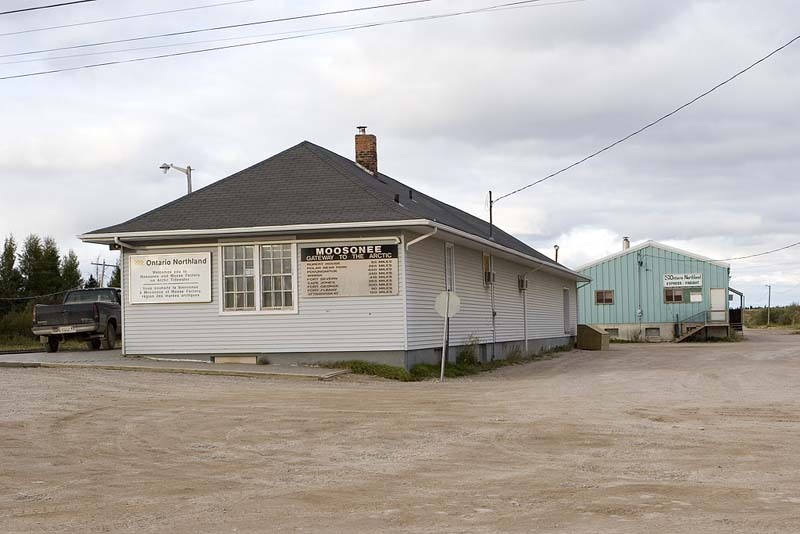 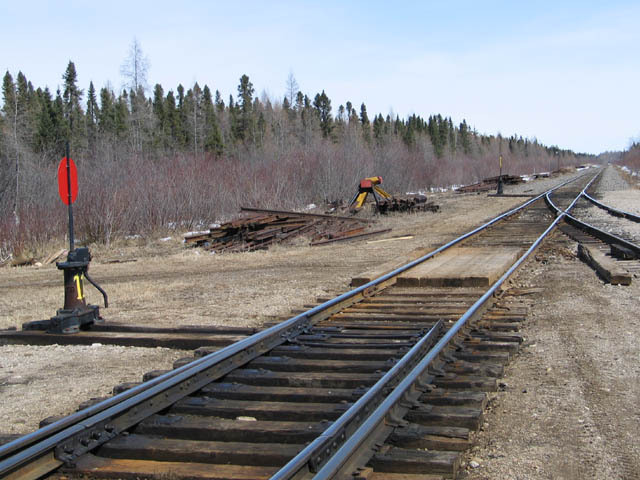 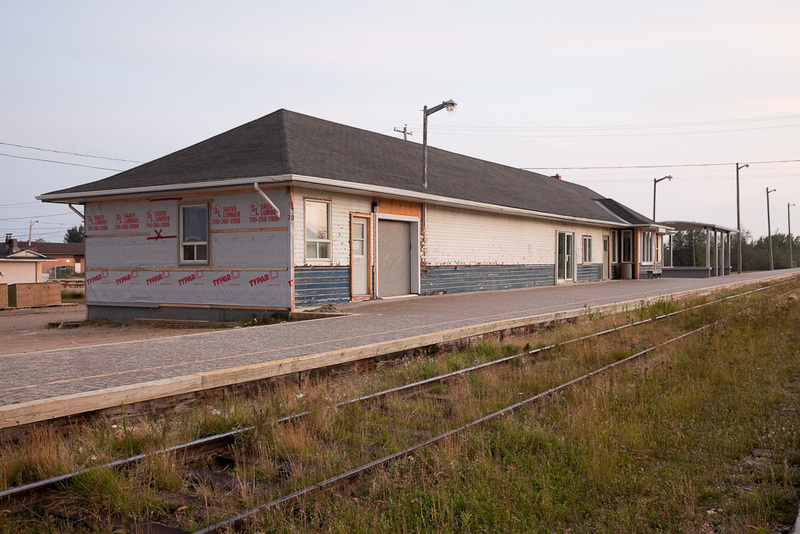 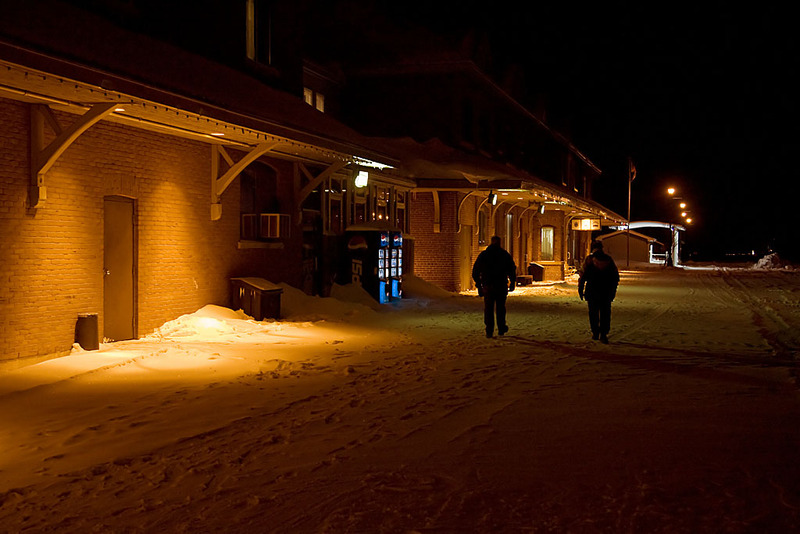 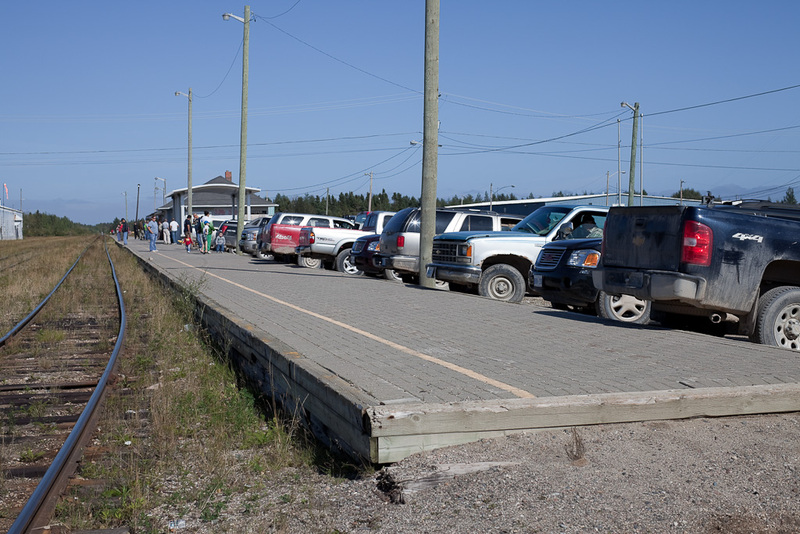 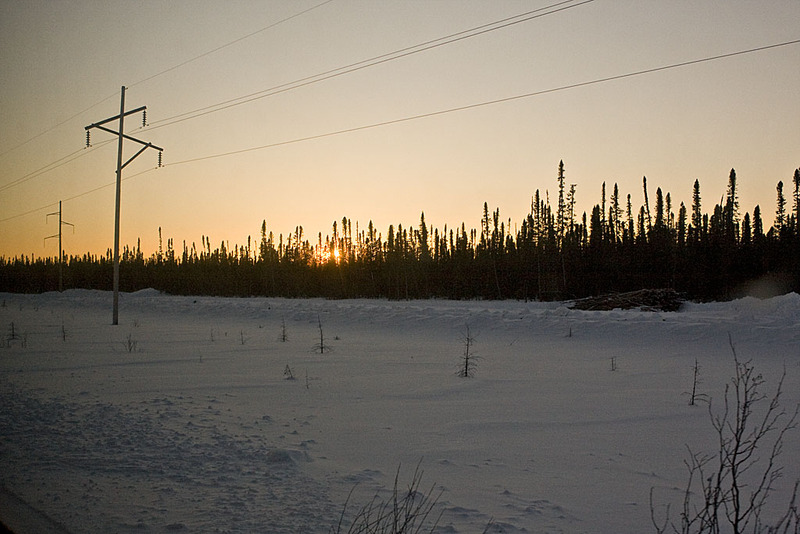 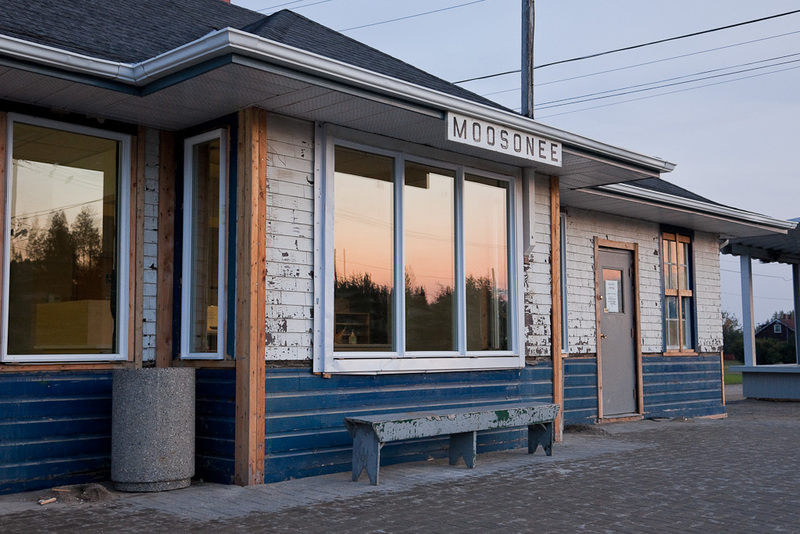 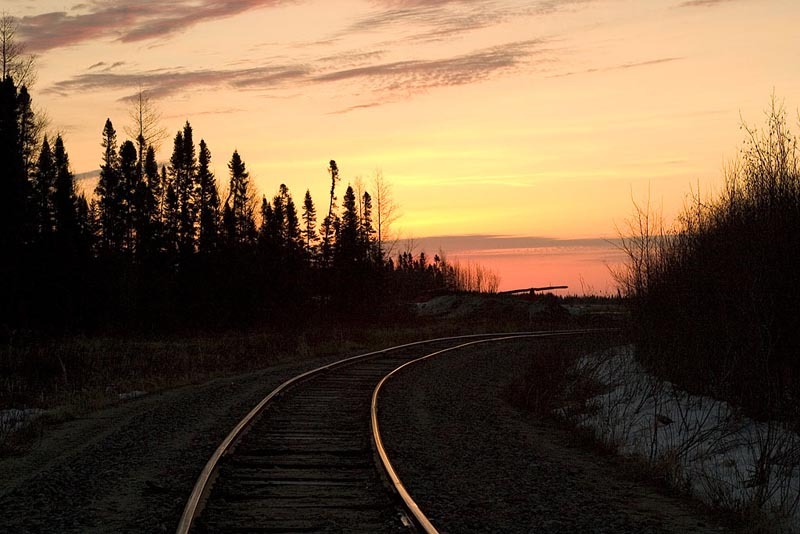 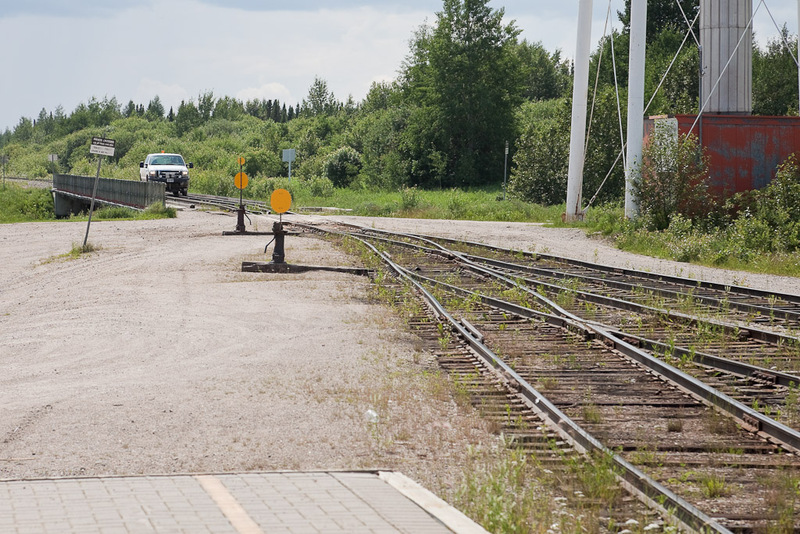 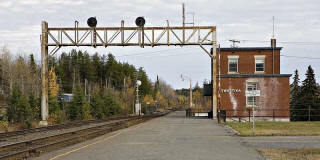 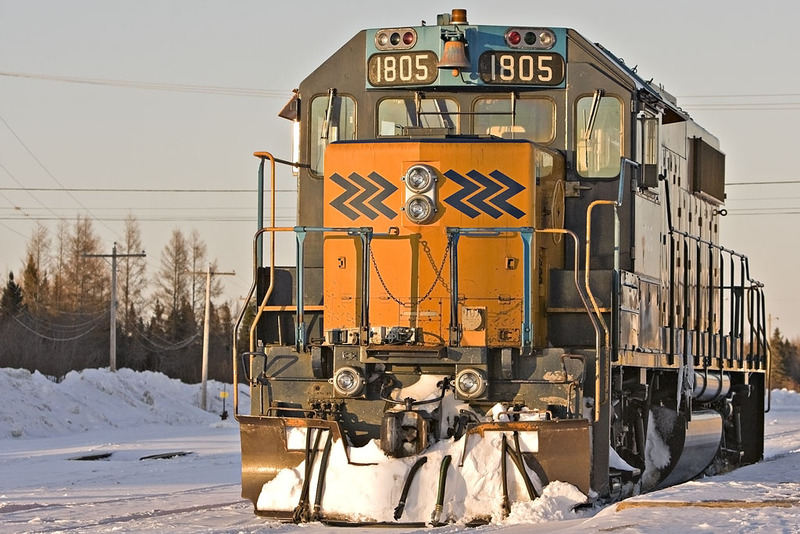 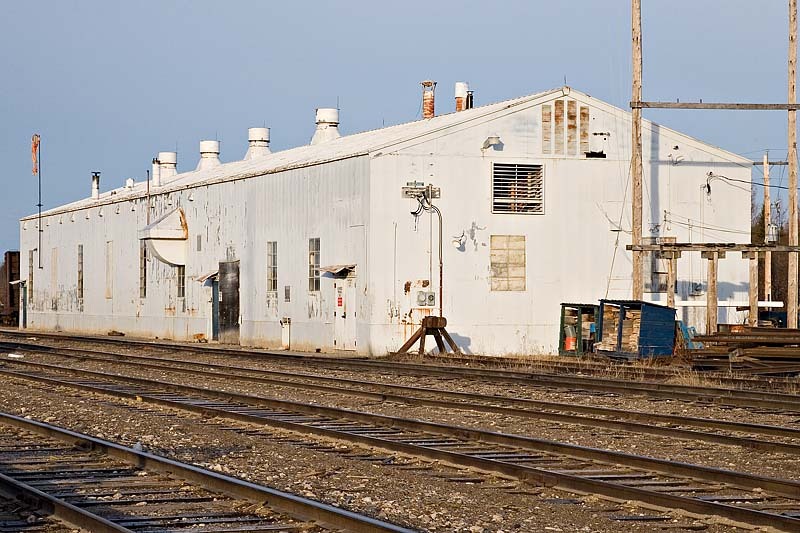 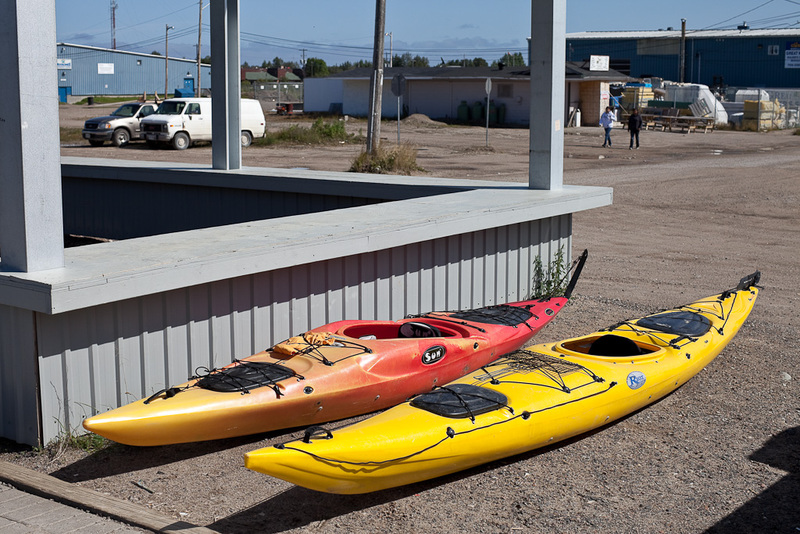 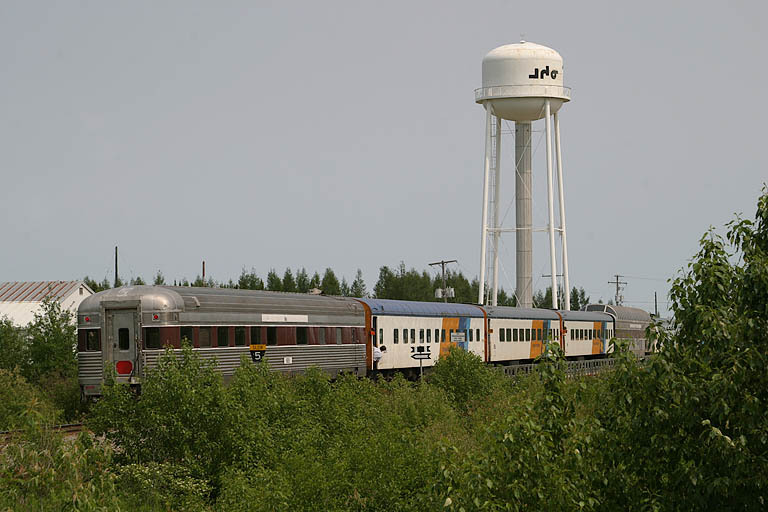 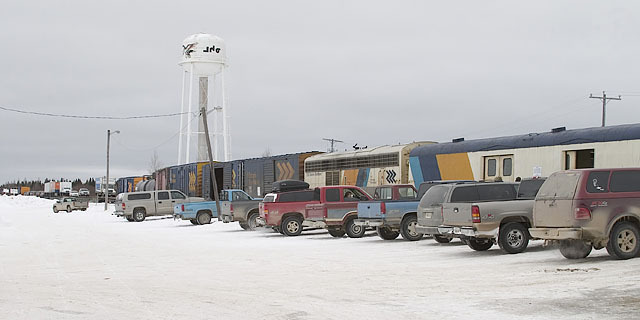 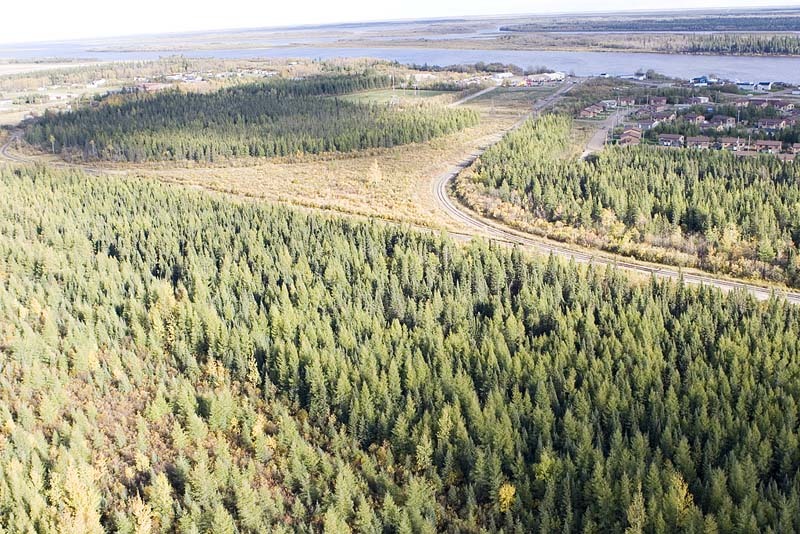 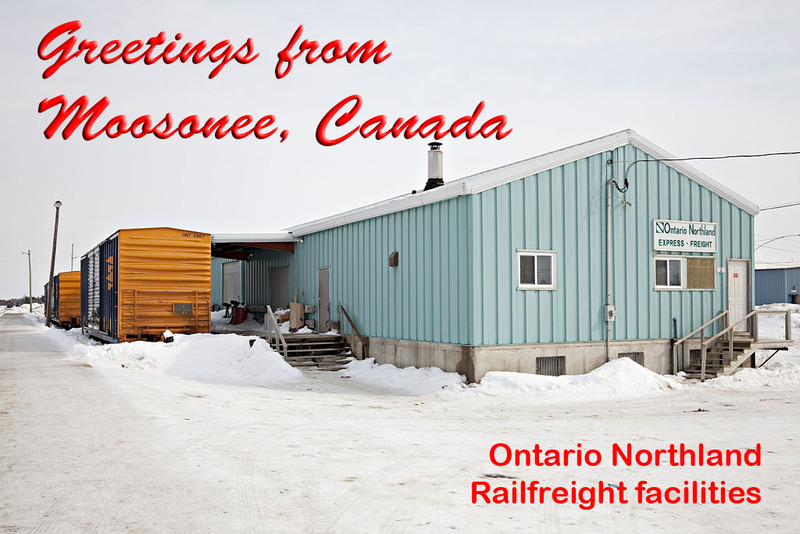 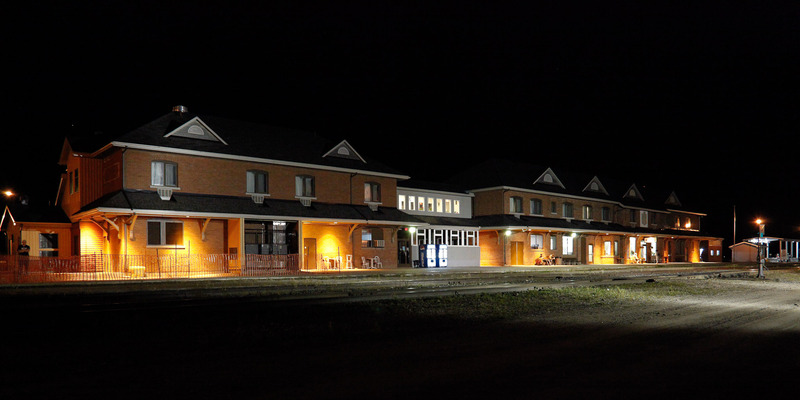 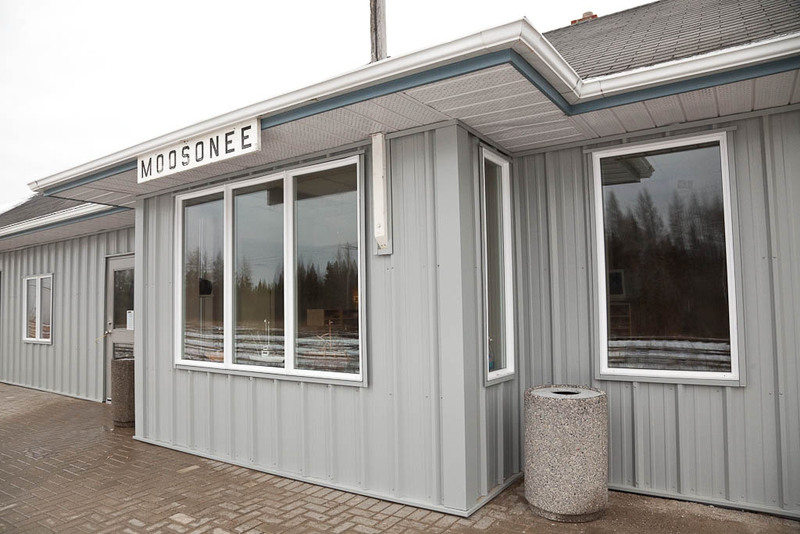 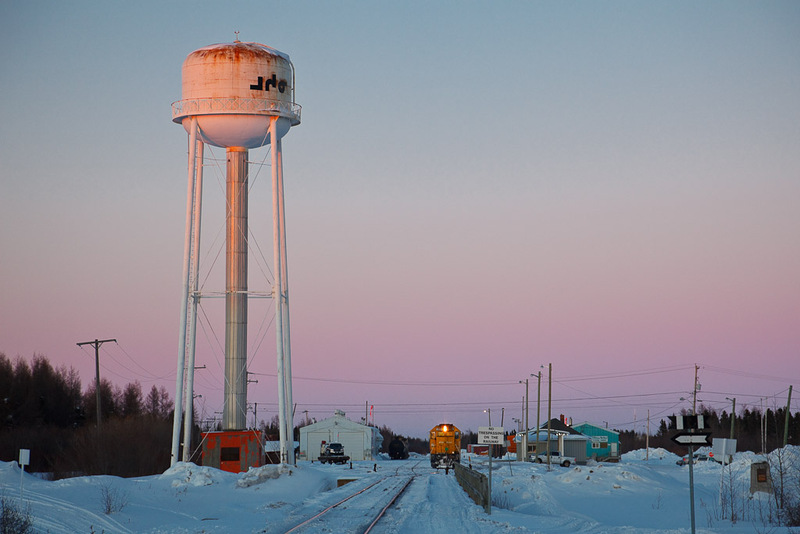 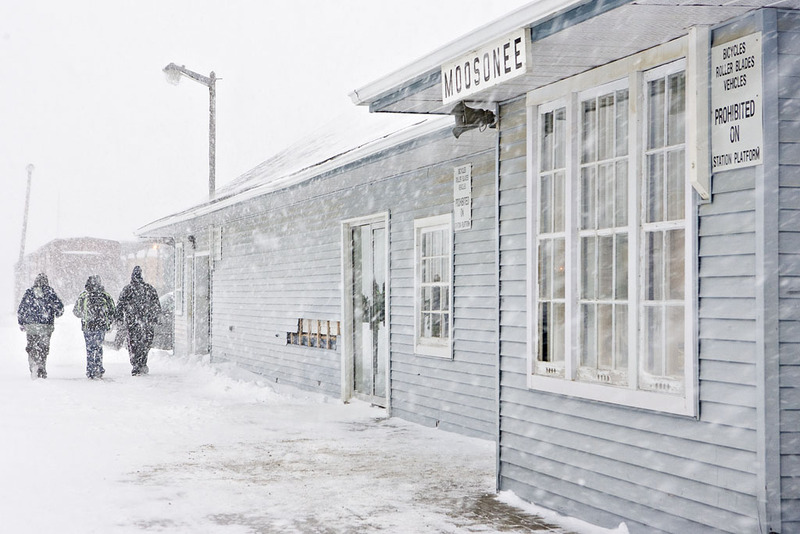 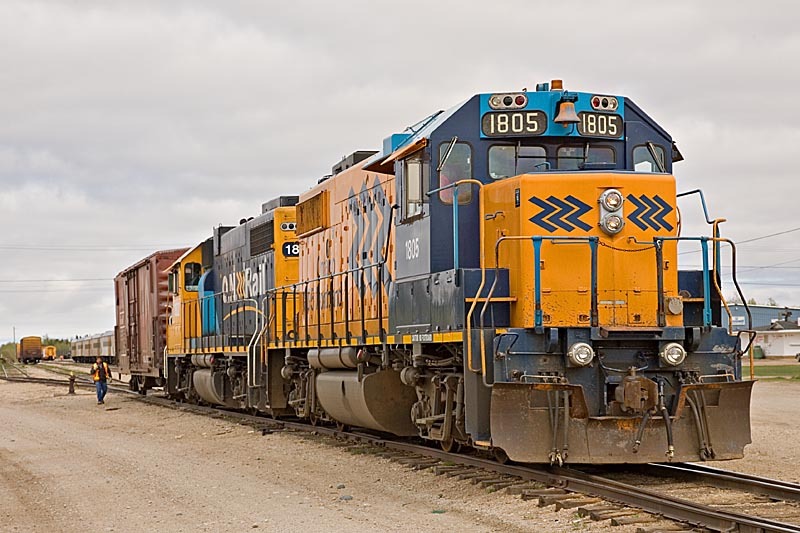 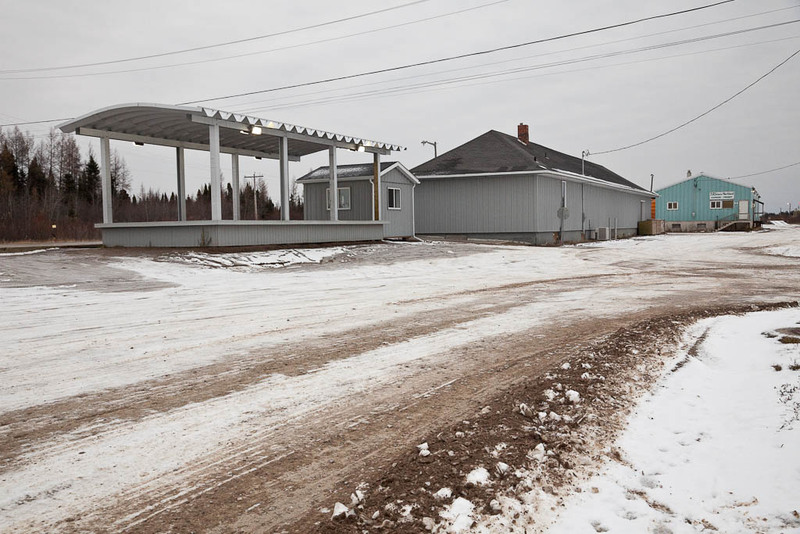 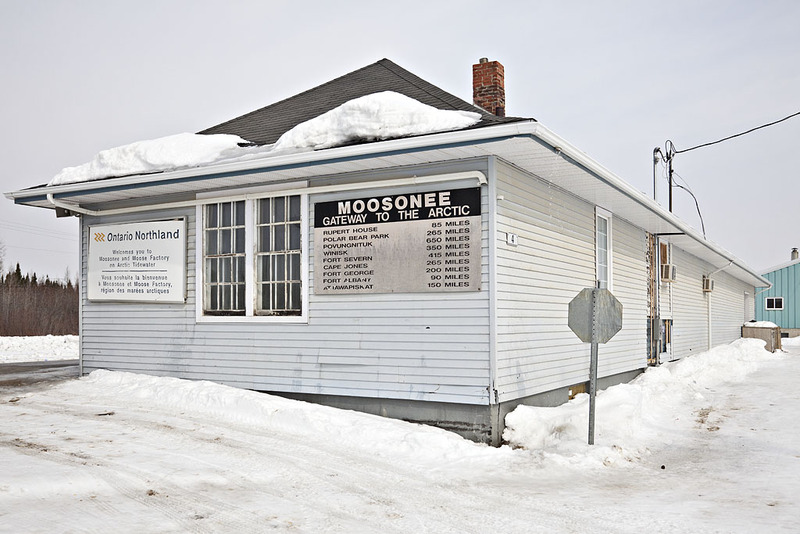 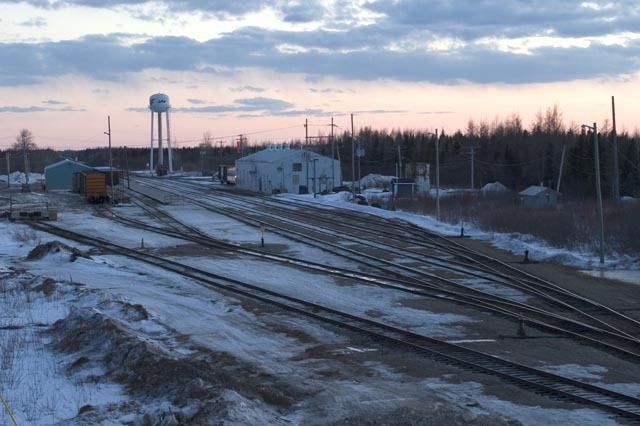 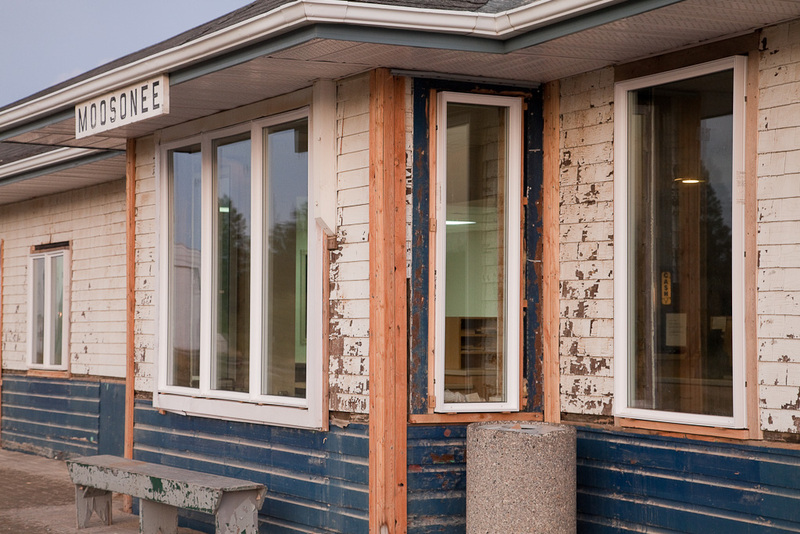 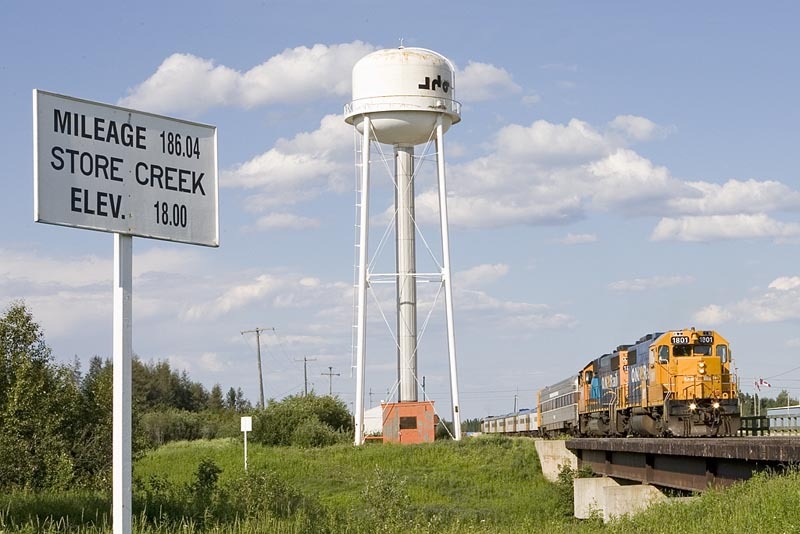 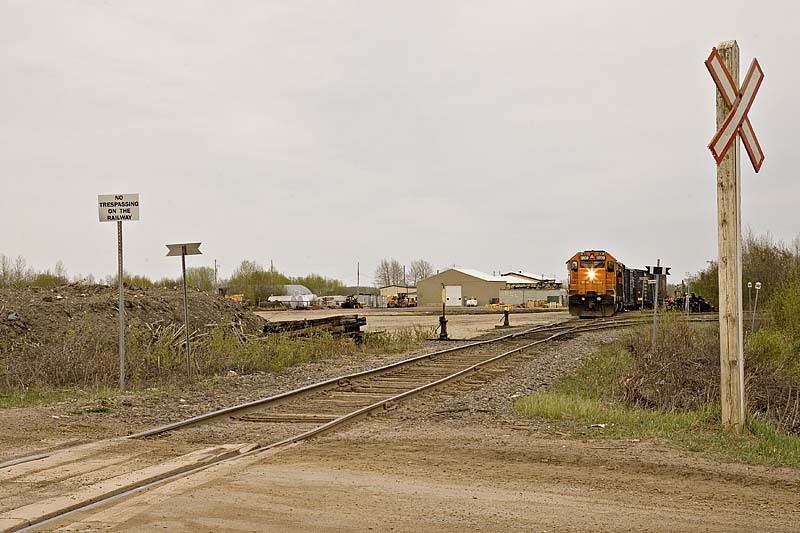 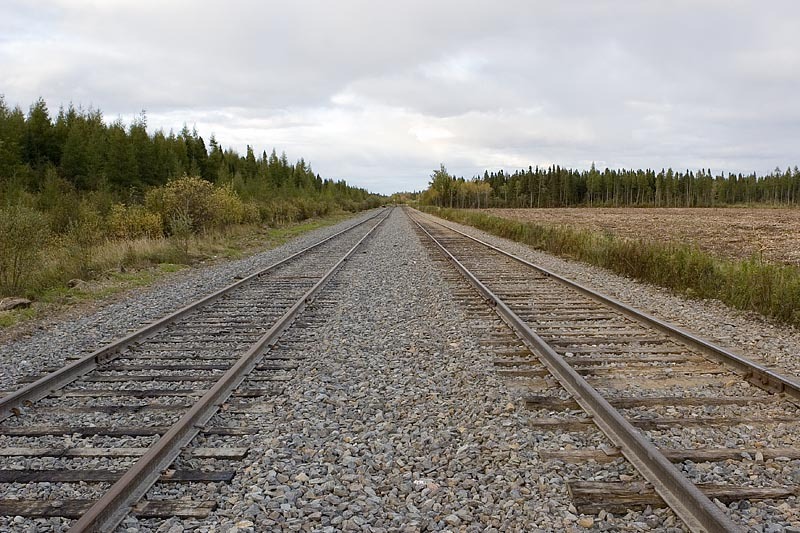 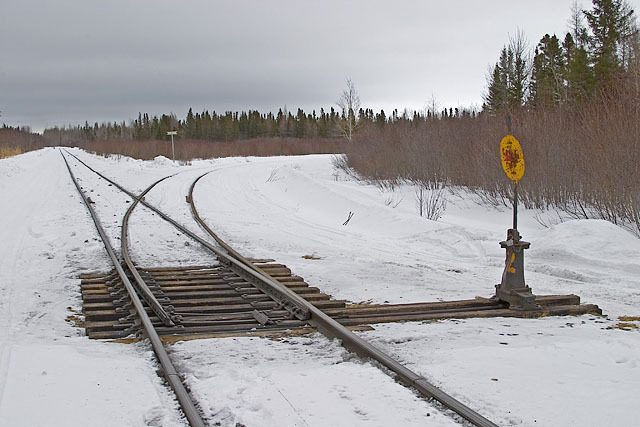 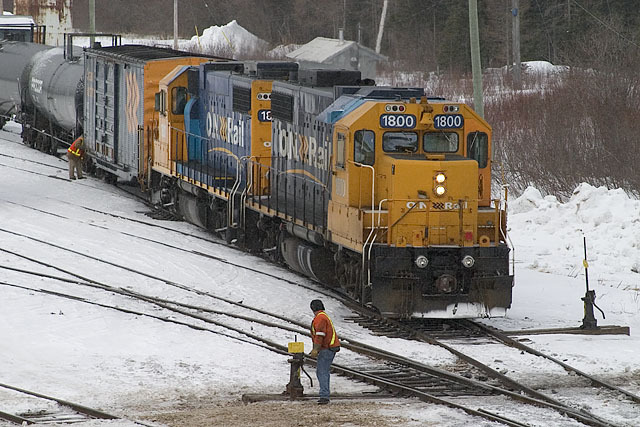 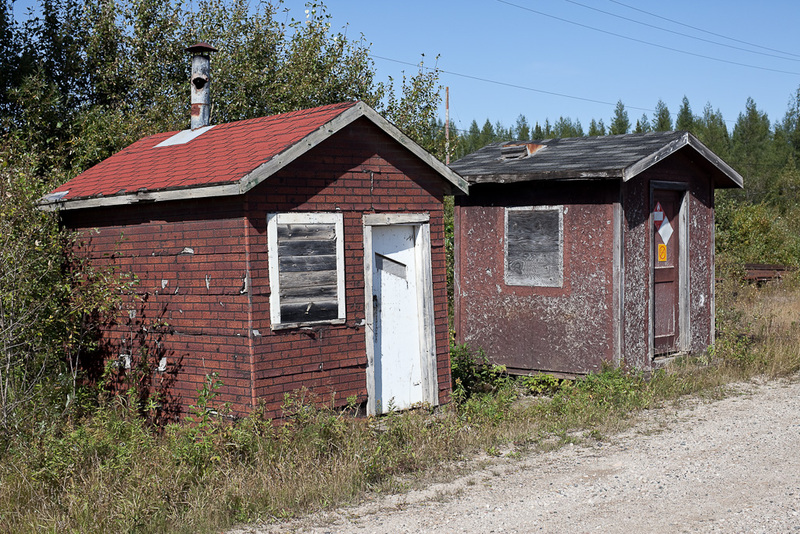 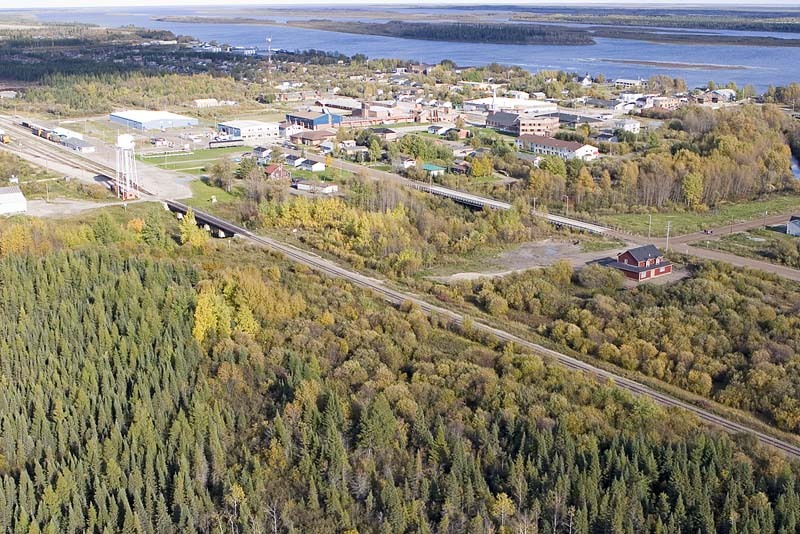 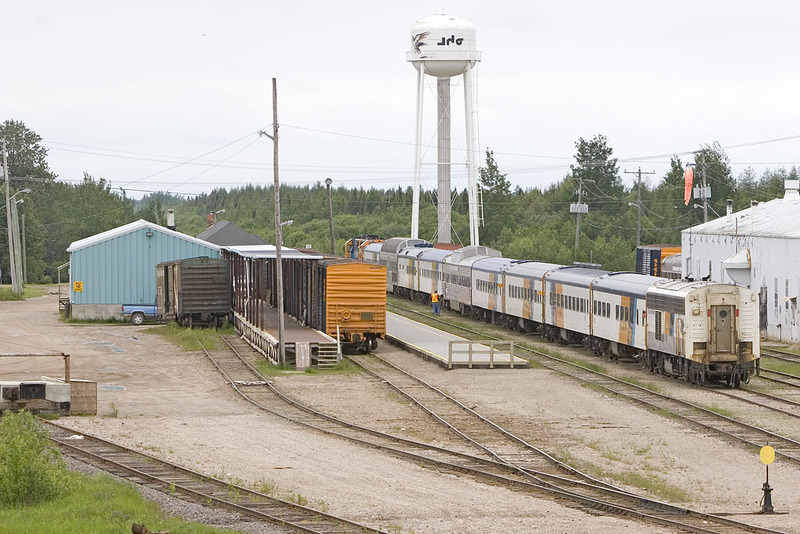 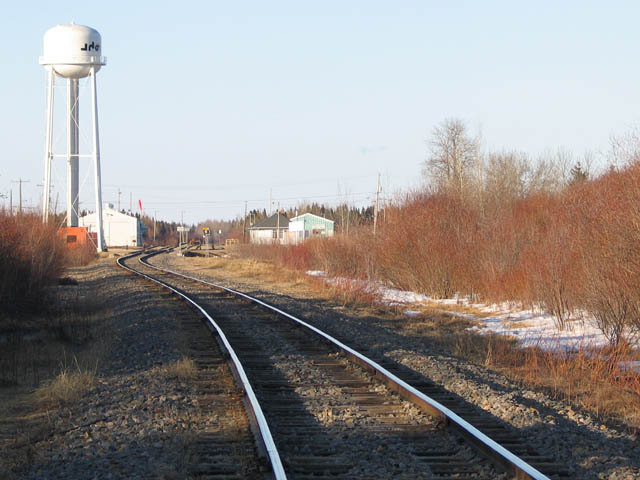 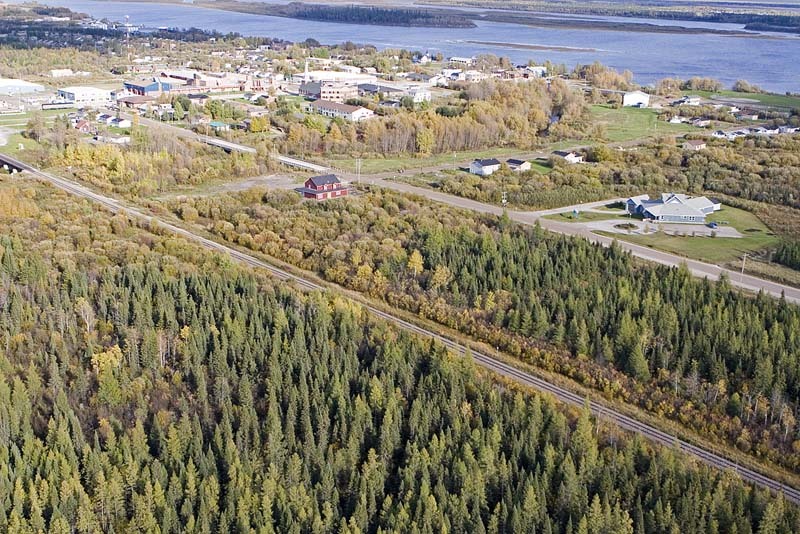 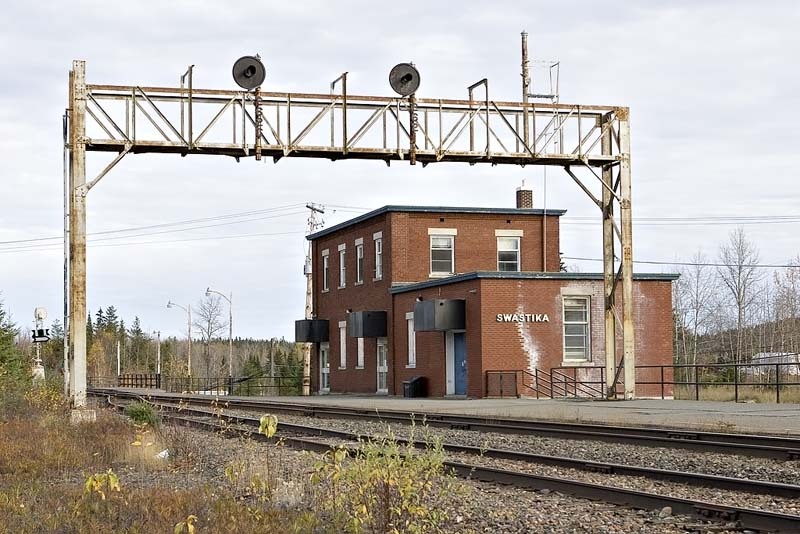 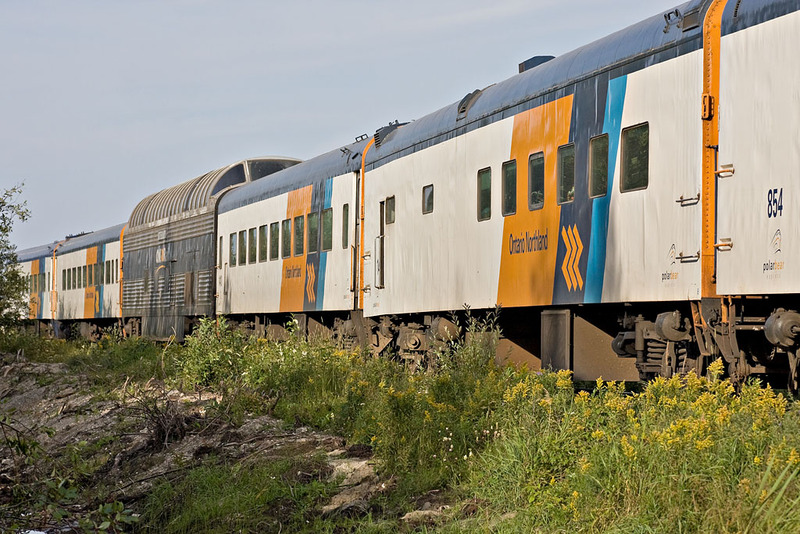 Moosonee is the northern terminus of the Ontario Northland railway (fomerly Temiskaming and Northern Ontario) which begins at North Bay, Ontario. 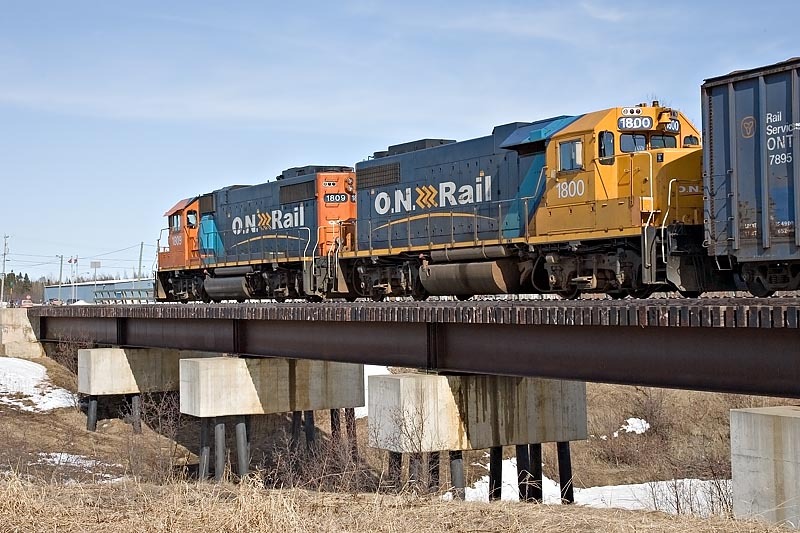 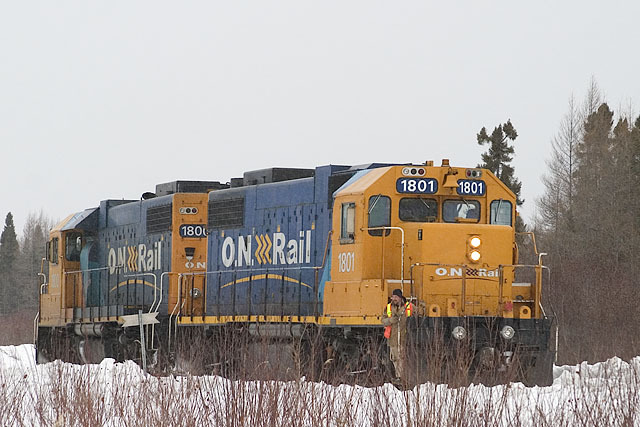 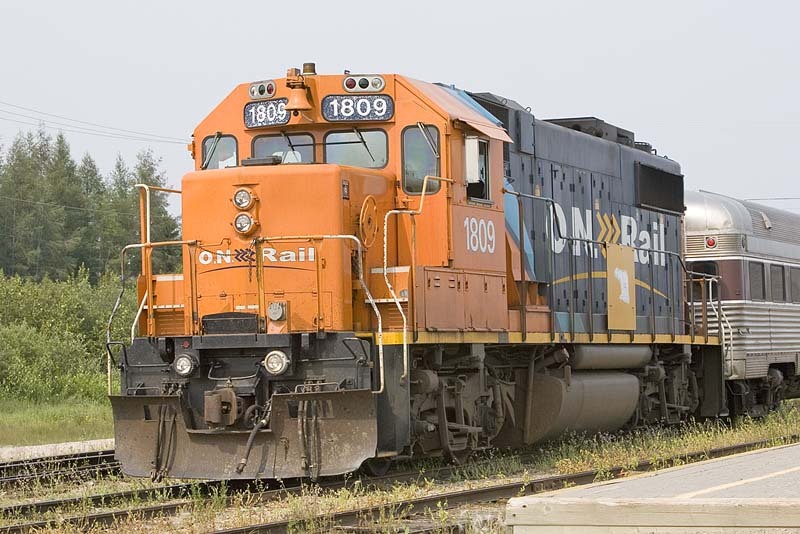 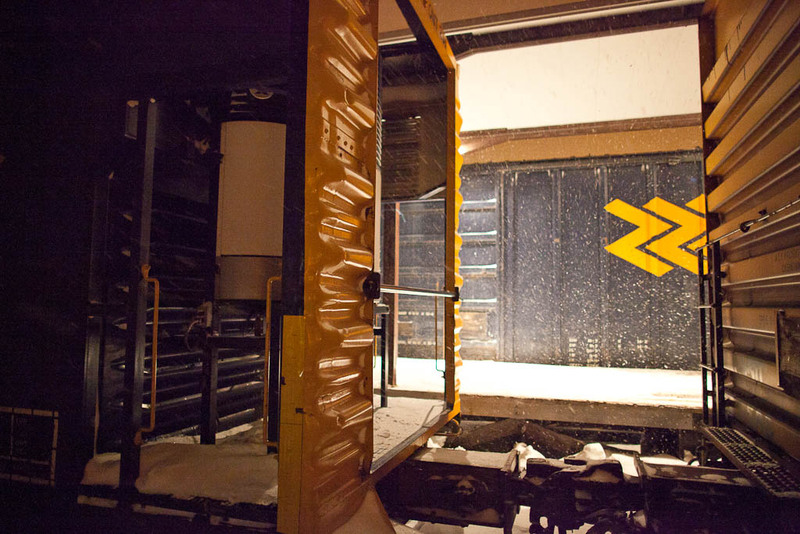 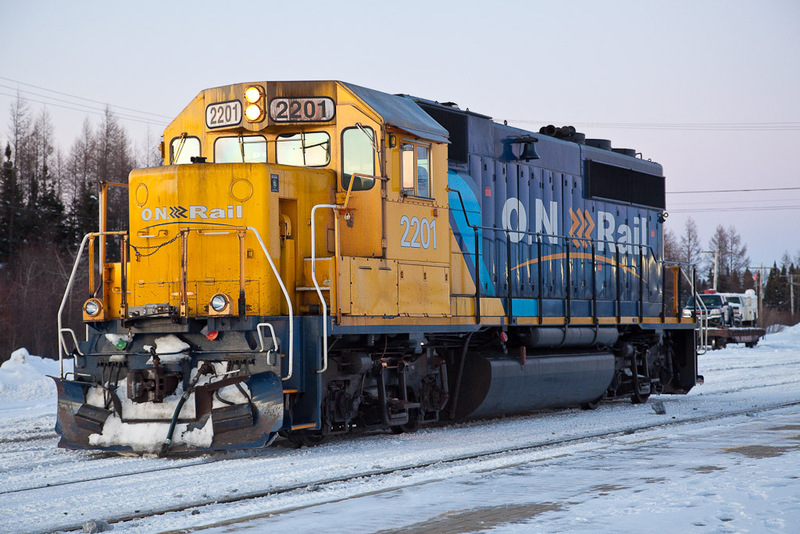 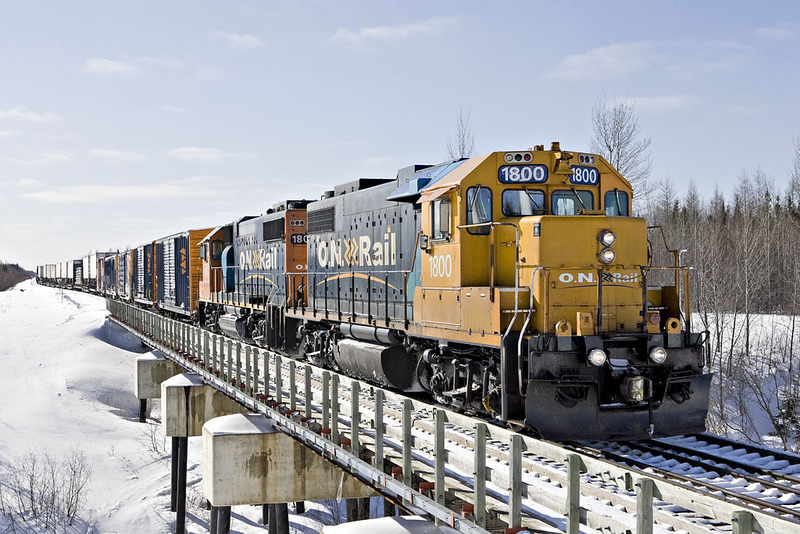 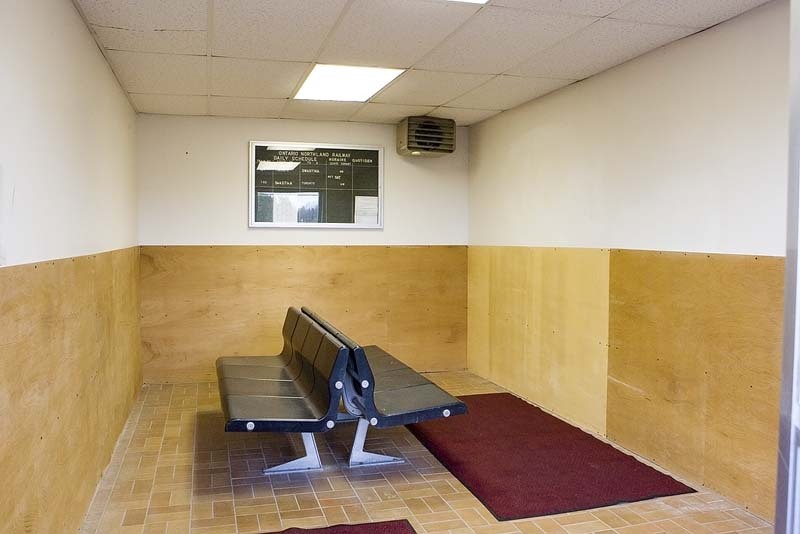 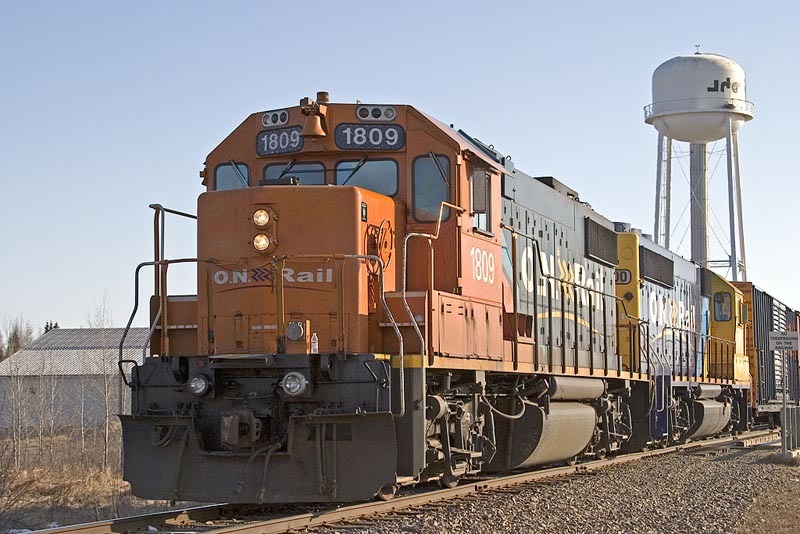 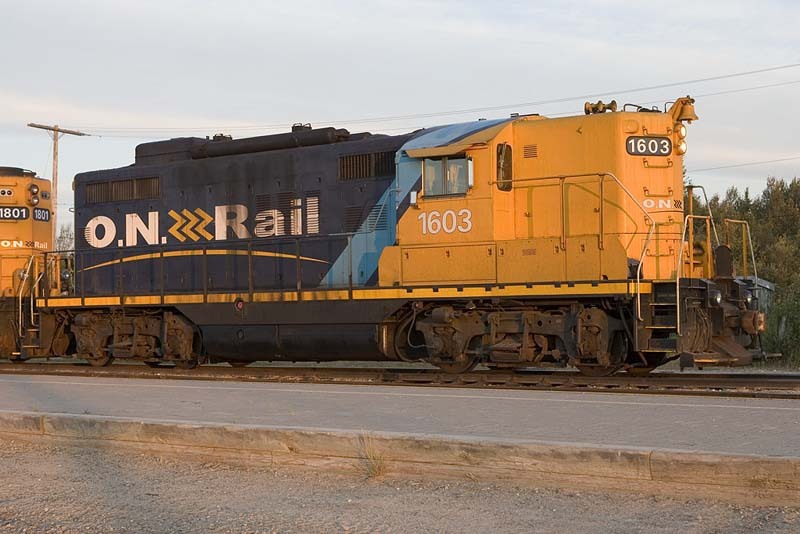 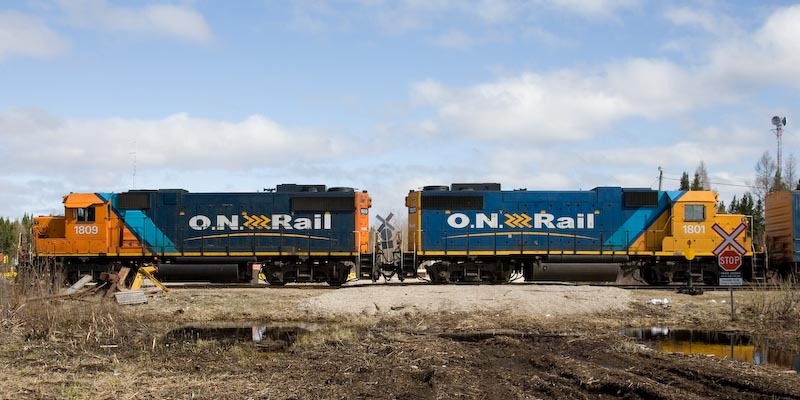 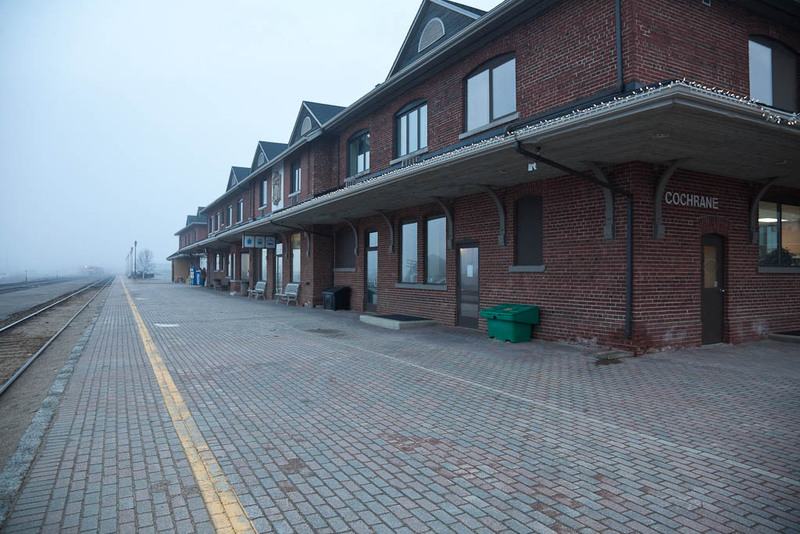 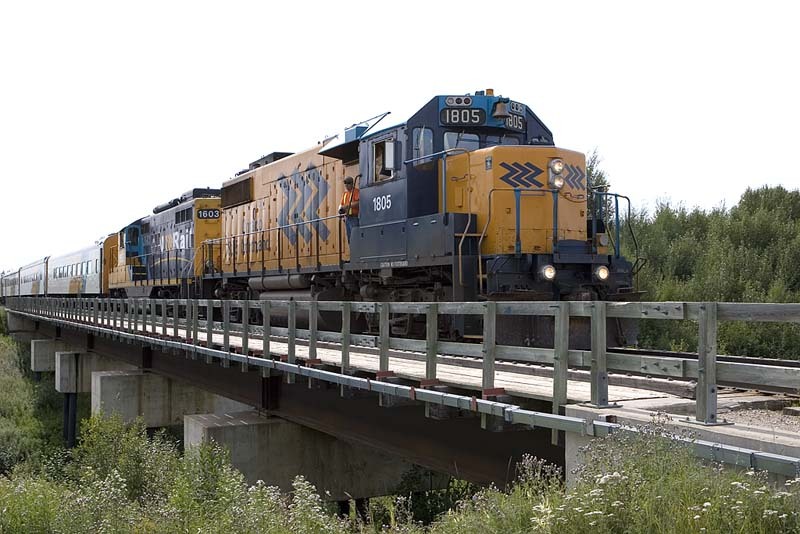 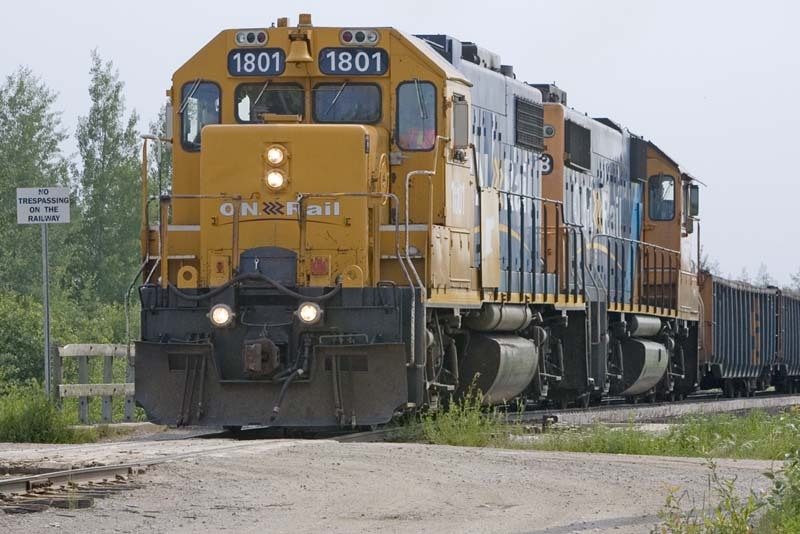 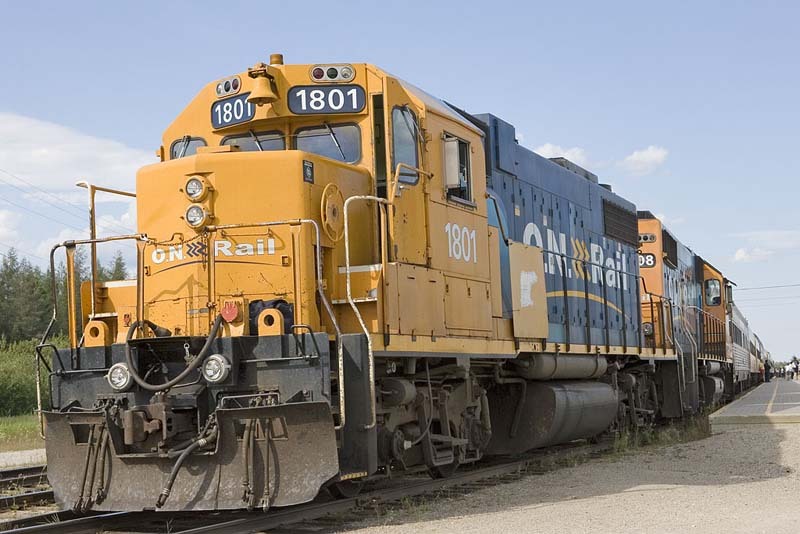 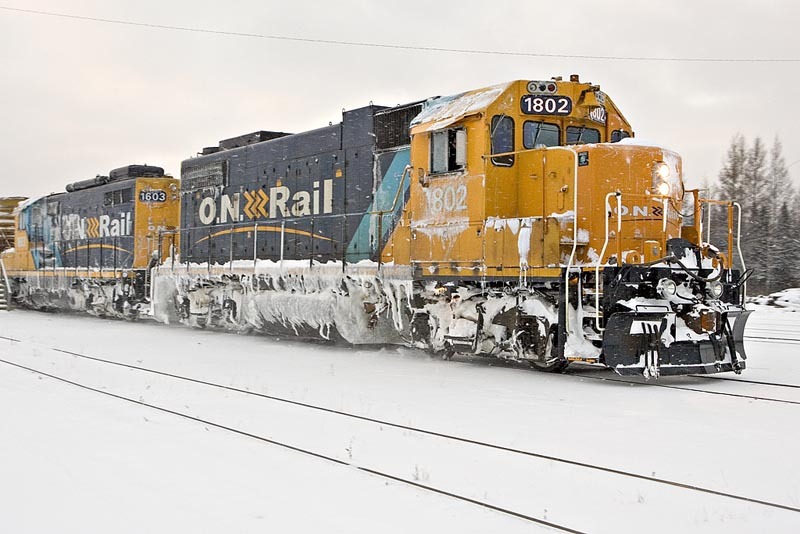 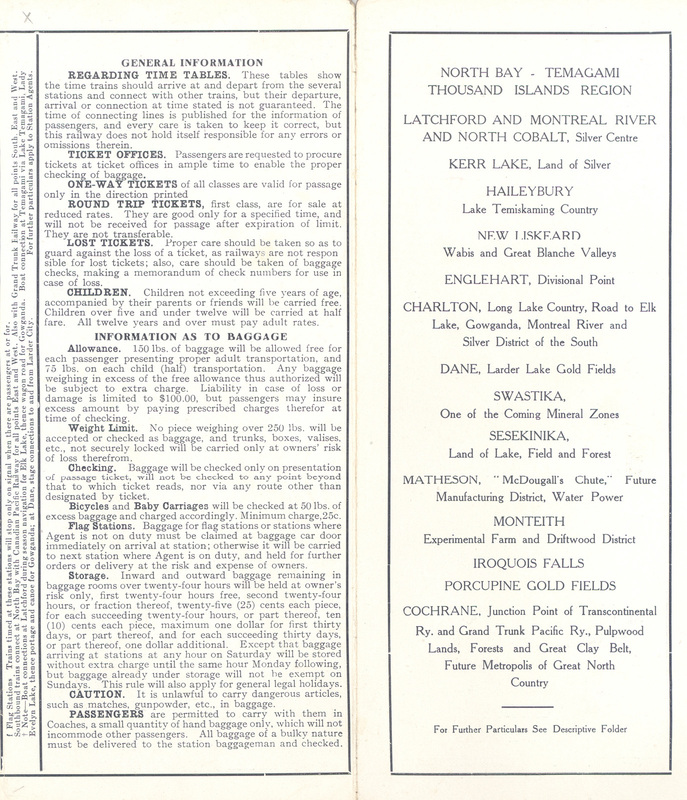 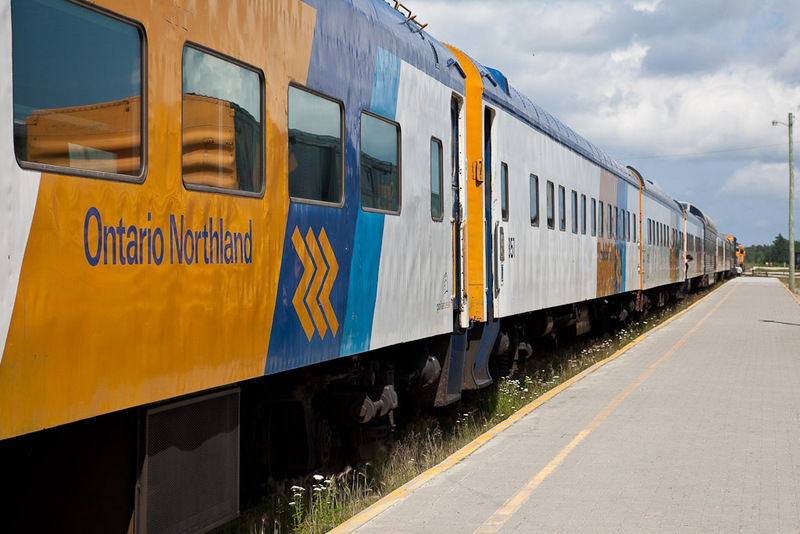 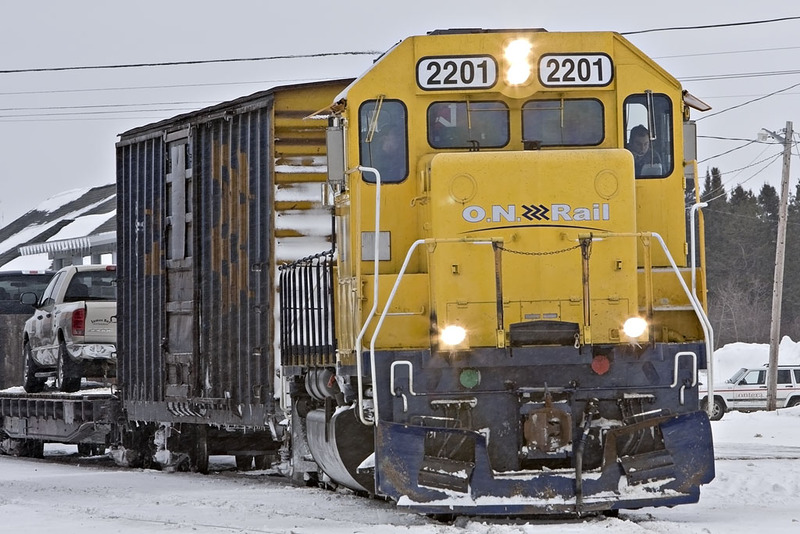 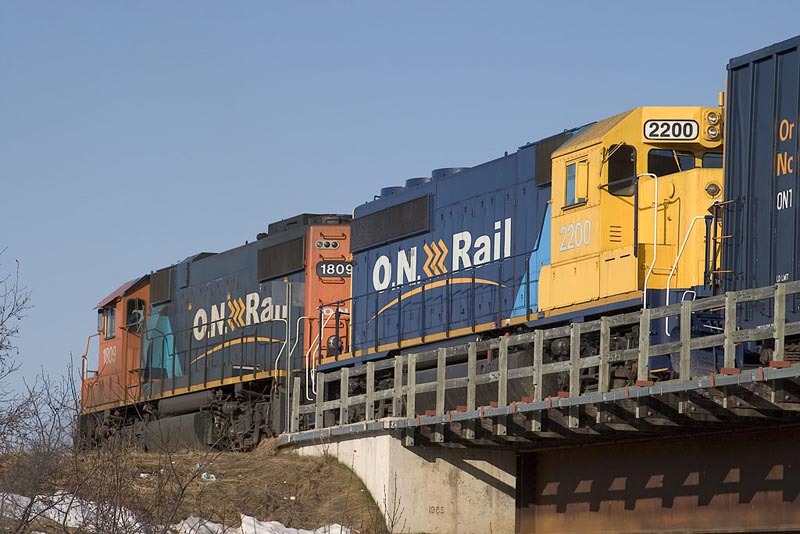 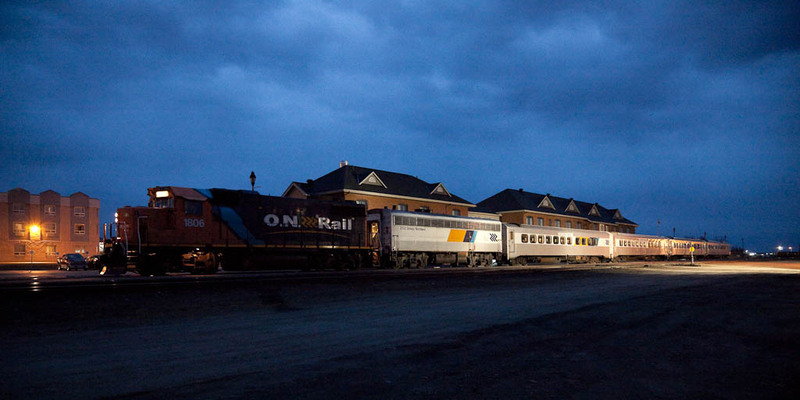 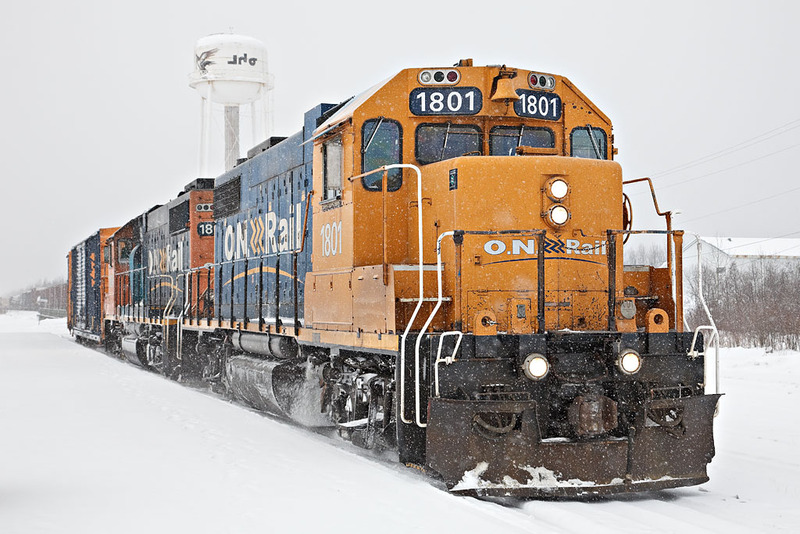 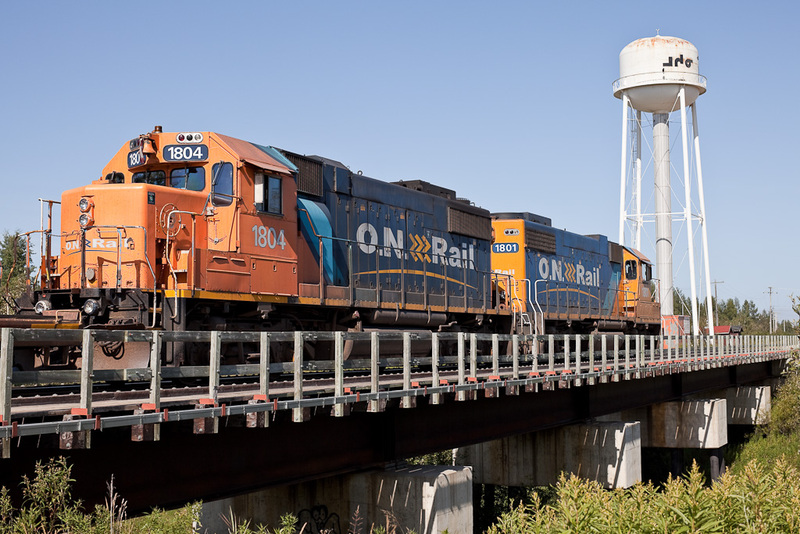 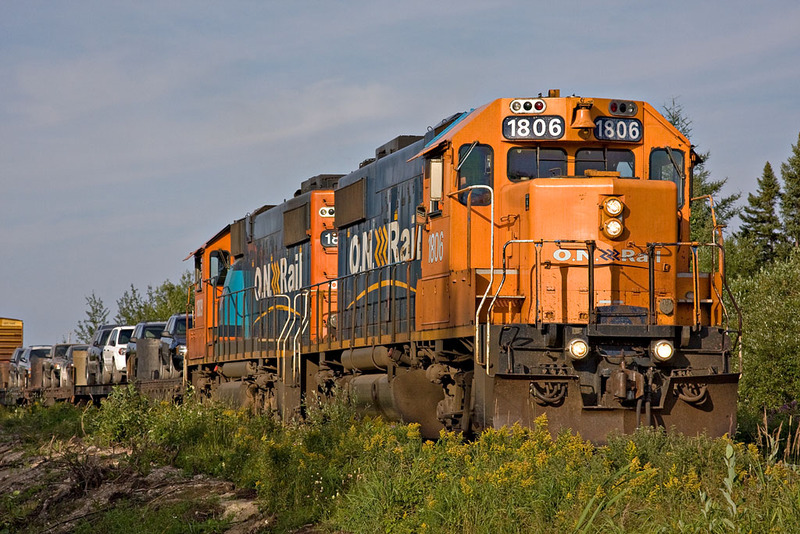 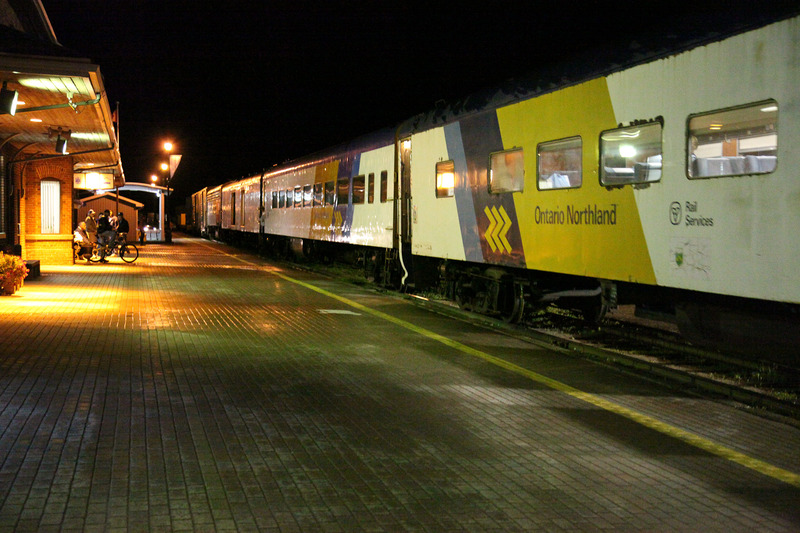 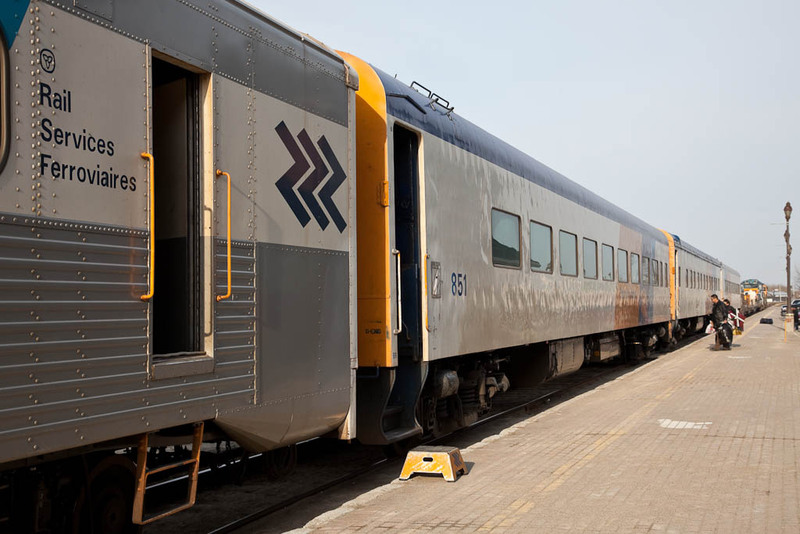 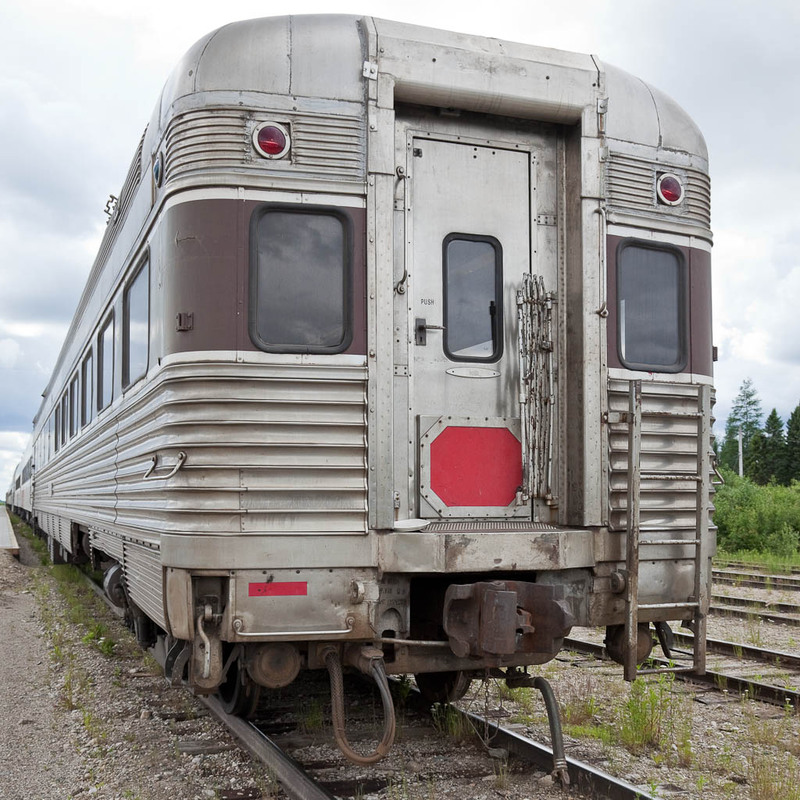 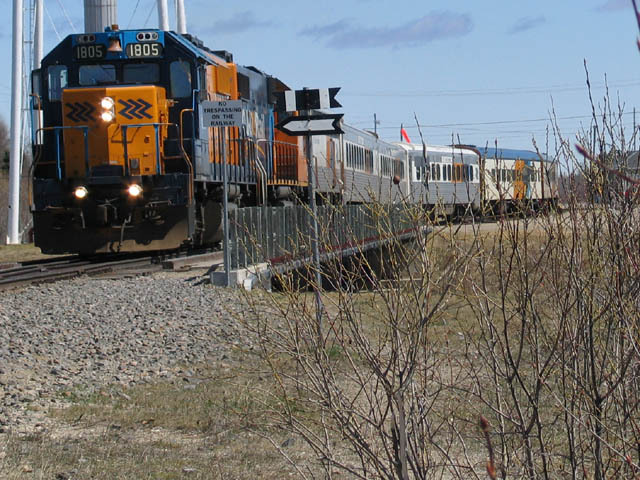 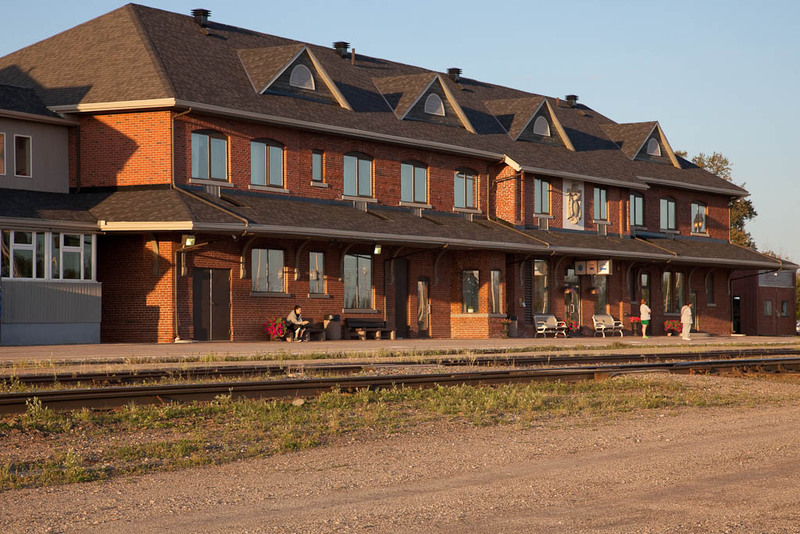 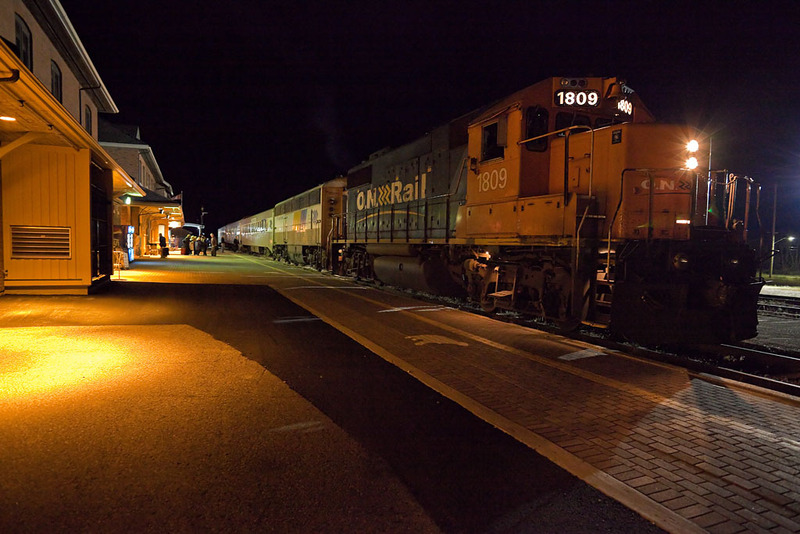 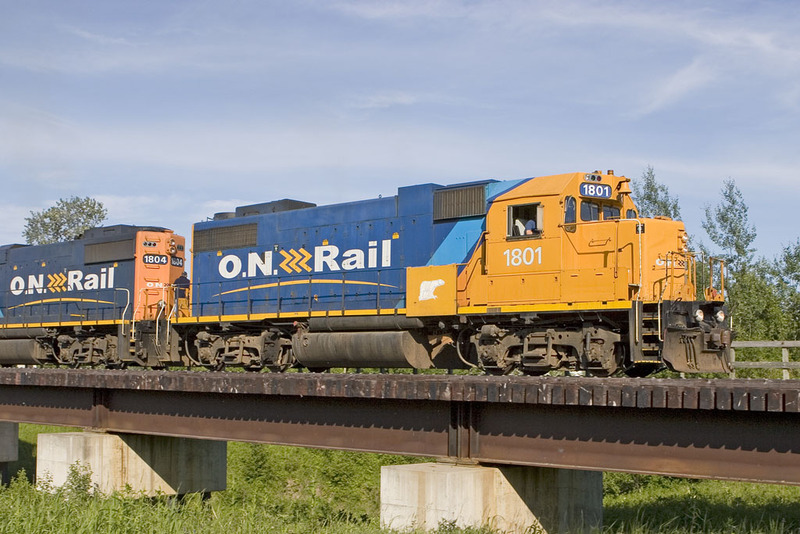 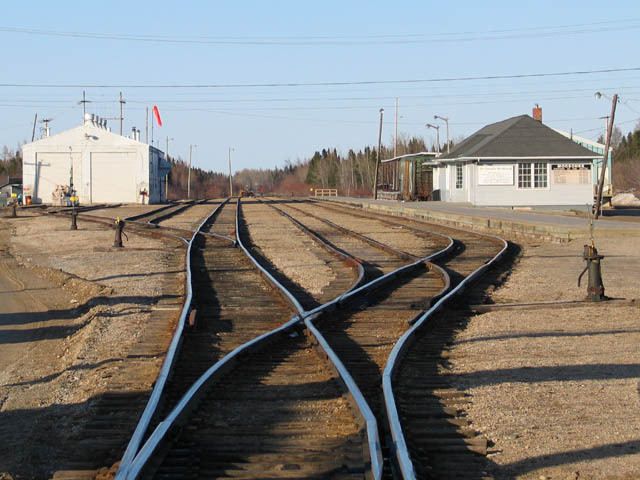 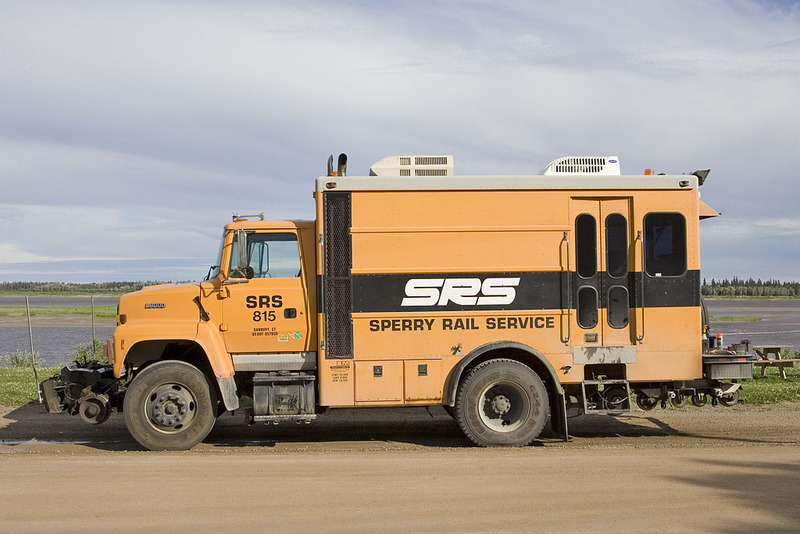 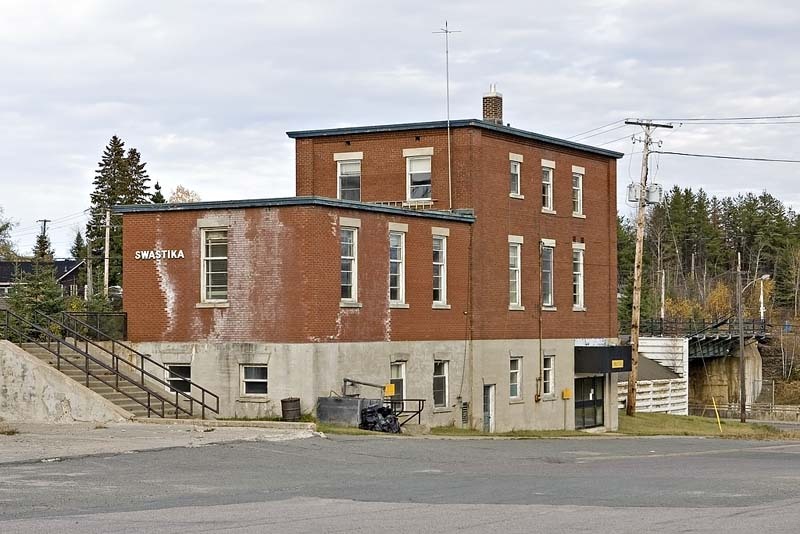 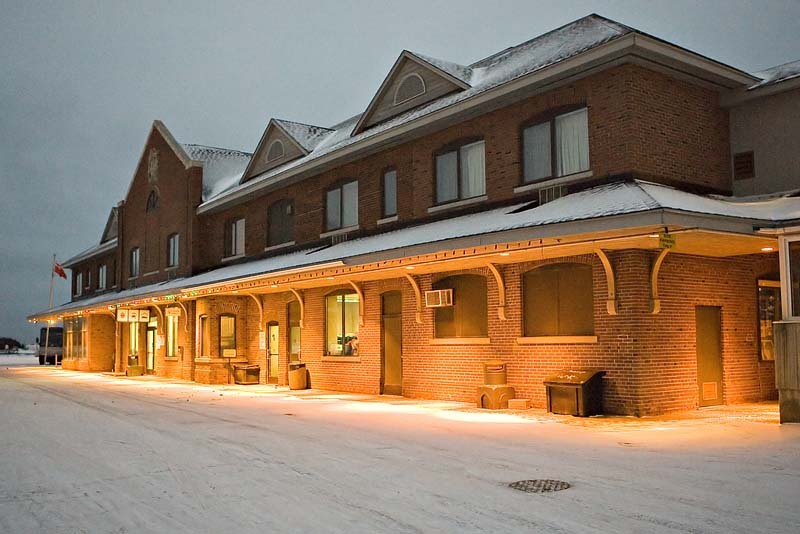 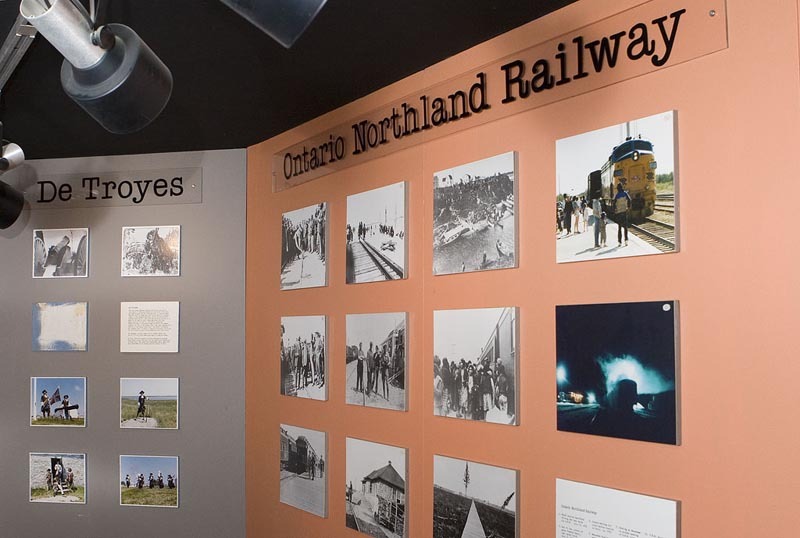 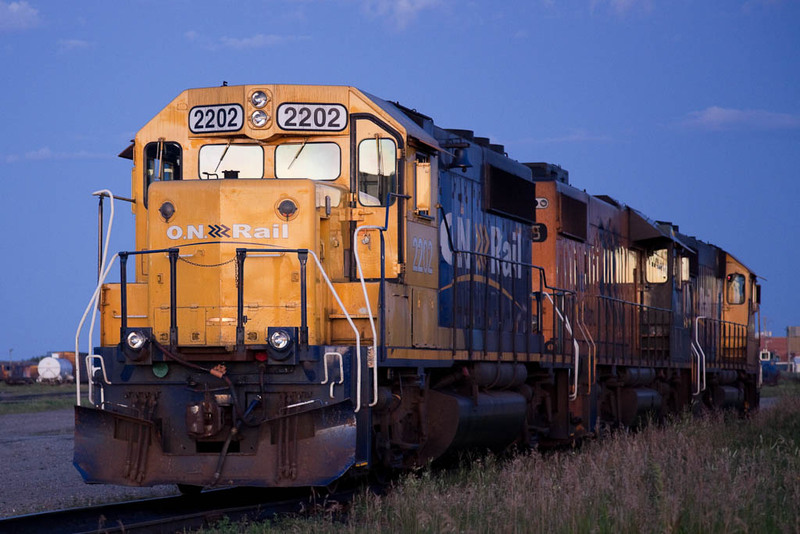 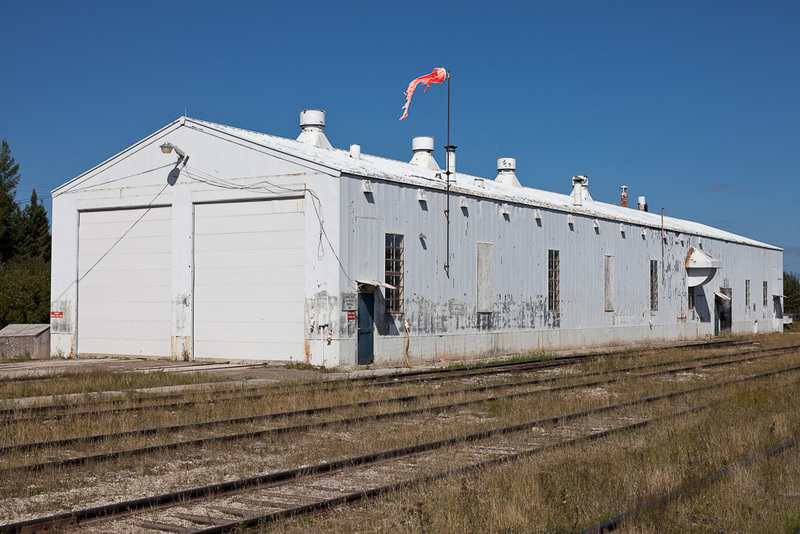 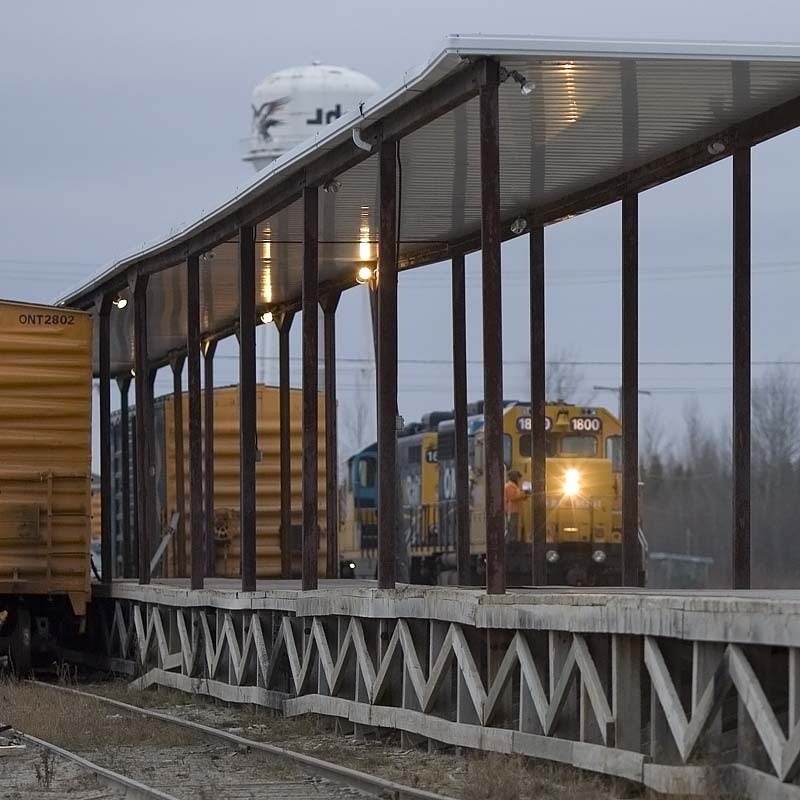 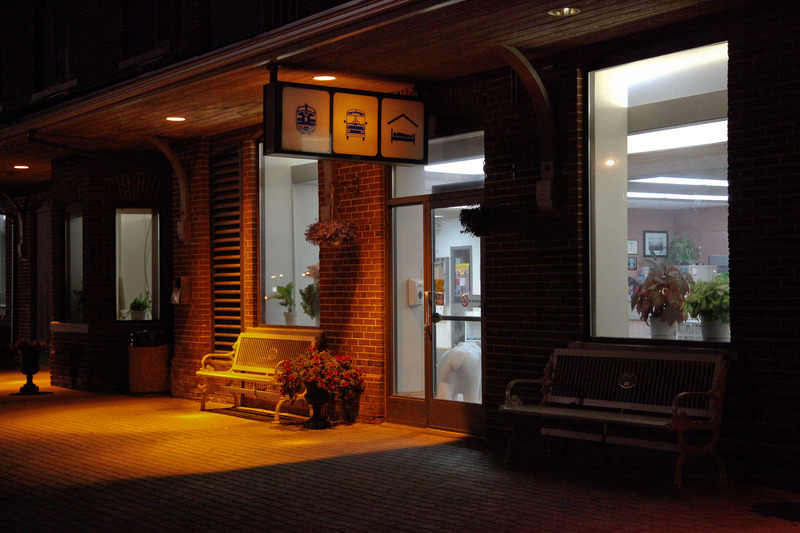 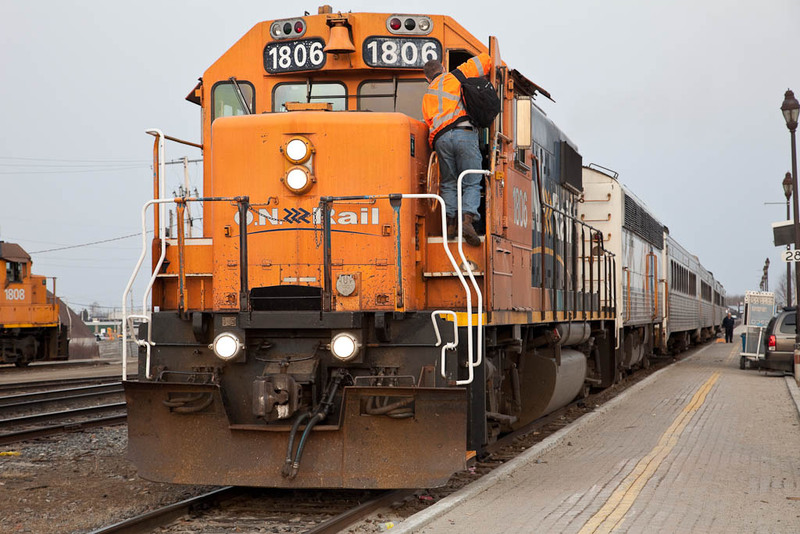 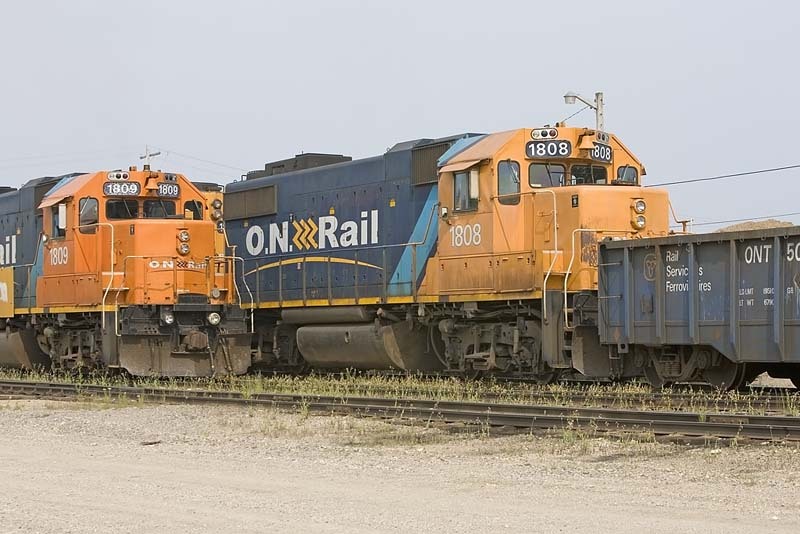 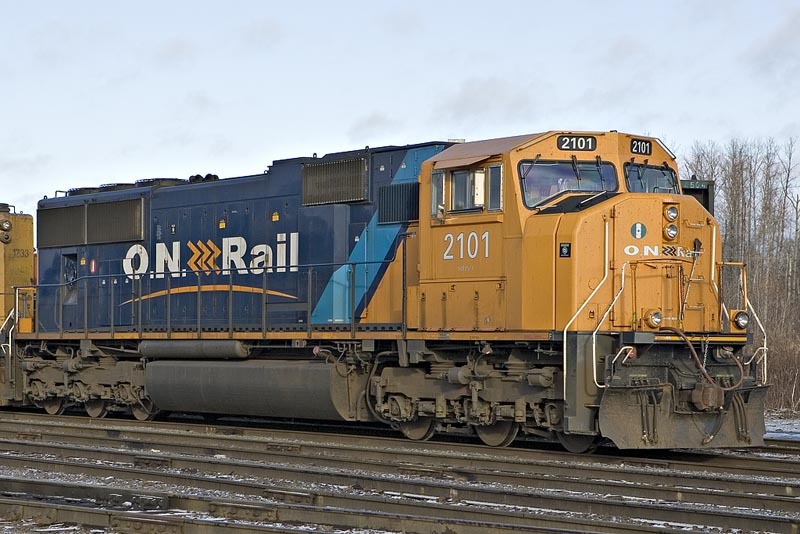 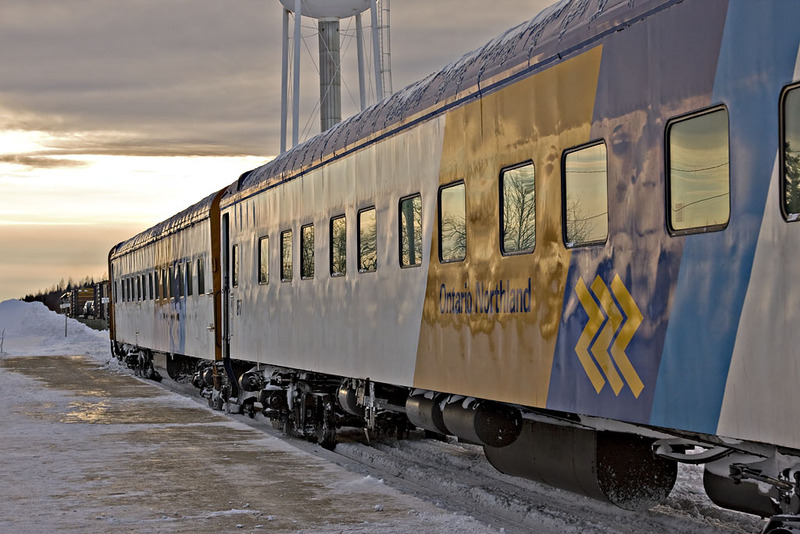 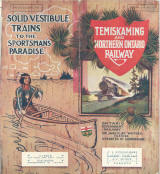 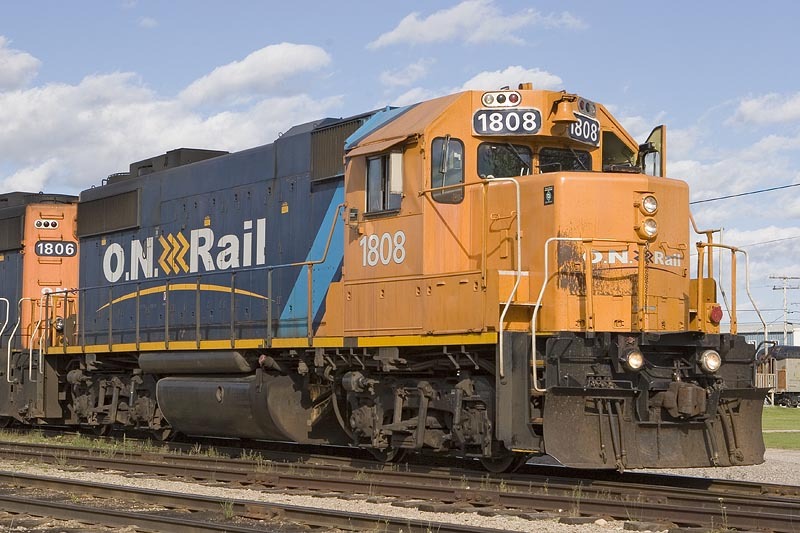 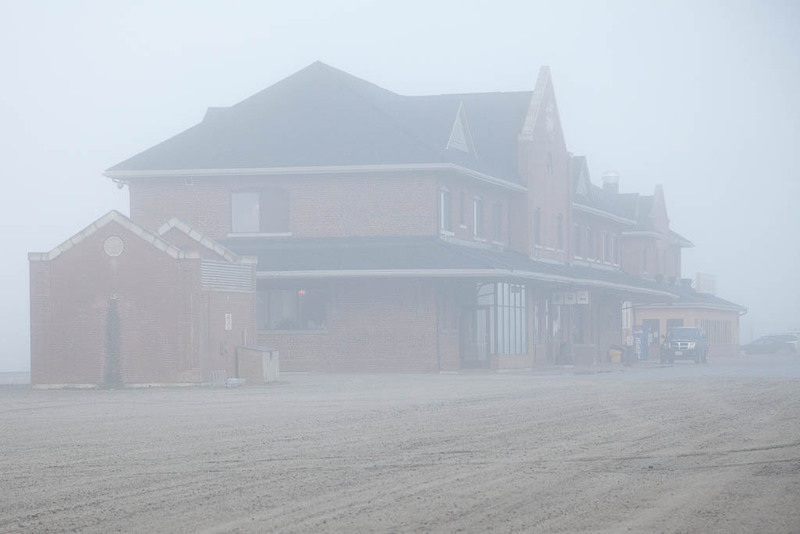 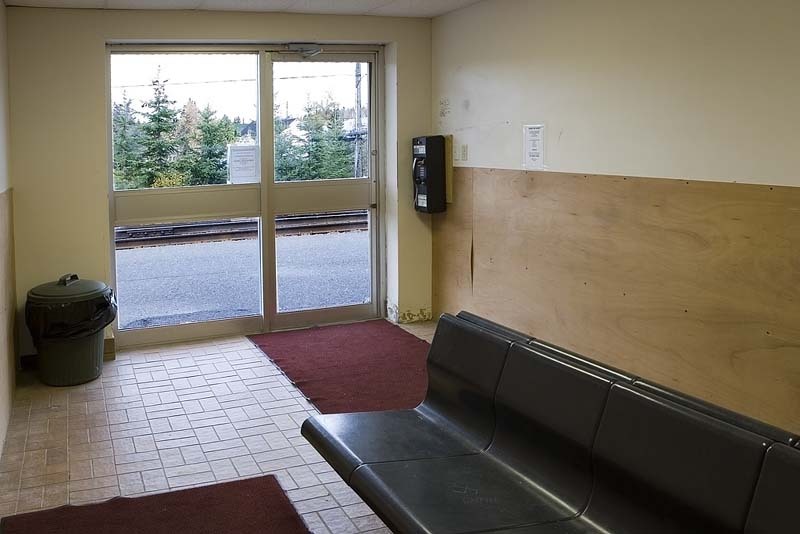 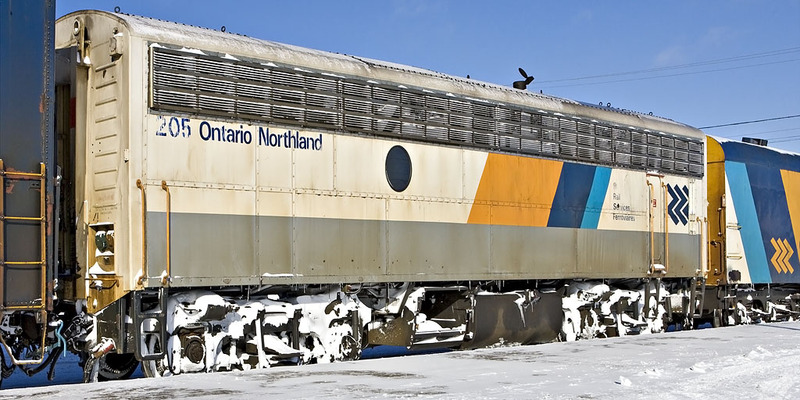 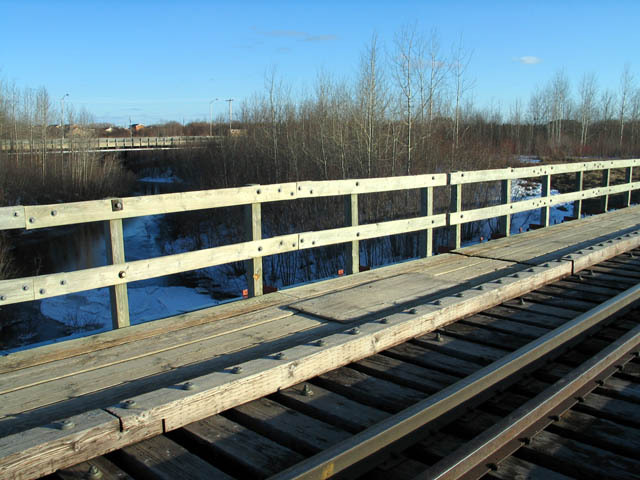 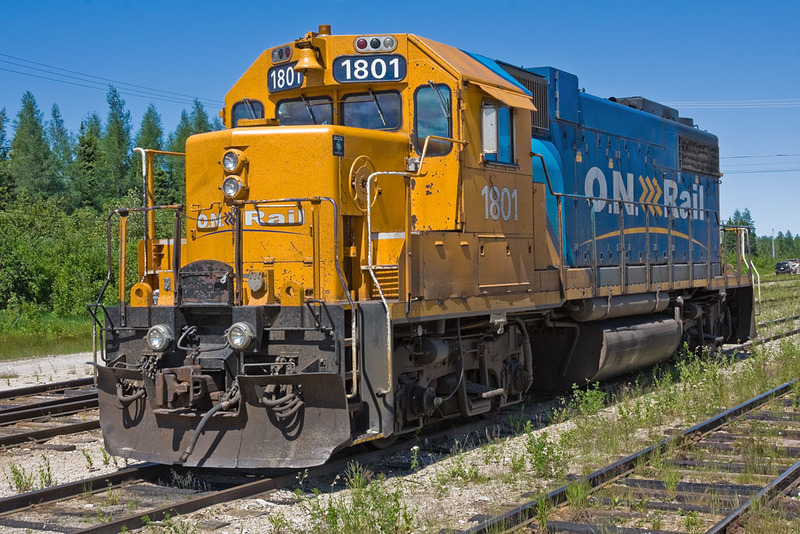 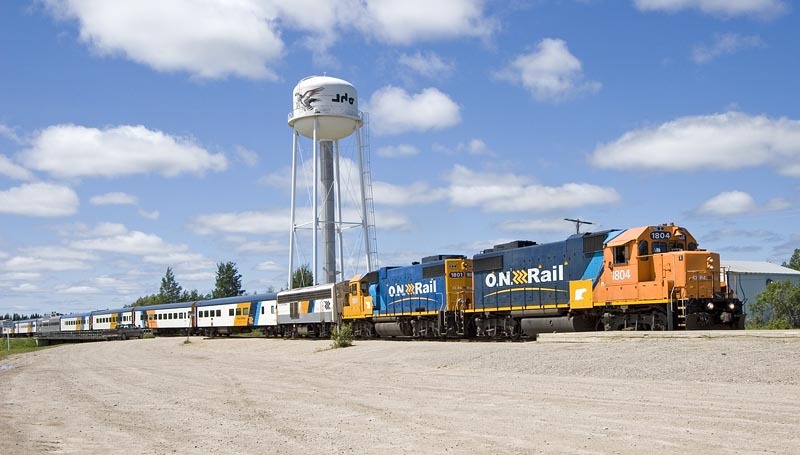 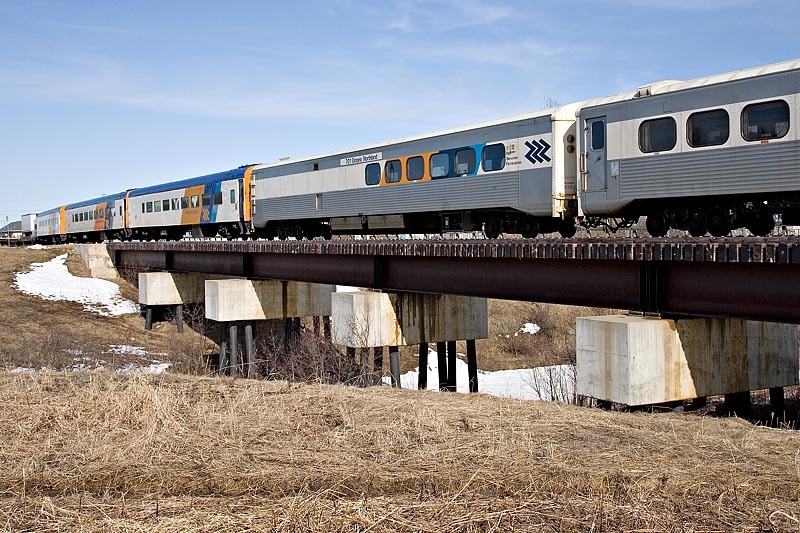 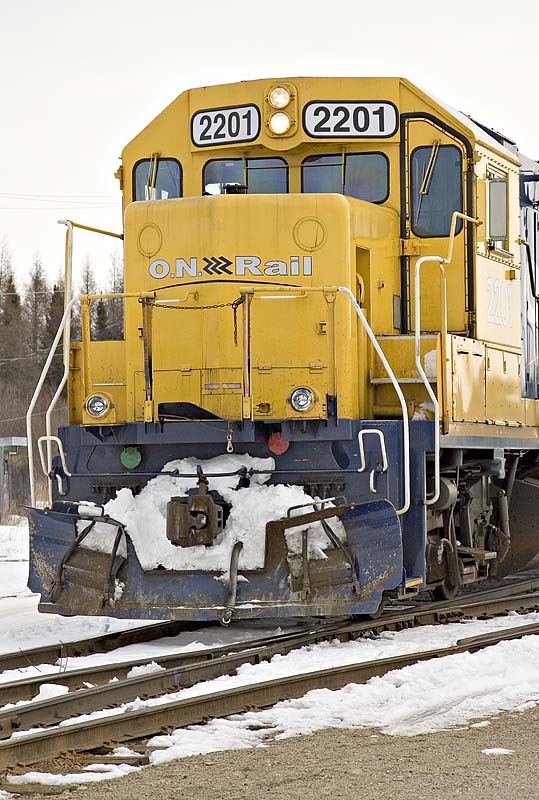 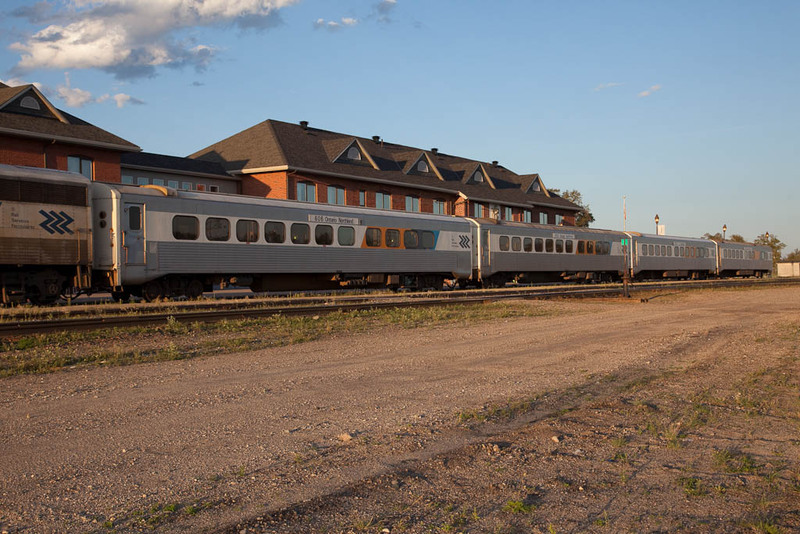 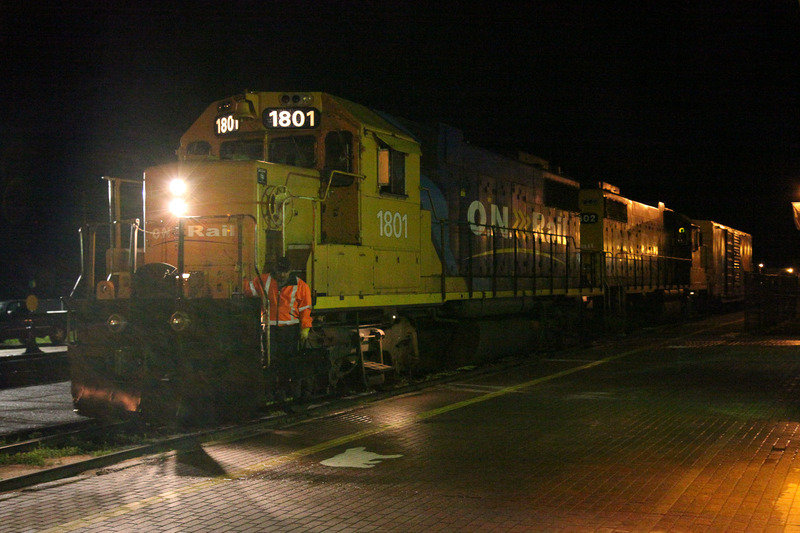 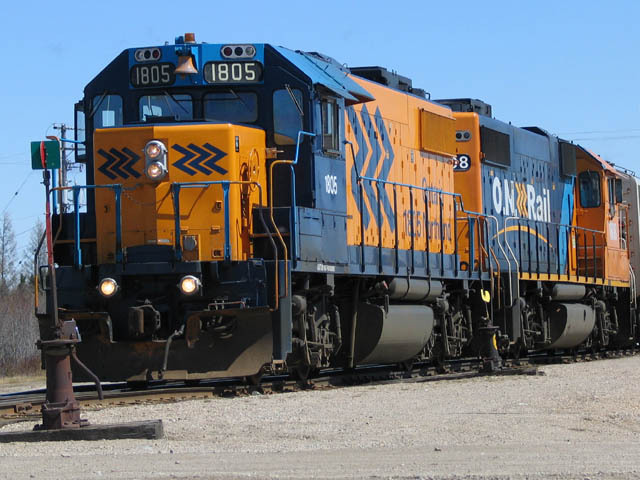 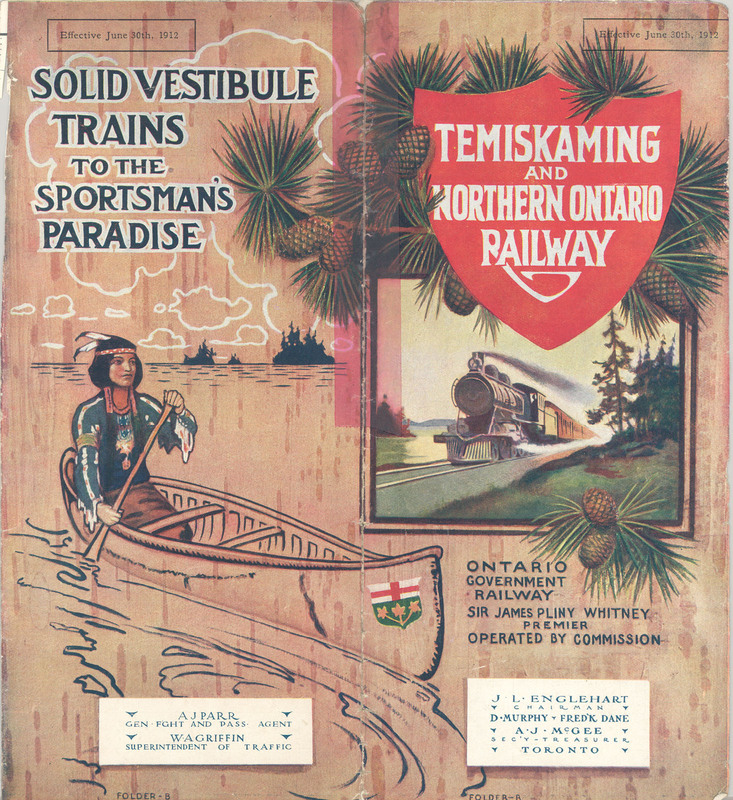 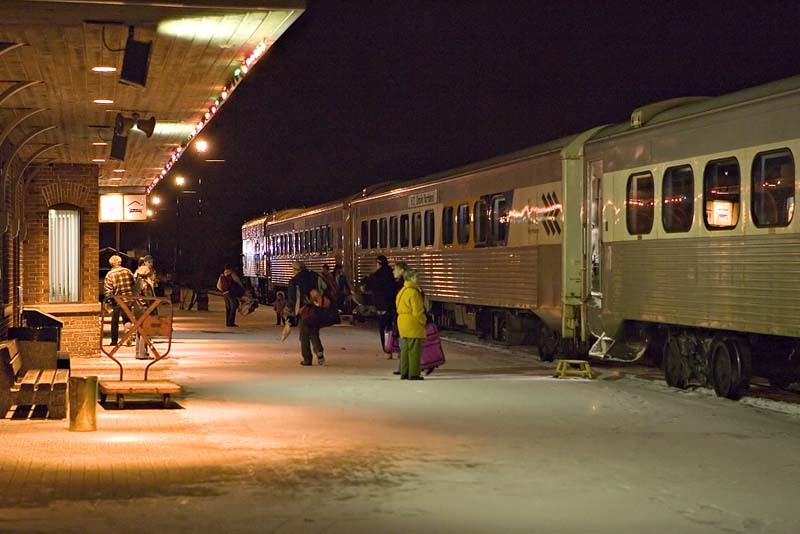 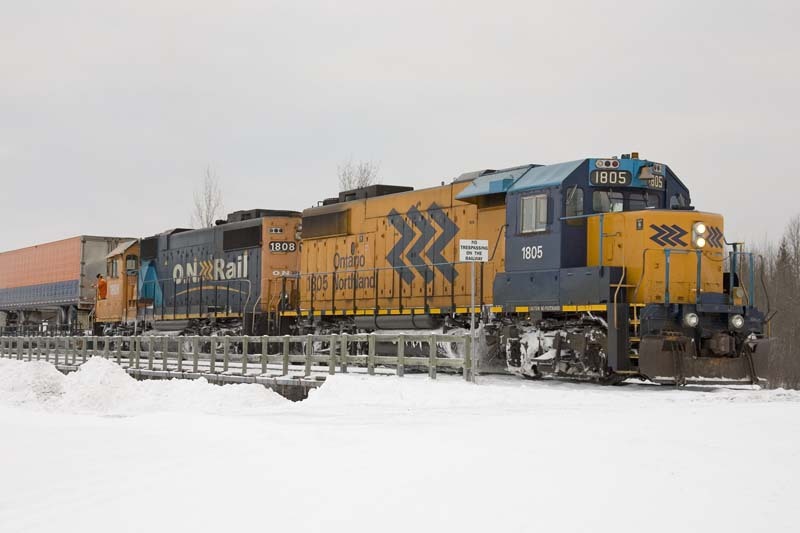 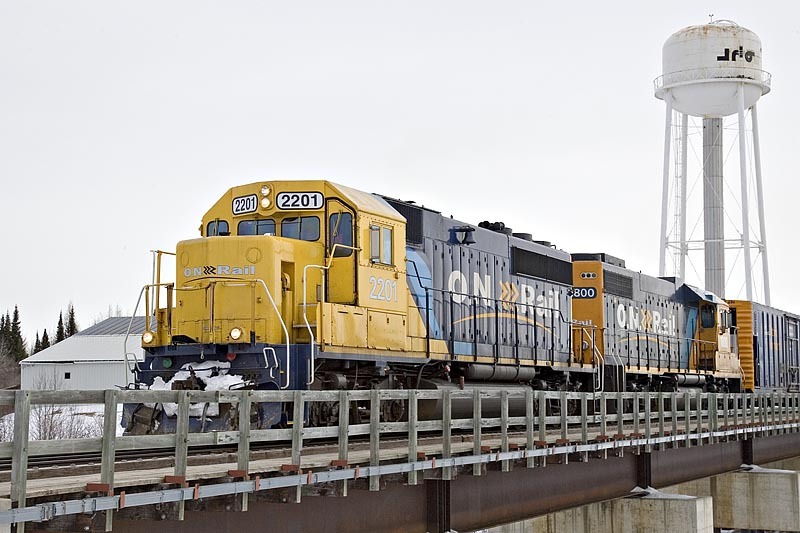 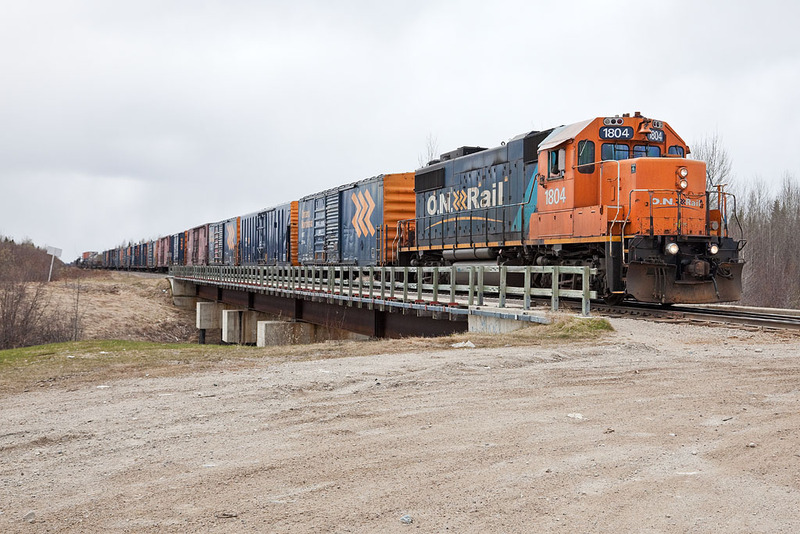 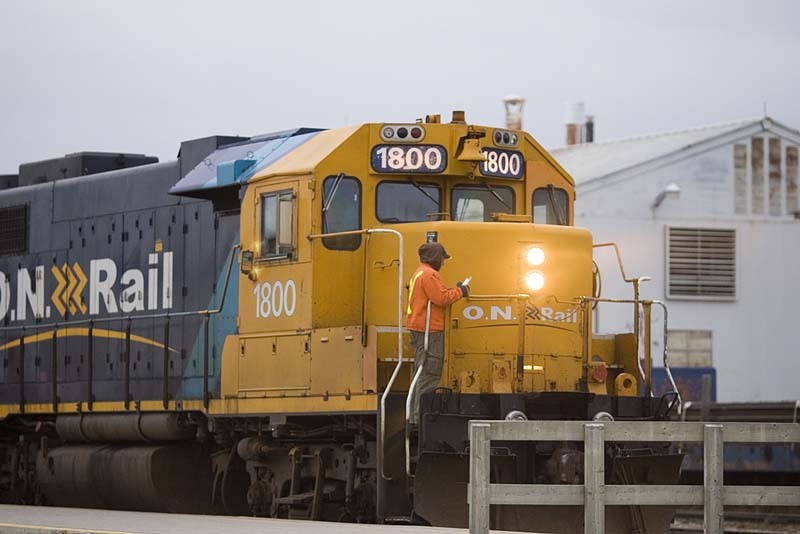 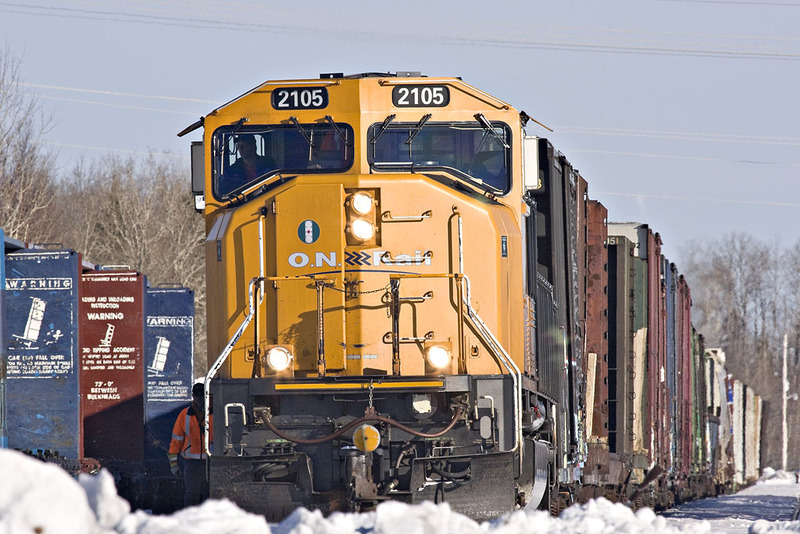 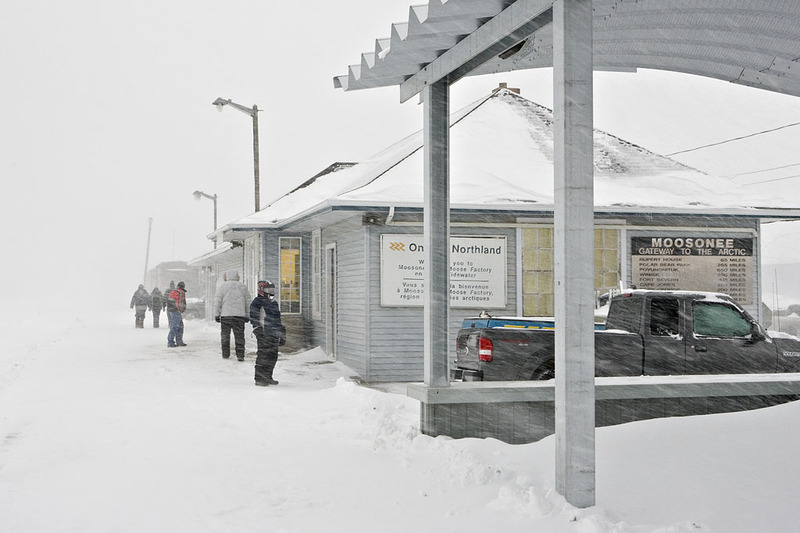 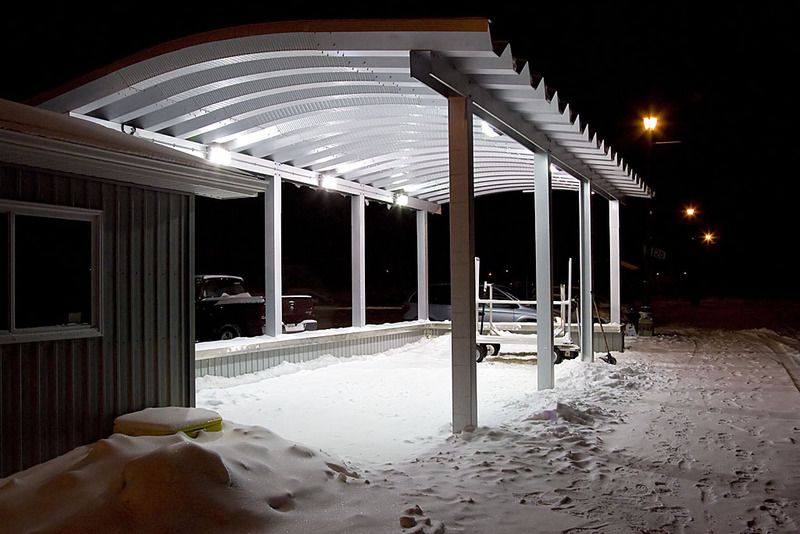 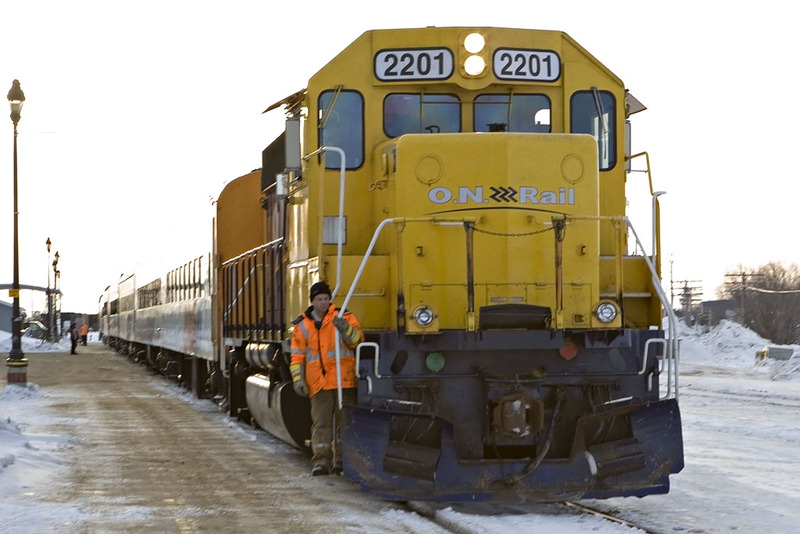 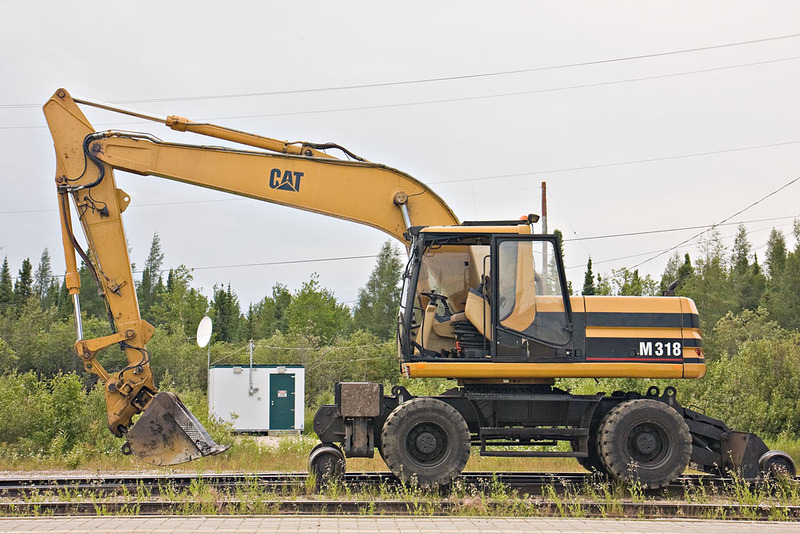 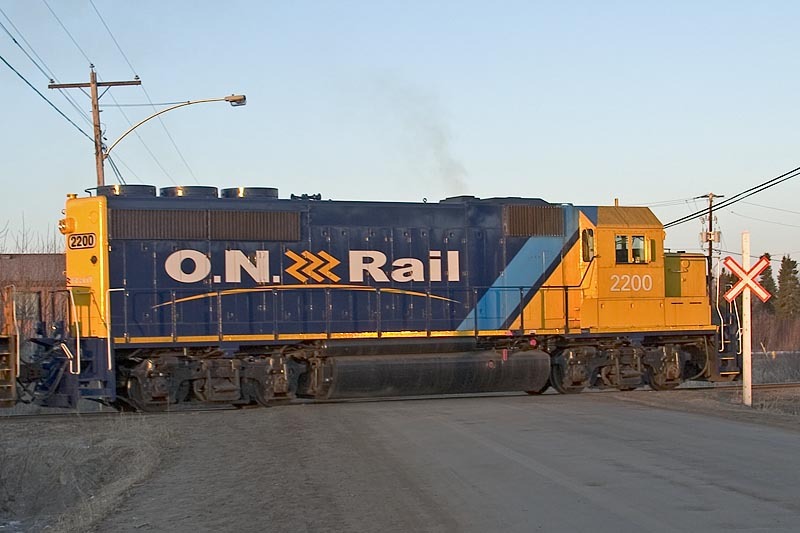 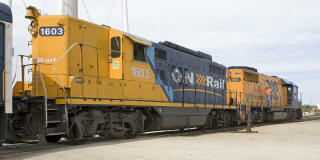 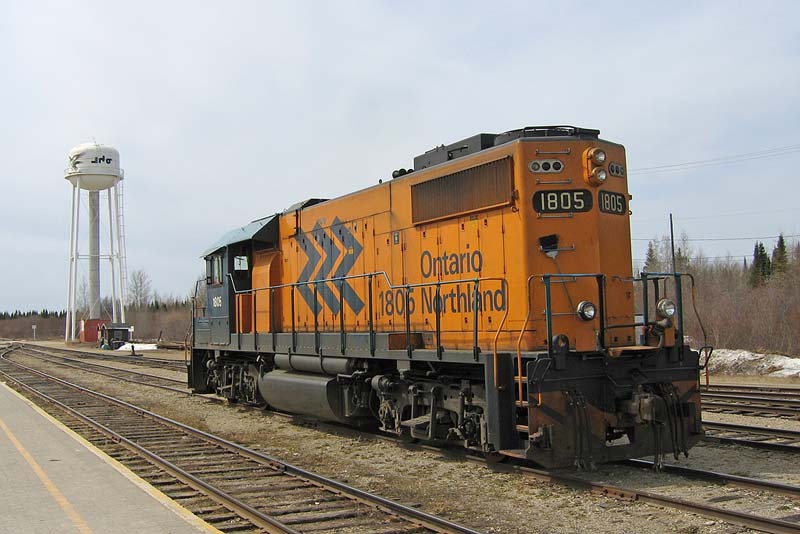 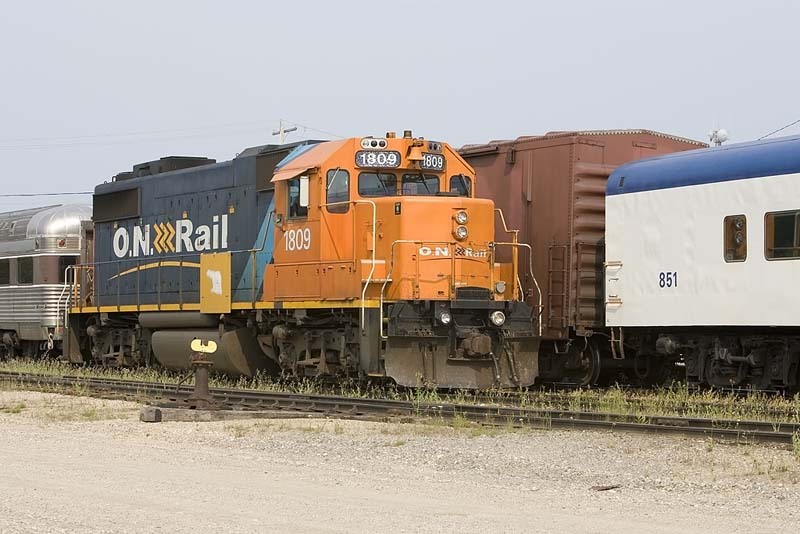 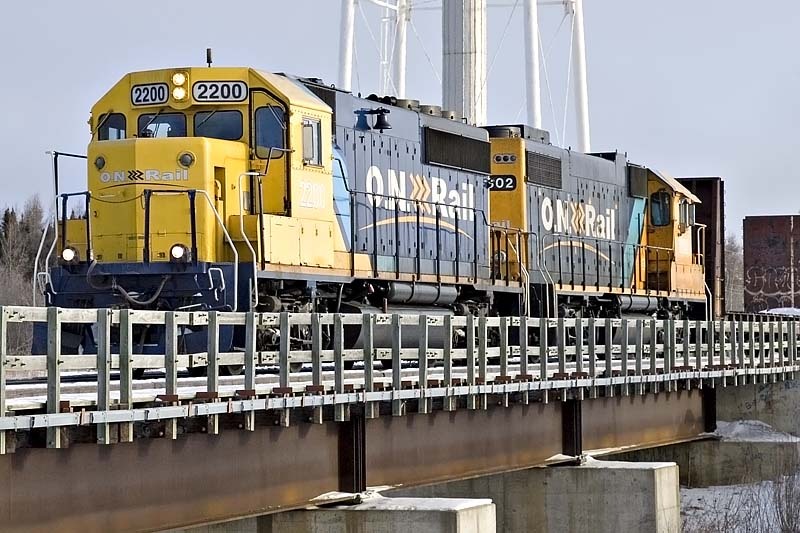 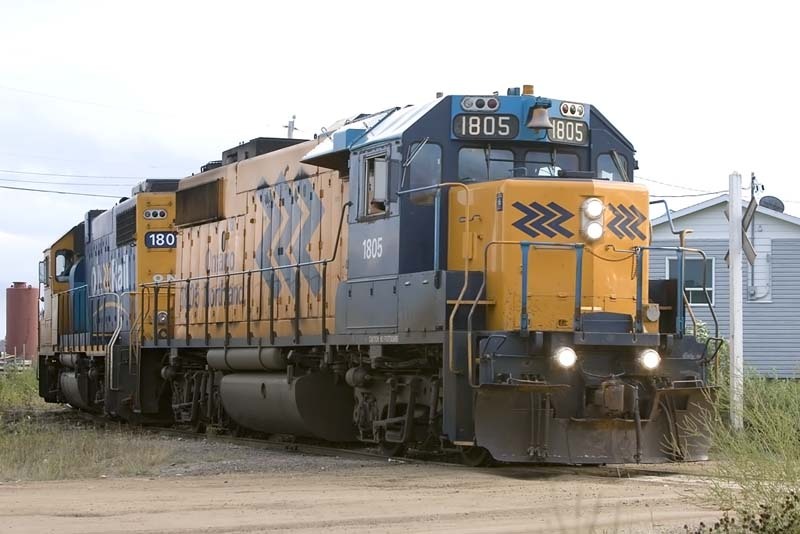 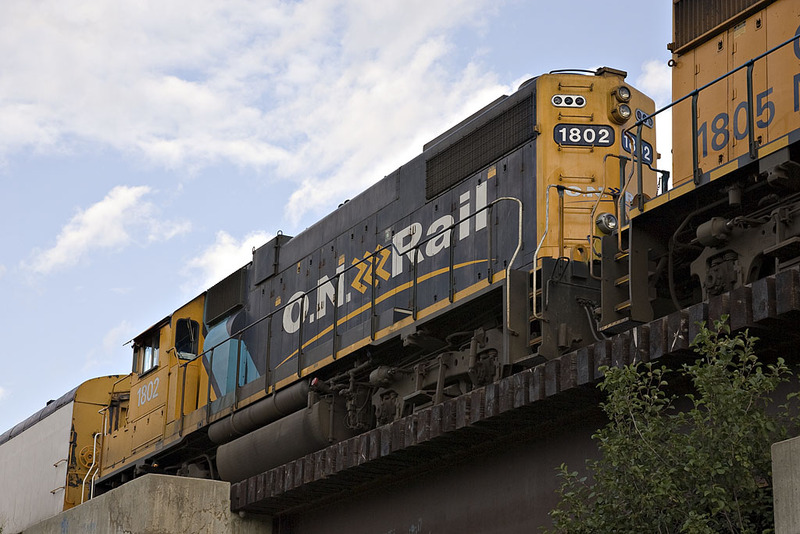 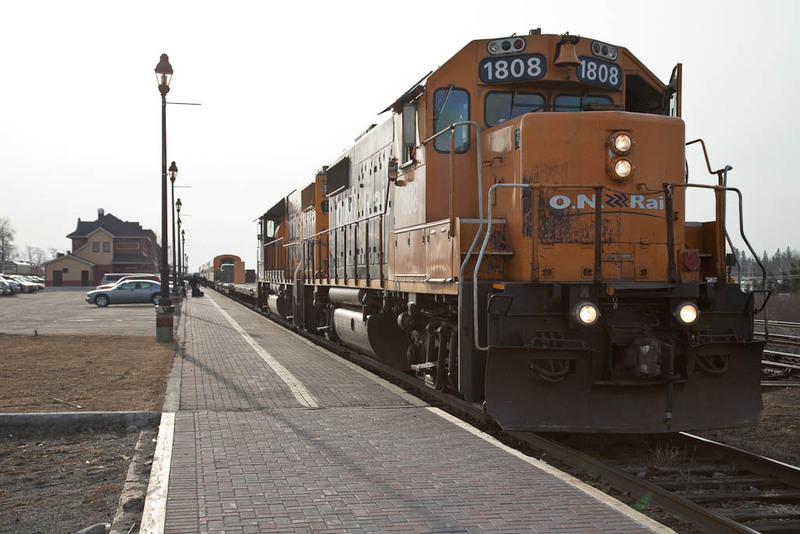 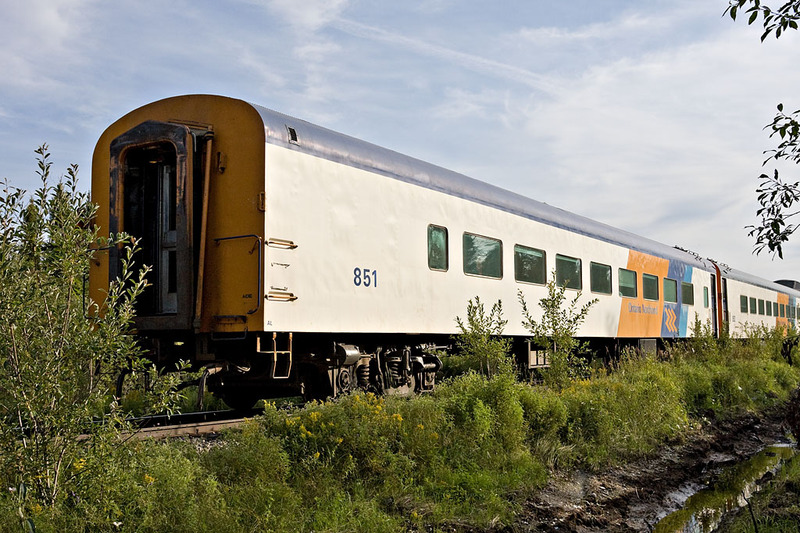 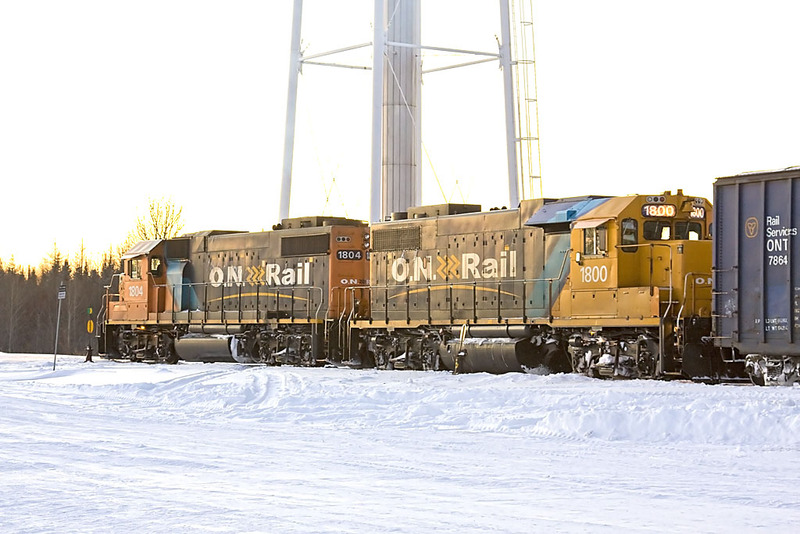 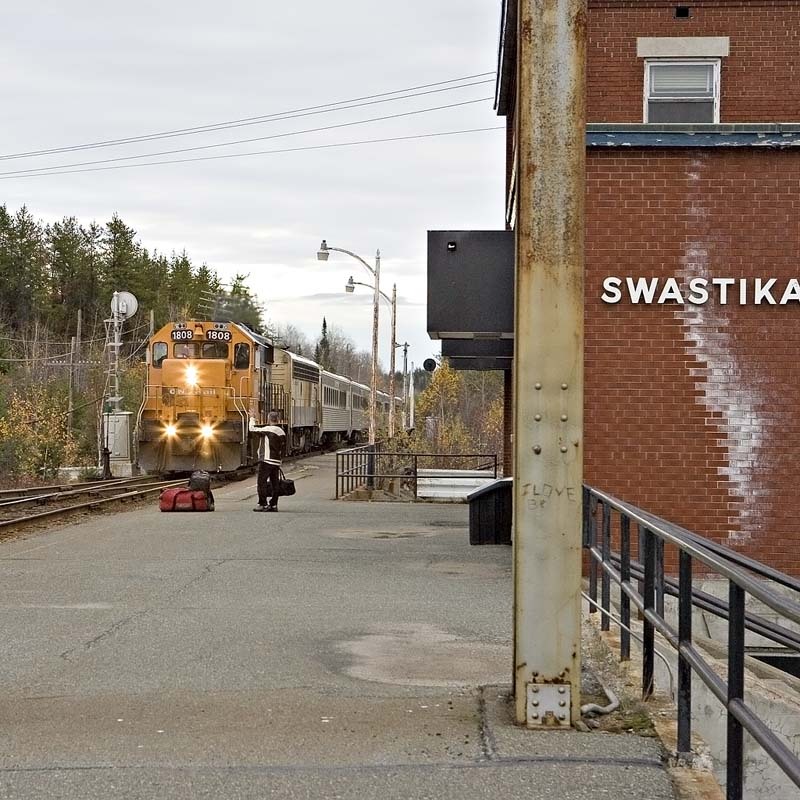 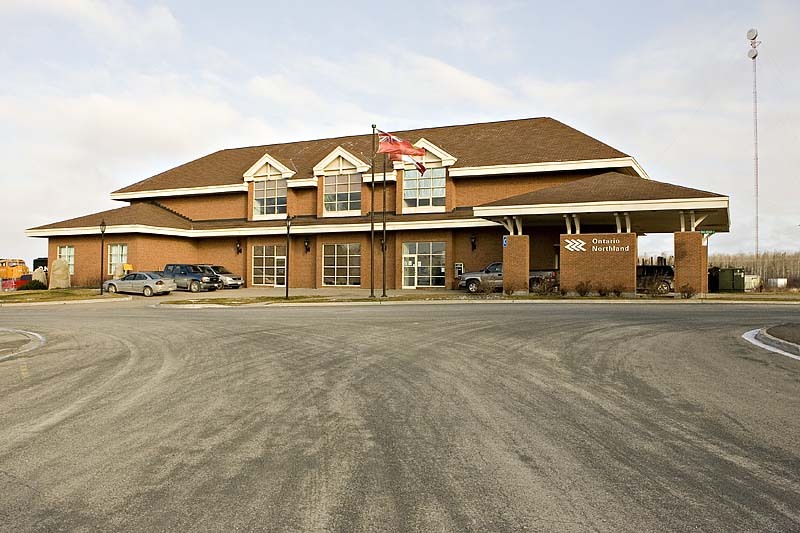 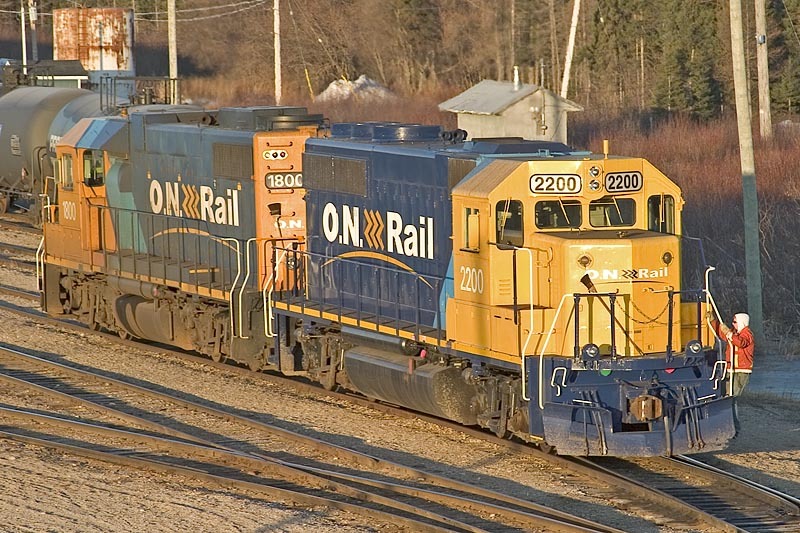 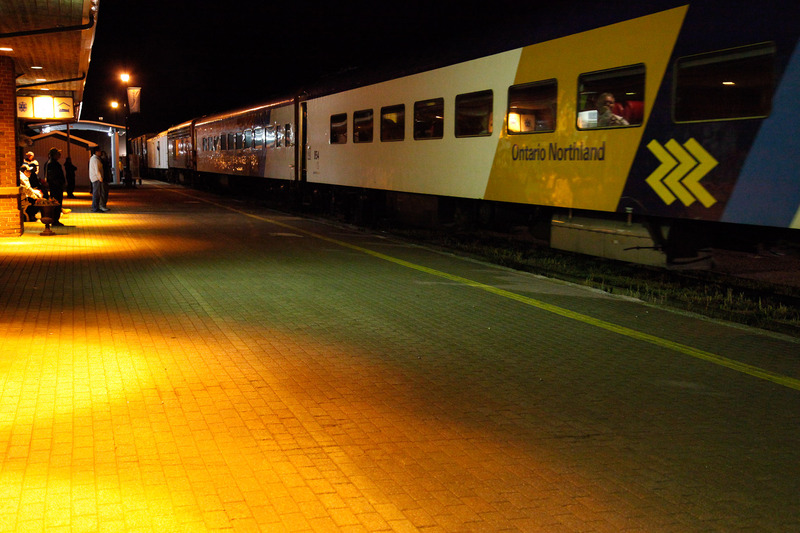 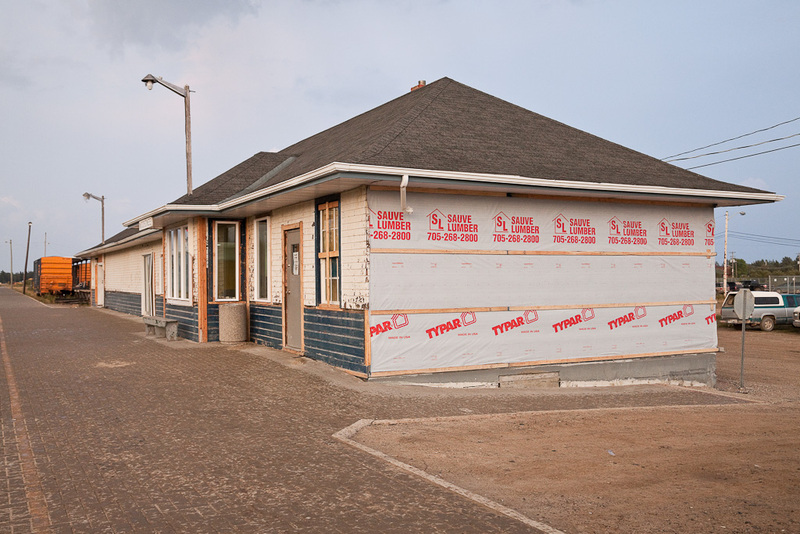 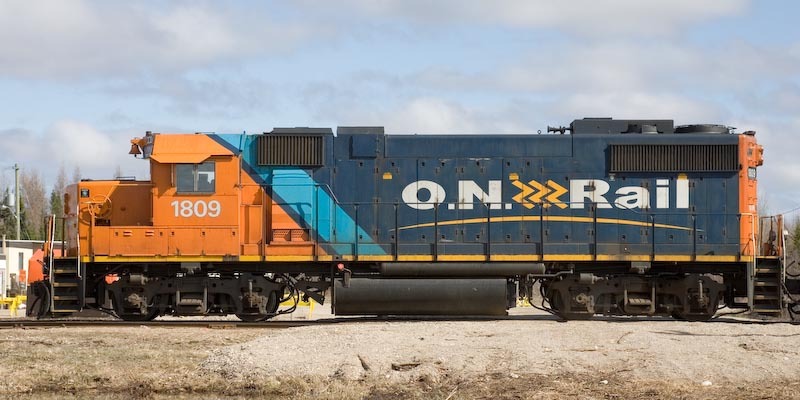 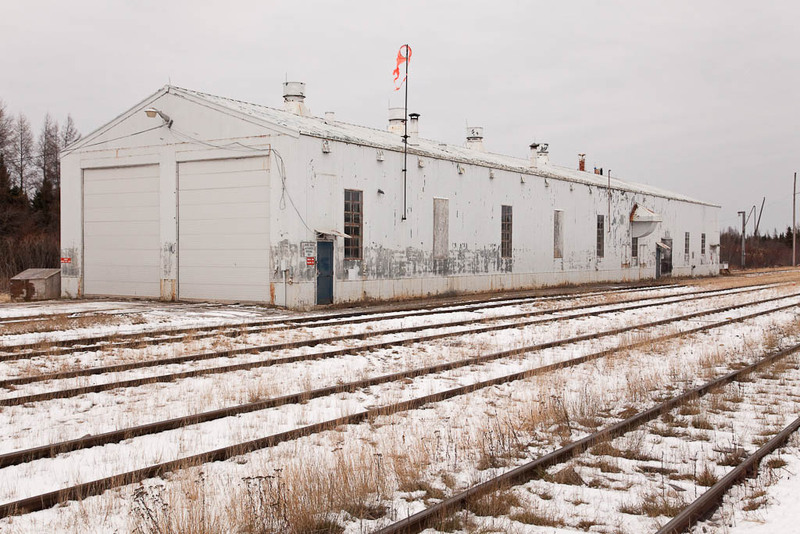 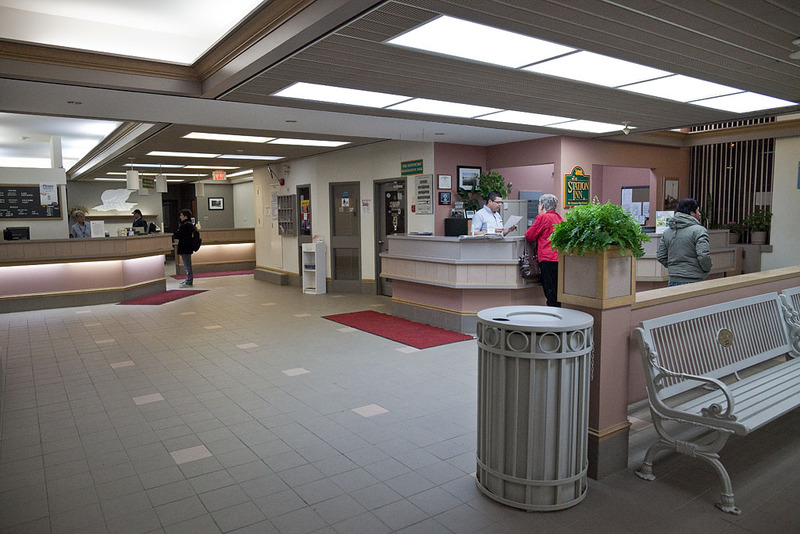 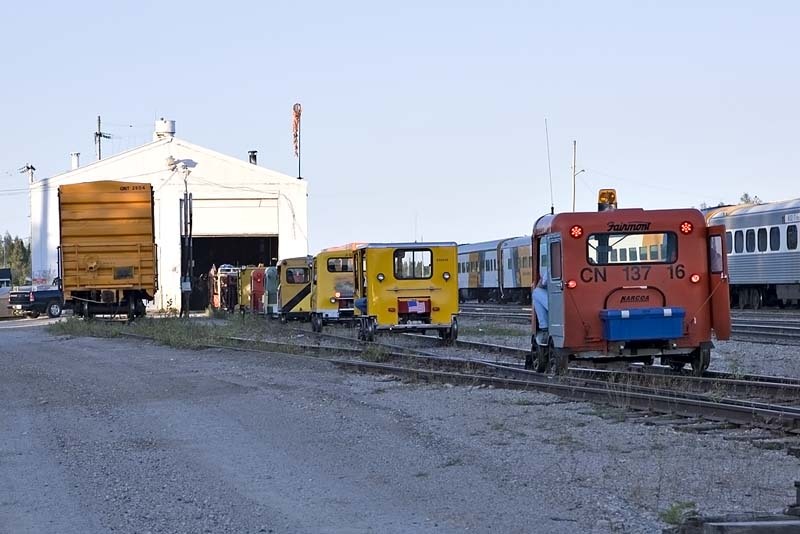 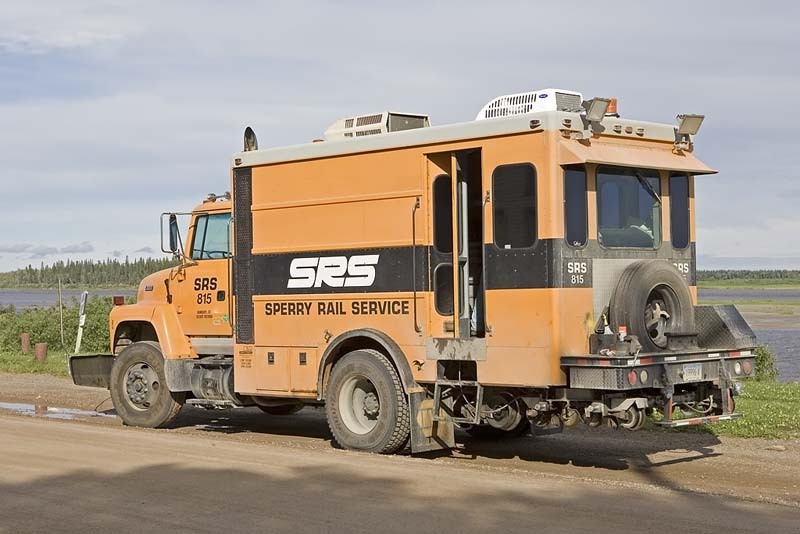 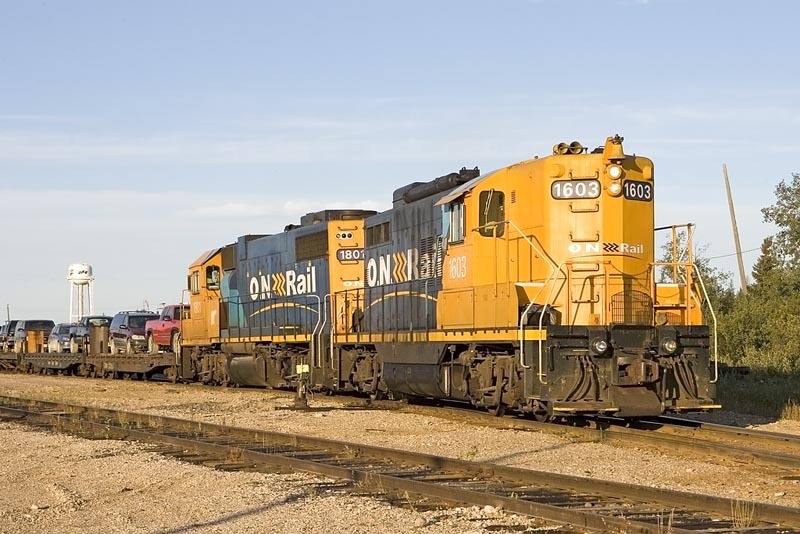 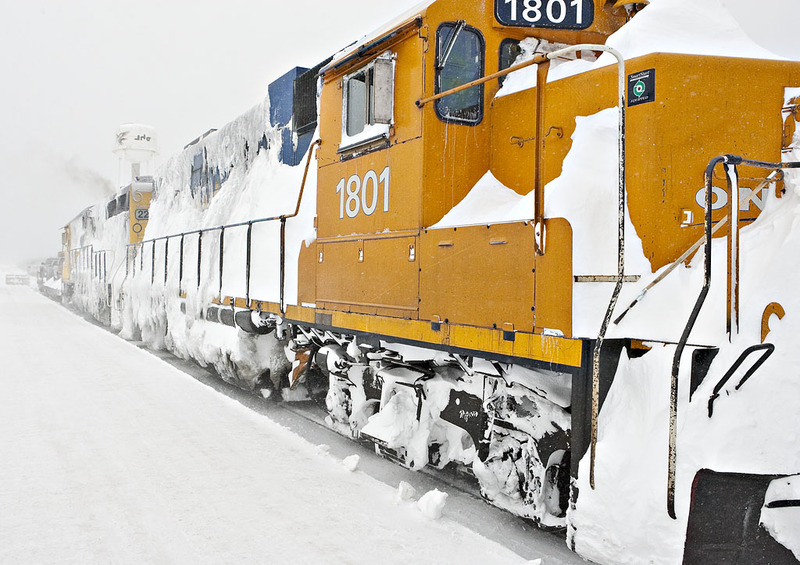 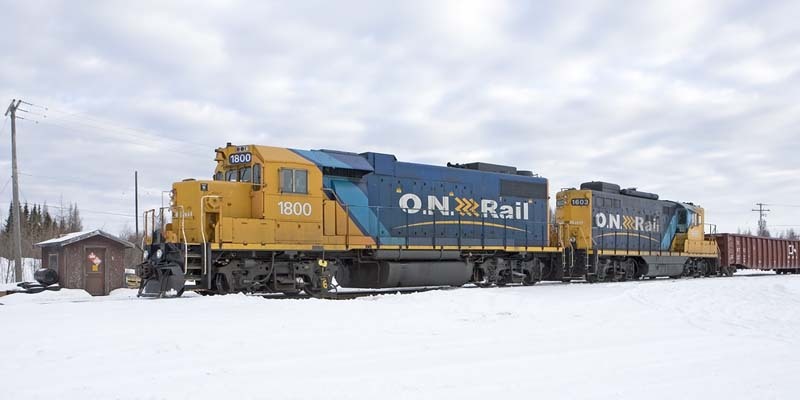 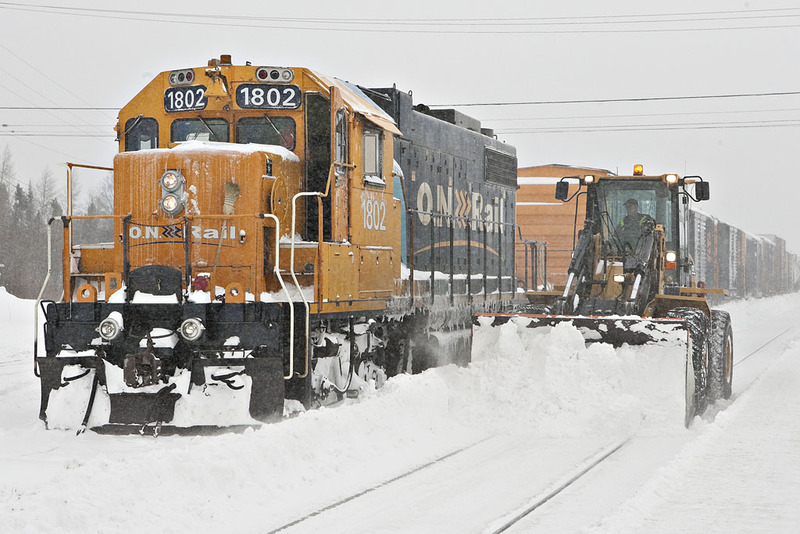 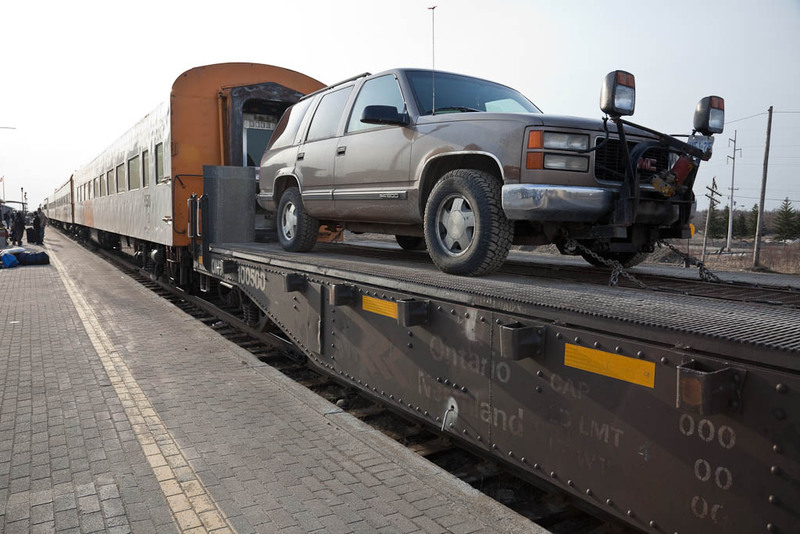 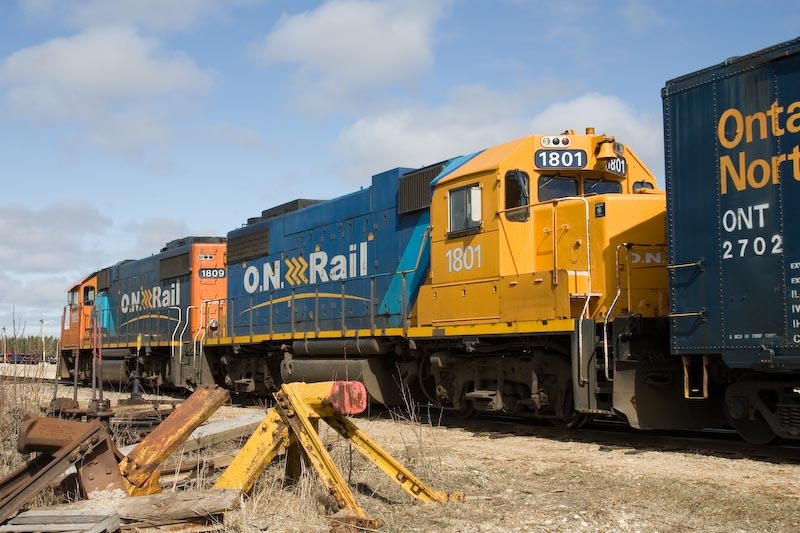 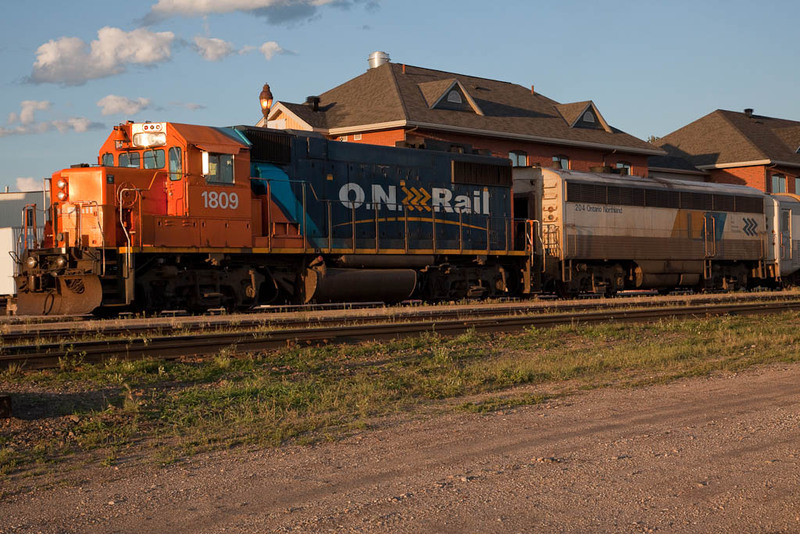 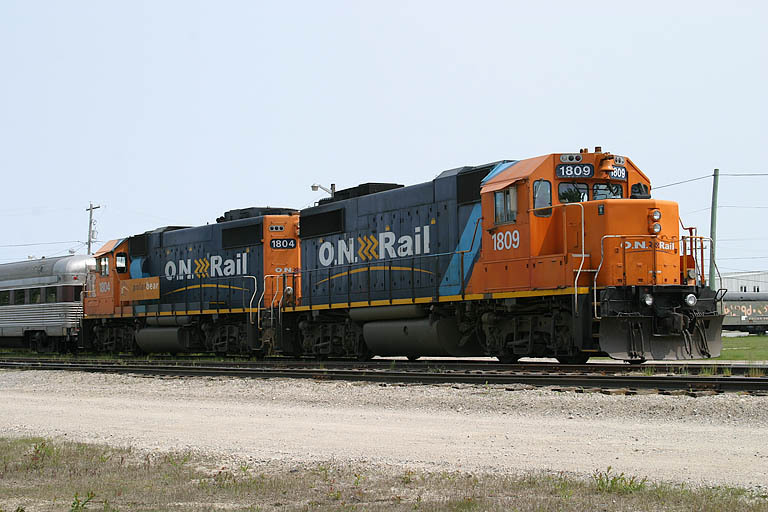 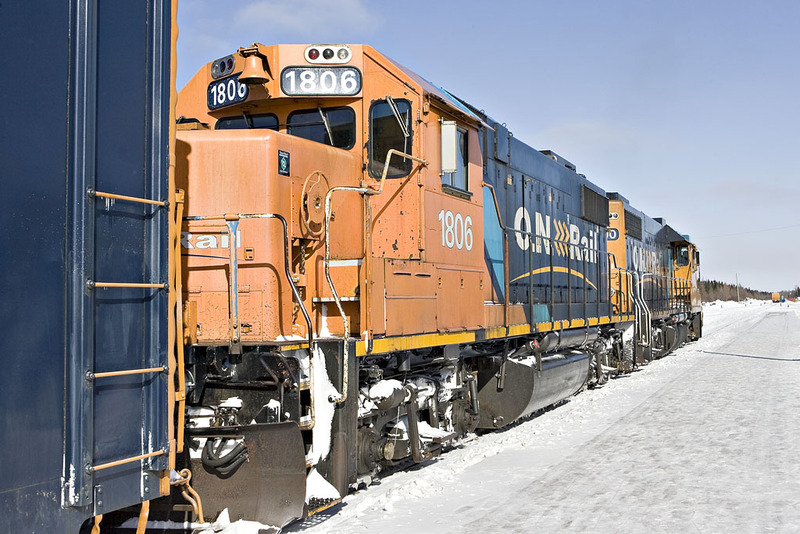 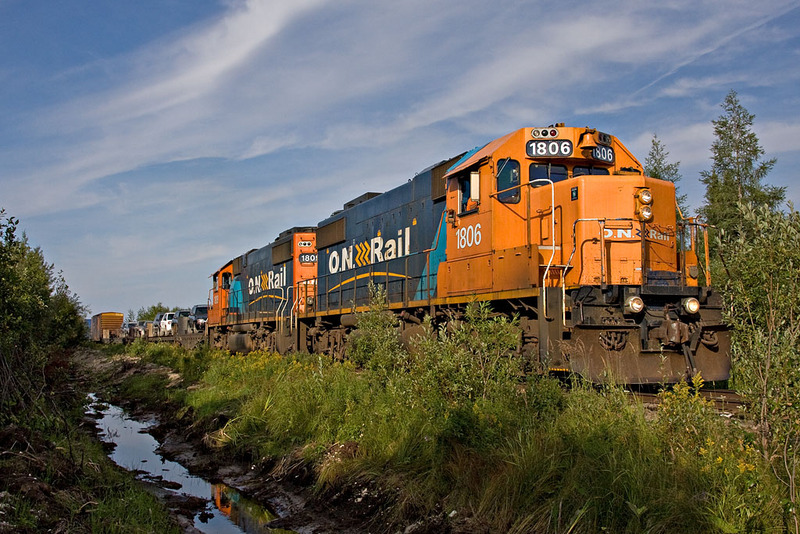 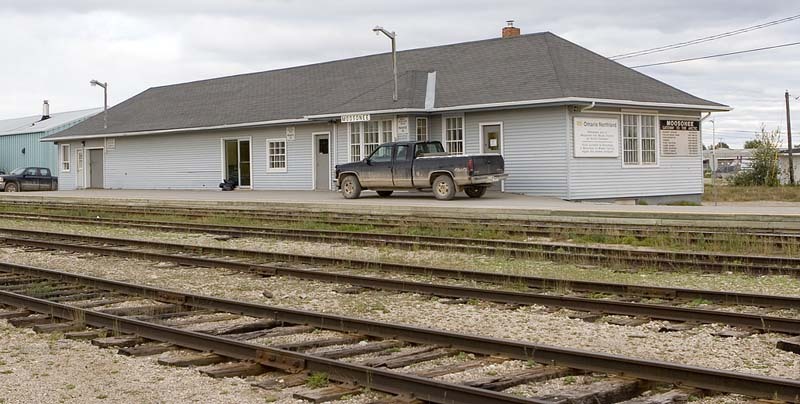 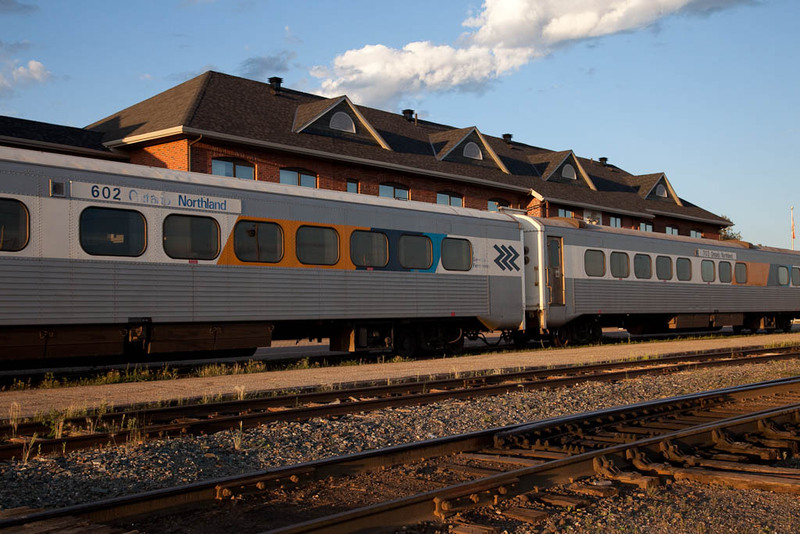 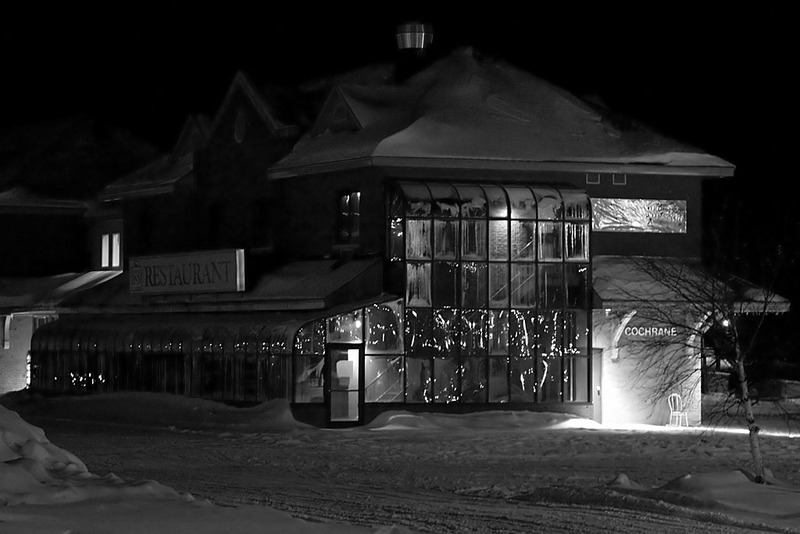 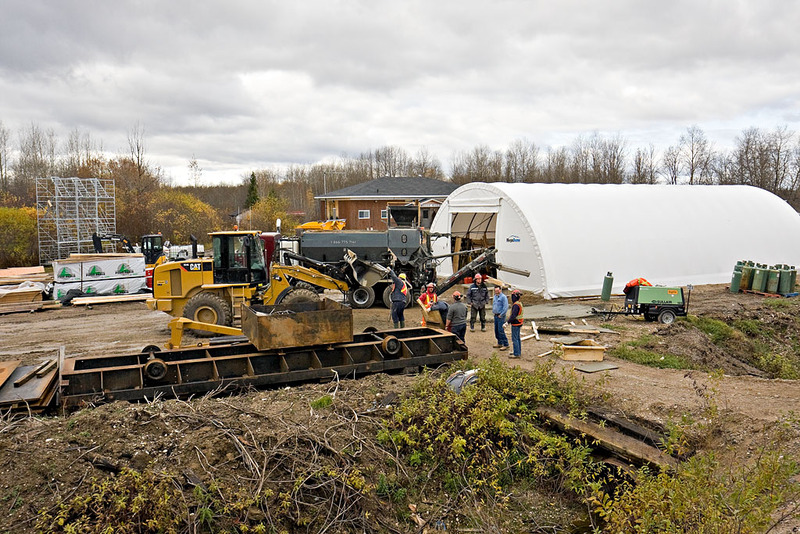 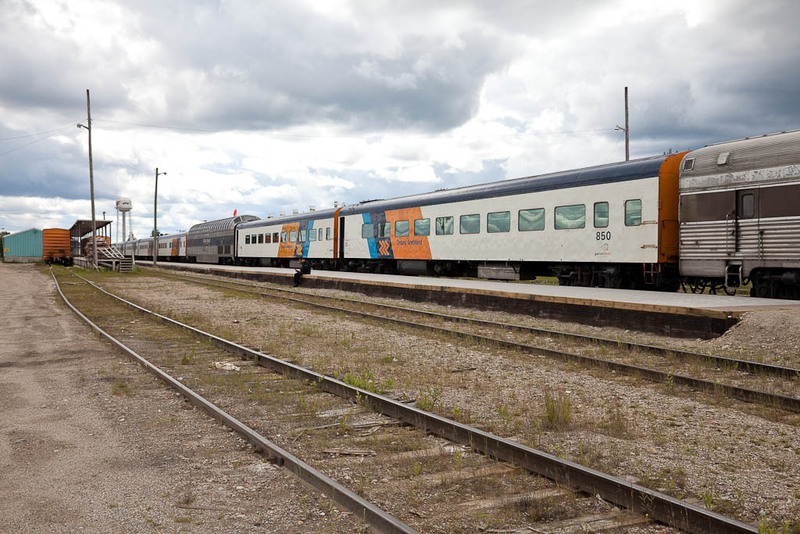 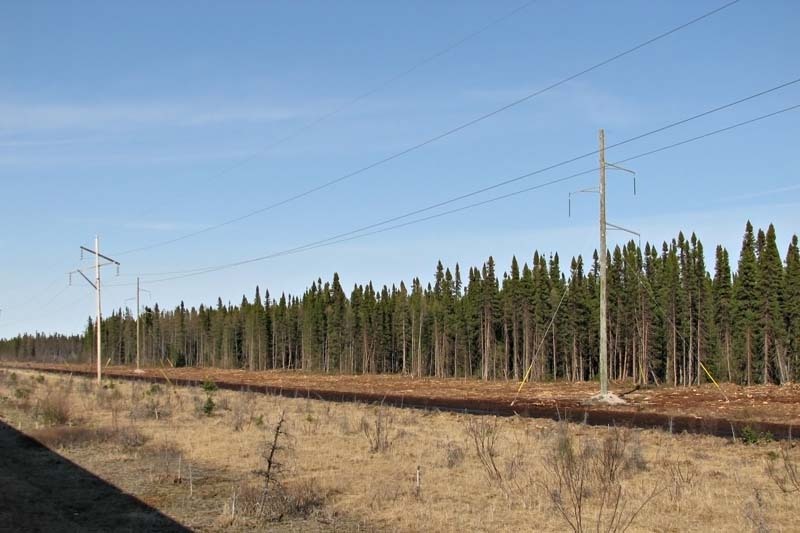 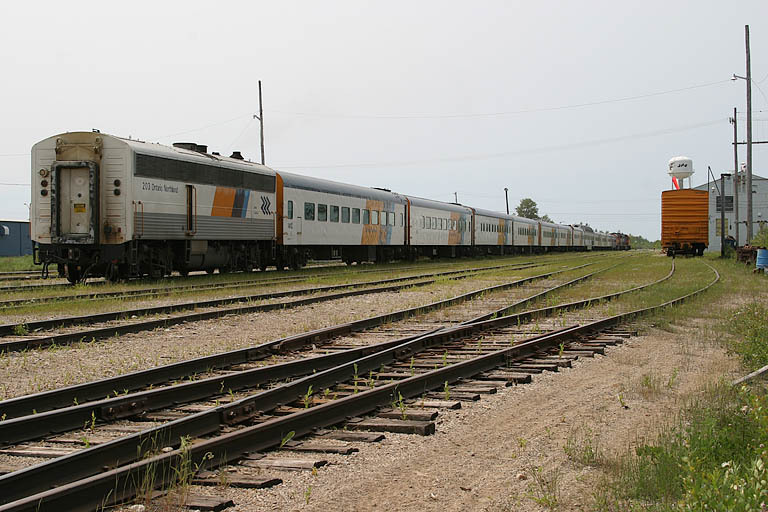 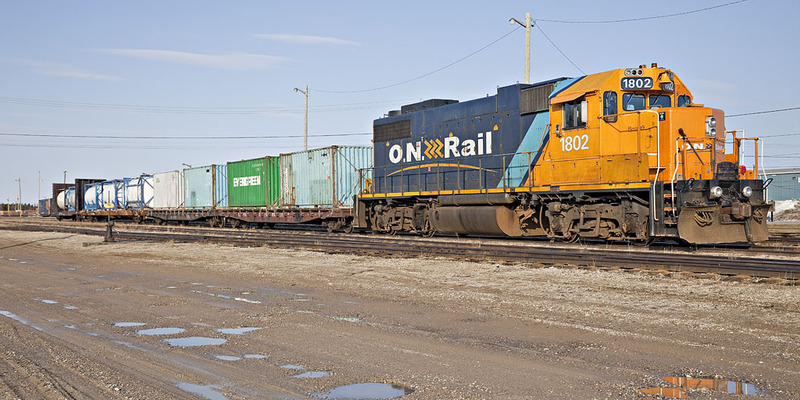 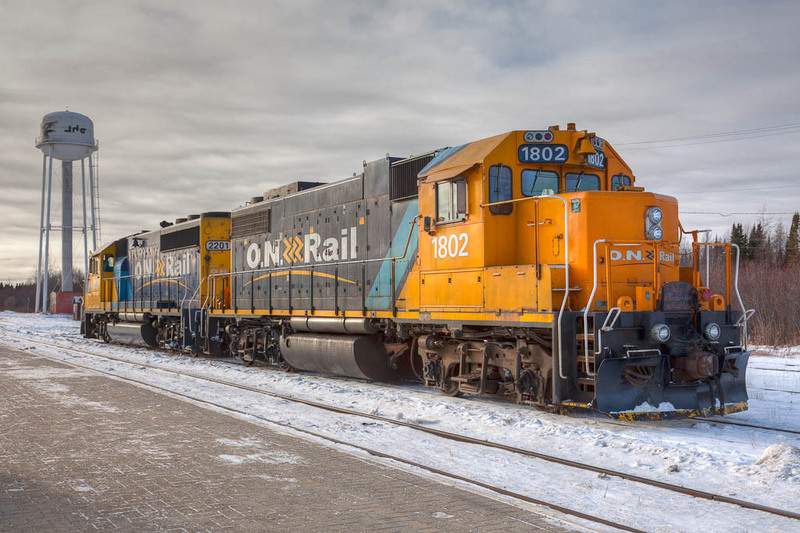 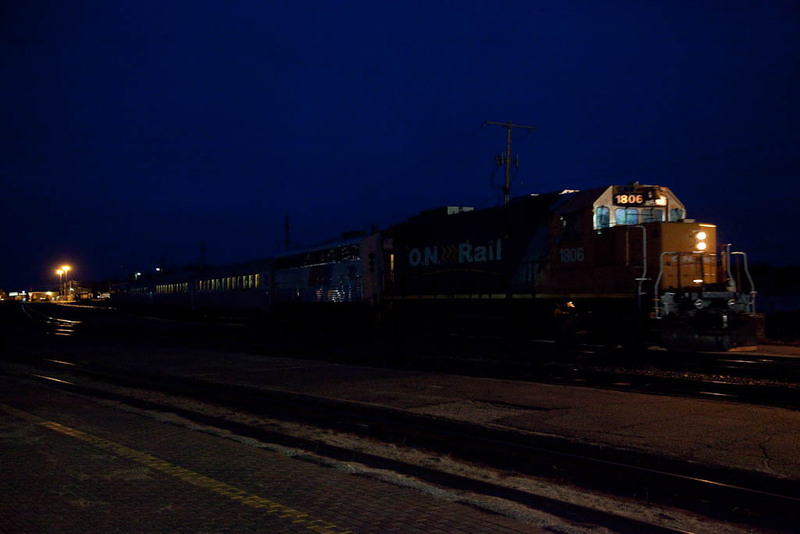 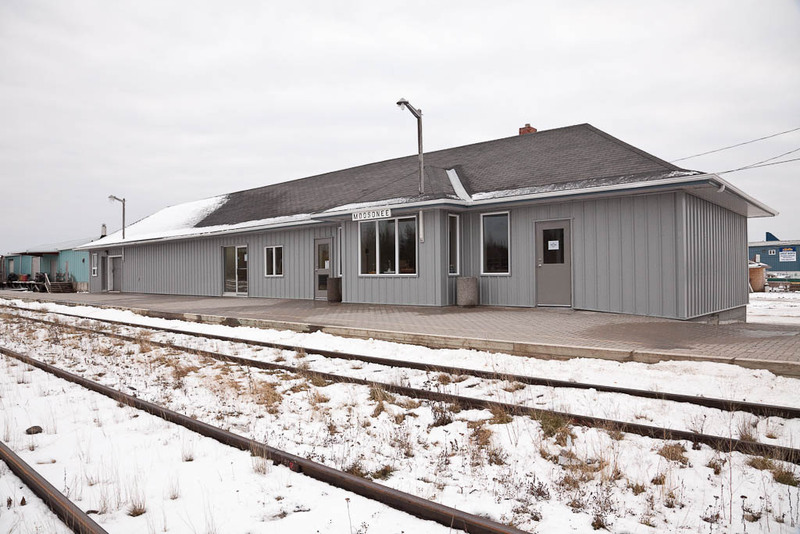 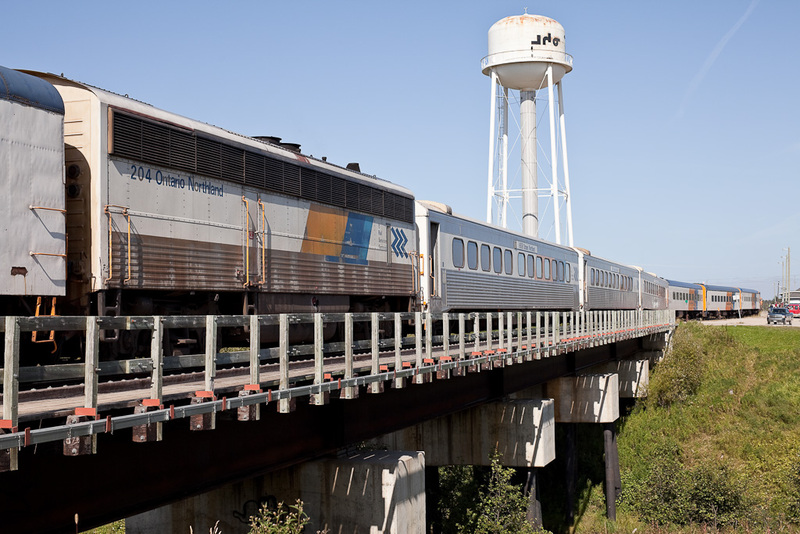 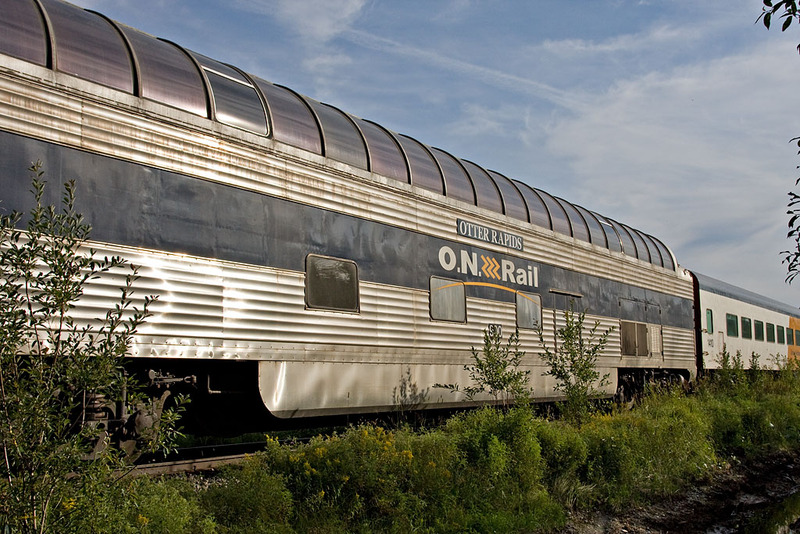 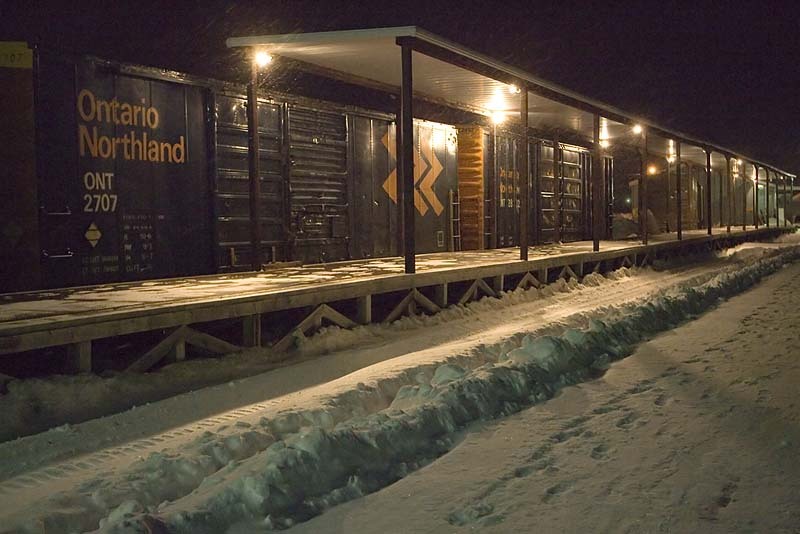 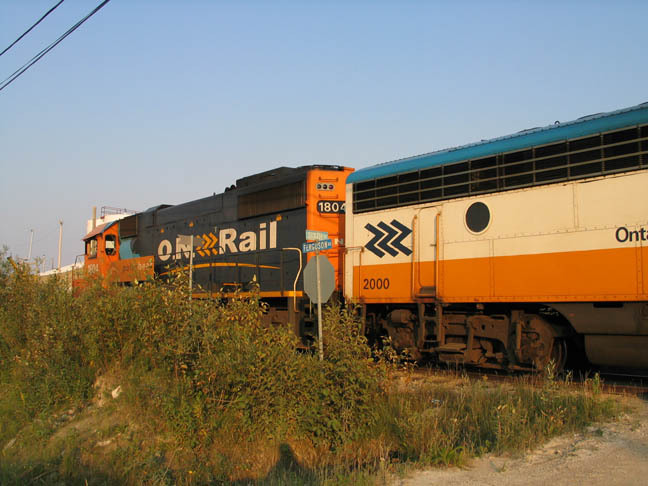 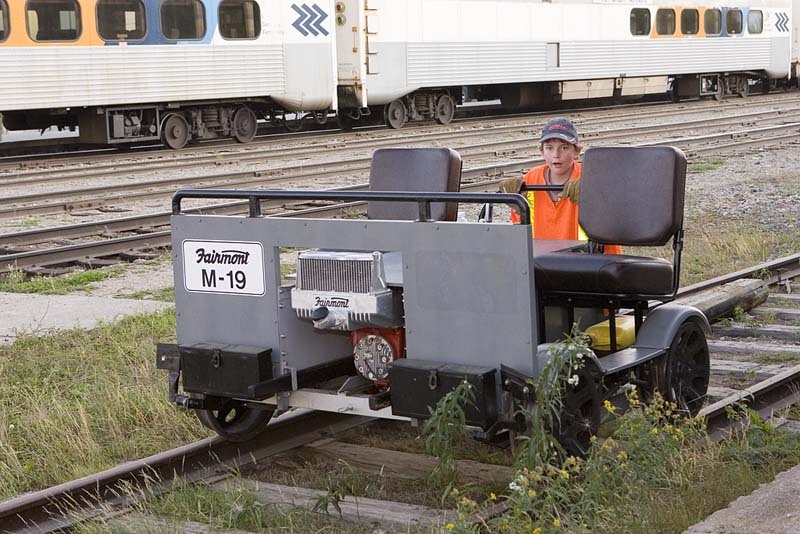 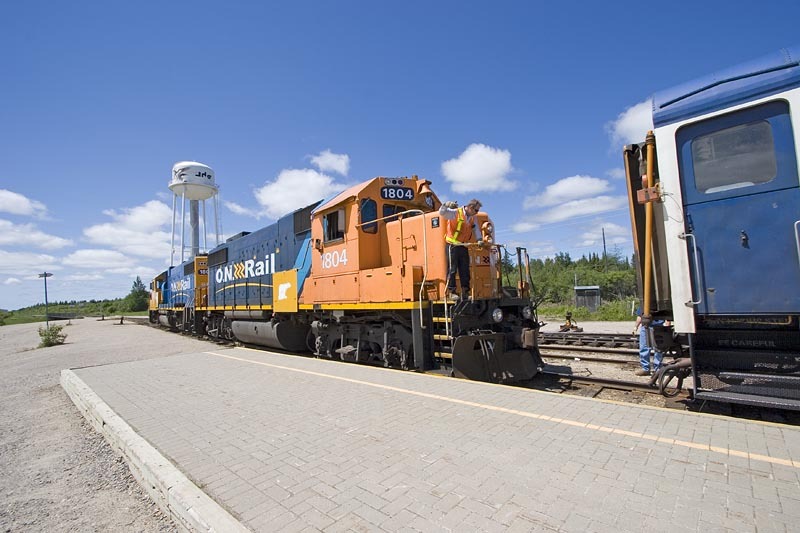 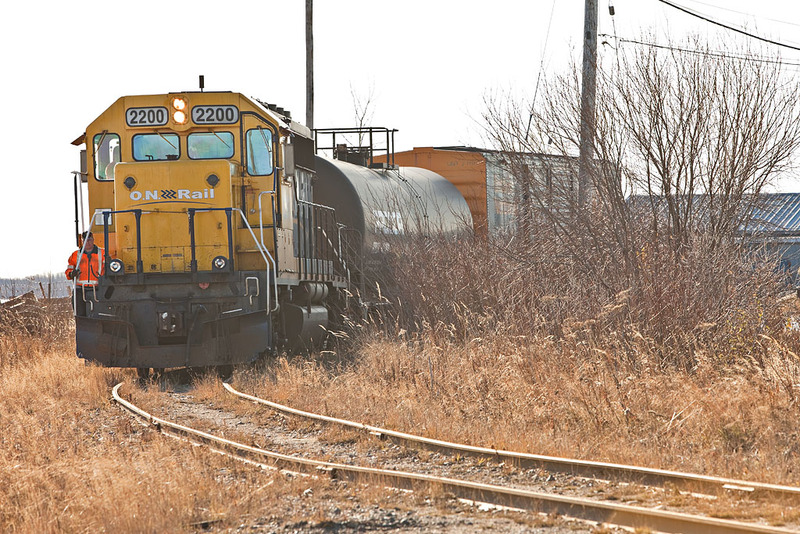 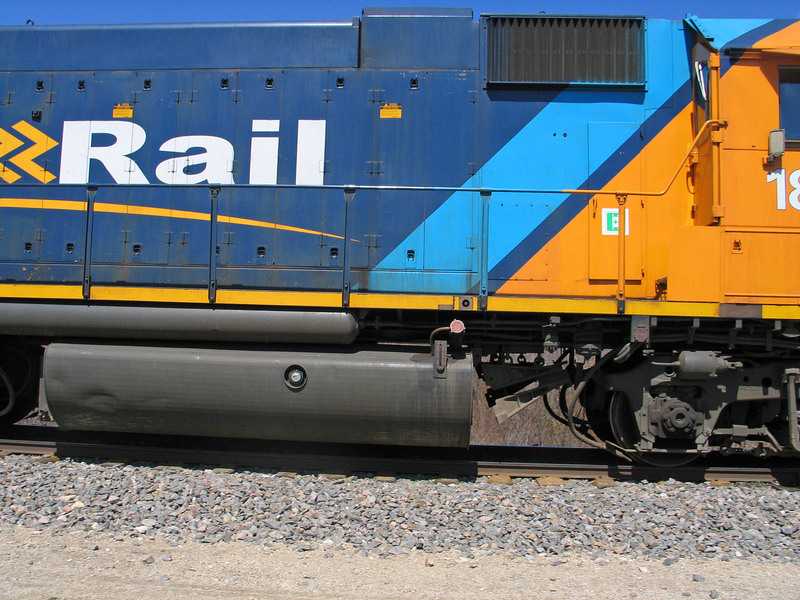 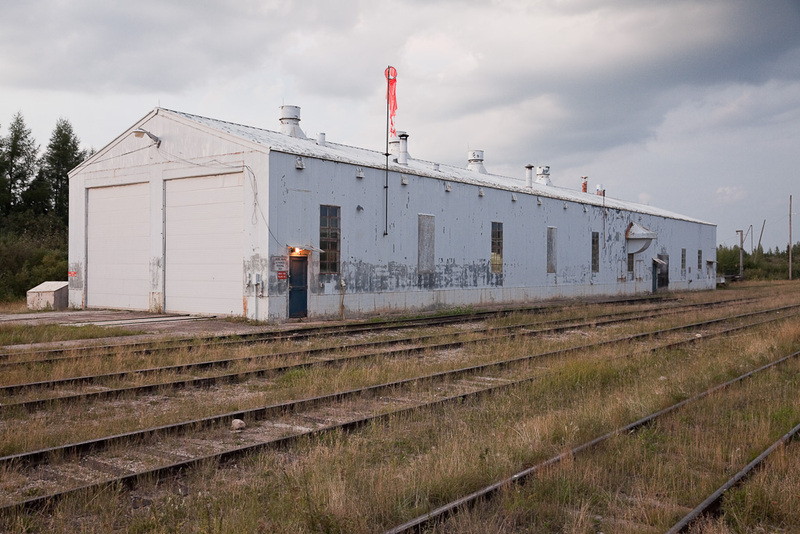 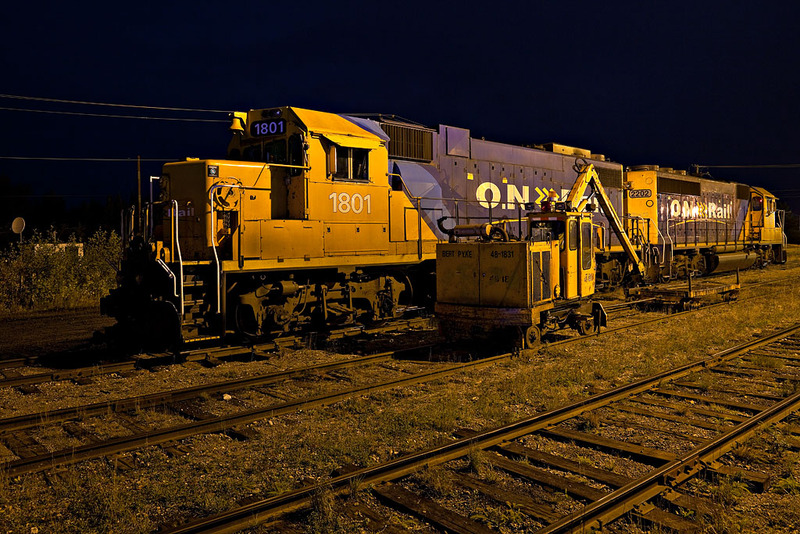 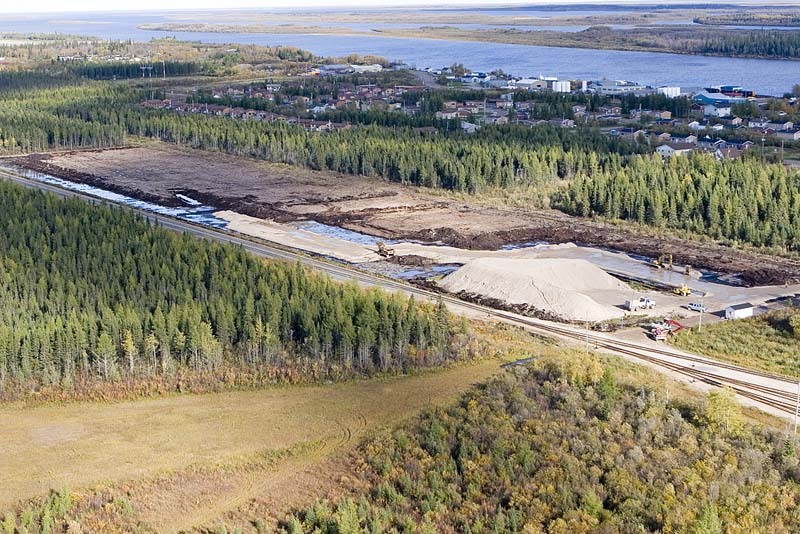 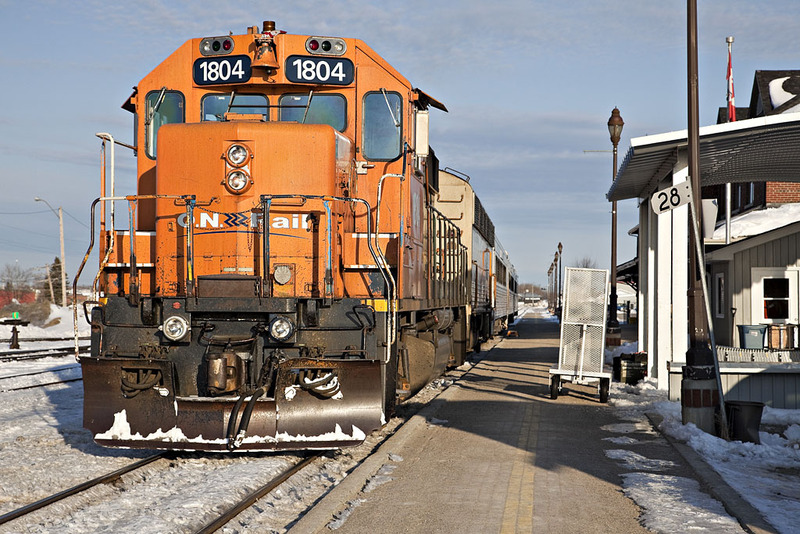 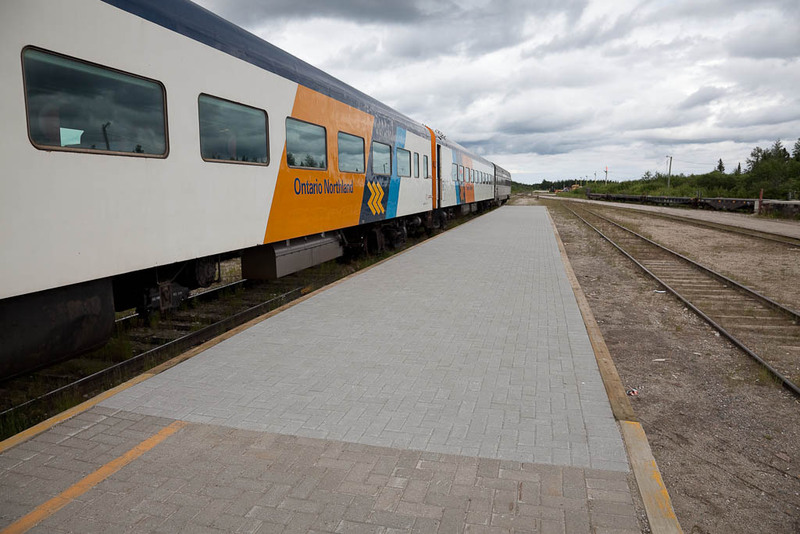 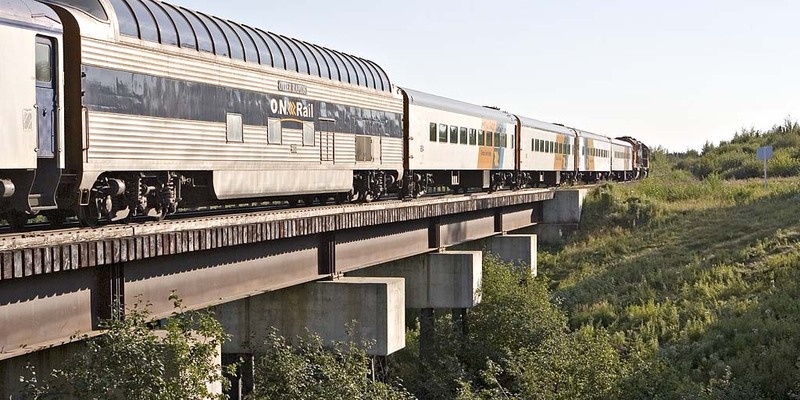 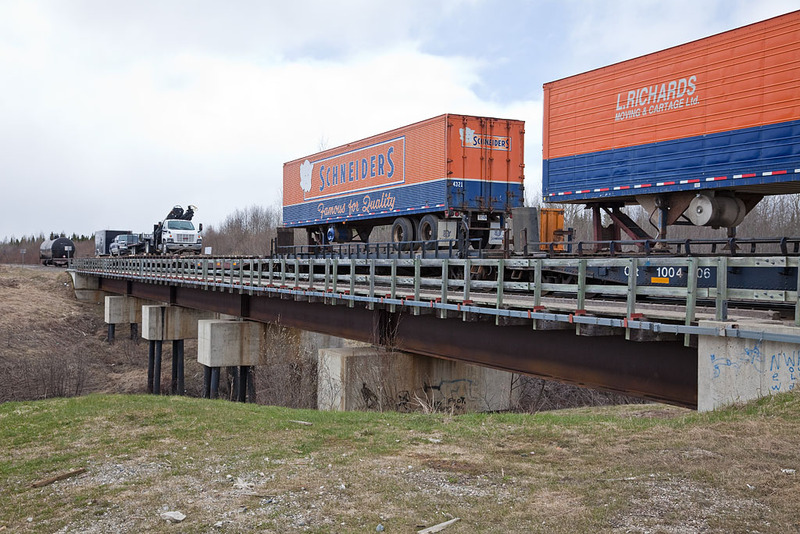 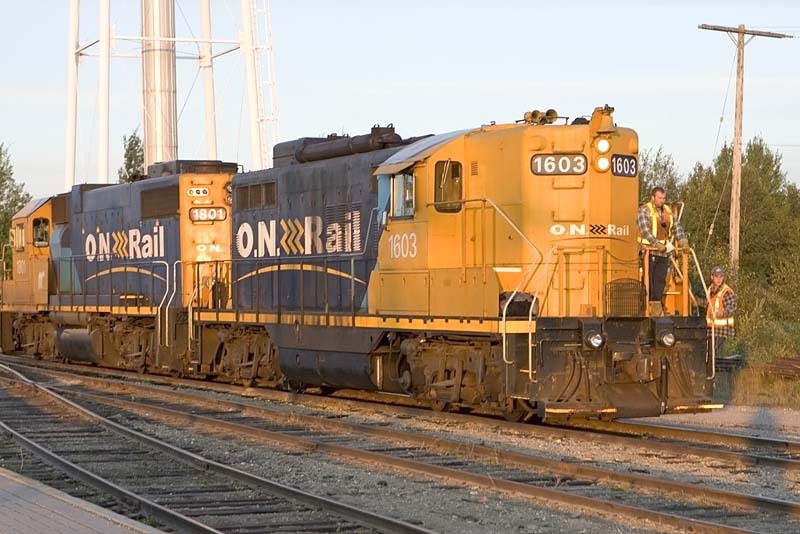 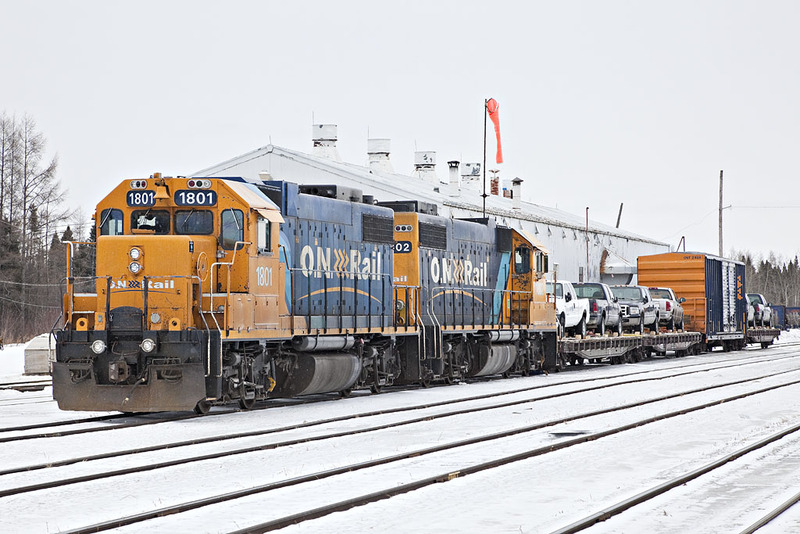 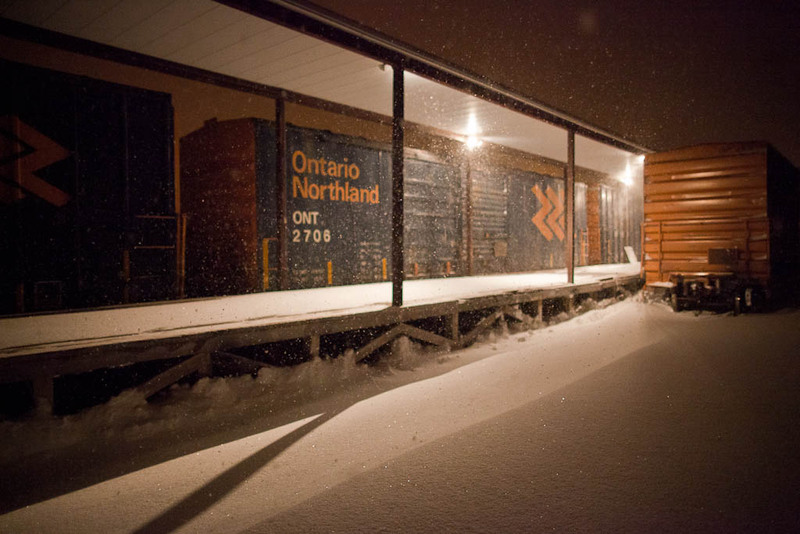 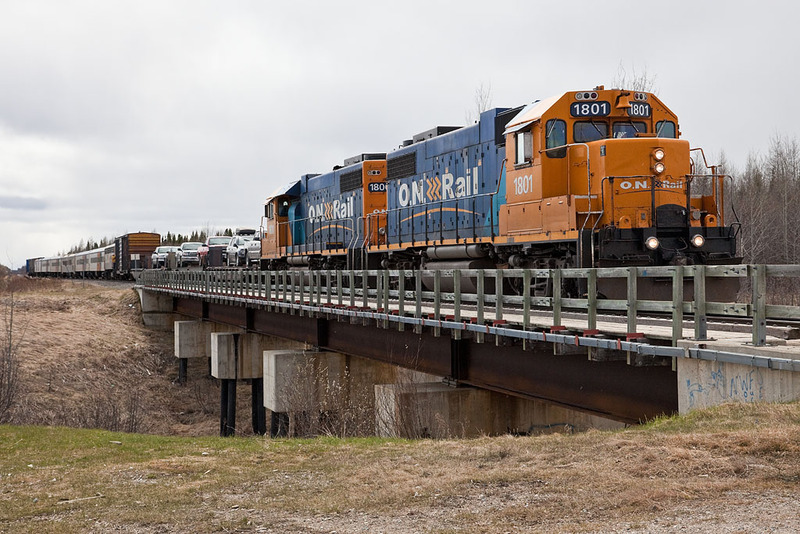 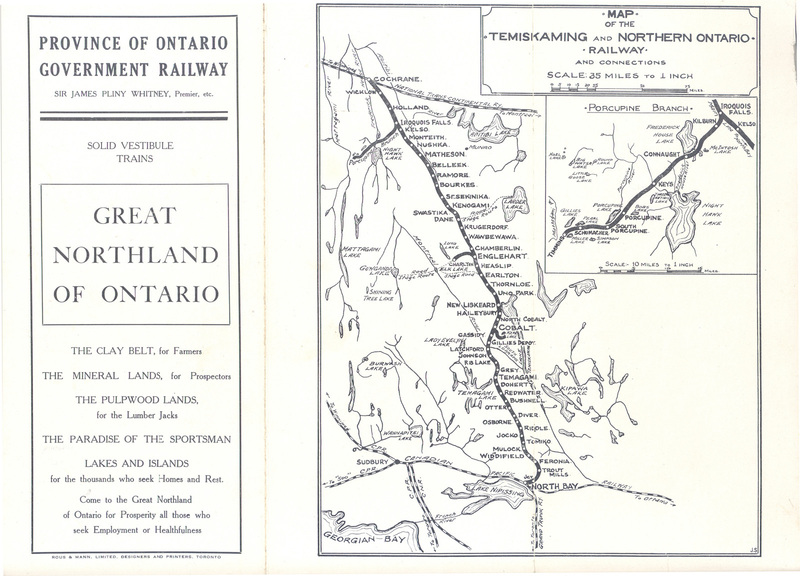 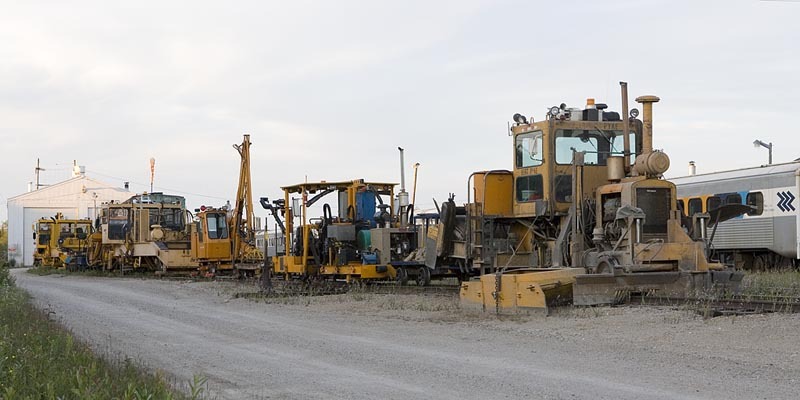 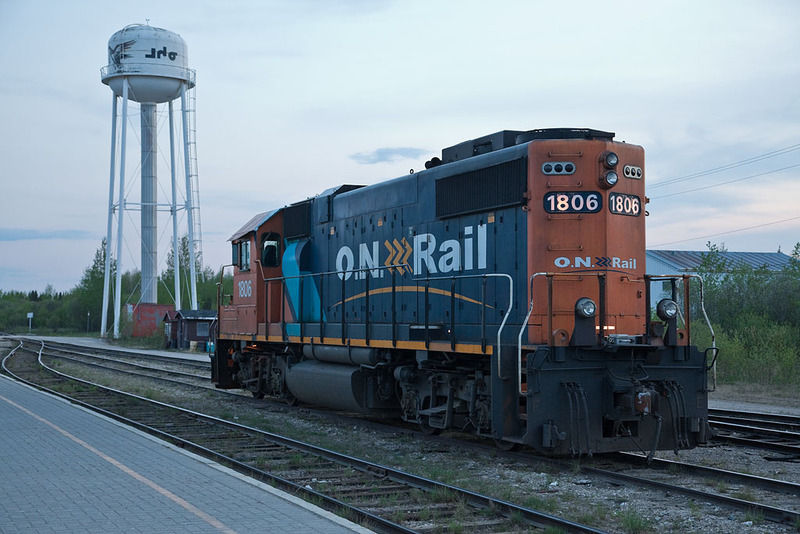 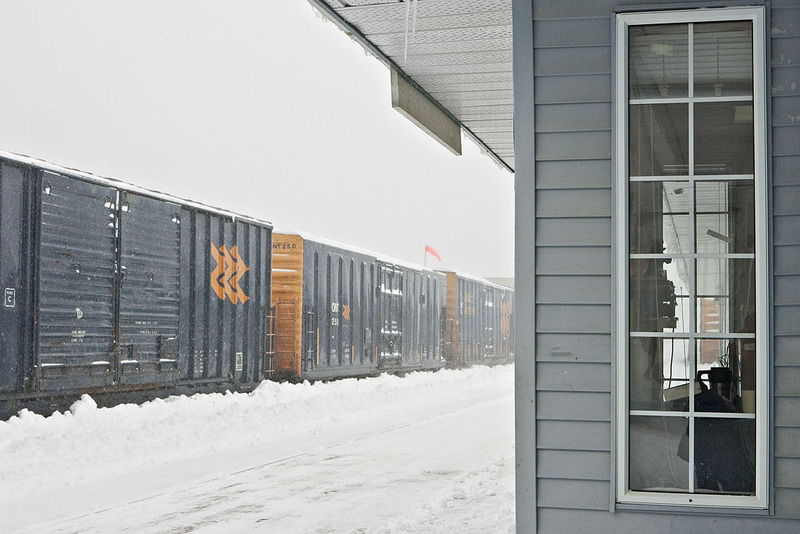 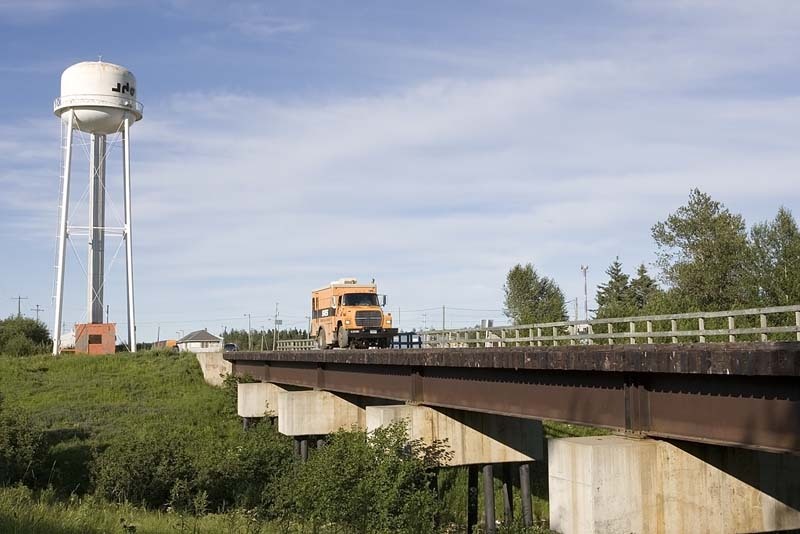 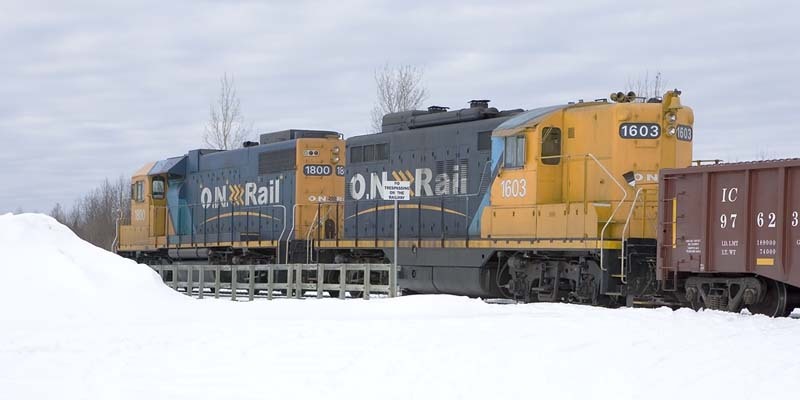 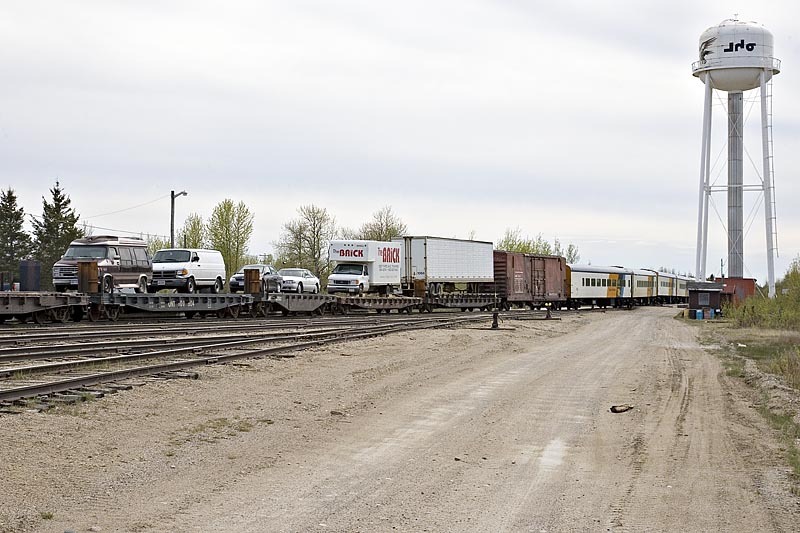 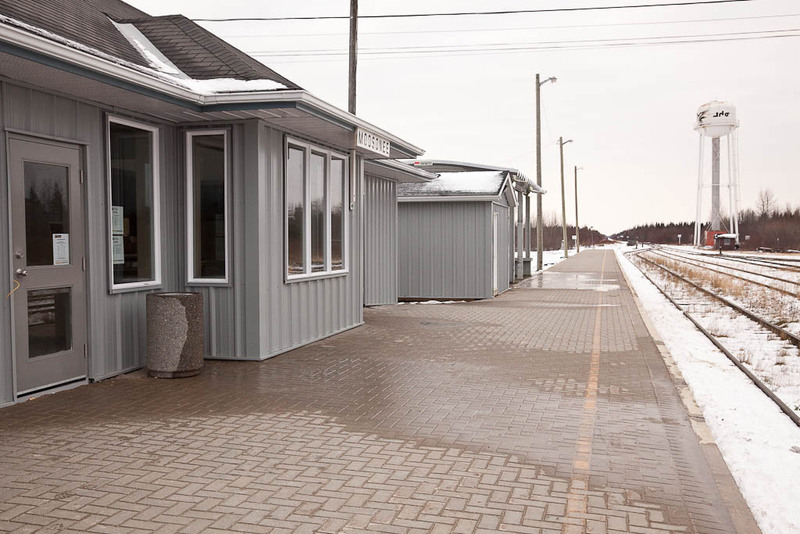 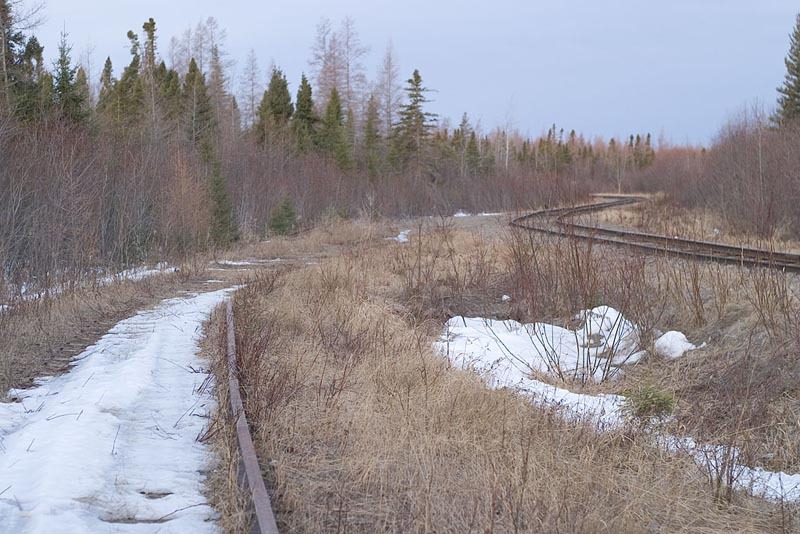 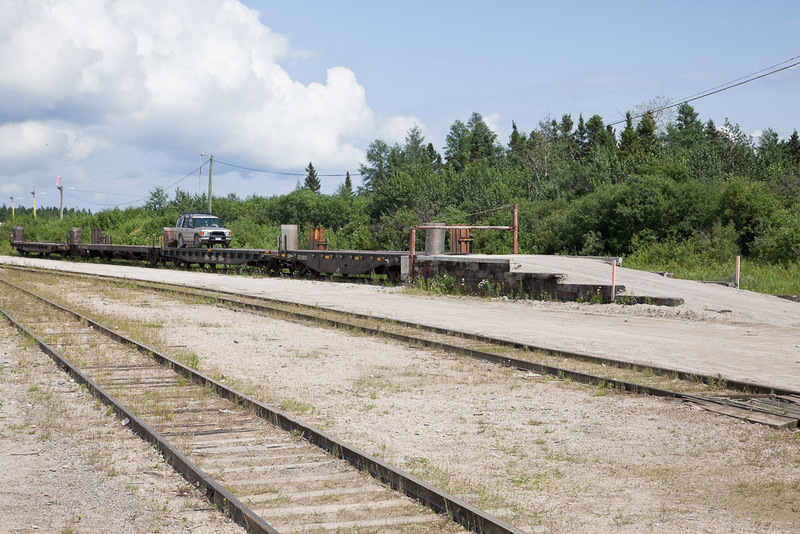 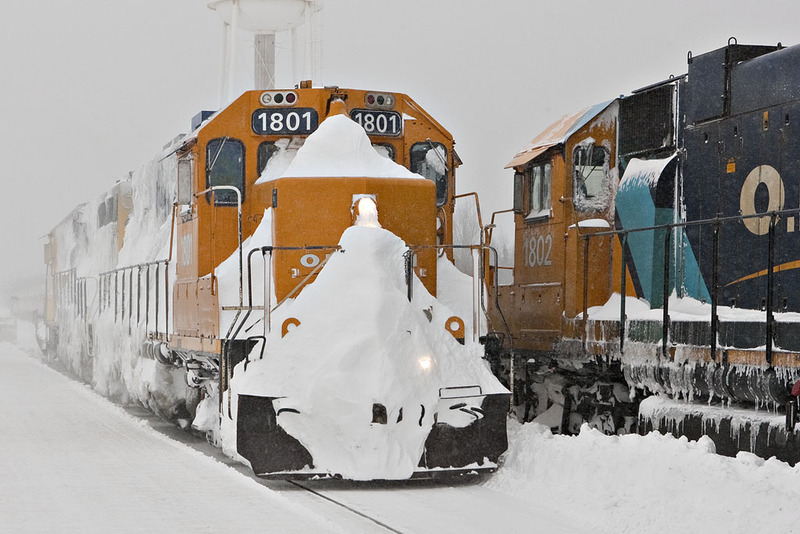 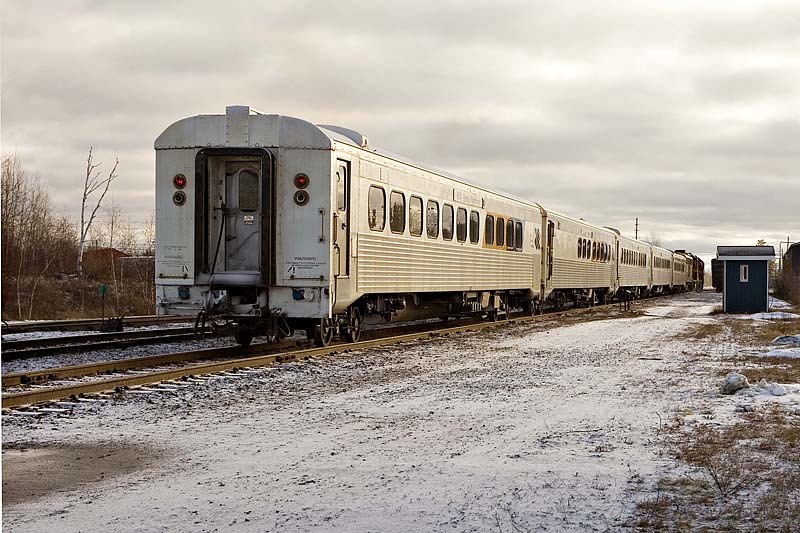 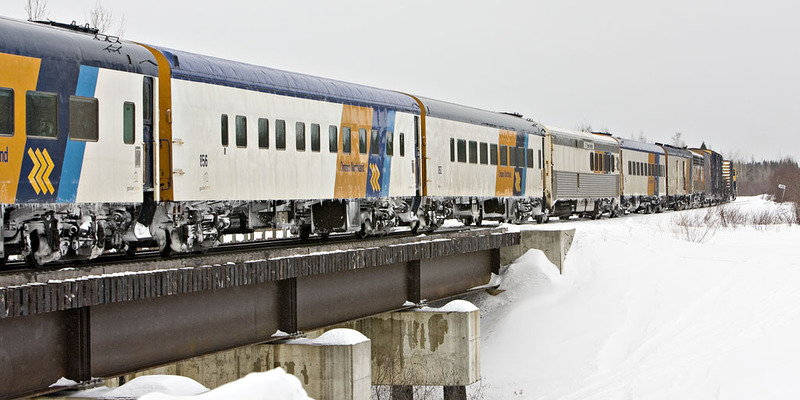 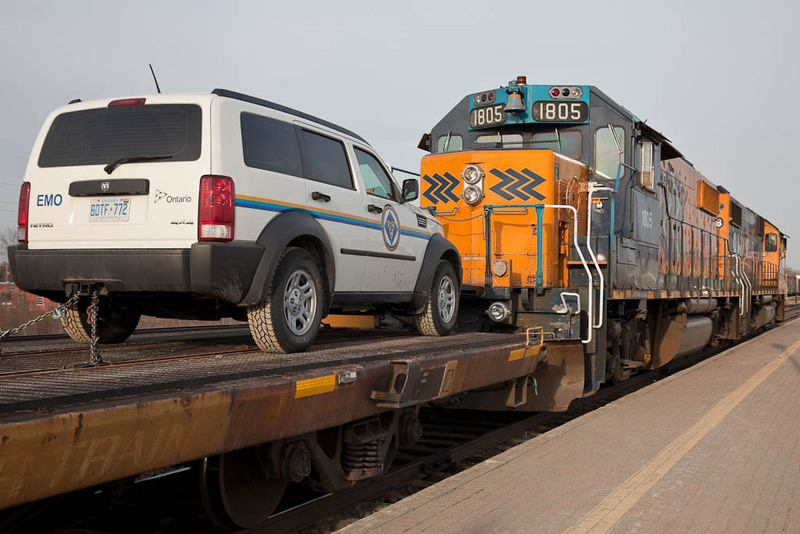 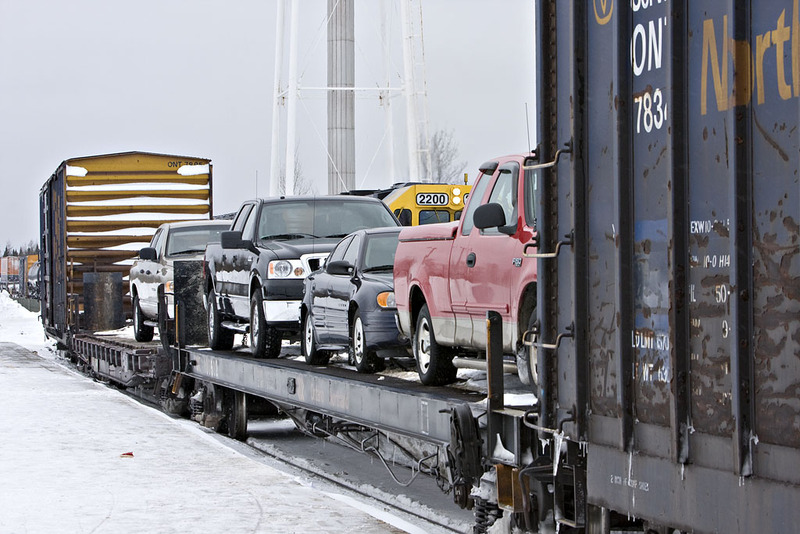 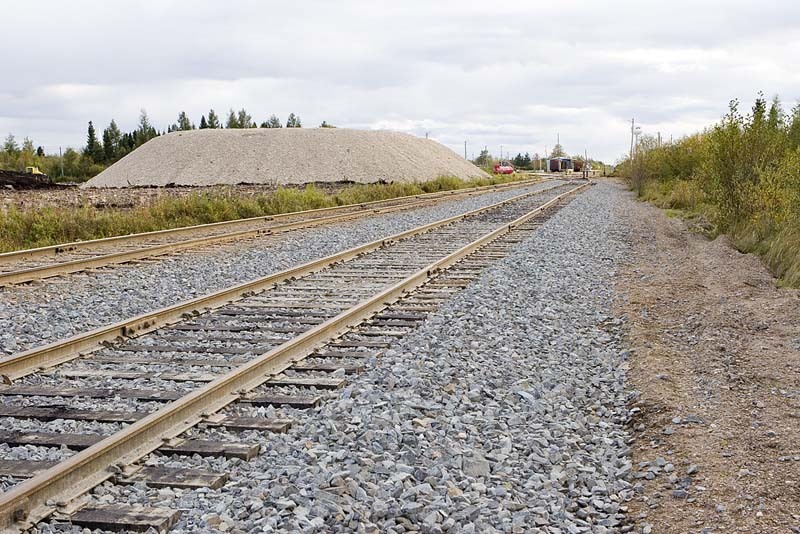 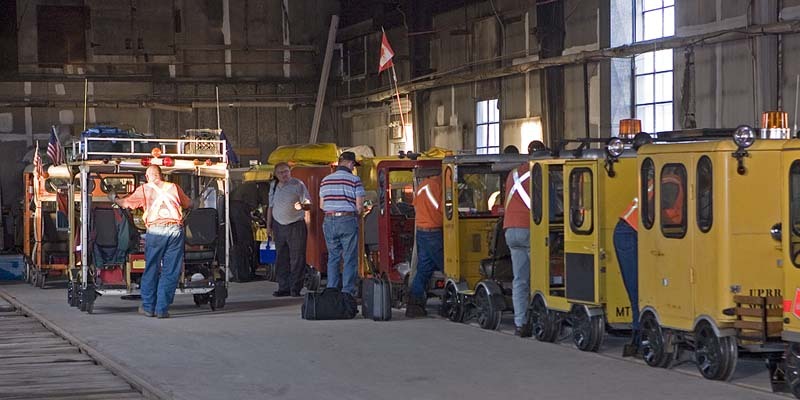 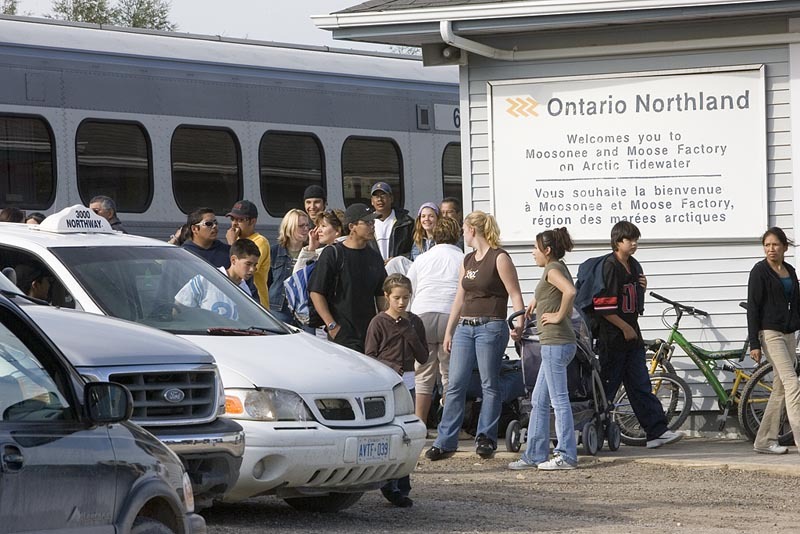 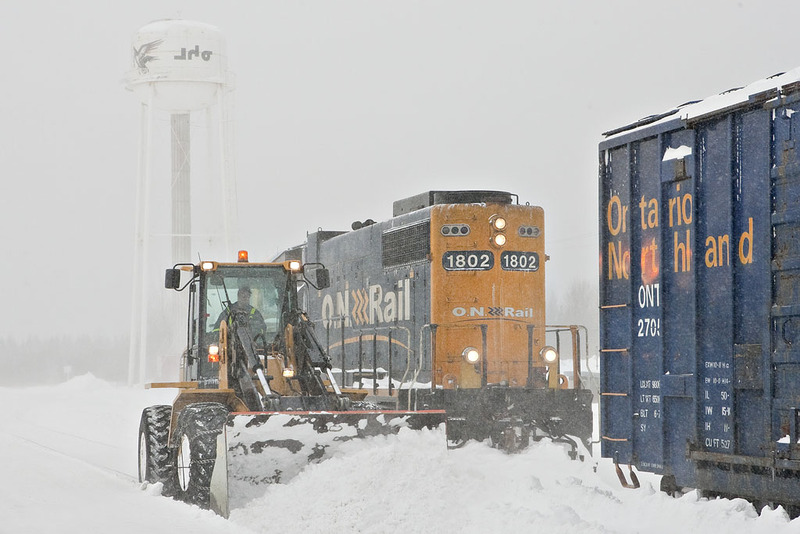 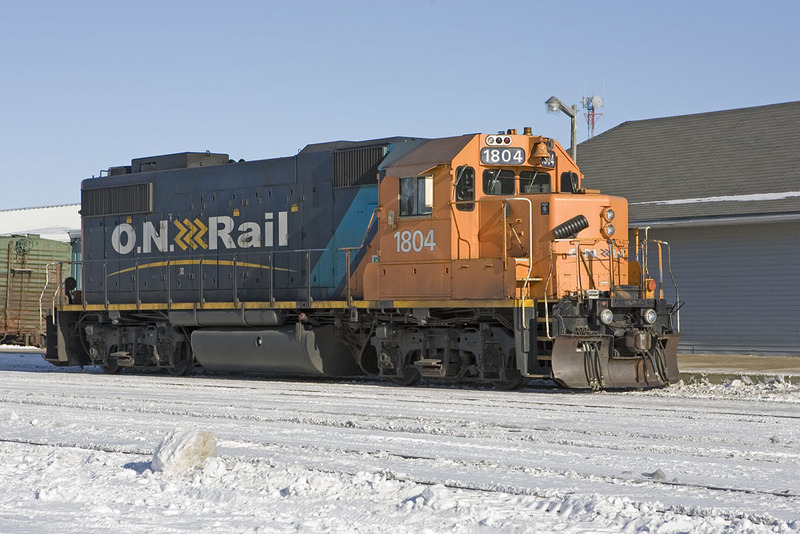 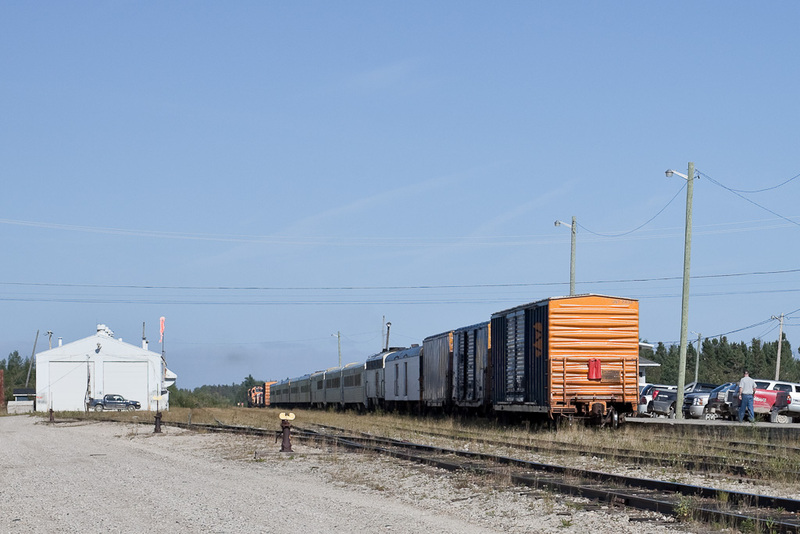 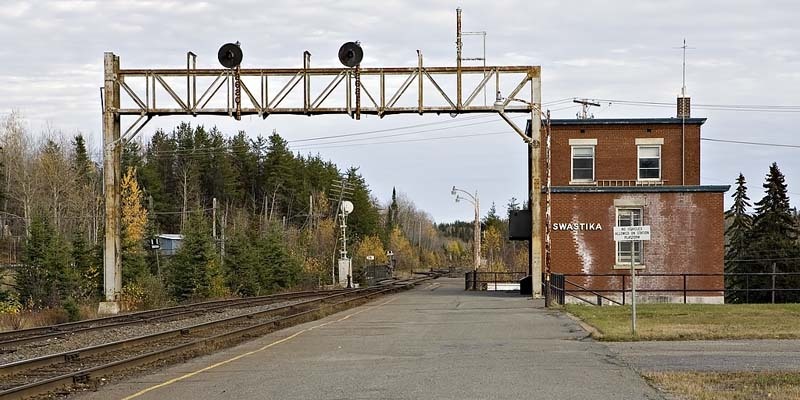 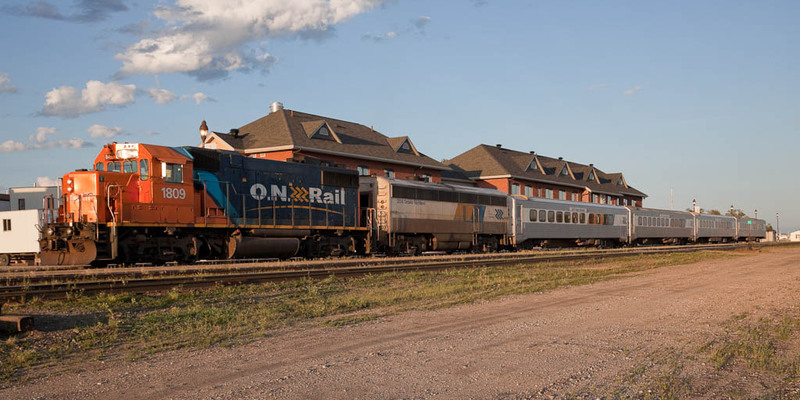 The railway is owned by the Government of the Province of Ontario and operated by the Ontario Northland Transportation Commission. 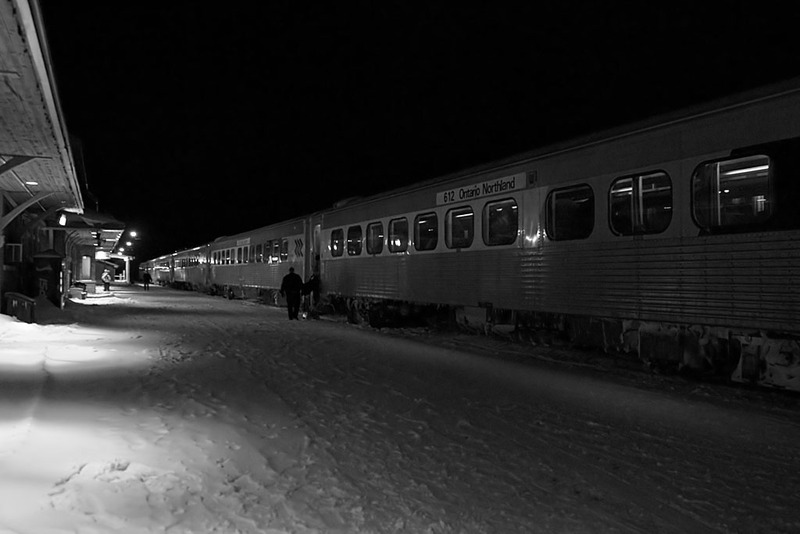 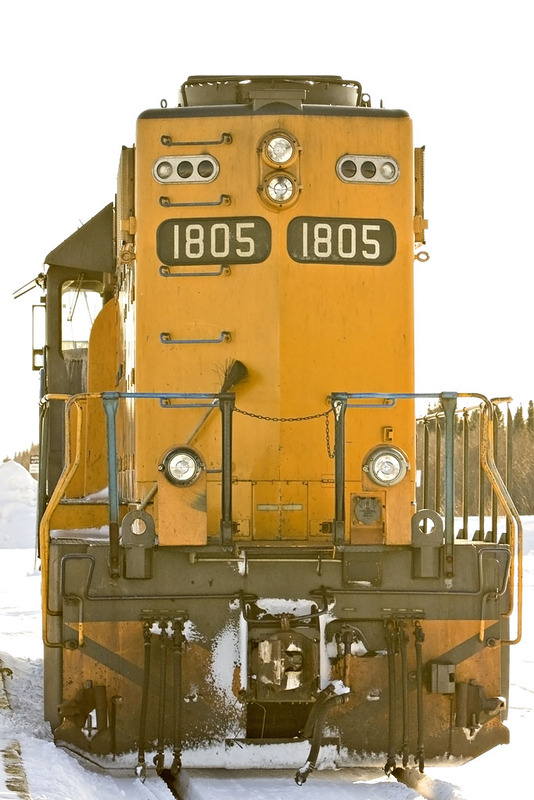 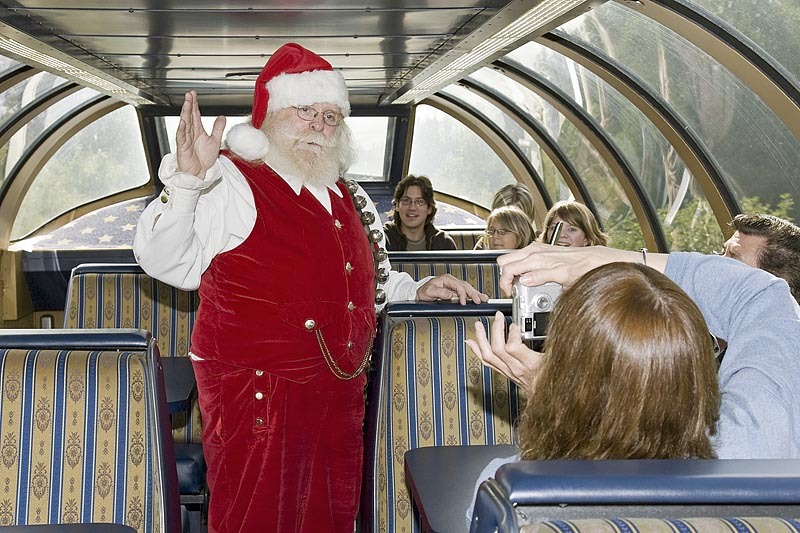 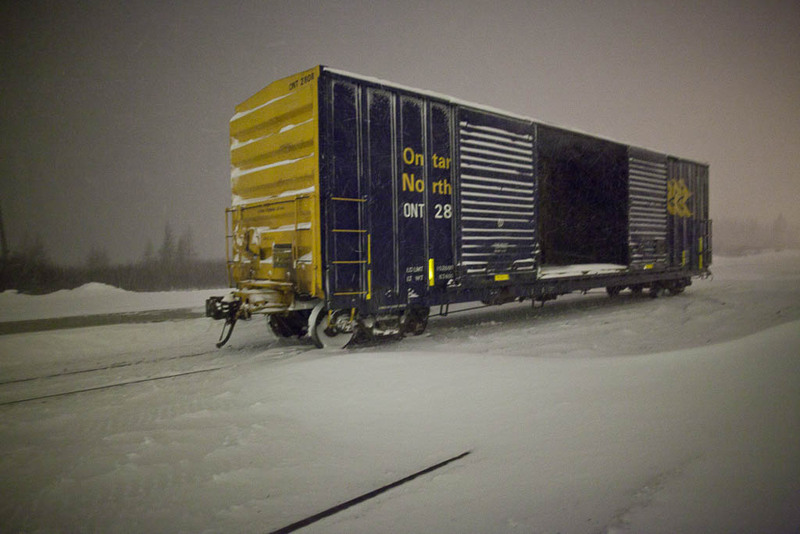 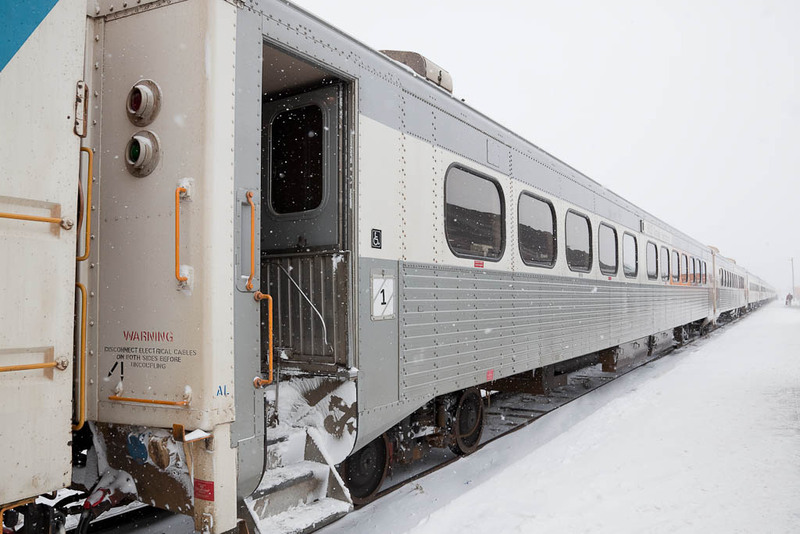 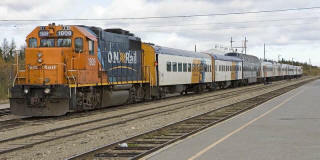 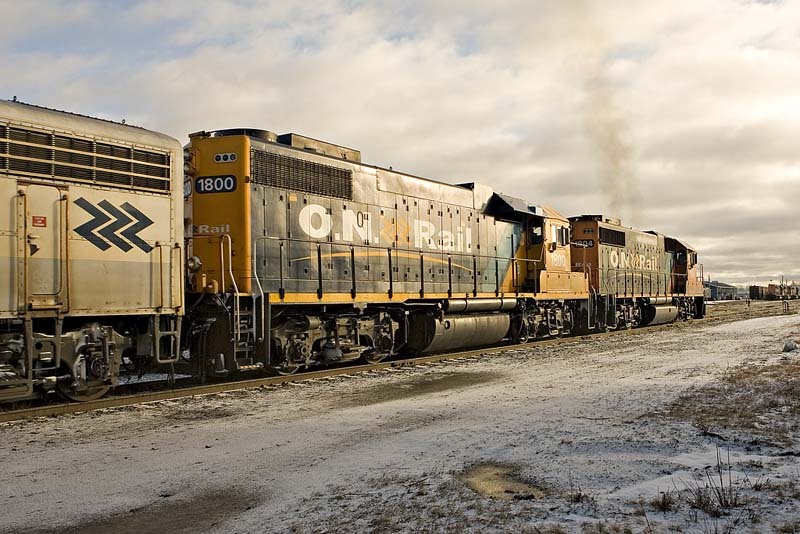 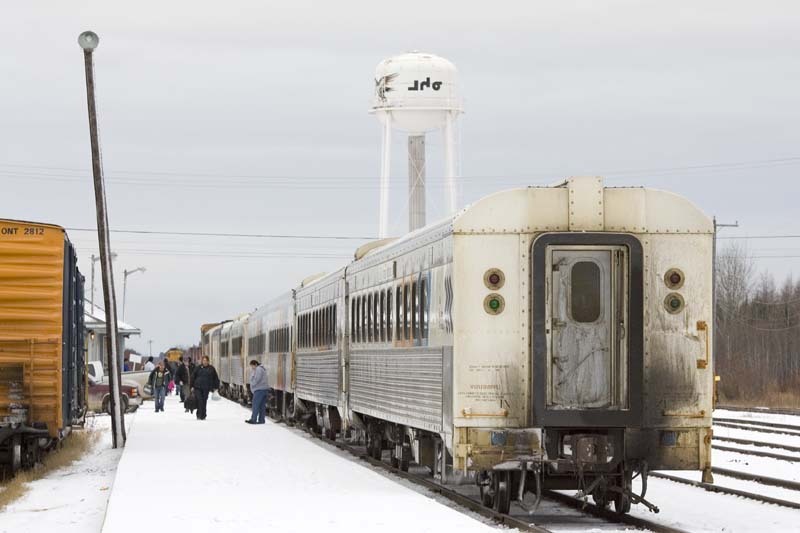 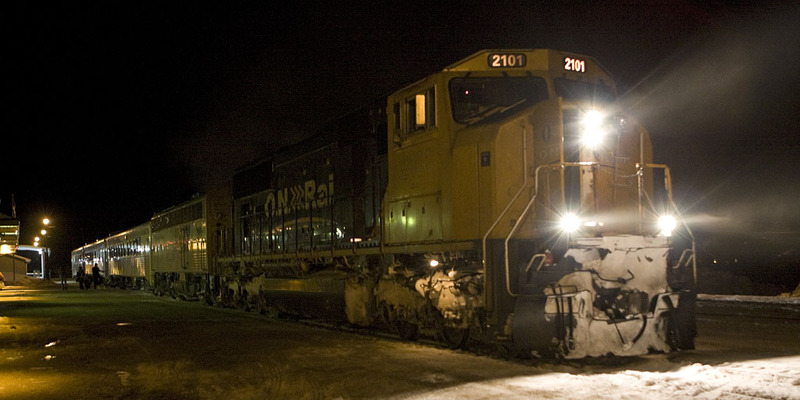 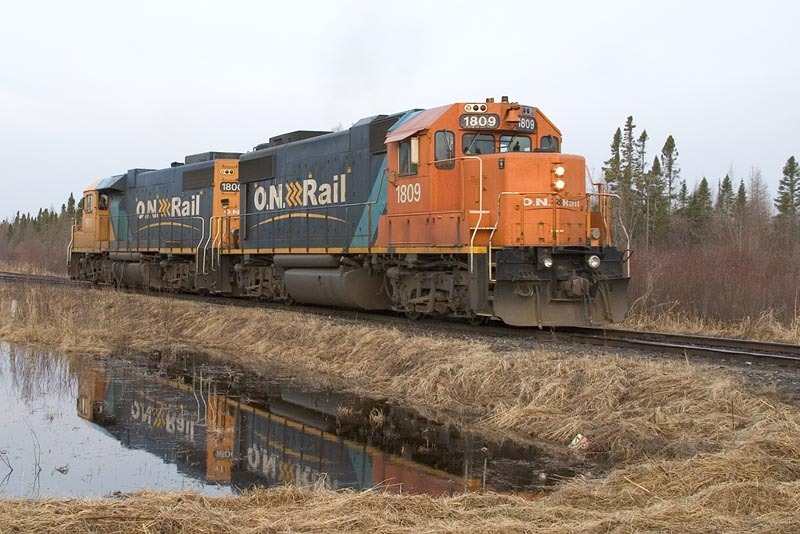 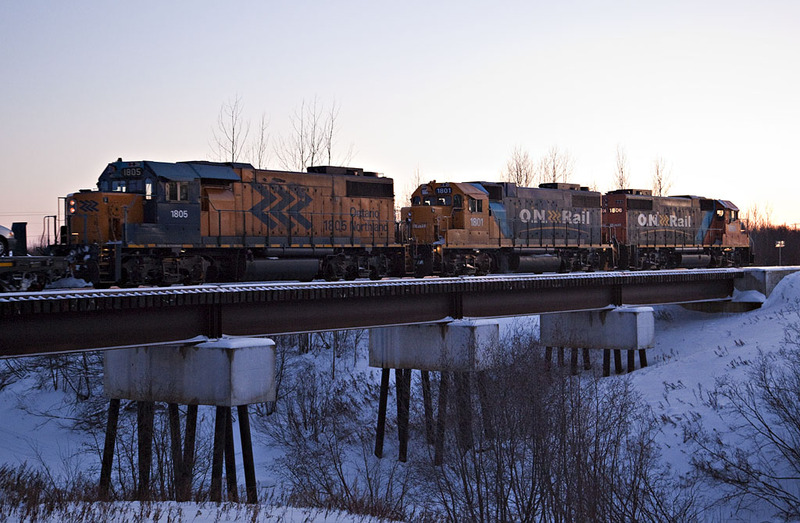 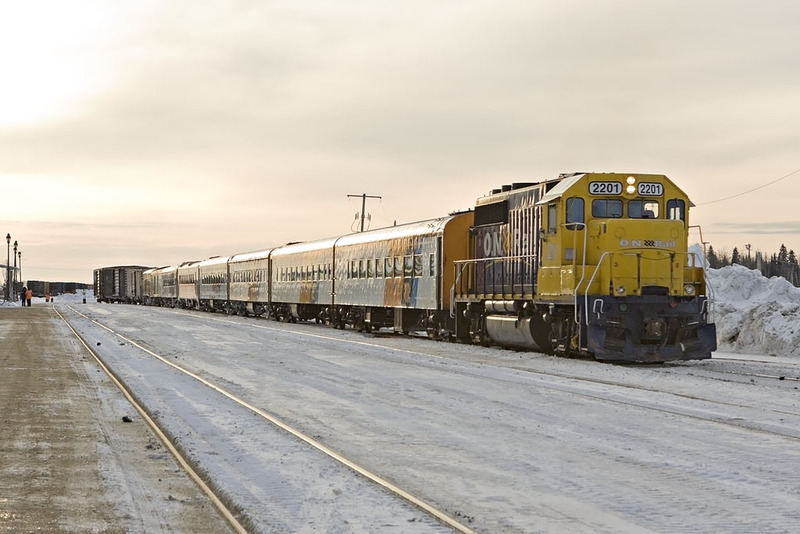 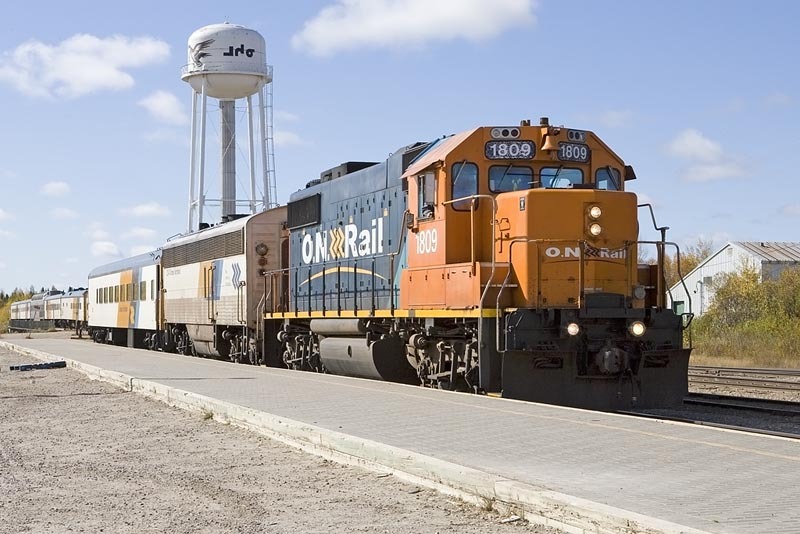 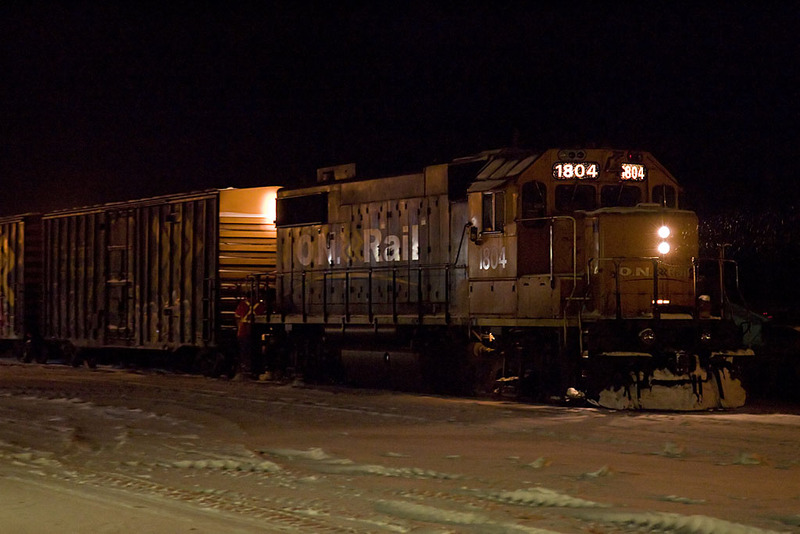 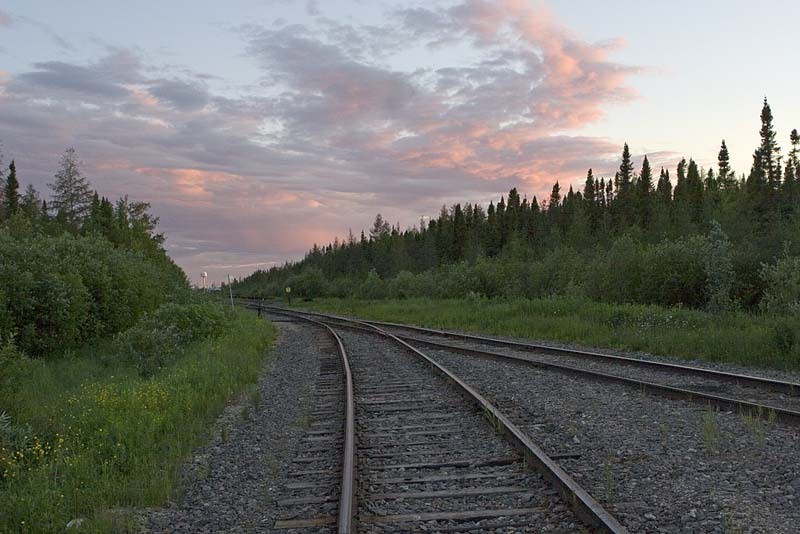 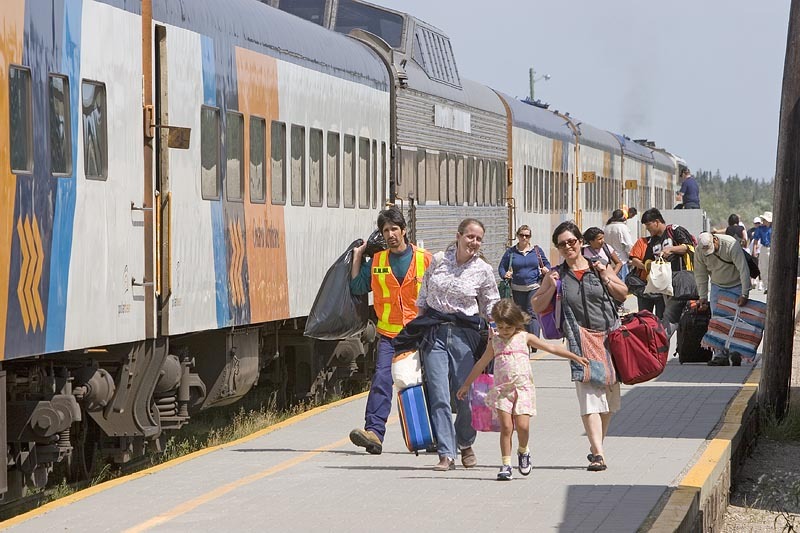 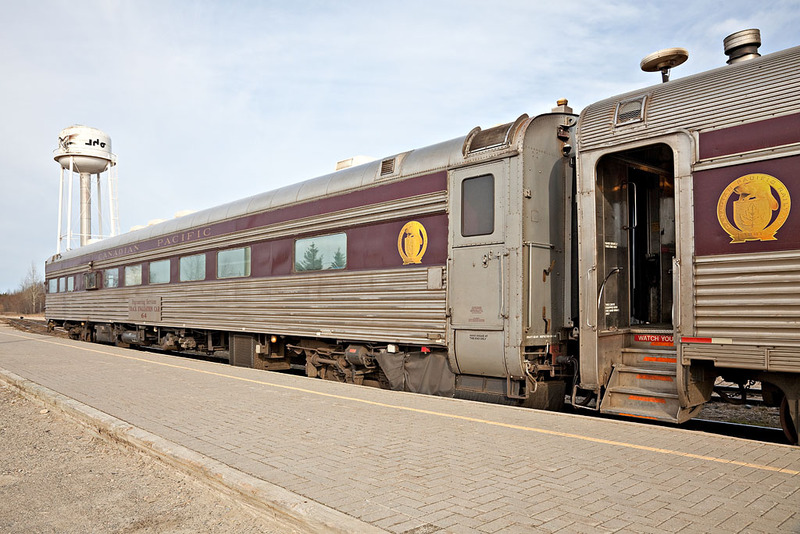 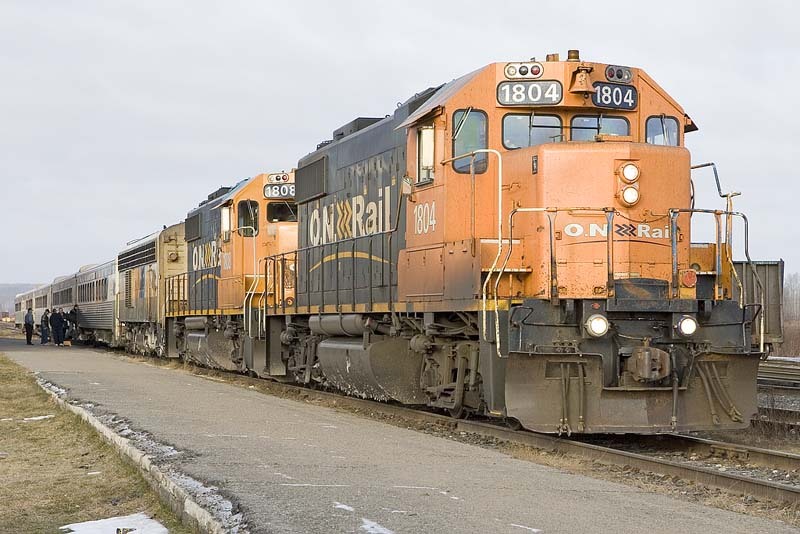 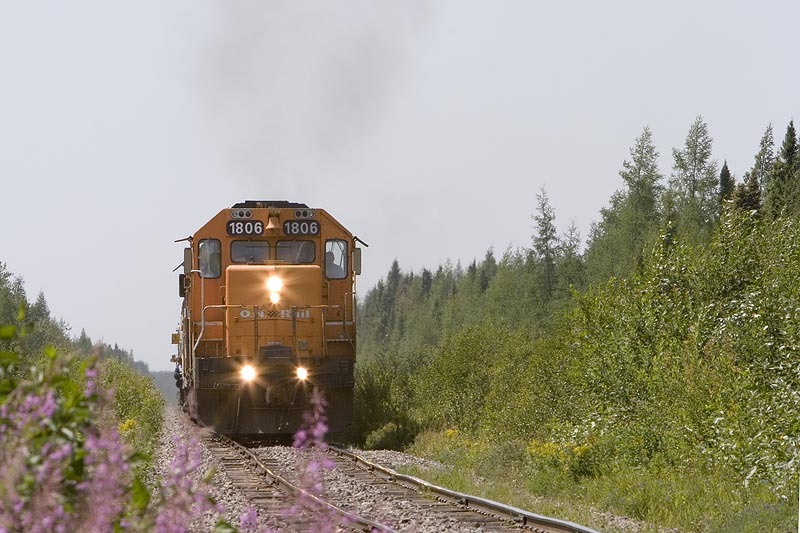 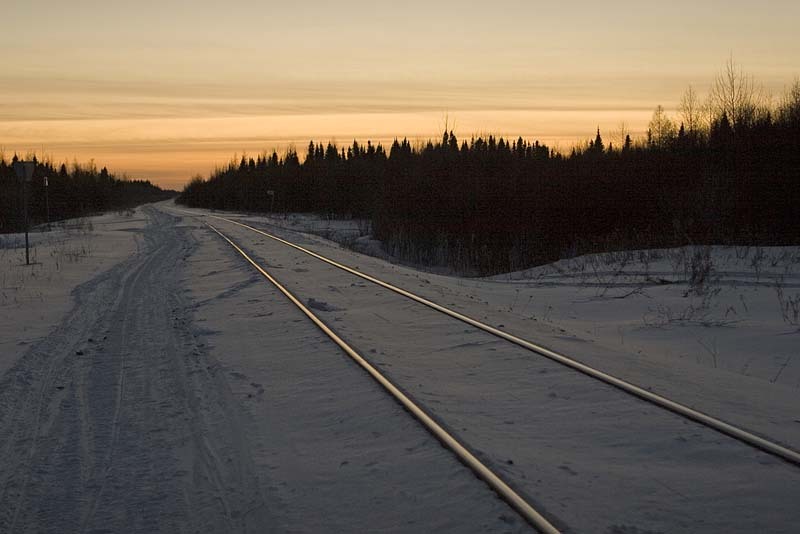 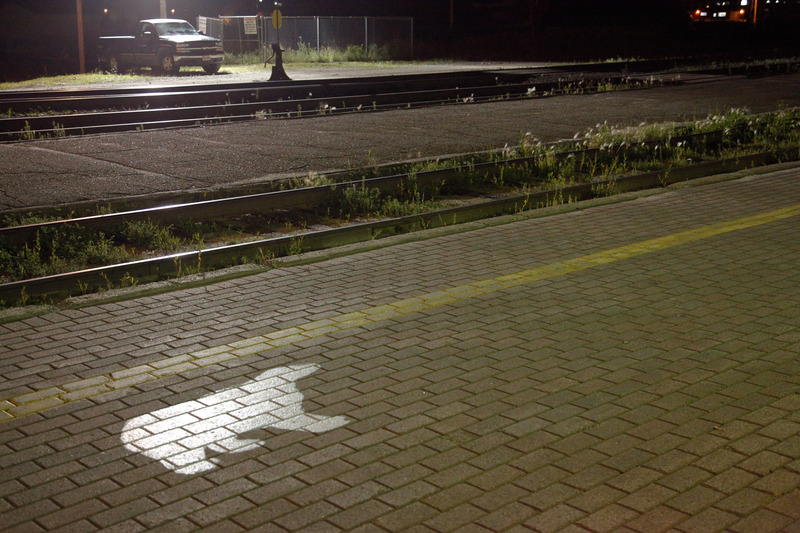 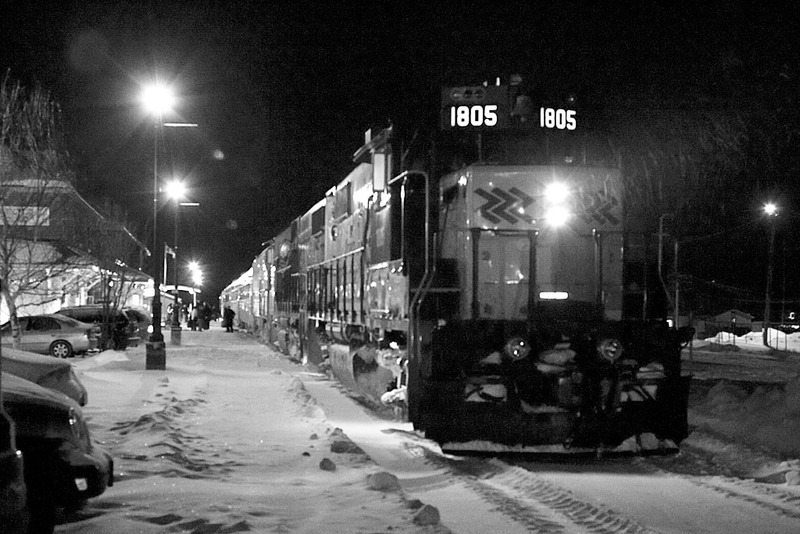 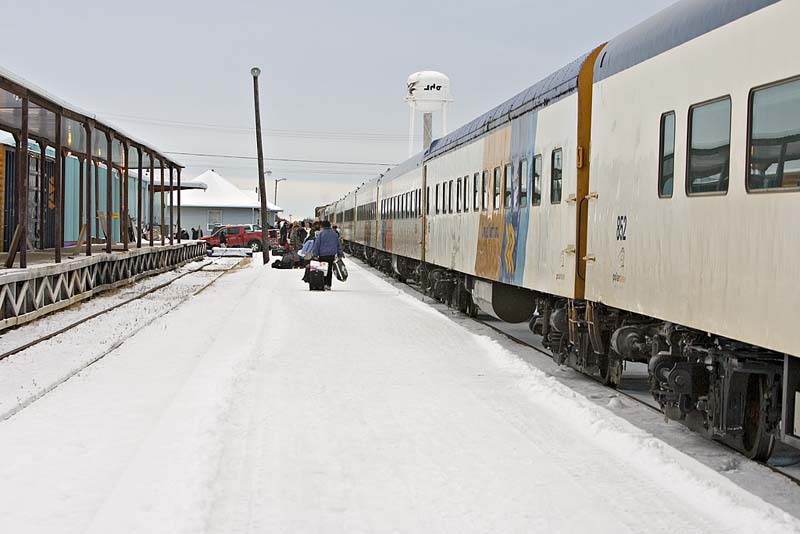 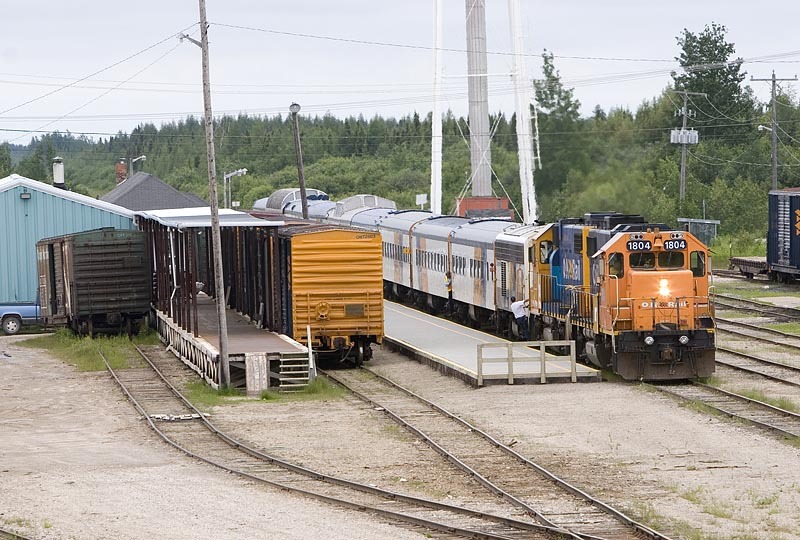 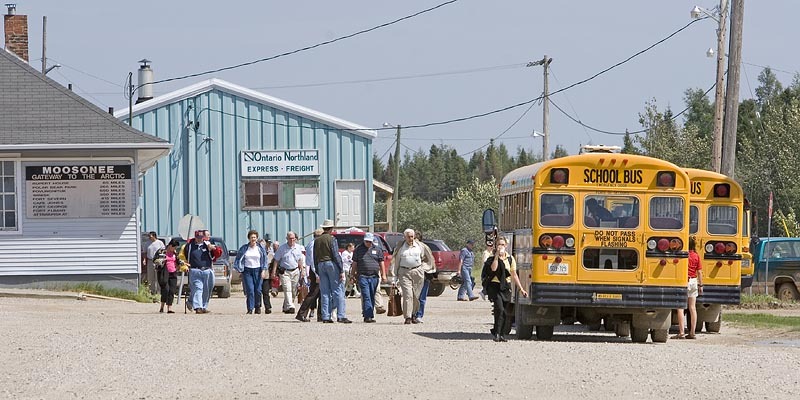 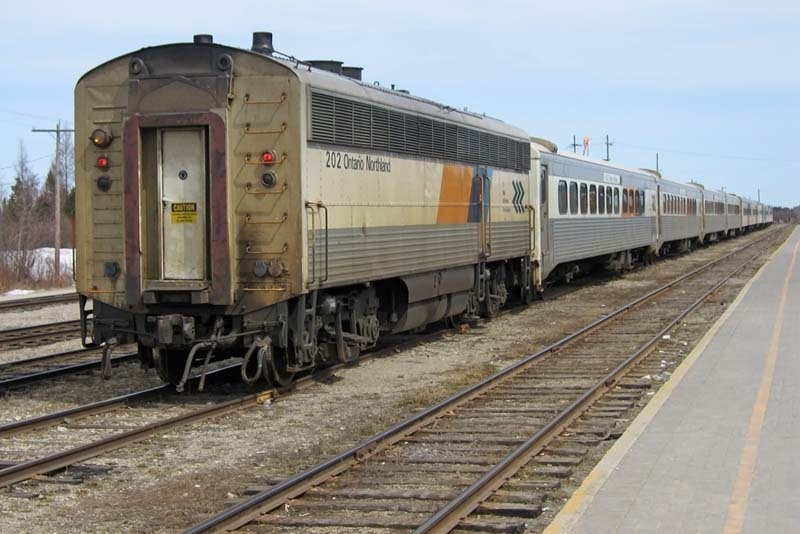 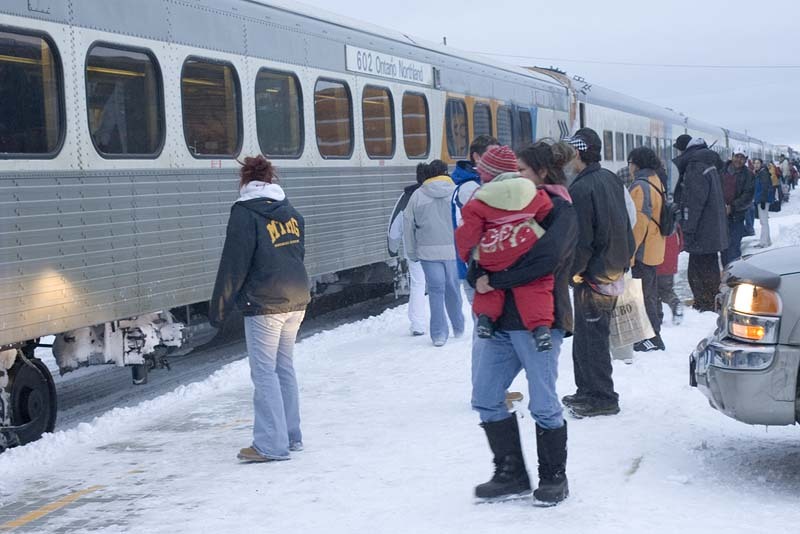 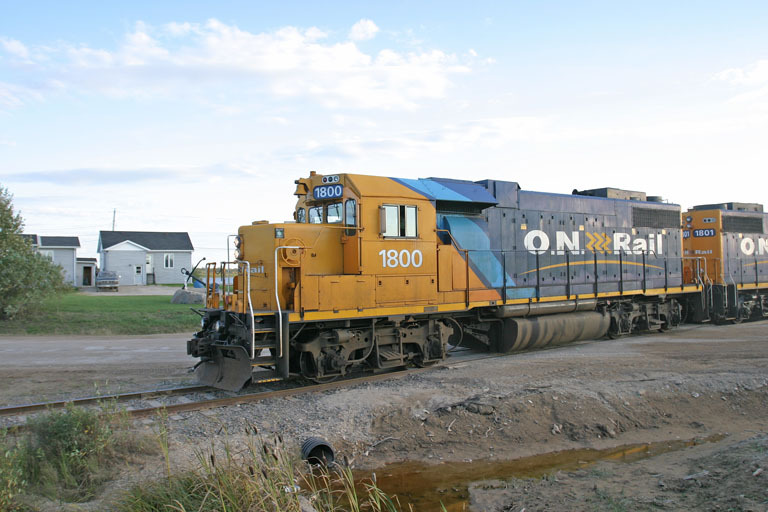 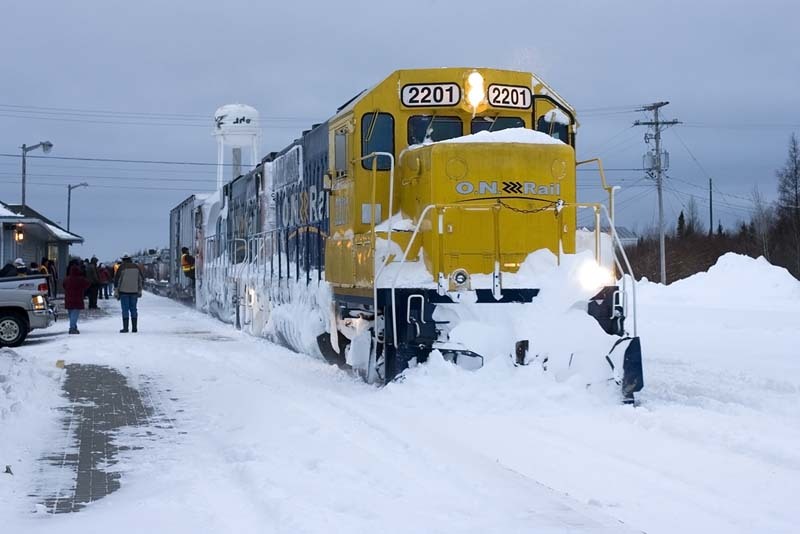 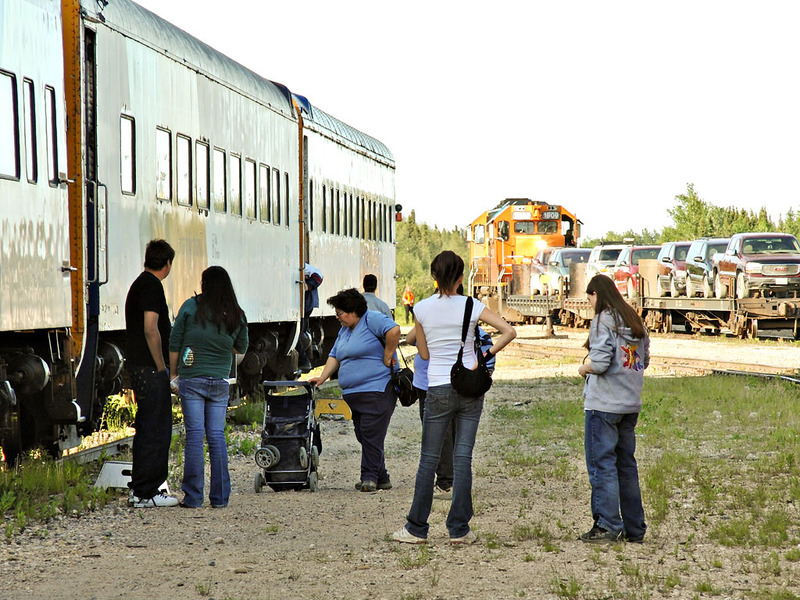 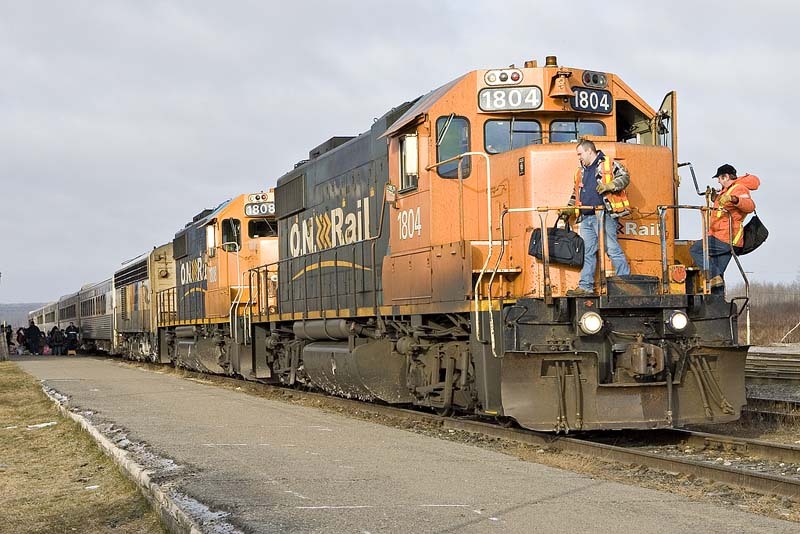 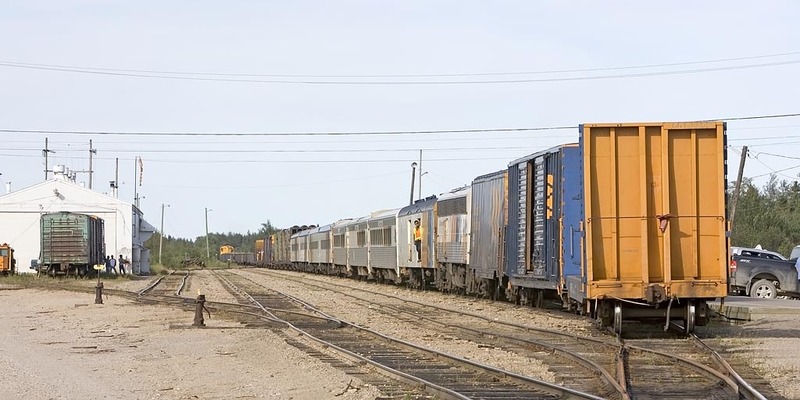 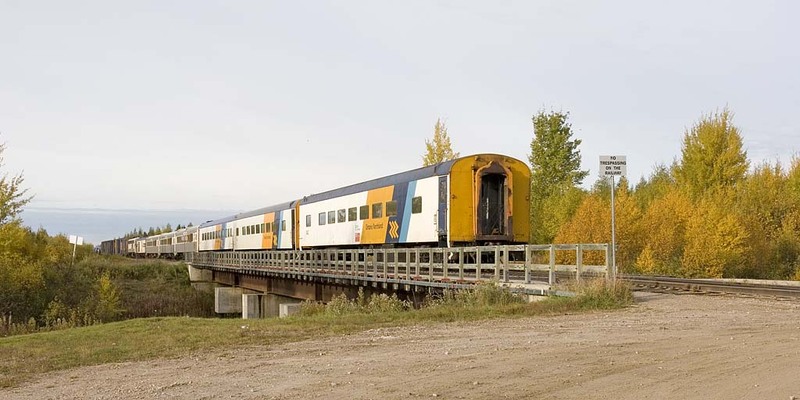 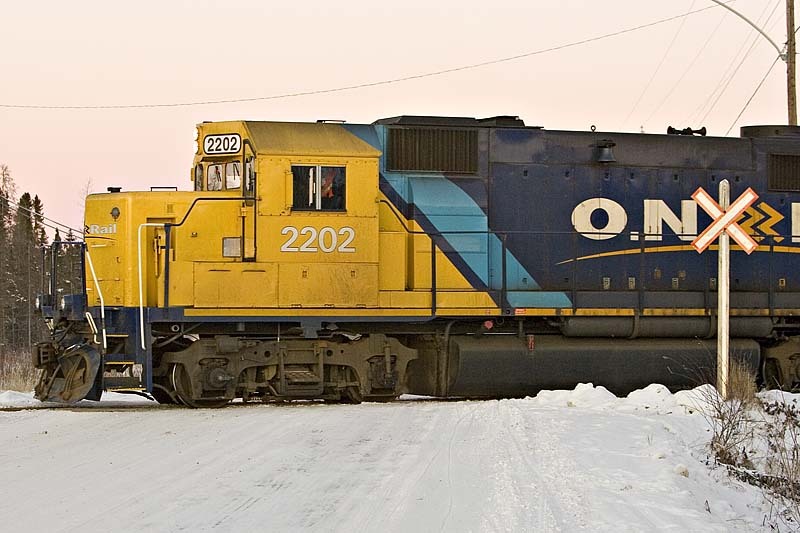 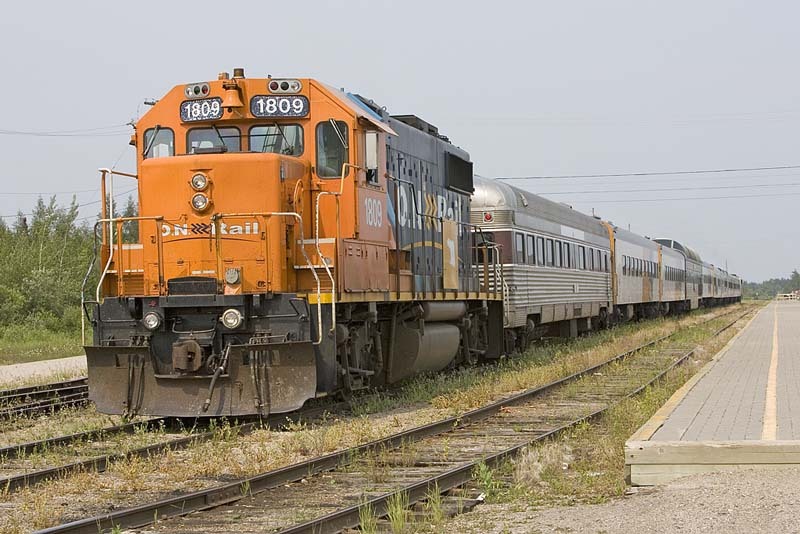 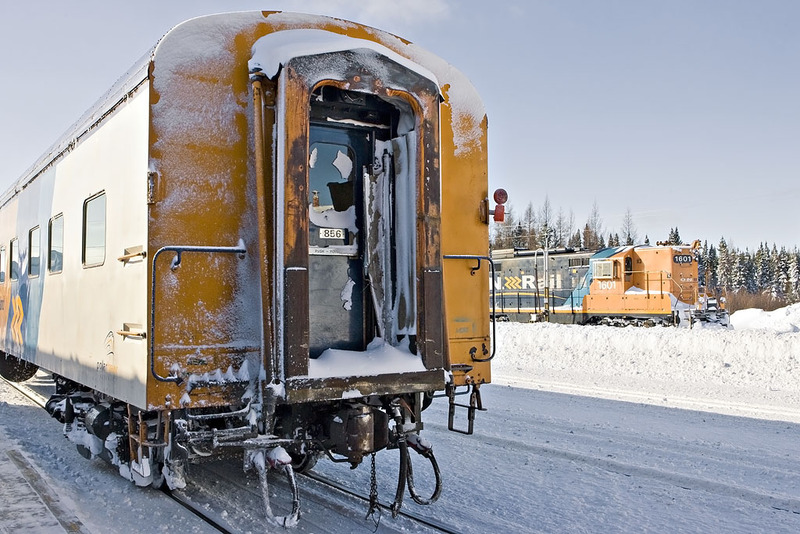 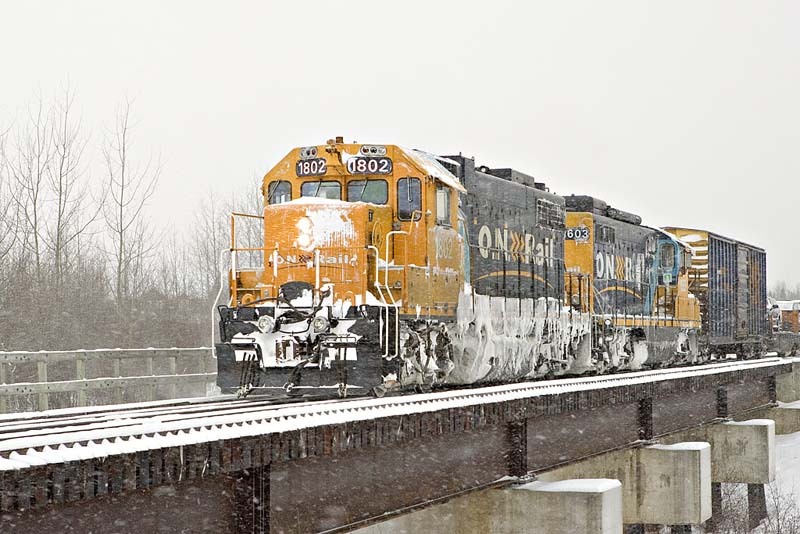 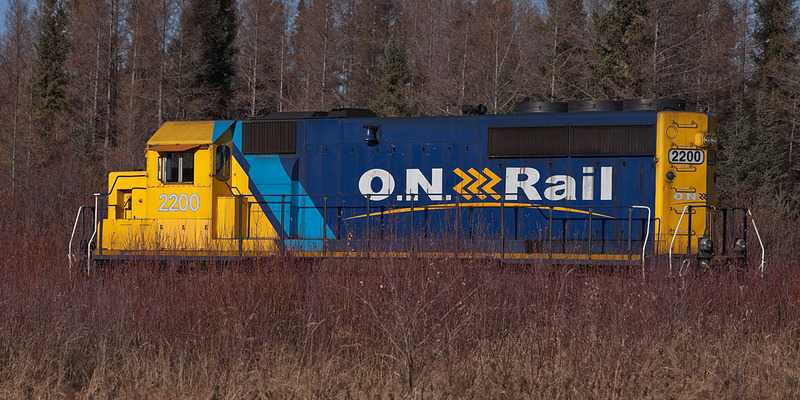 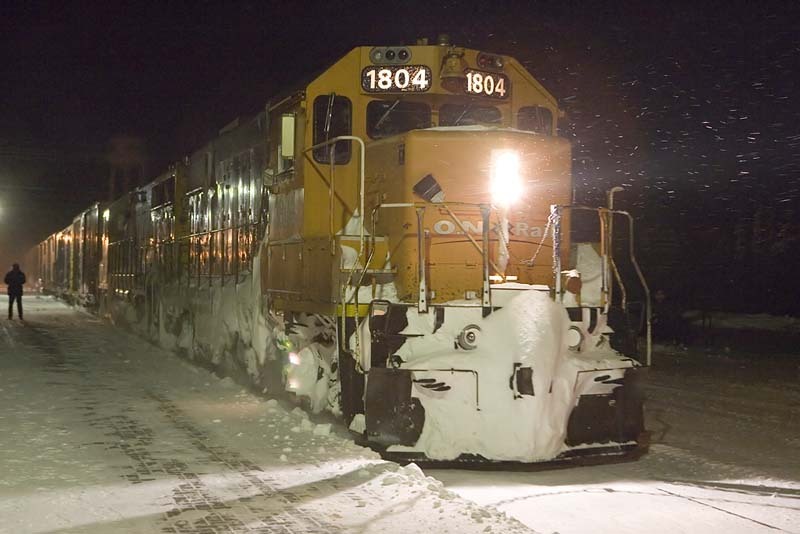 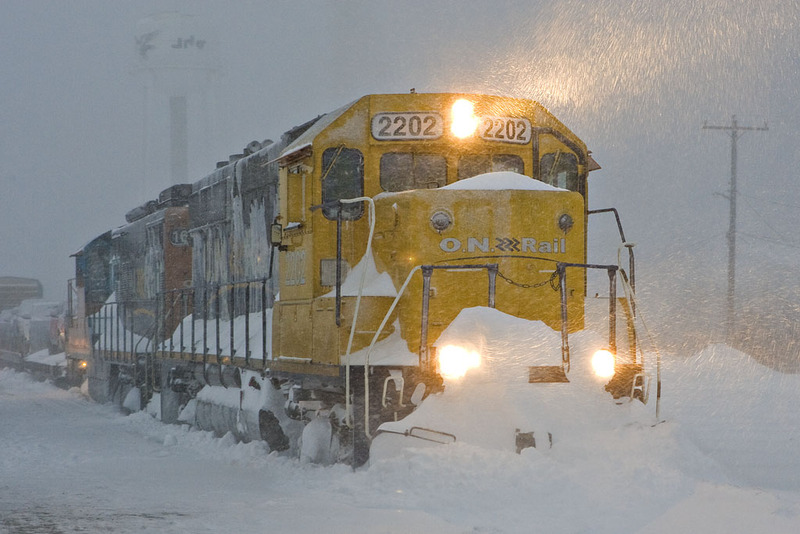 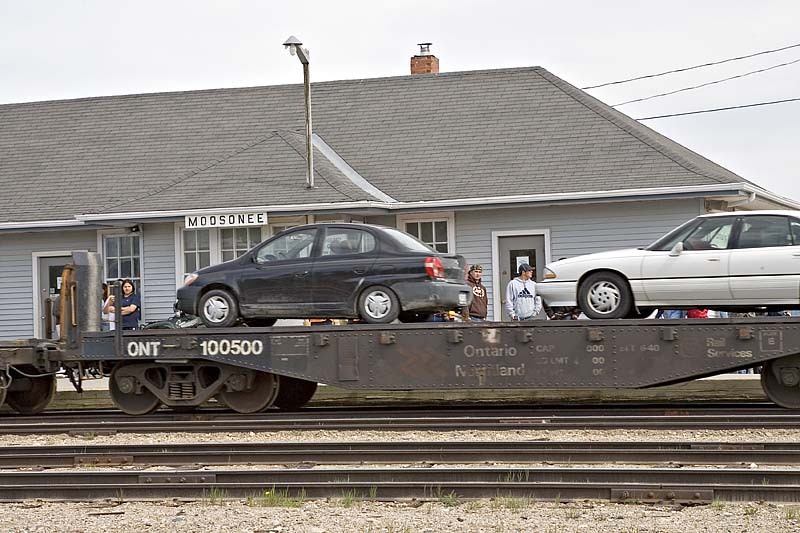 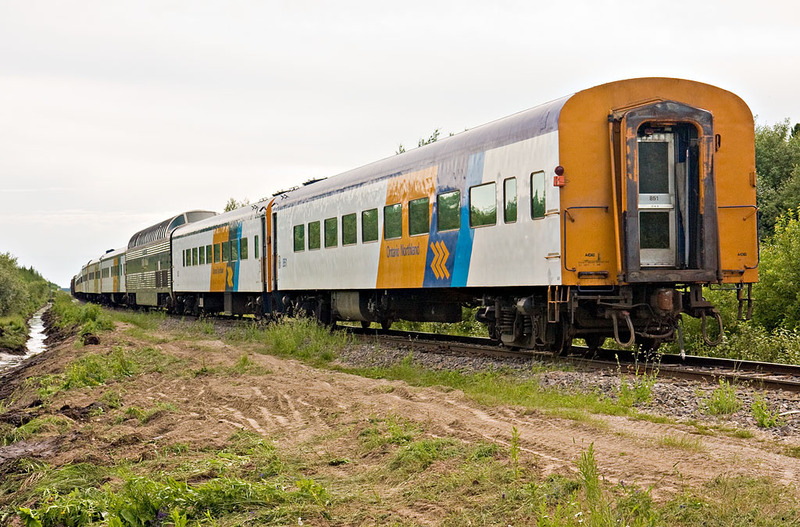 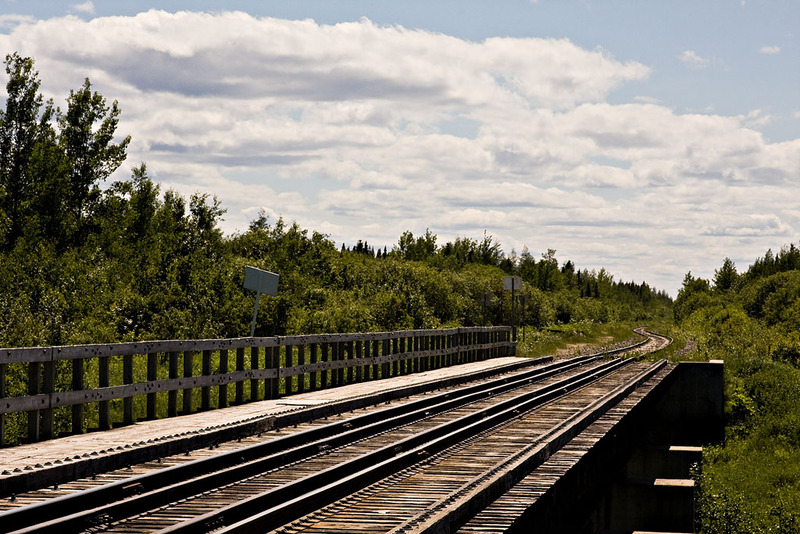 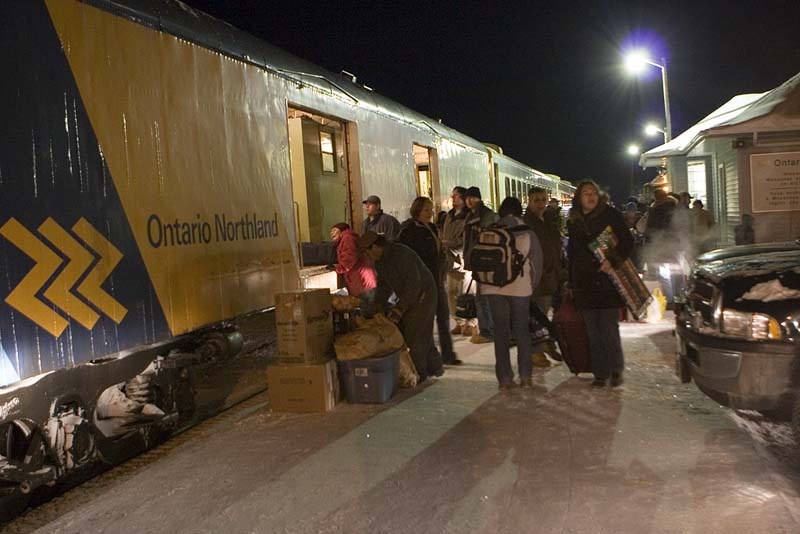 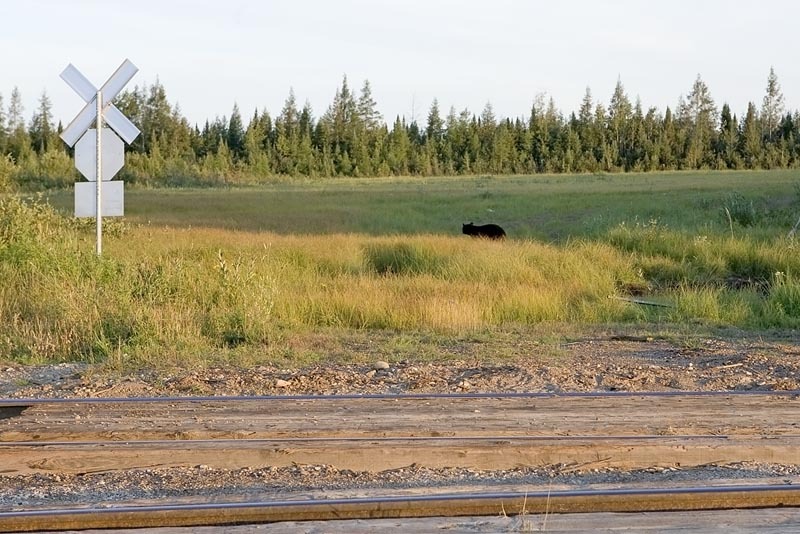 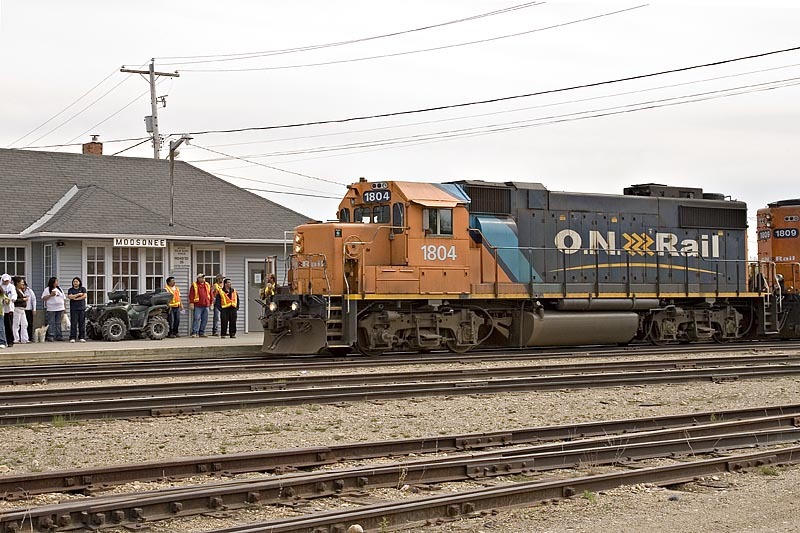 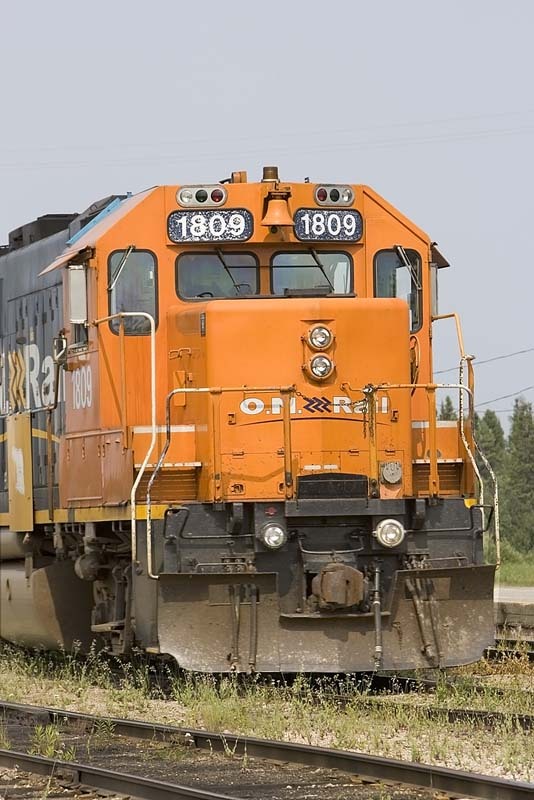 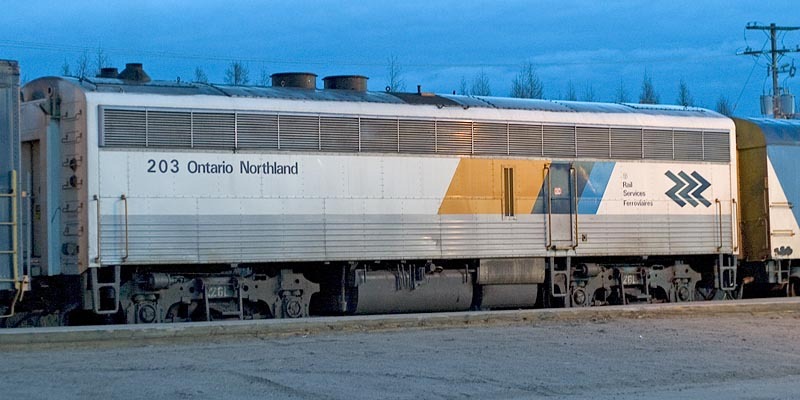 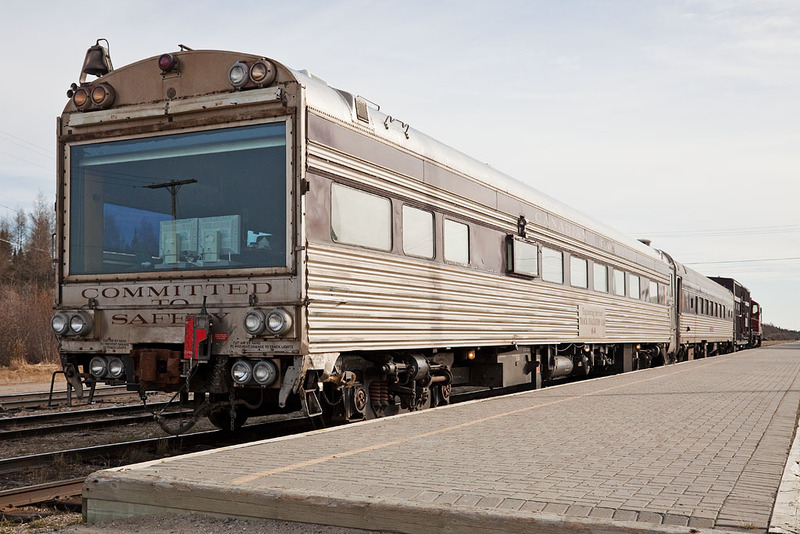 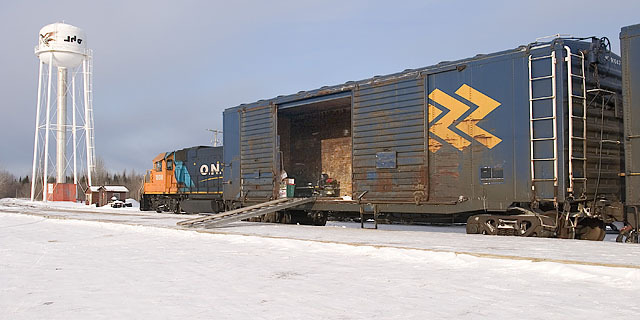 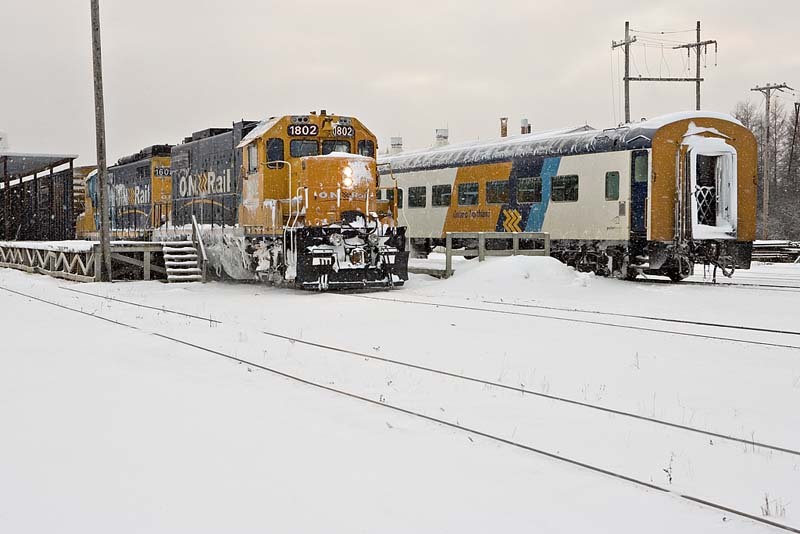 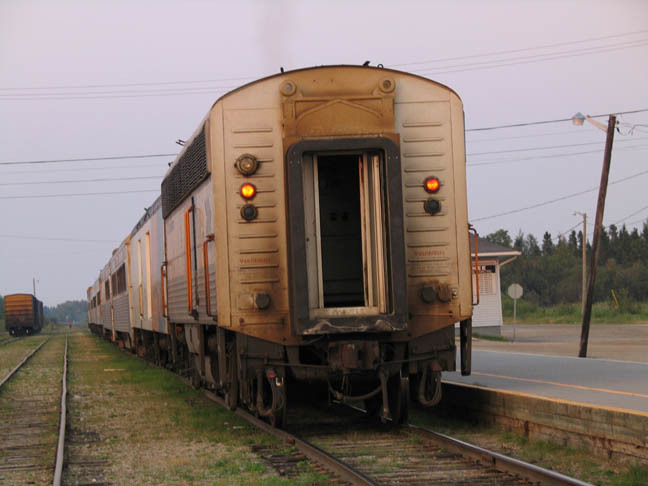 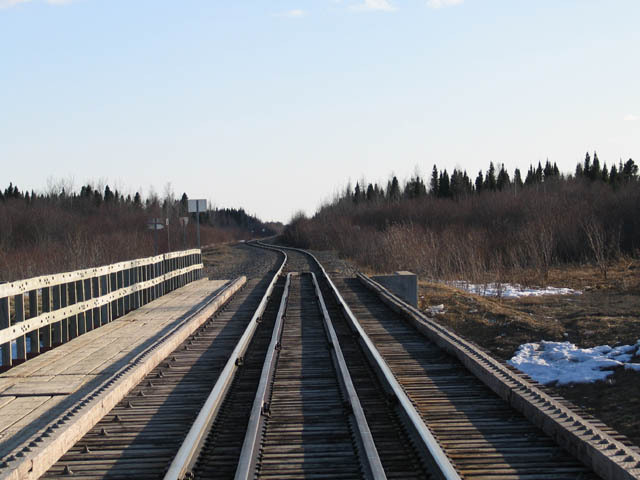 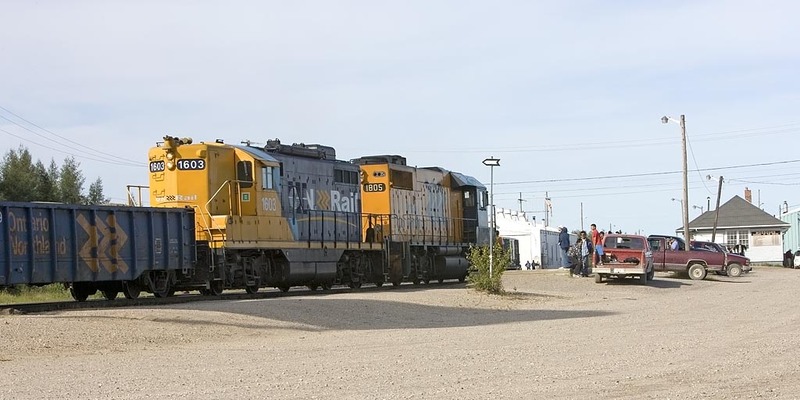 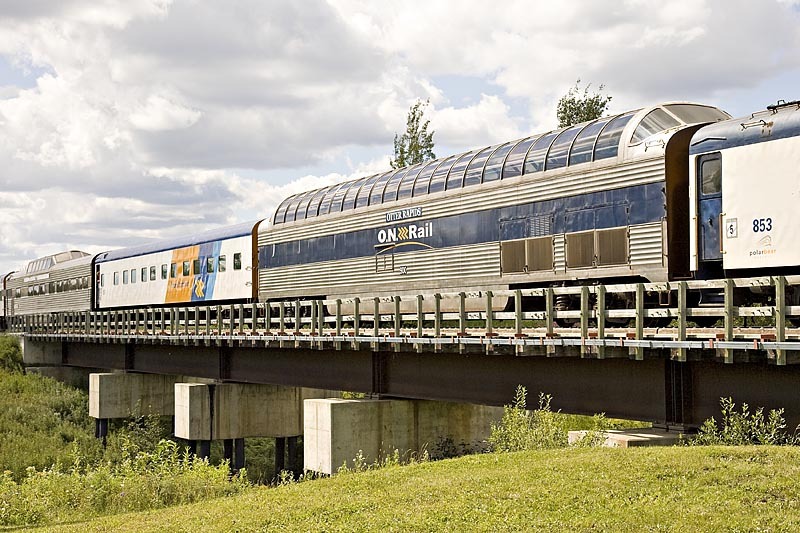 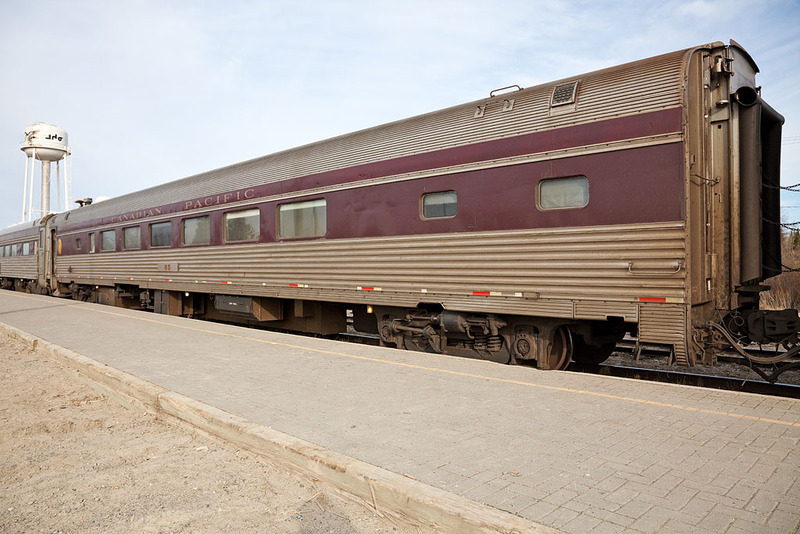 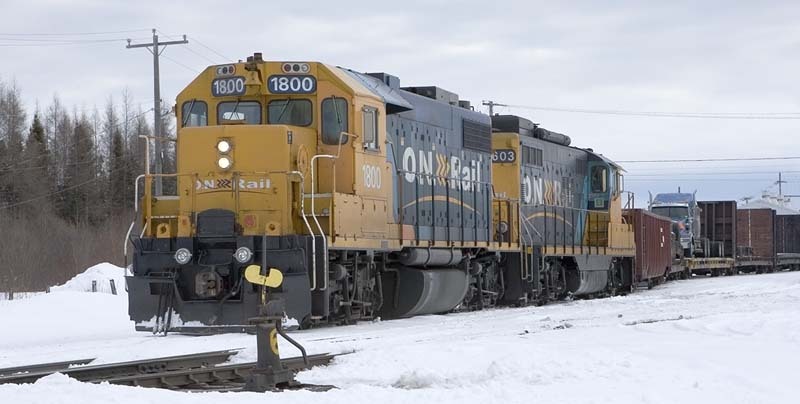 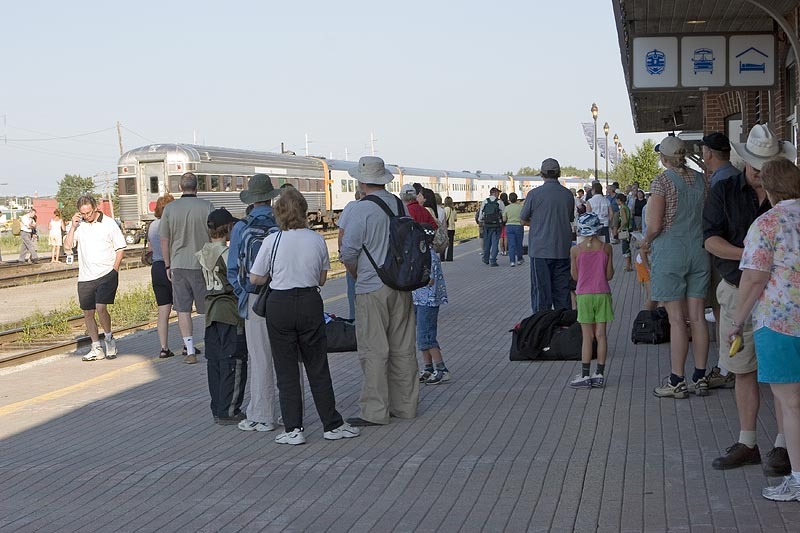 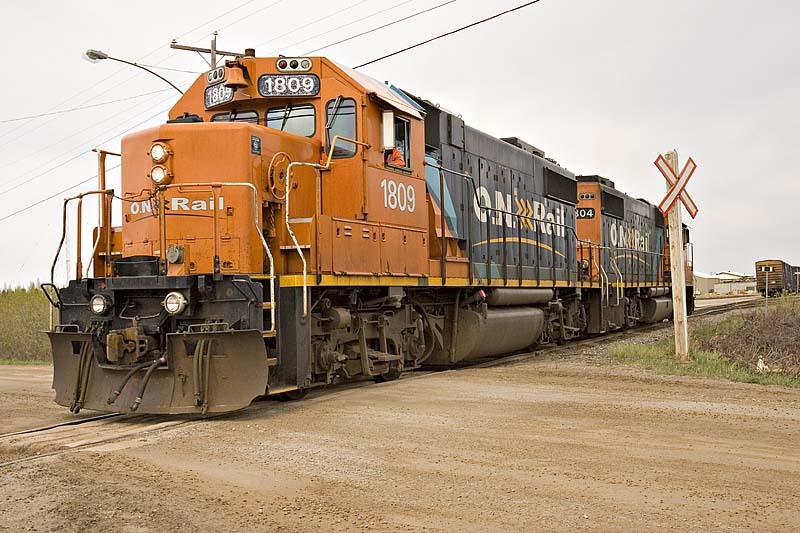 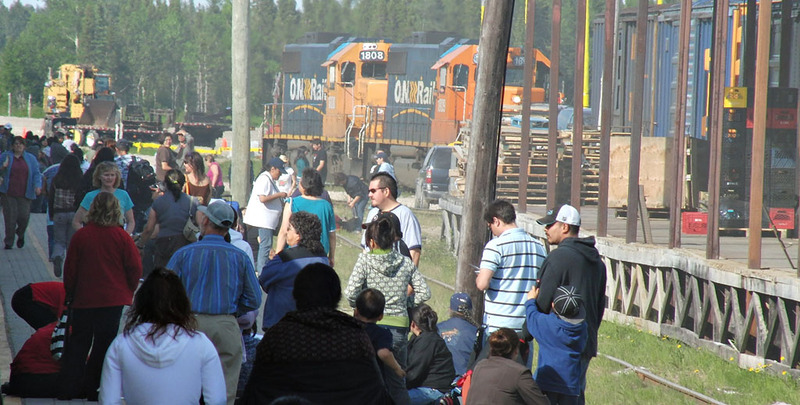 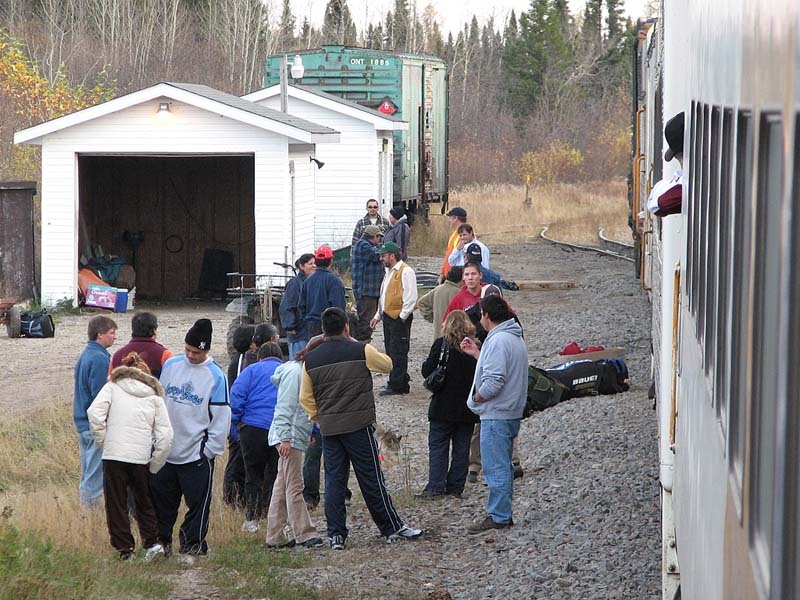 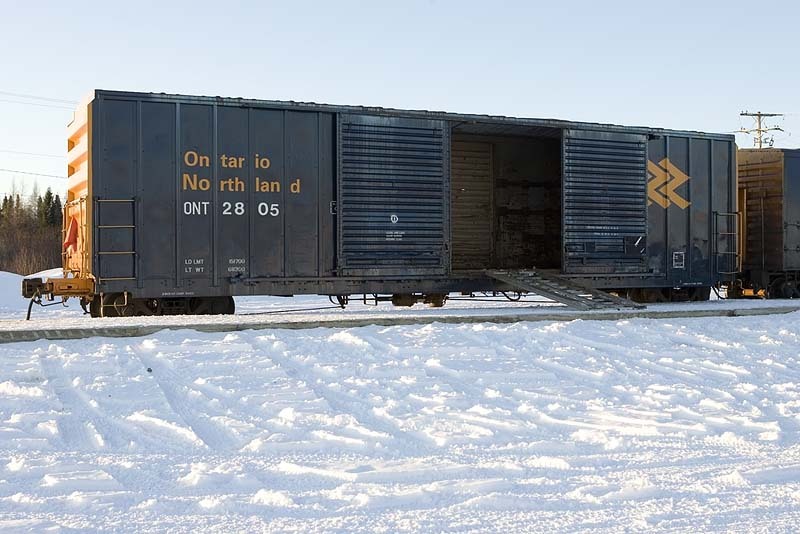 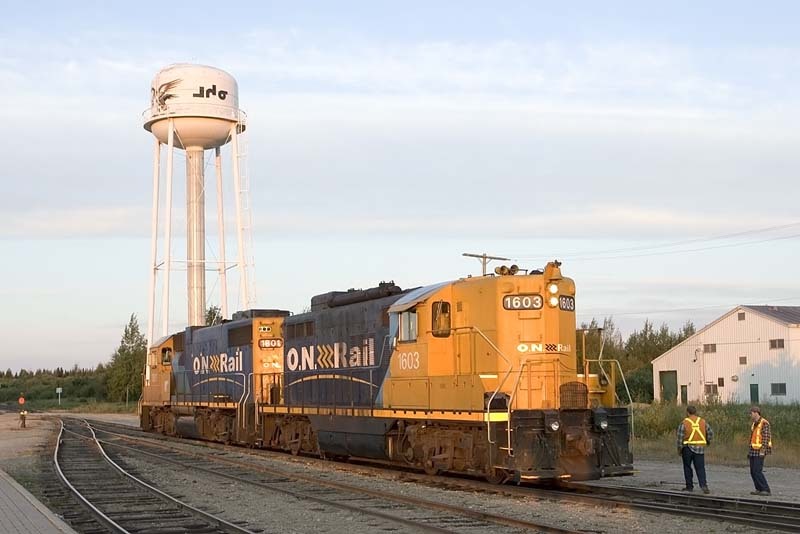 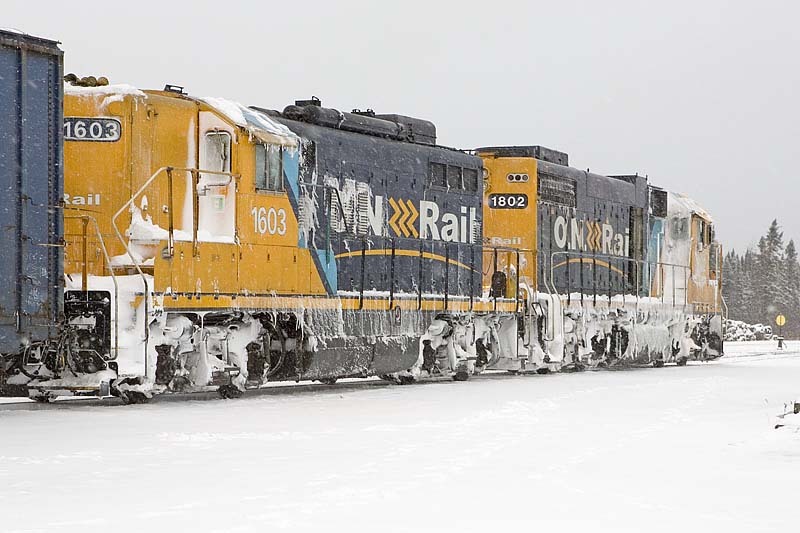 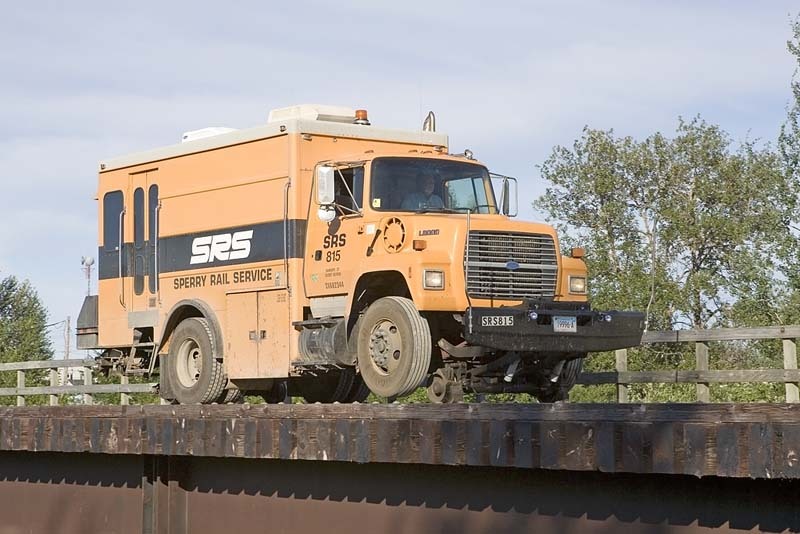 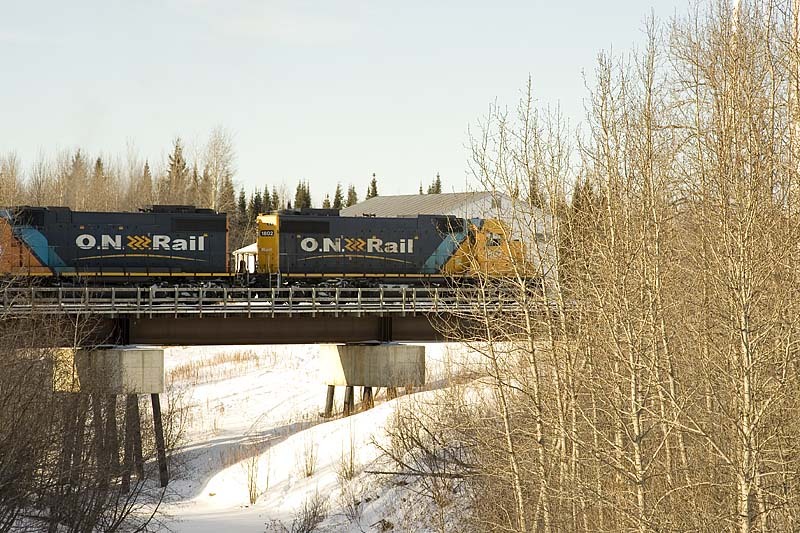 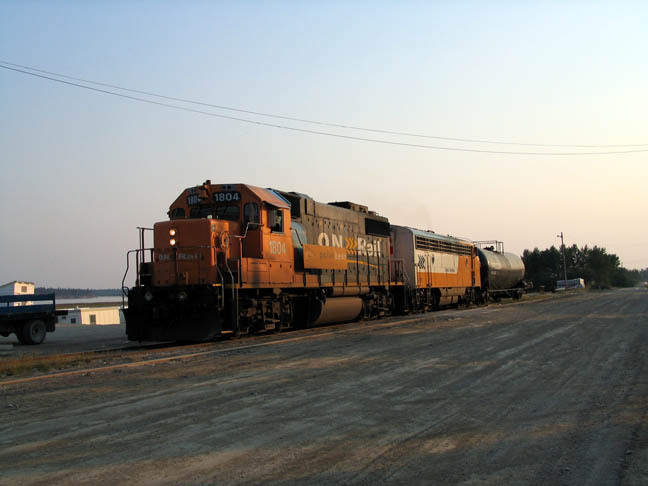 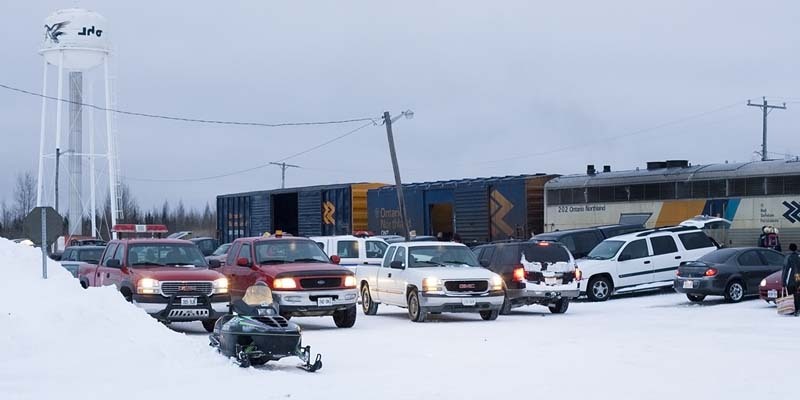 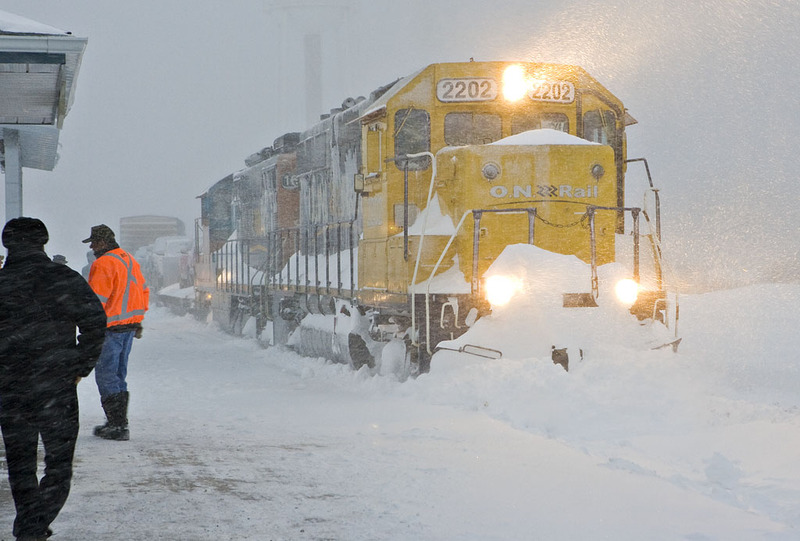 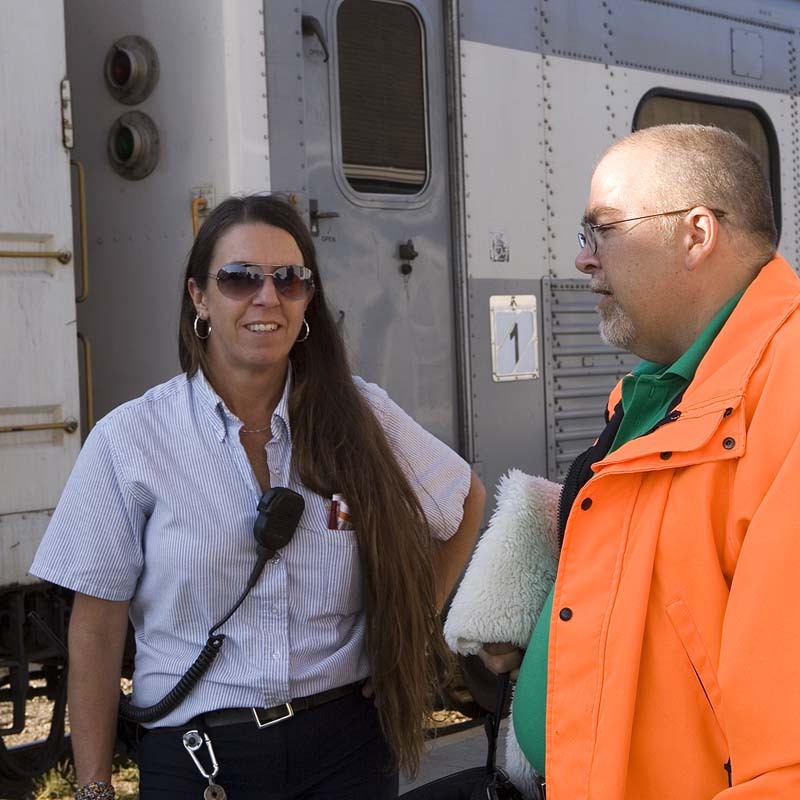 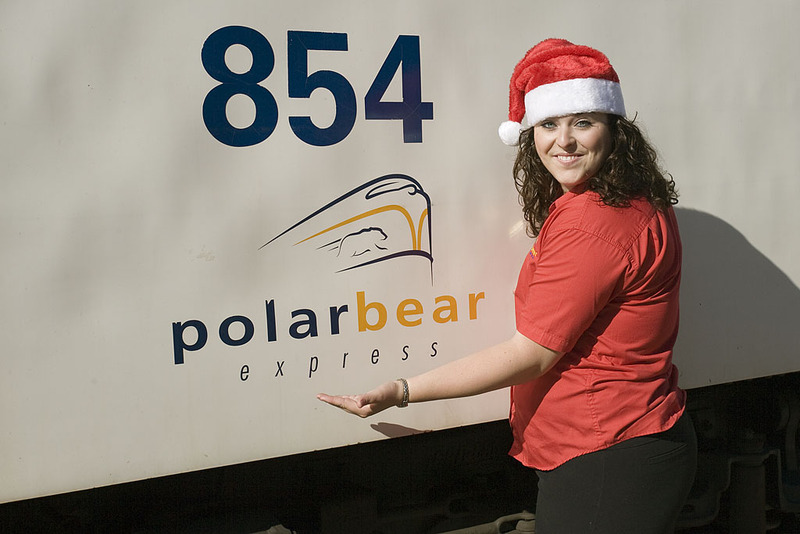 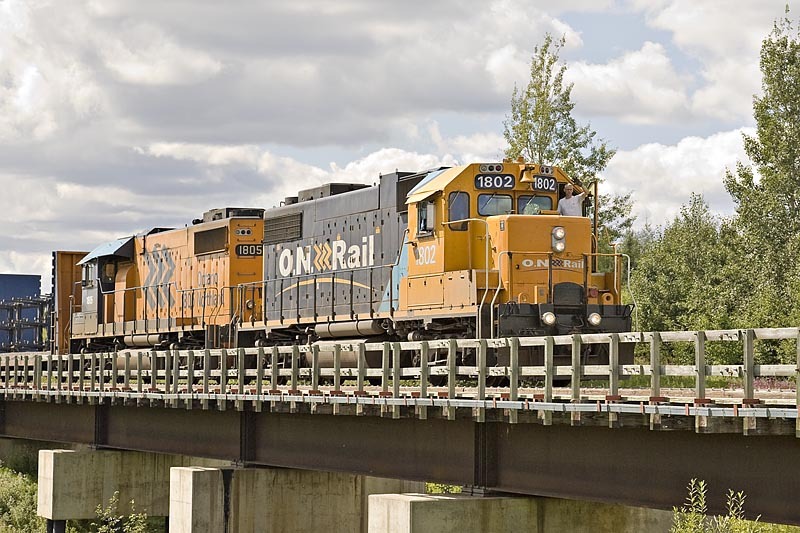 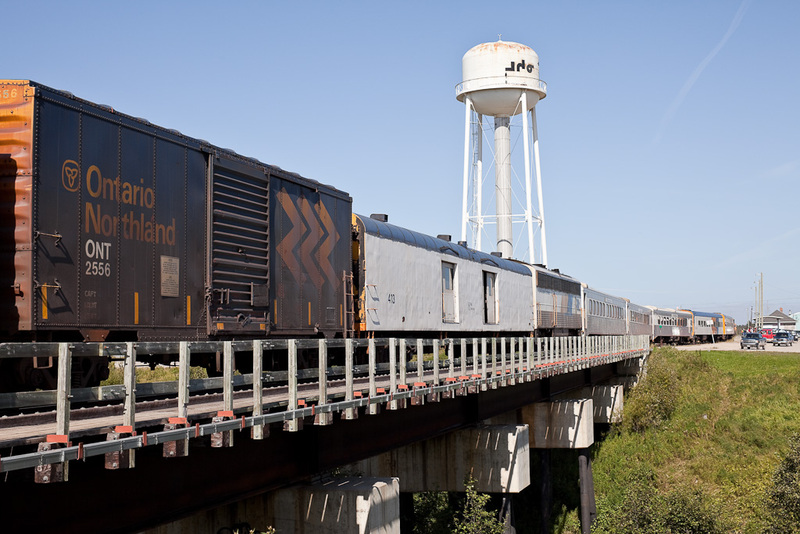 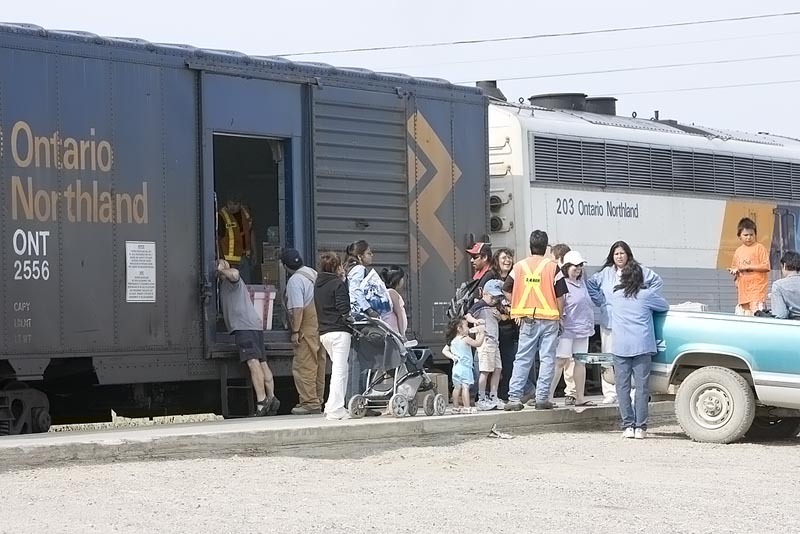 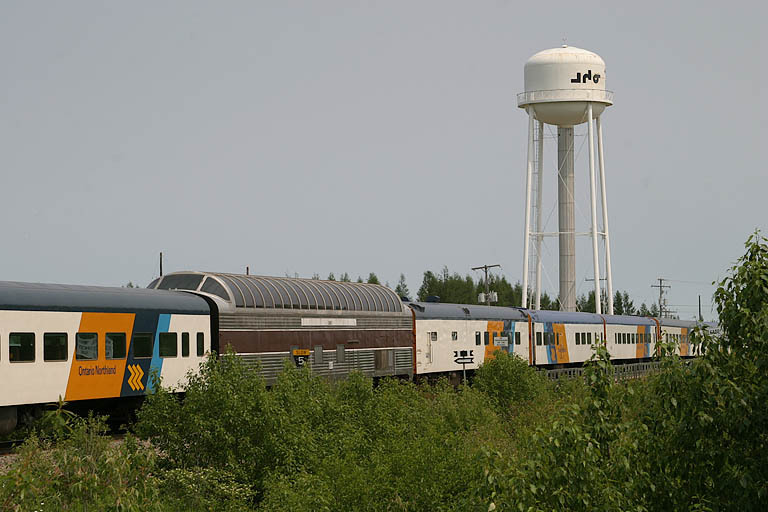 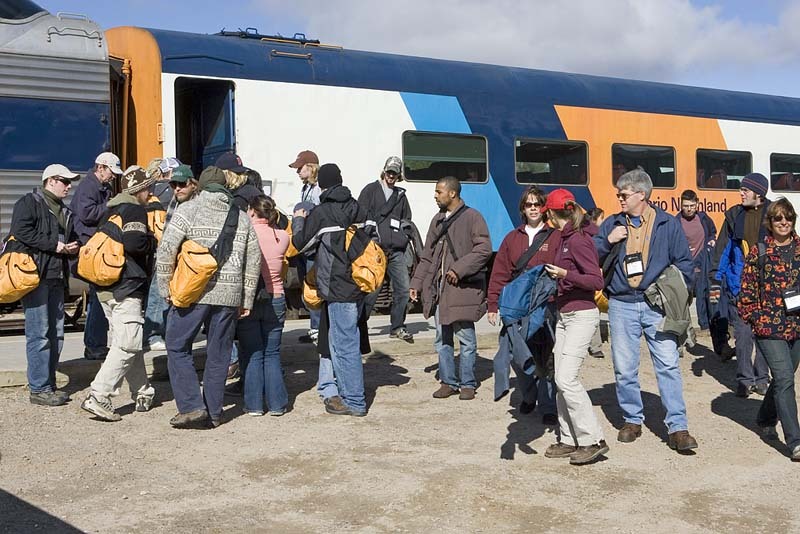 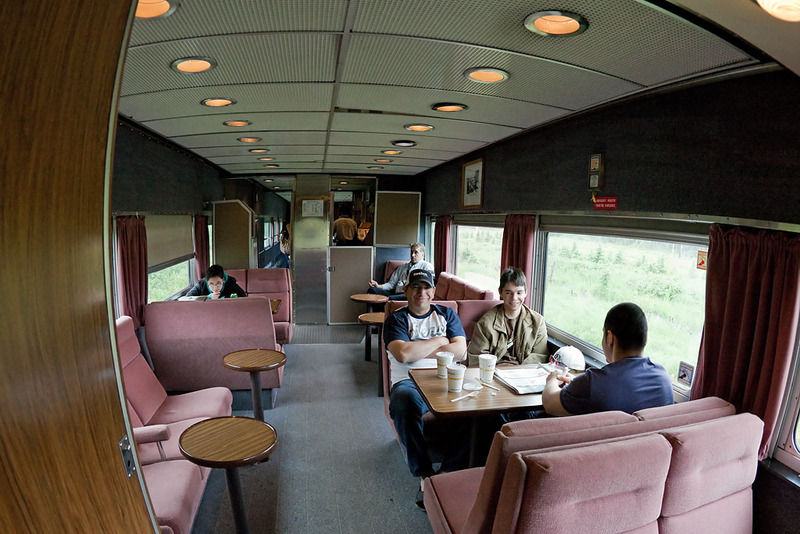 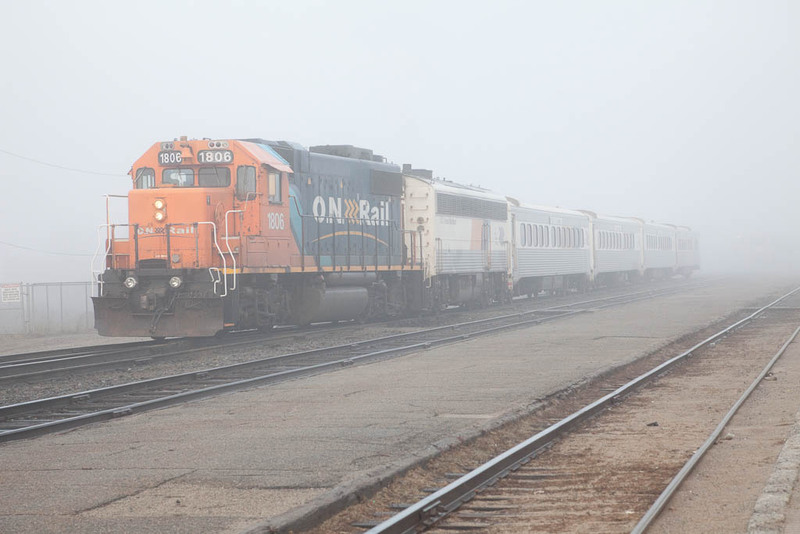 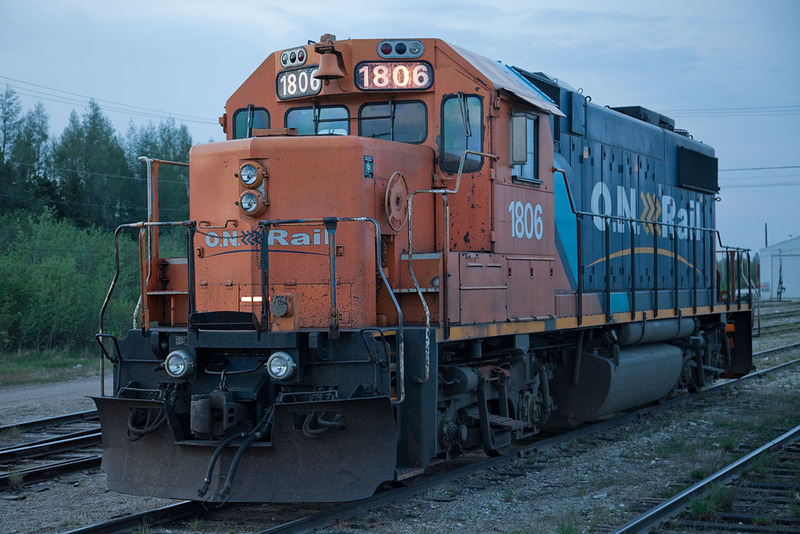 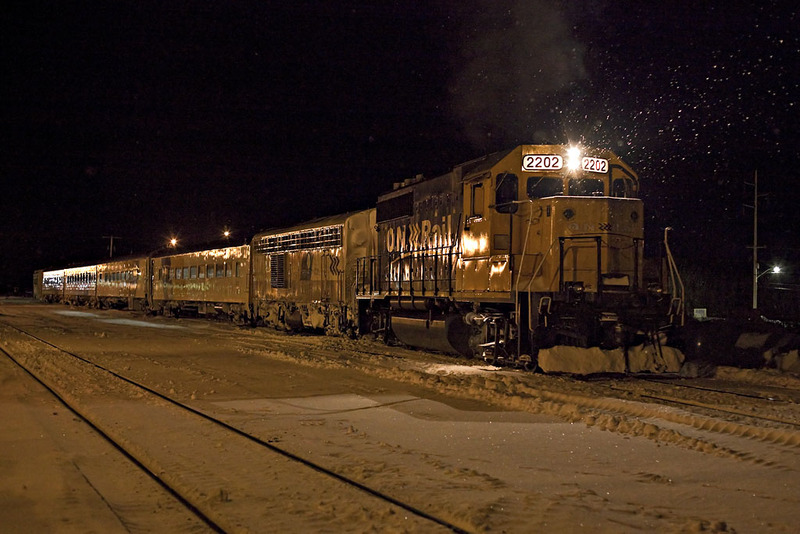 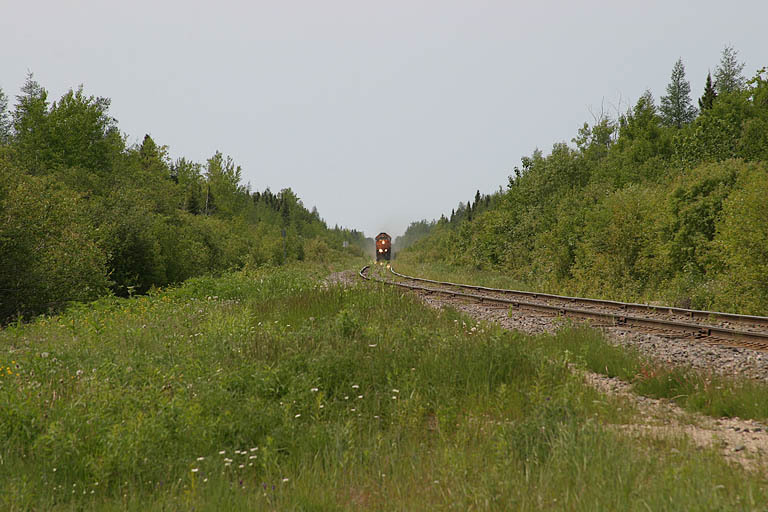 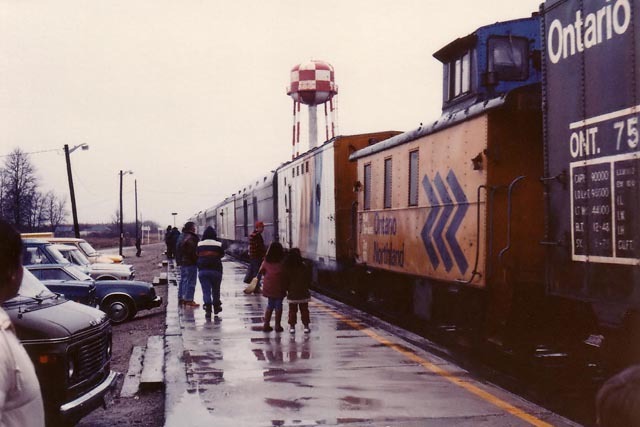 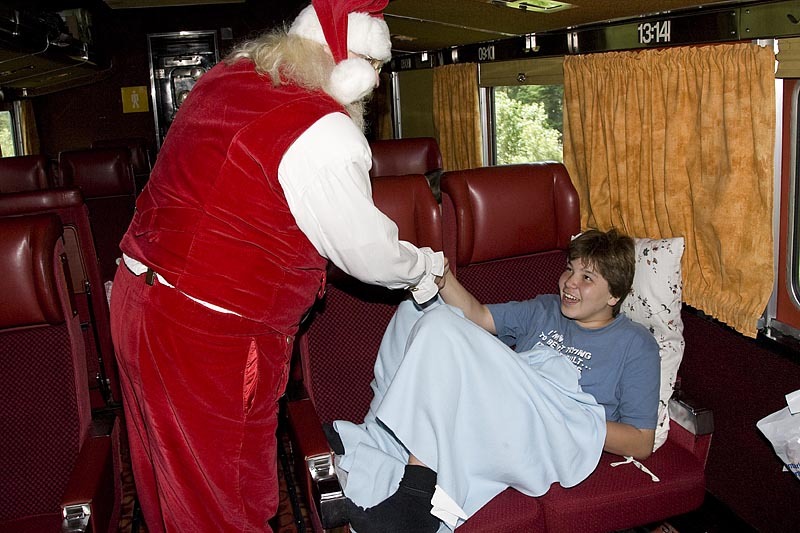 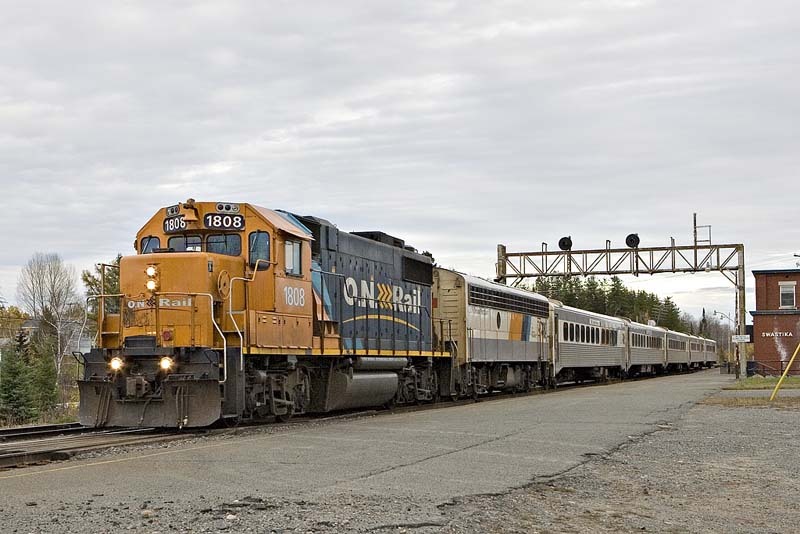 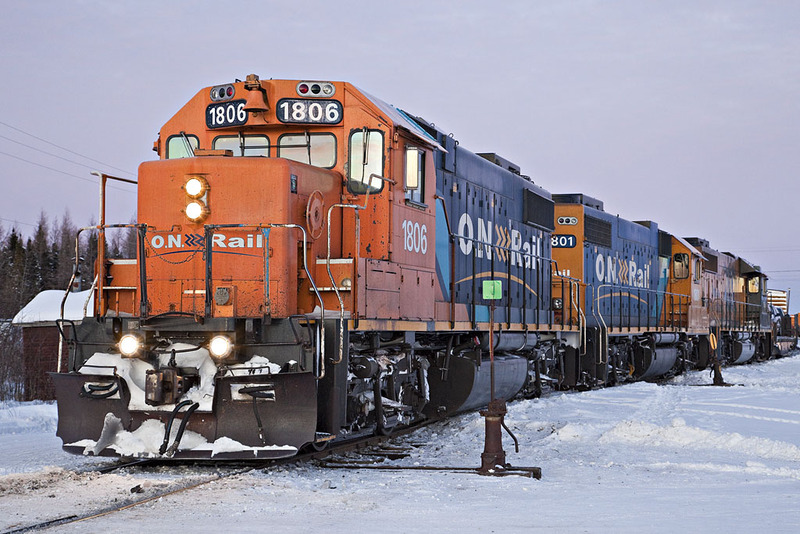 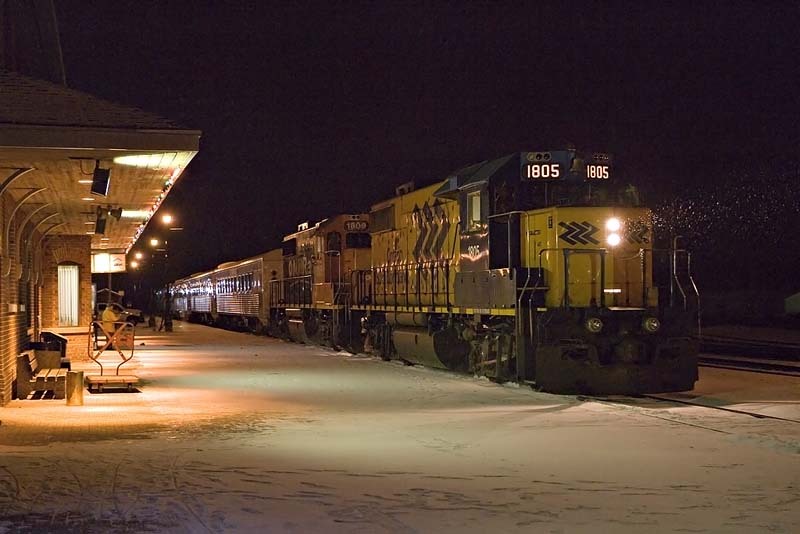 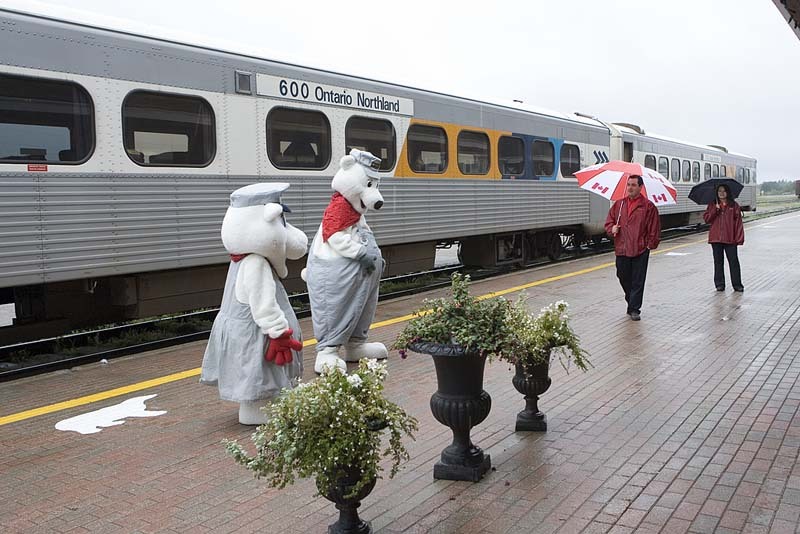 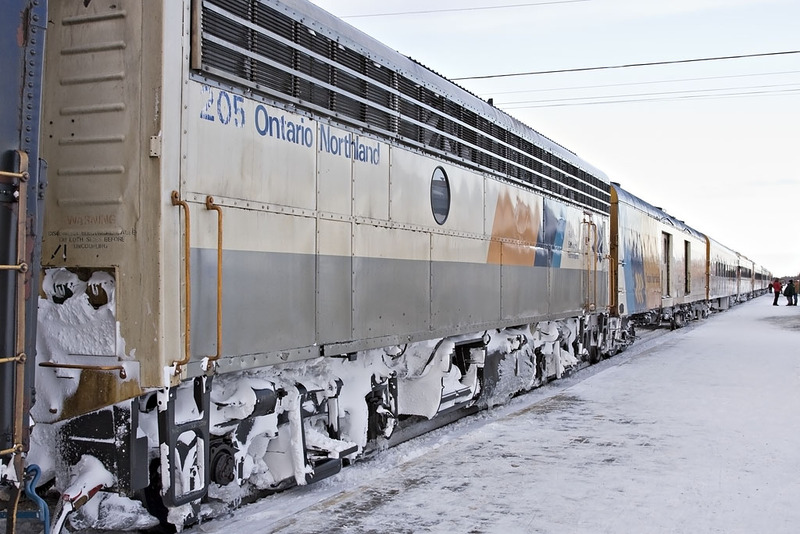 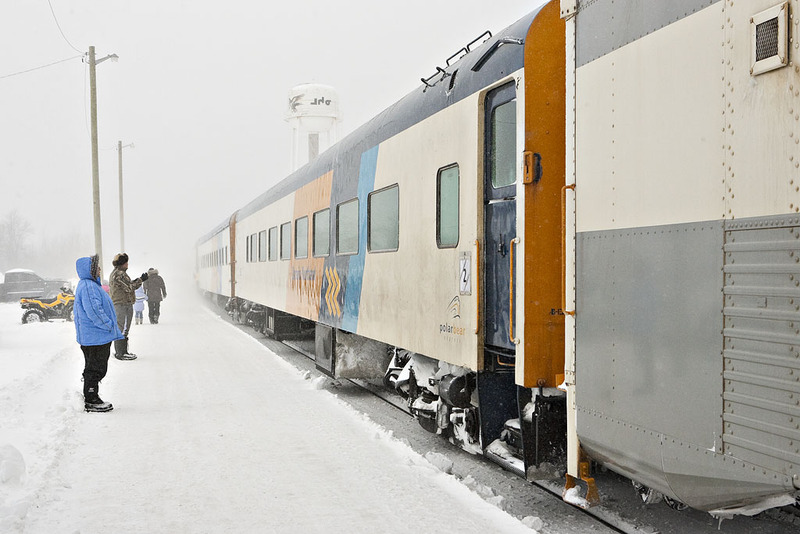 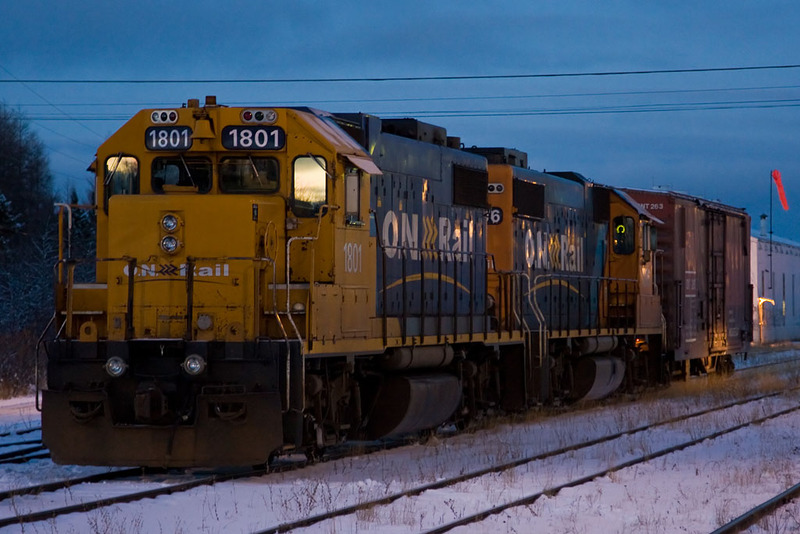 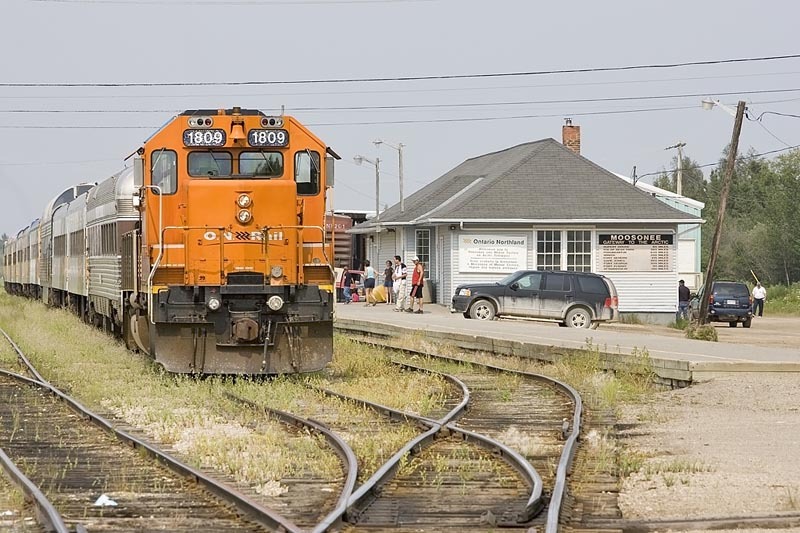 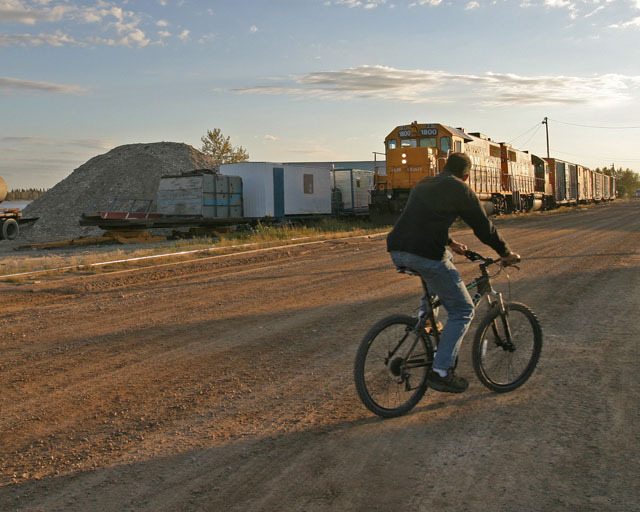 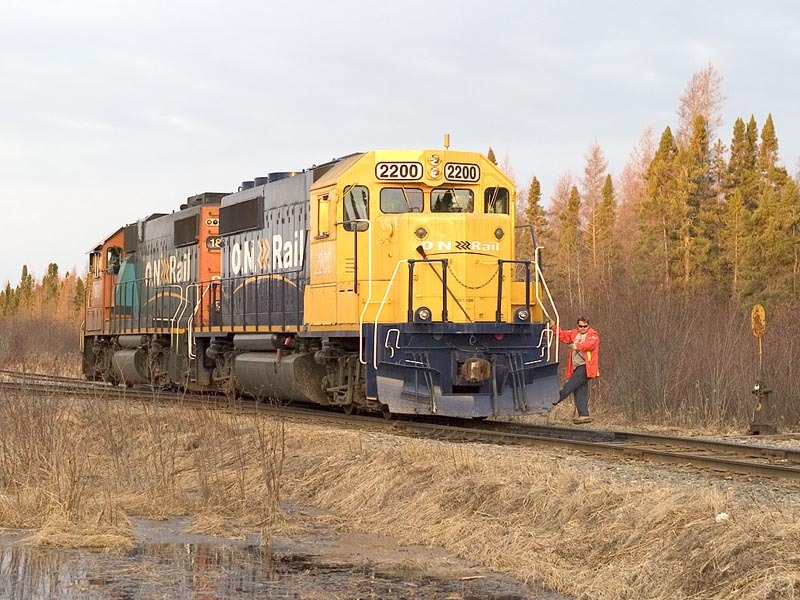 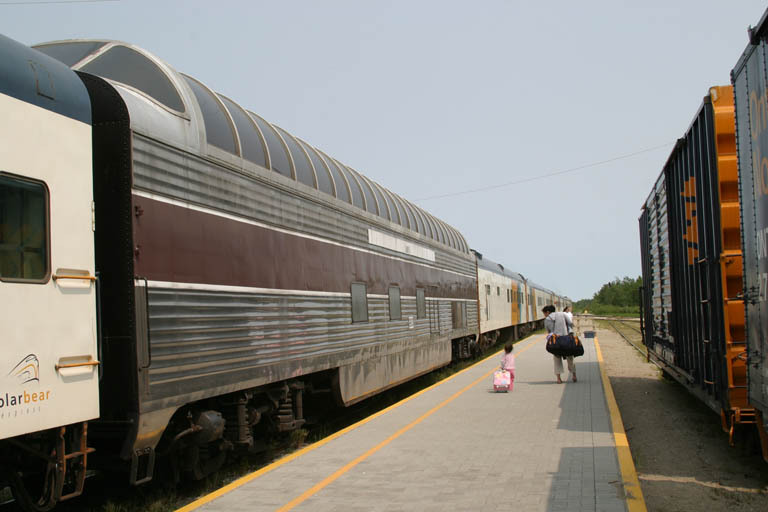 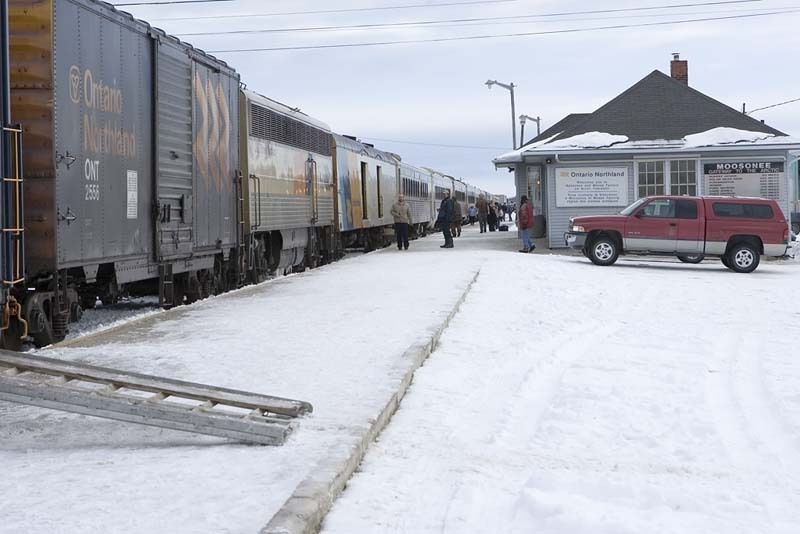 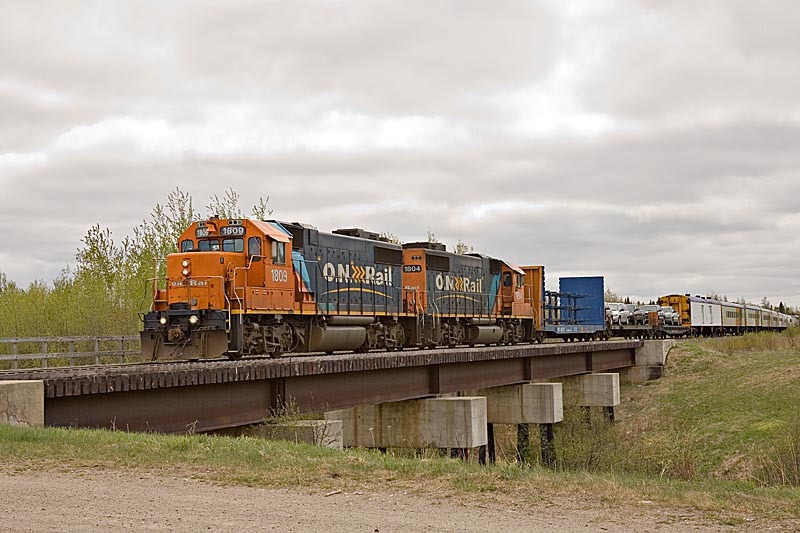 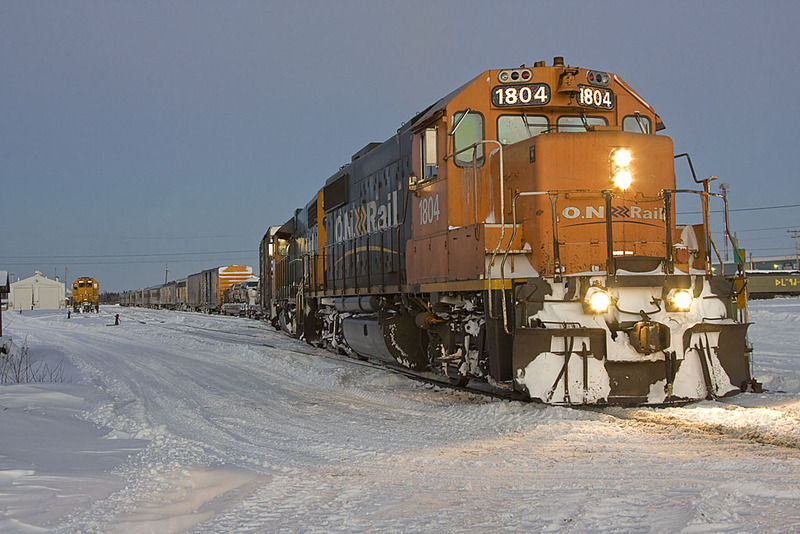 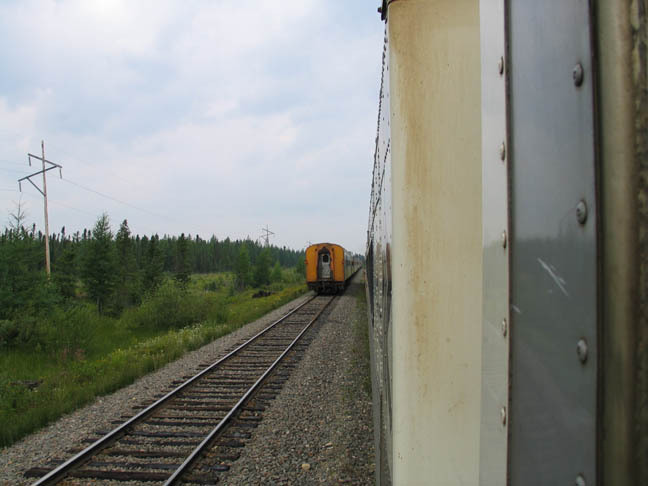 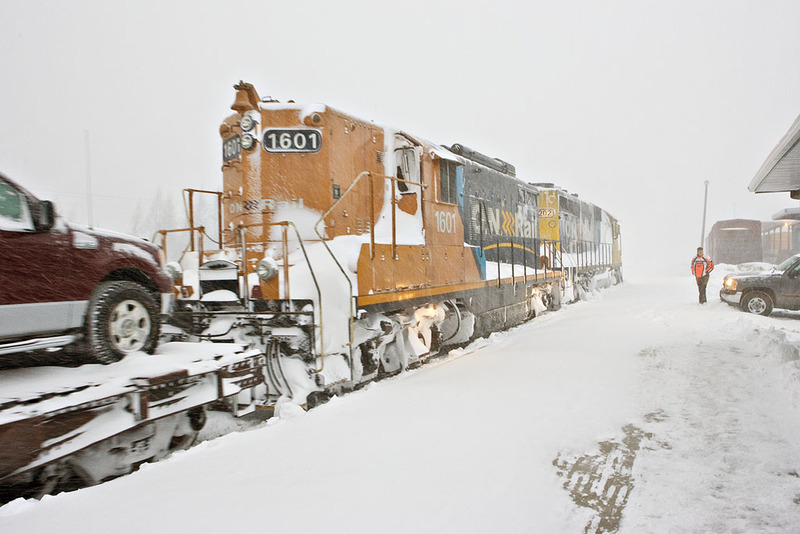 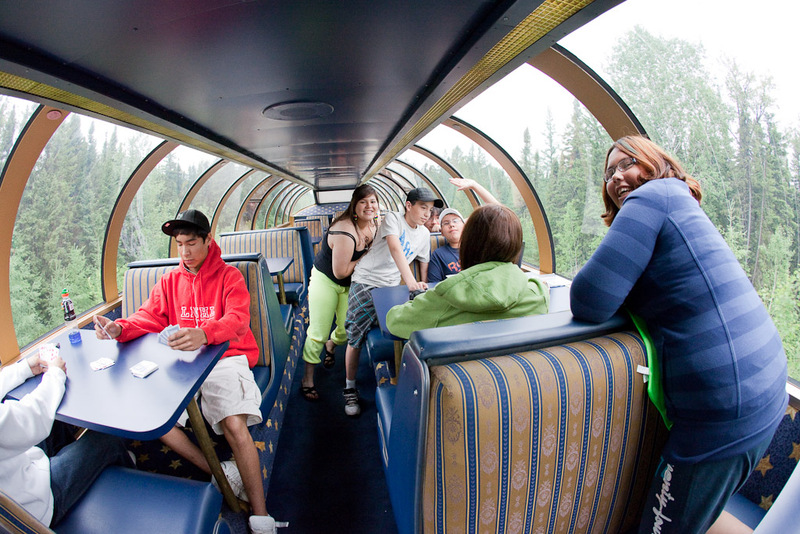 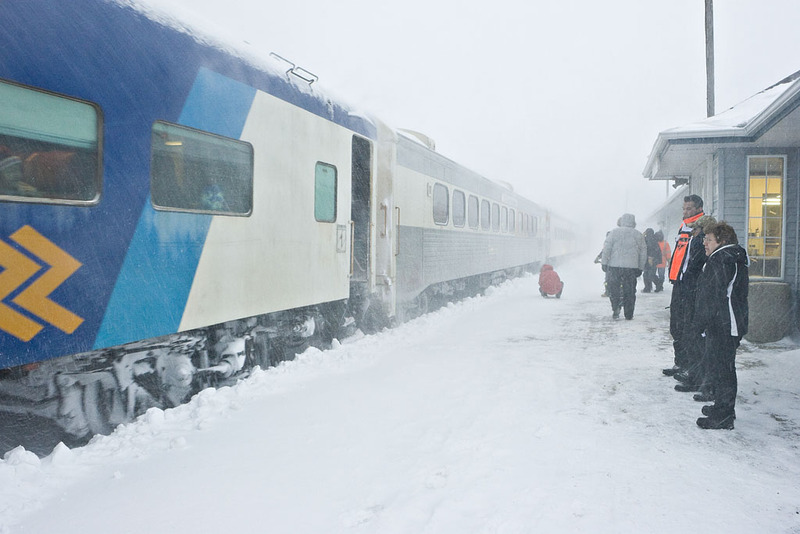 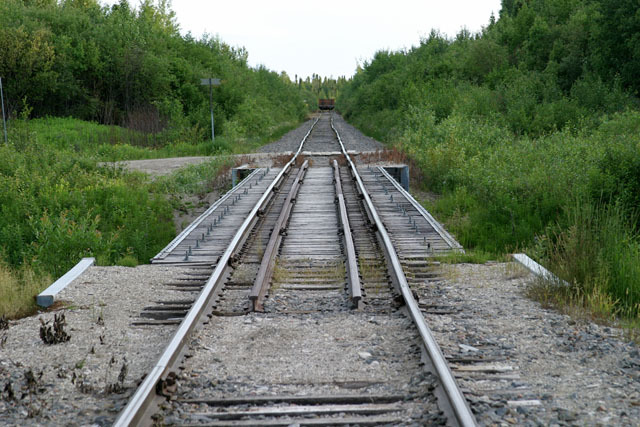 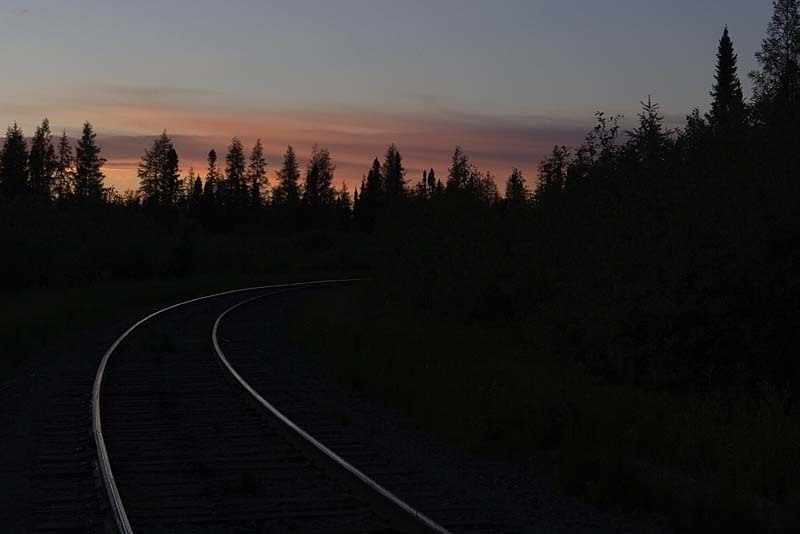 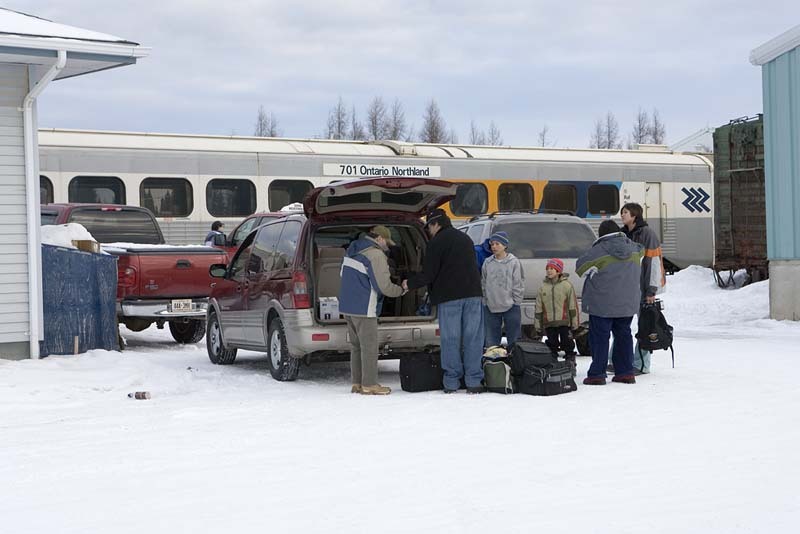 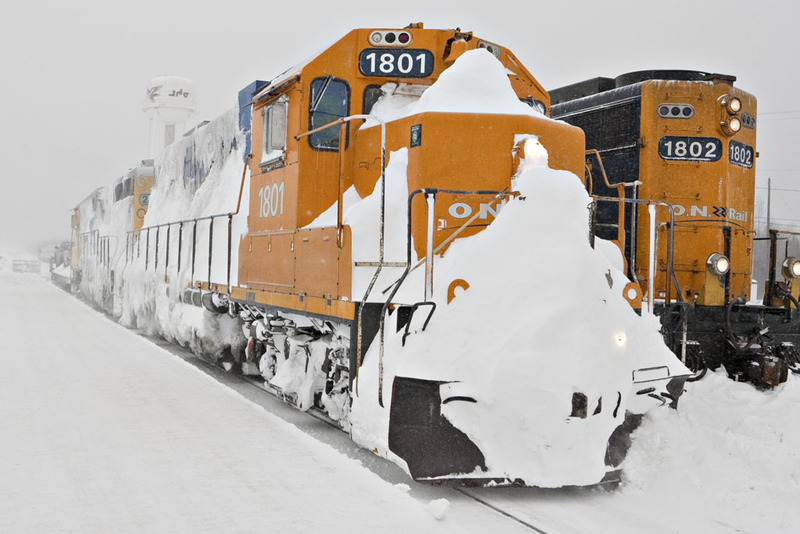 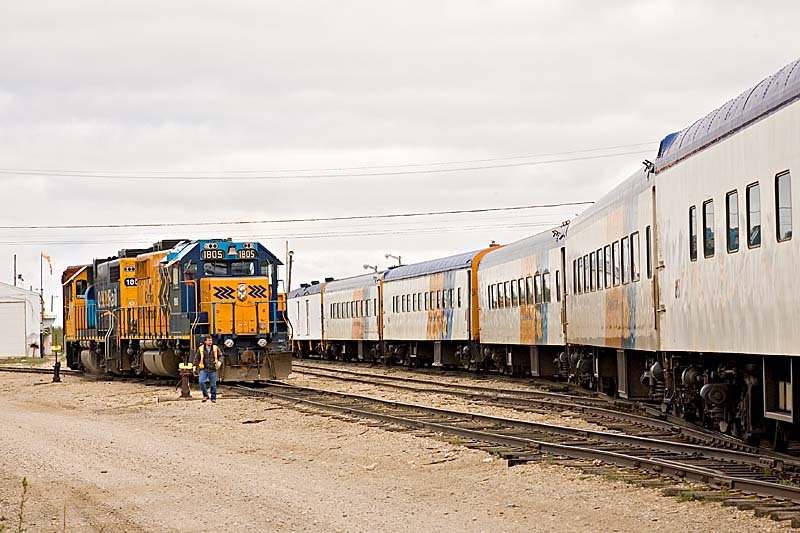 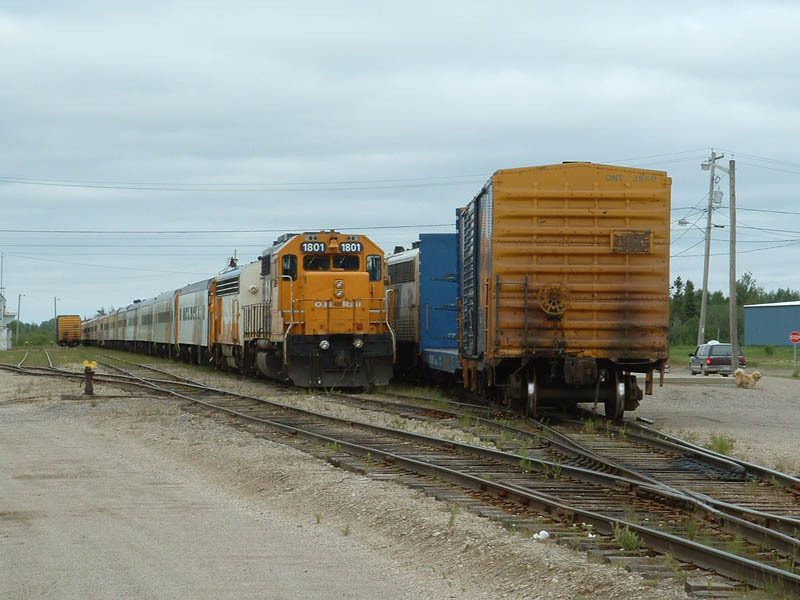 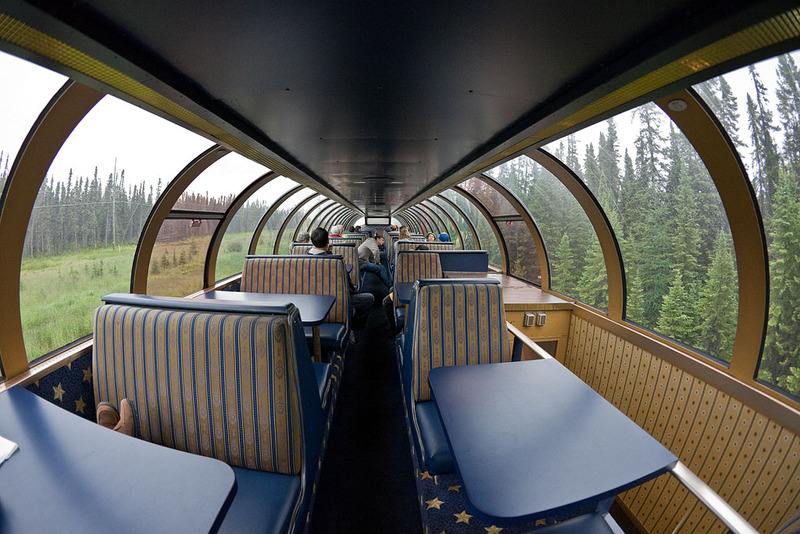 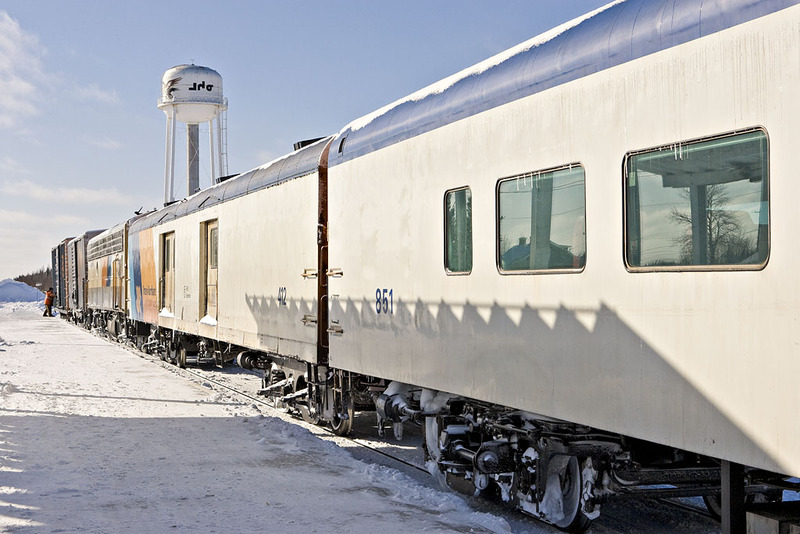 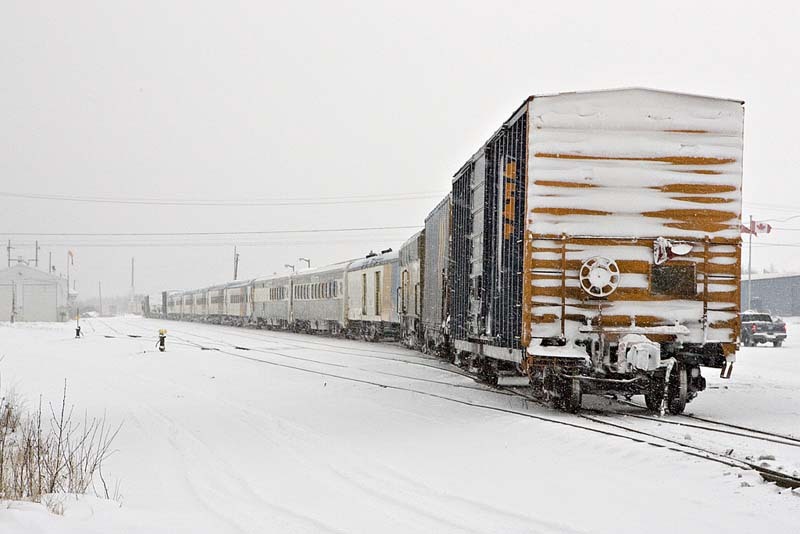 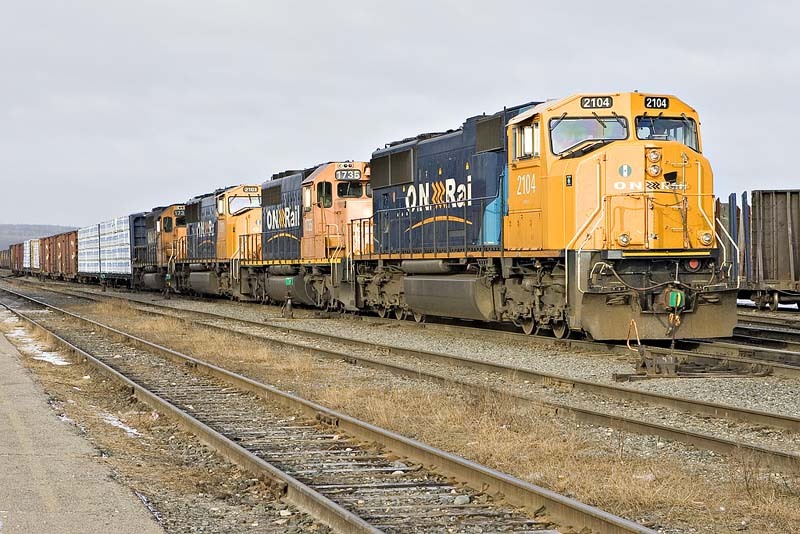 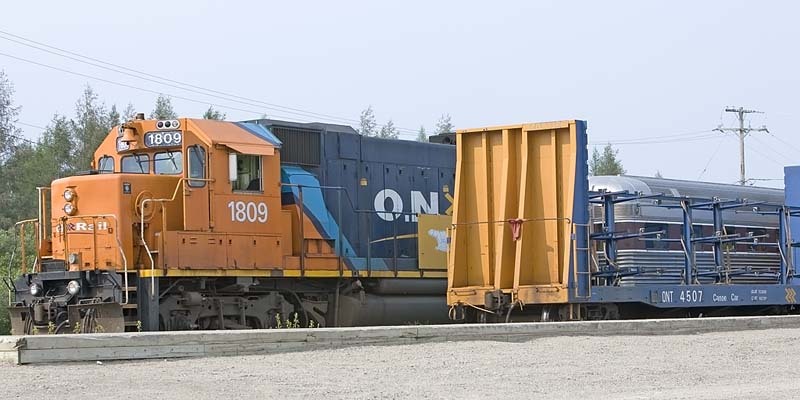 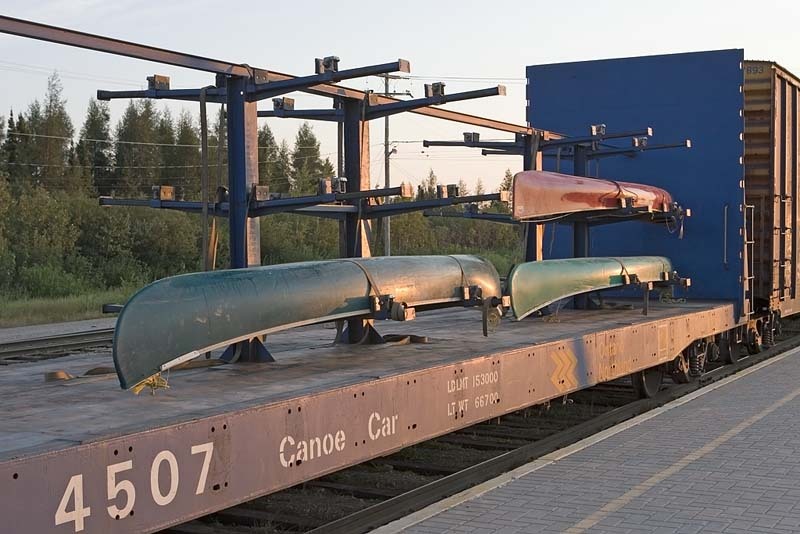 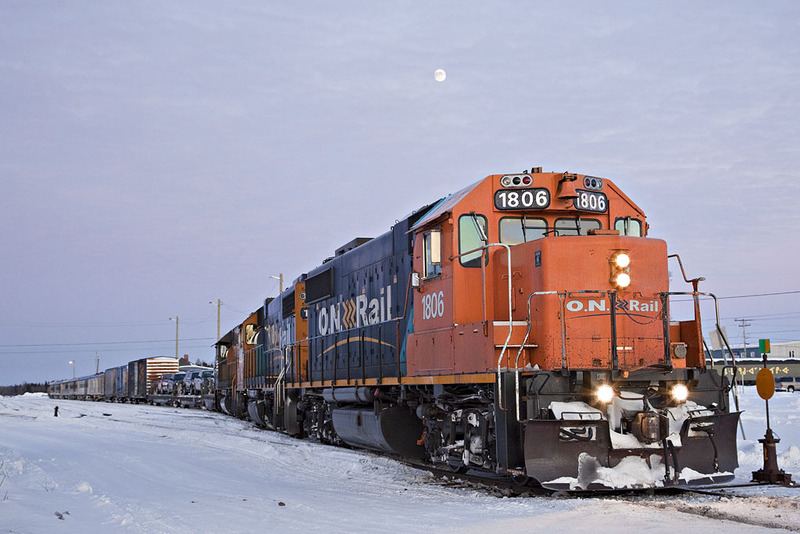 Until June 2007 the ONR ran a year round (three days per week) mixed train (Little Bear) which carried both freight and passengers plus the summer time Polar Bear excursion train (six days per week) between Moosonee and Cochrane. 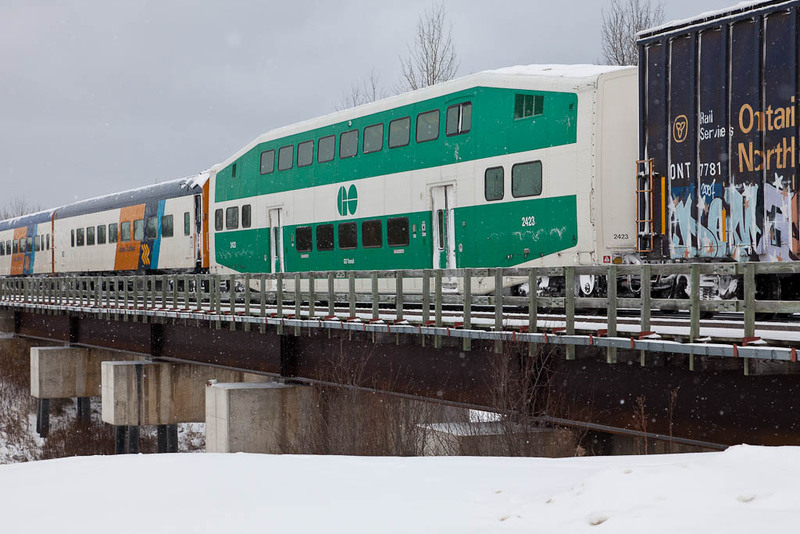 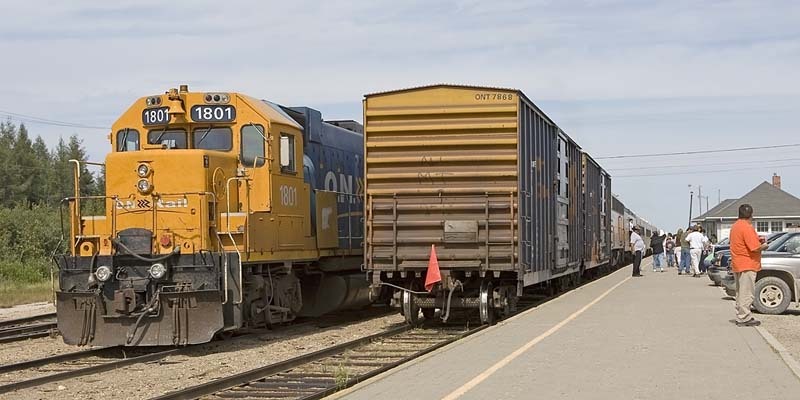 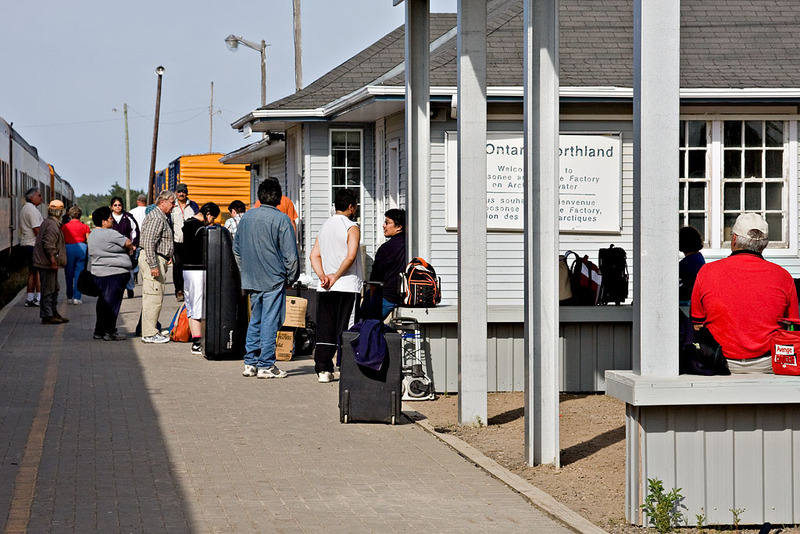 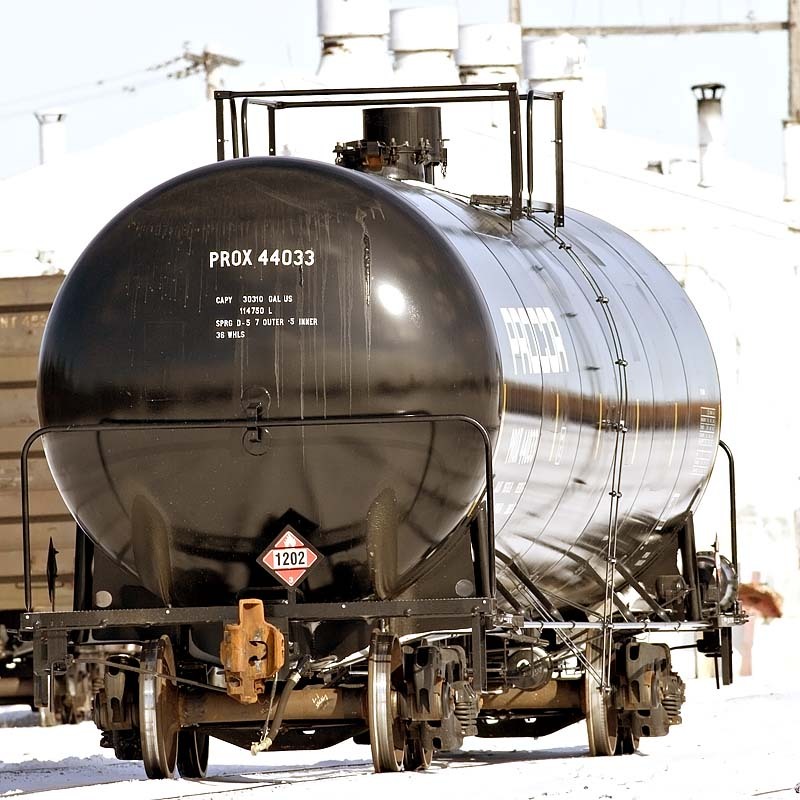 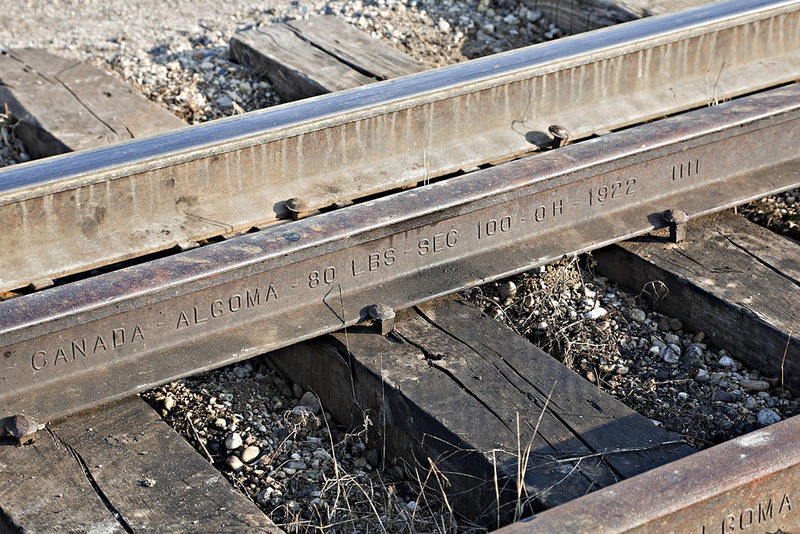 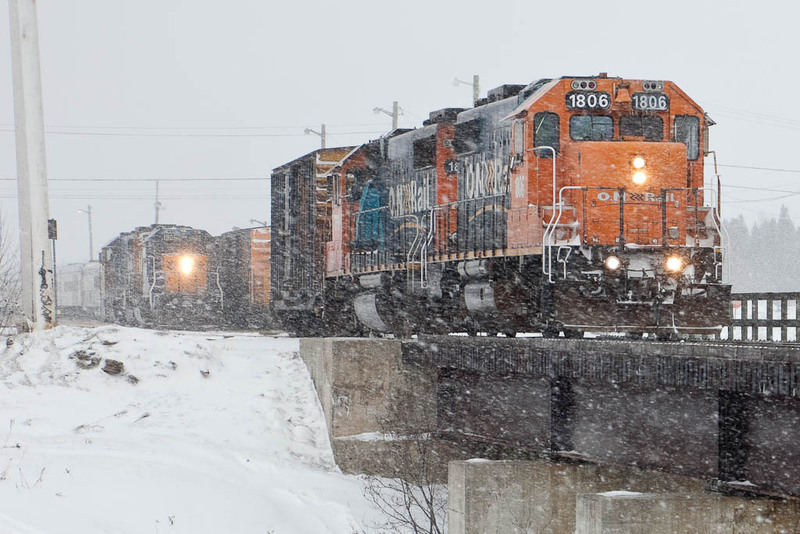 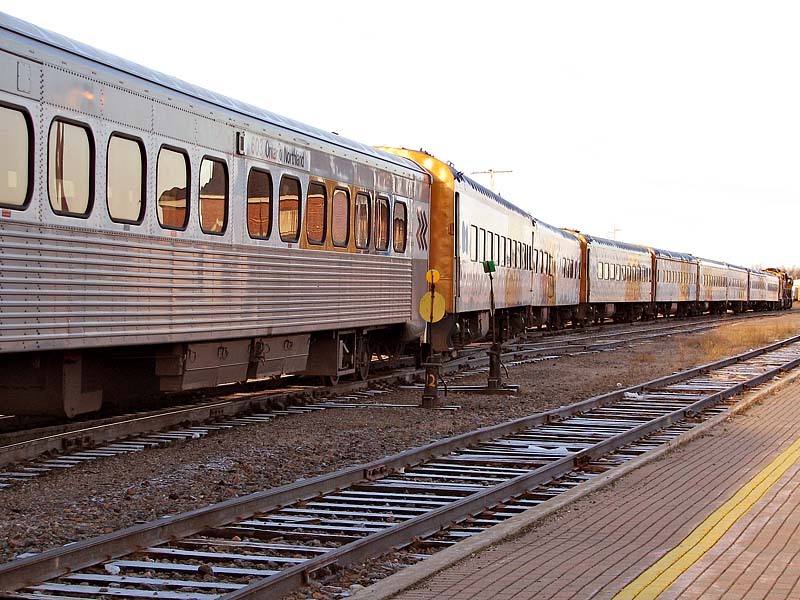 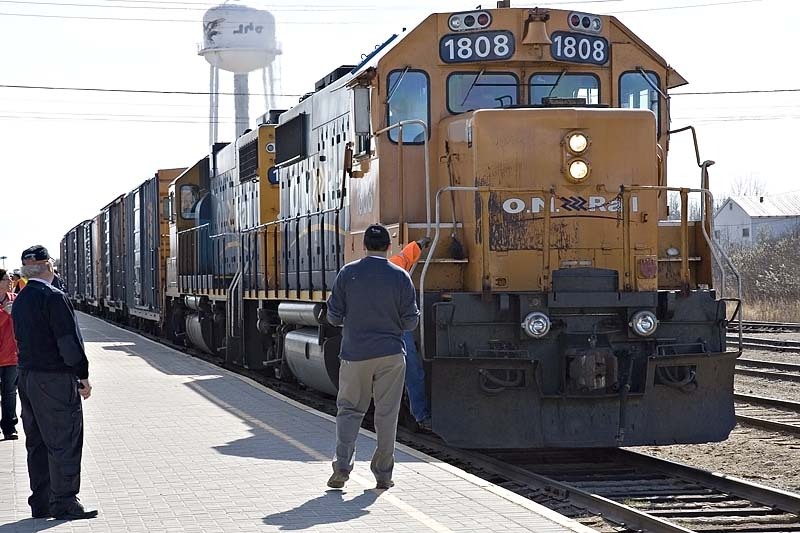 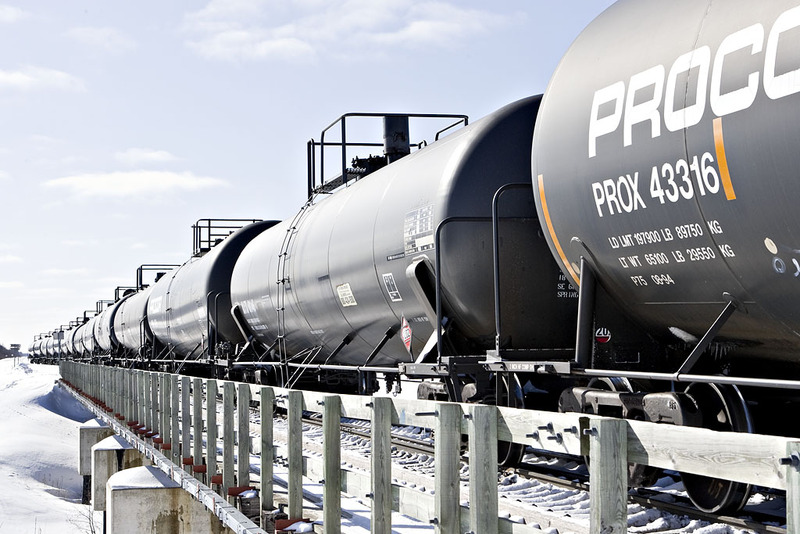 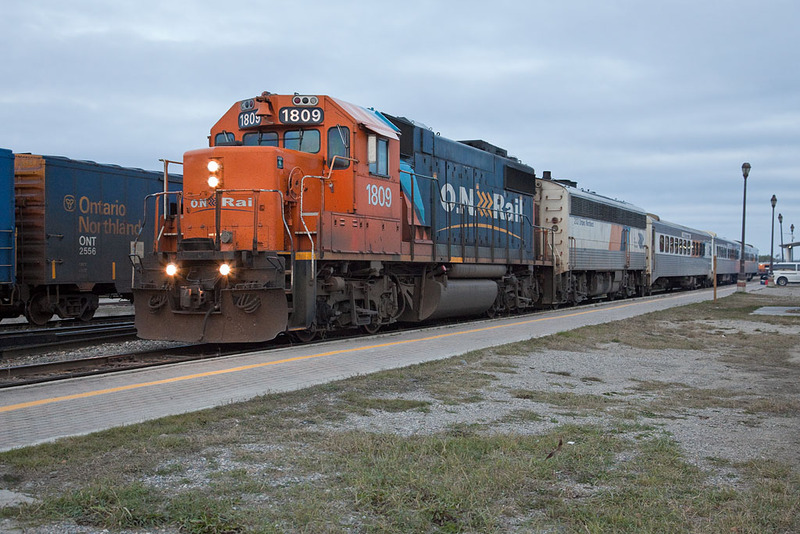 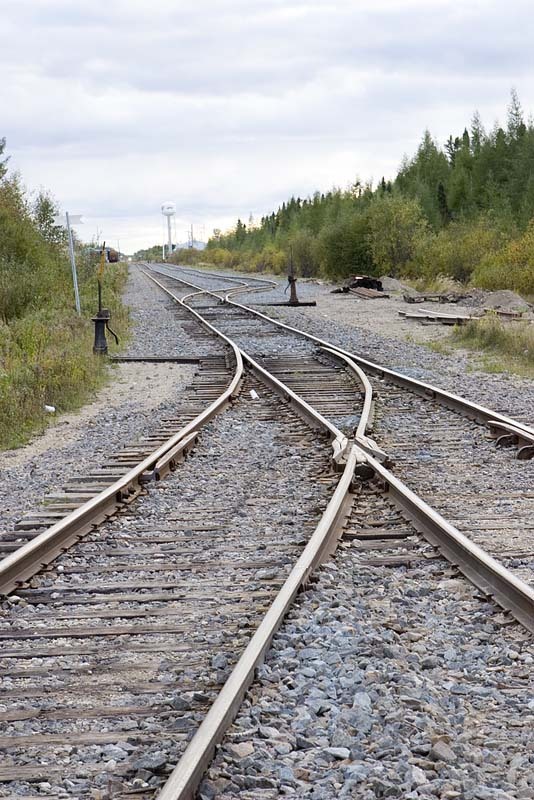 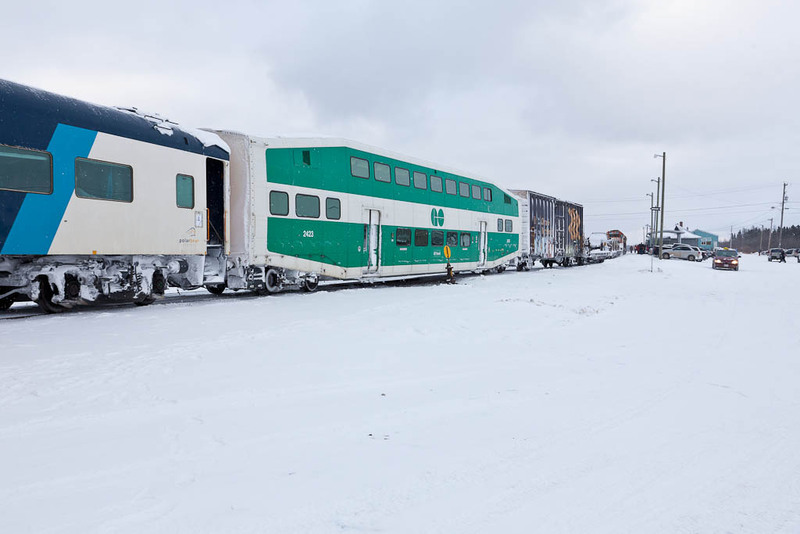 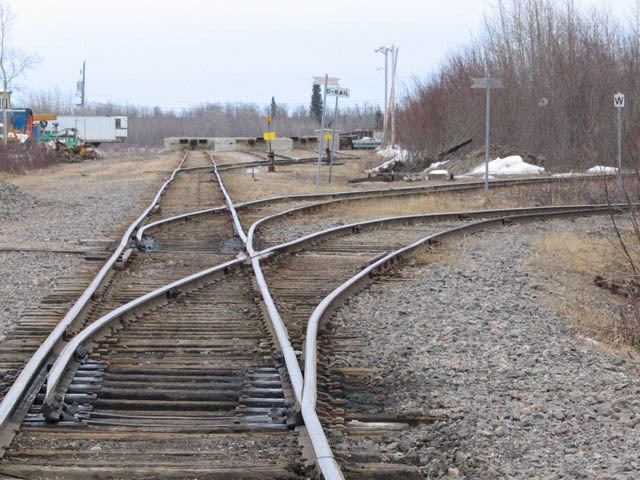 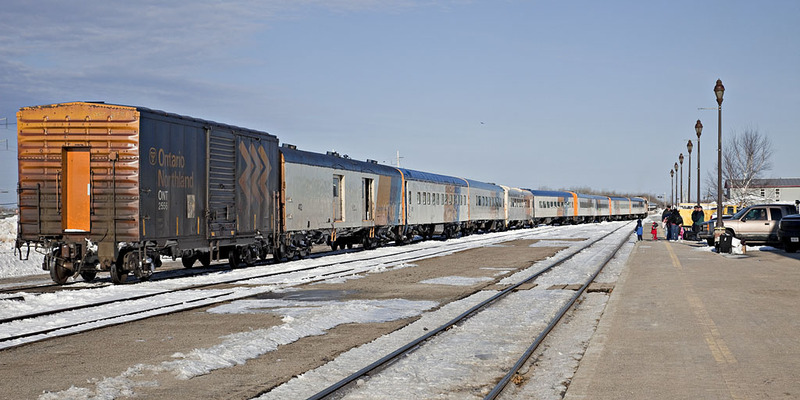 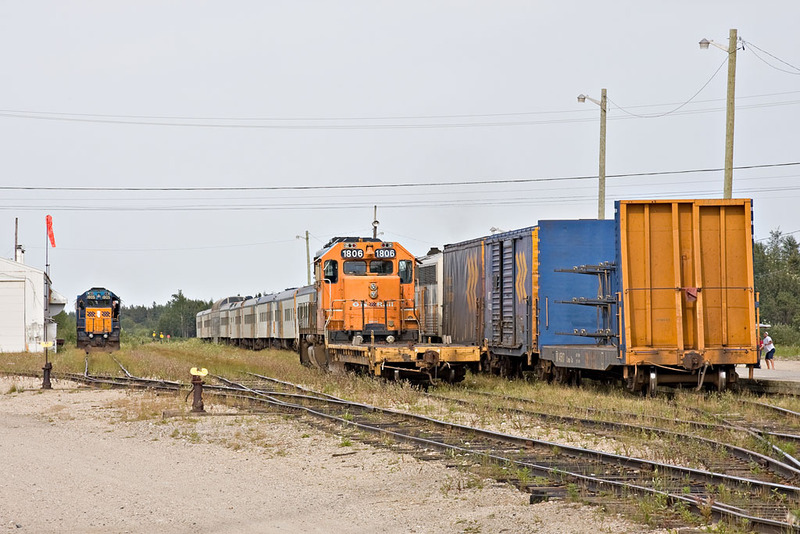 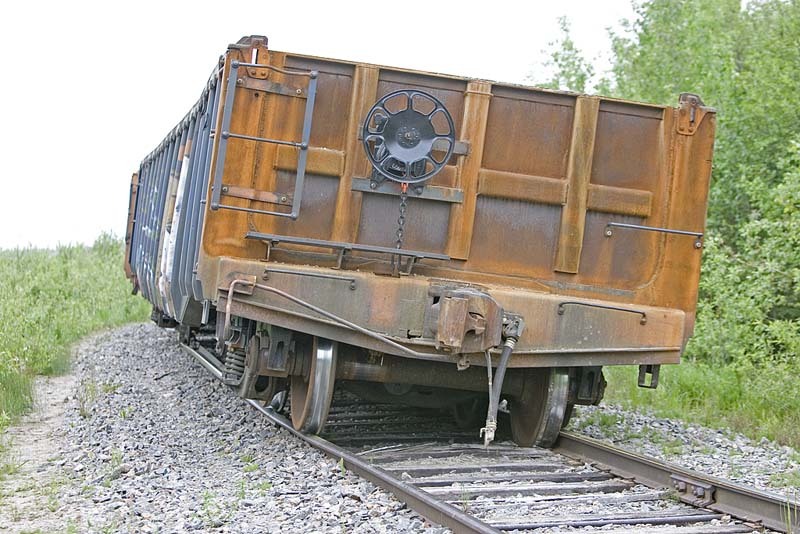 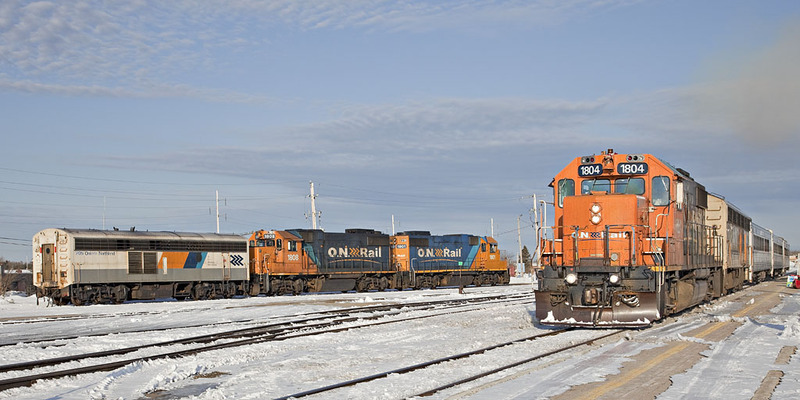 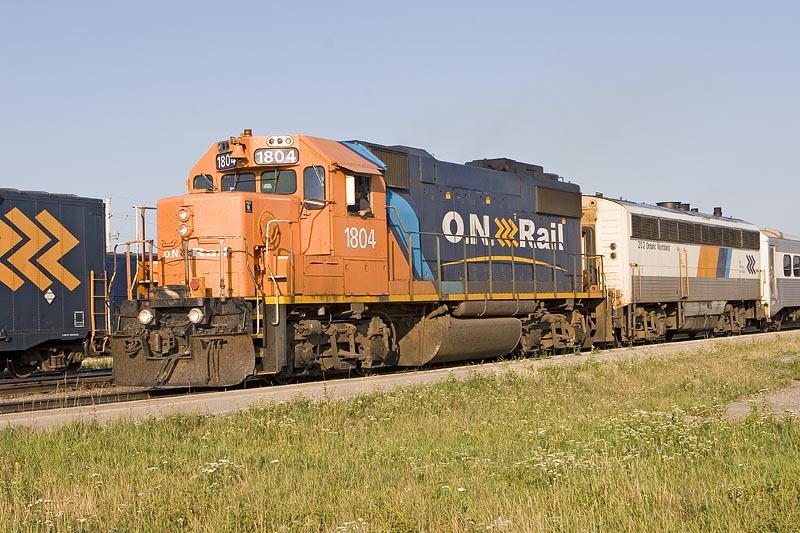 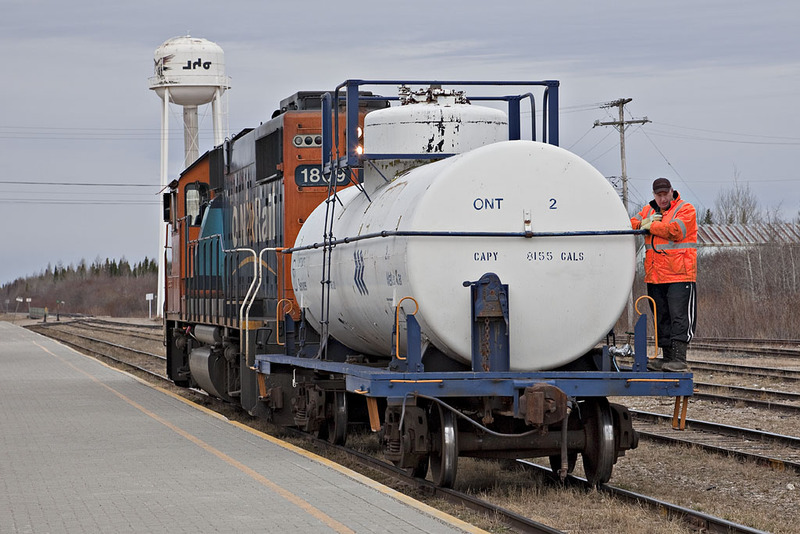 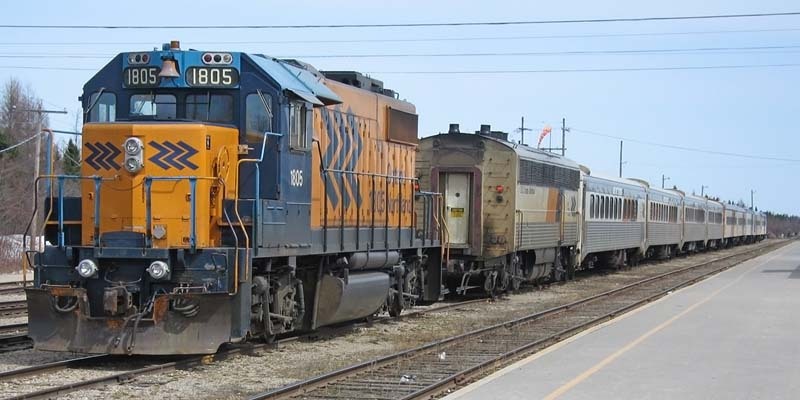 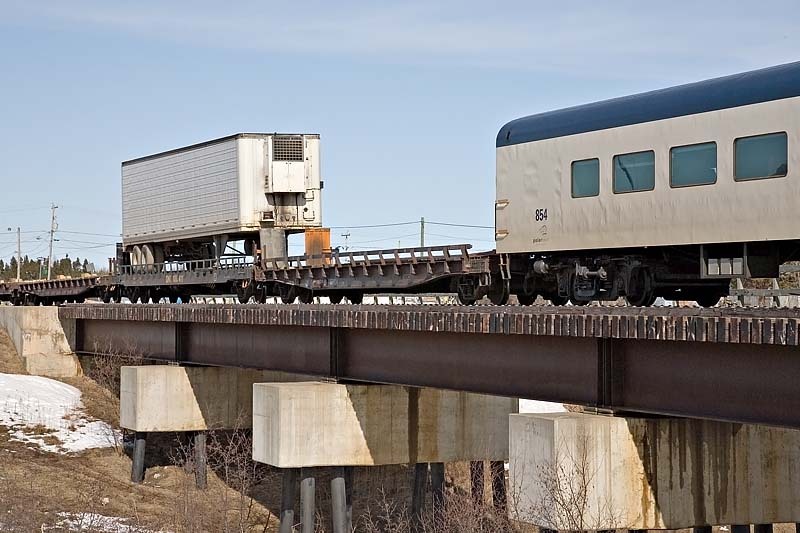 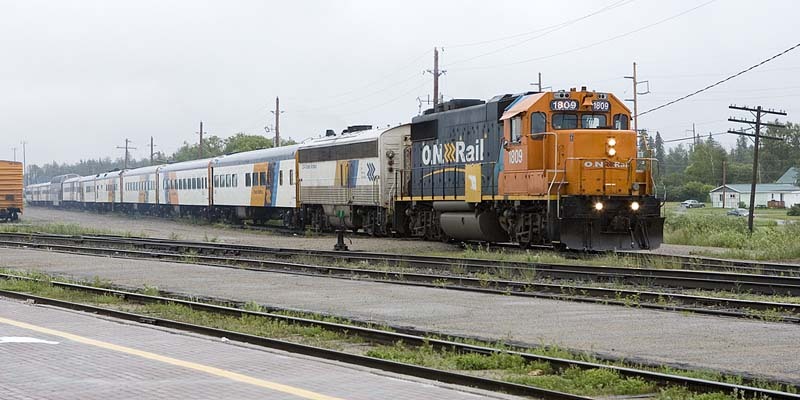 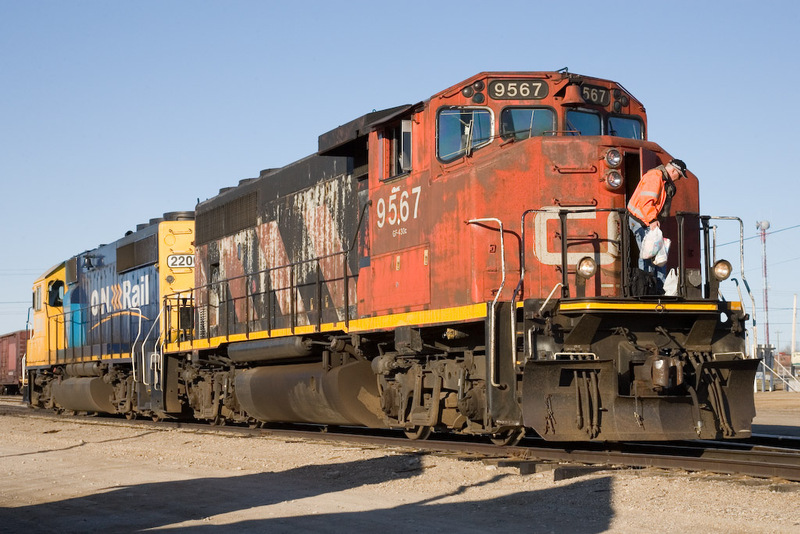 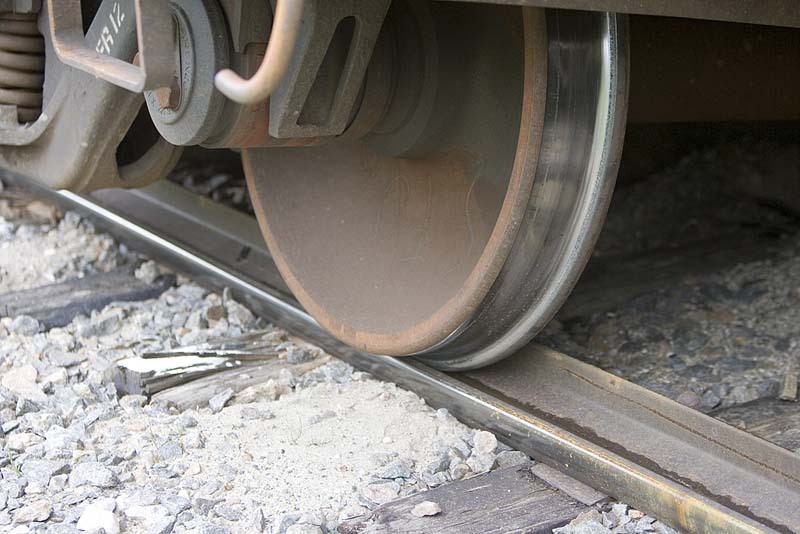 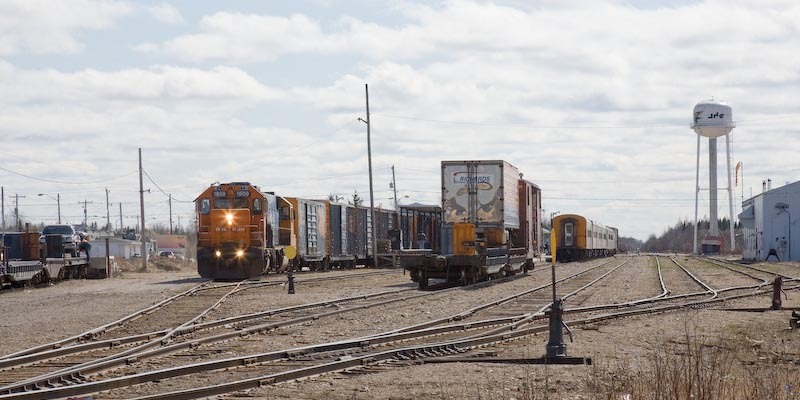 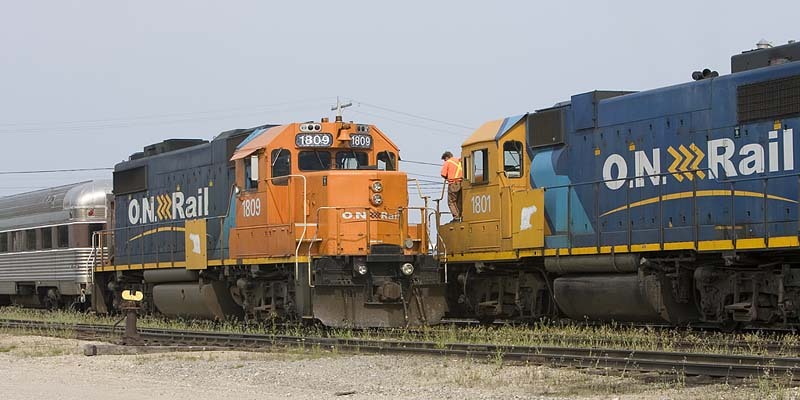 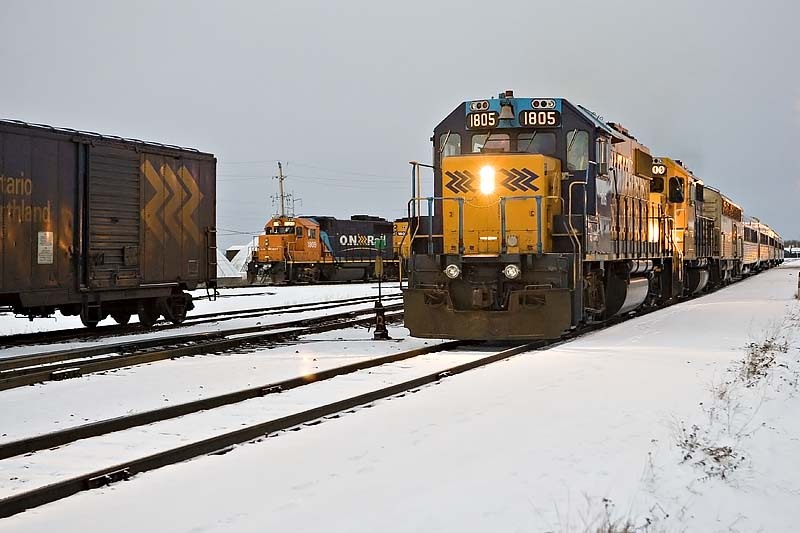 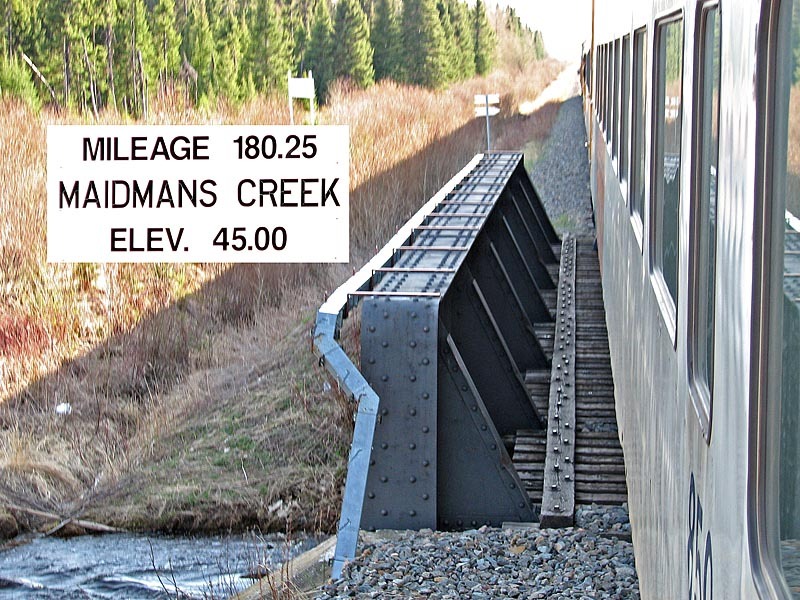 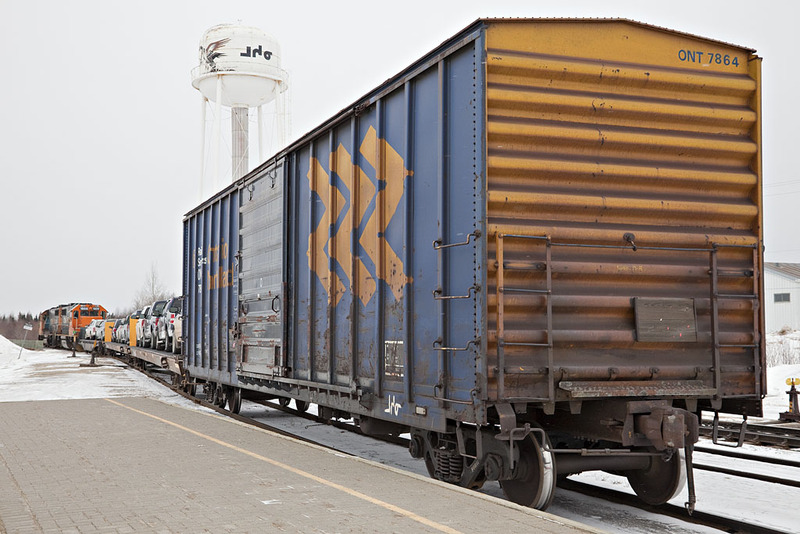 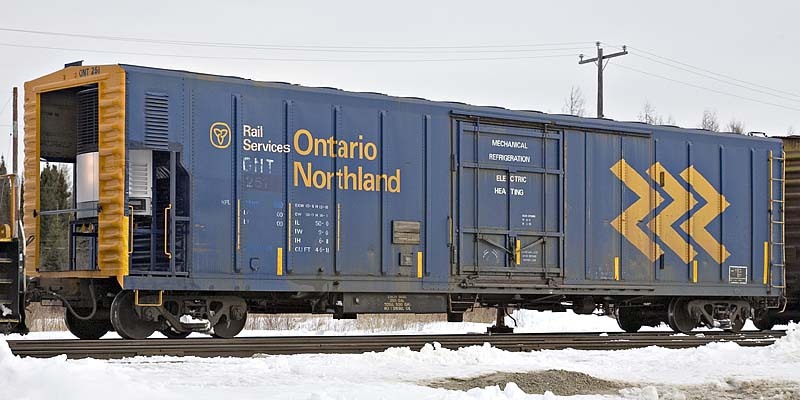 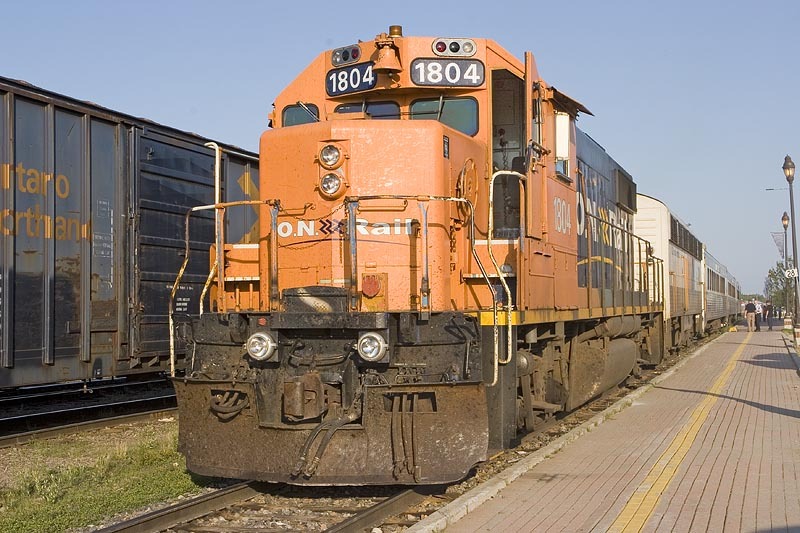 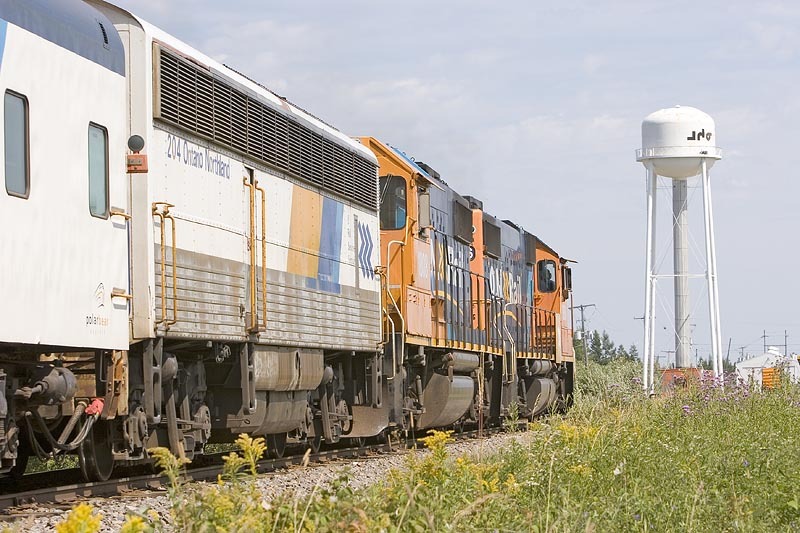 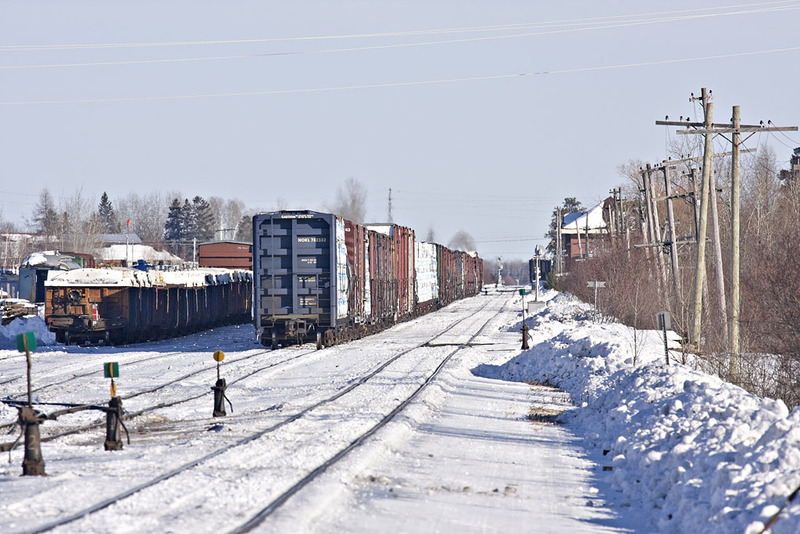 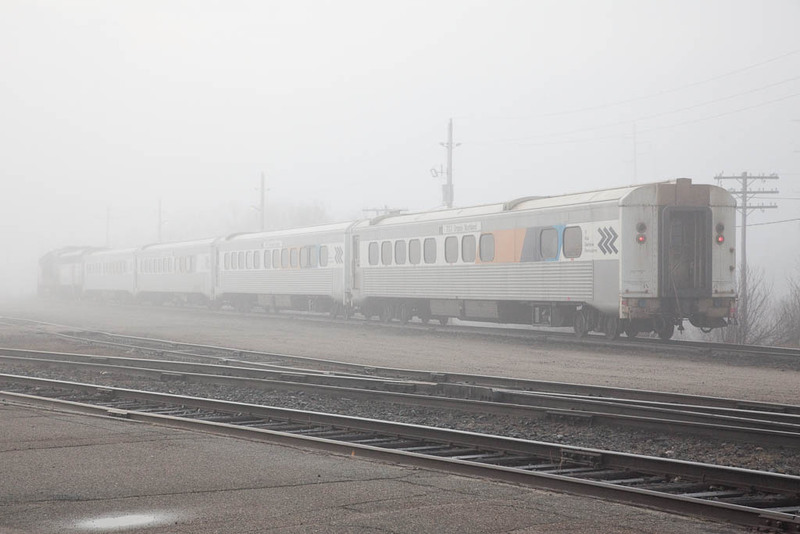 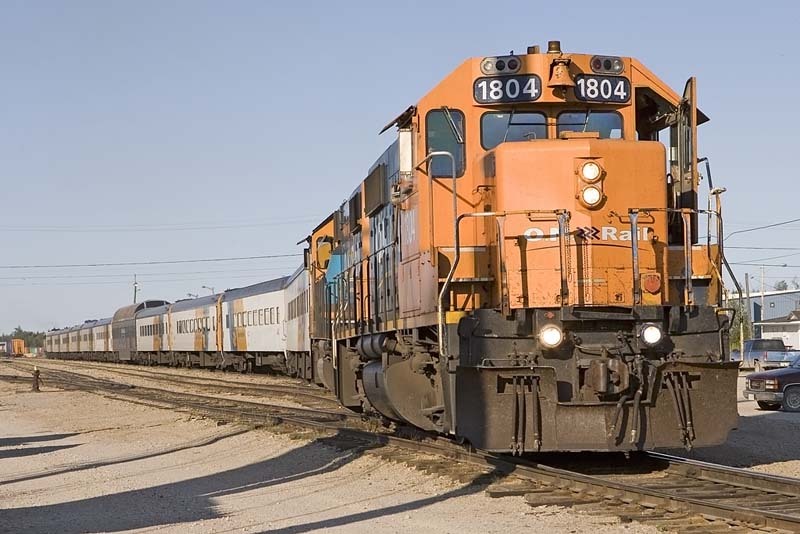 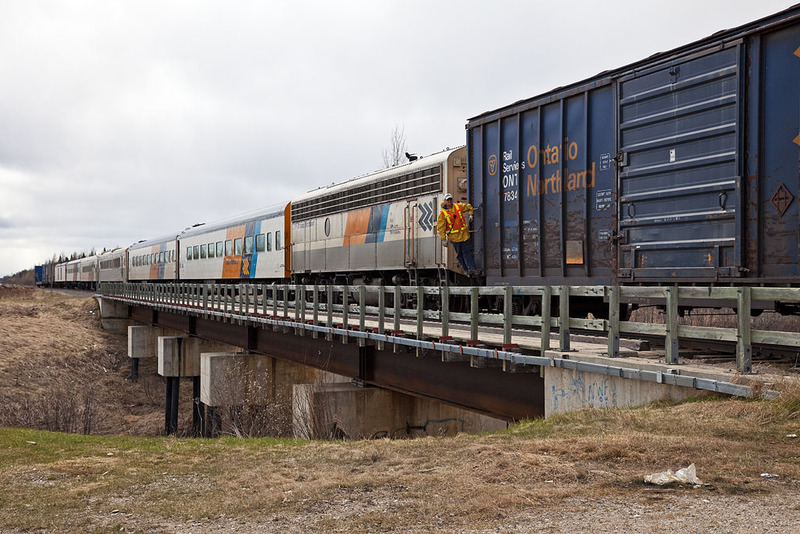 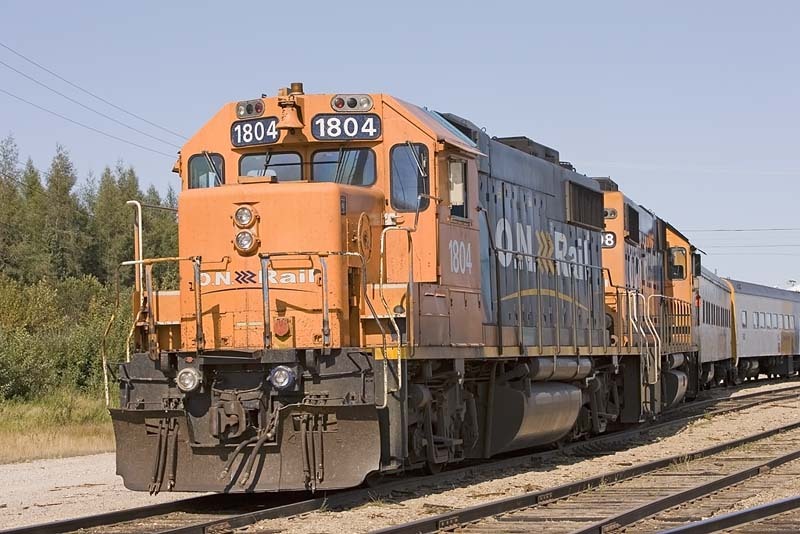 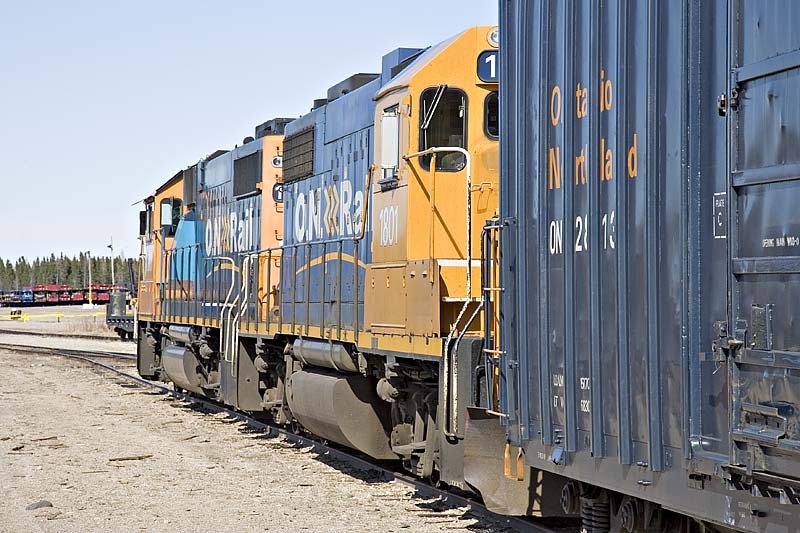 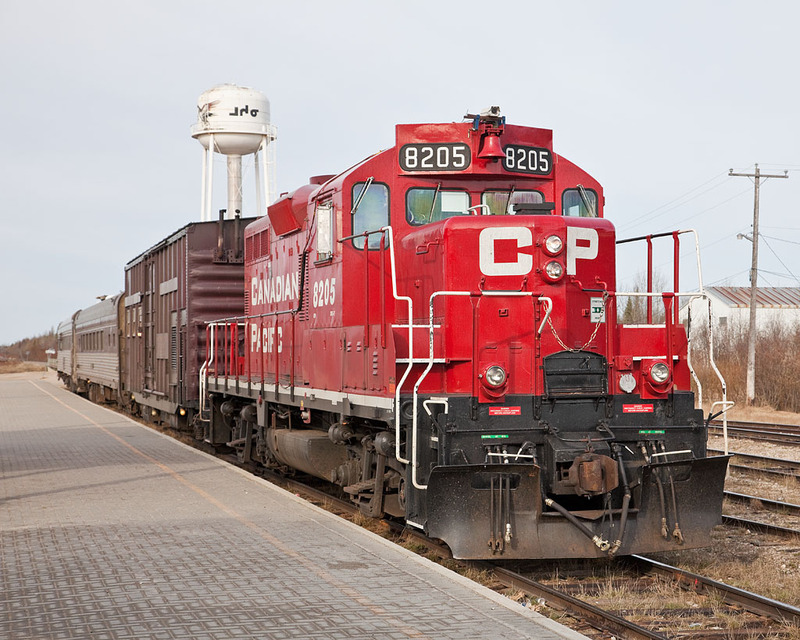 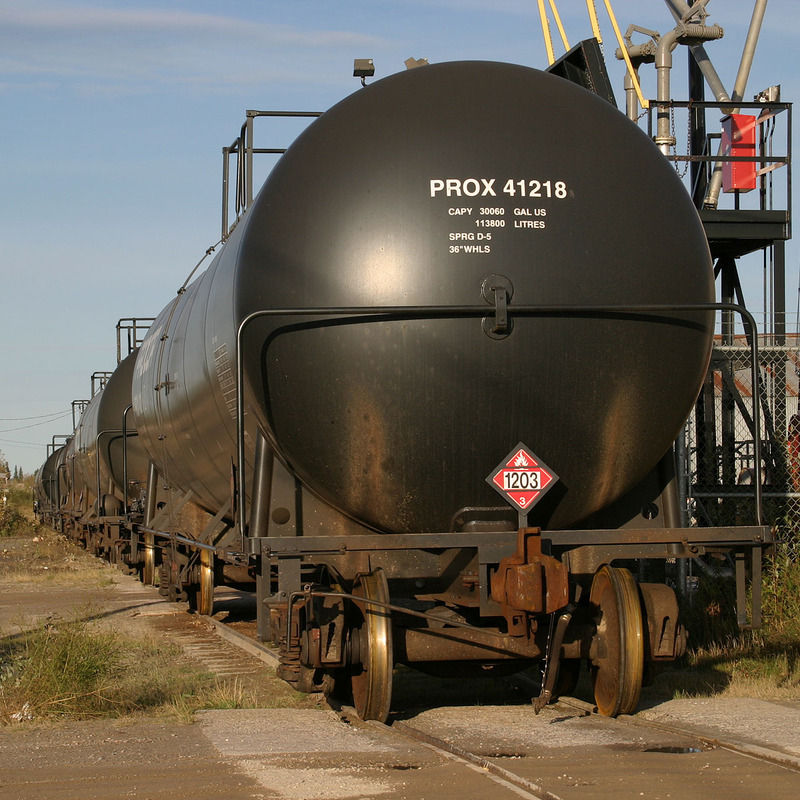 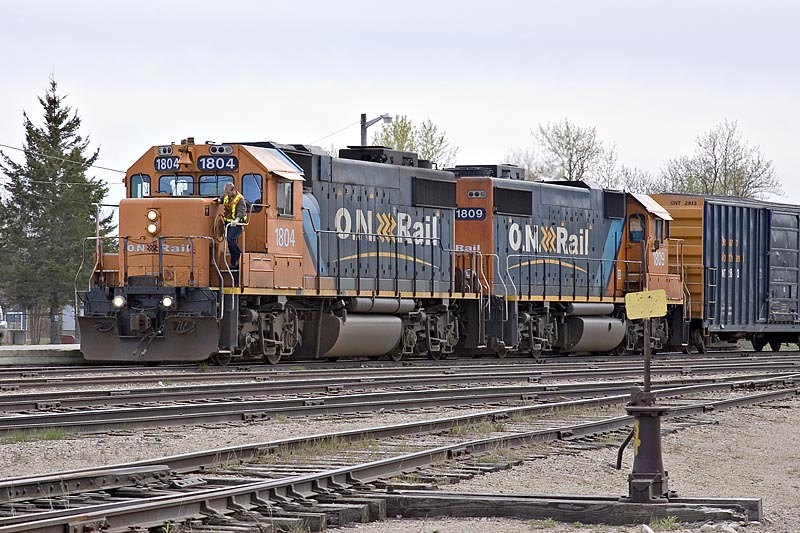 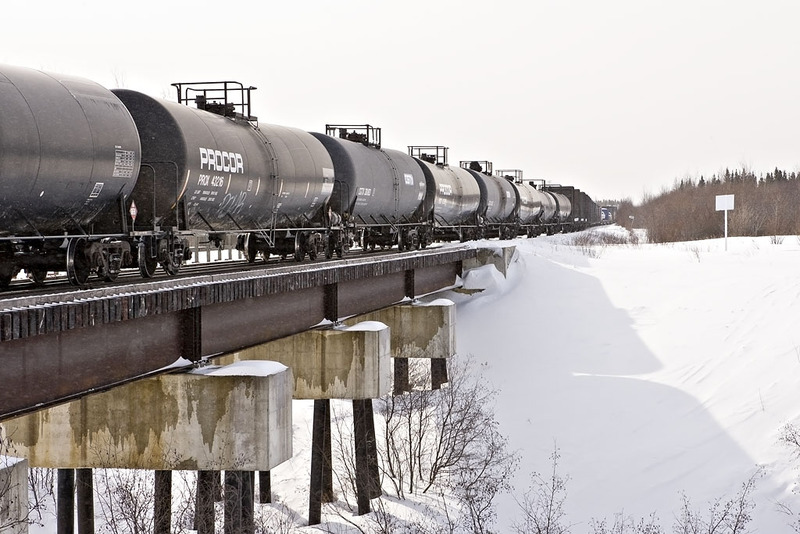 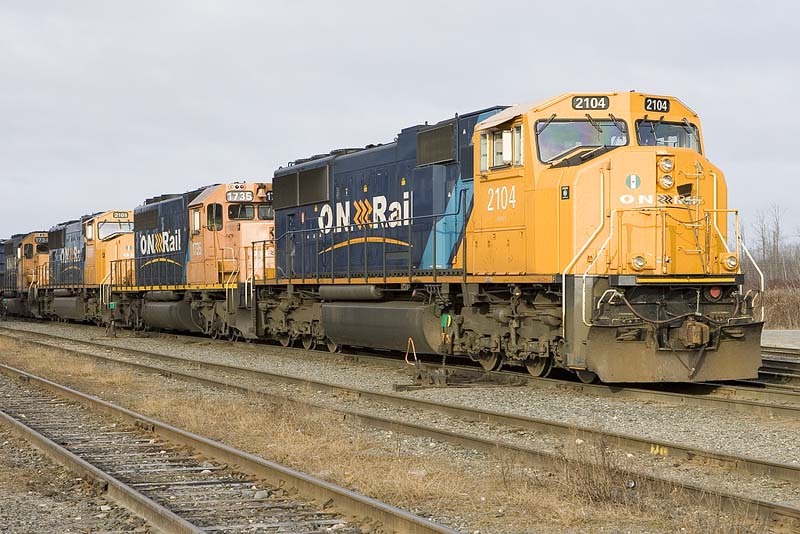 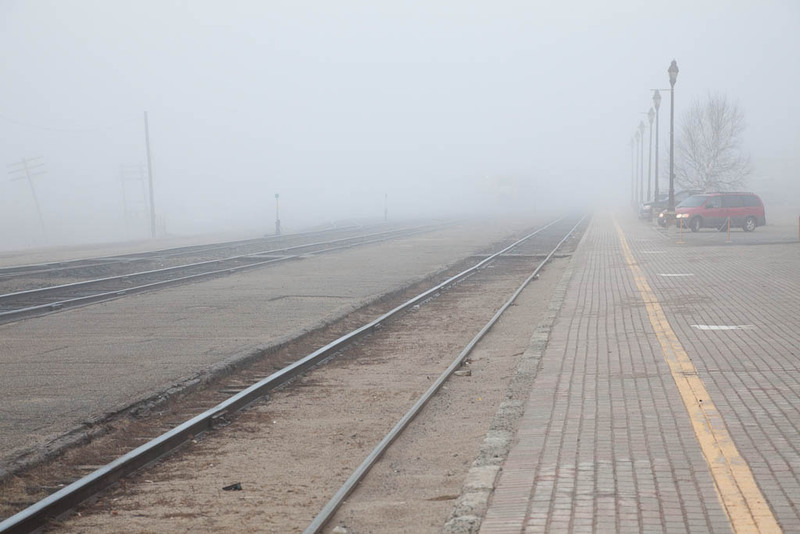 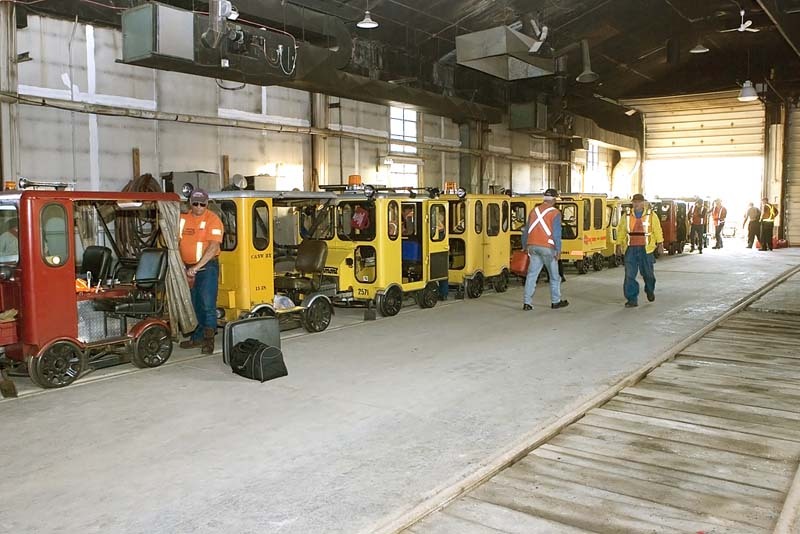 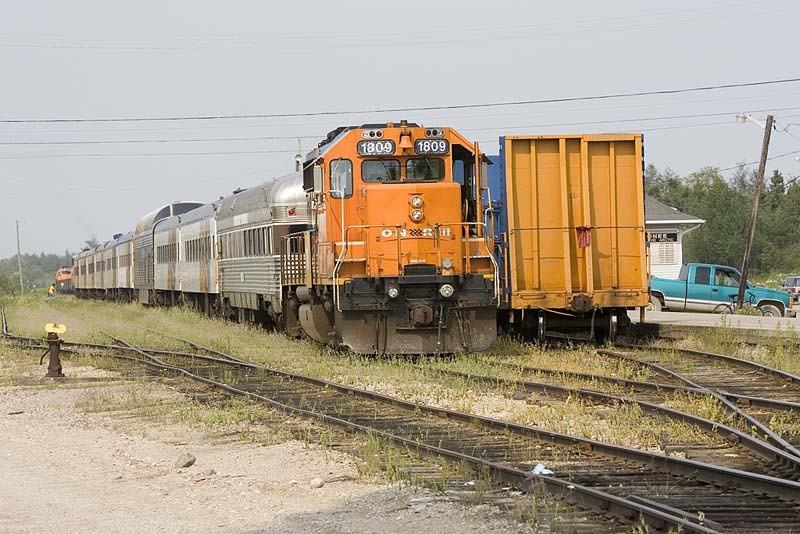 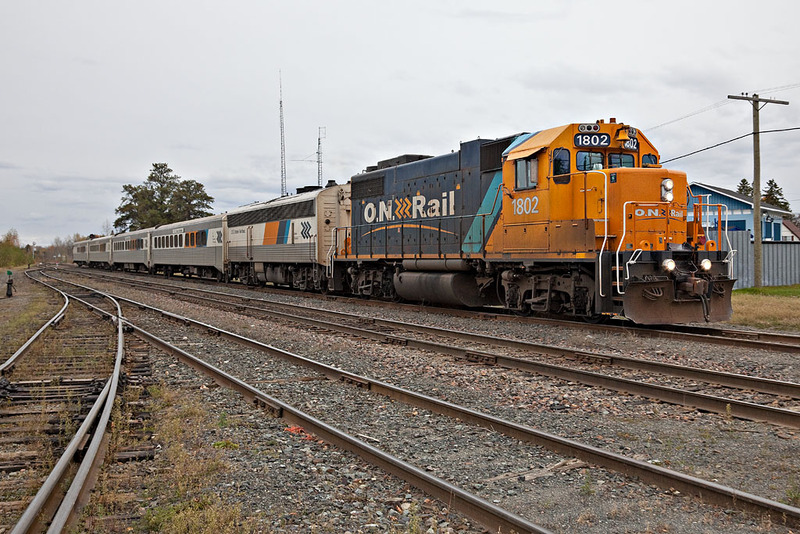 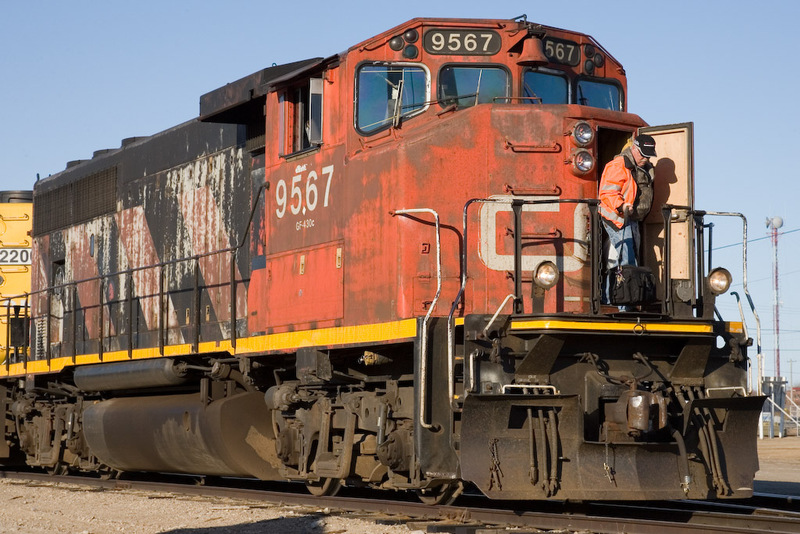 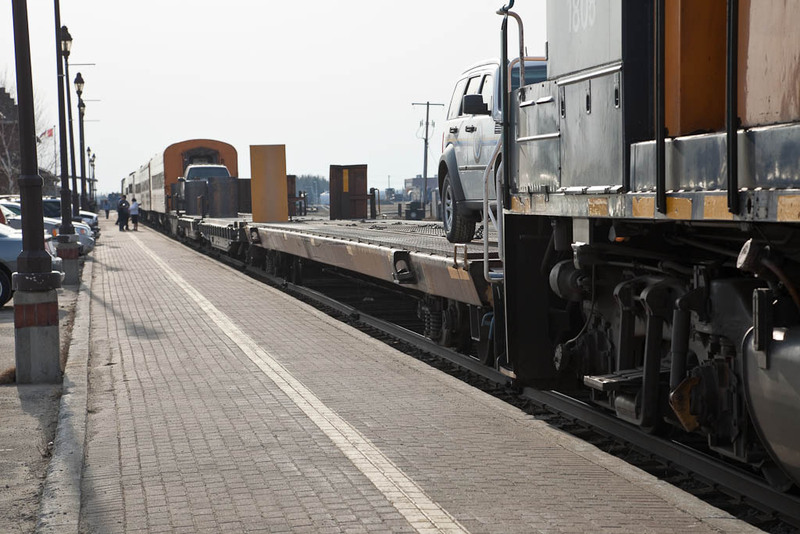 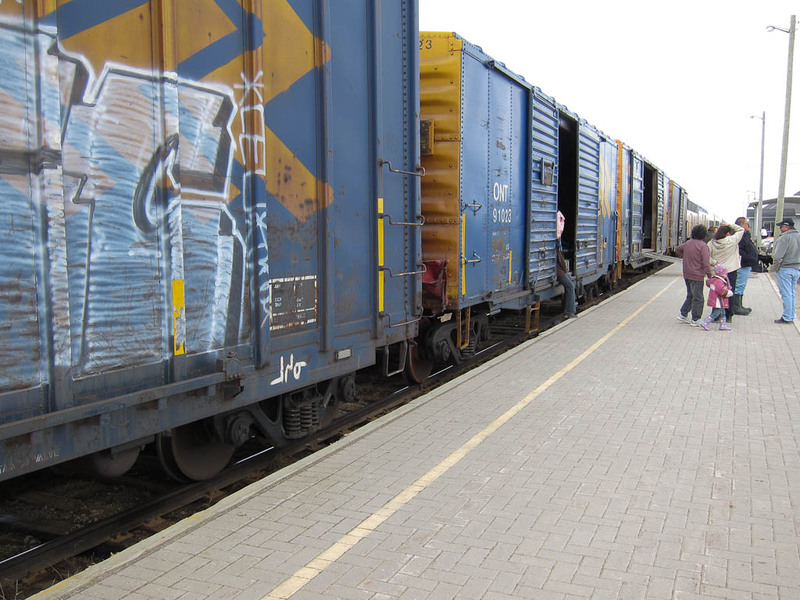 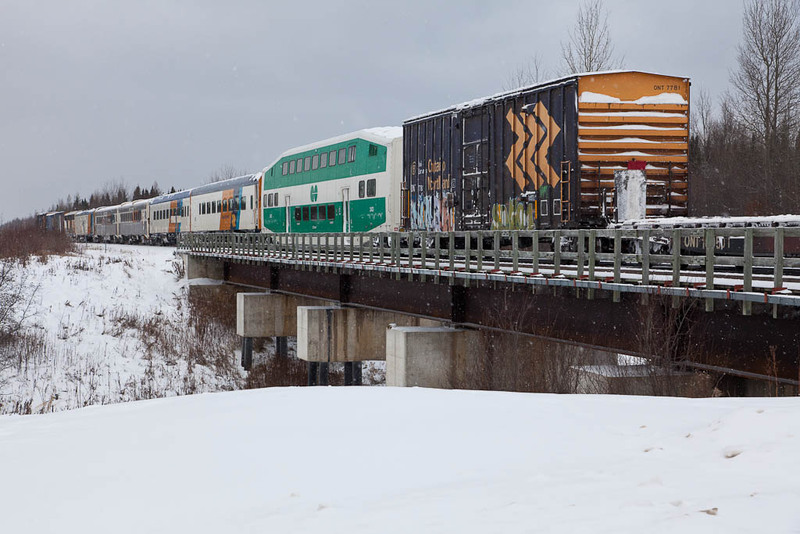 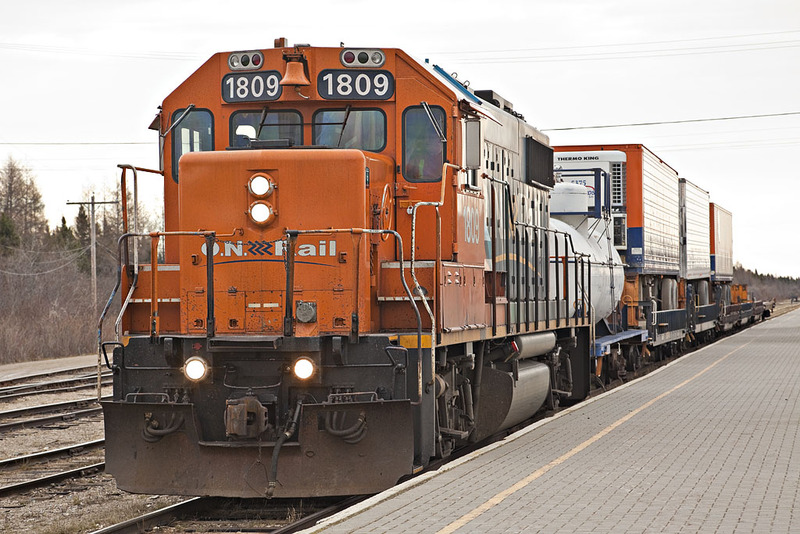 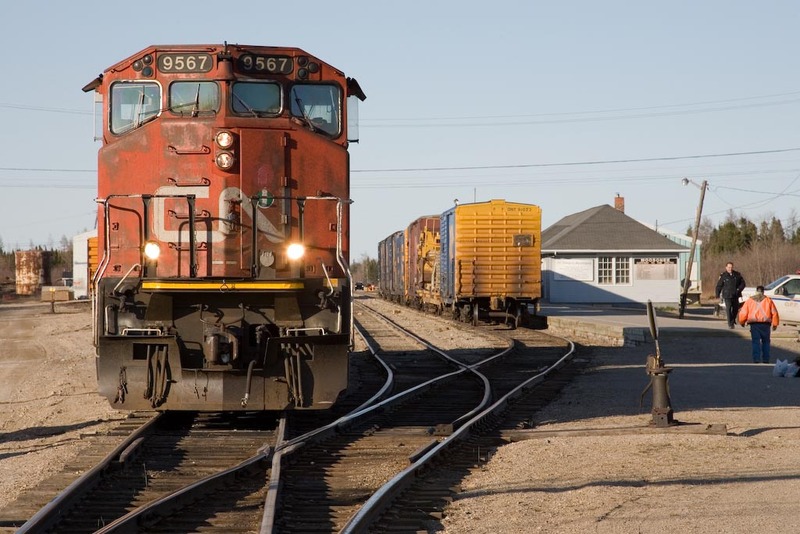 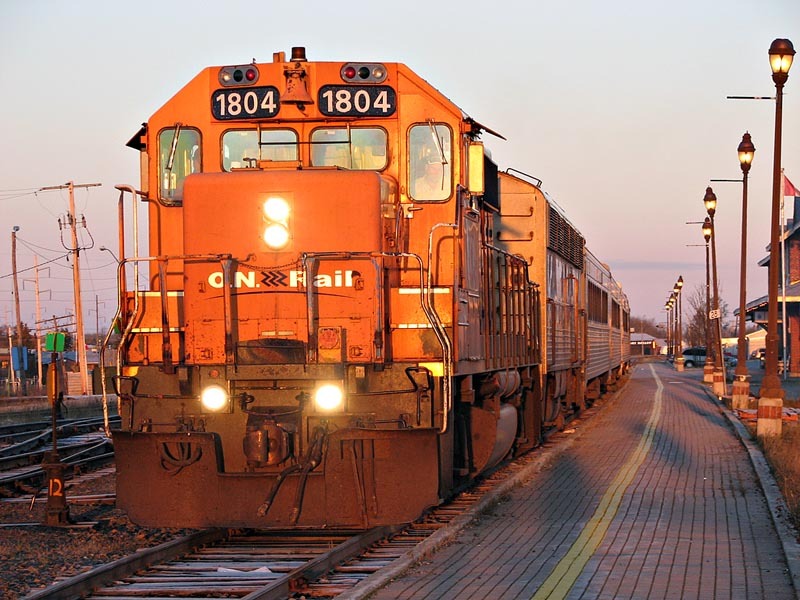 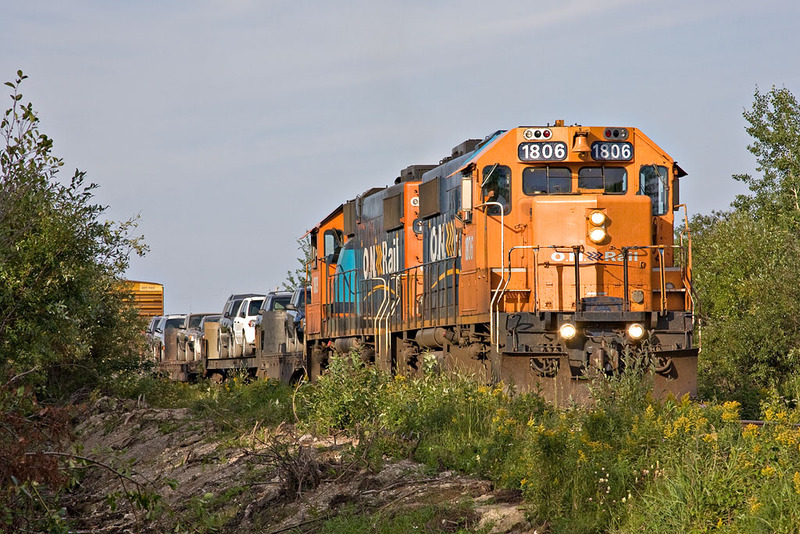 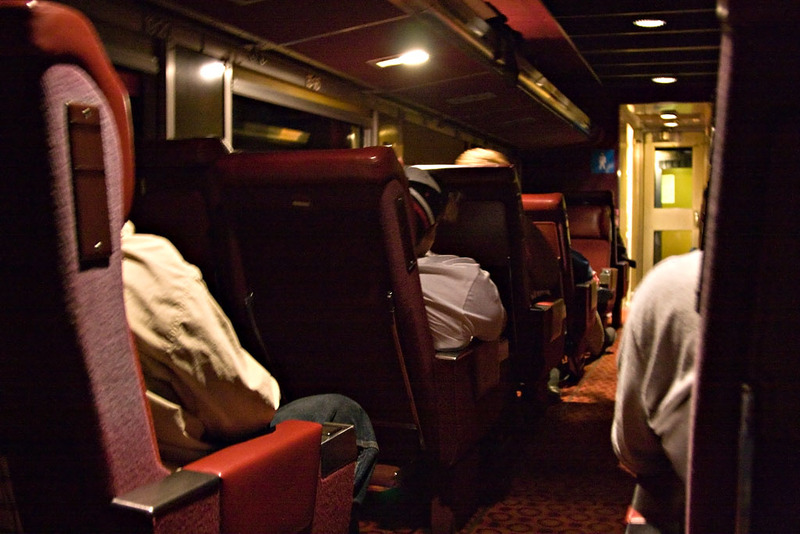 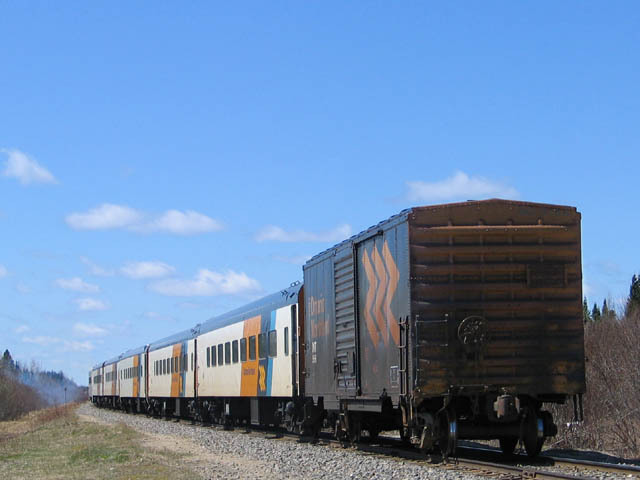 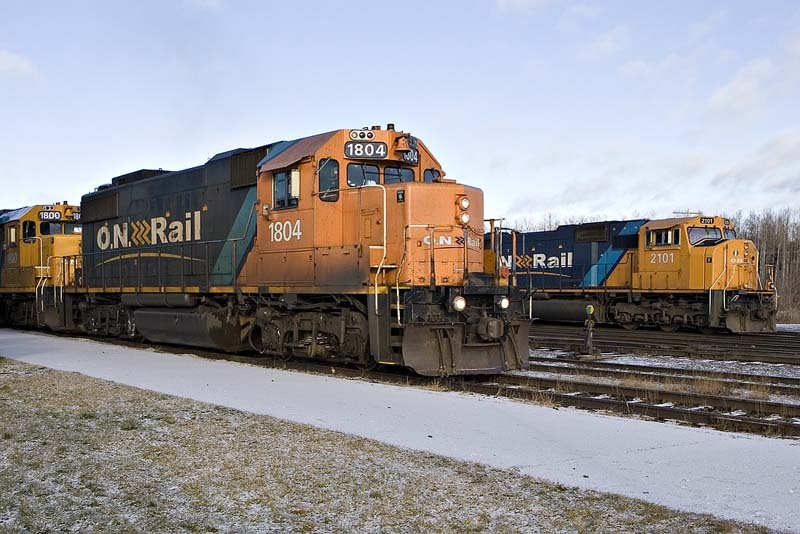 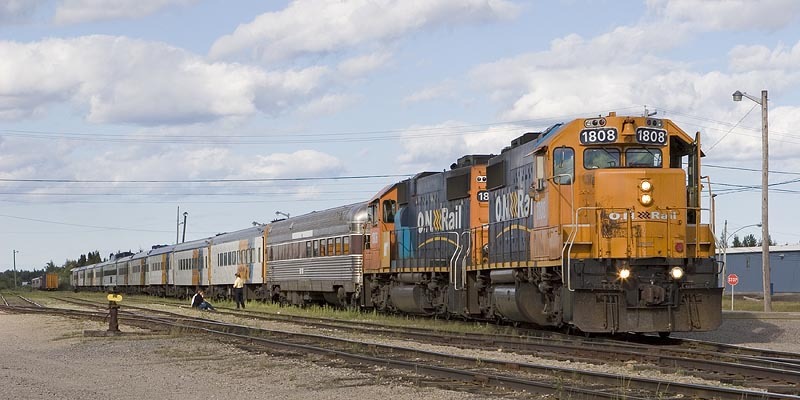 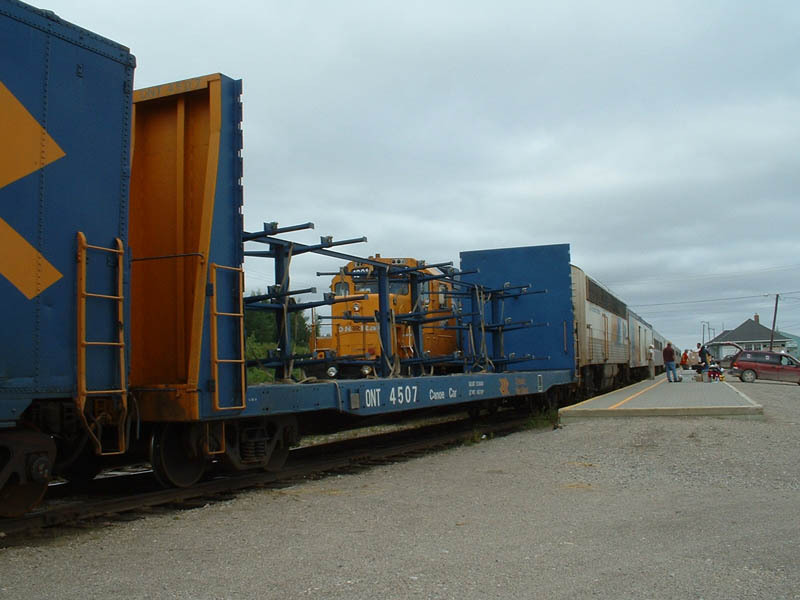 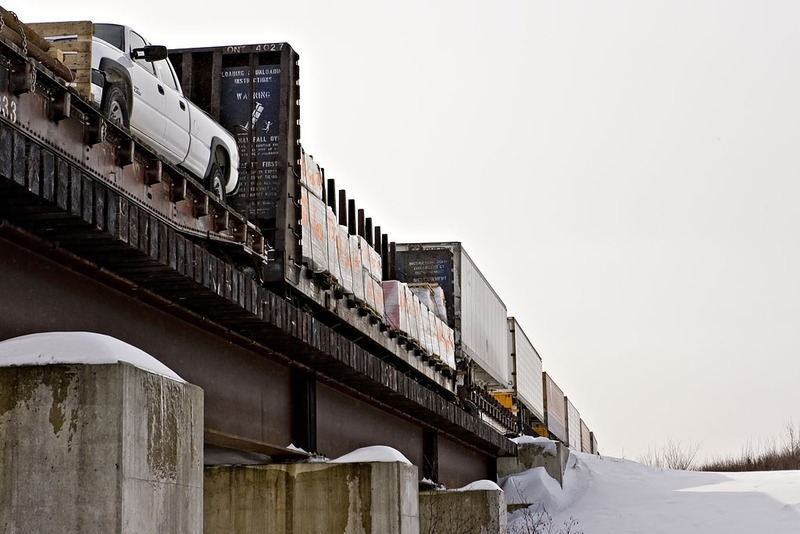 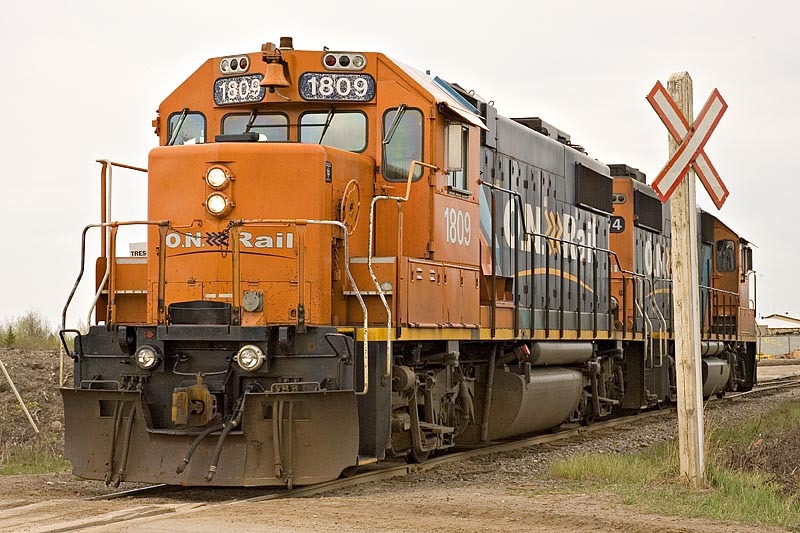 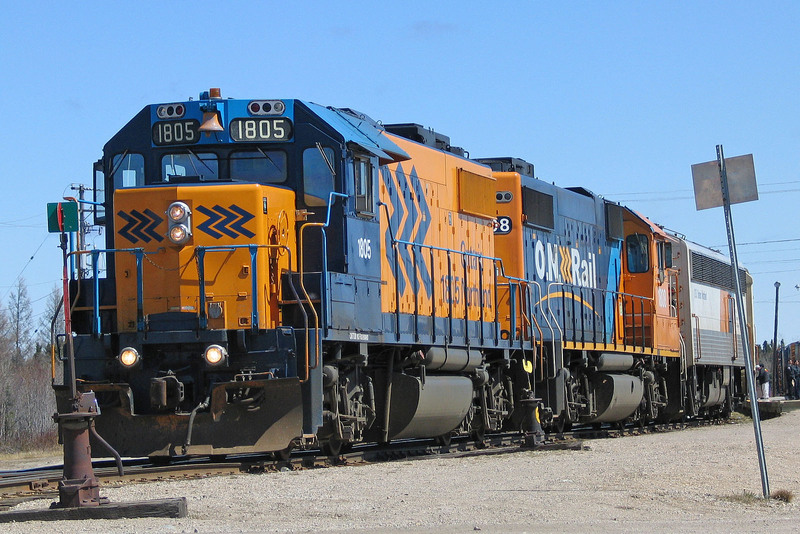 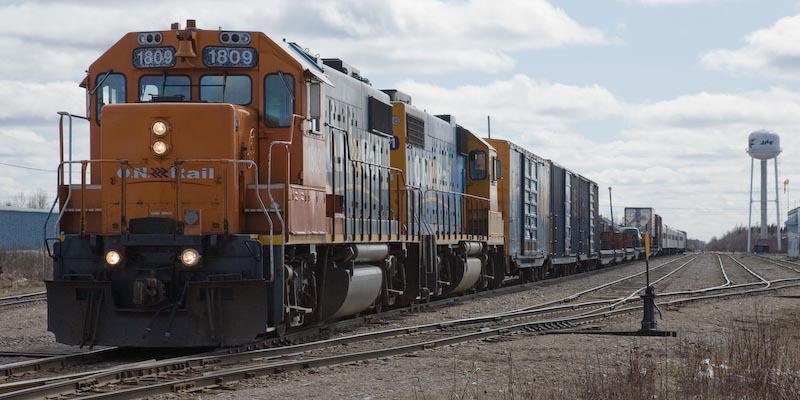 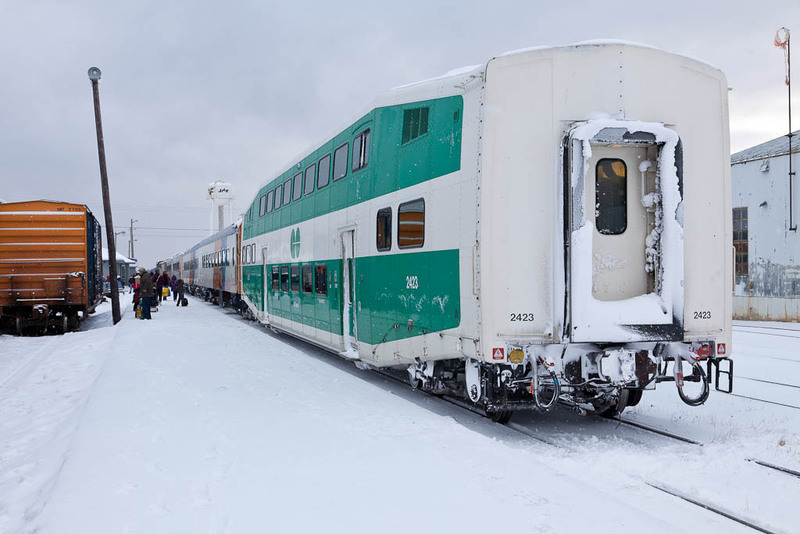 On March 23, 2007, the Ontario Government announced that mixed train operation would be replaced by a freight only train twice a week (419/621)and passenger service (421/622) five times a week in each direction, increasing to six times a week during the summer. 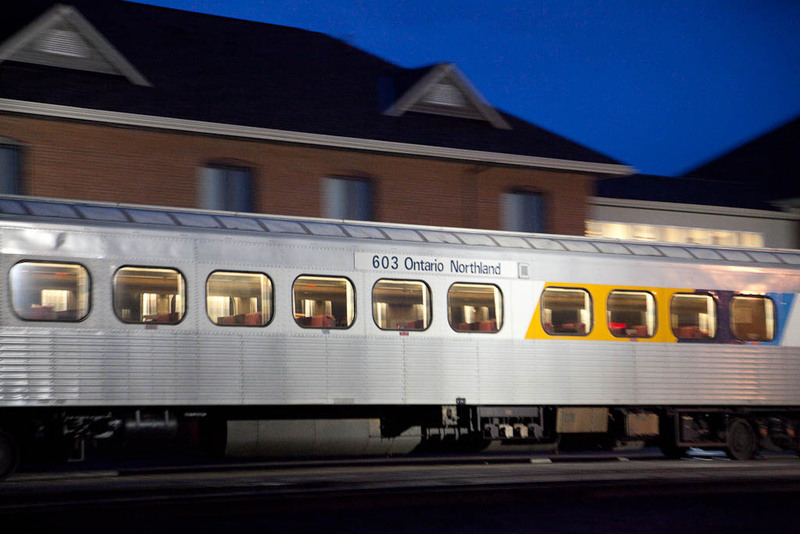 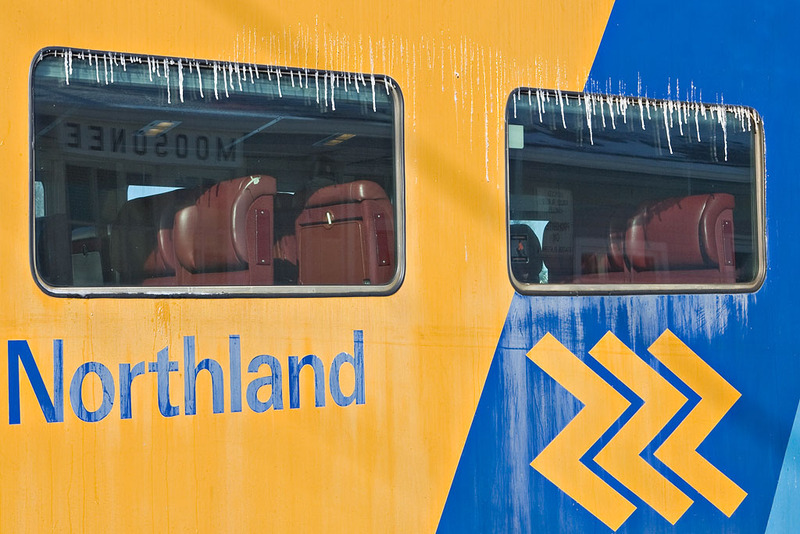 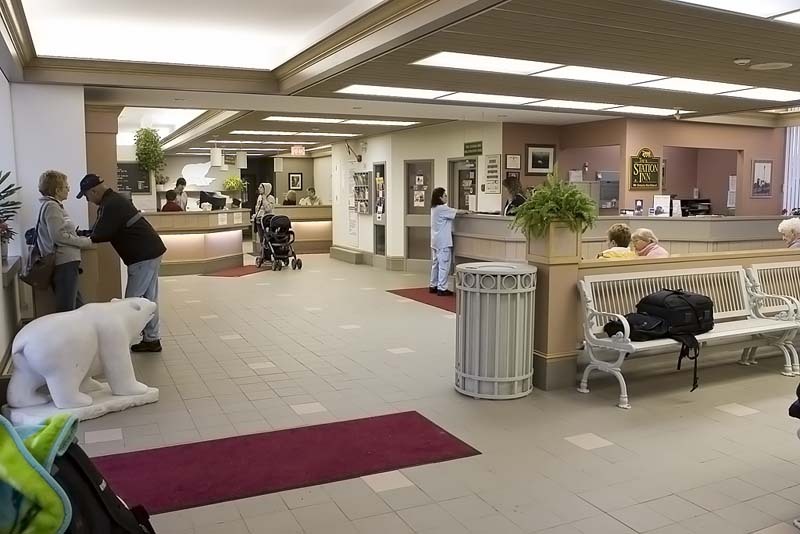 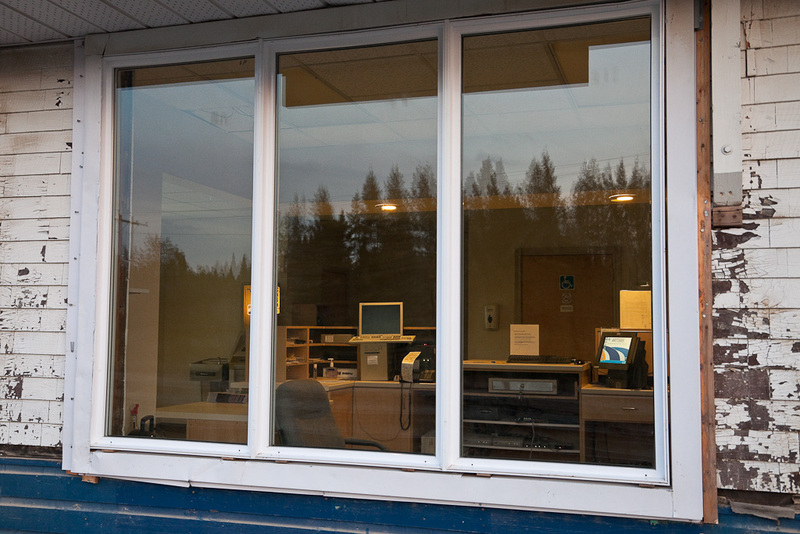 The new service began in June 2007. 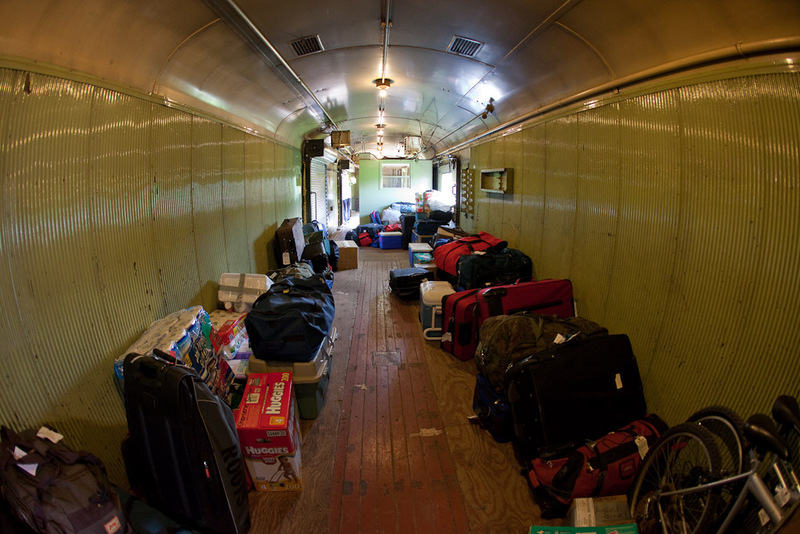 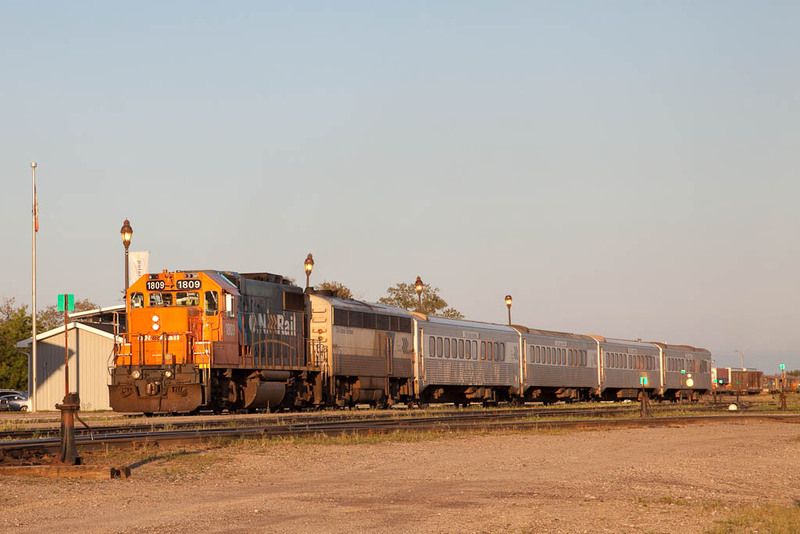 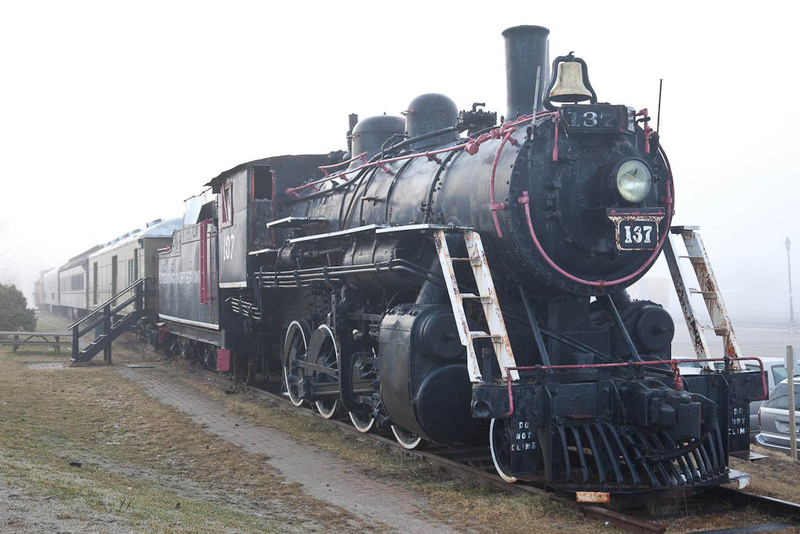 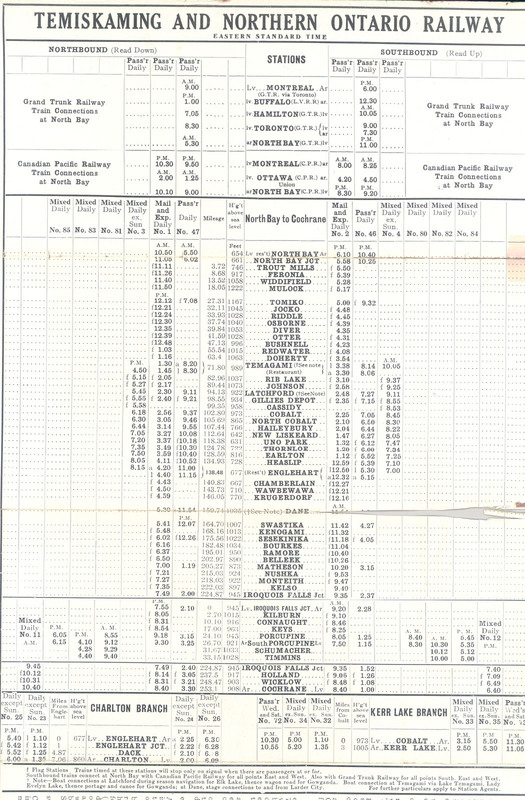 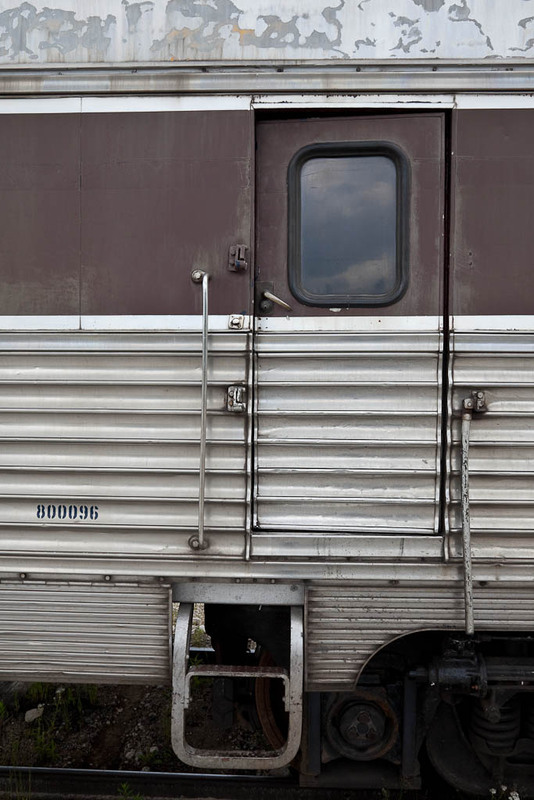 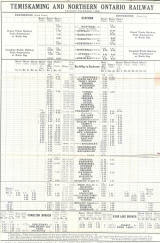 There is no longer be a separate excursion train in the summer. 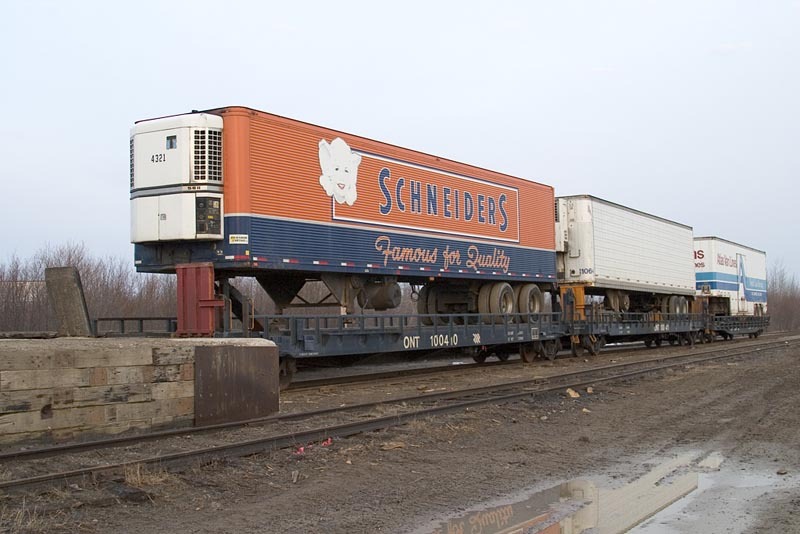 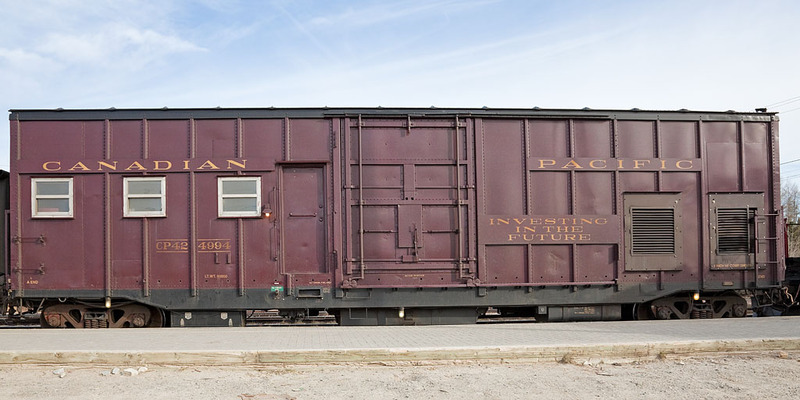 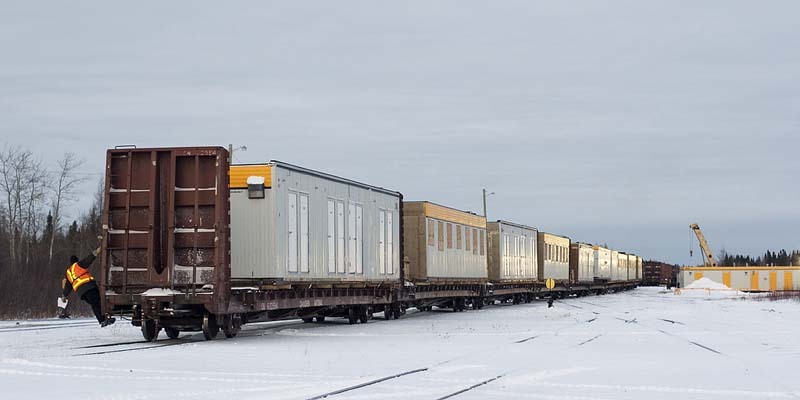 The new train (Polar Bear/Little Bear sometimes called the Super Bear because of the amount of switching it involves) includes chain cars (flatcars) for light vehicles, baggage and express cars, a couple of box cars for larger items such as boxcars as well as passenger cars. 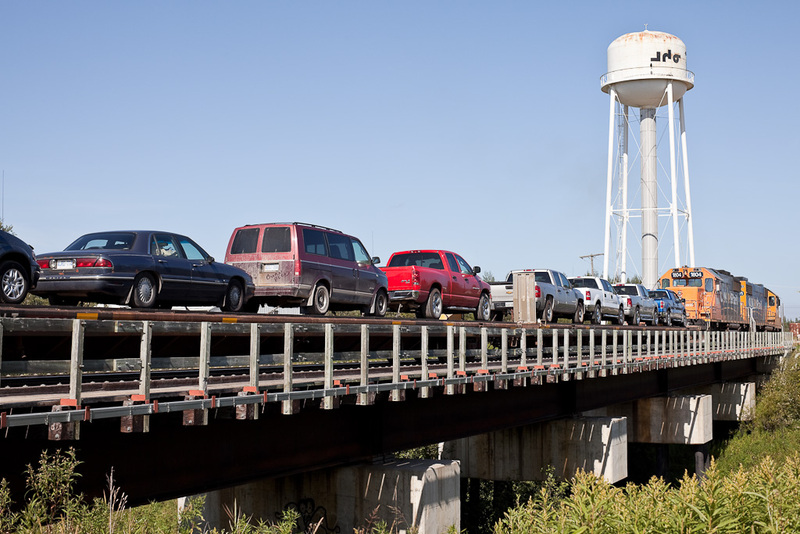 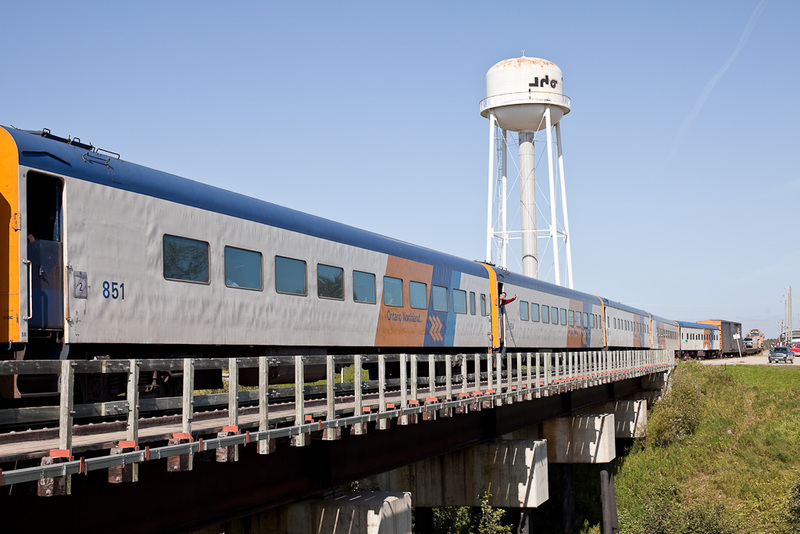 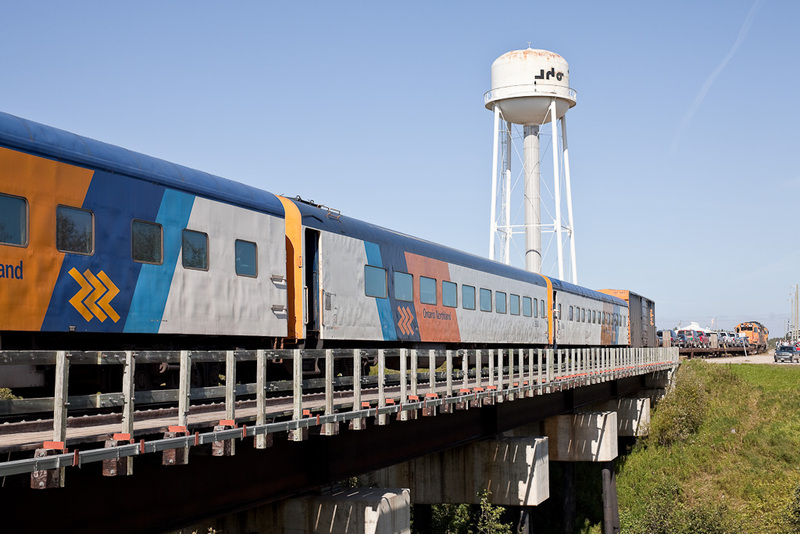 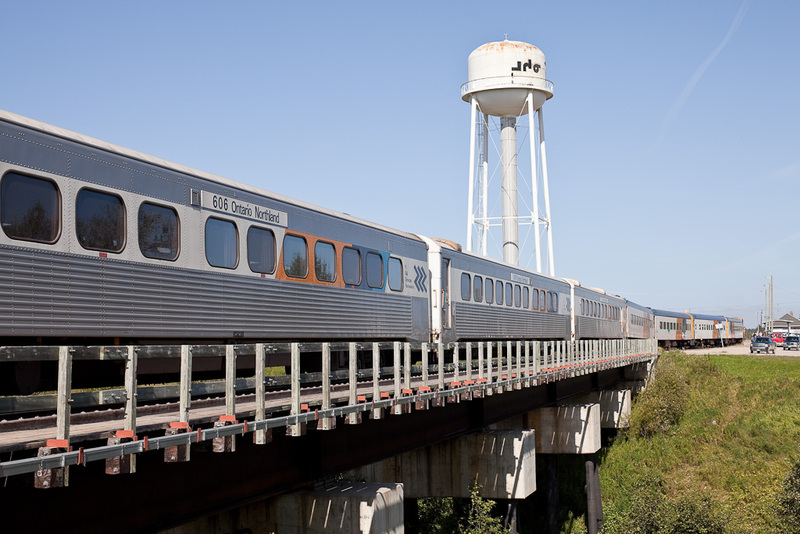 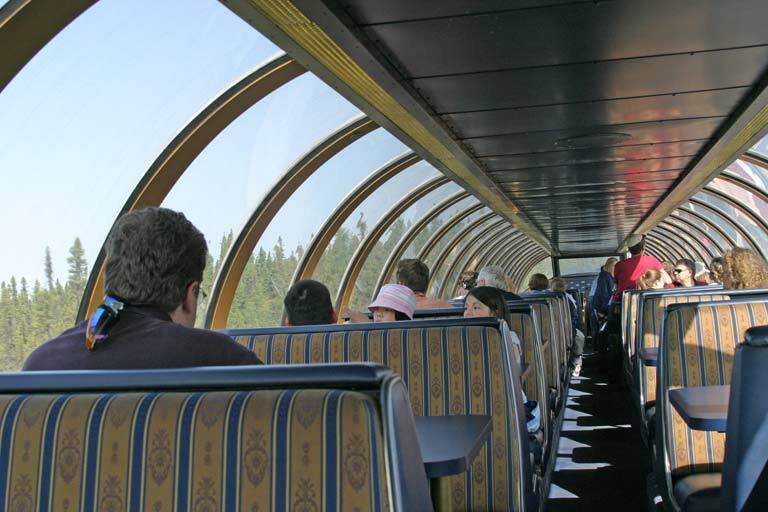 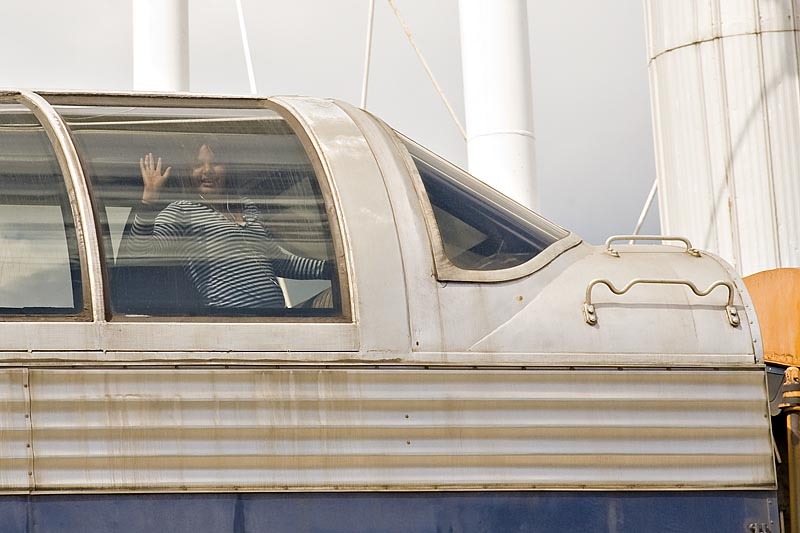 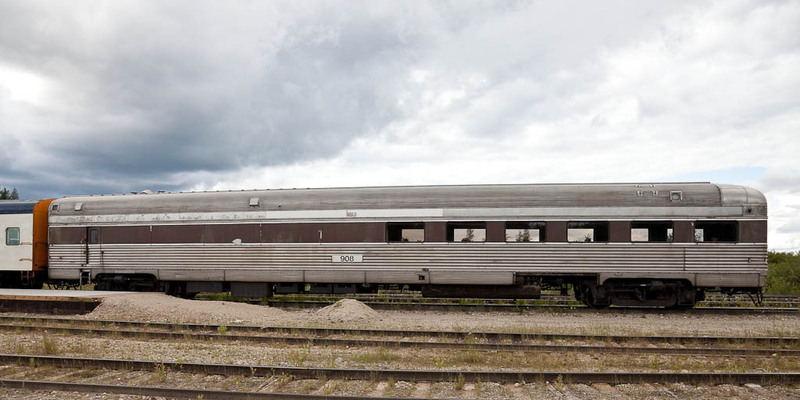 Additional passenger cars, including domes, are added in the summer. 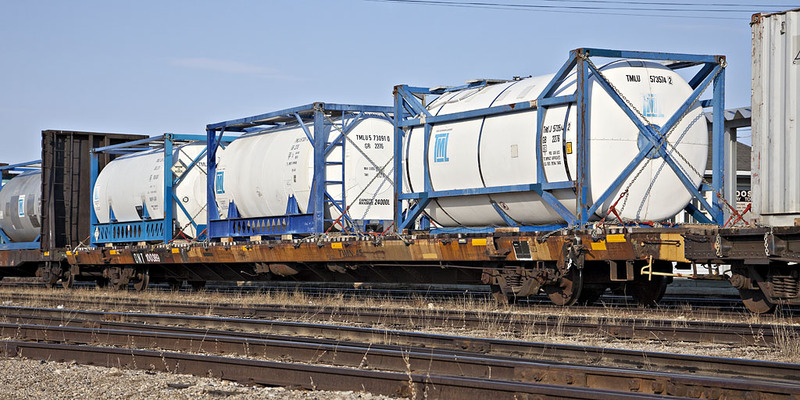 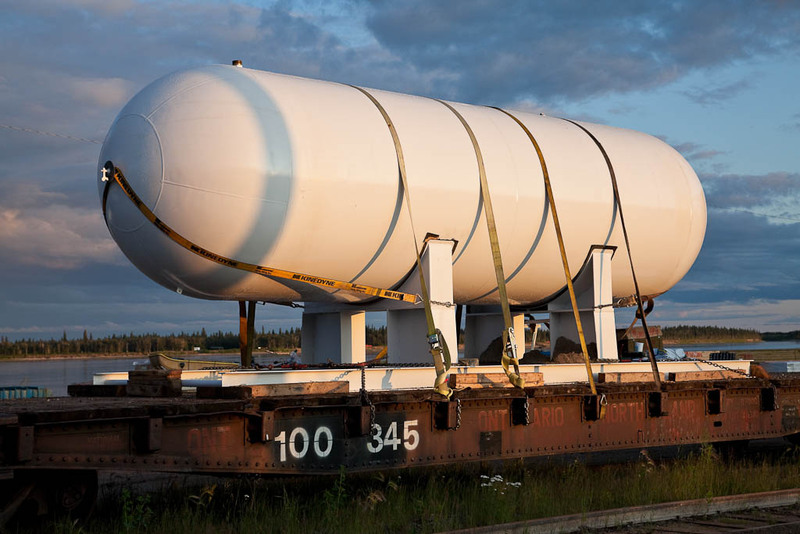 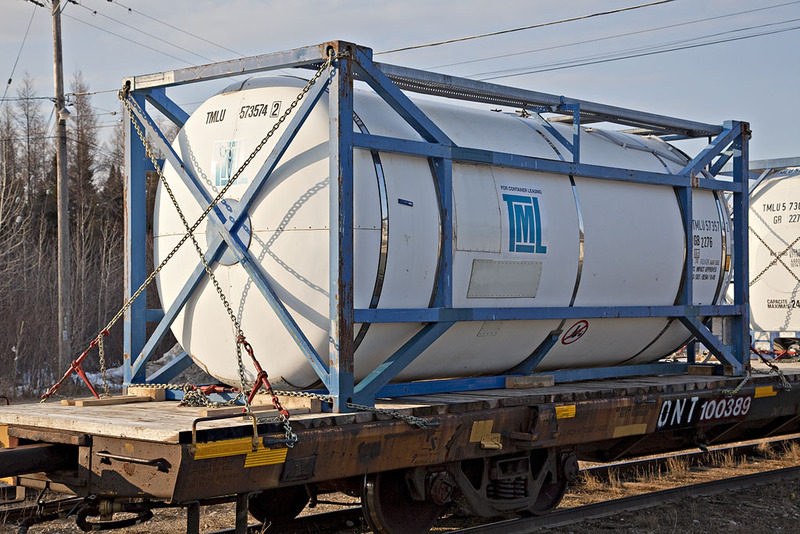 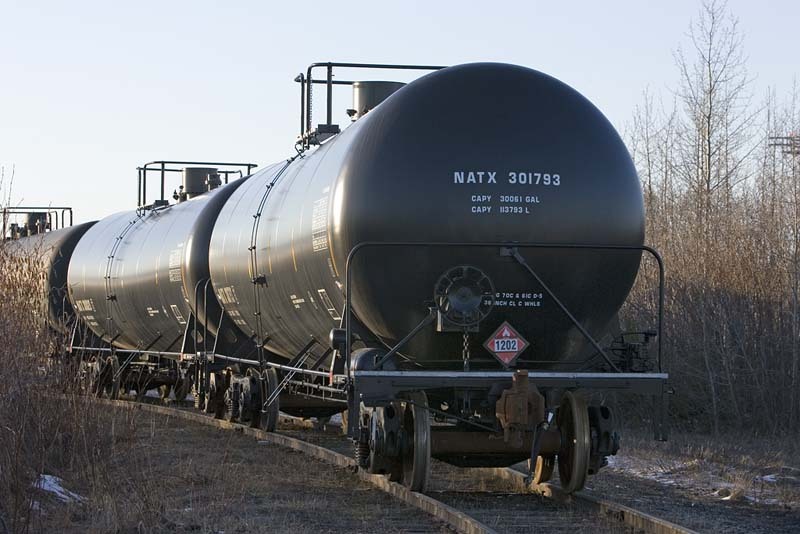 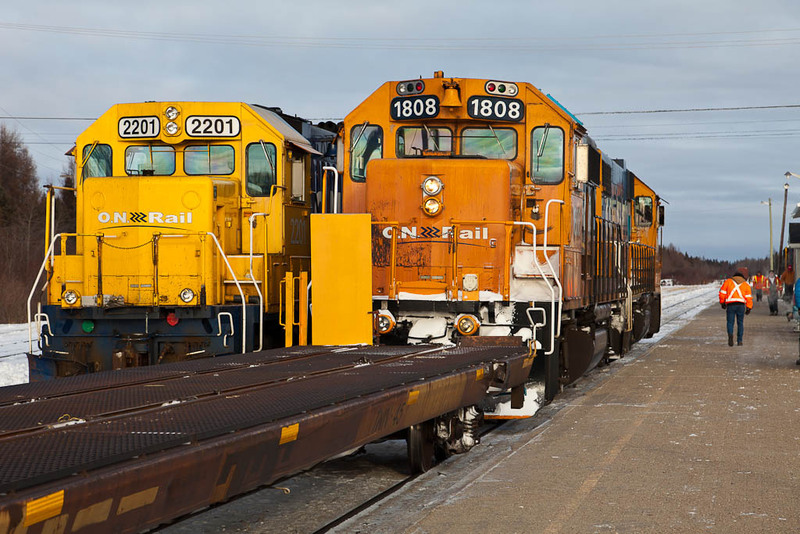 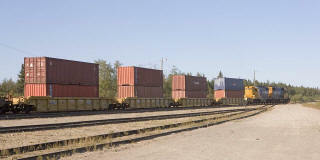 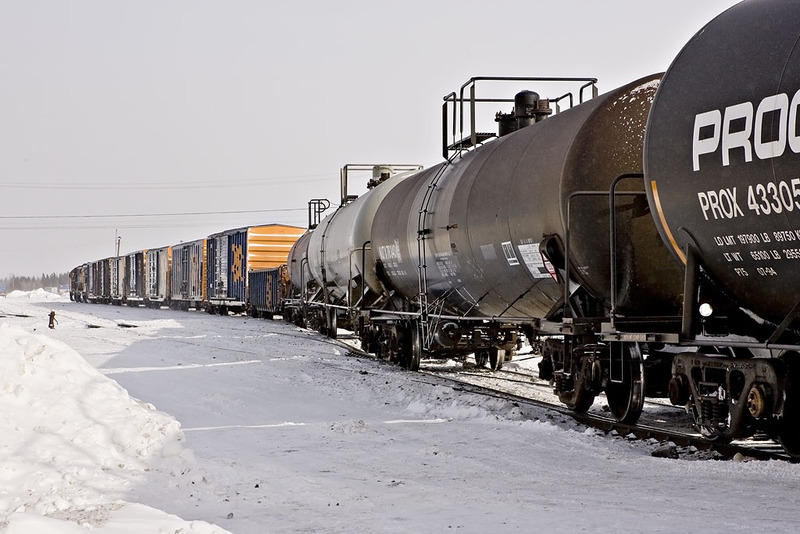 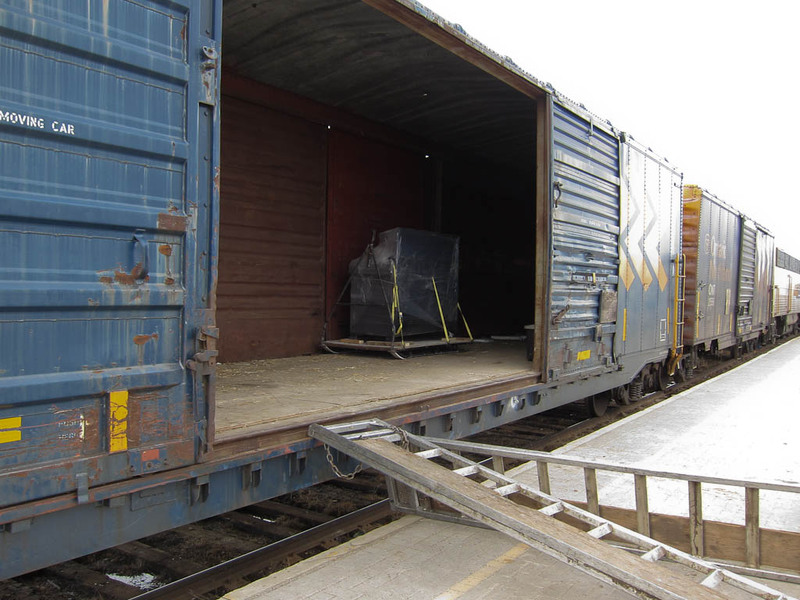 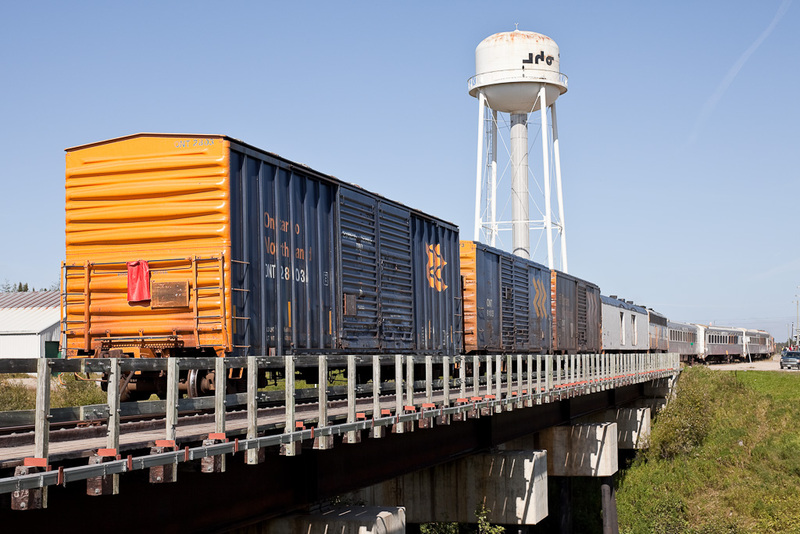 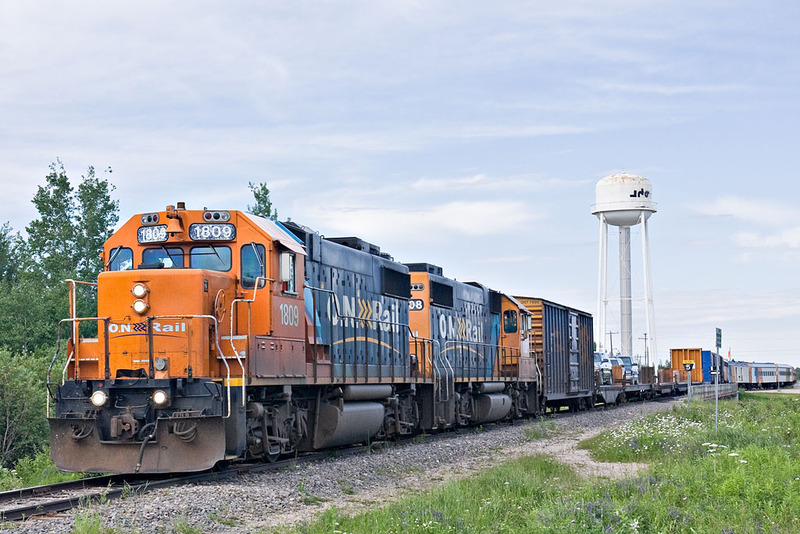 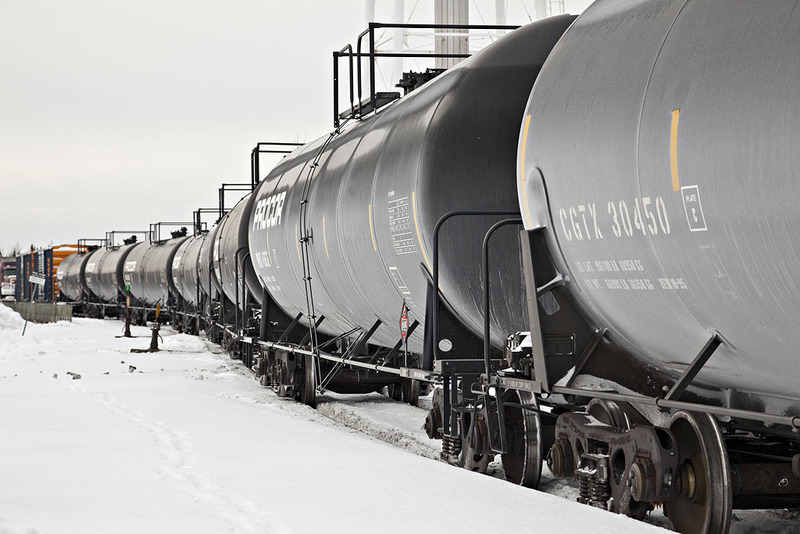 The separate freight trains has carried double stacked containers, fuel tankers and variety of other cargo. 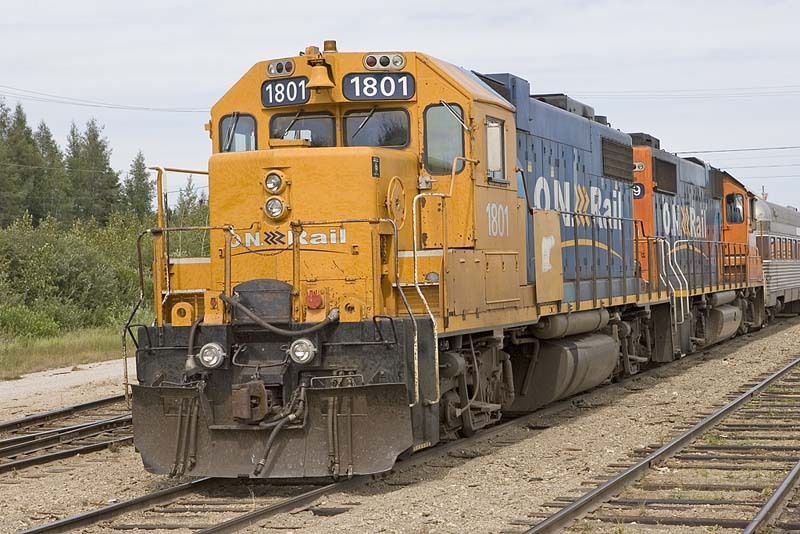 Because it is a "pure" freight train it is not subject to the same length restrictions as the Little Bear was. 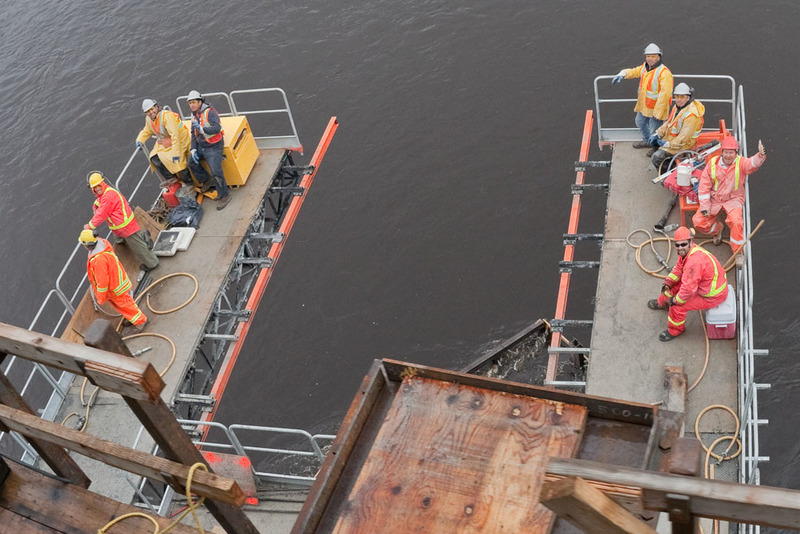 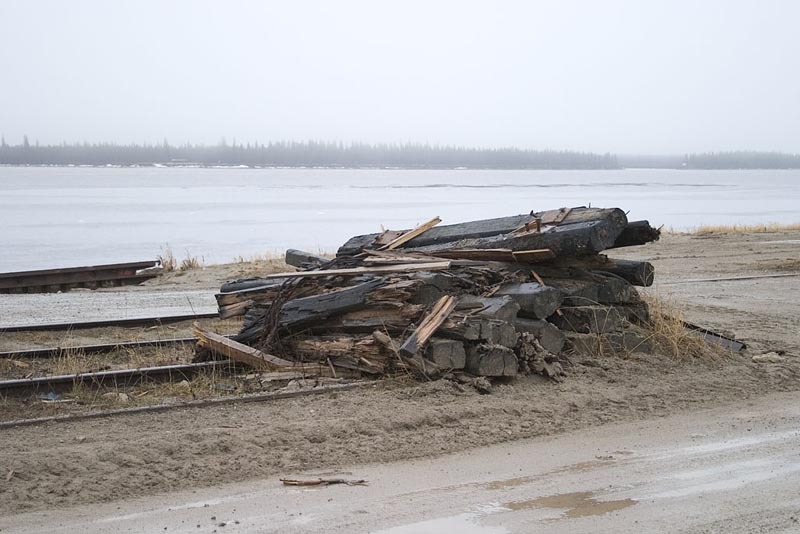 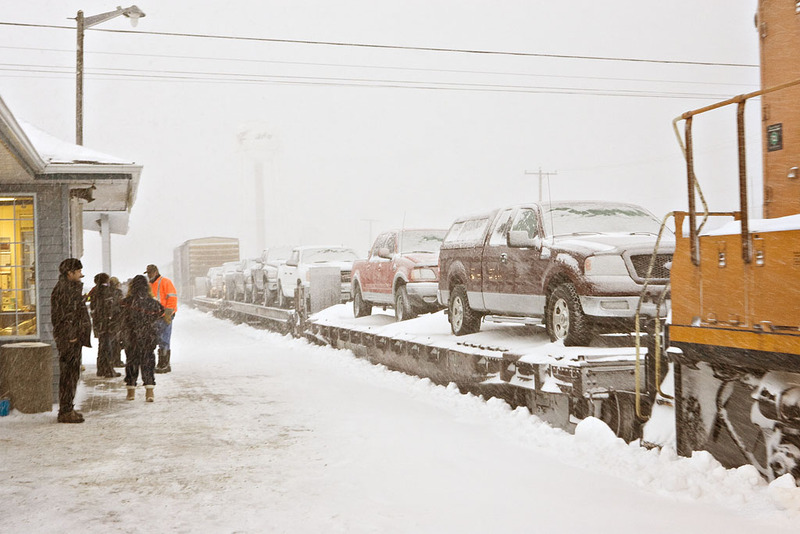 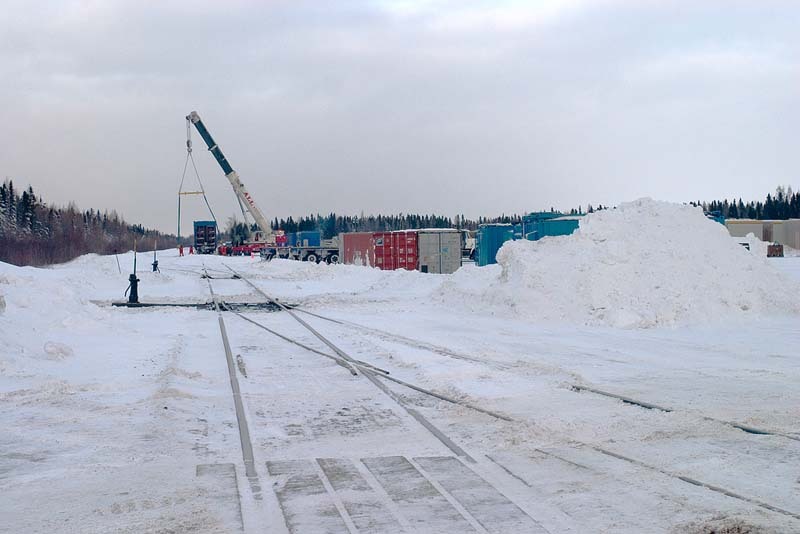 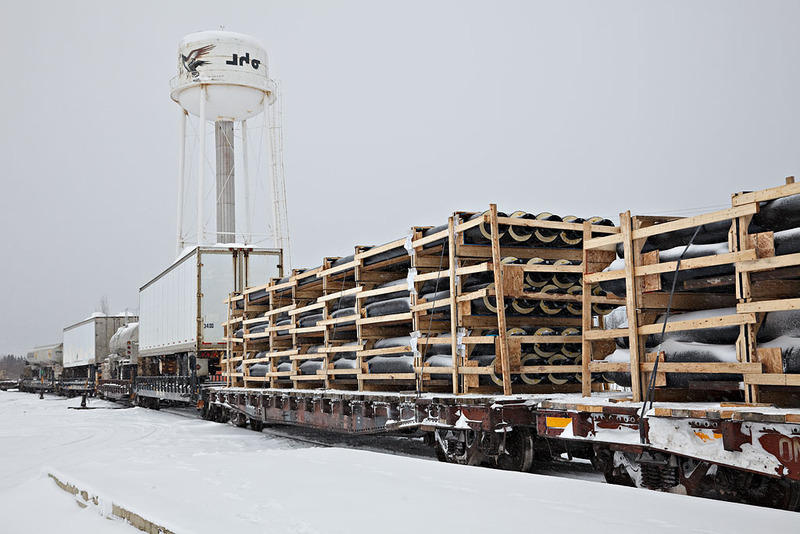 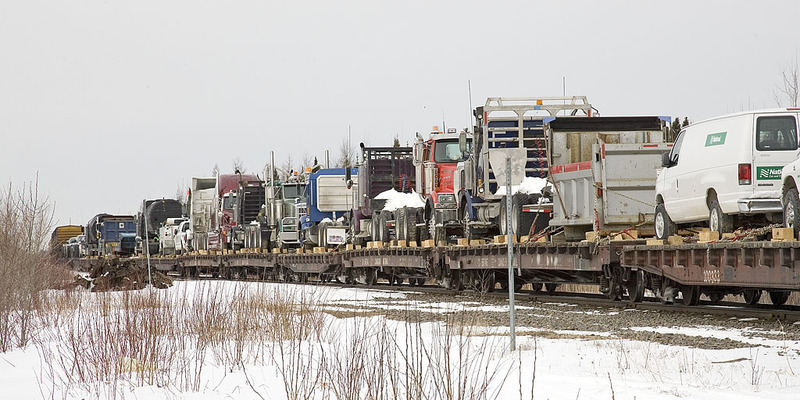 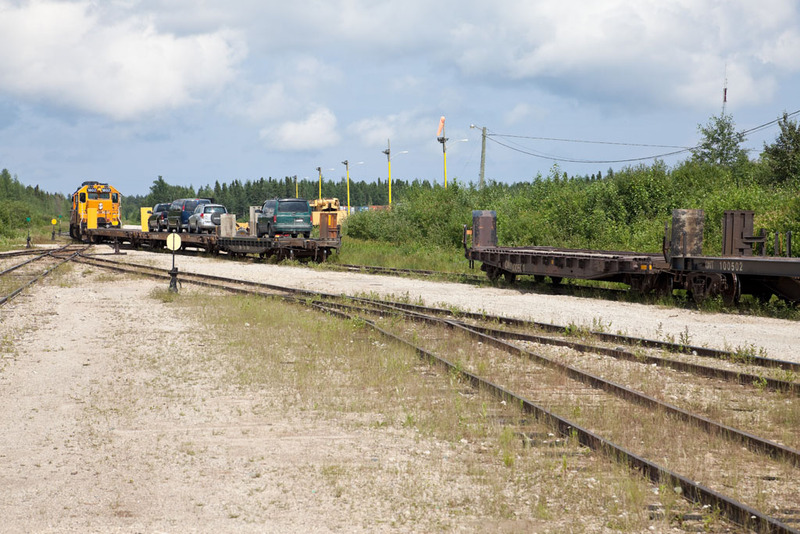 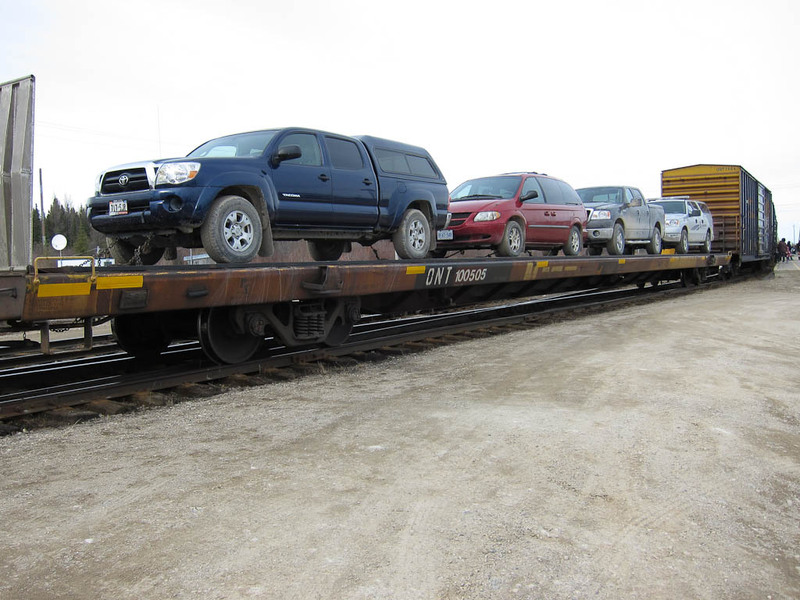 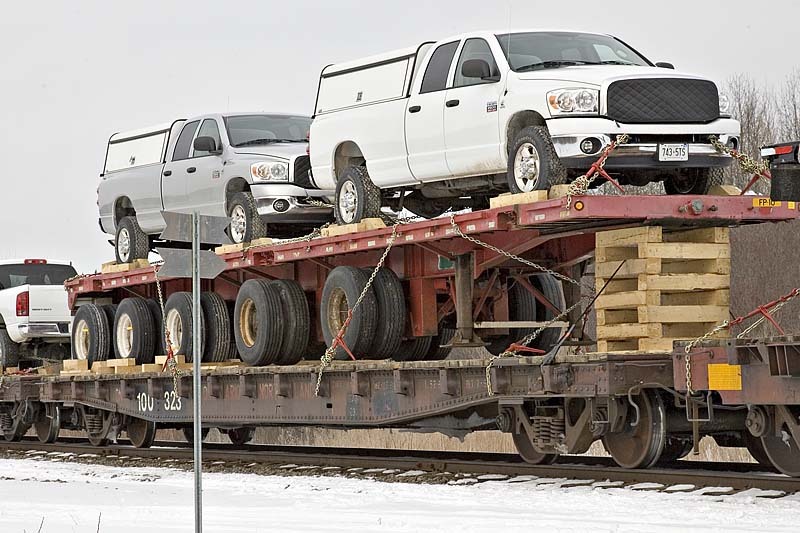 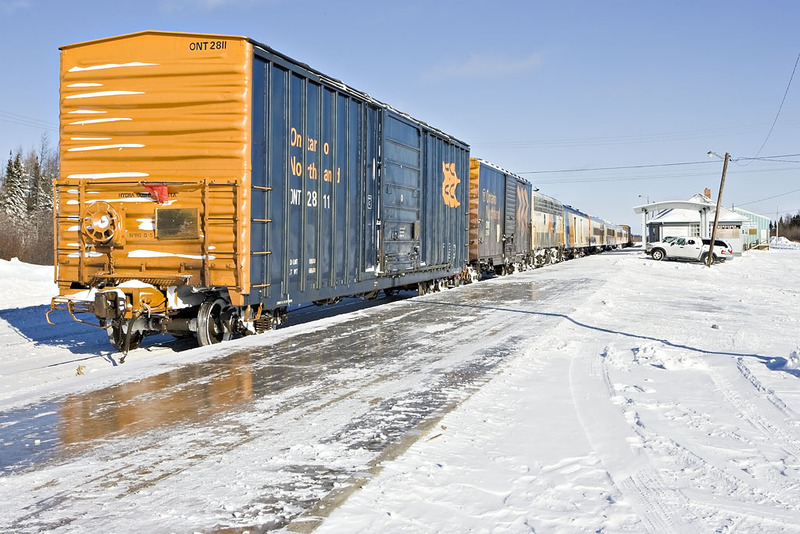 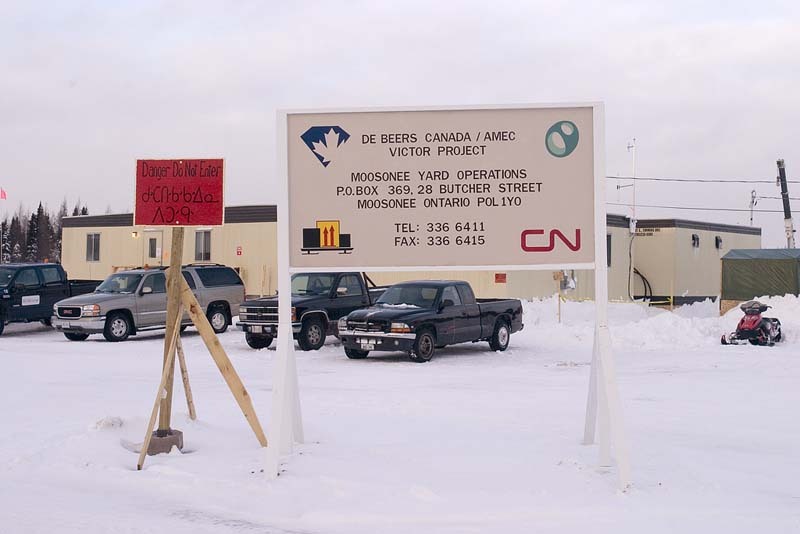 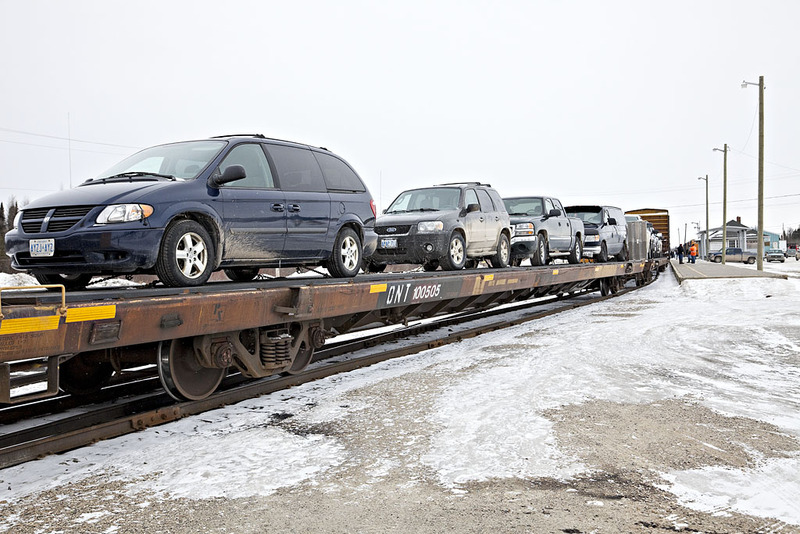 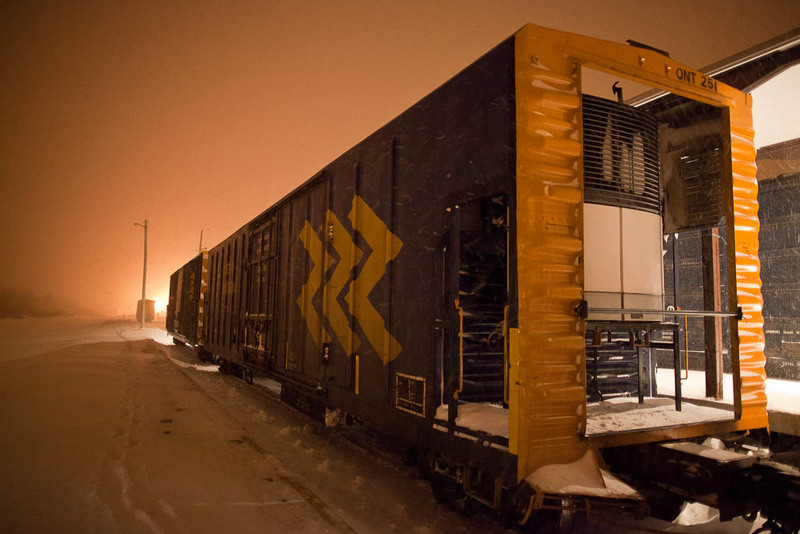 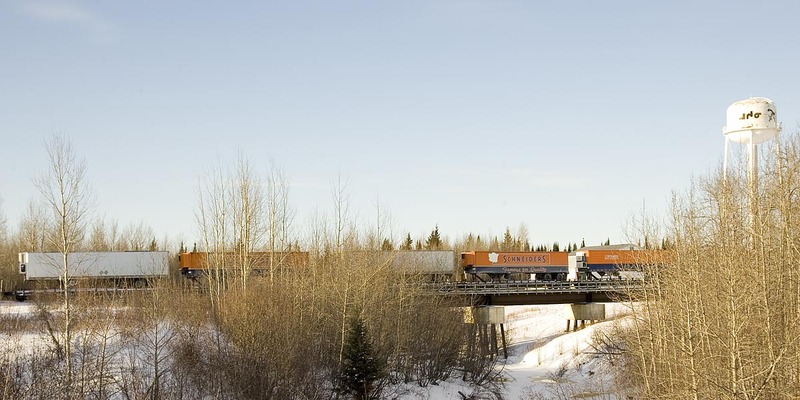 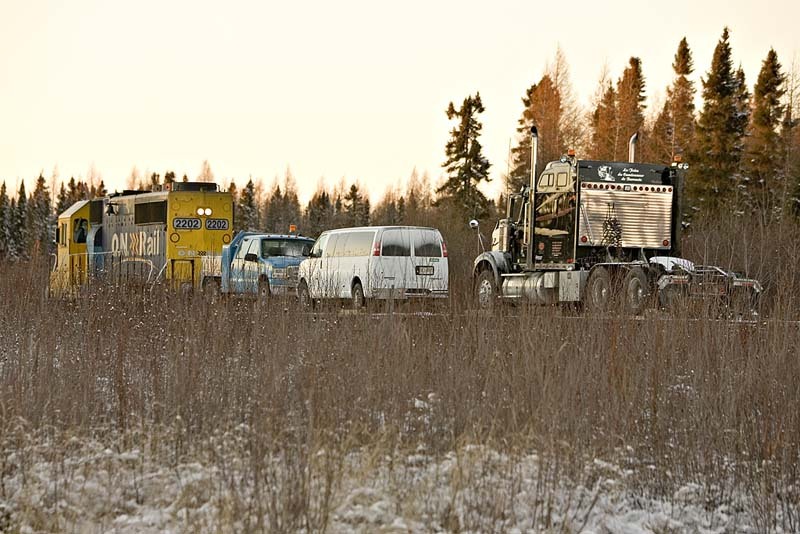 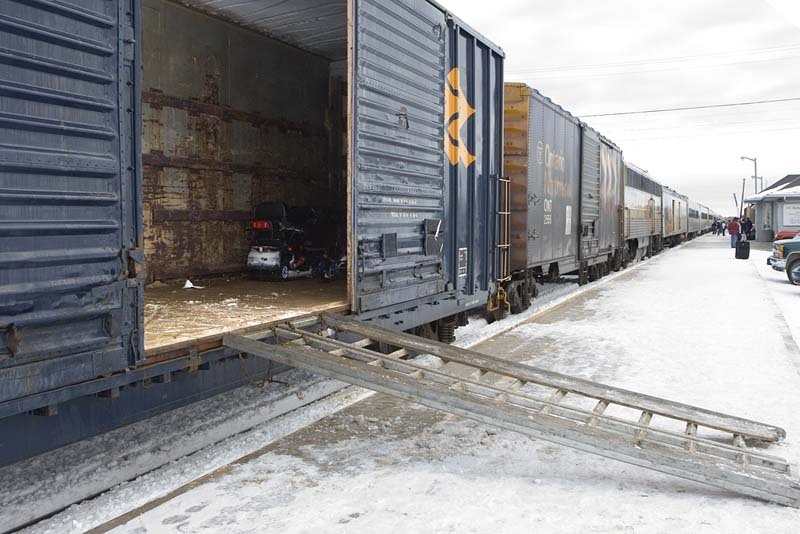 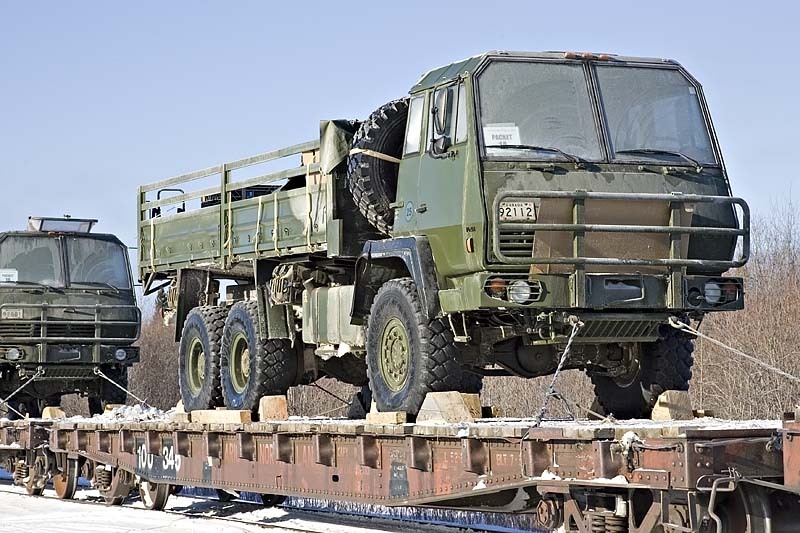 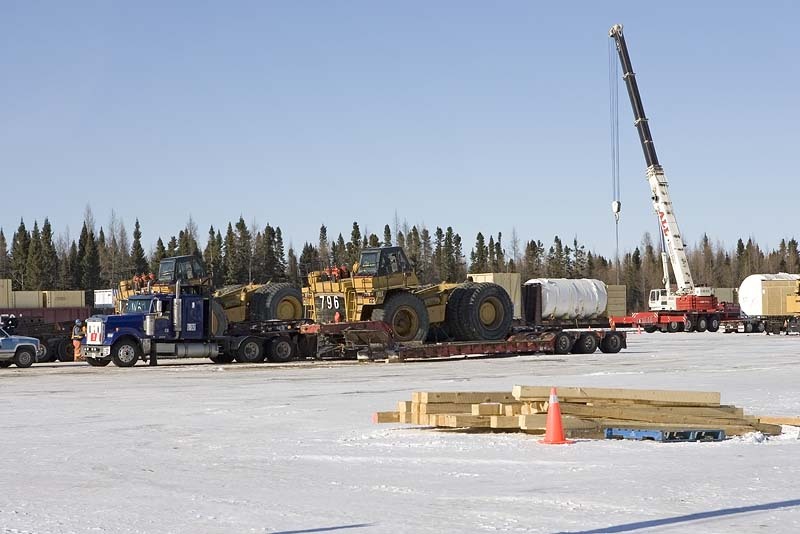 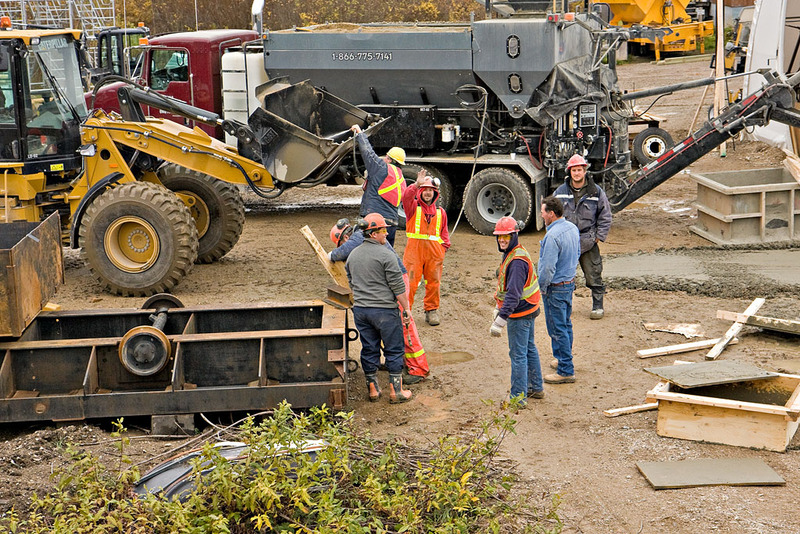 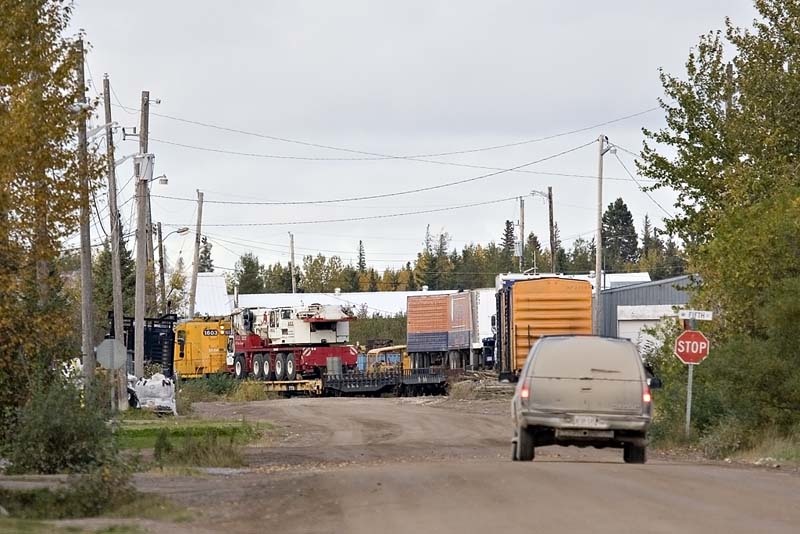 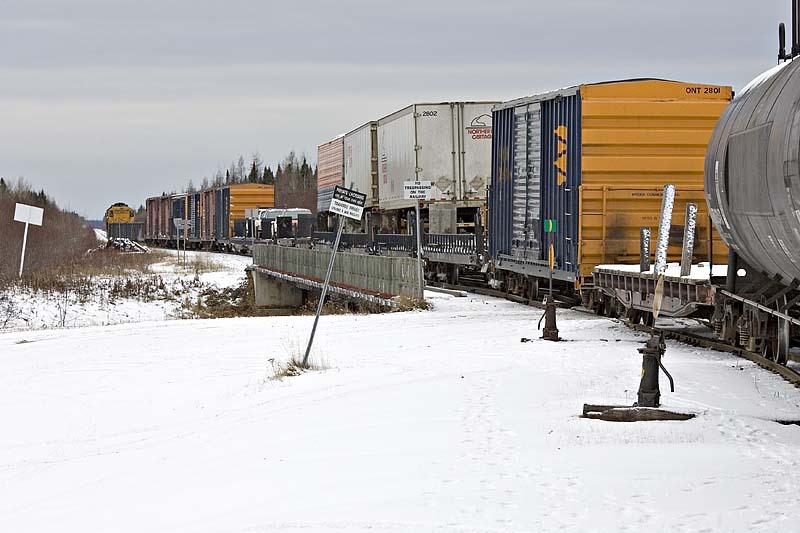 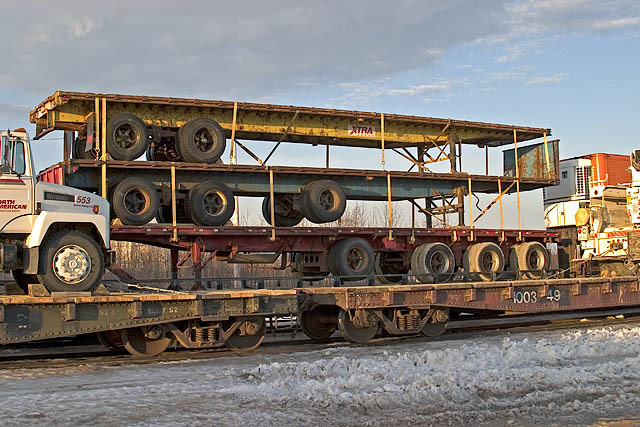 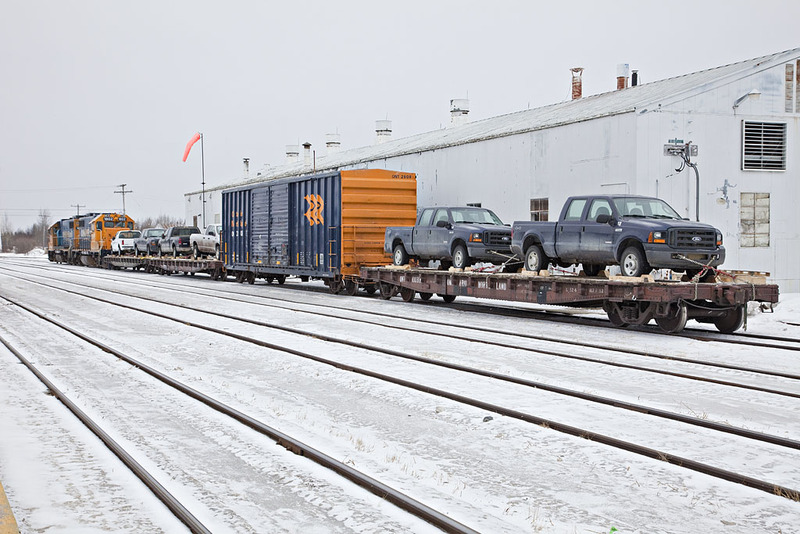 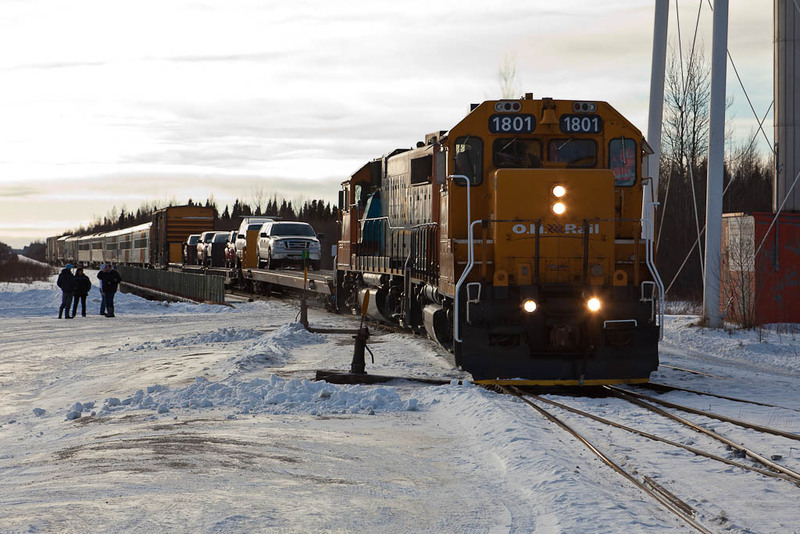 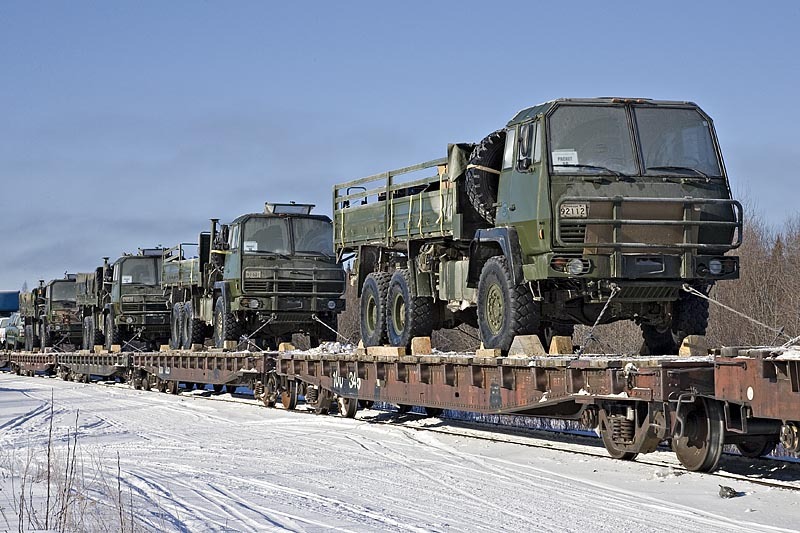 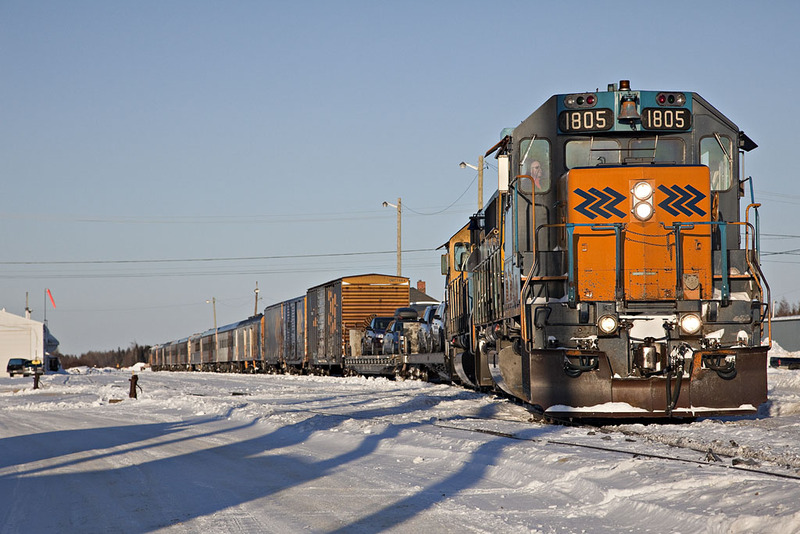 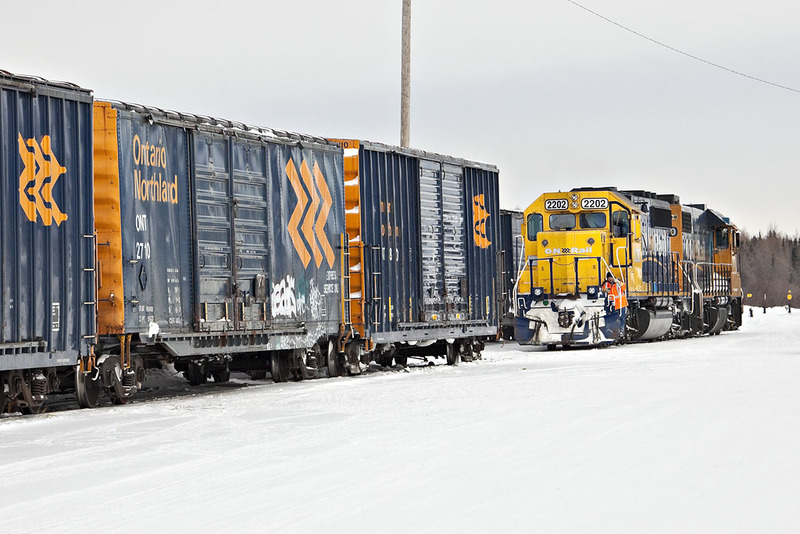 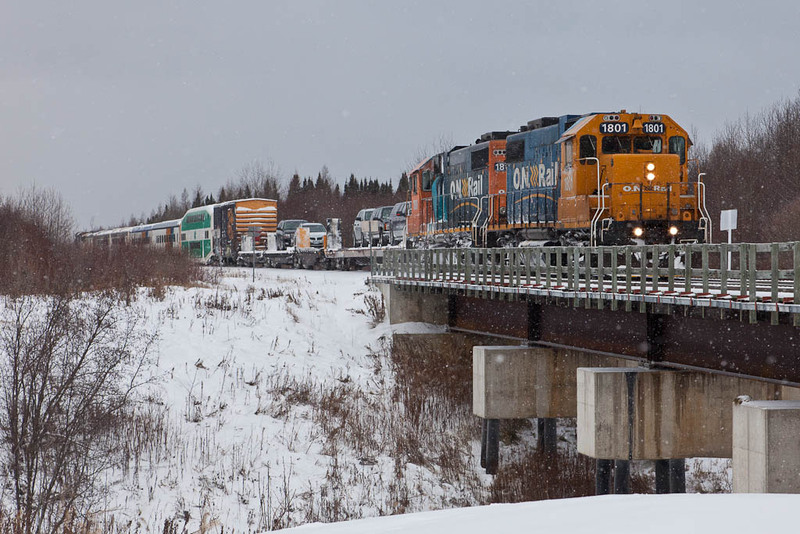 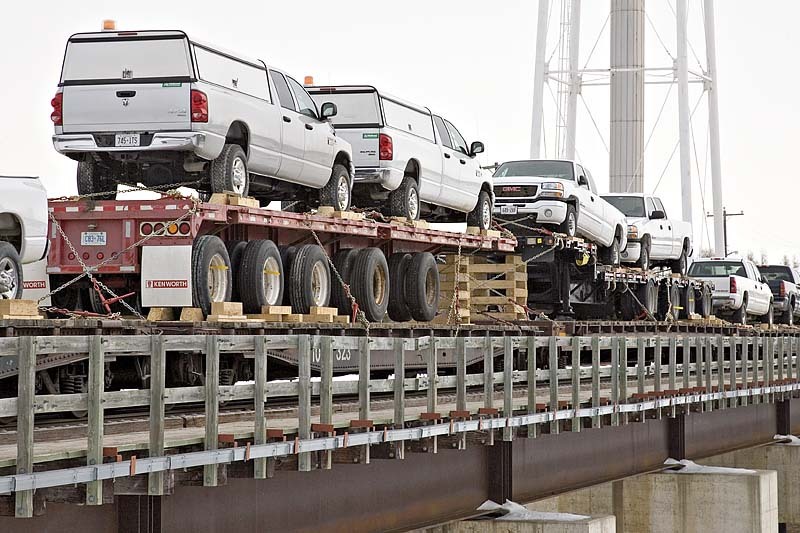 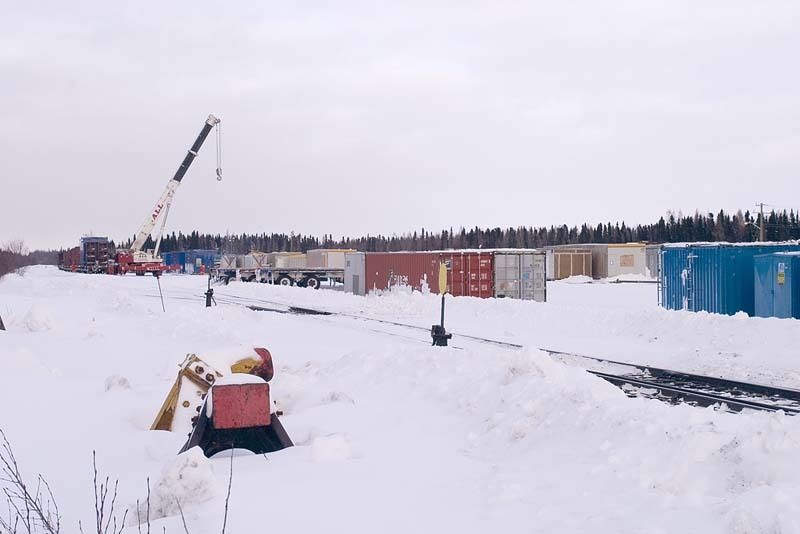 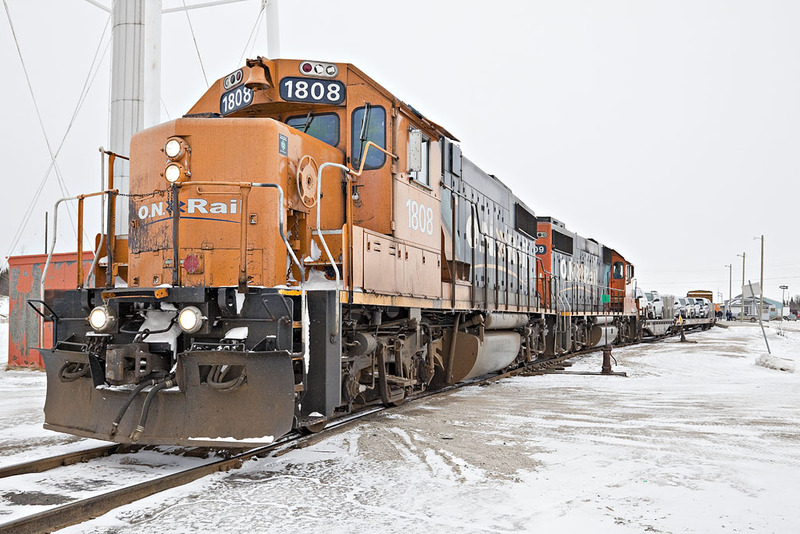 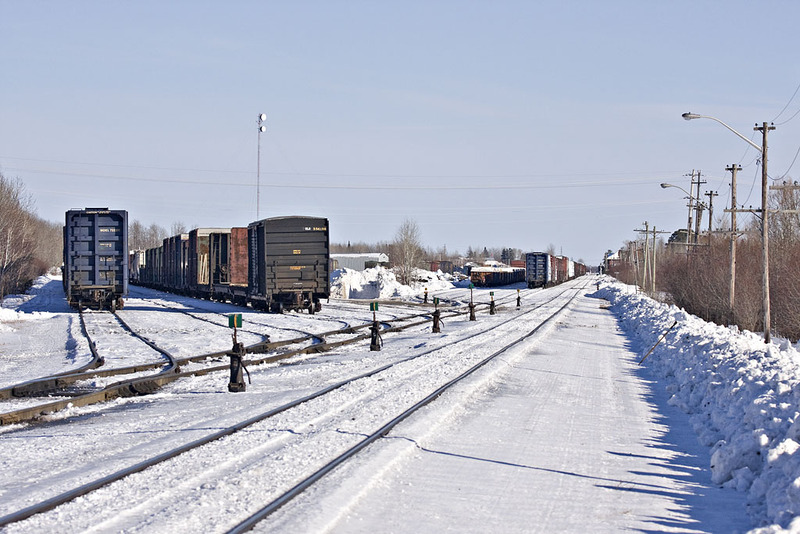 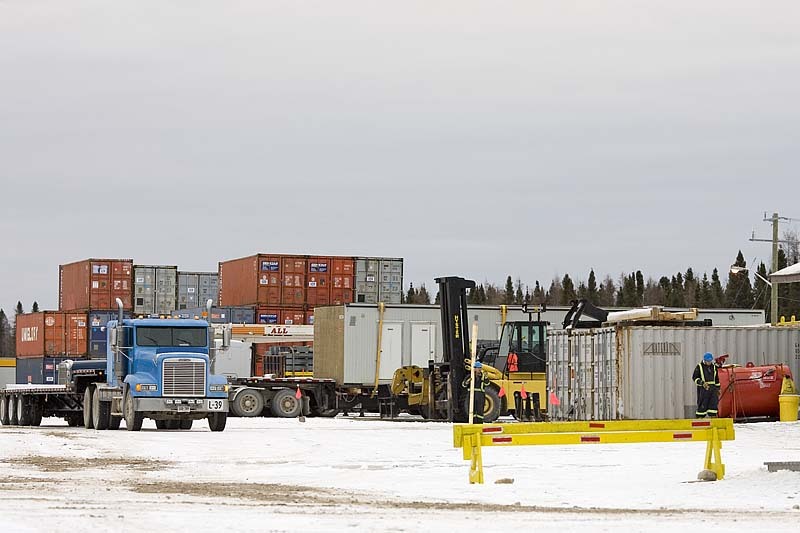 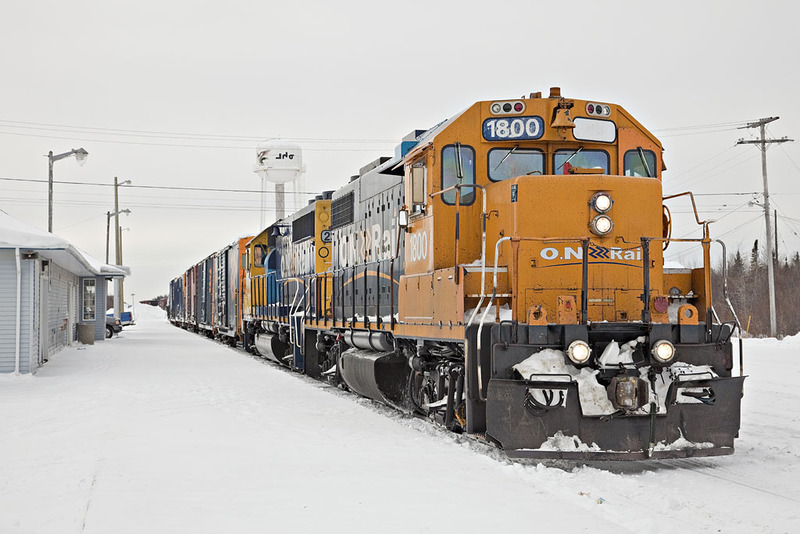 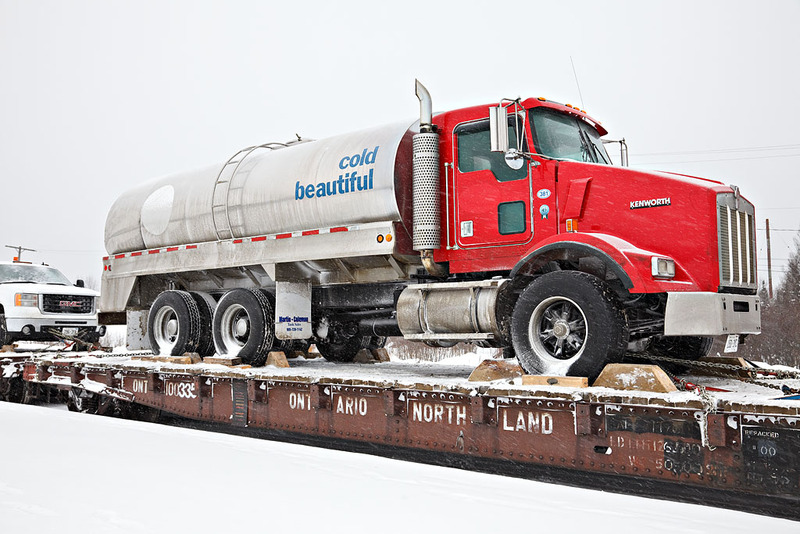 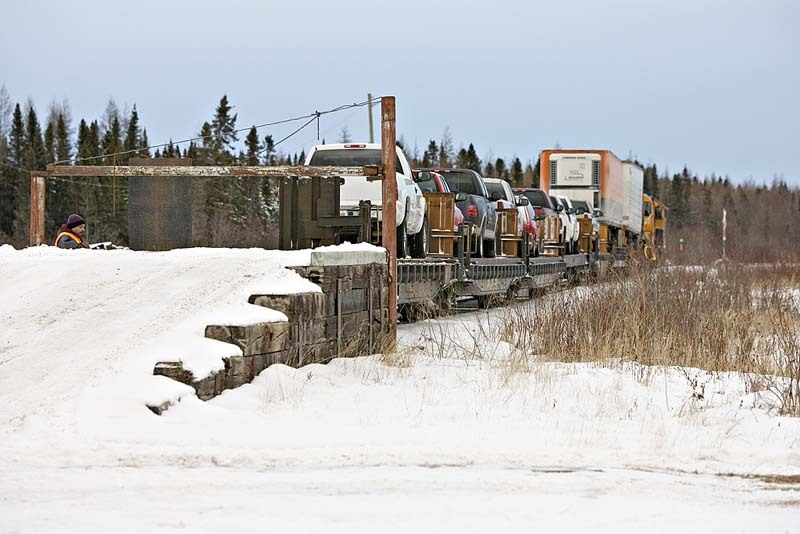 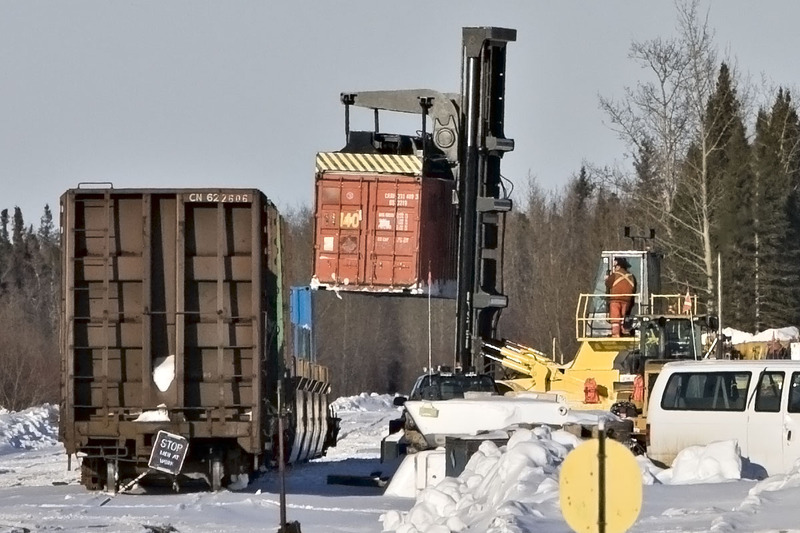 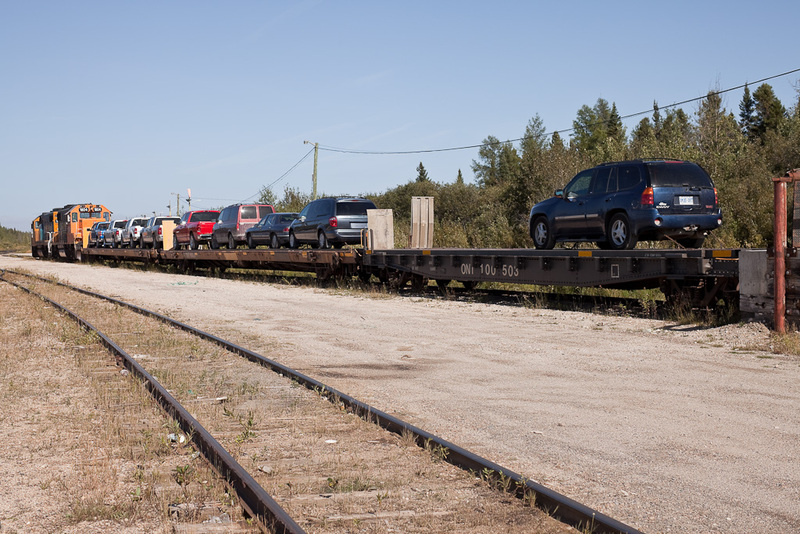 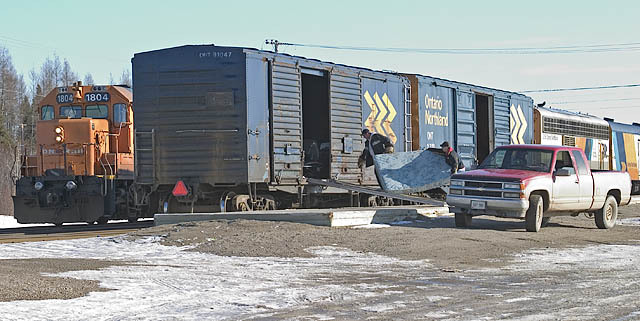 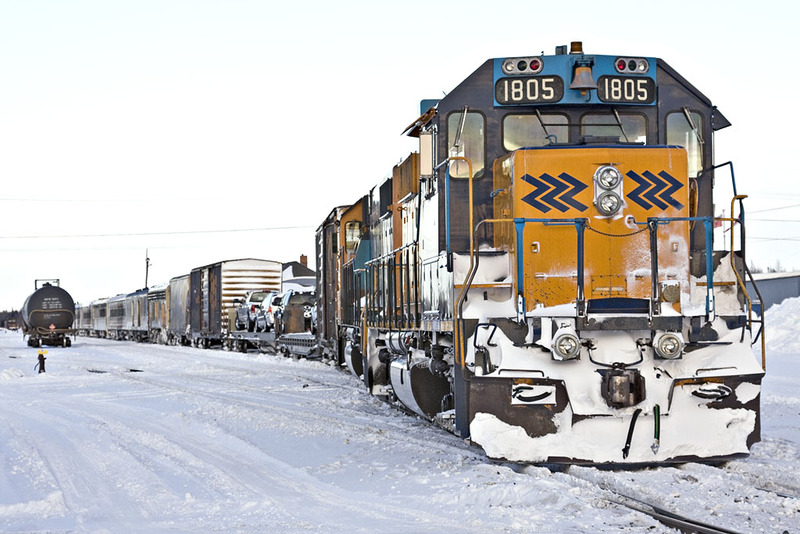 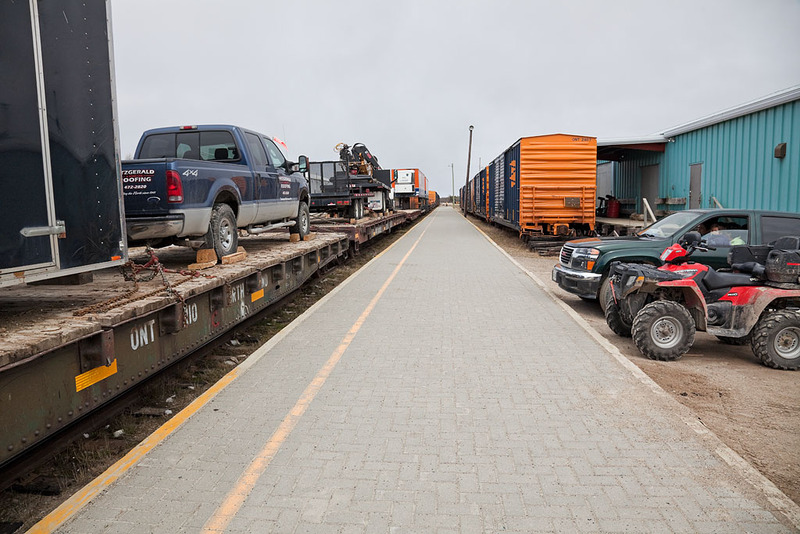 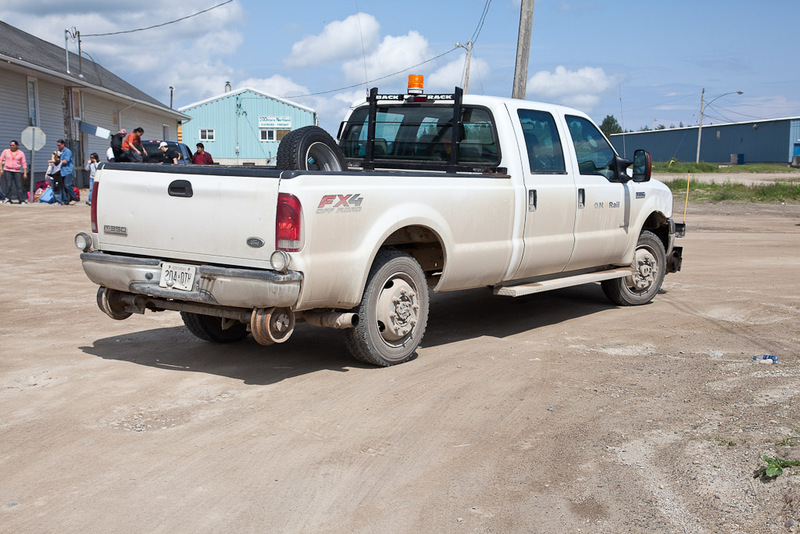 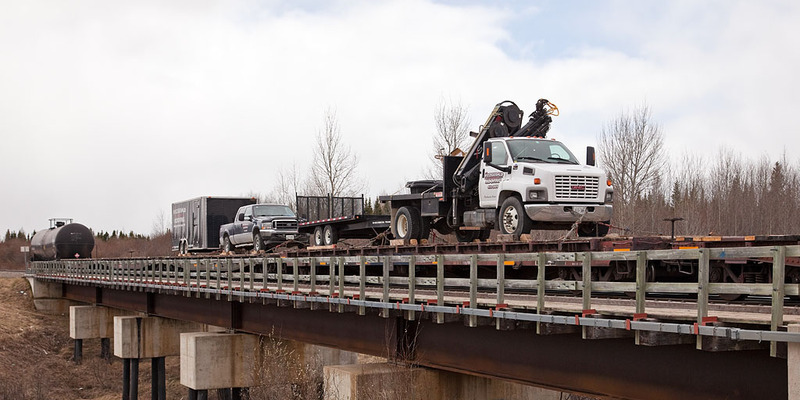 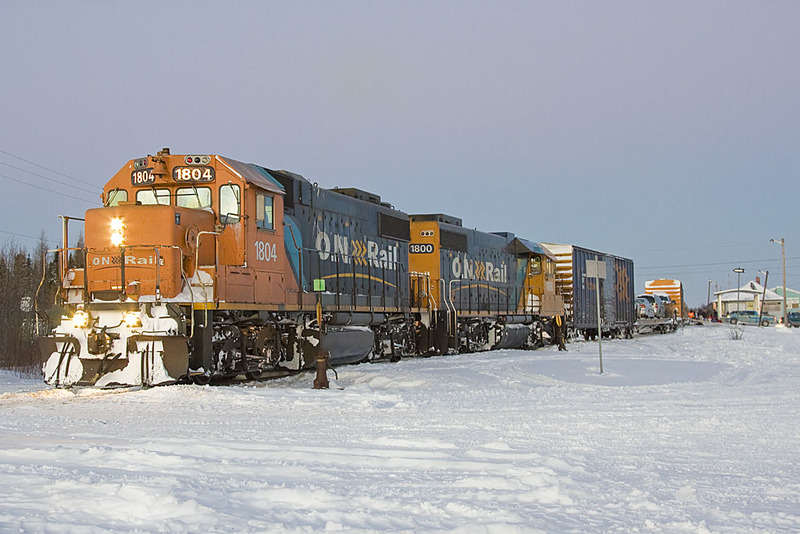 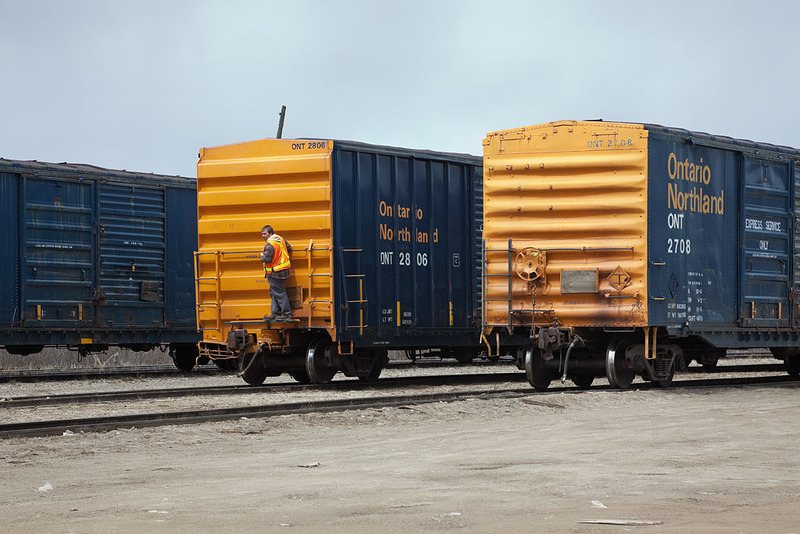 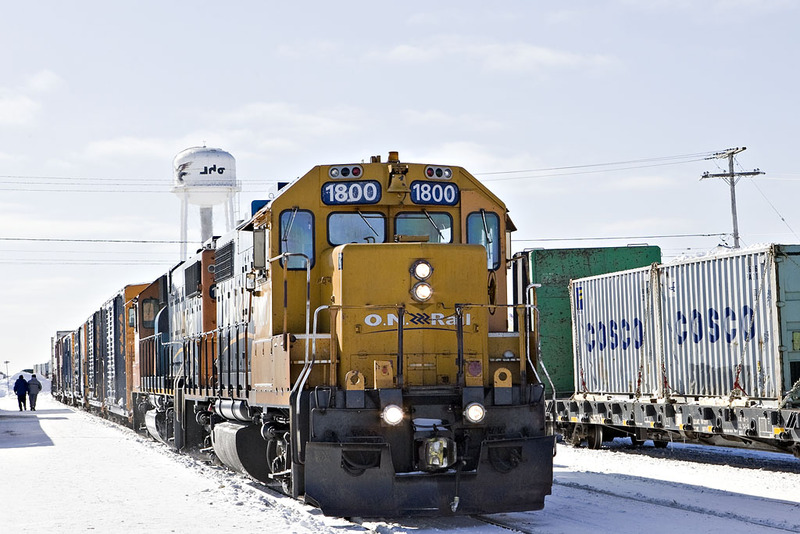 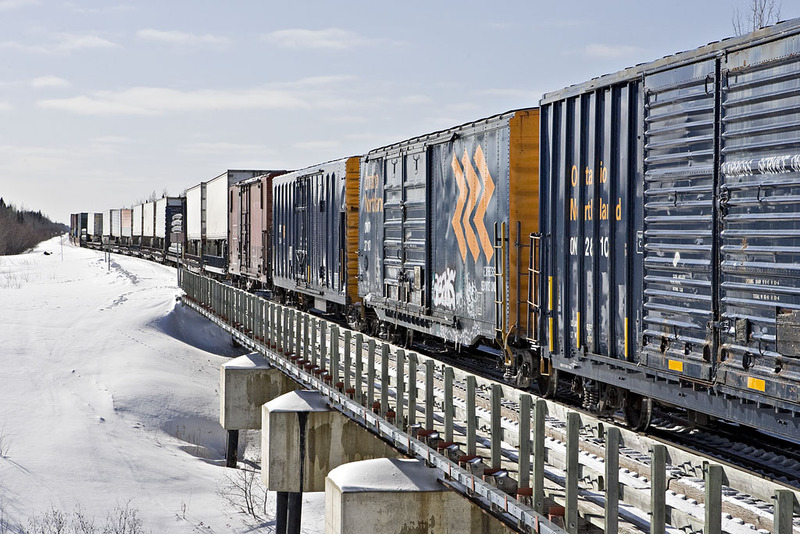 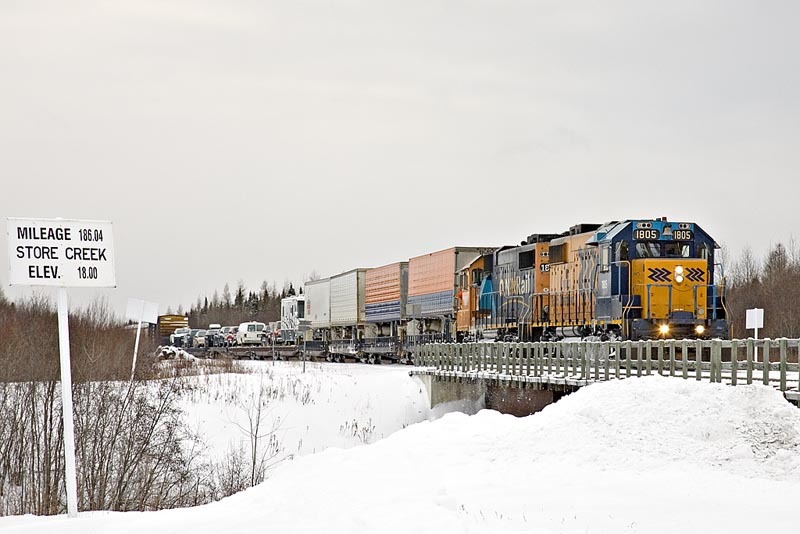 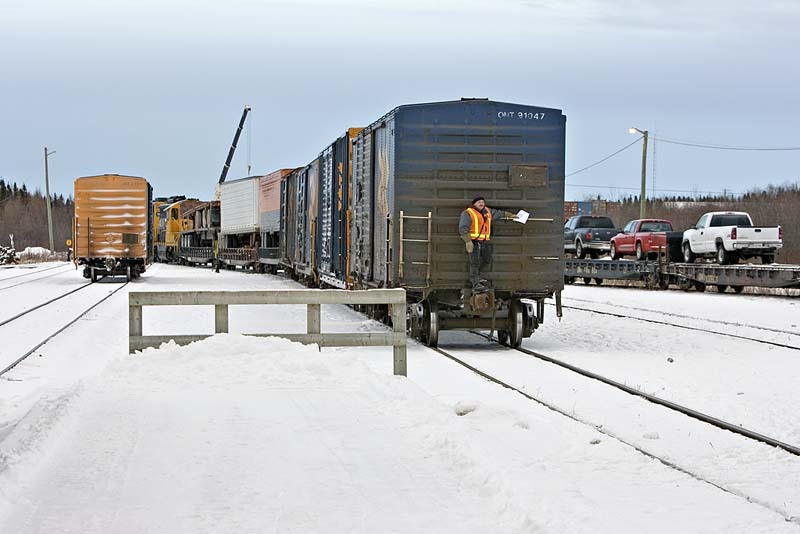 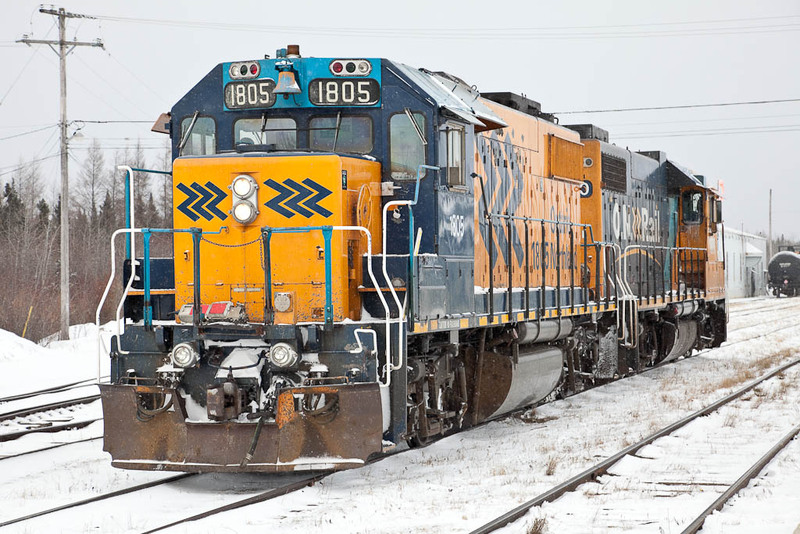 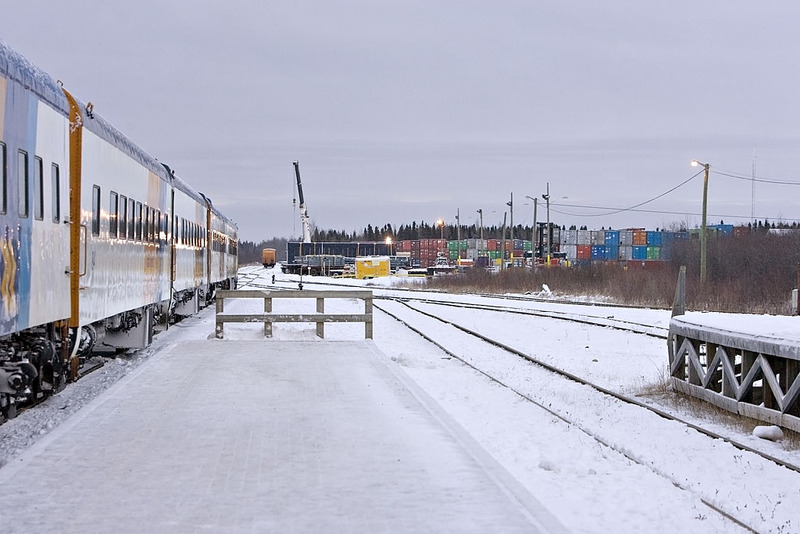 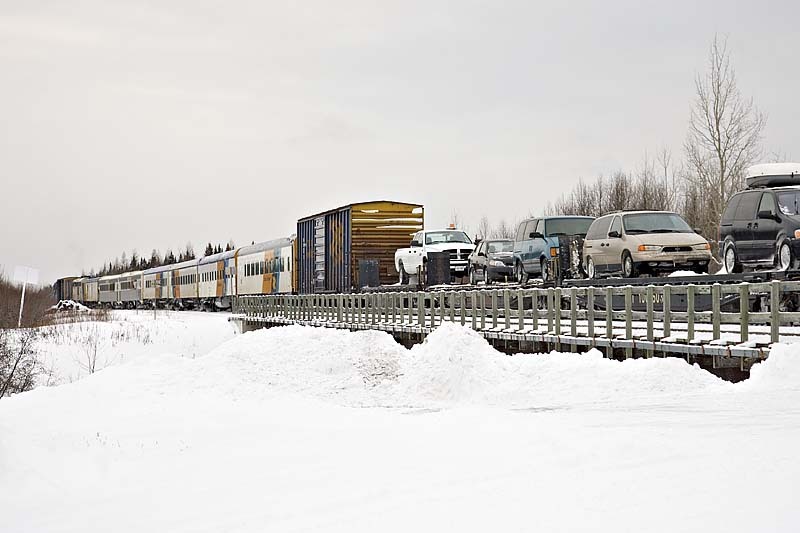 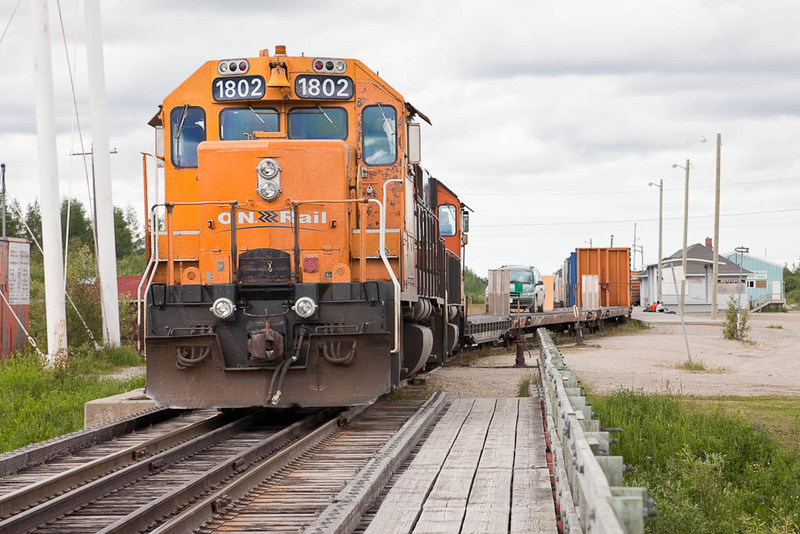 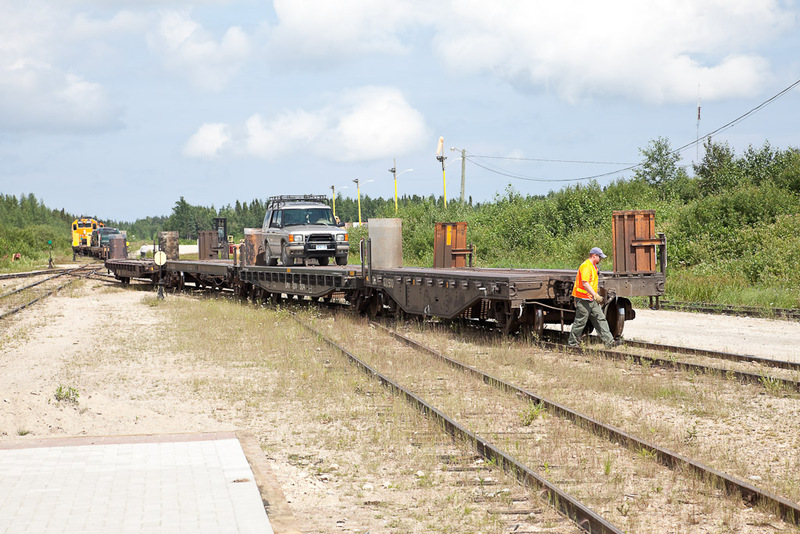 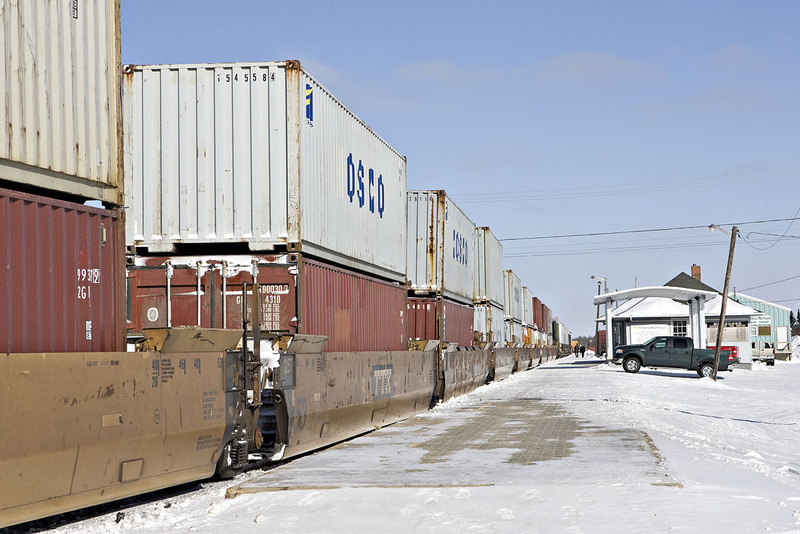 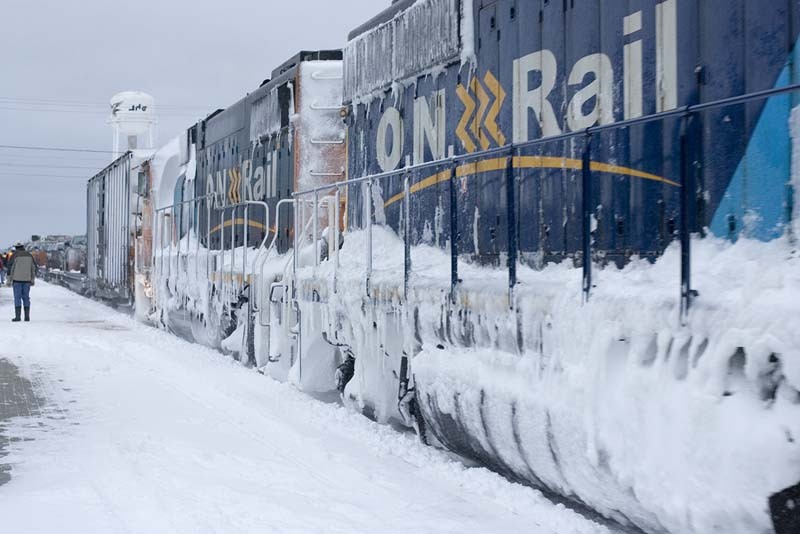 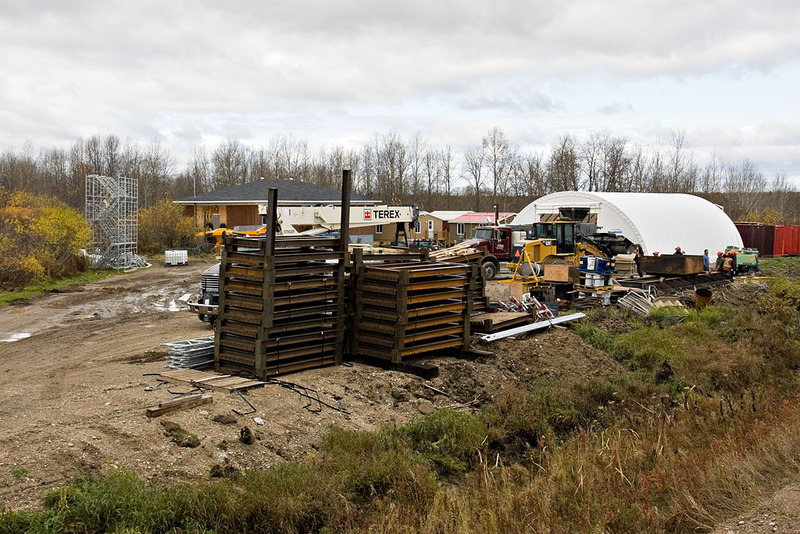 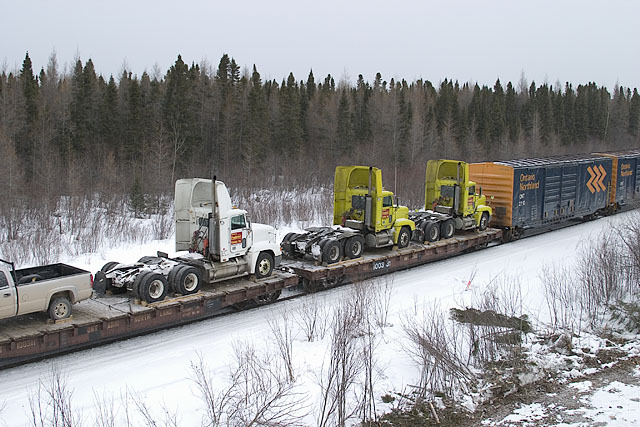 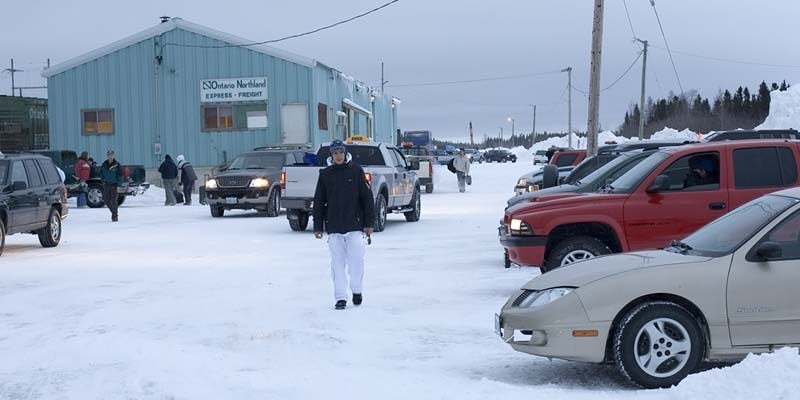 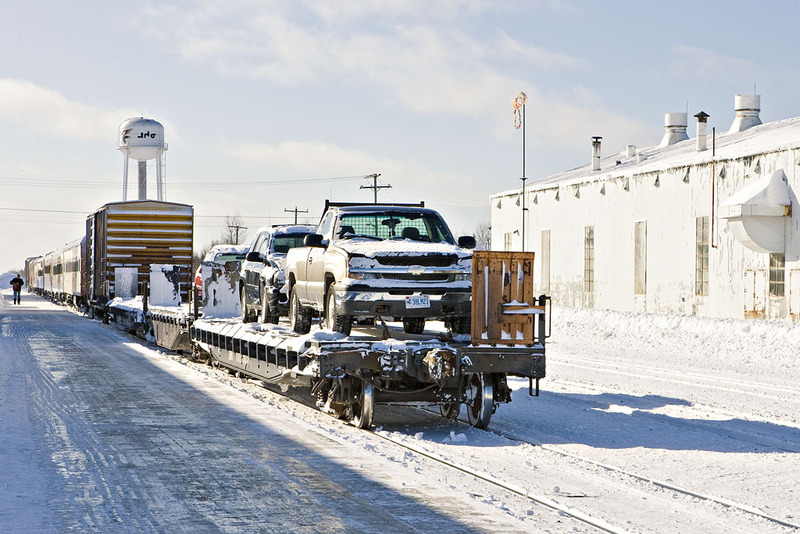 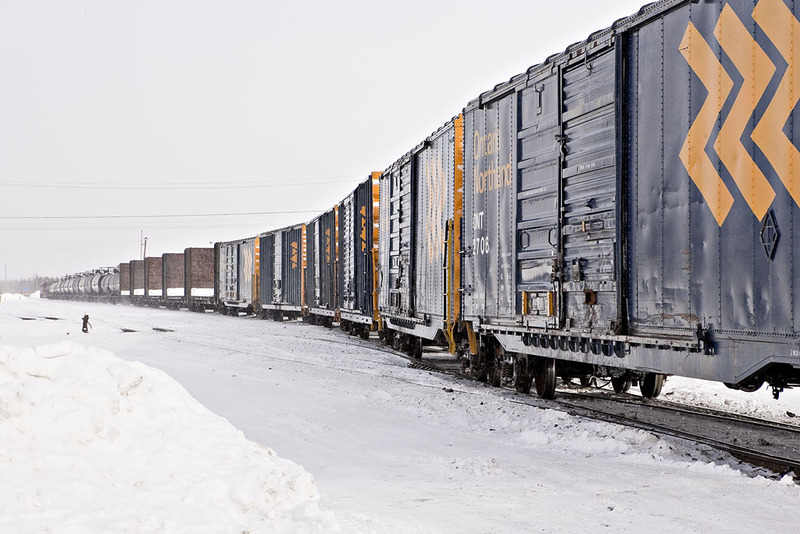 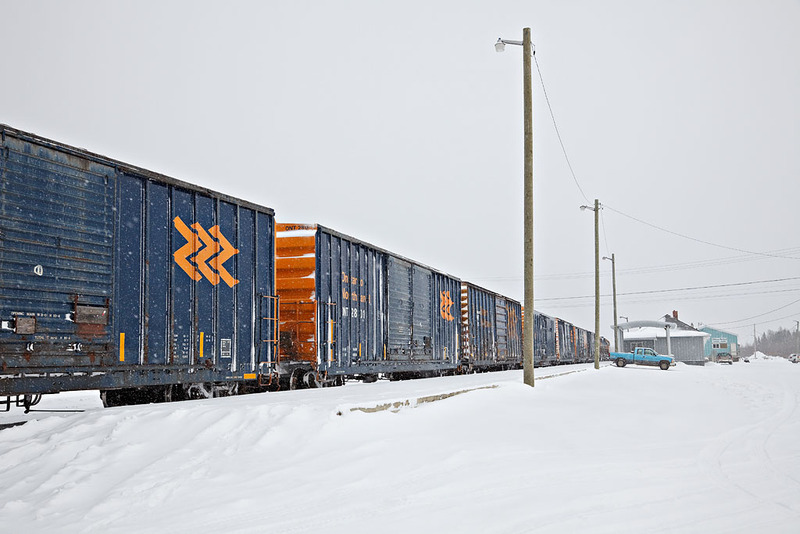 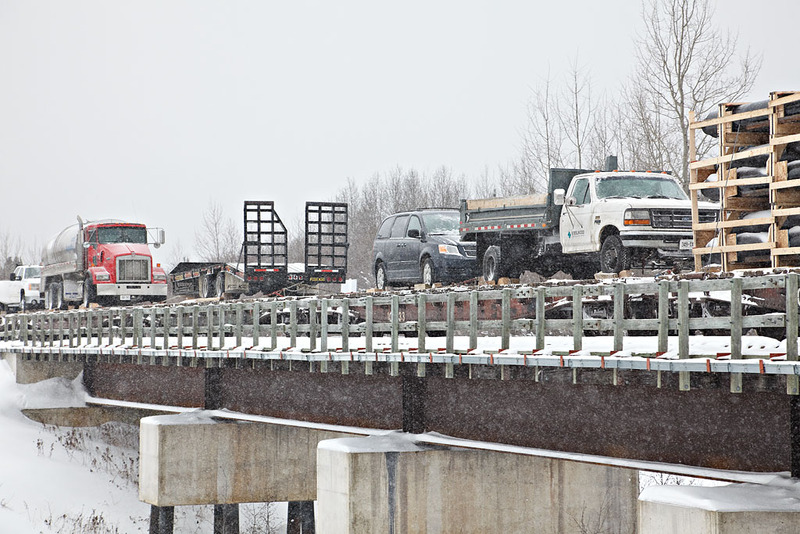 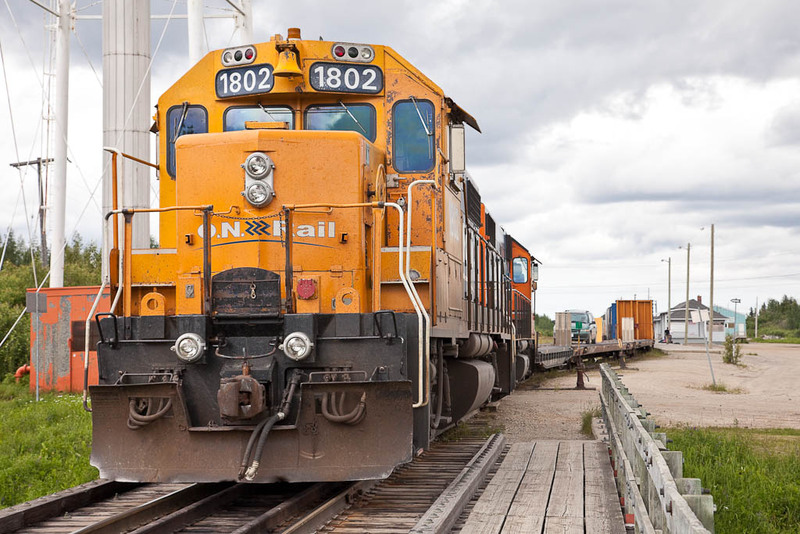 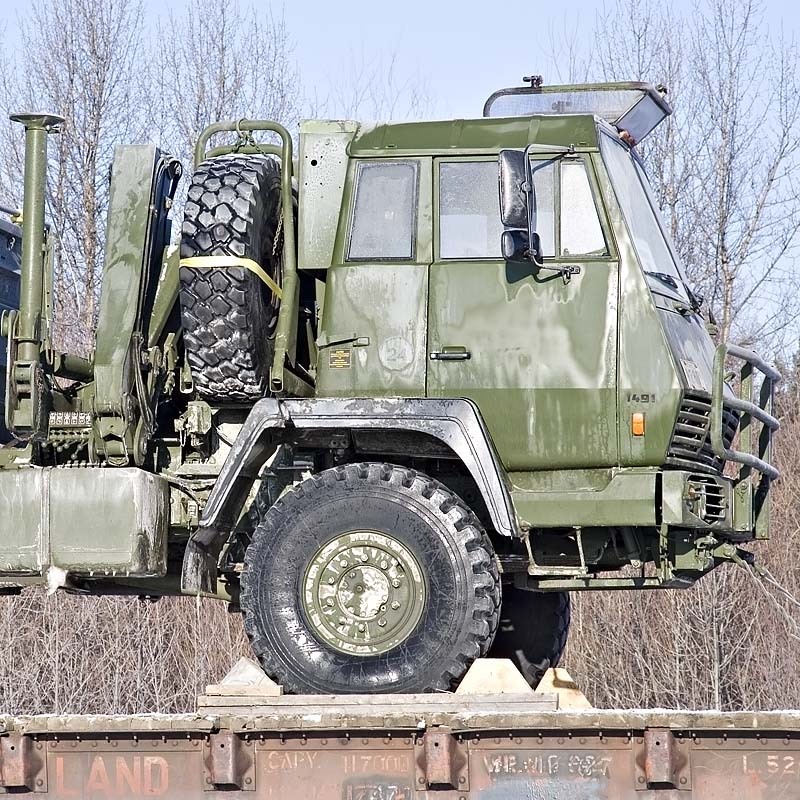 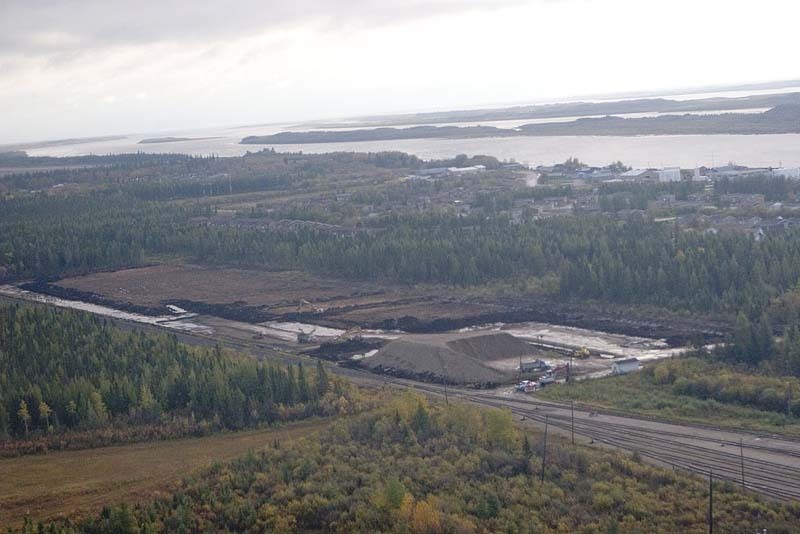 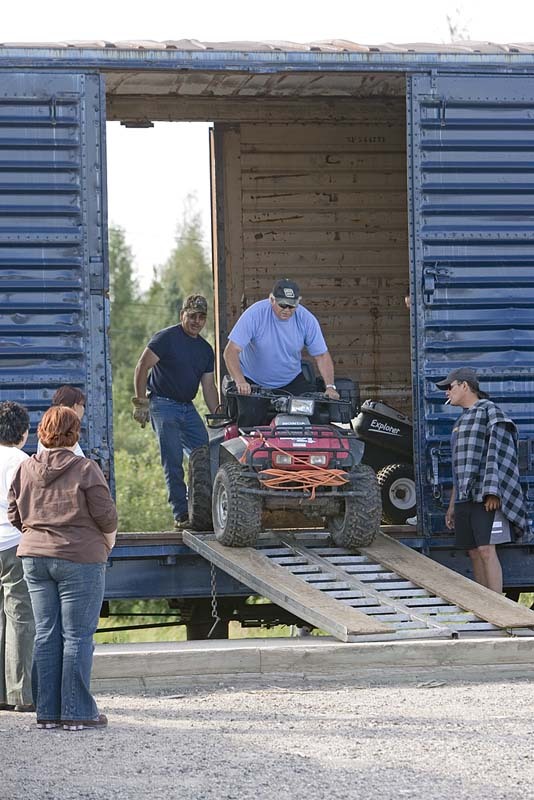 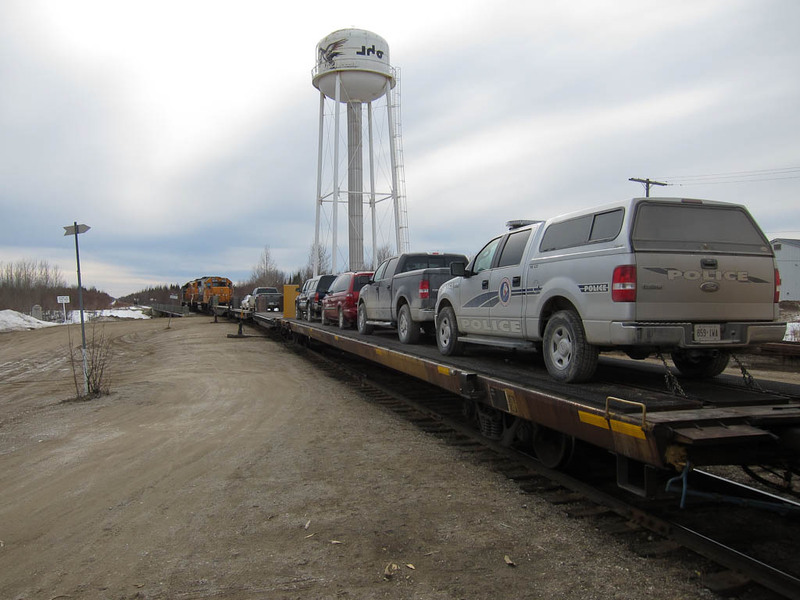 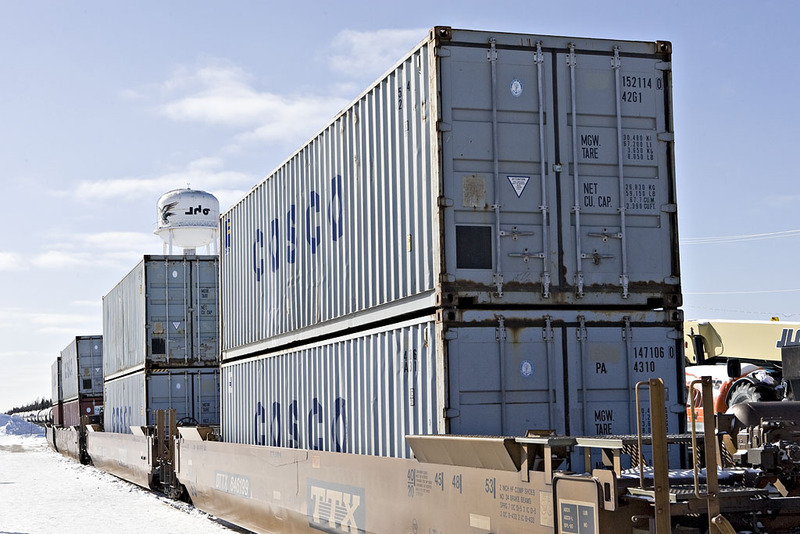 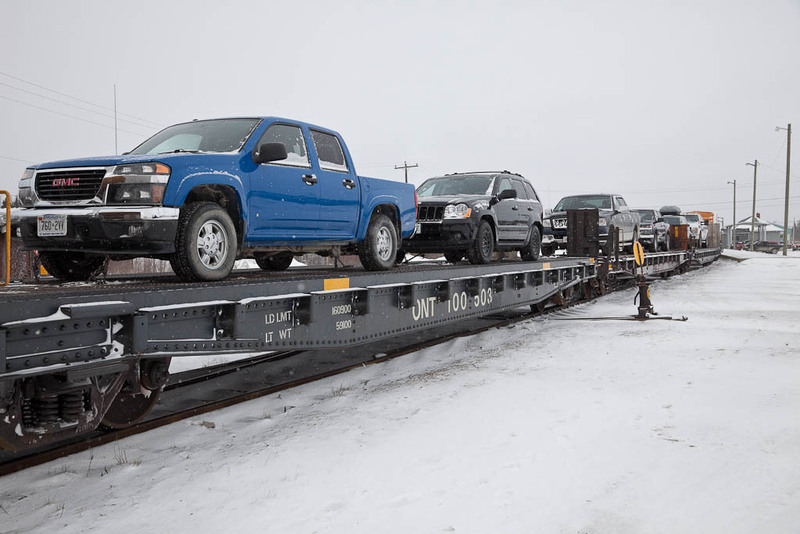 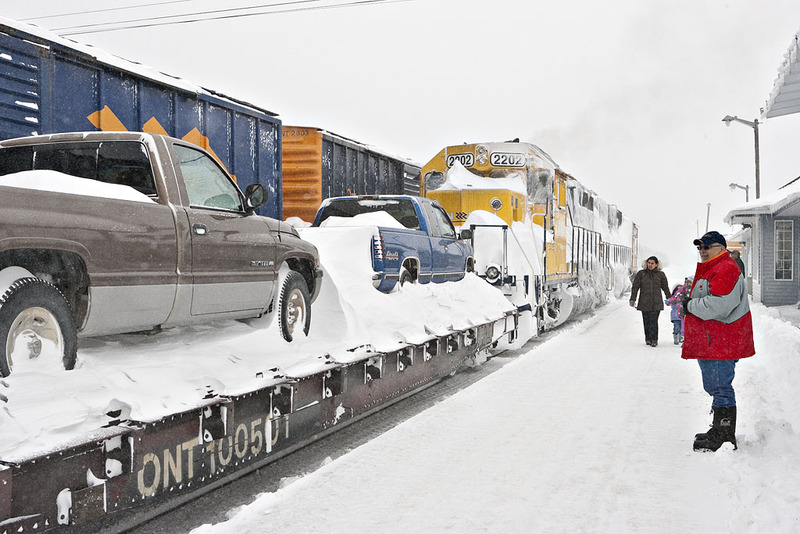 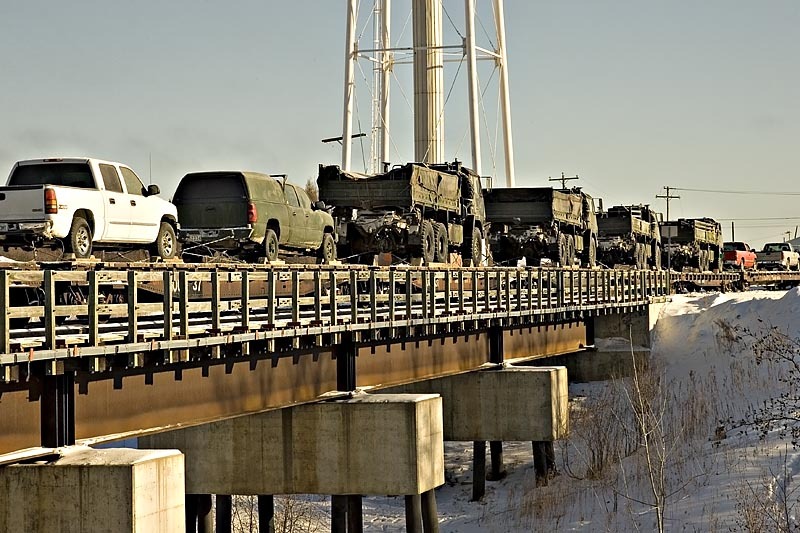 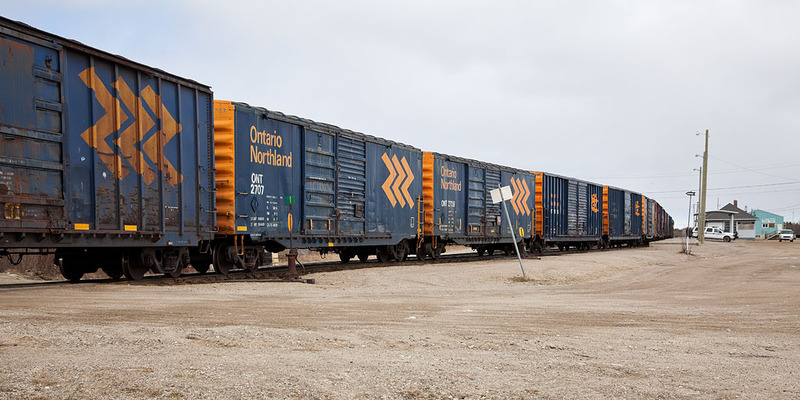 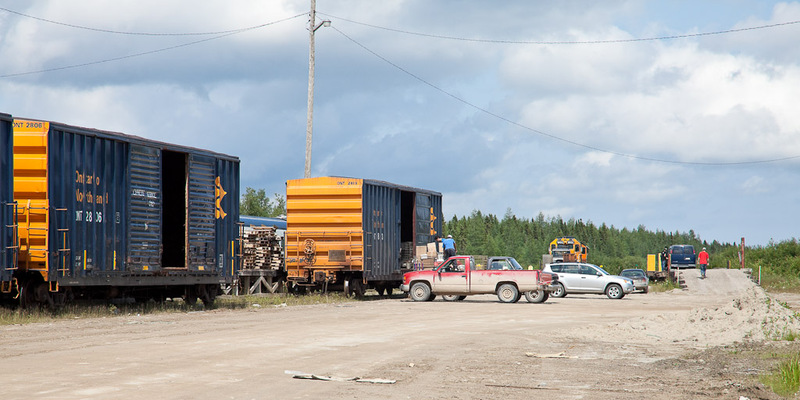 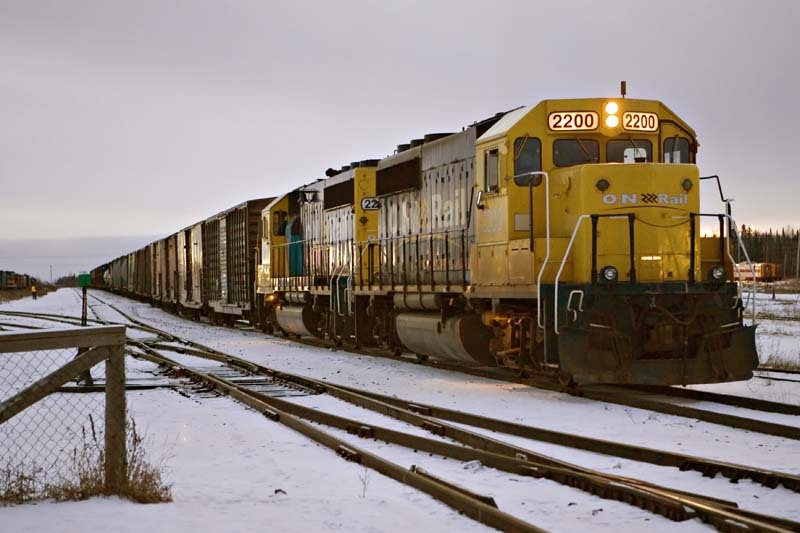 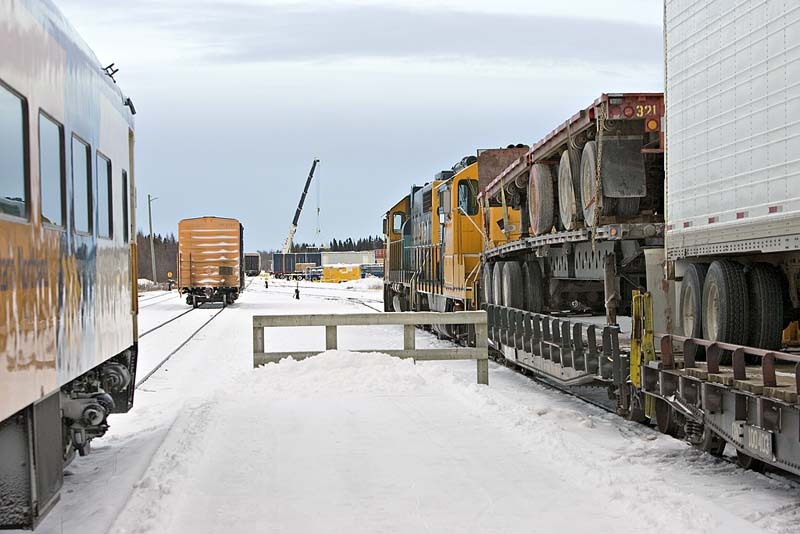 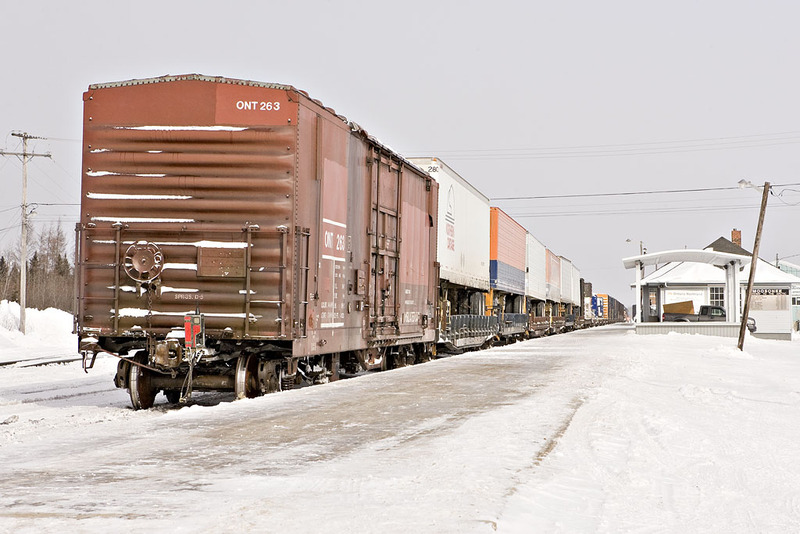 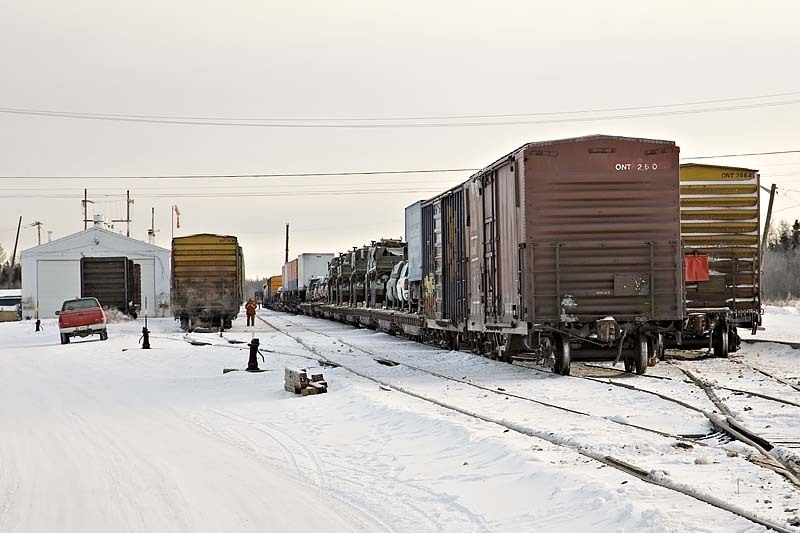 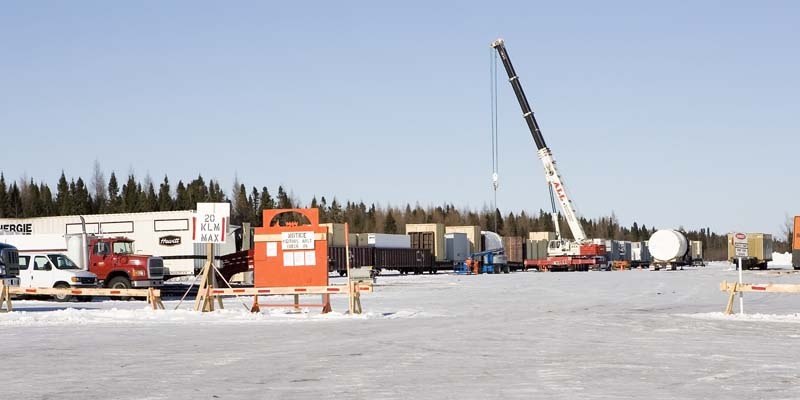 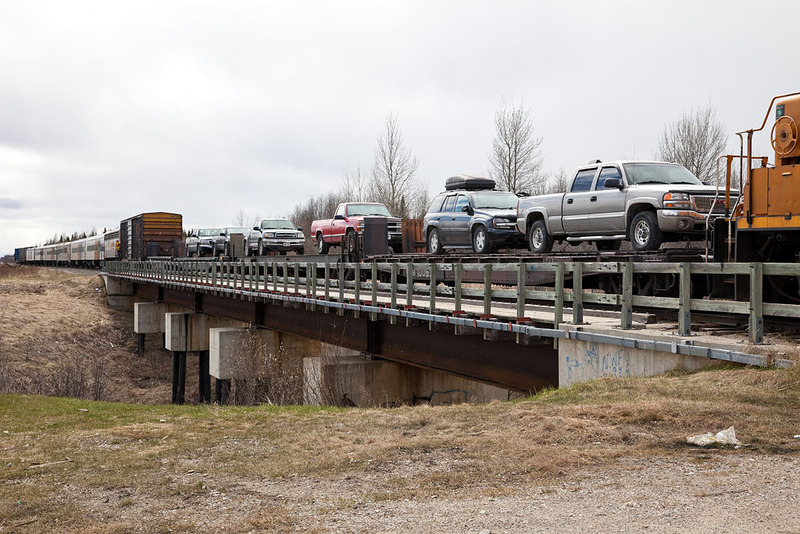 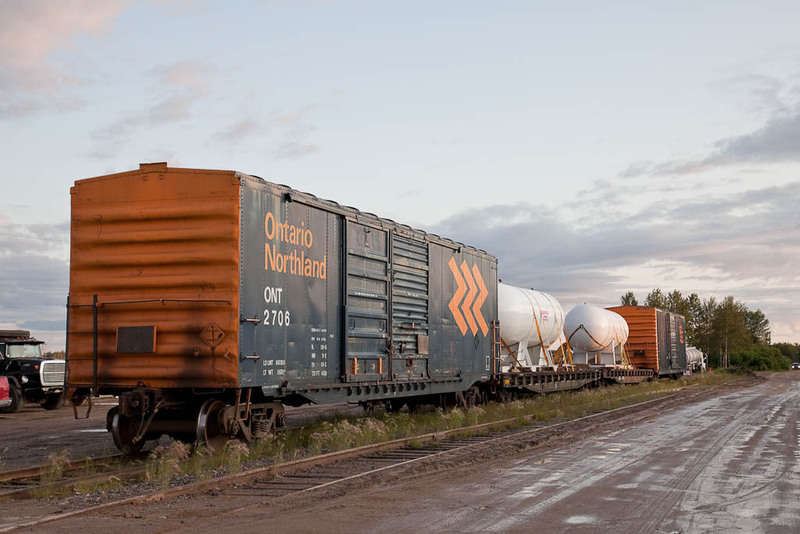 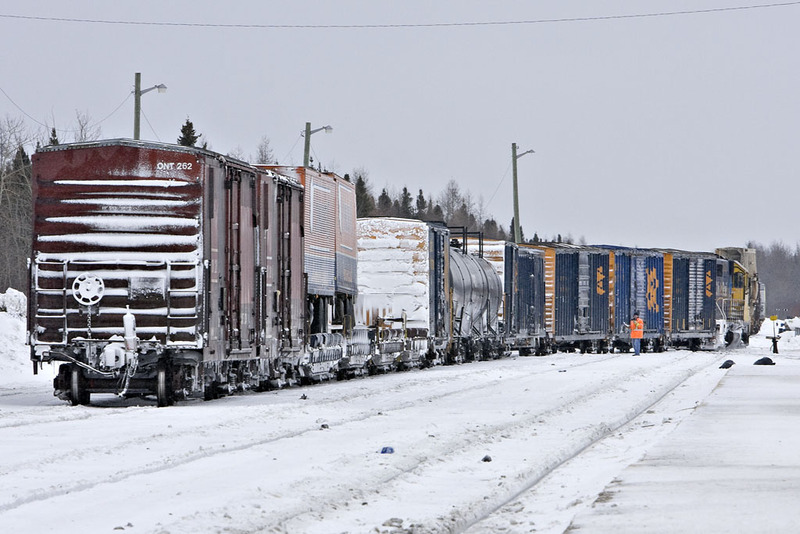 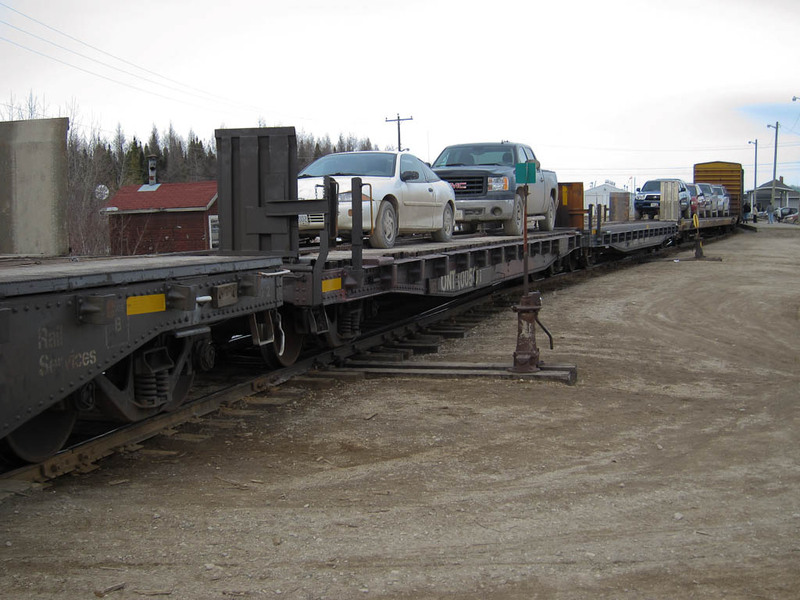 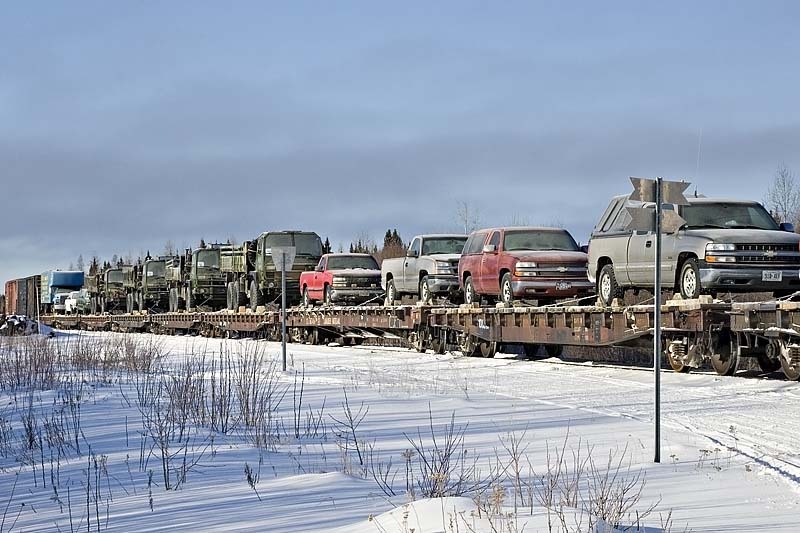 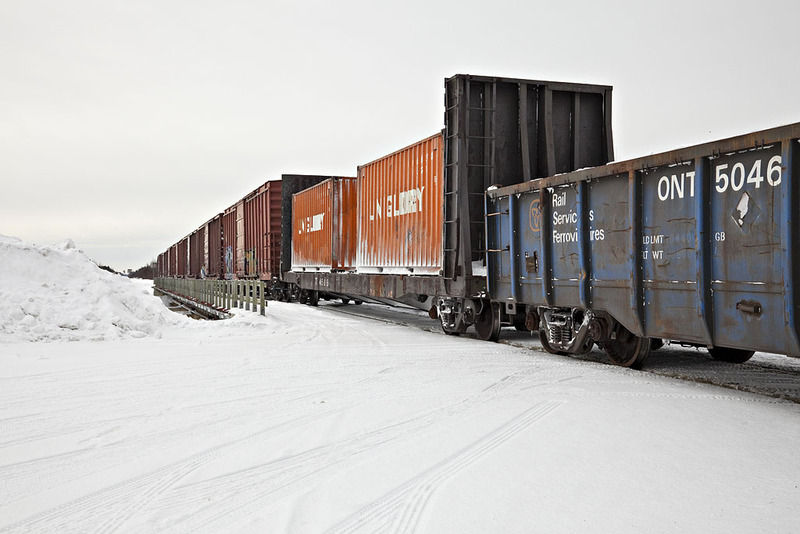 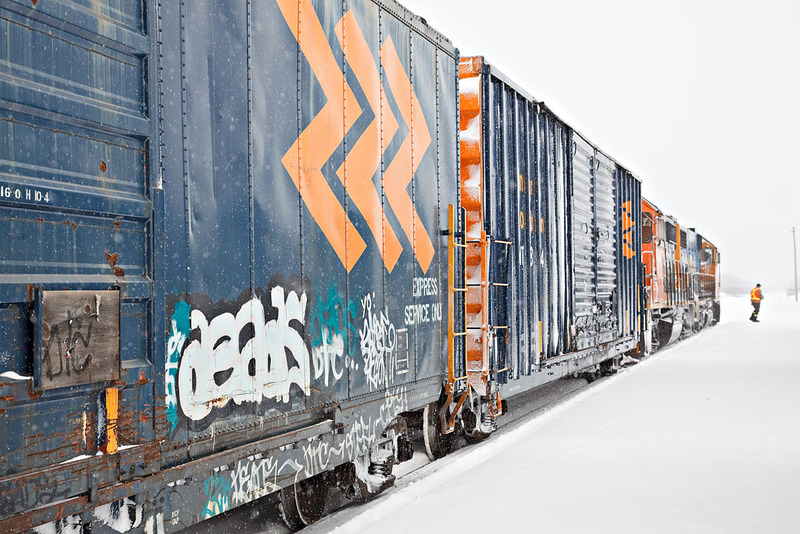 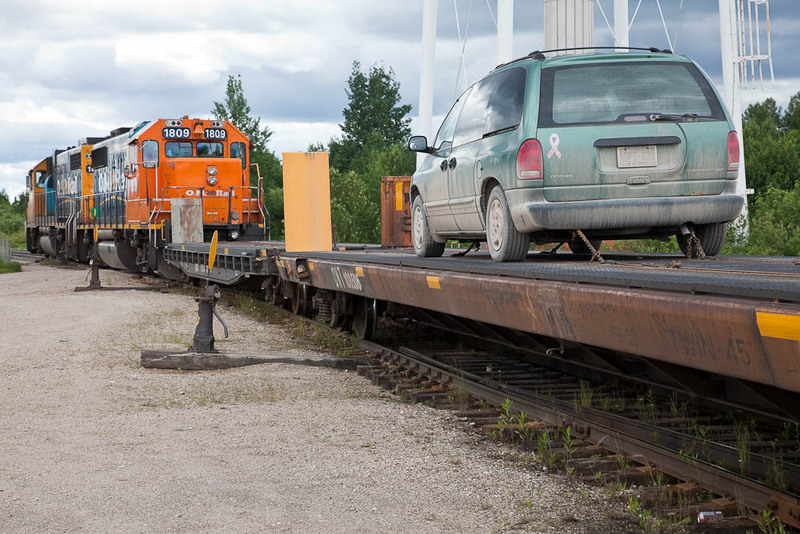 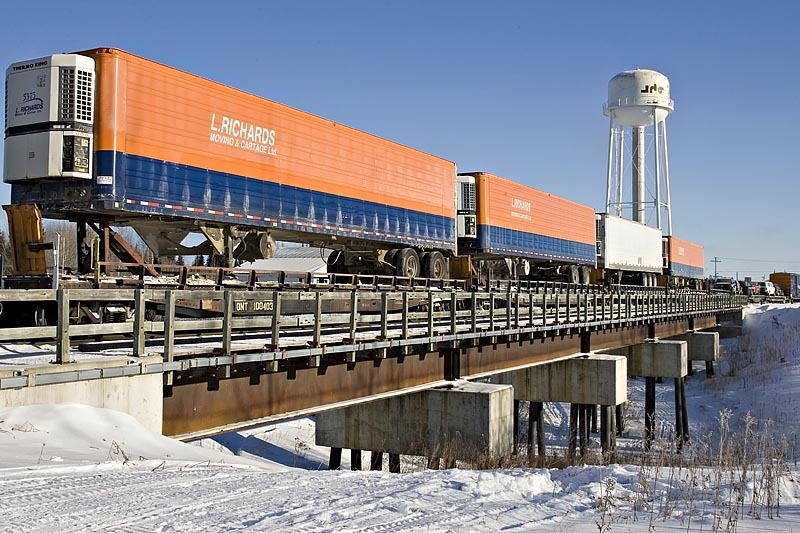 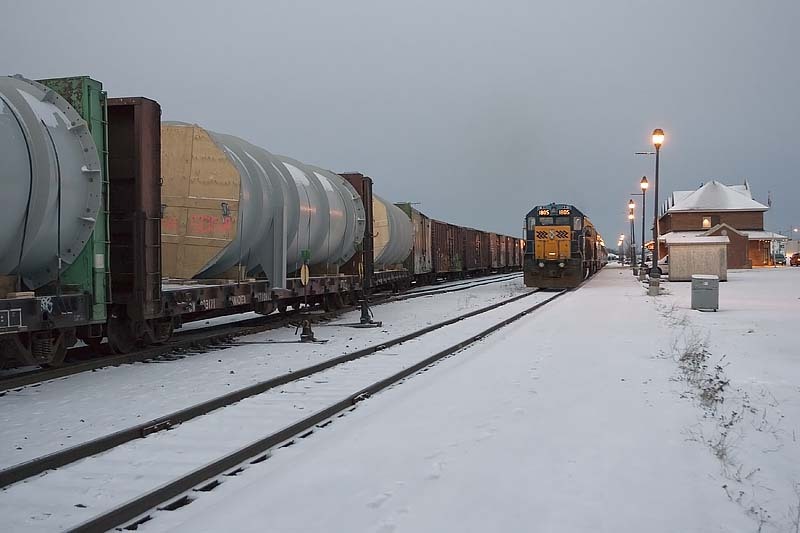 Some of the freight brought up to Moosonee is transferred to trucks on the winter road, aircraft and barges for shipment further north to Fort Albany, Kashechewan, Attawapiskat and the Victor Diamond Mine west of Attawapiskat. 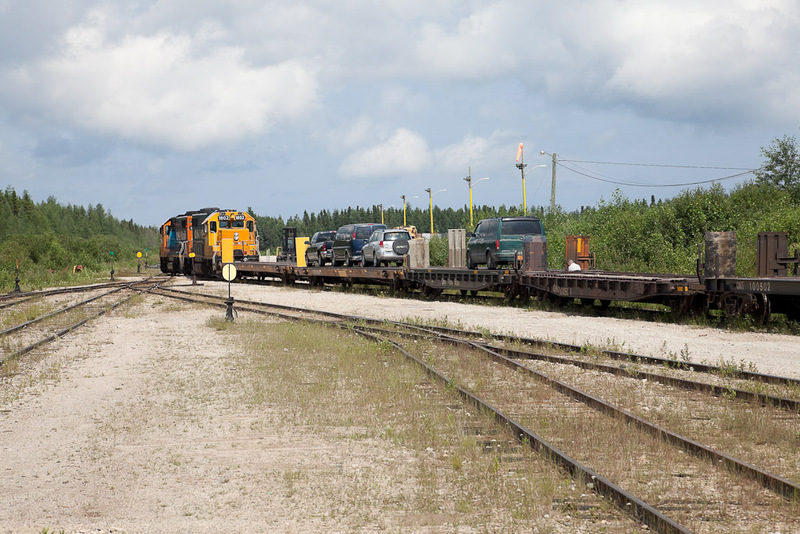 In Moosonee the tracks run past the station out to the airport and also along the river (beside Revillon Road North) for bringing freight to the barges. 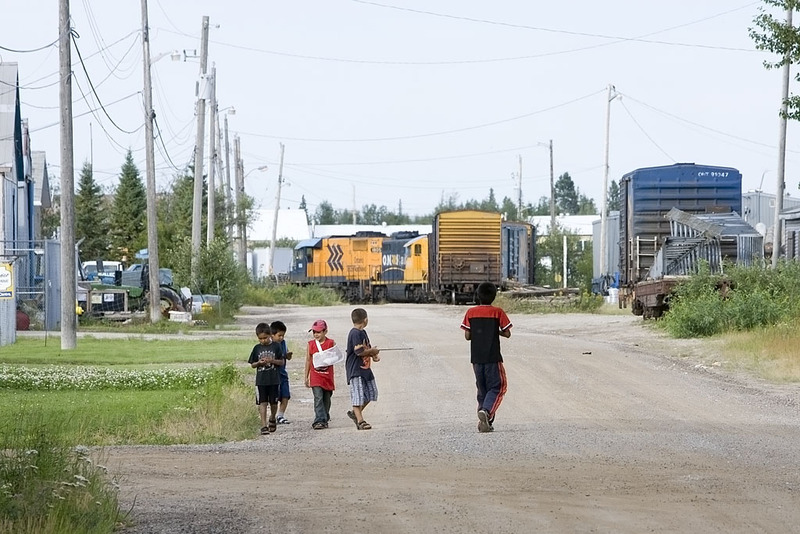 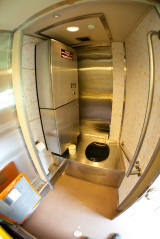 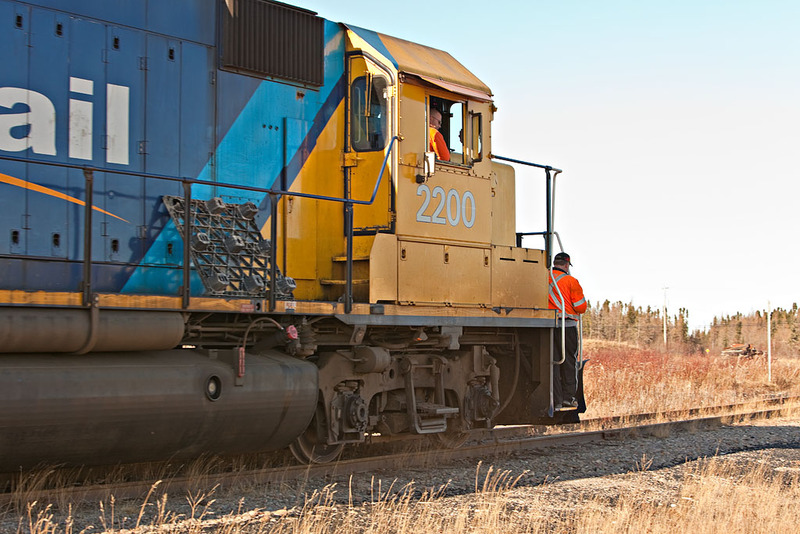 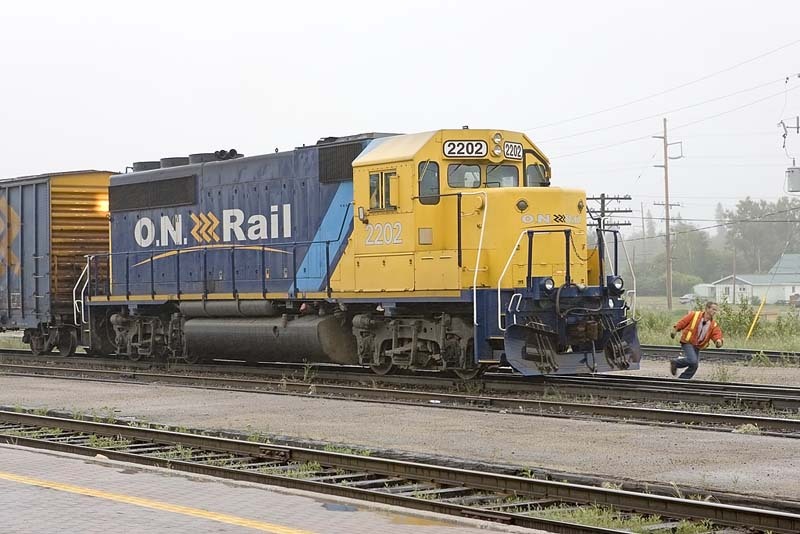 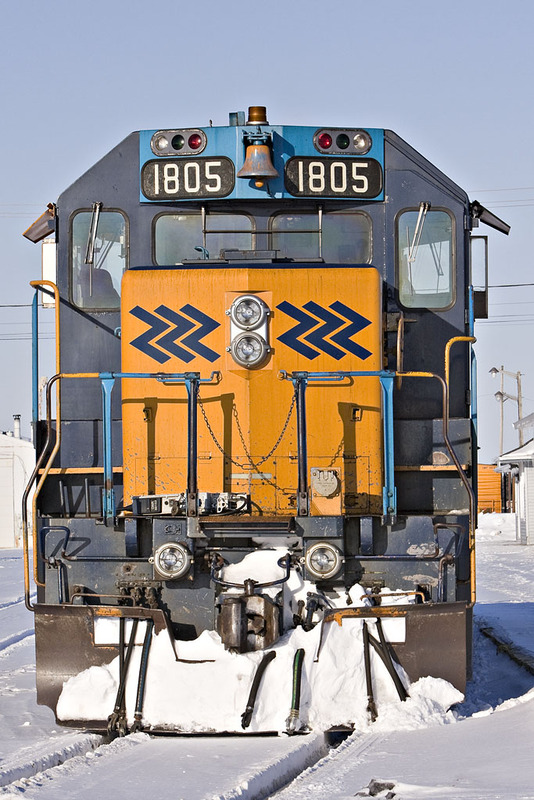 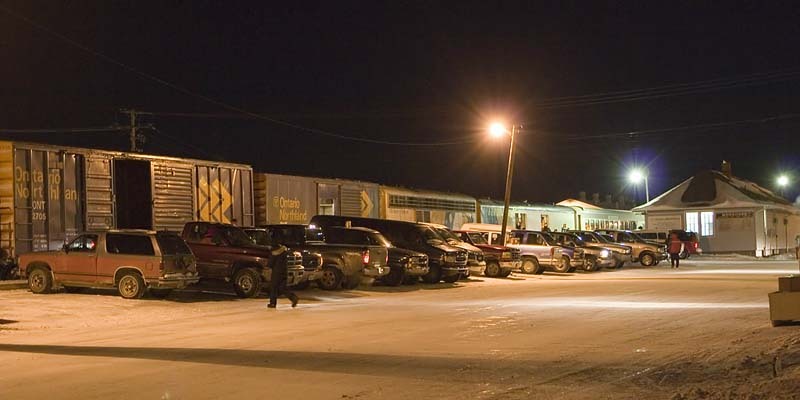 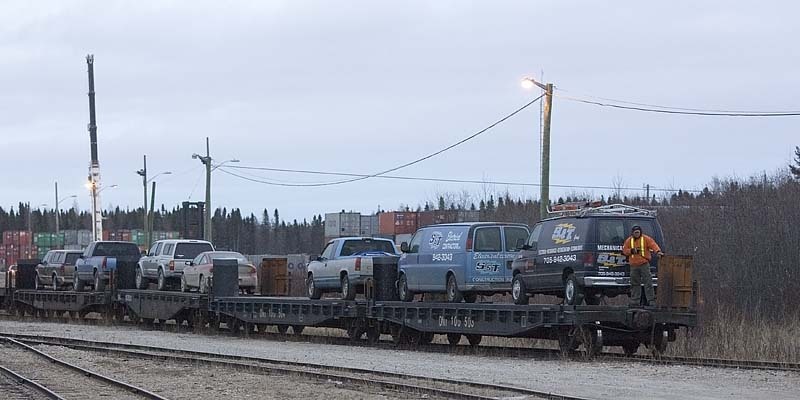 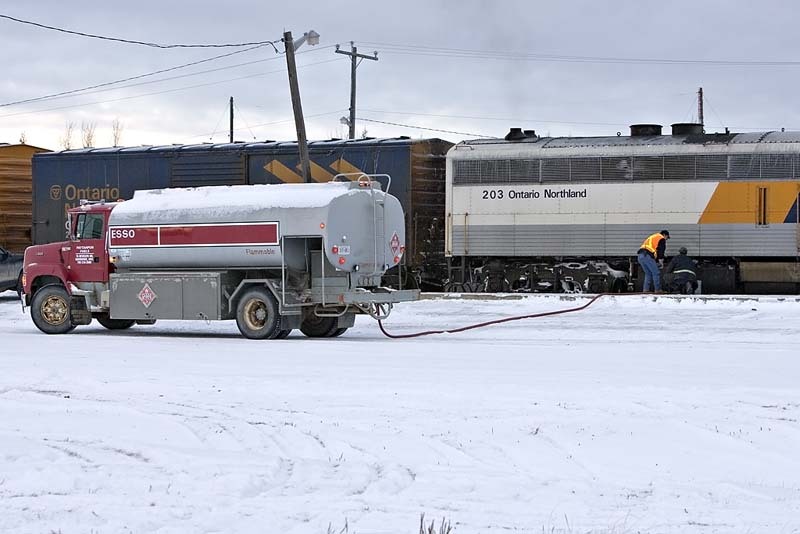 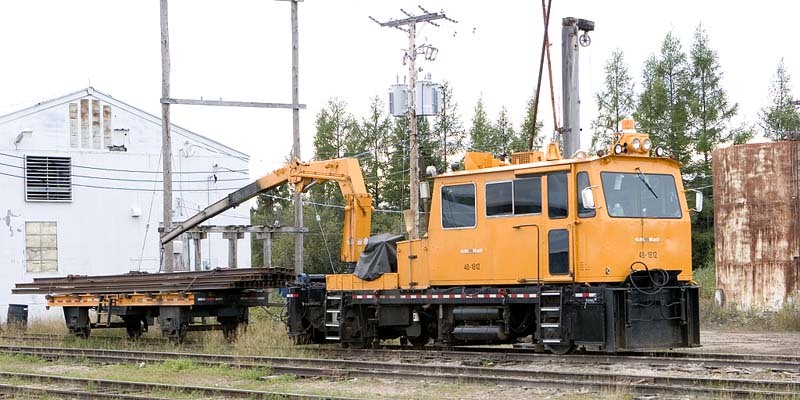 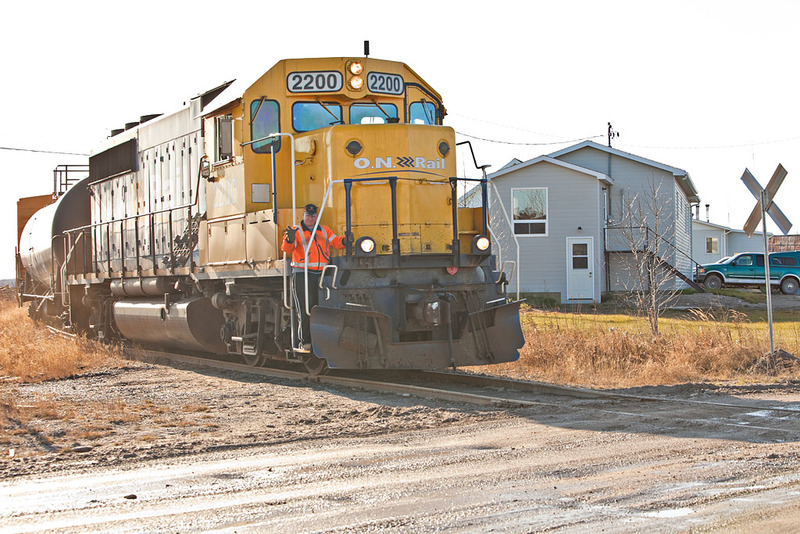 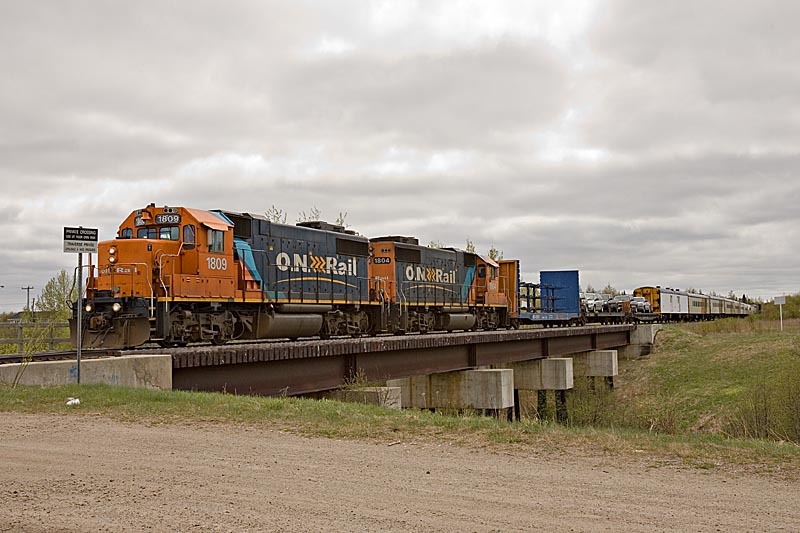 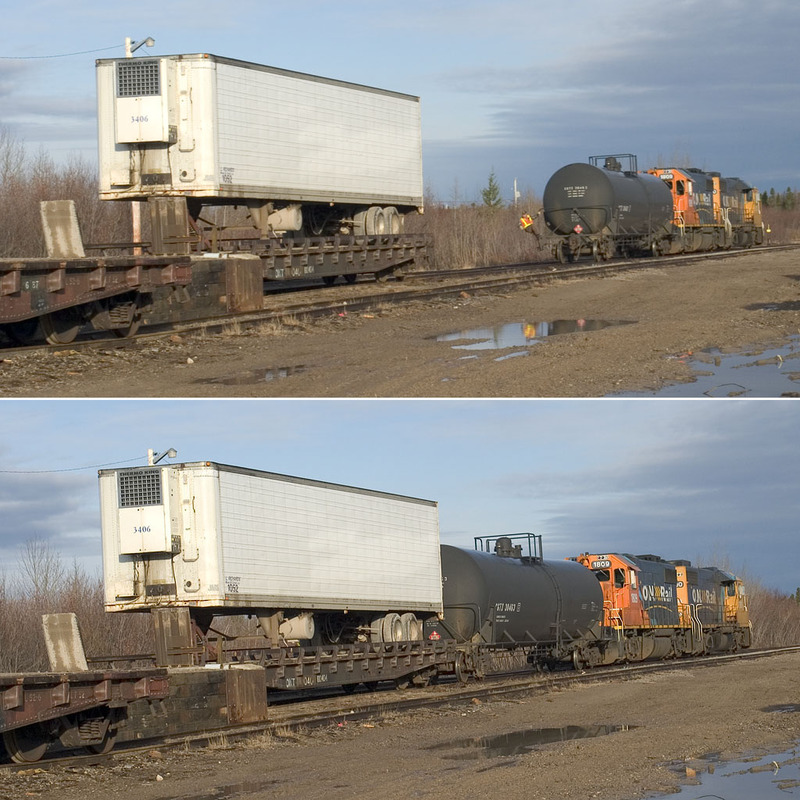 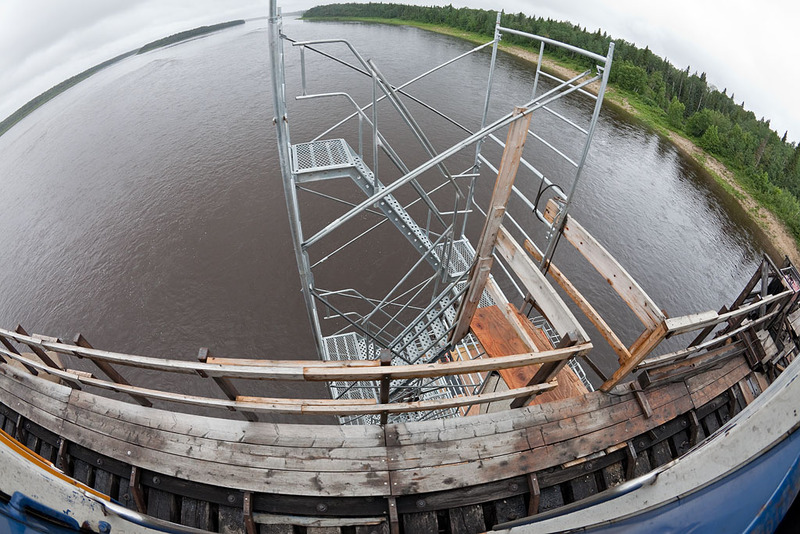 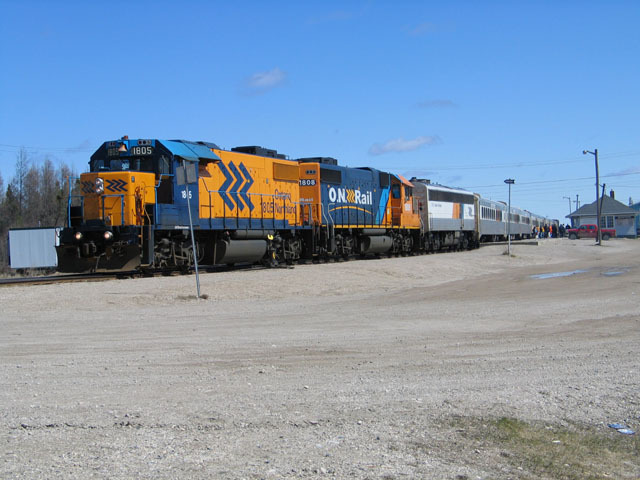 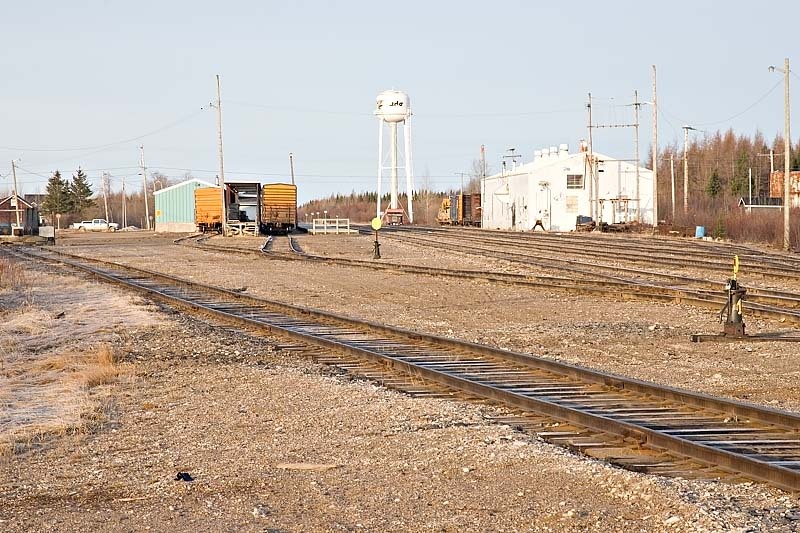 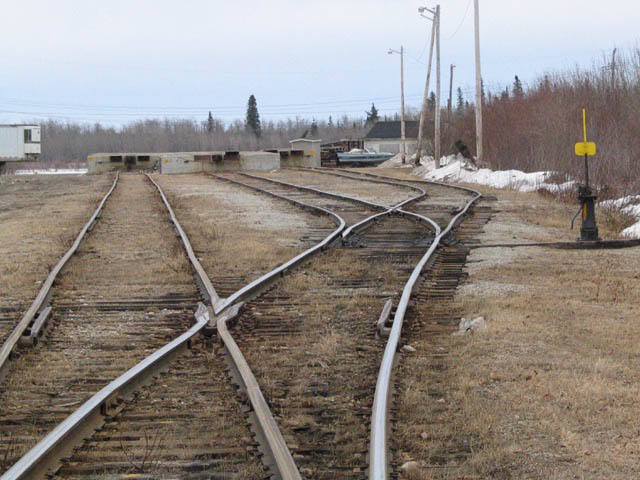 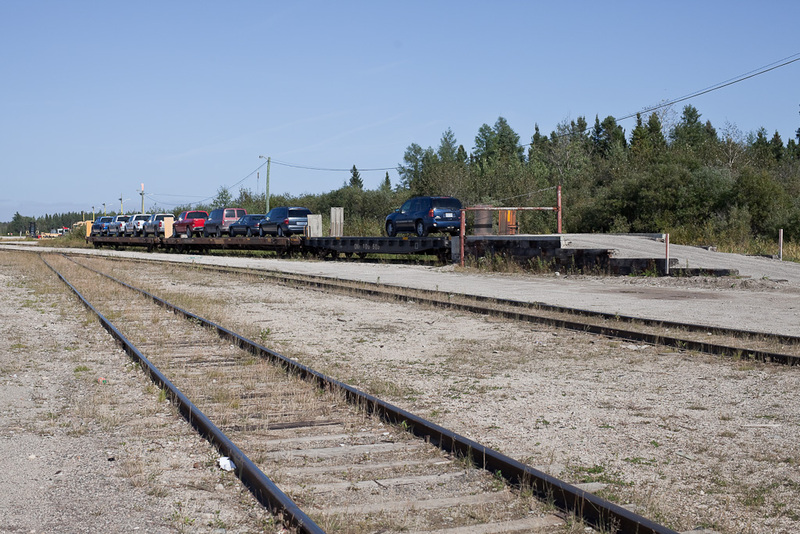 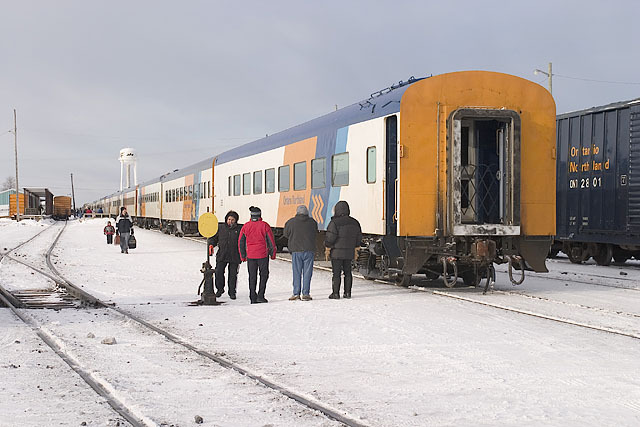 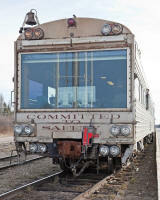 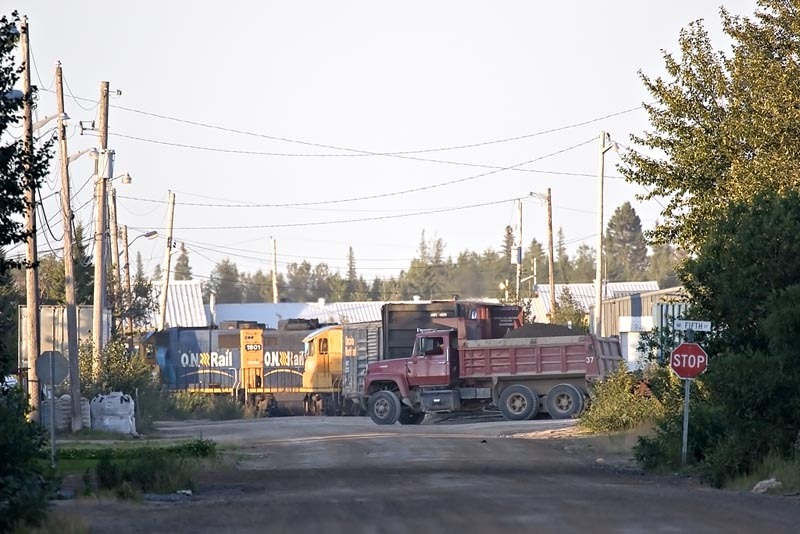 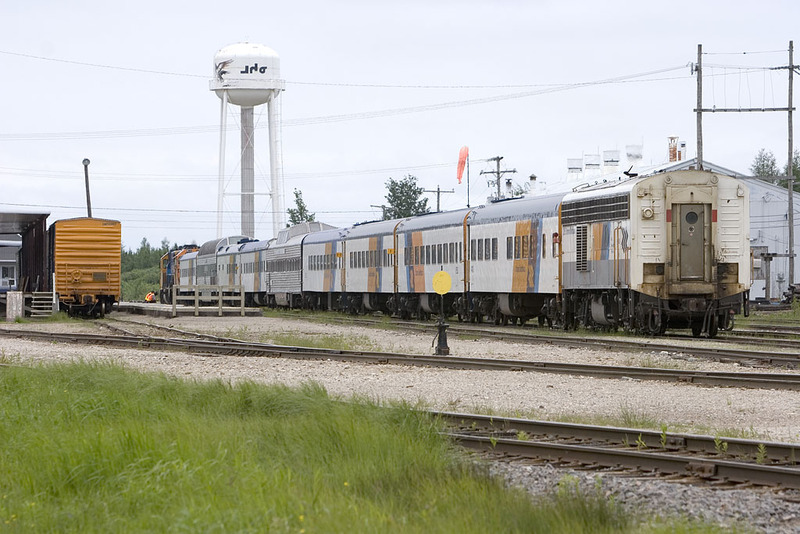 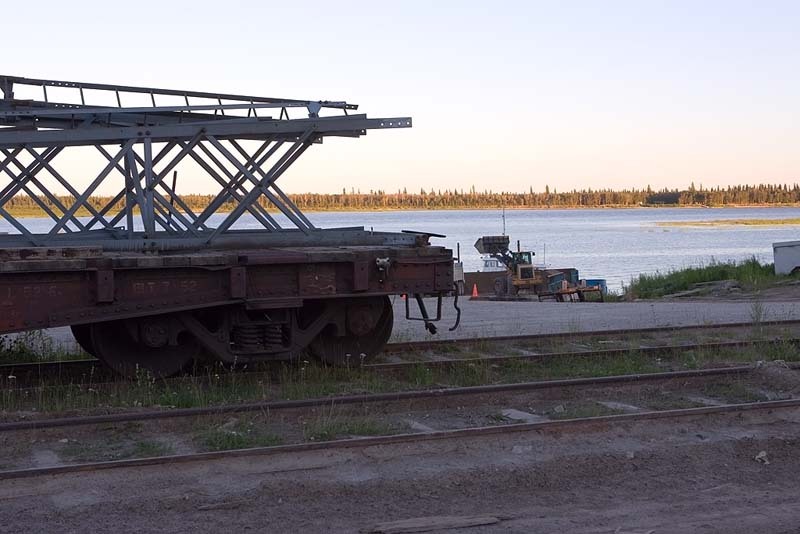 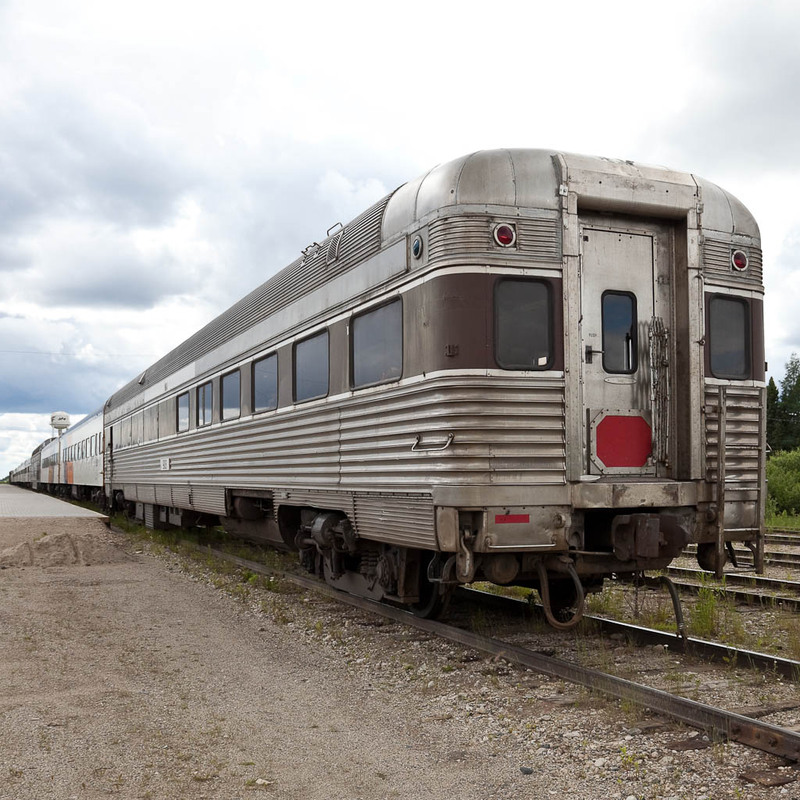 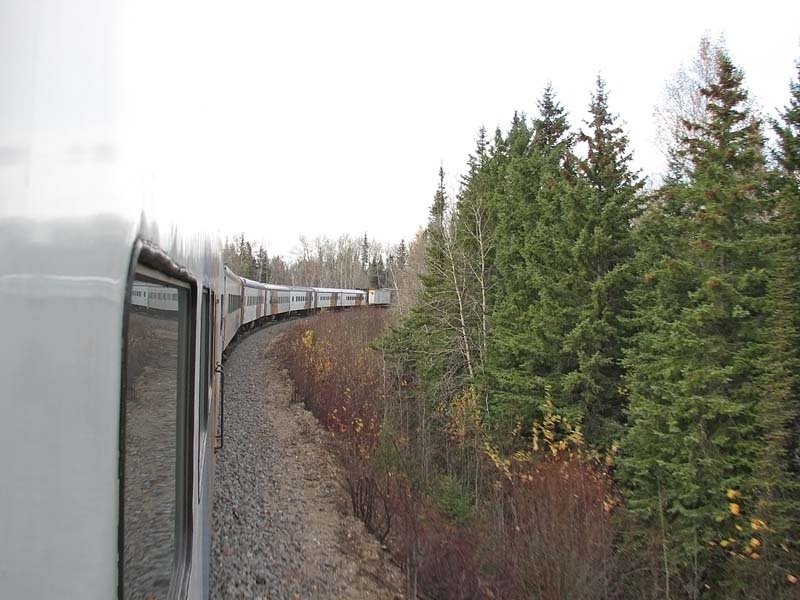 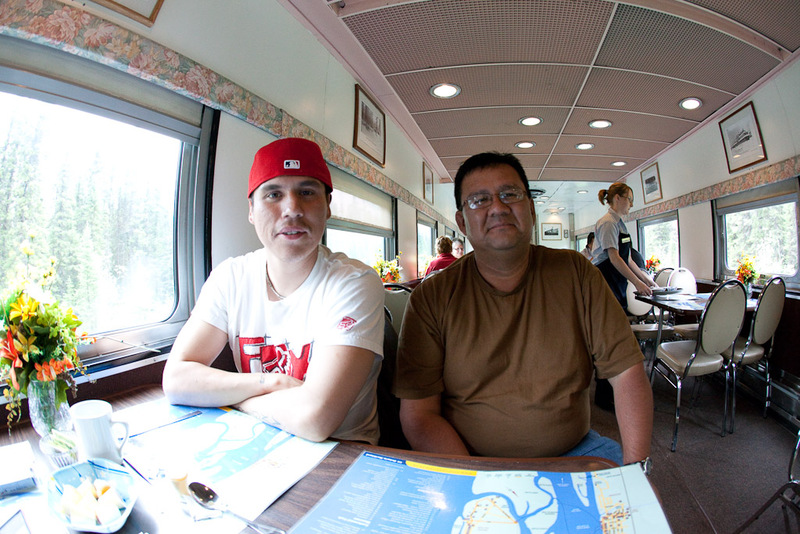 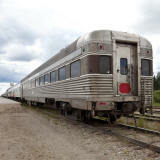 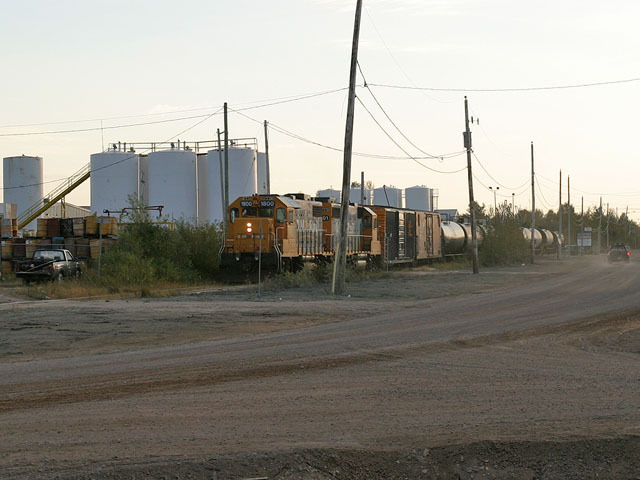 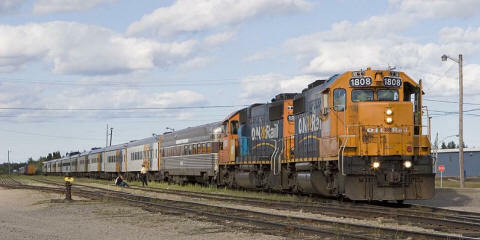 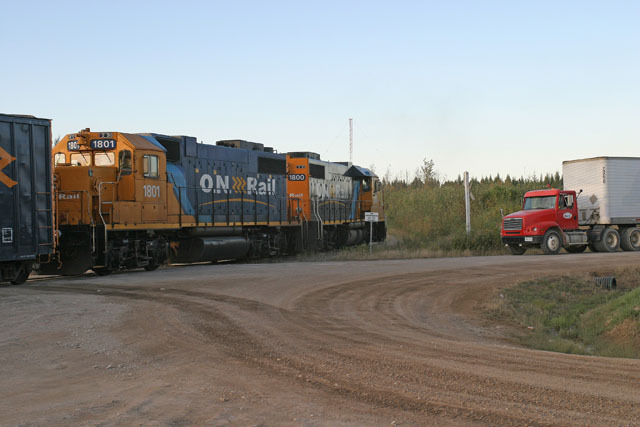 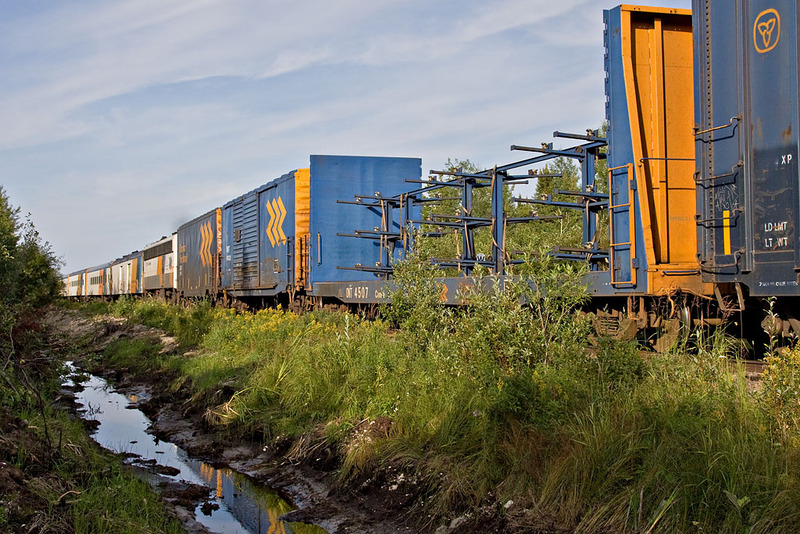 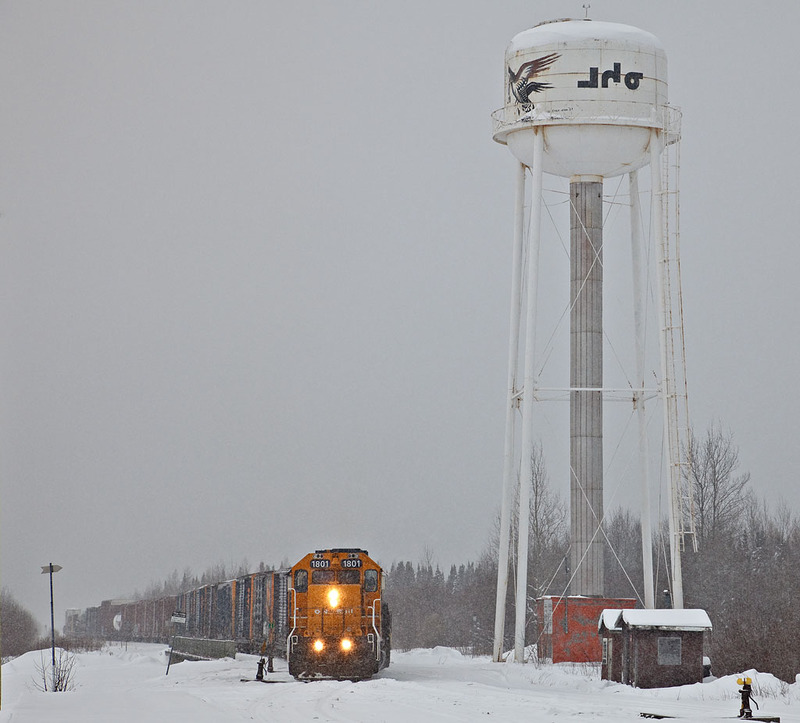 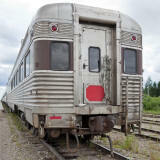 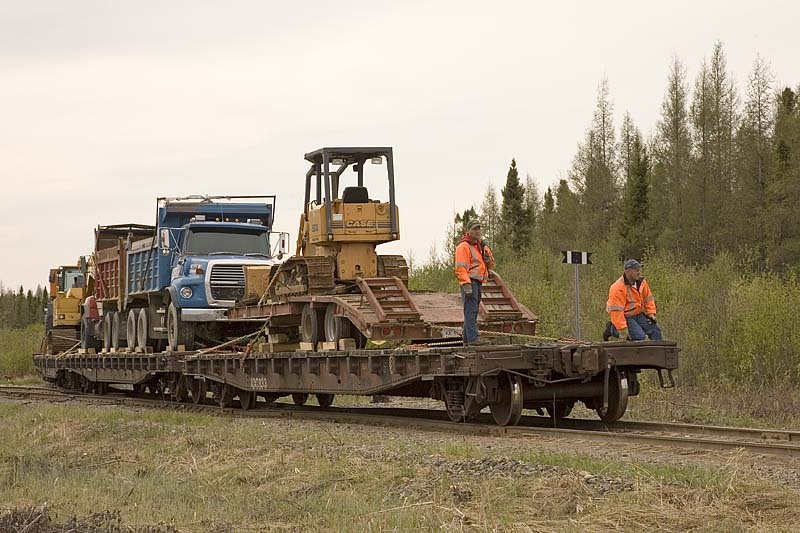 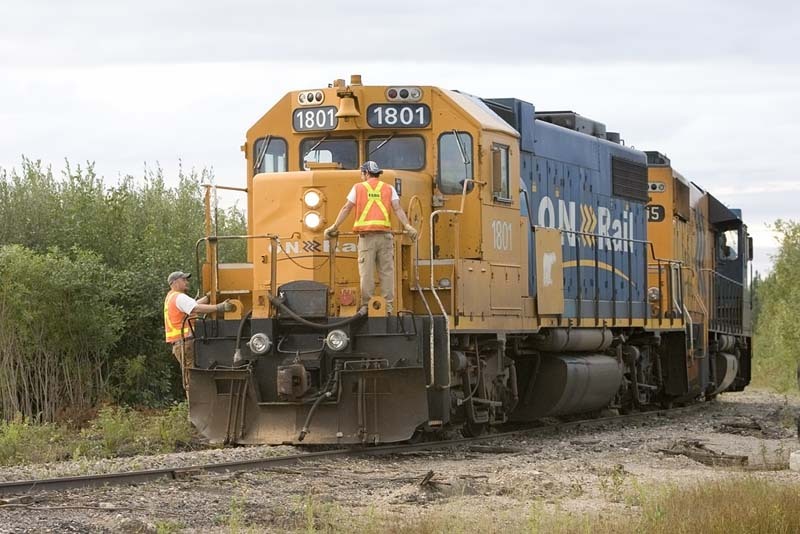 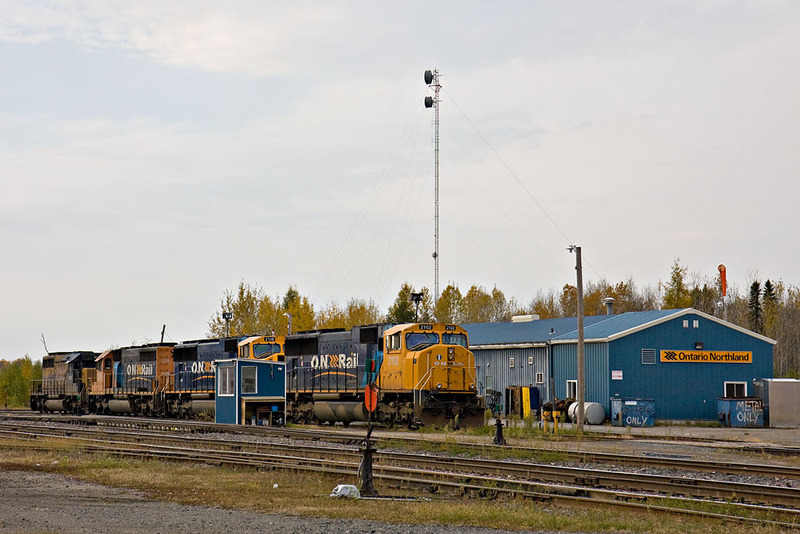 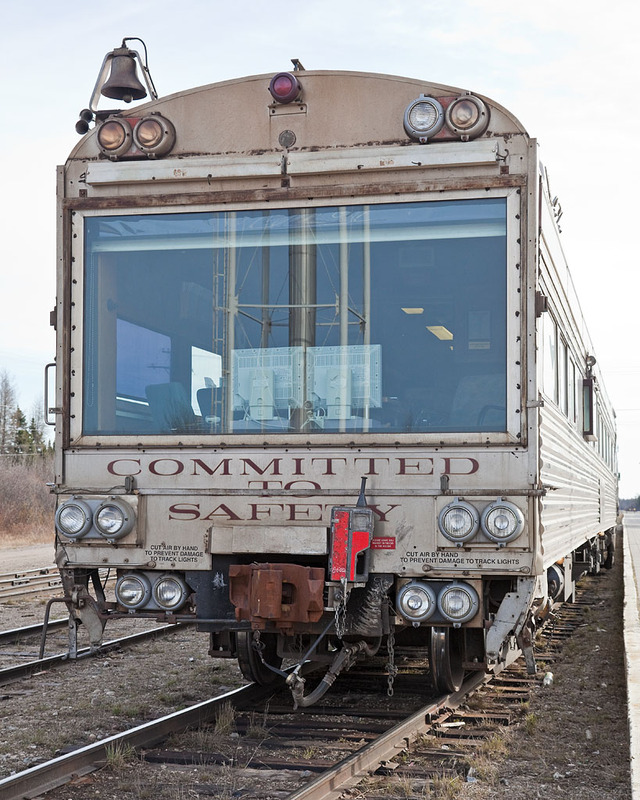 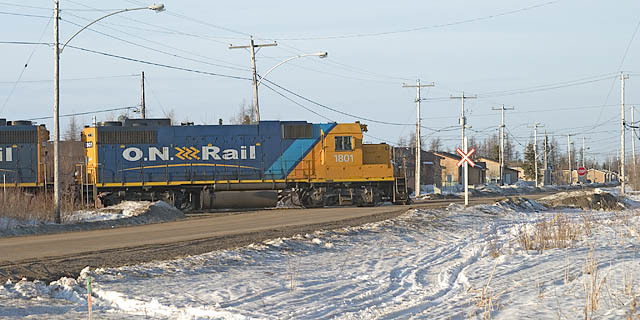 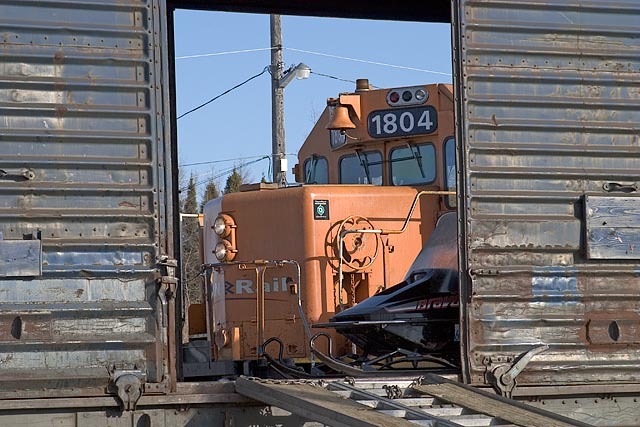 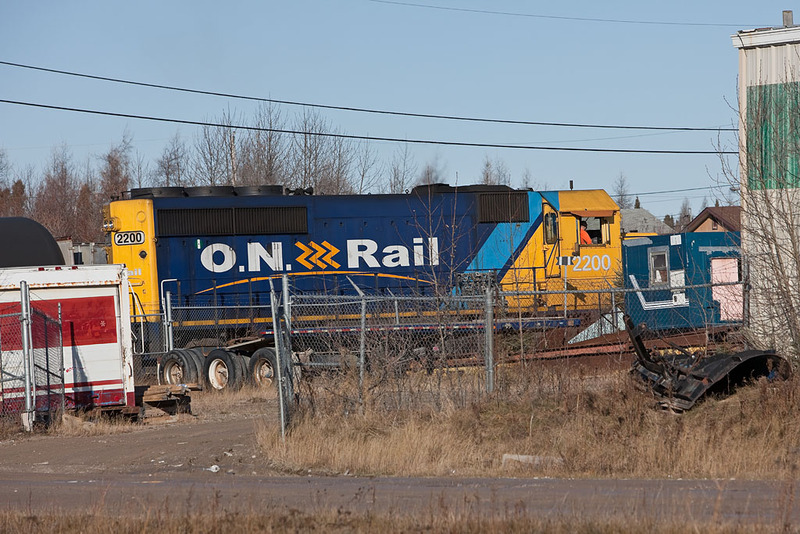 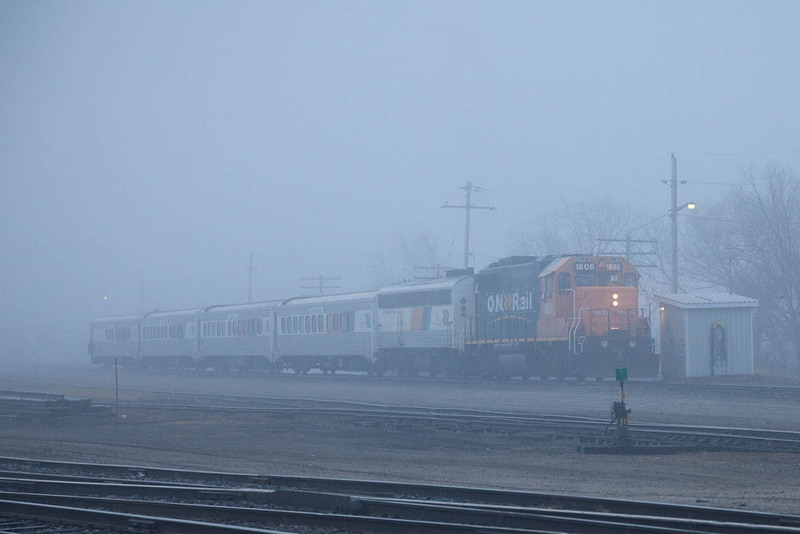 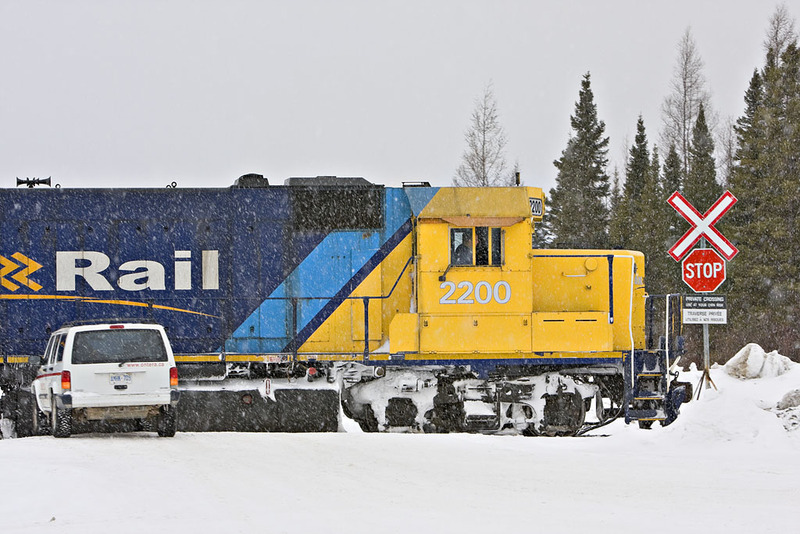 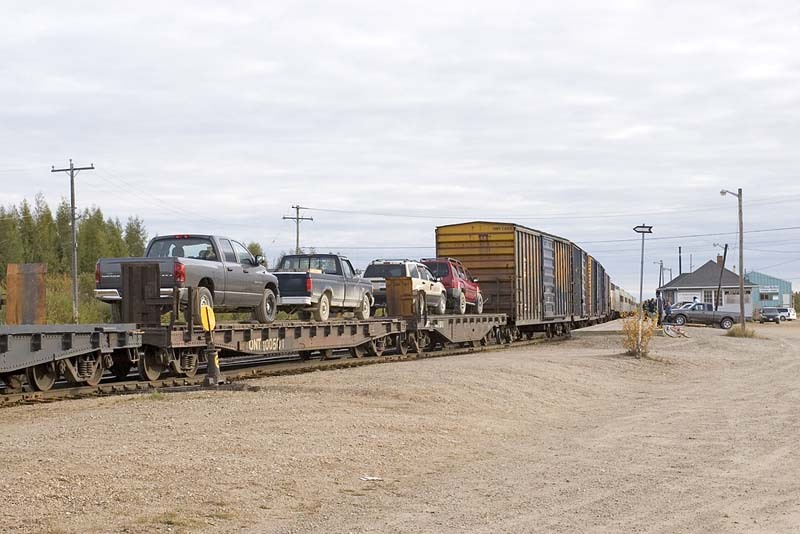 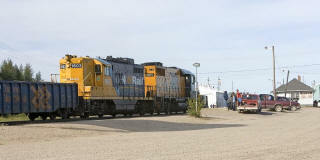 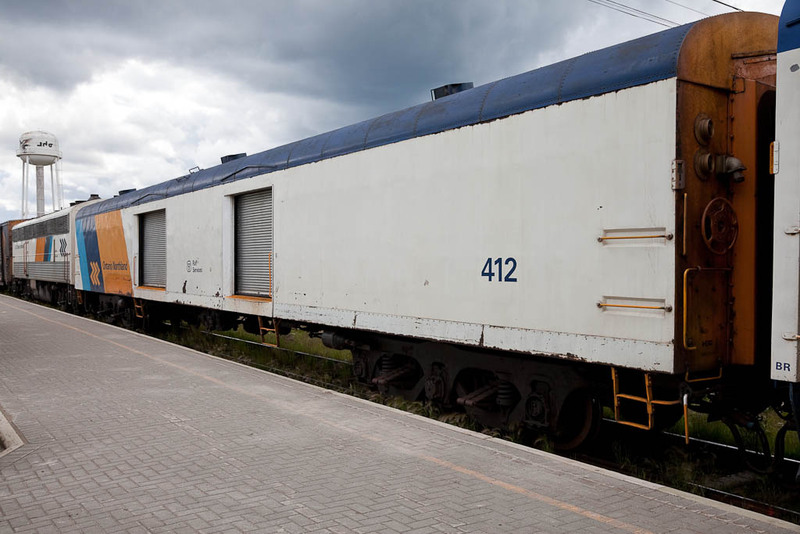 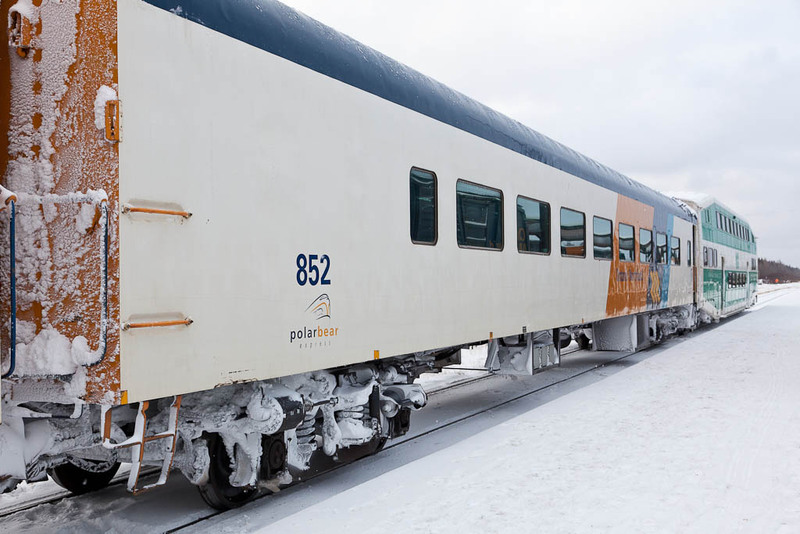 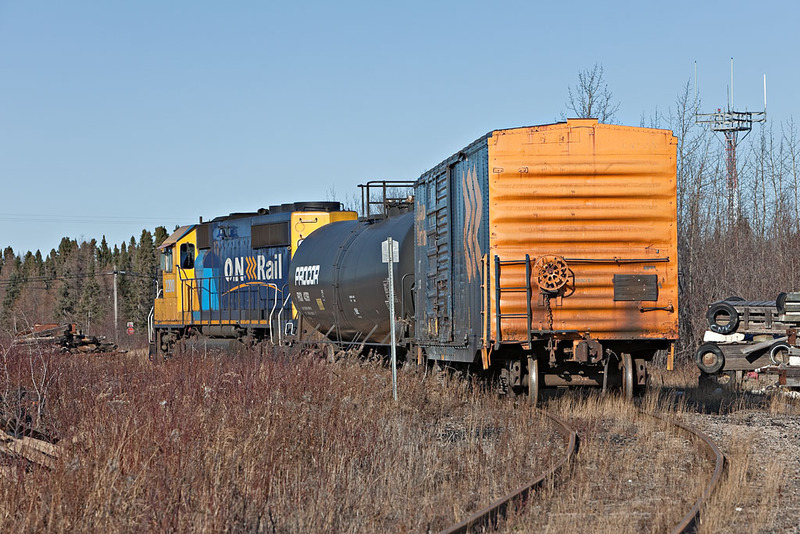 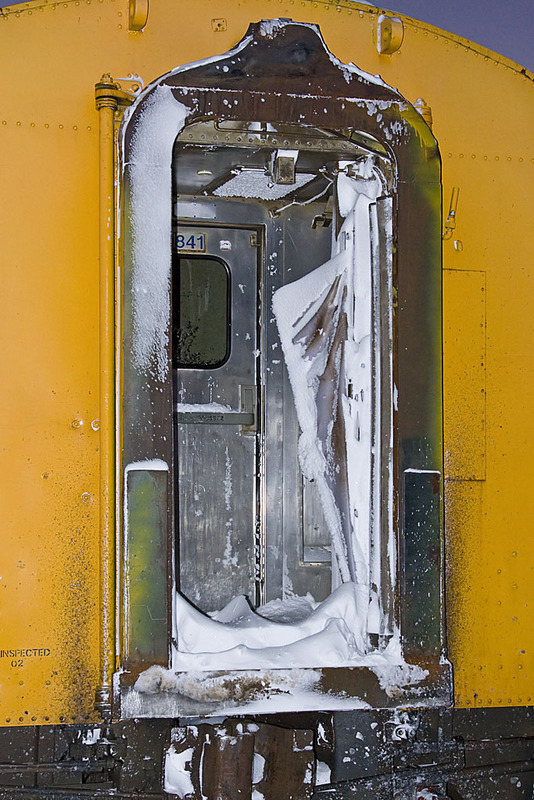 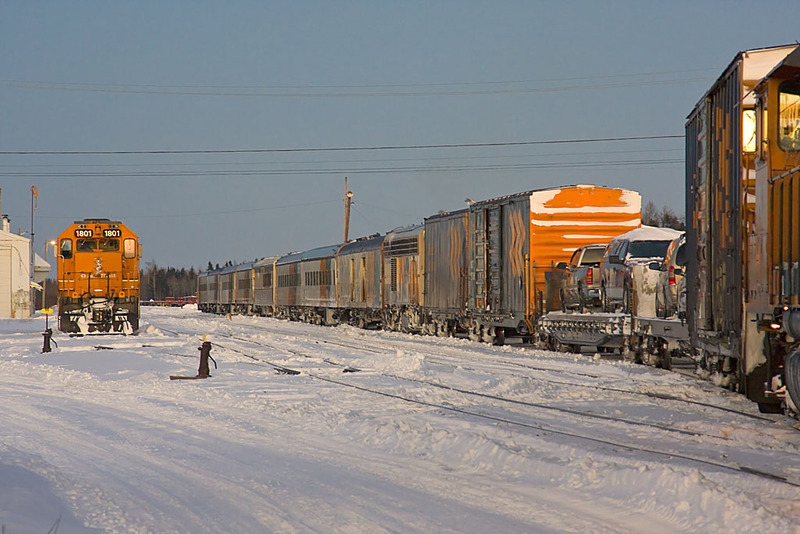 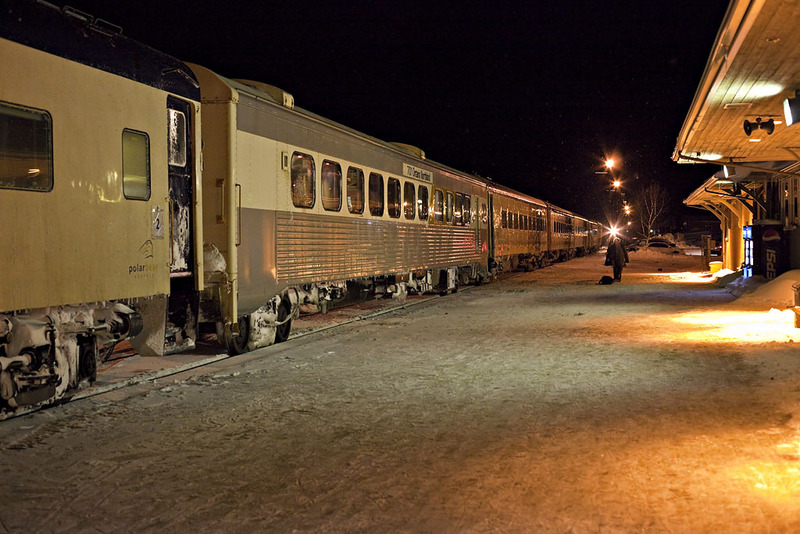 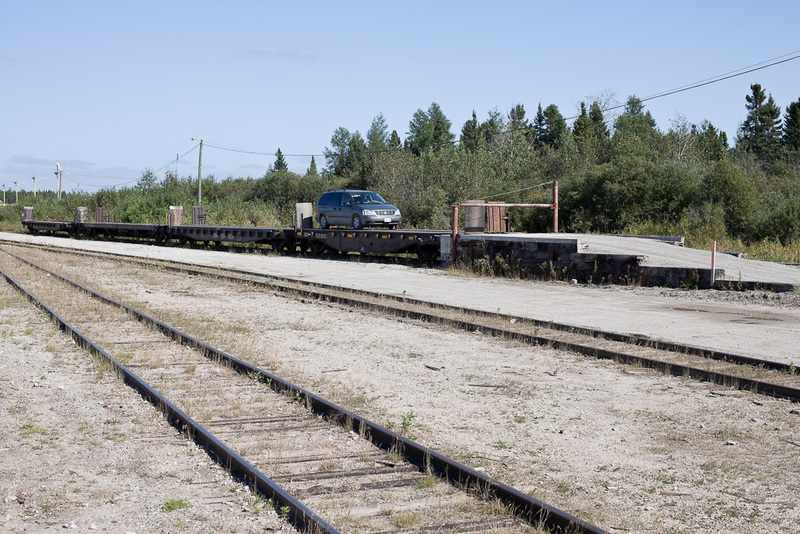 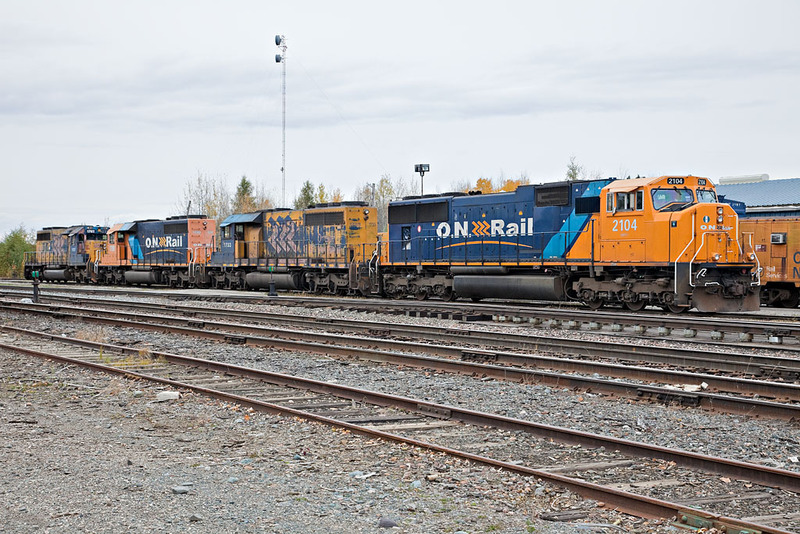 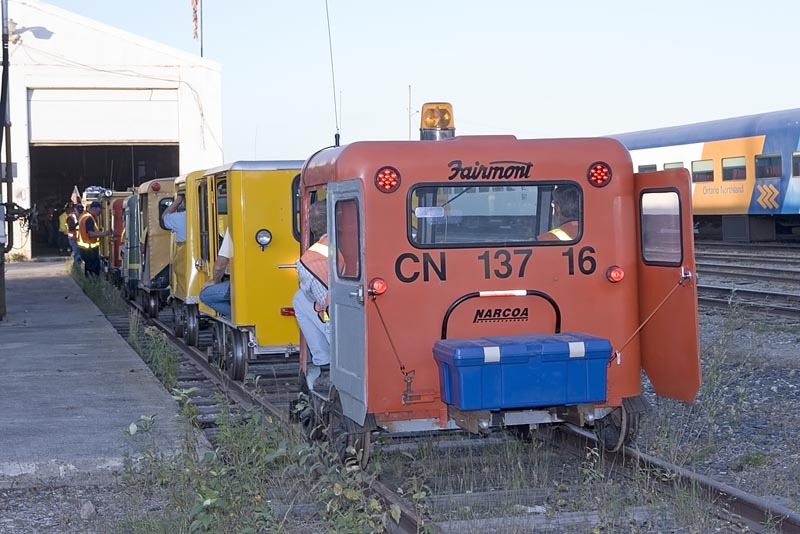 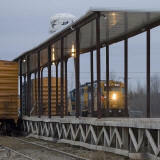 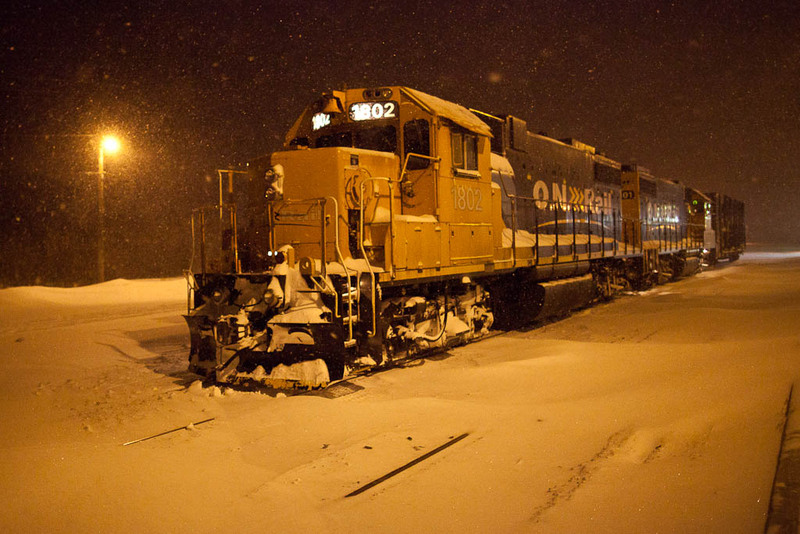 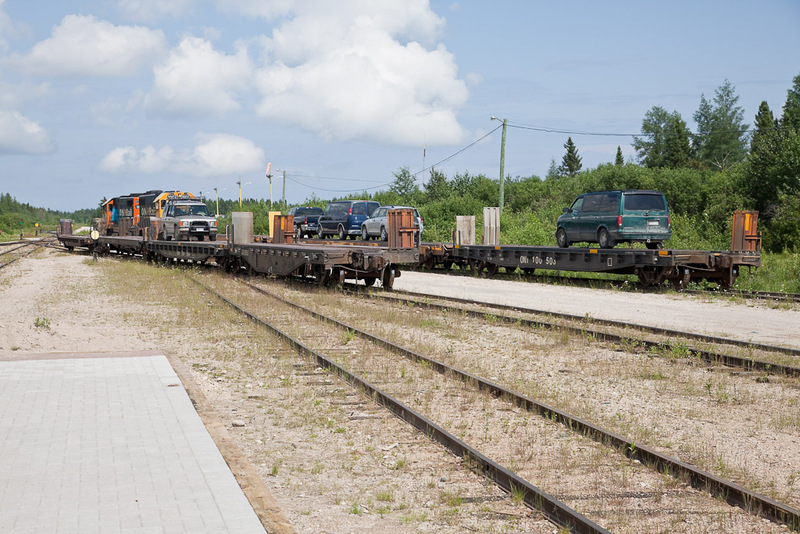 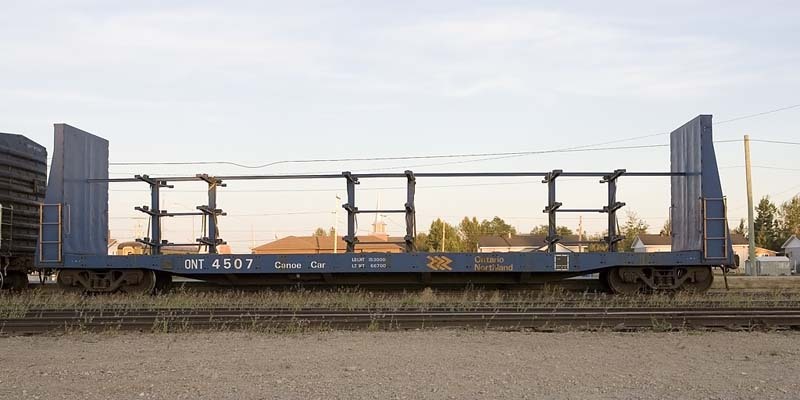 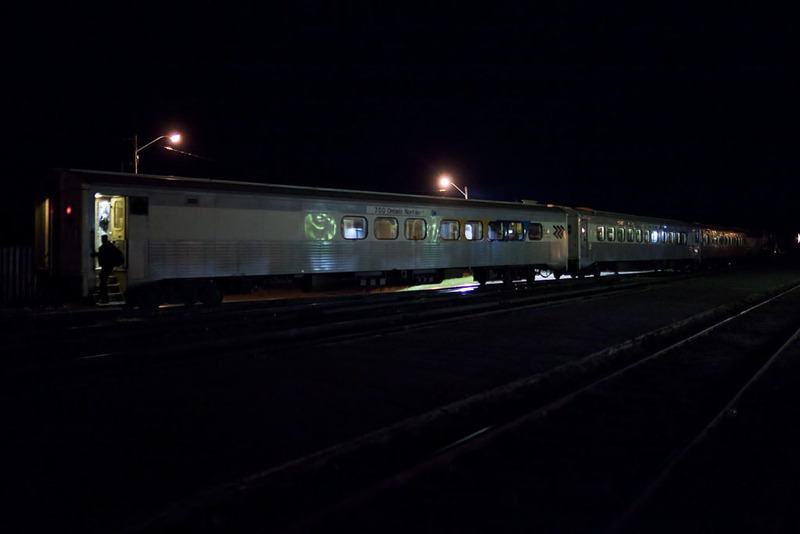 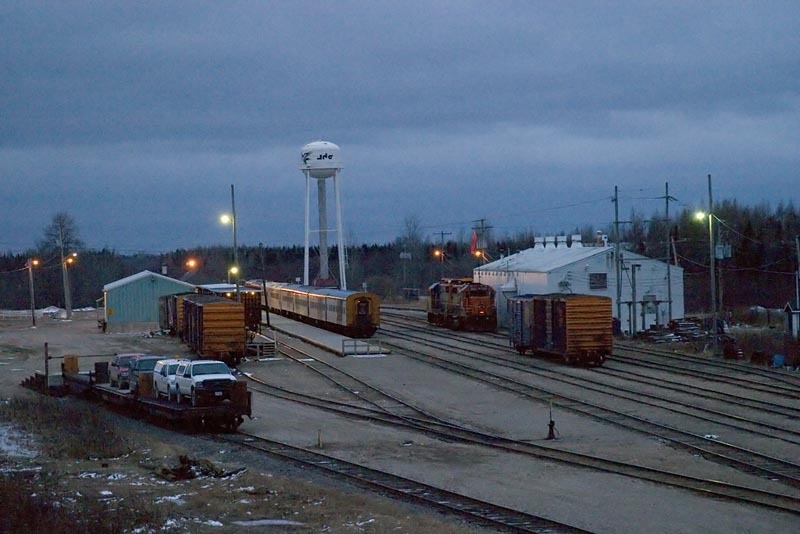 Additional photos (often in higher resolution and with detailed captions) of trains in Moosonee may be found at http://paullantz.com, http://www.pbase.com/paullantz/trains and http://www.pbase.com/paullantz/switching . 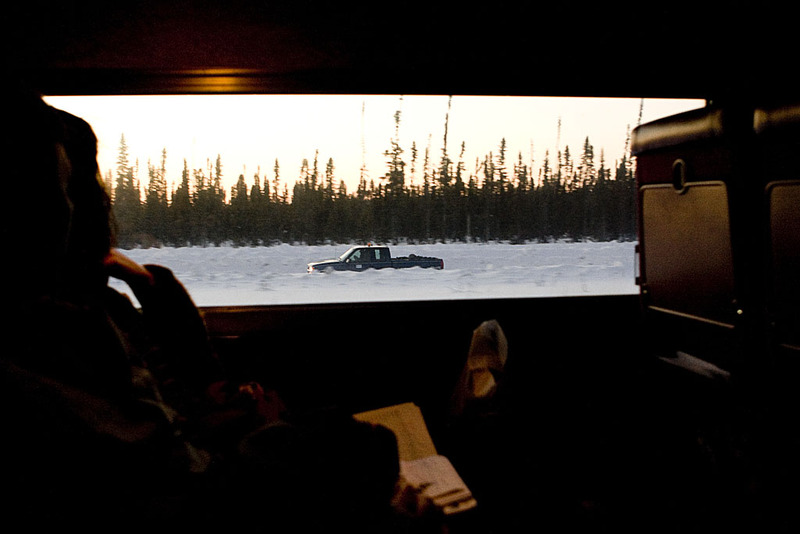 as winter road season ends. 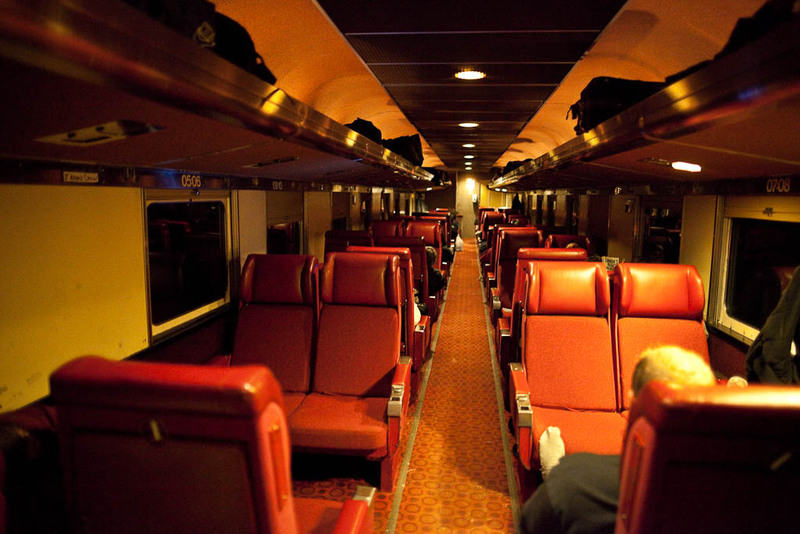 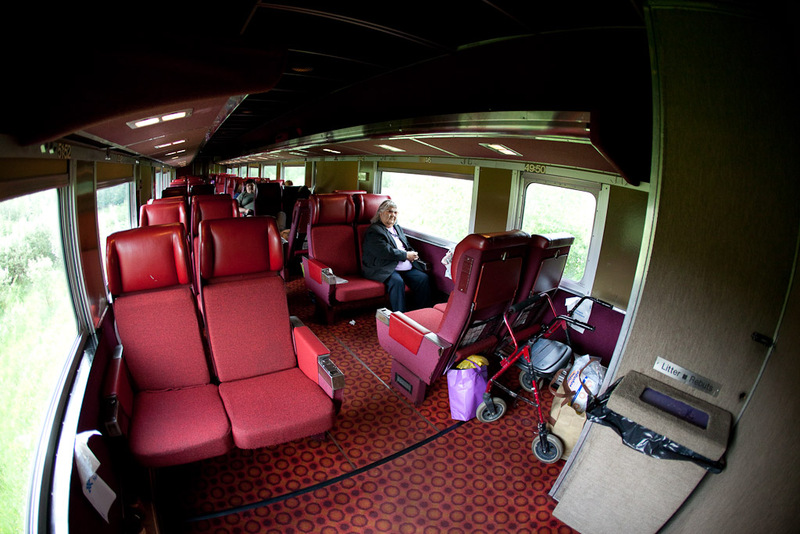 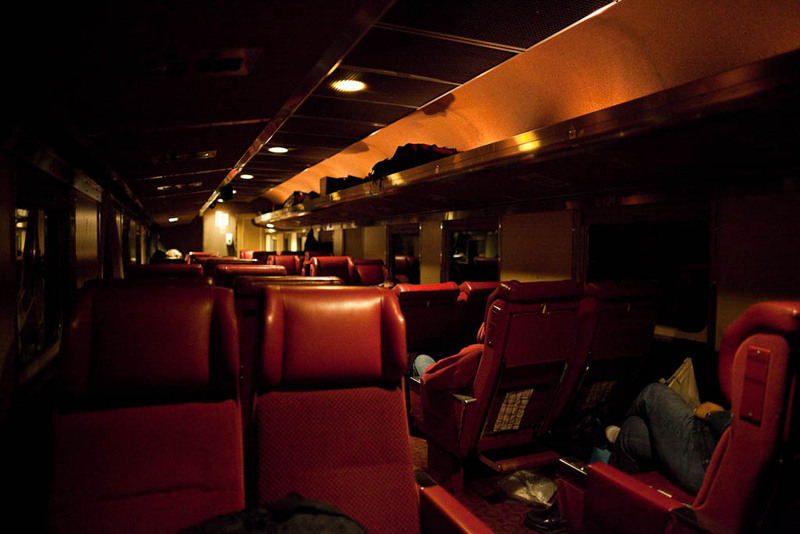 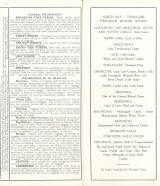 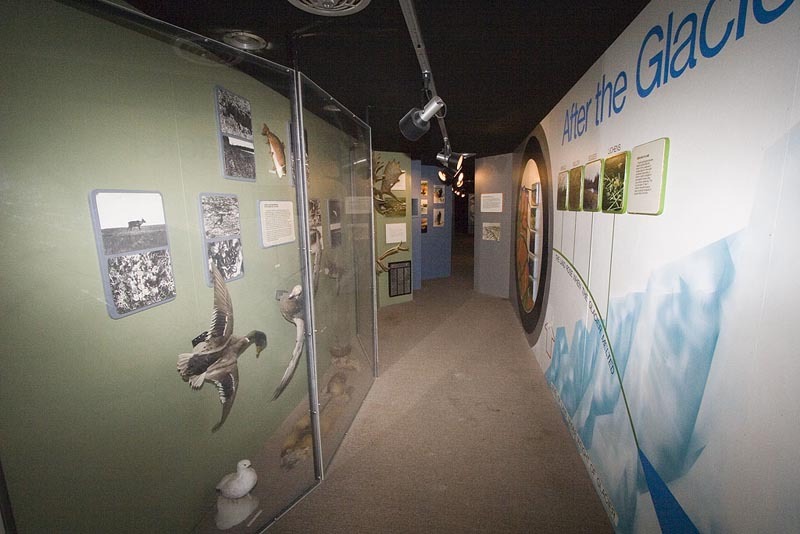 of the passenger section. 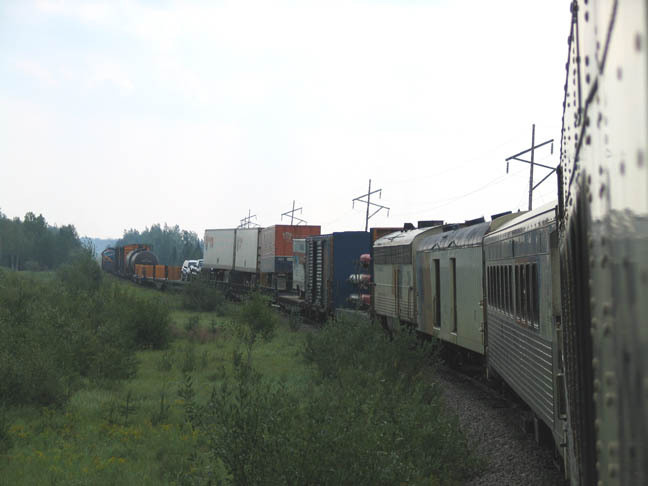 End of freight section. 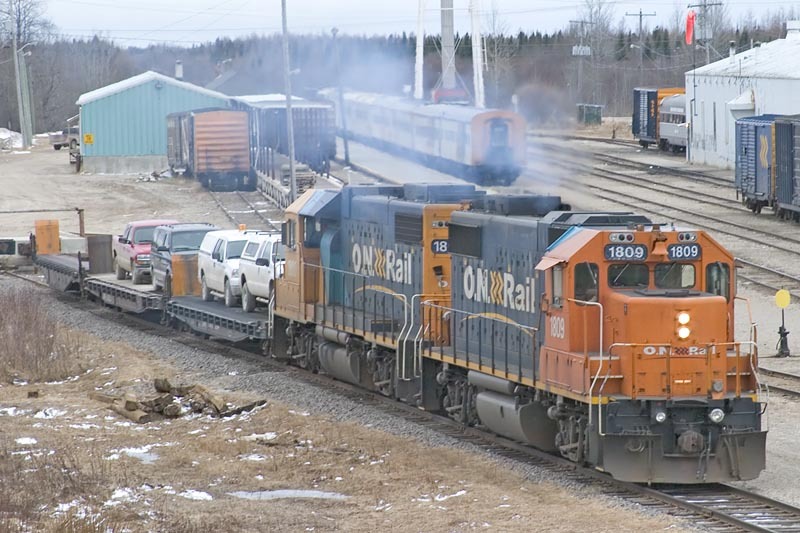 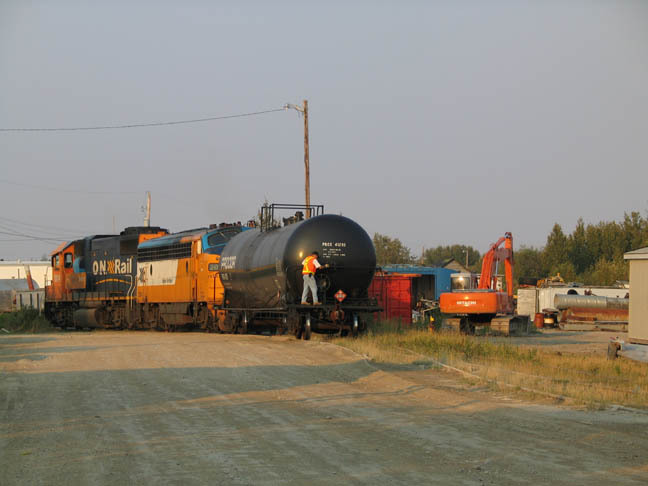 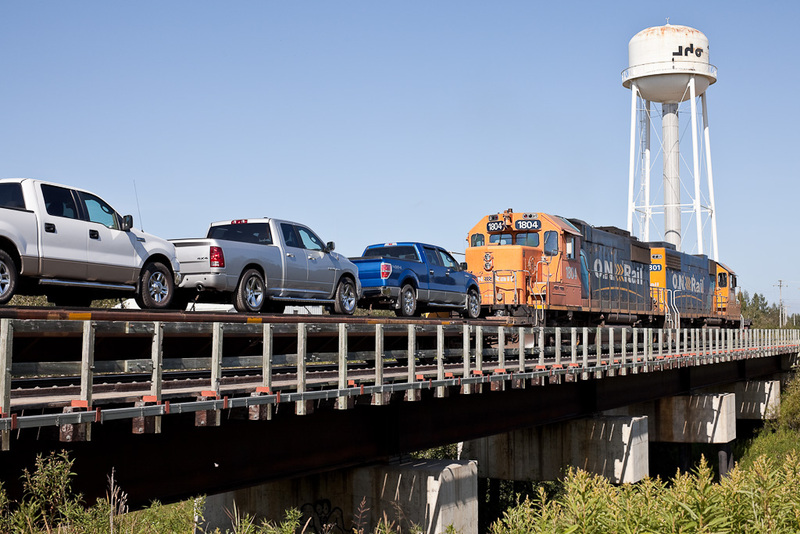 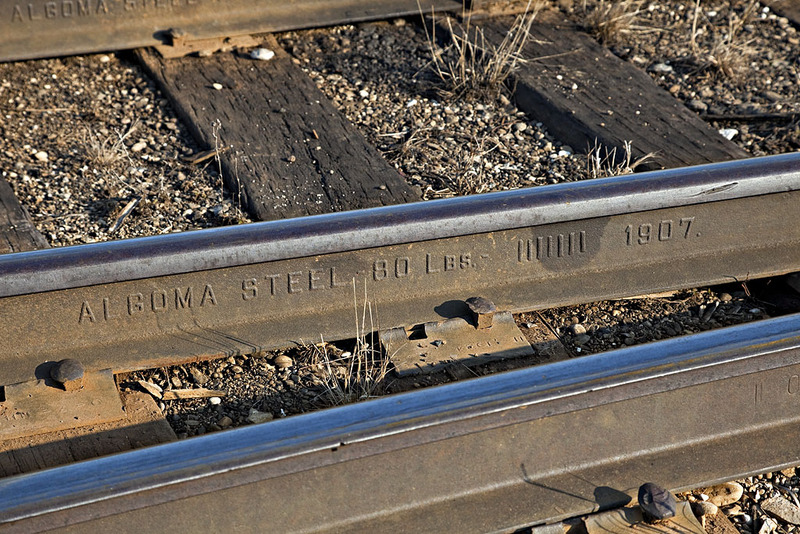 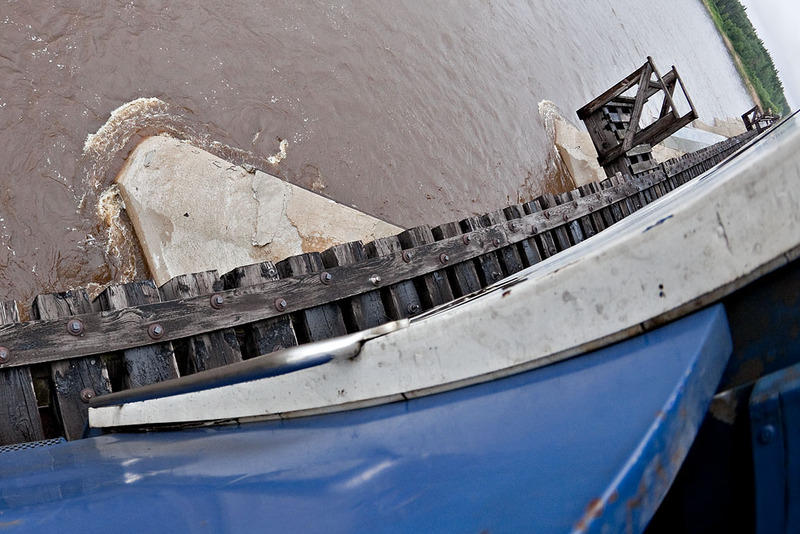 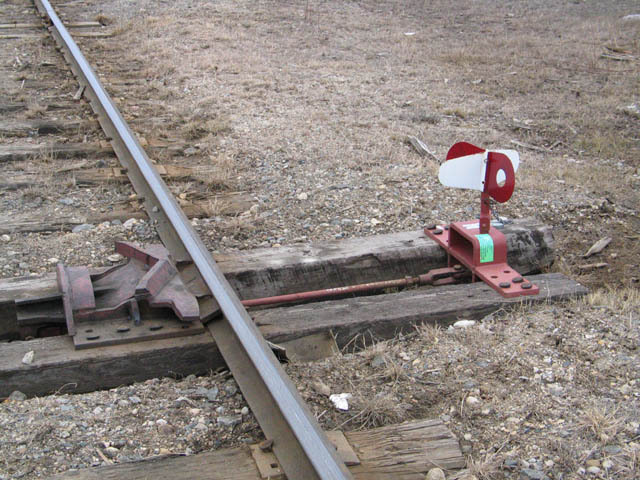 This is not a great railfan photo. 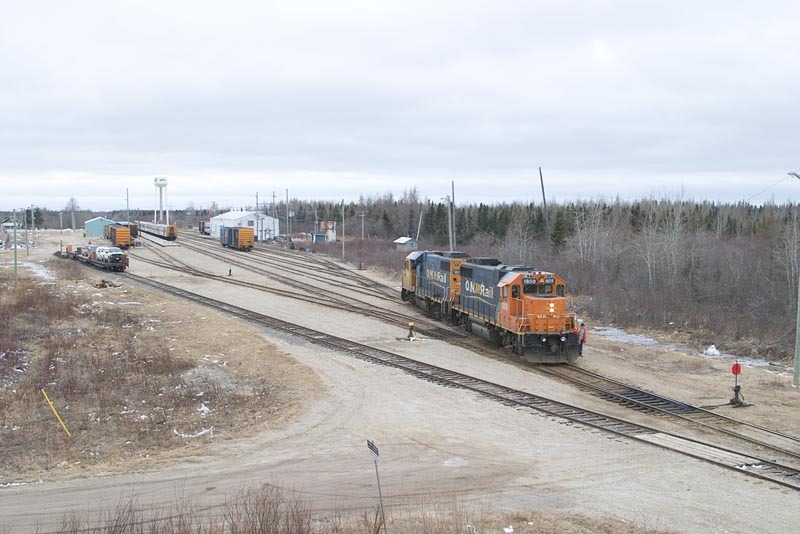 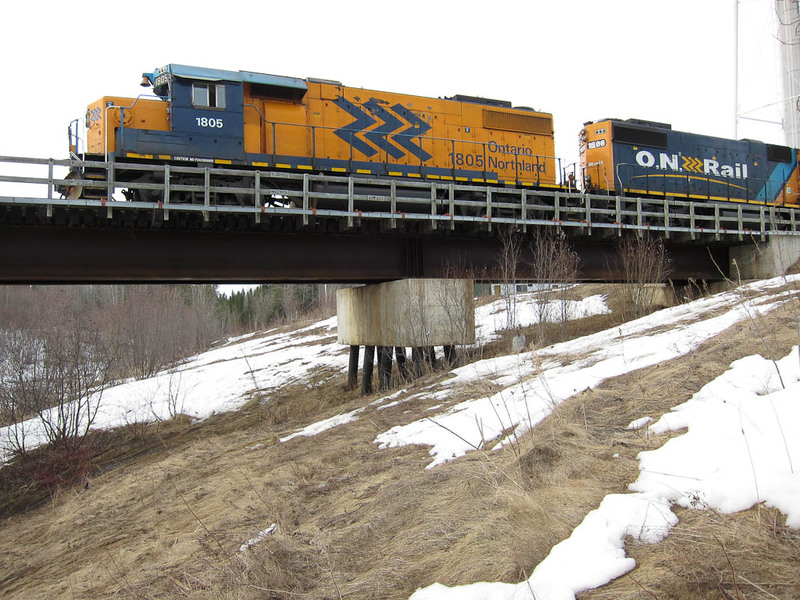 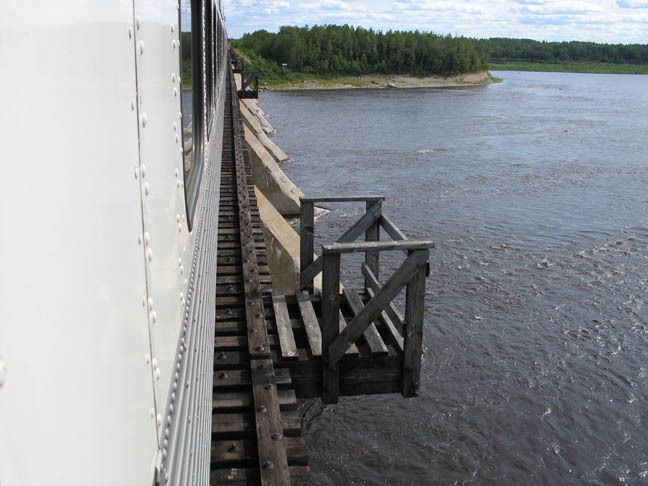 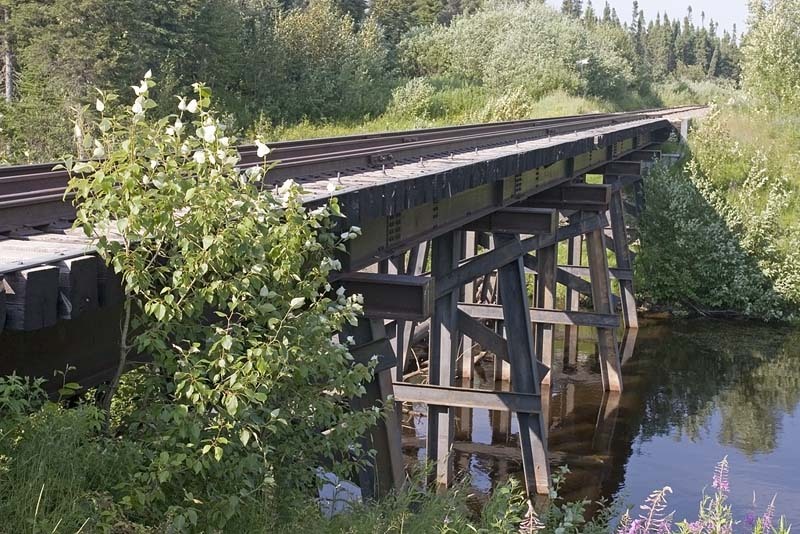 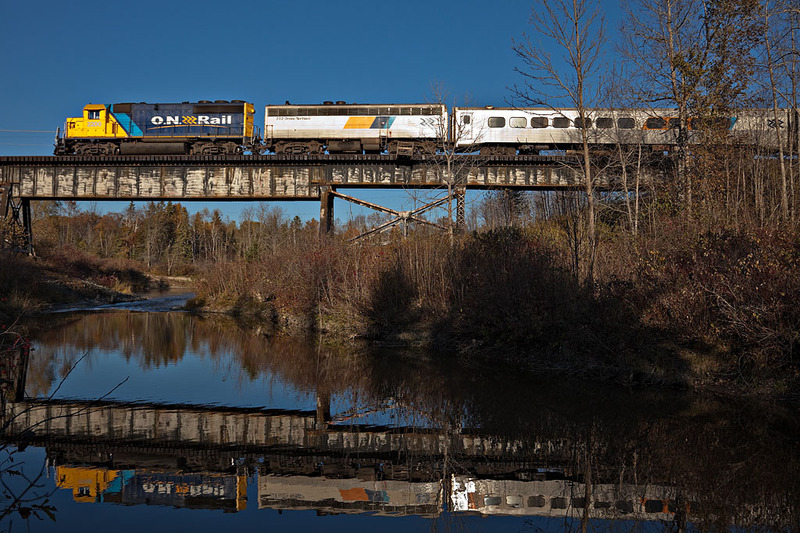 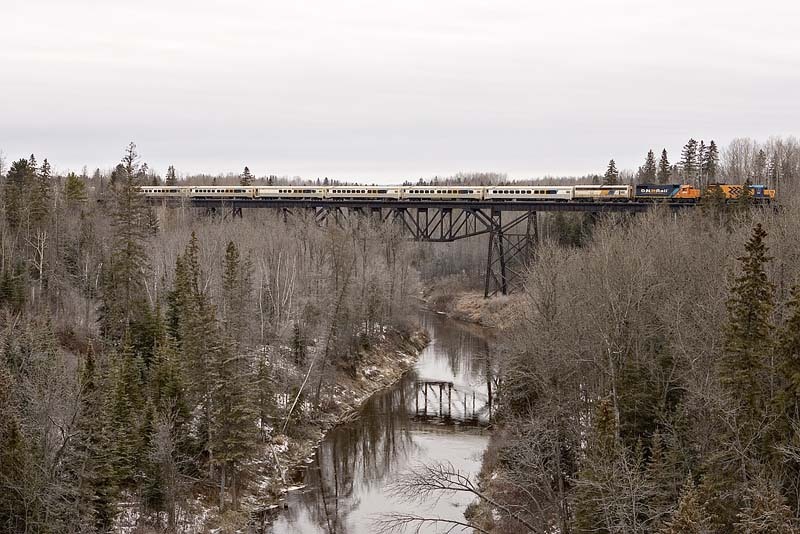 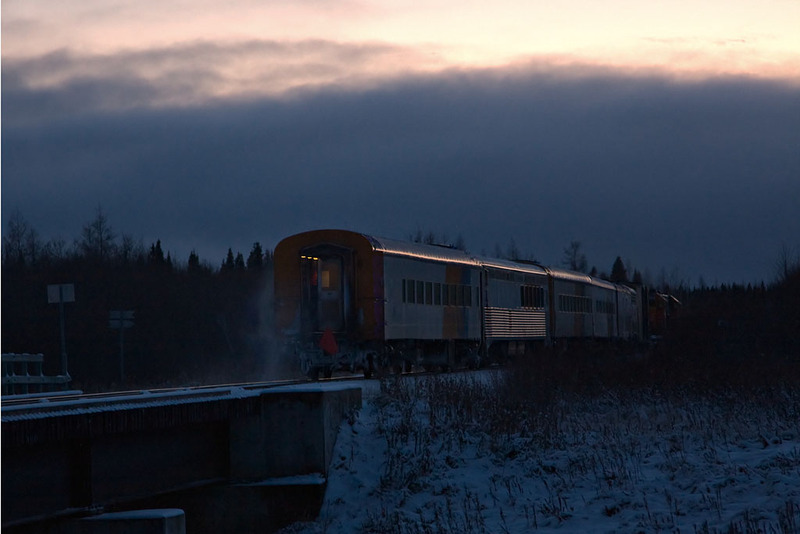 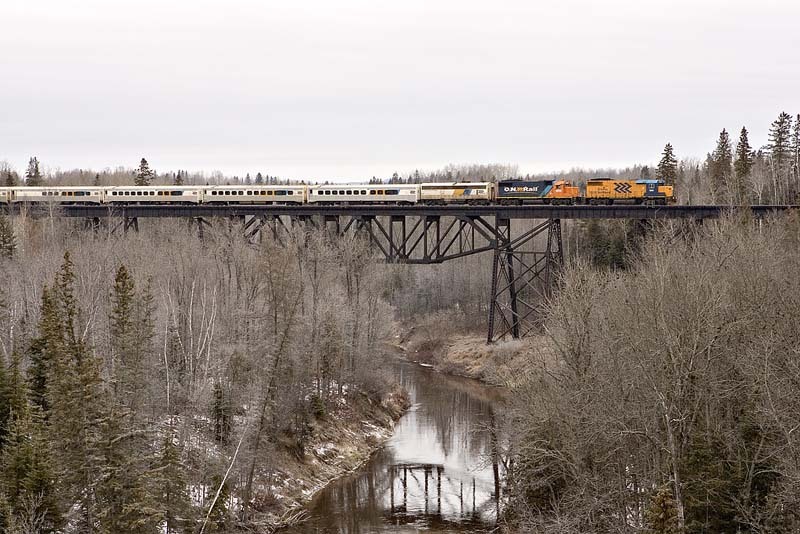 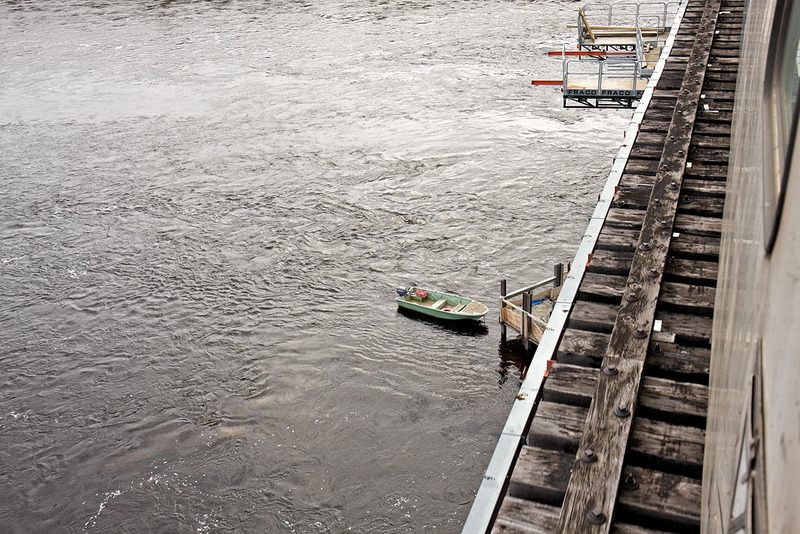 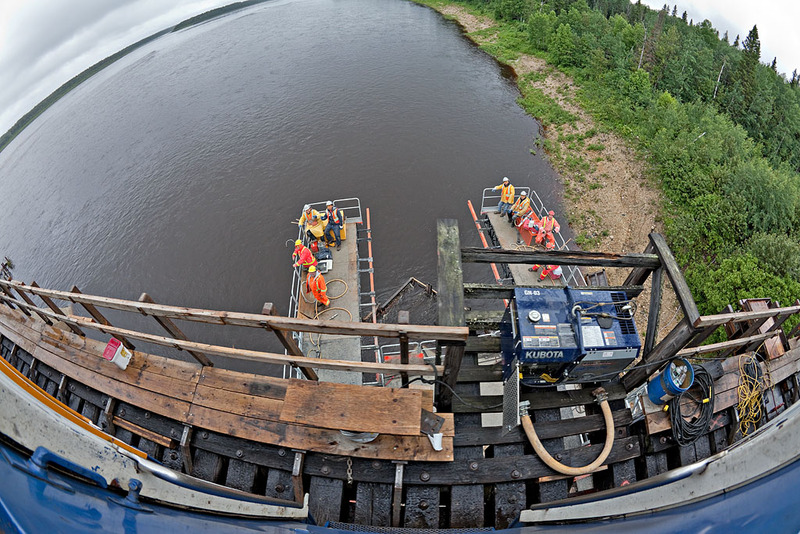 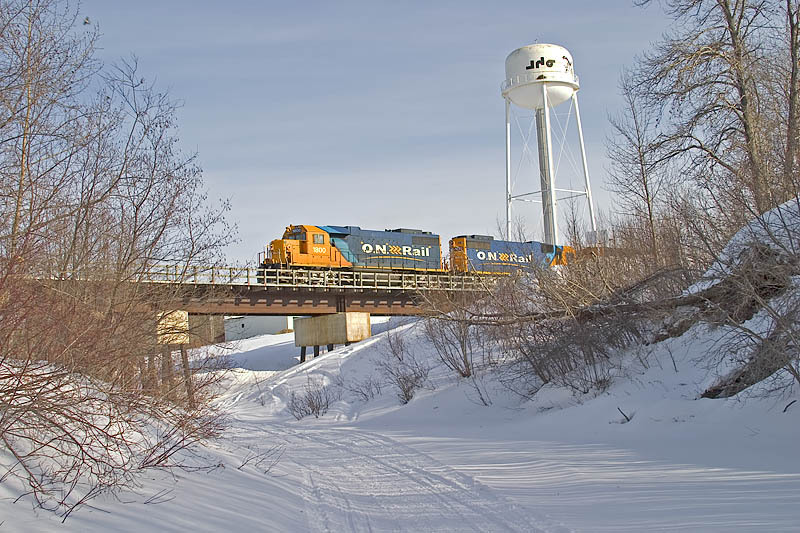 It shows two Ontario Northland engines switching along the Moose River. 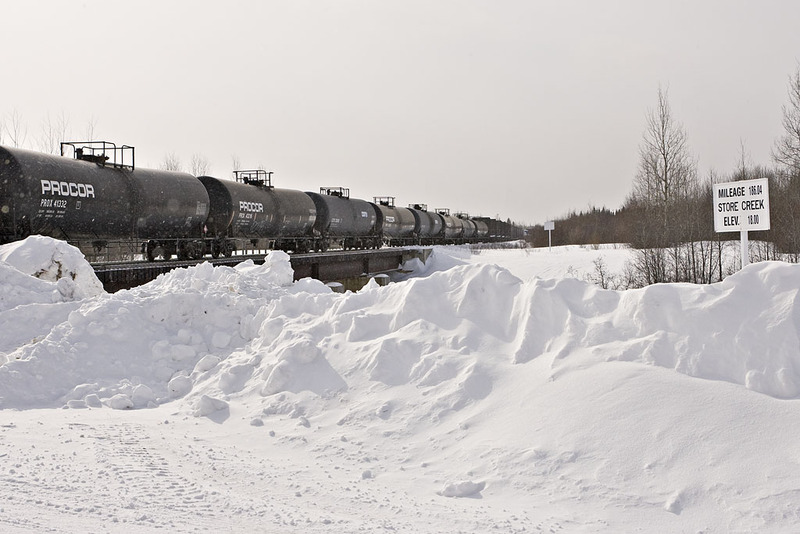 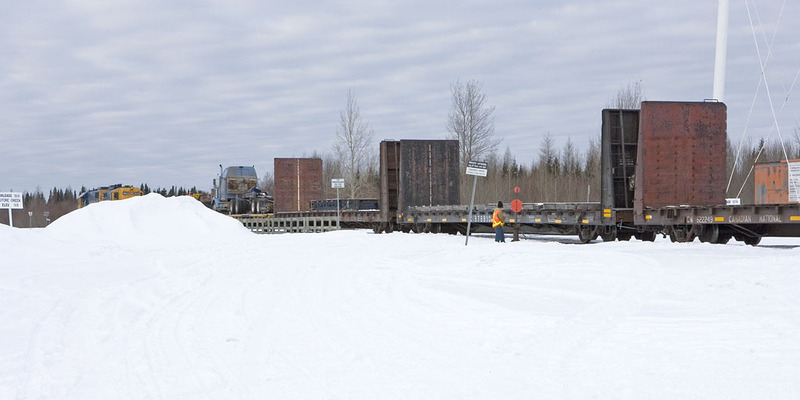 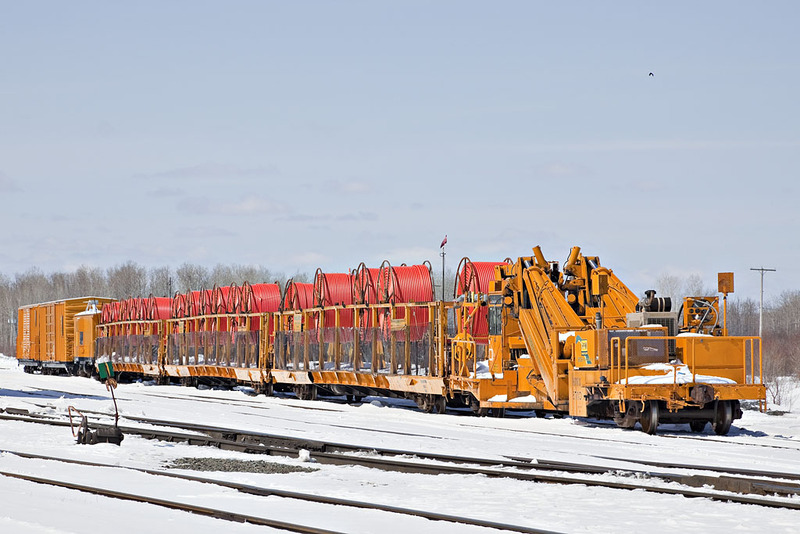 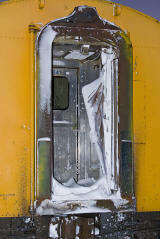 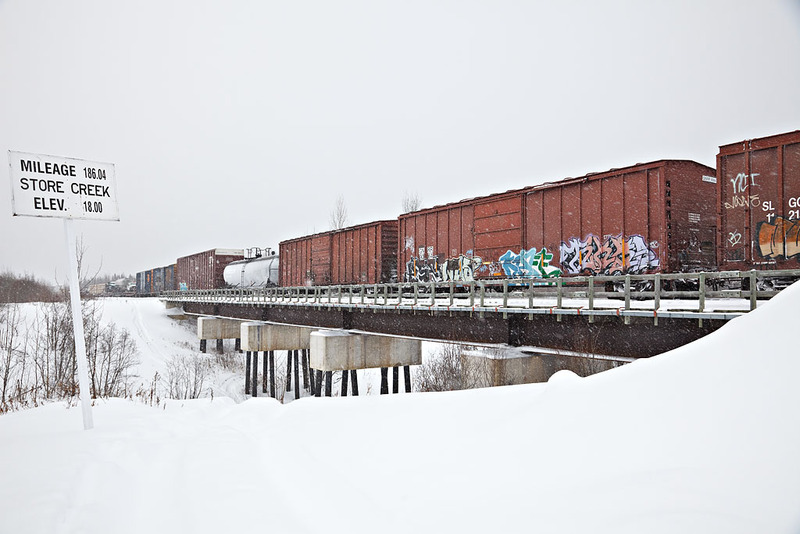 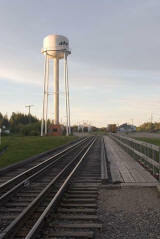 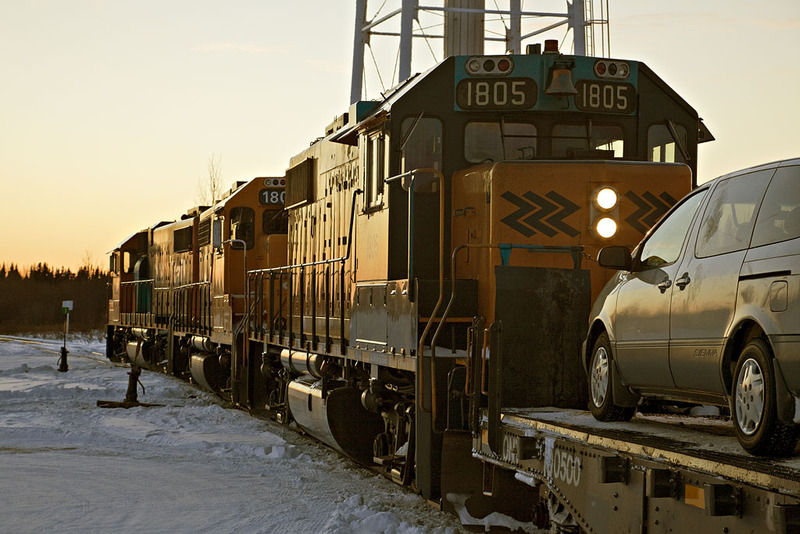 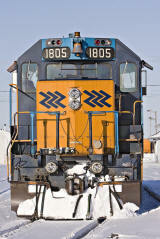 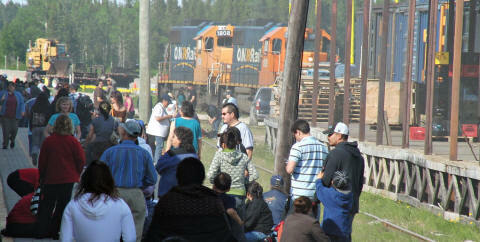 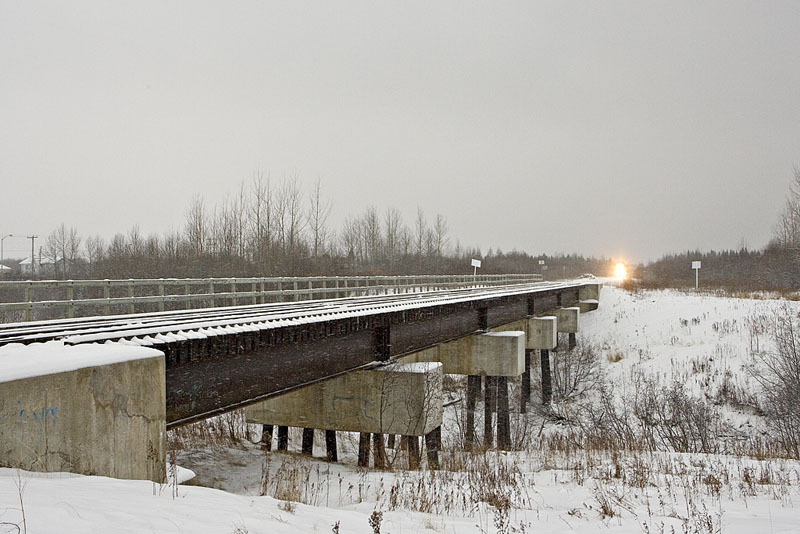 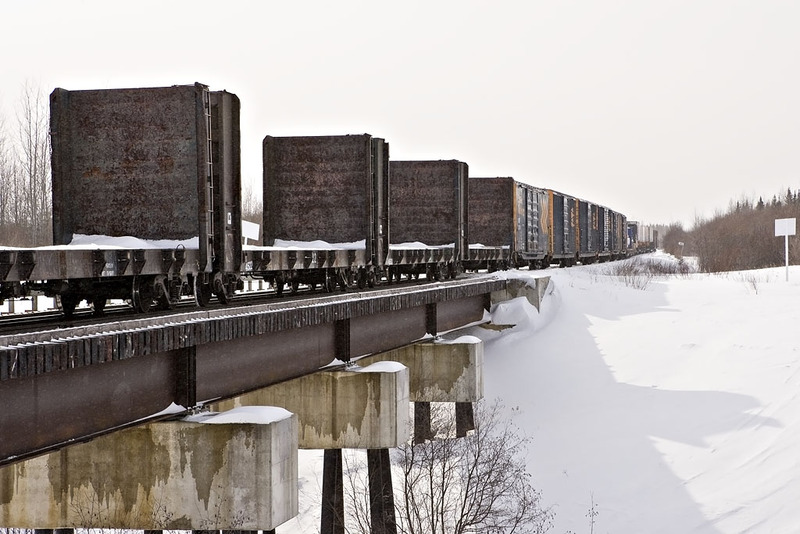 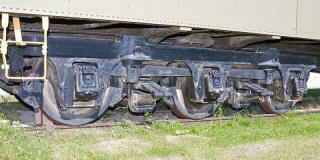 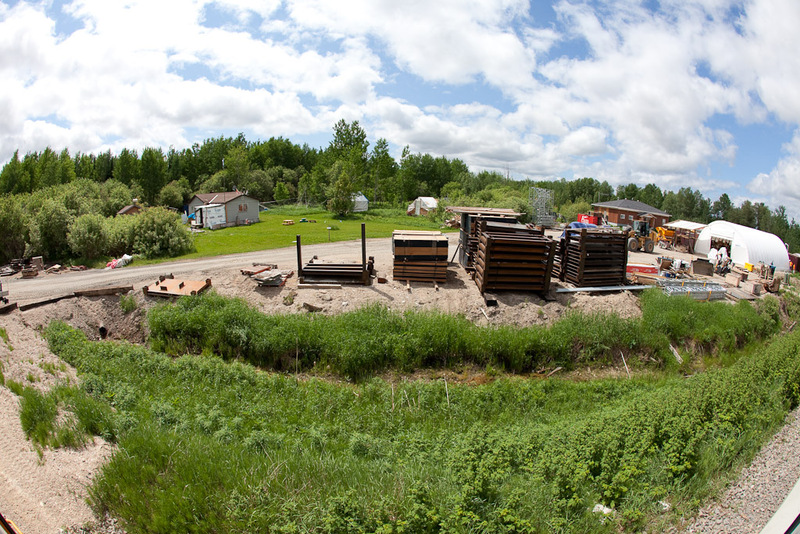 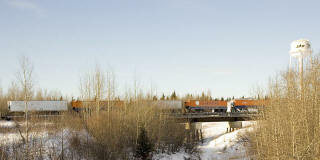 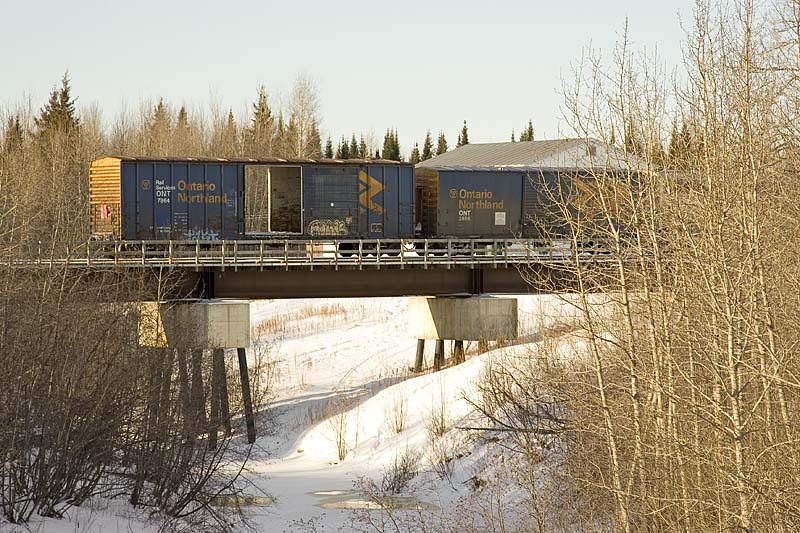 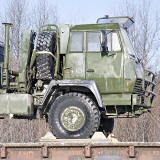 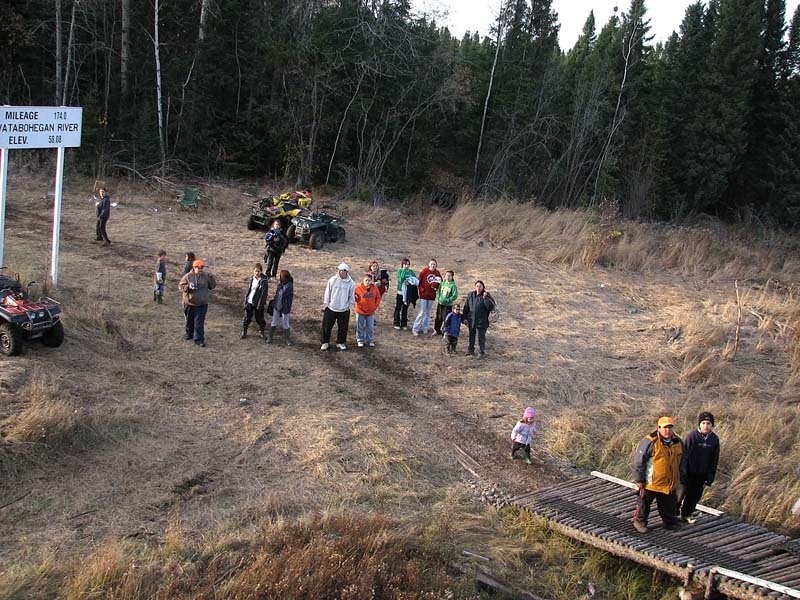 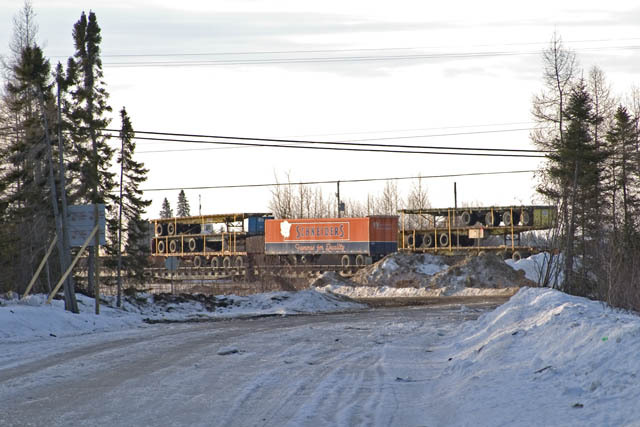 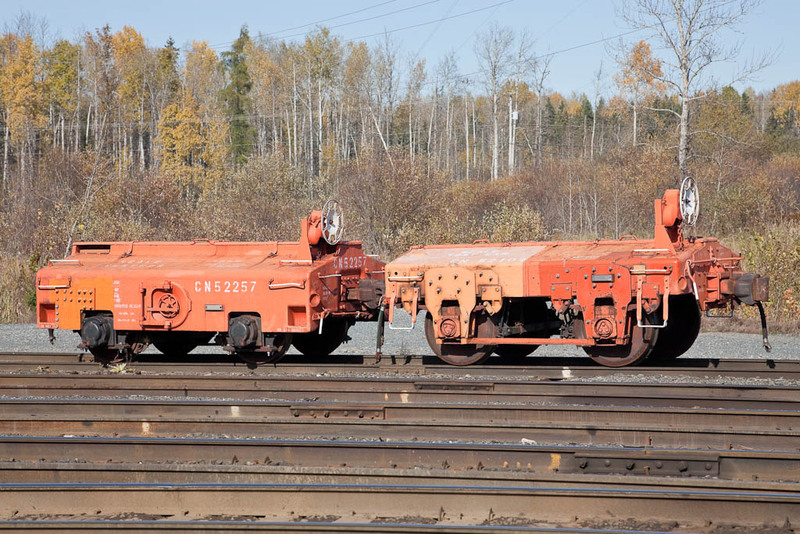 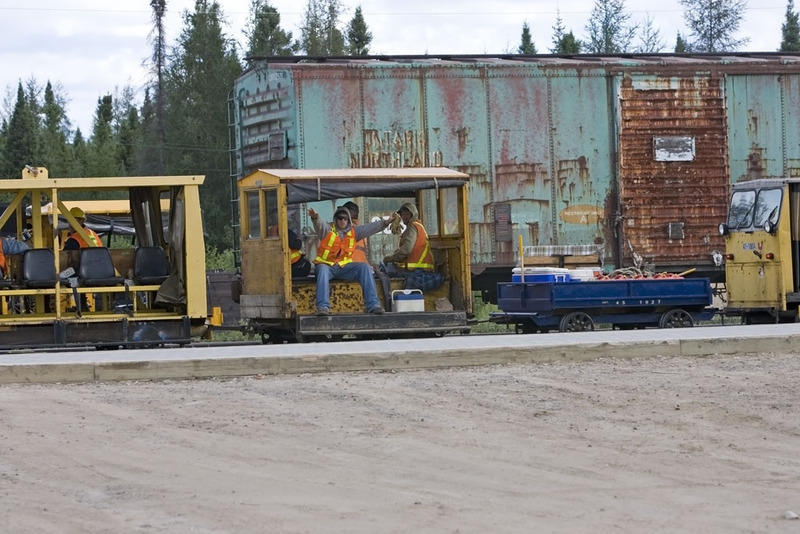 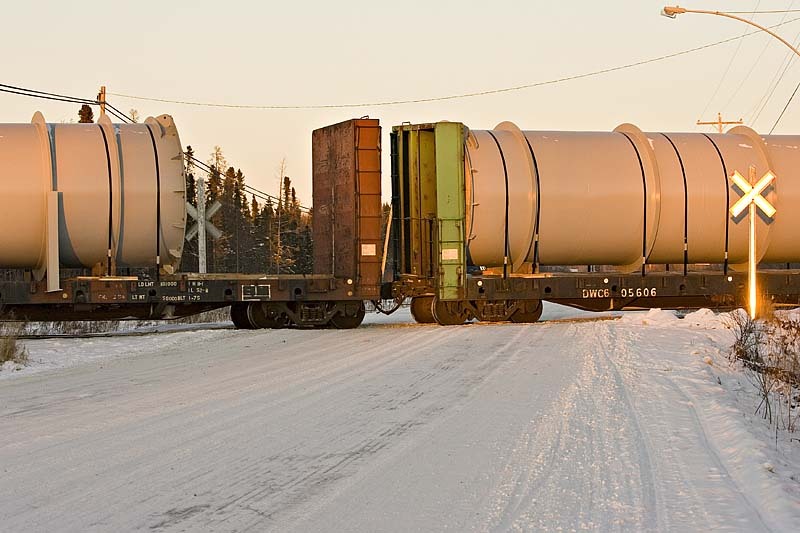 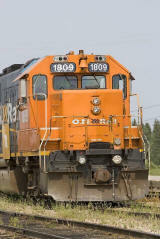 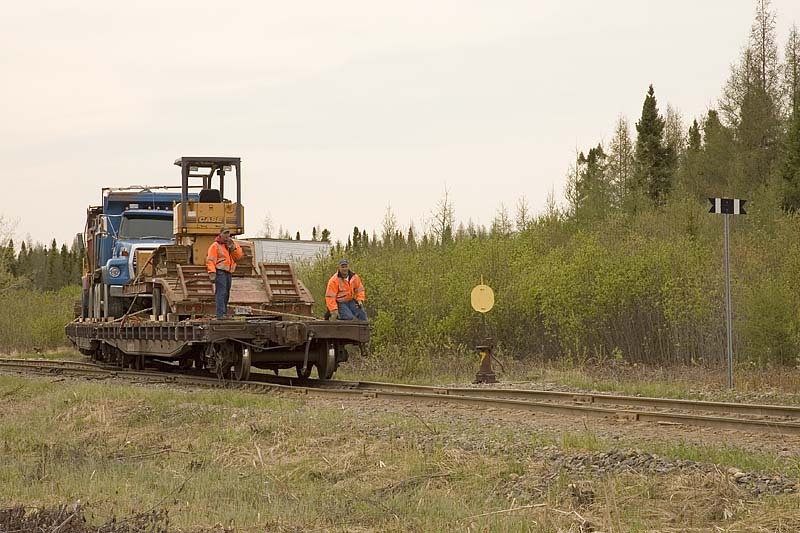 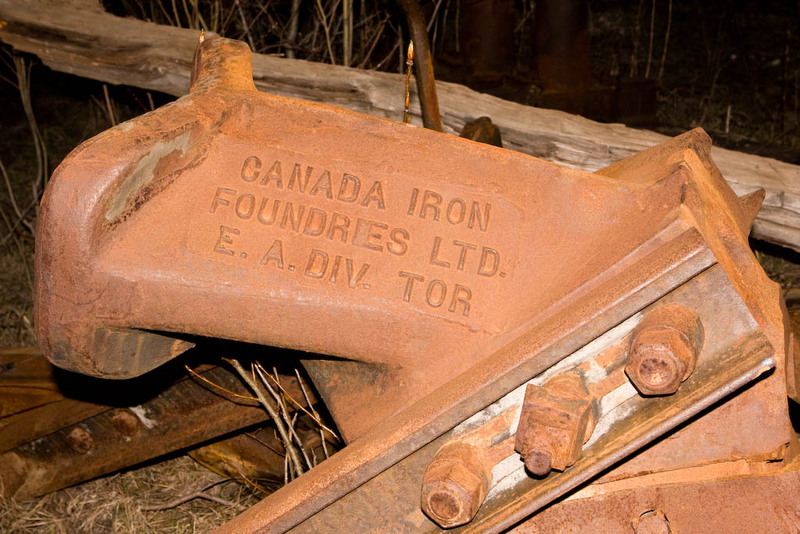 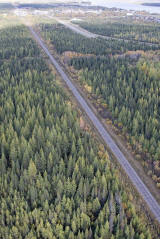 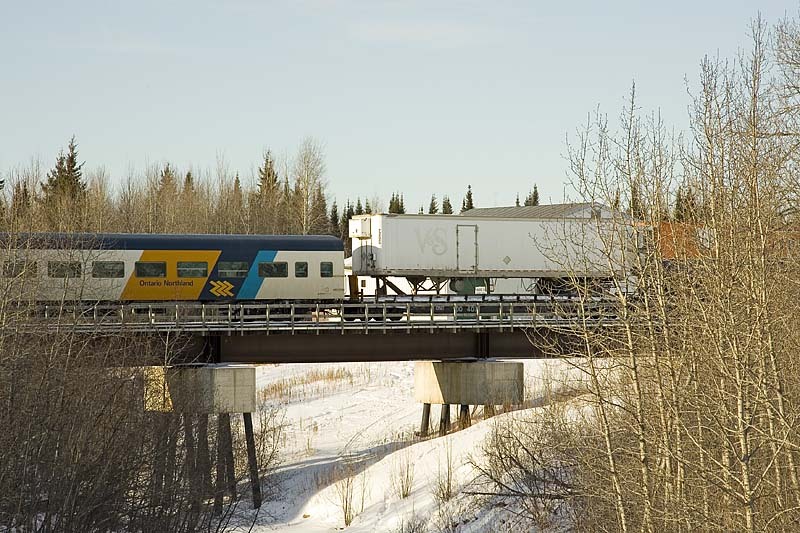 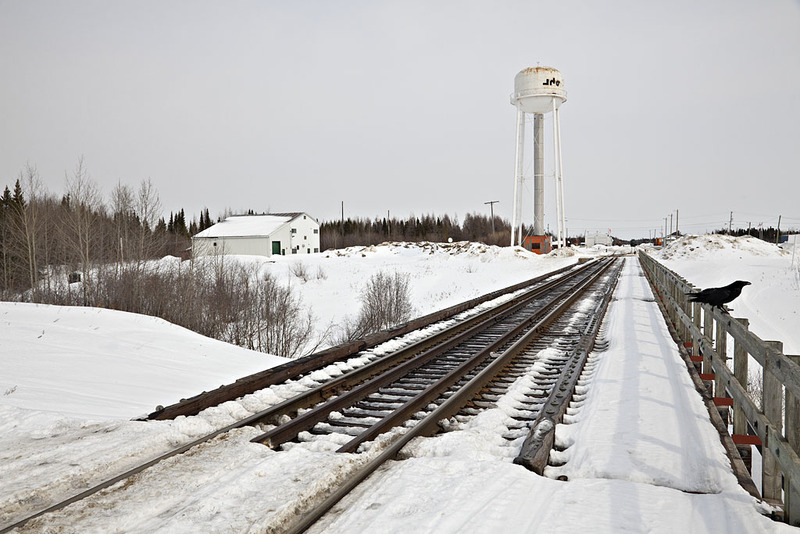 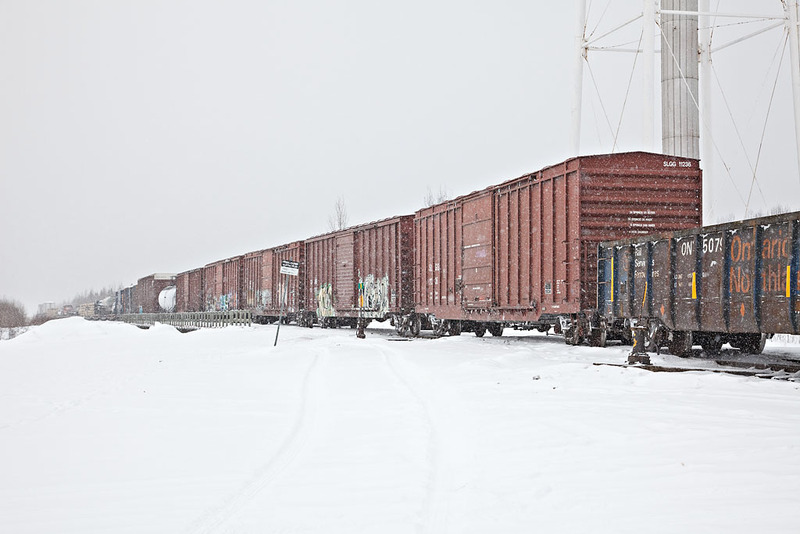 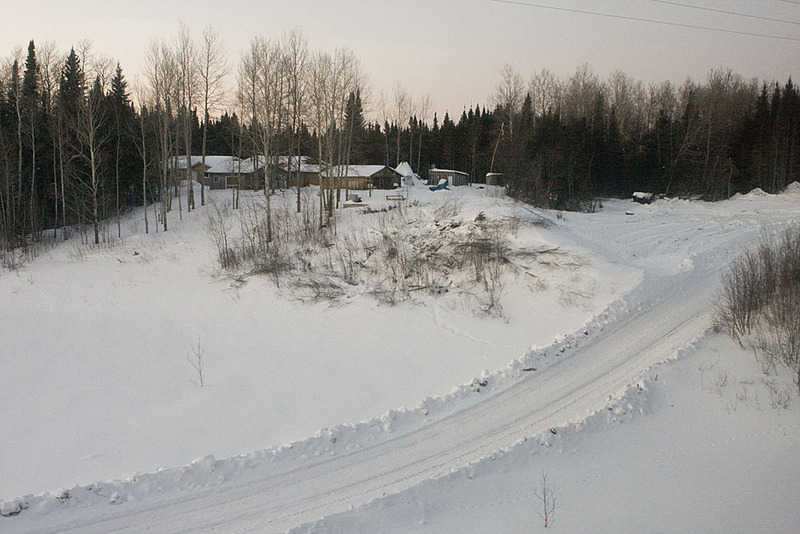 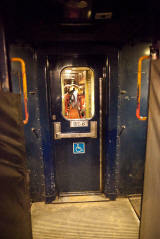 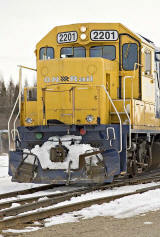 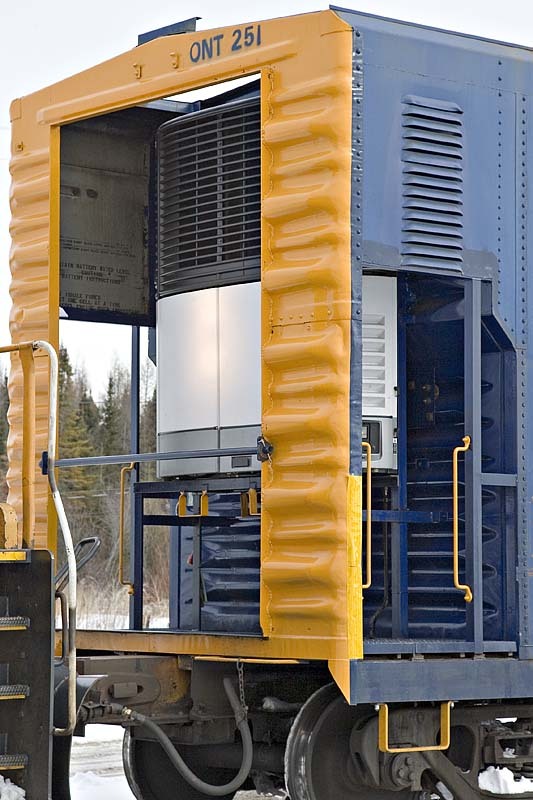 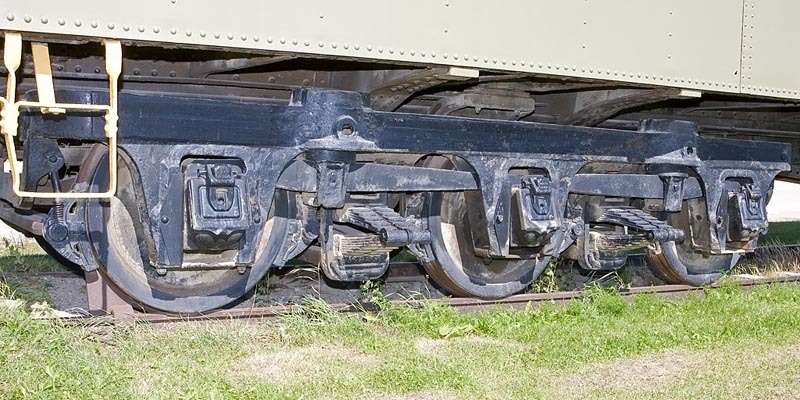 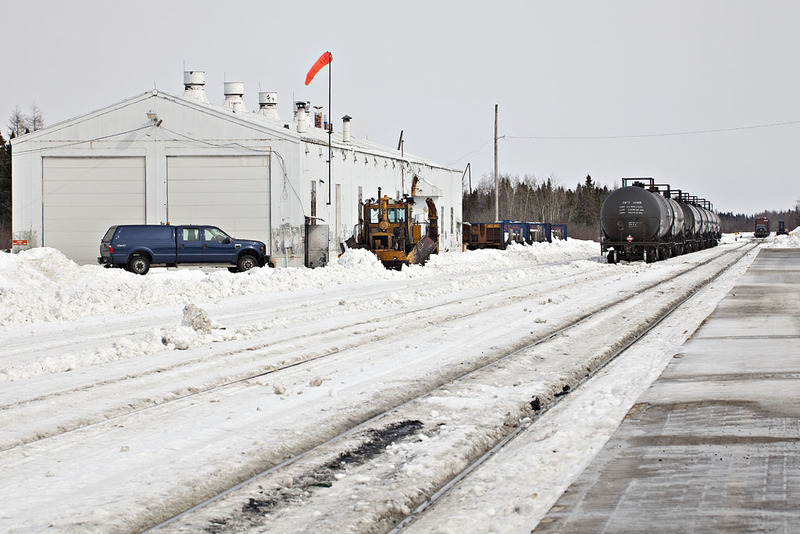 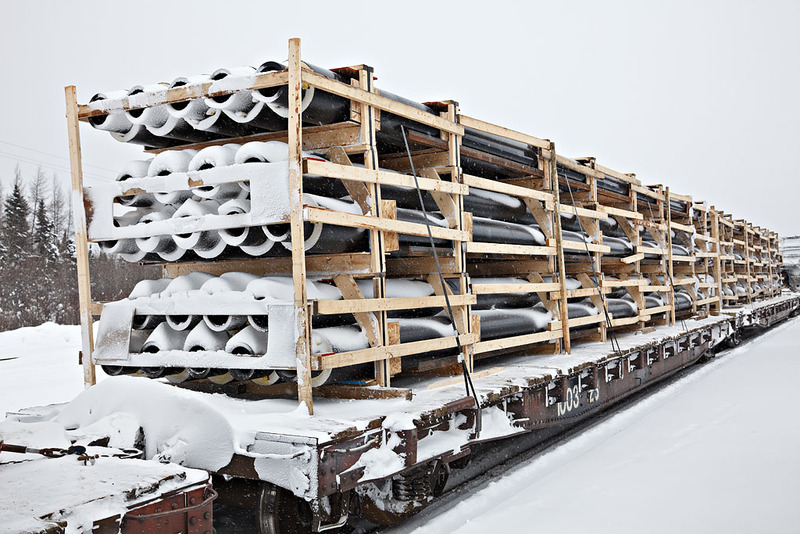 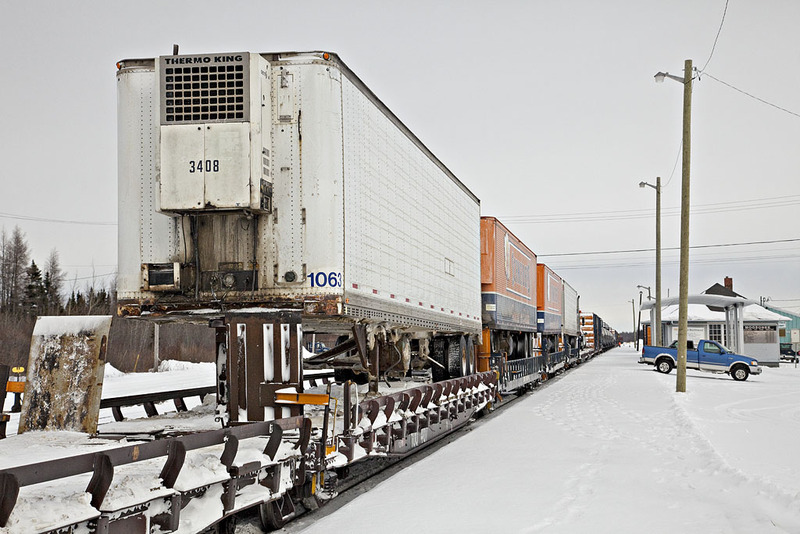 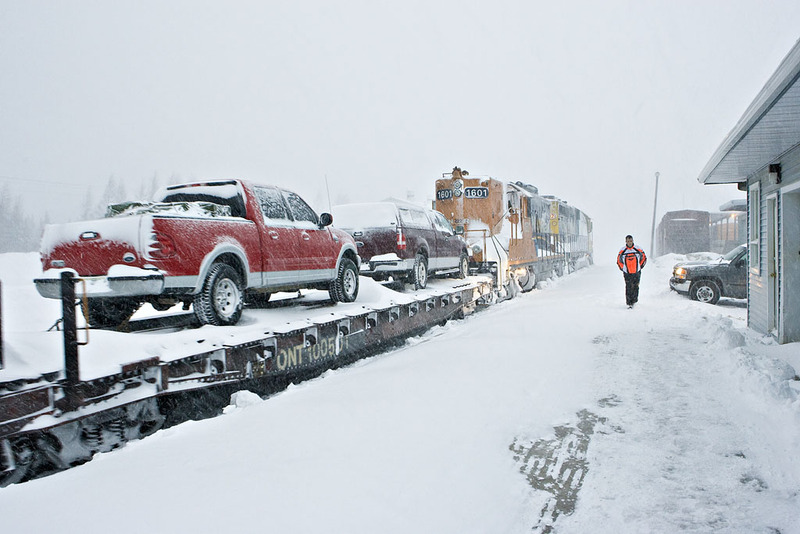 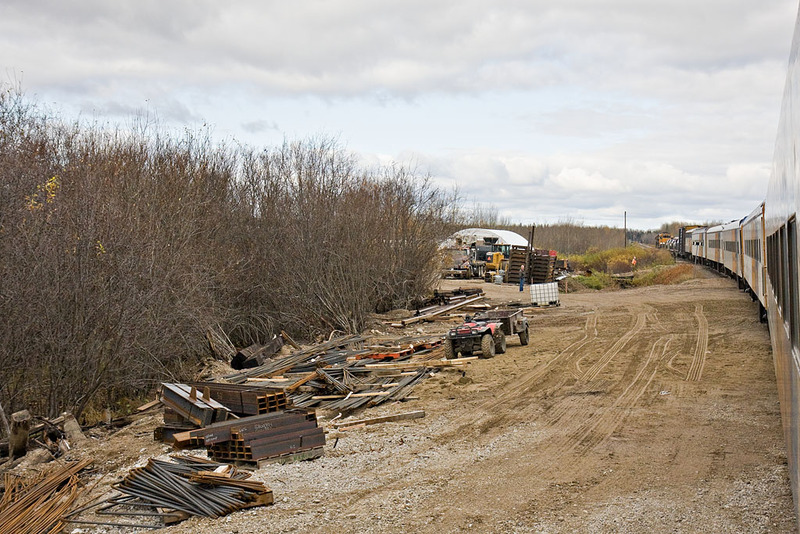 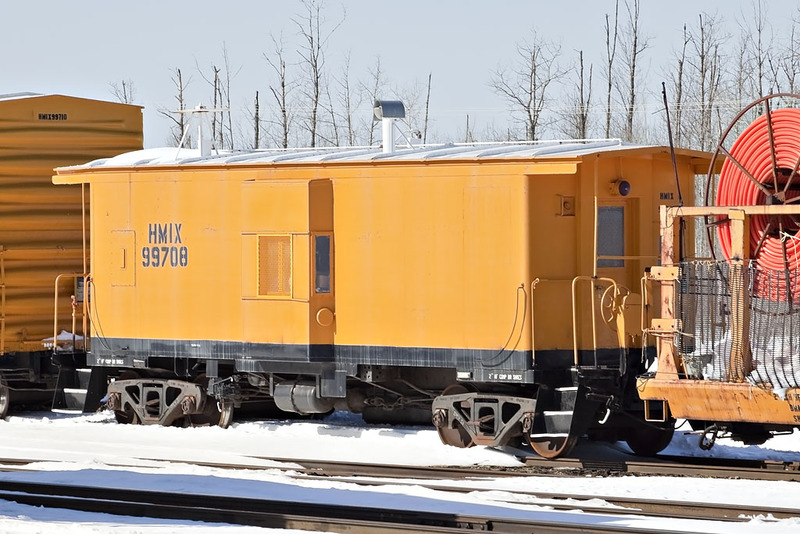 In the left part of the picture is part of a "tractor train" that is used on the winter road going north from Moosonee. 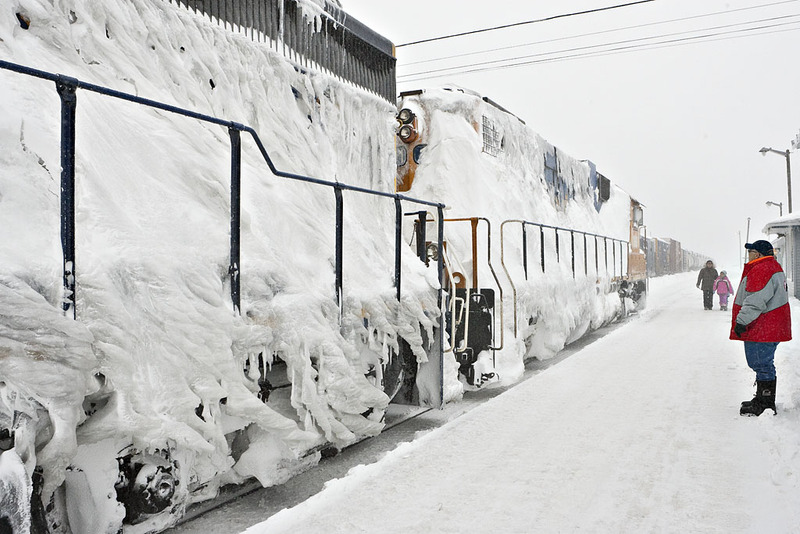 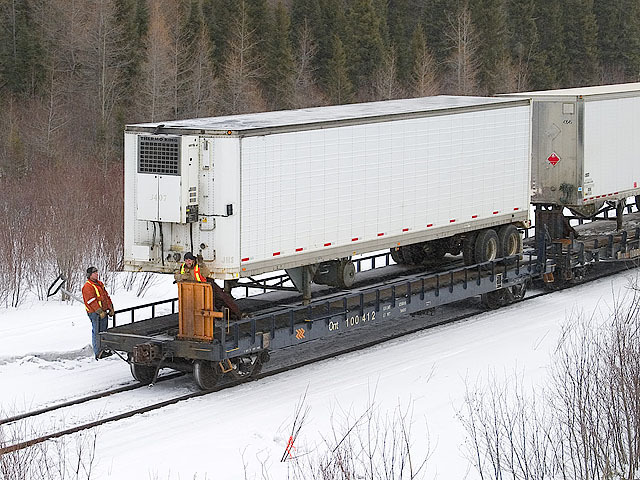 Tractor trains have been the means by which large quantities of goods have been transported on temporary winter roads. 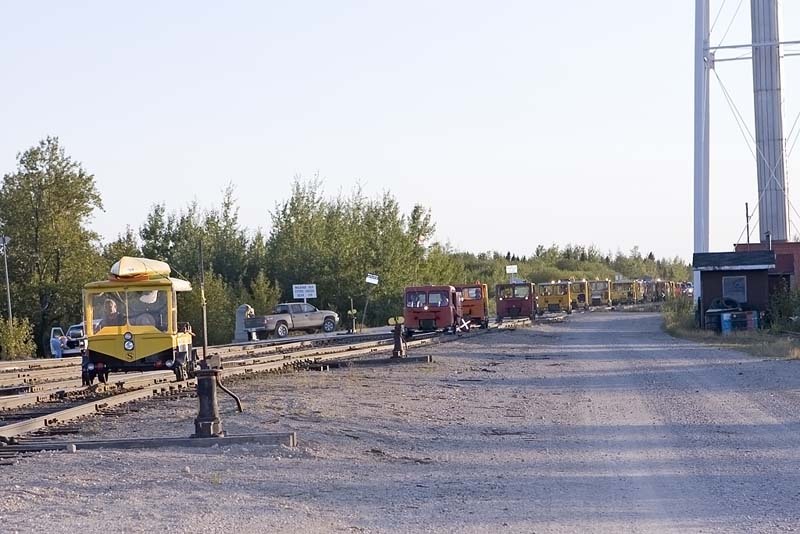 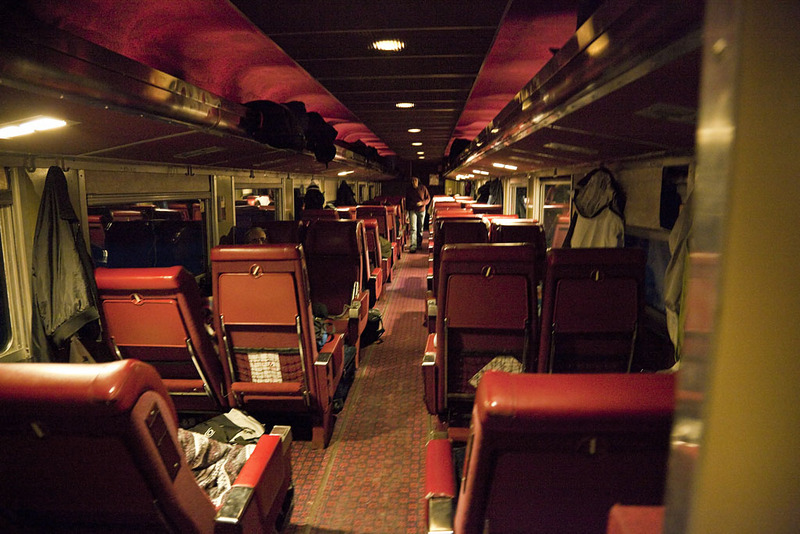 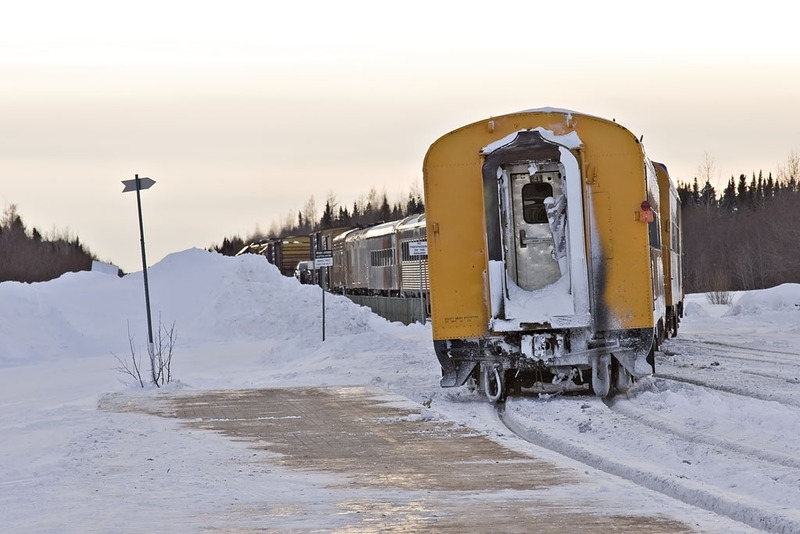 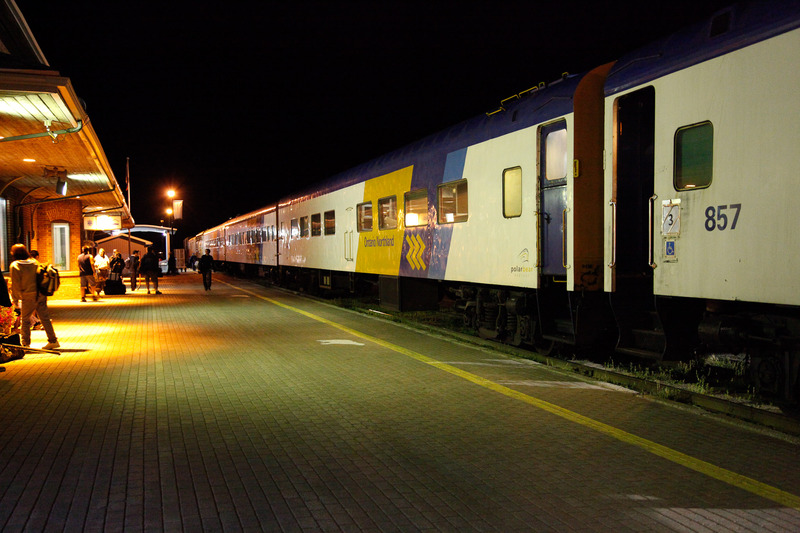 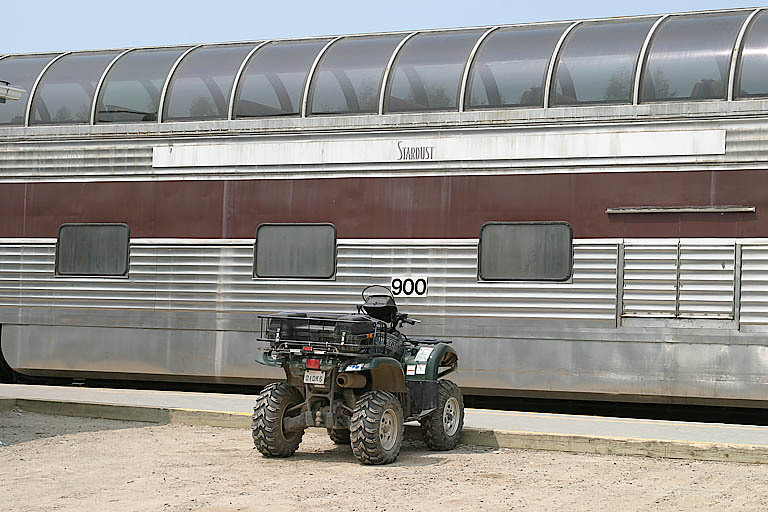 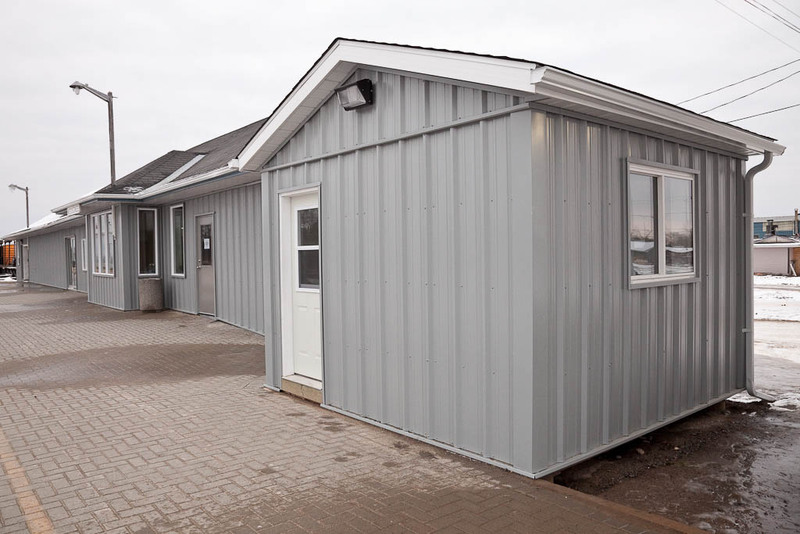 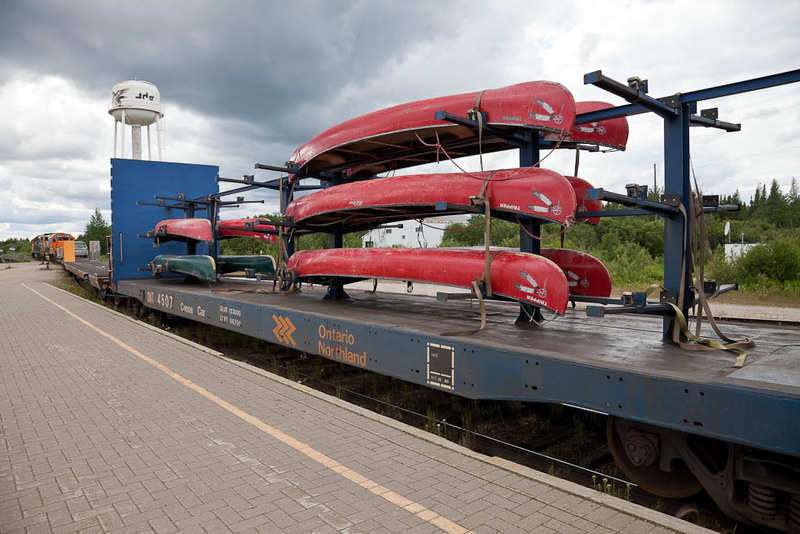 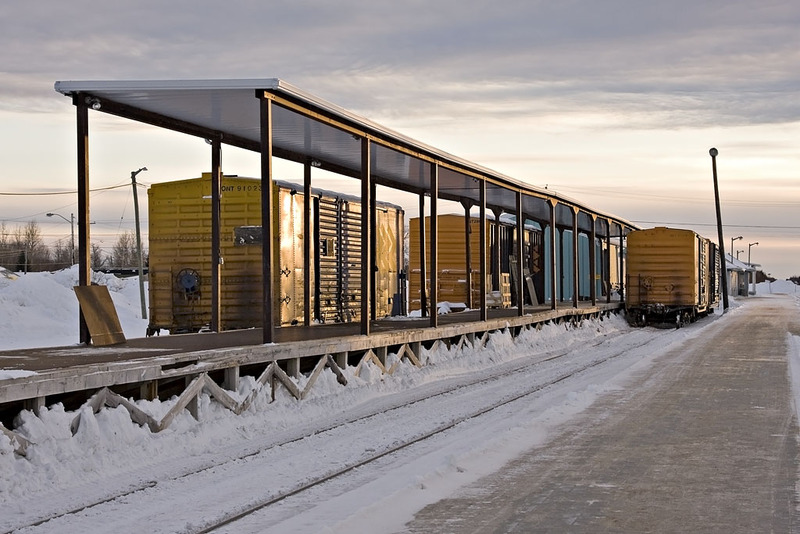 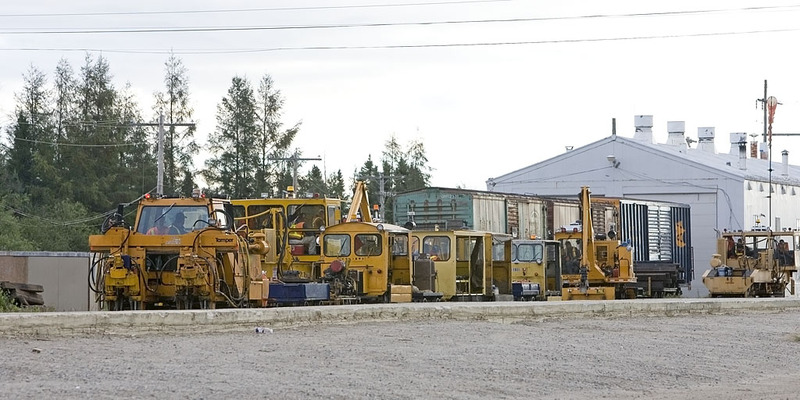 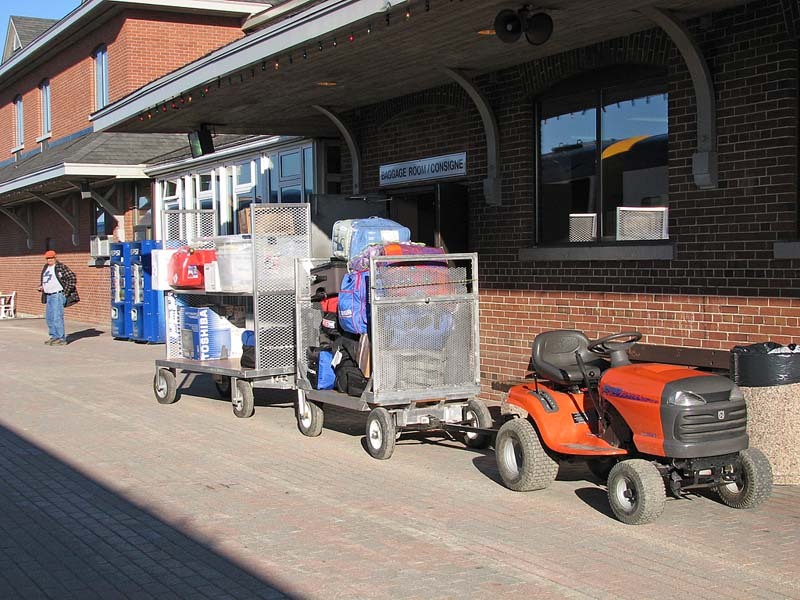 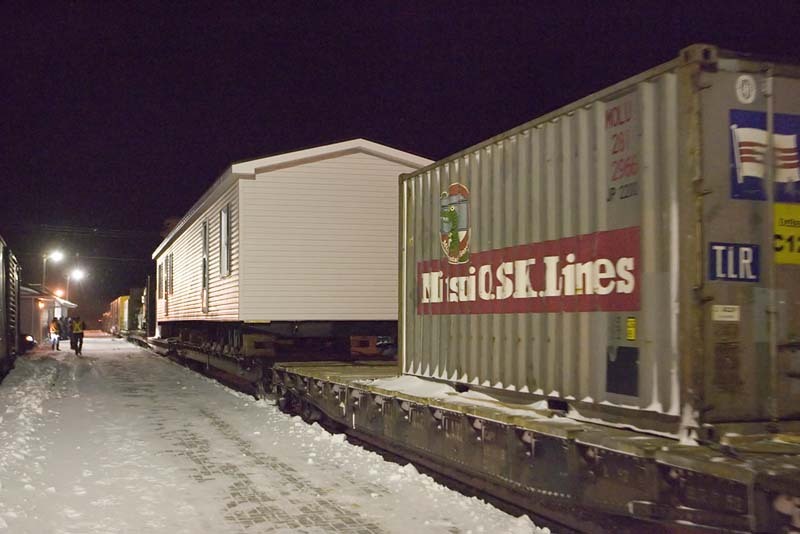 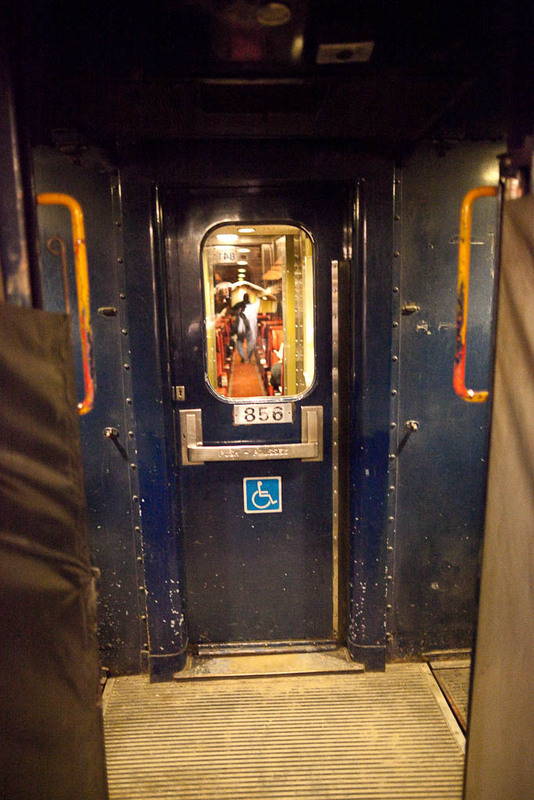 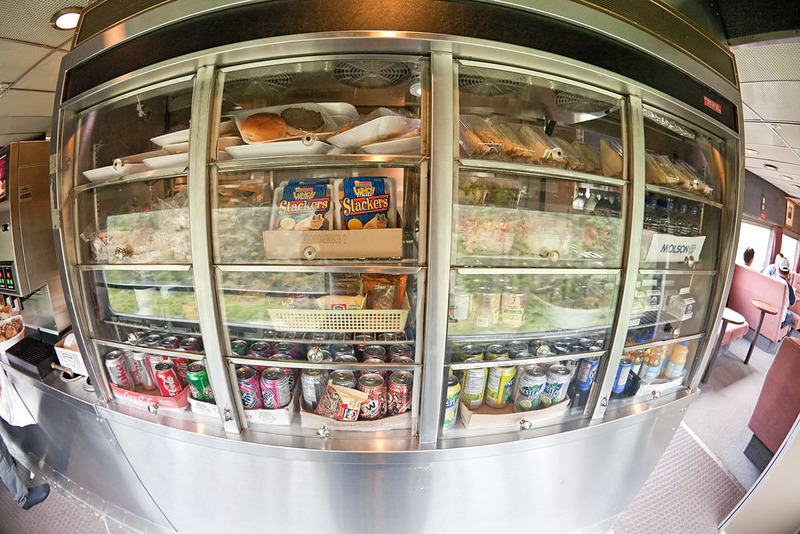 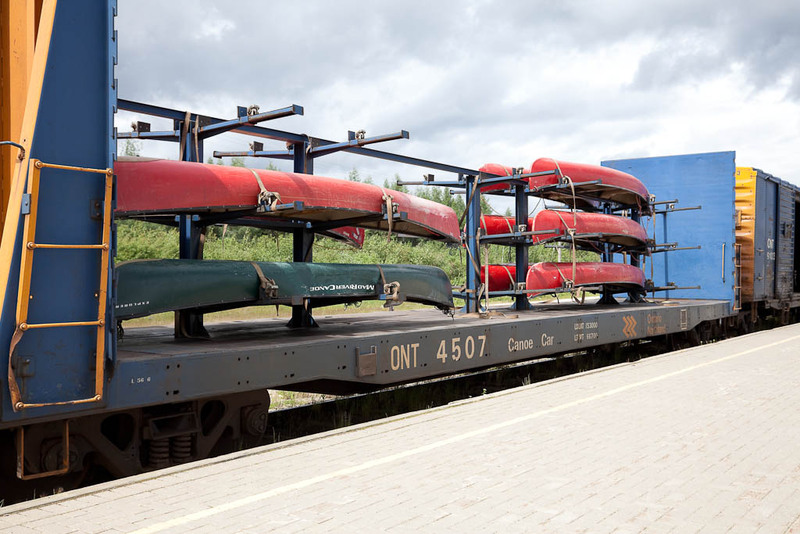 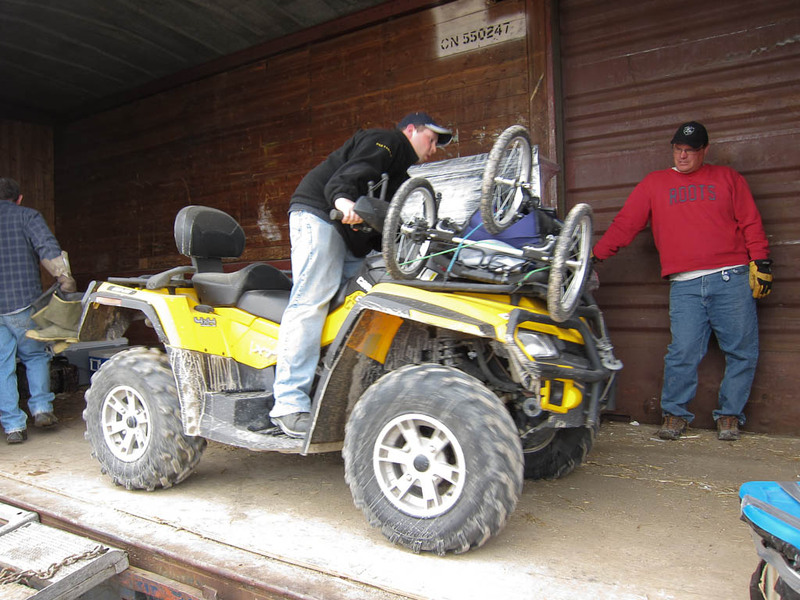 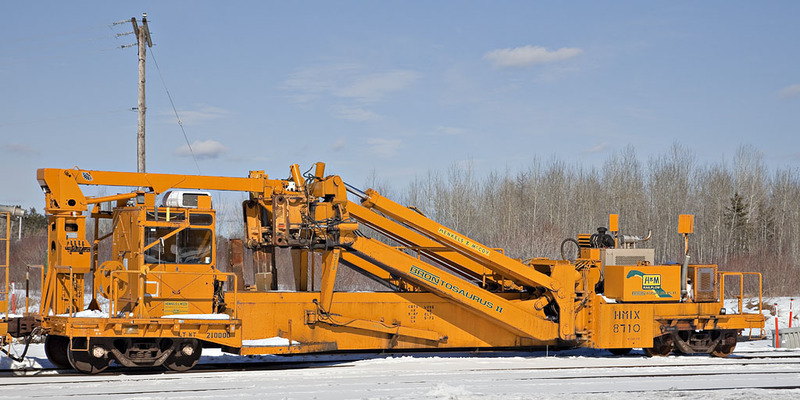 The trains include various units for accommodation, merchandise as well as fuel tanks, all on skis and pulled by tractors or bulldozers. 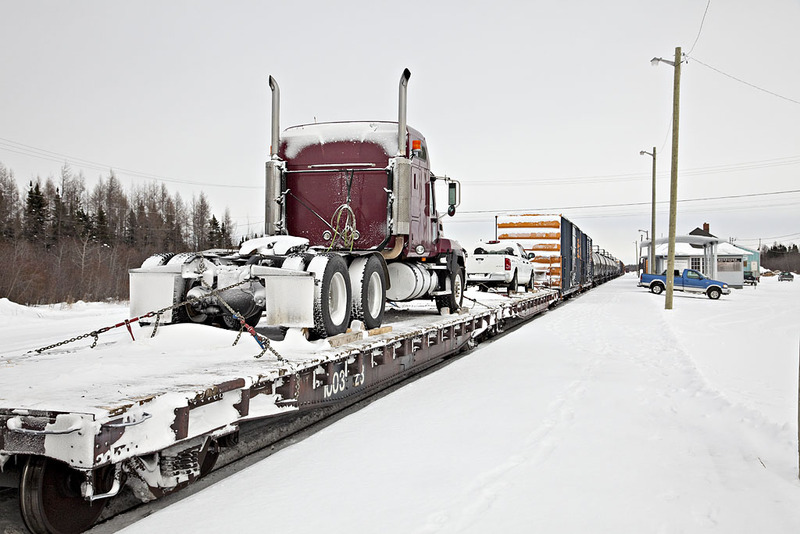 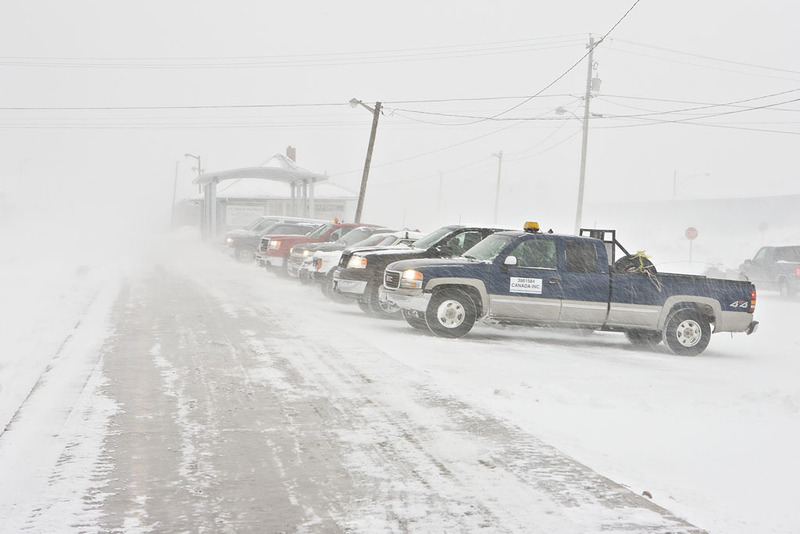 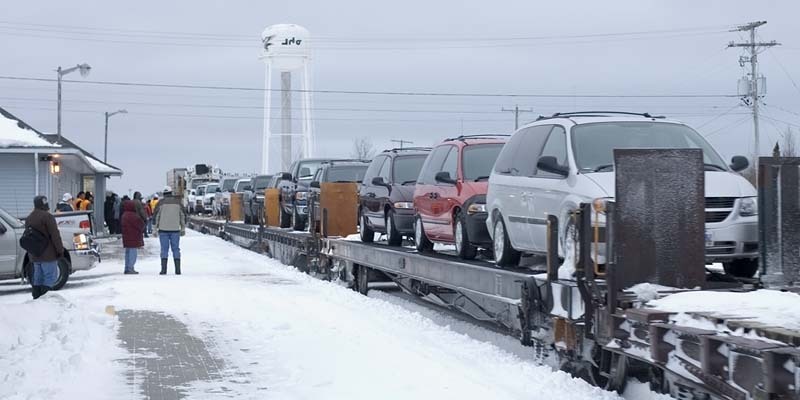 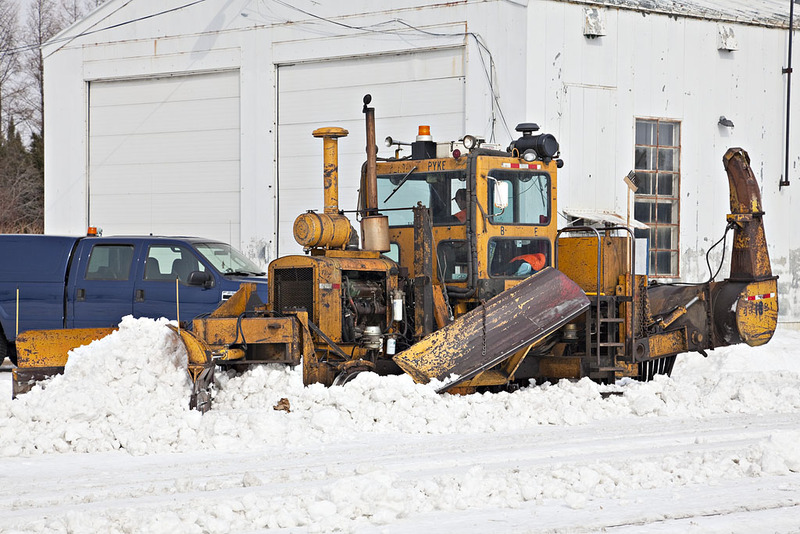 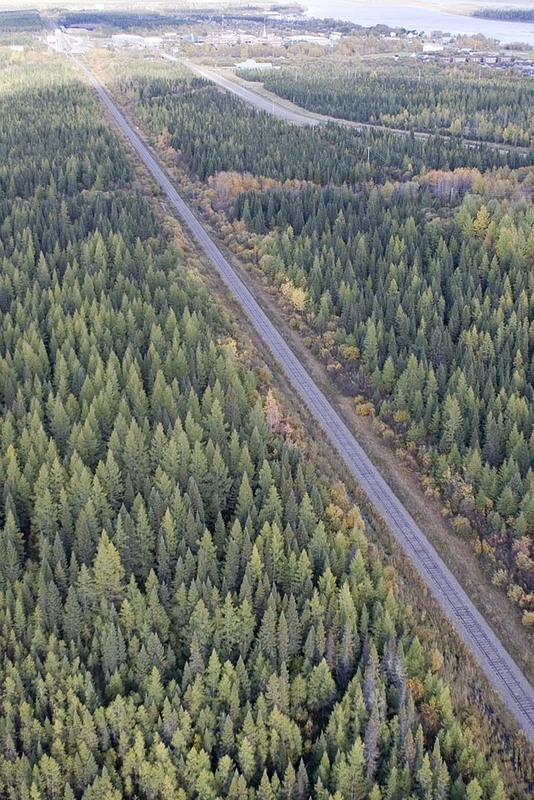 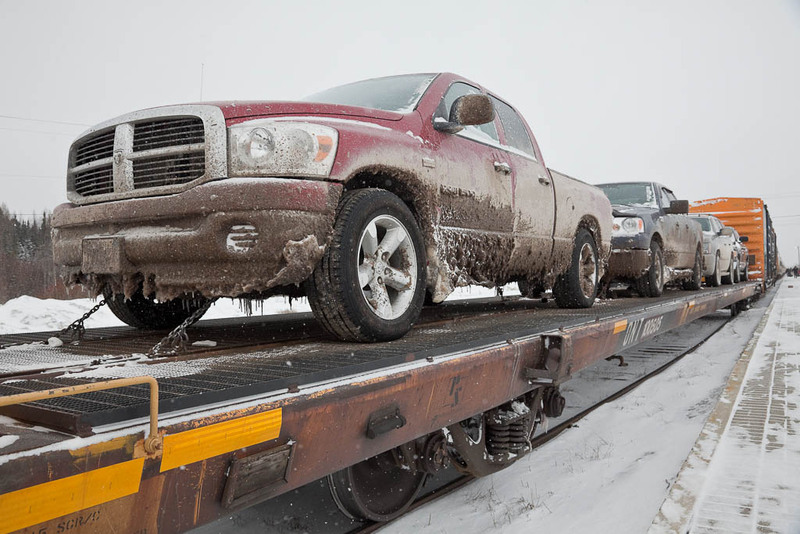 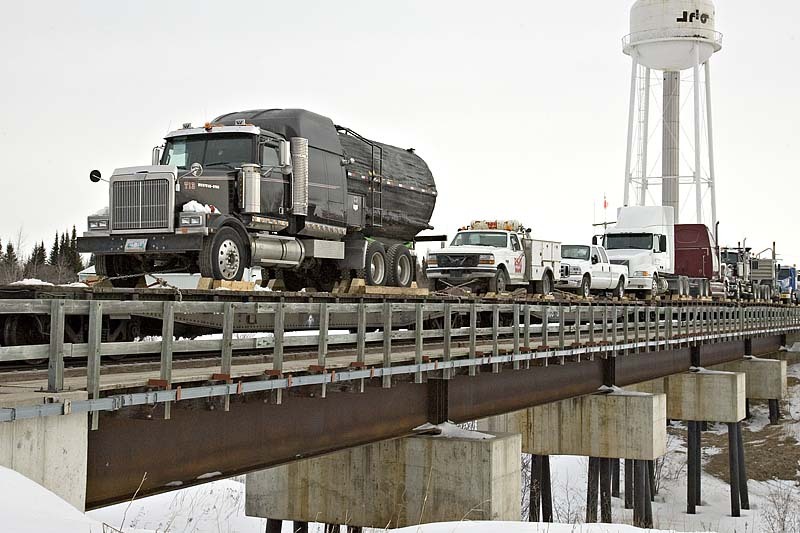 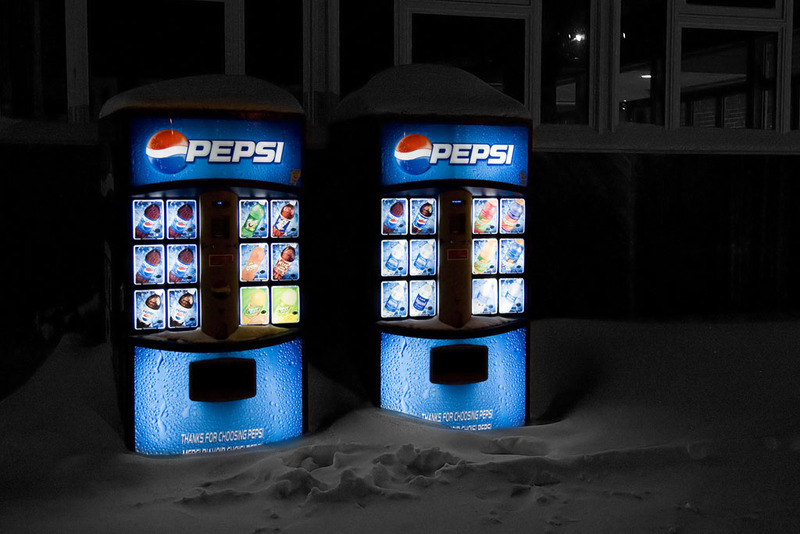 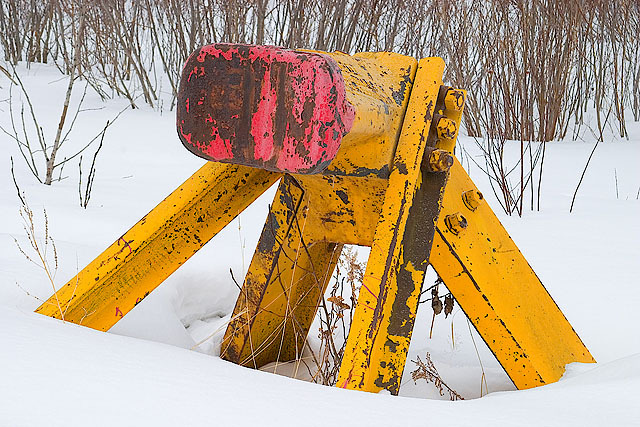 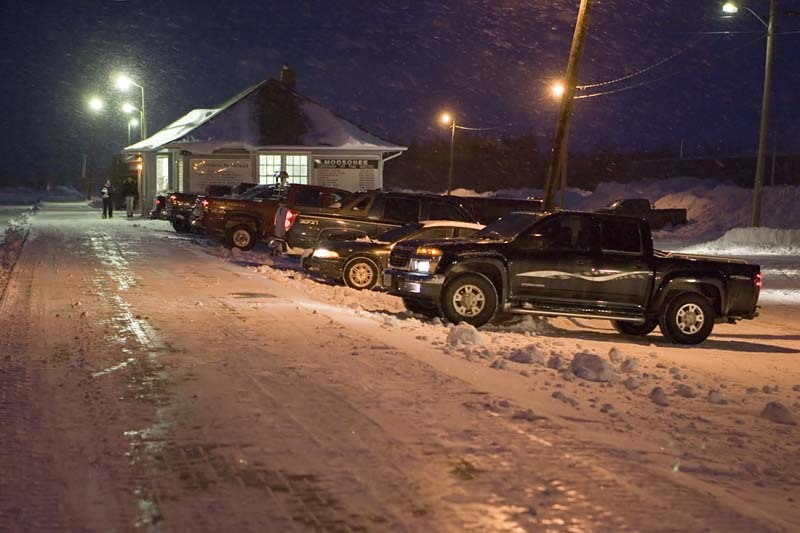 In recent years the quality of the winter roads has increased to the point where tractor trailers, pickup trucks and even cars can sometimes use them. 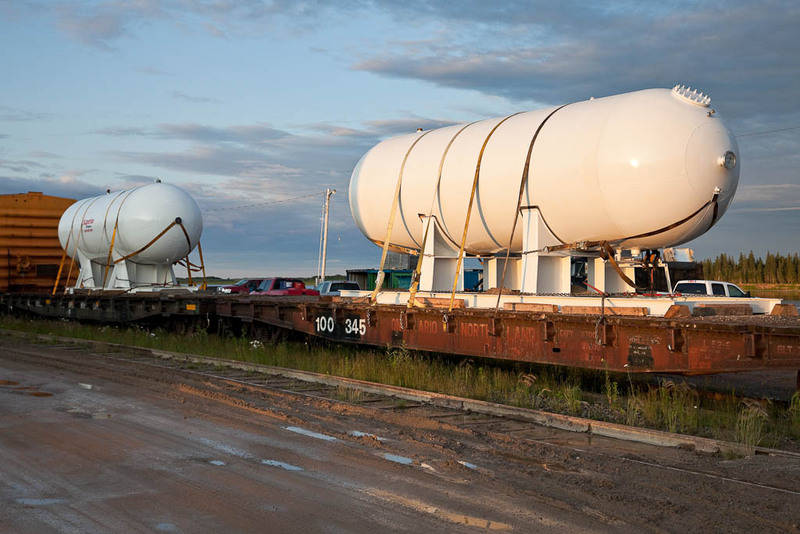 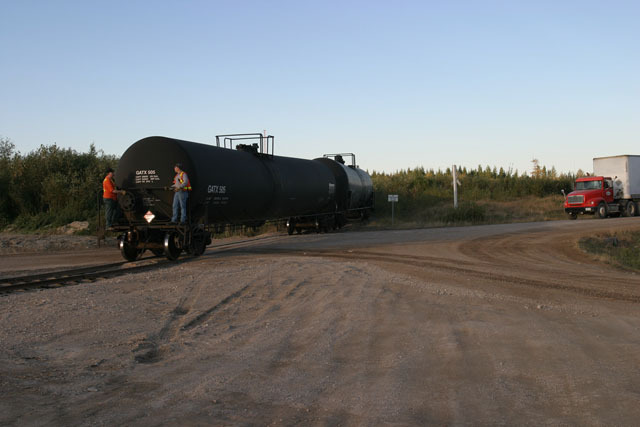 Tank cars along Ferguson Road North. 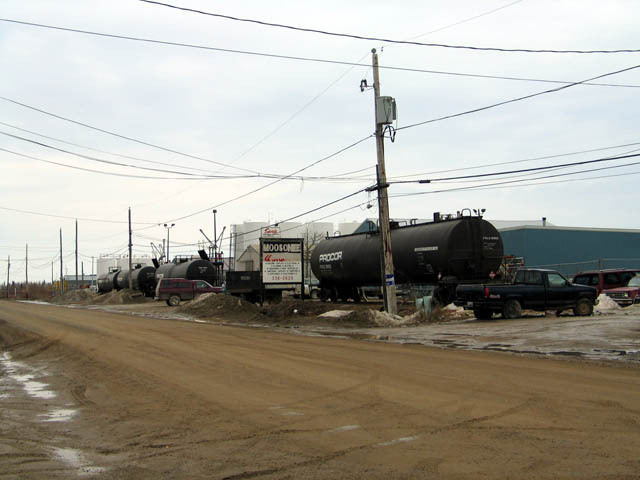 Moosonee is a transshipment point for many commodities including fuels. 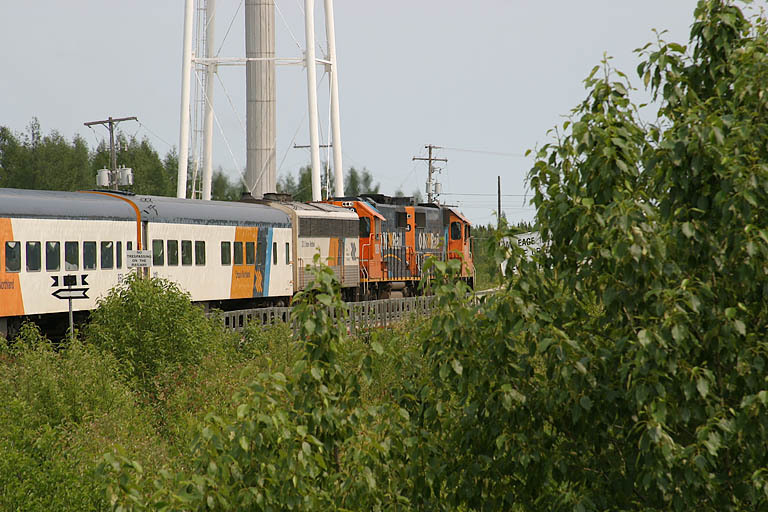 Polar Bear Express excursion train at Moosonee July 10, 2004 (large file). 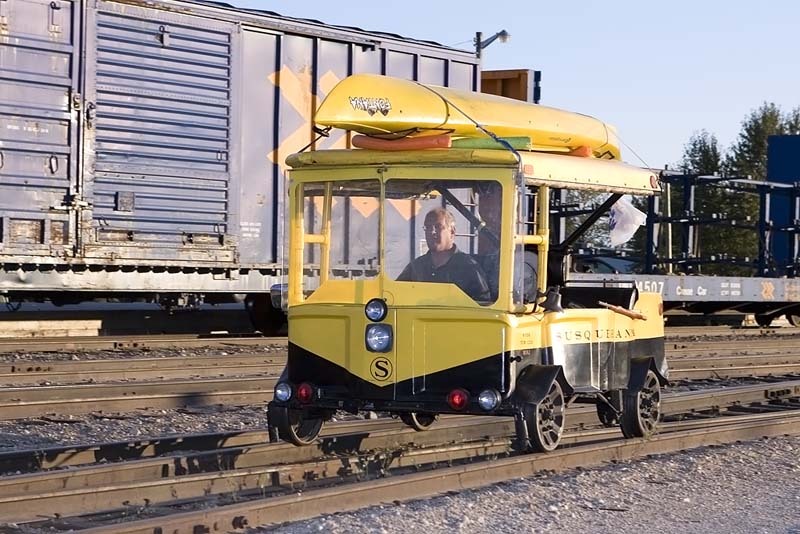 generate electricity for the passenger cars. 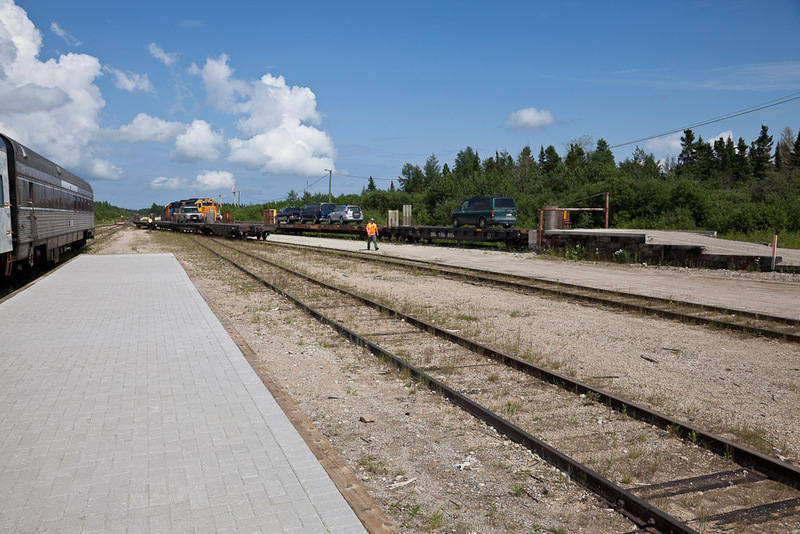 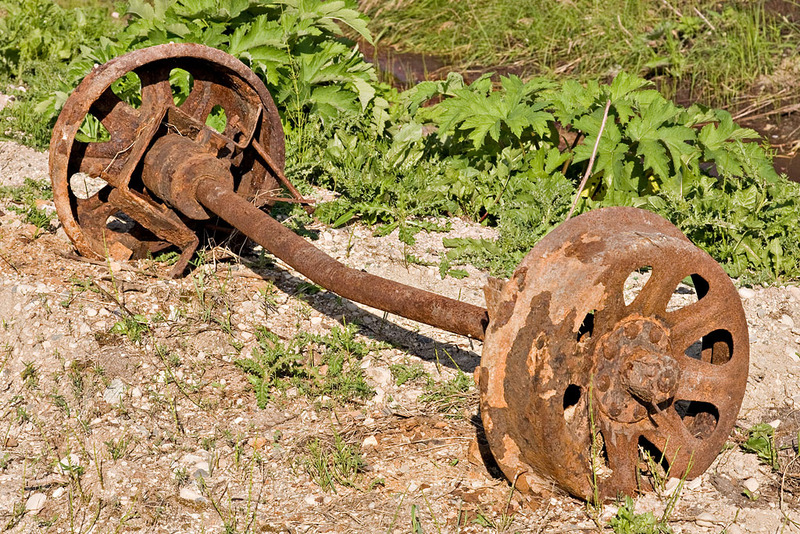 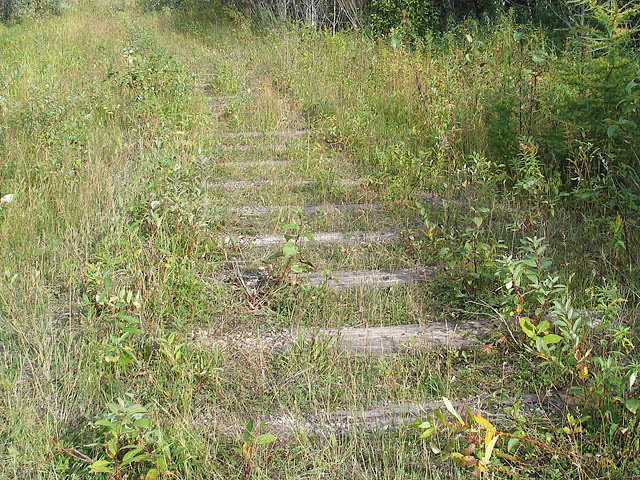 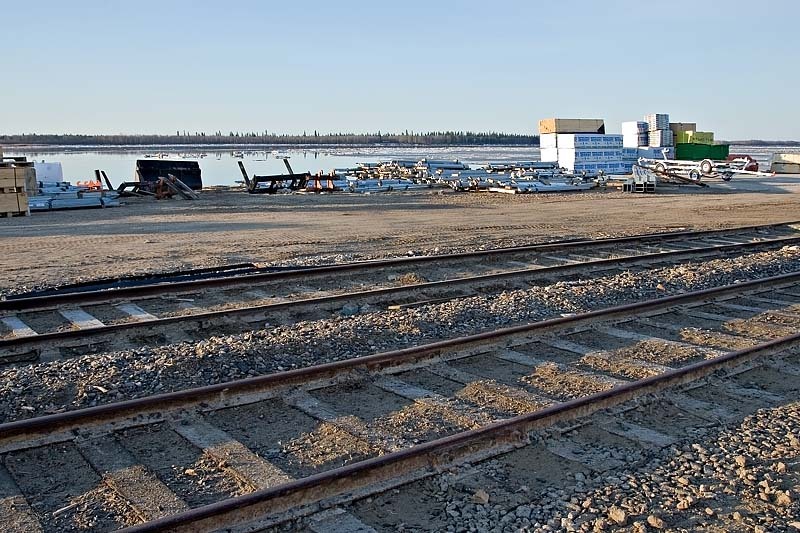 All that is left of siding to fuel depot at former base. 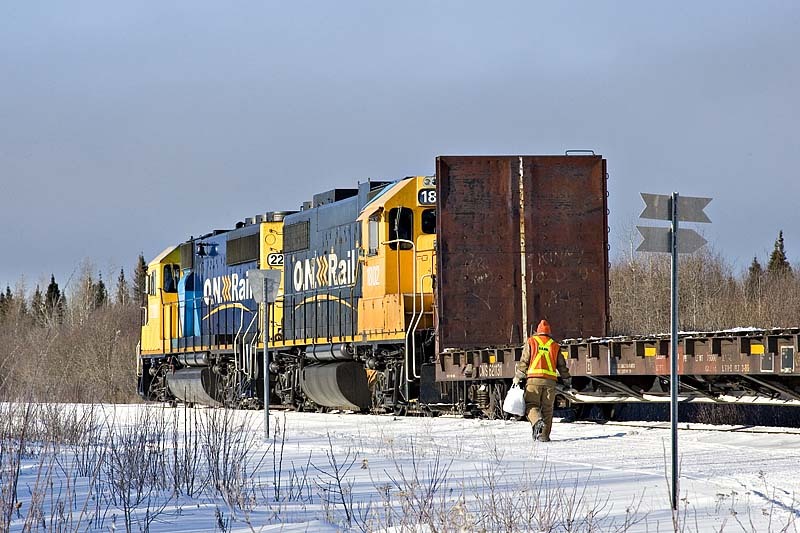 Towards Revillon Road North offloading. 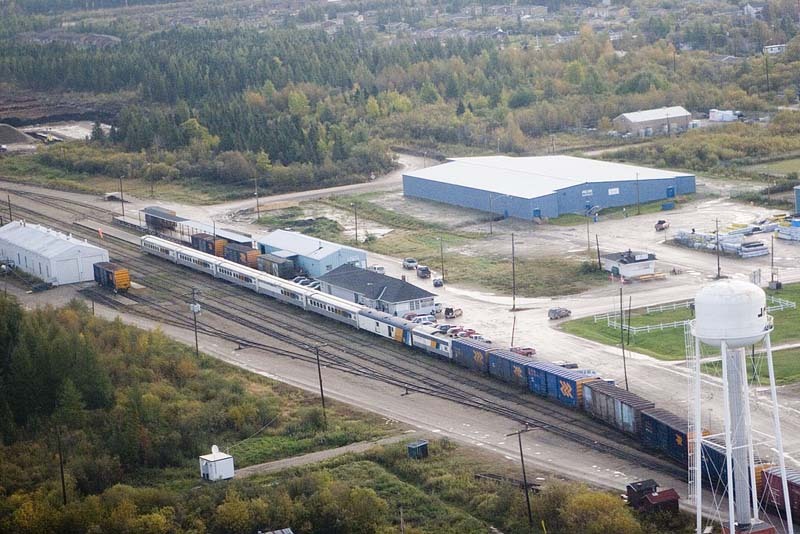 Towards Revillon Rd N offloading showing Ferguson Rd and Revillon Rd sidings. 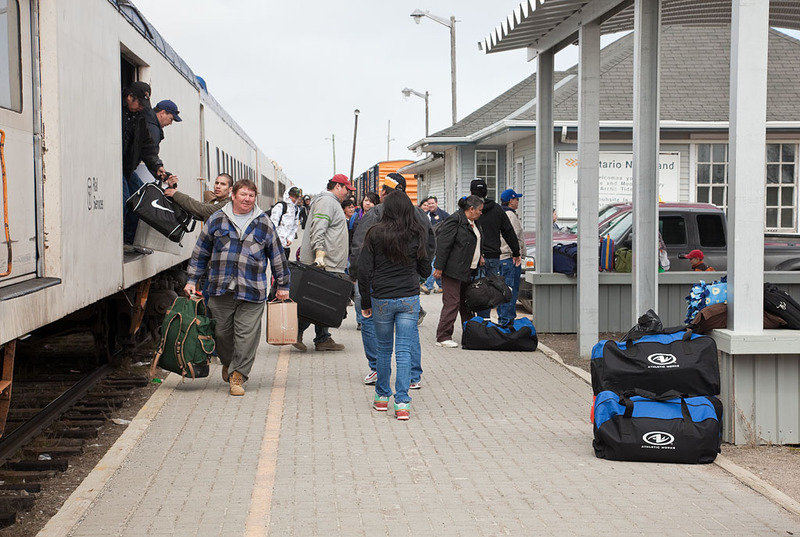 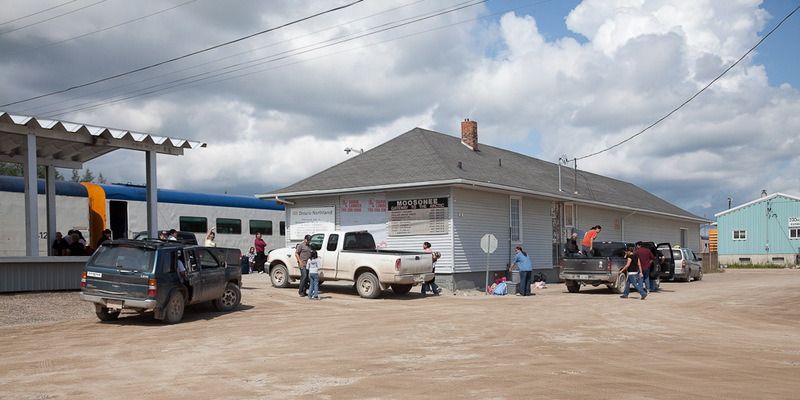 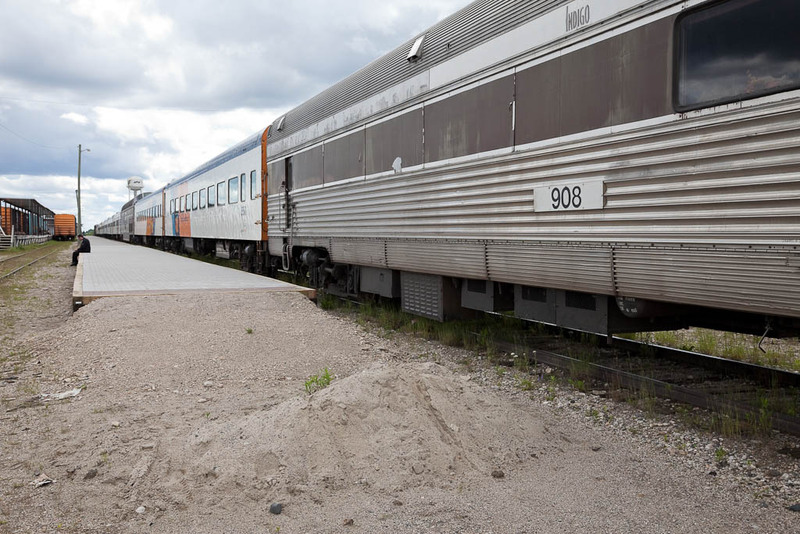 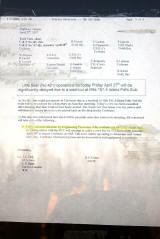 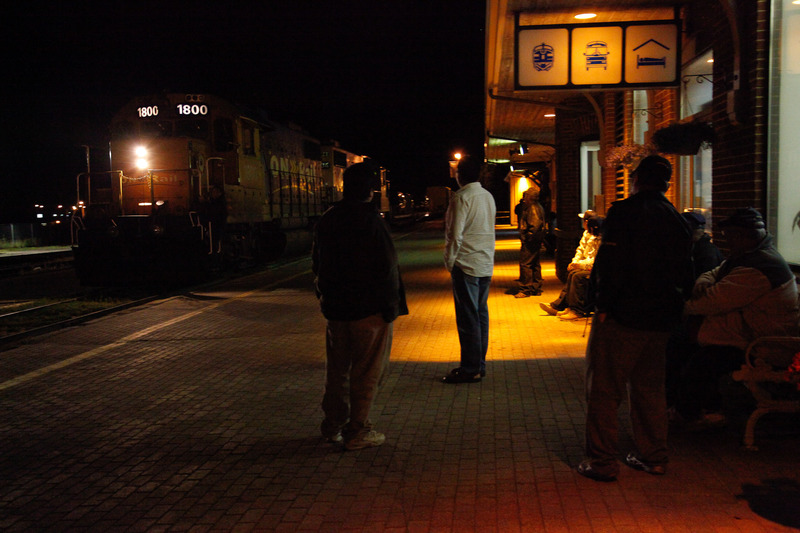 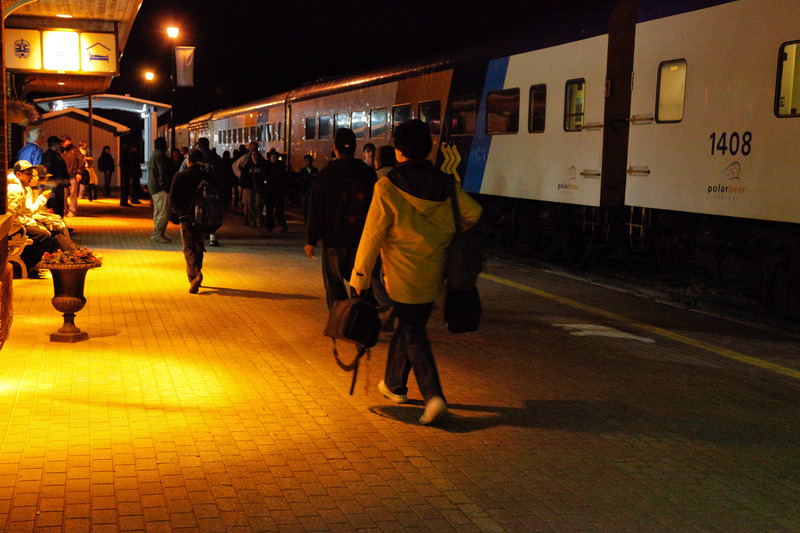 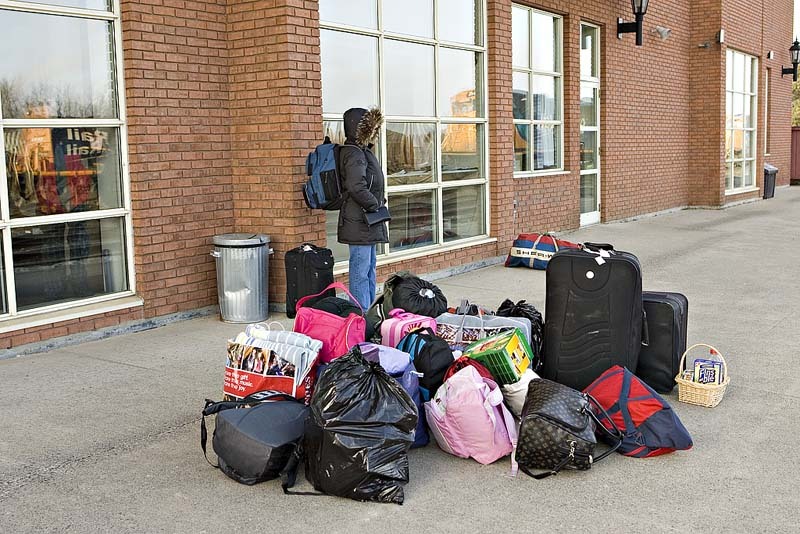 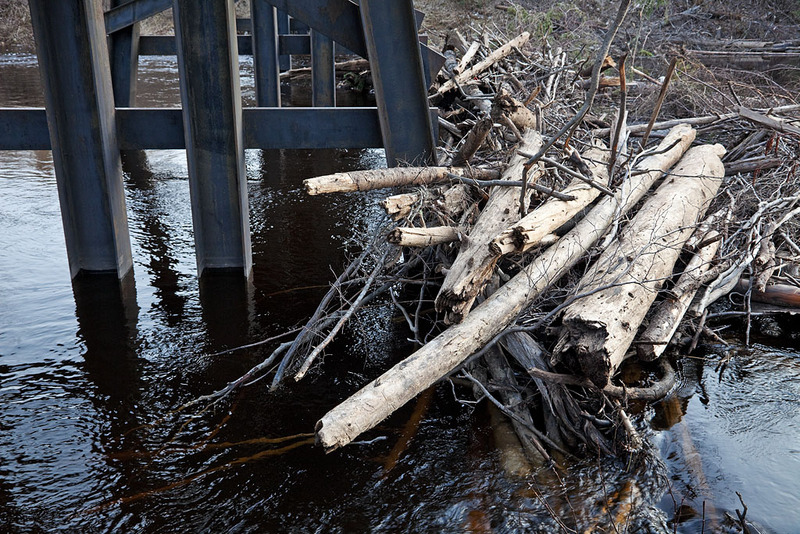 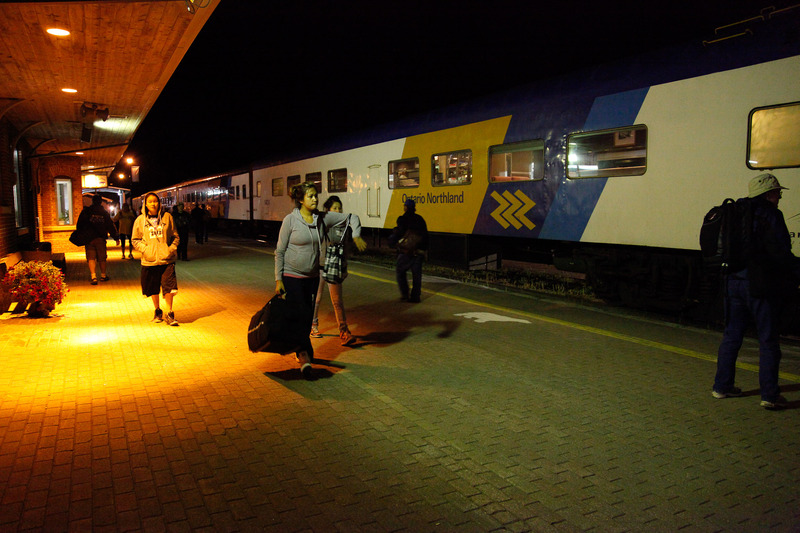 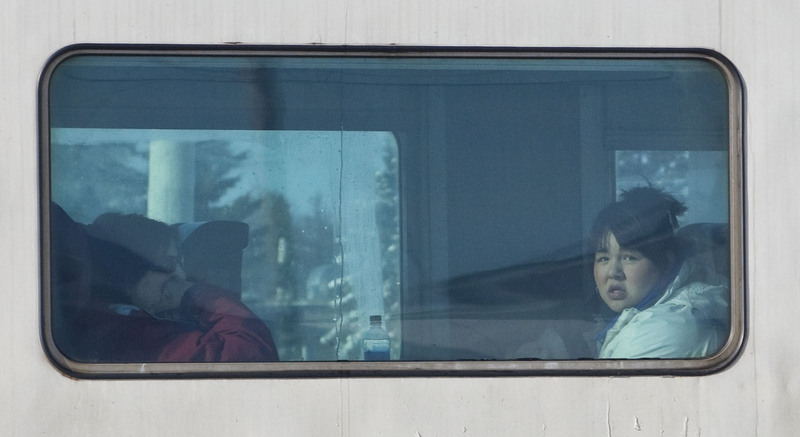 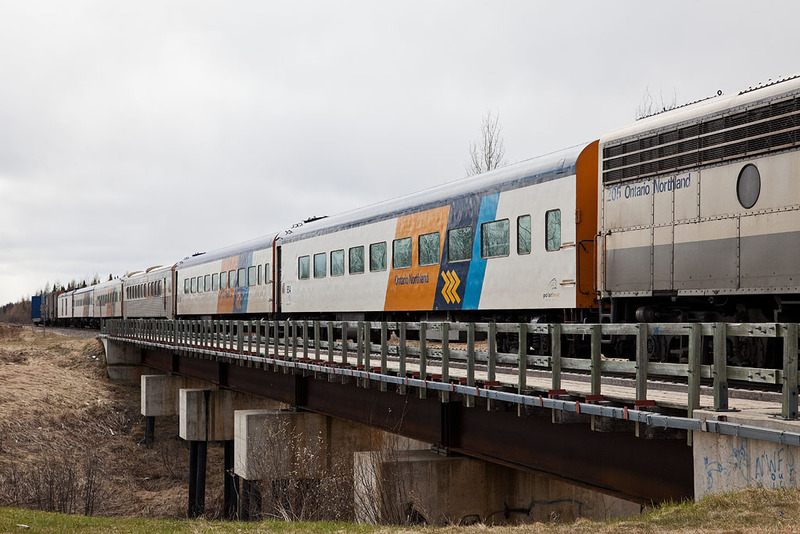 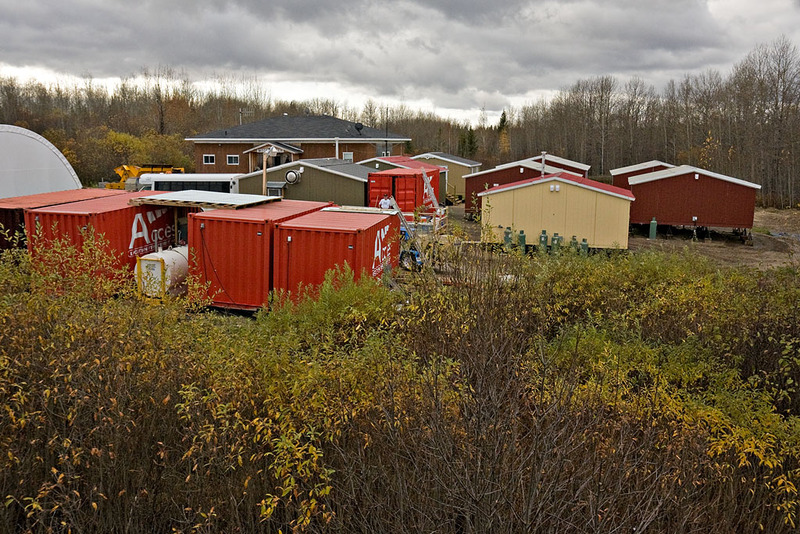 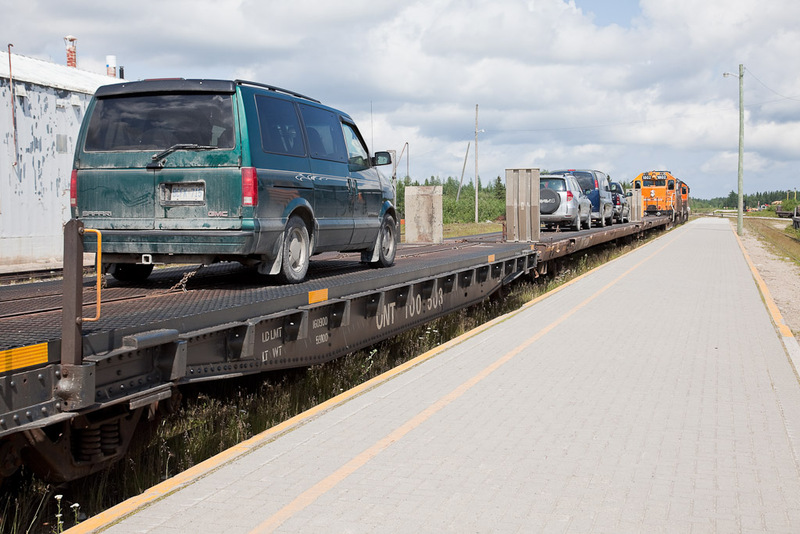 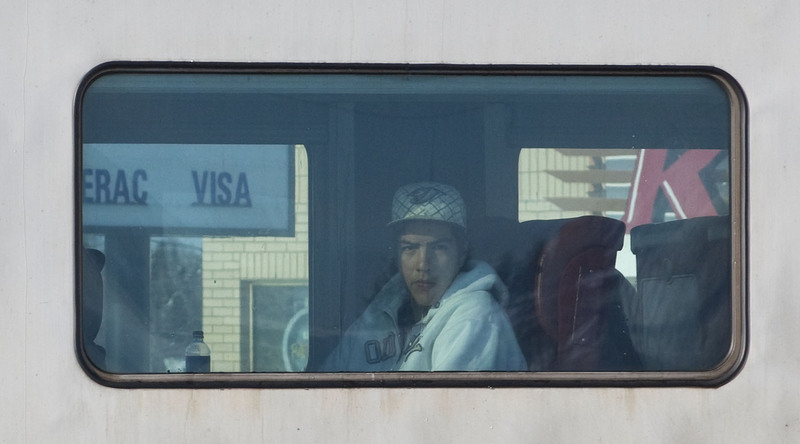 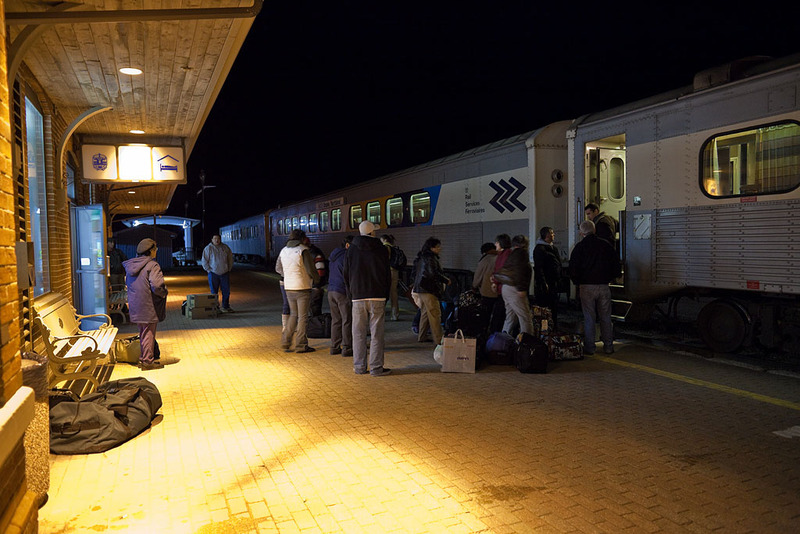 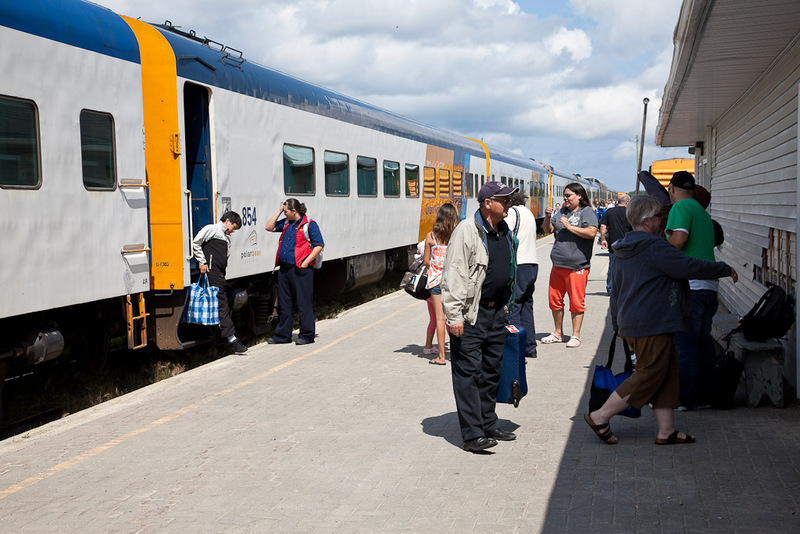 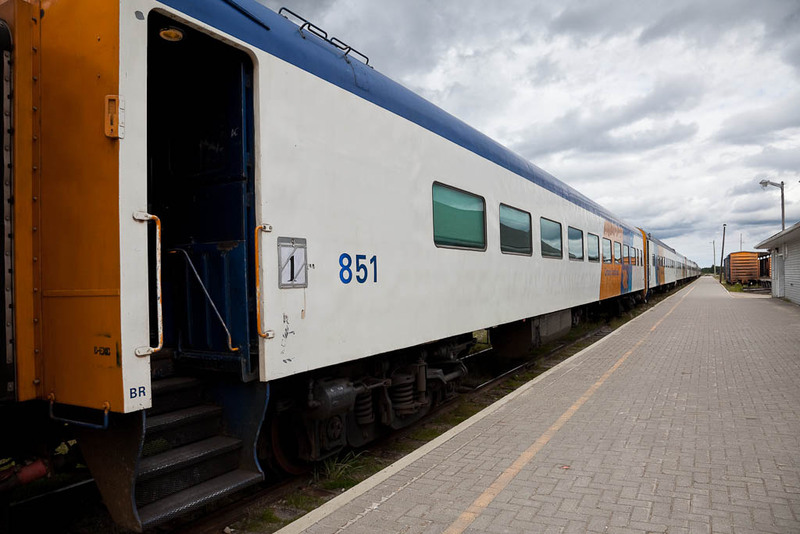 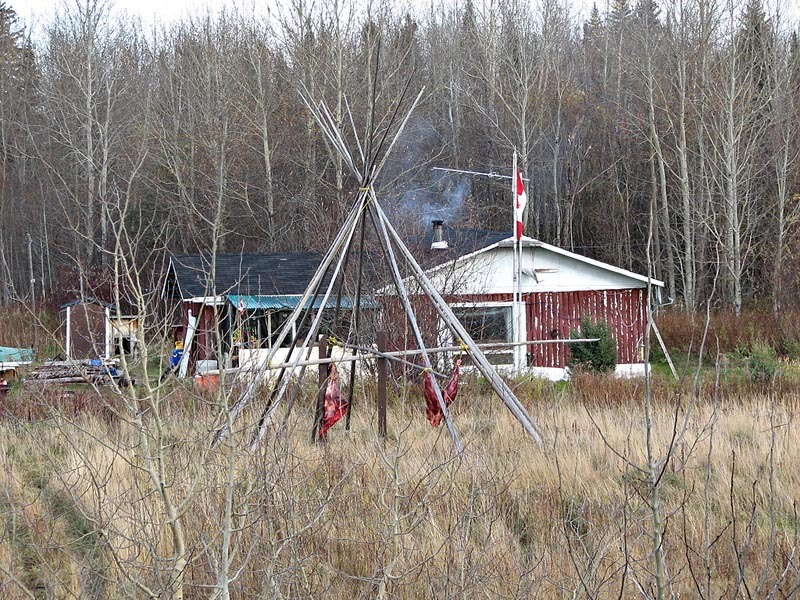 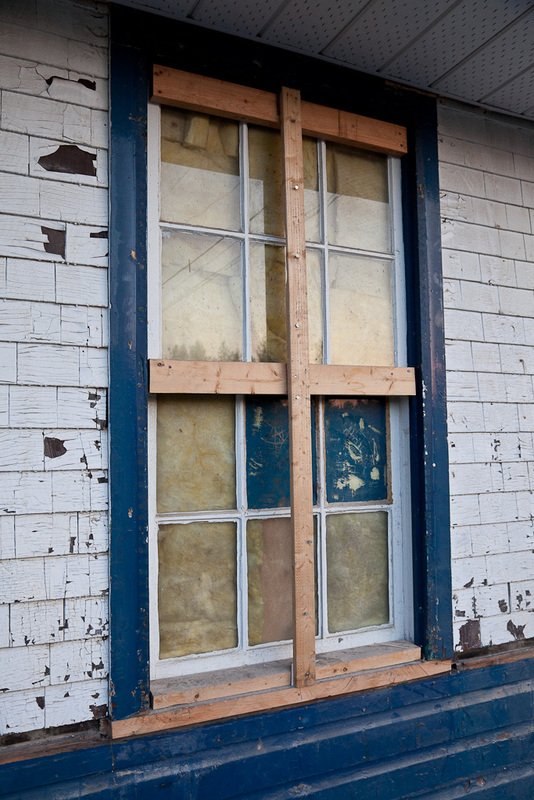 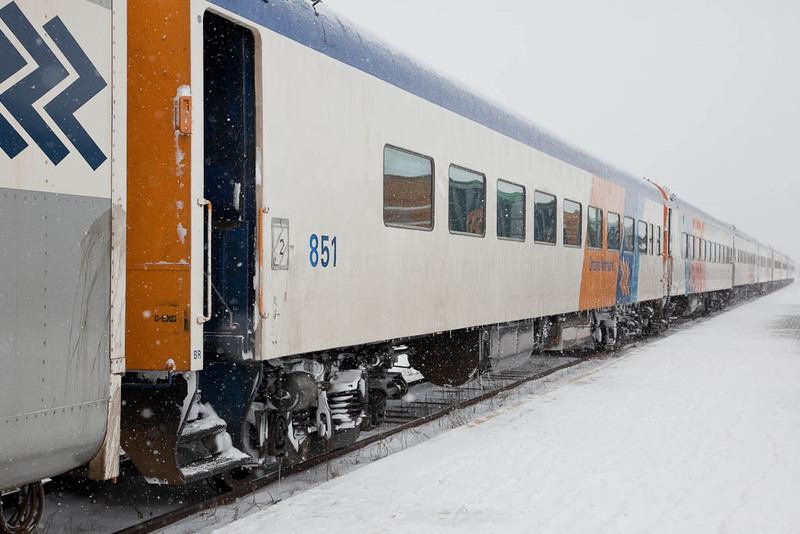 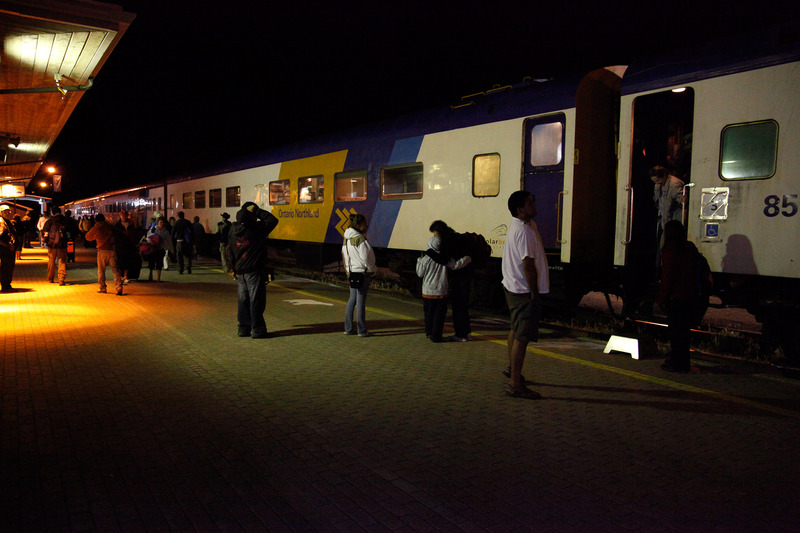 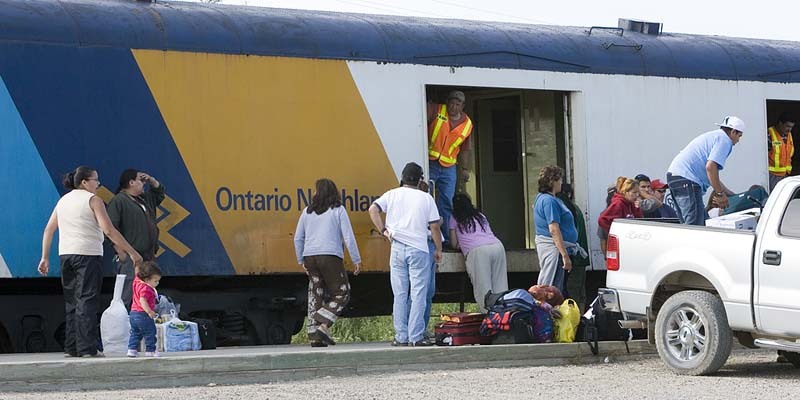 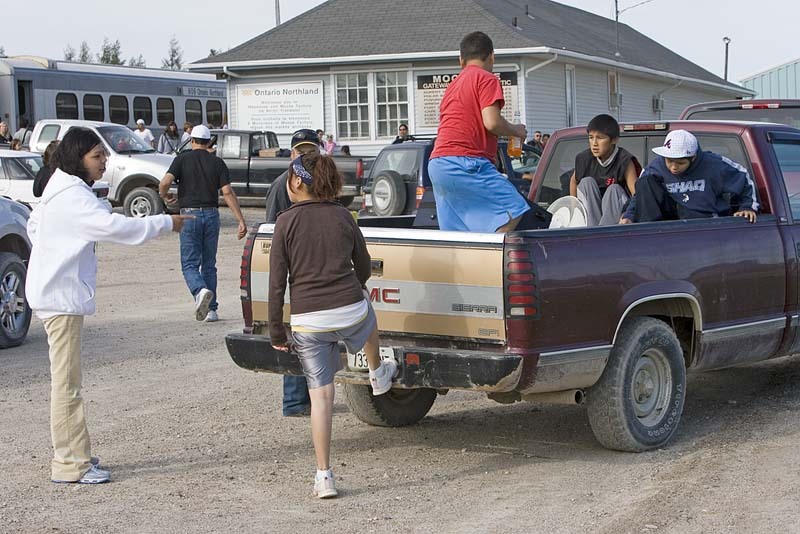 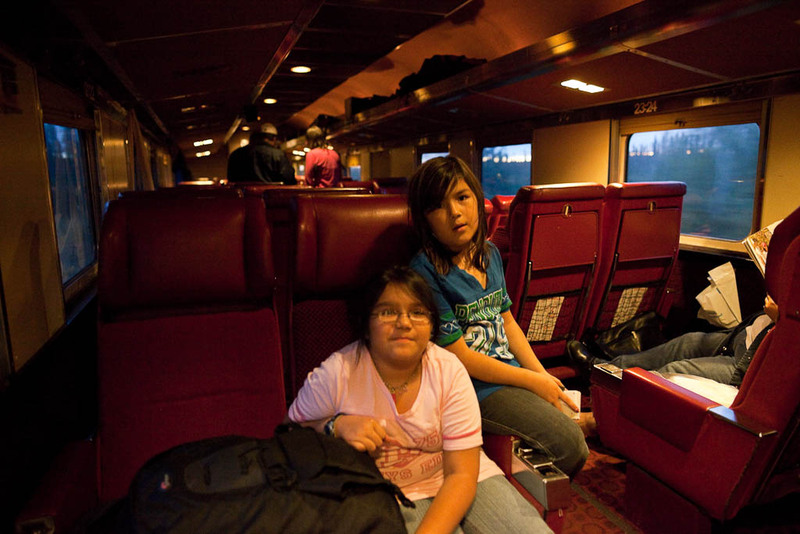 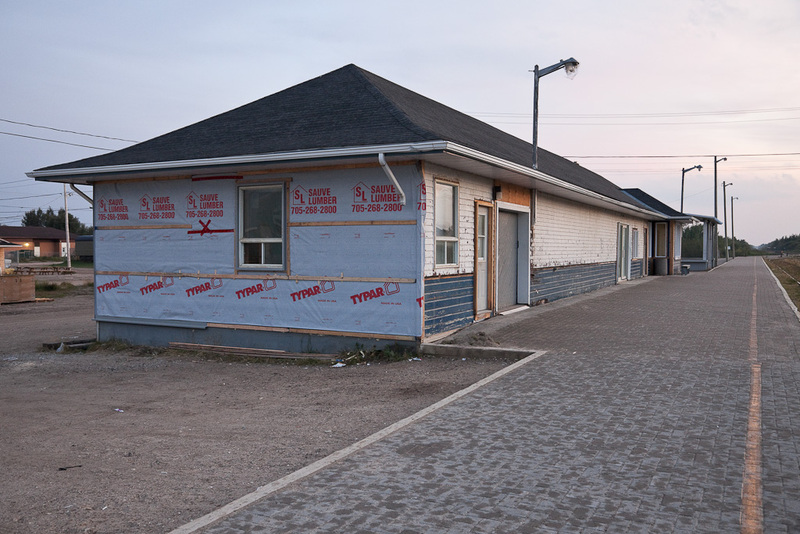 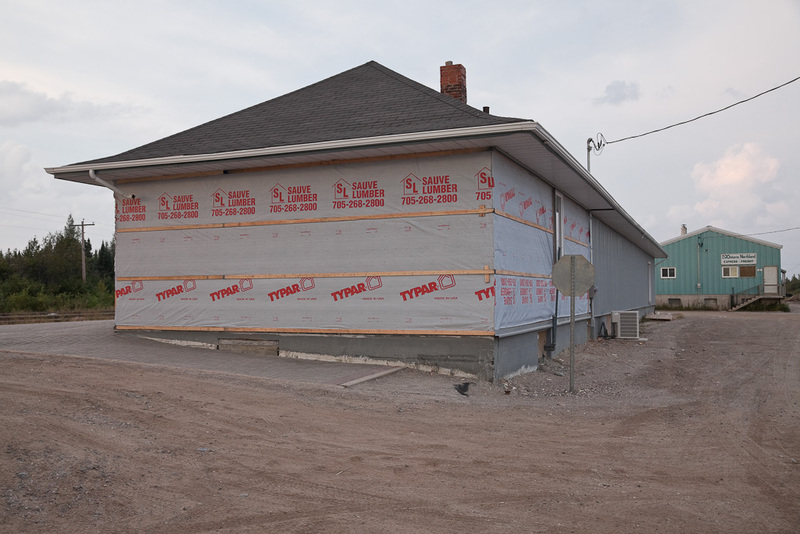 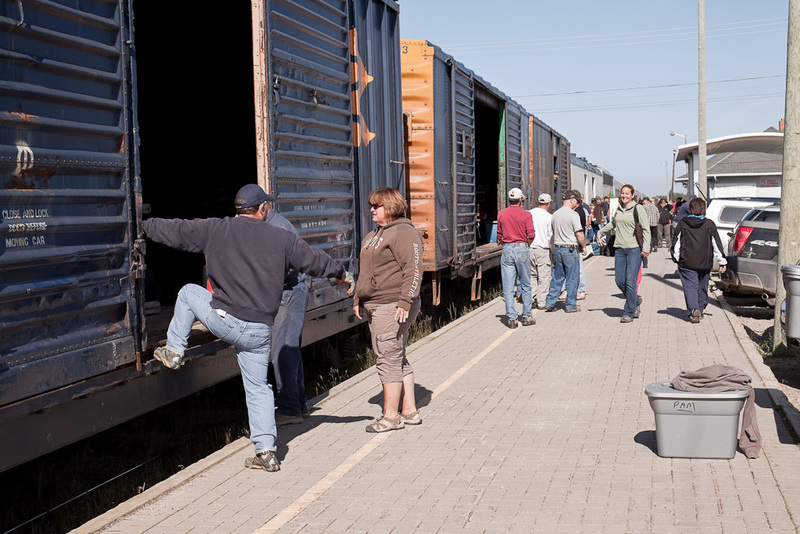 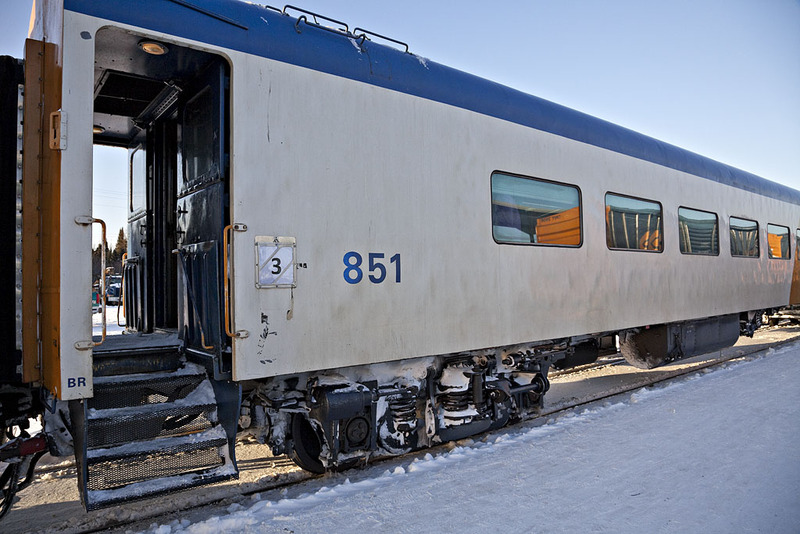 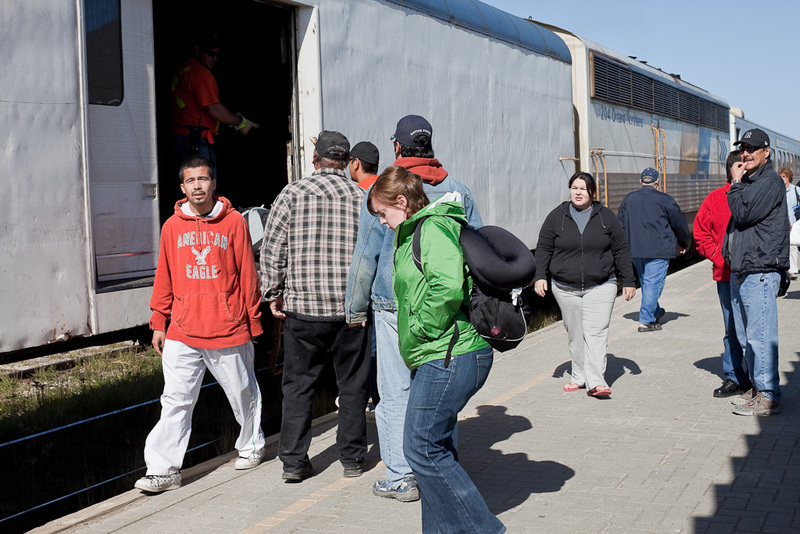 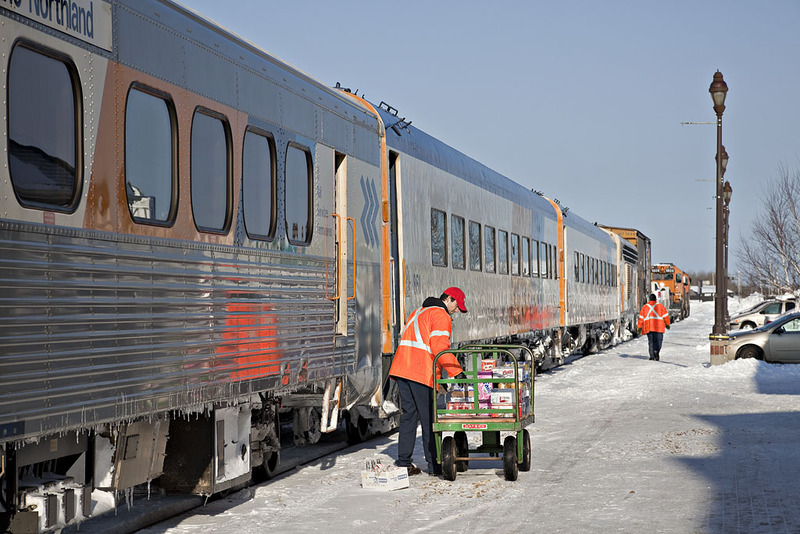 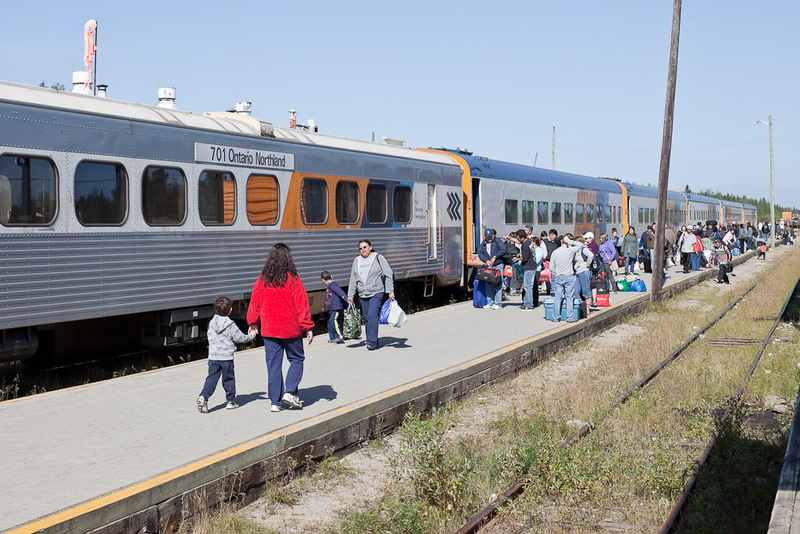 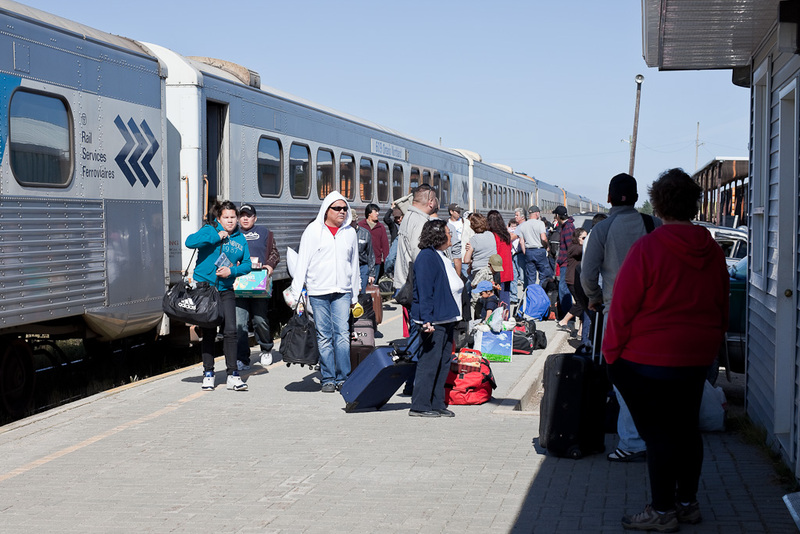 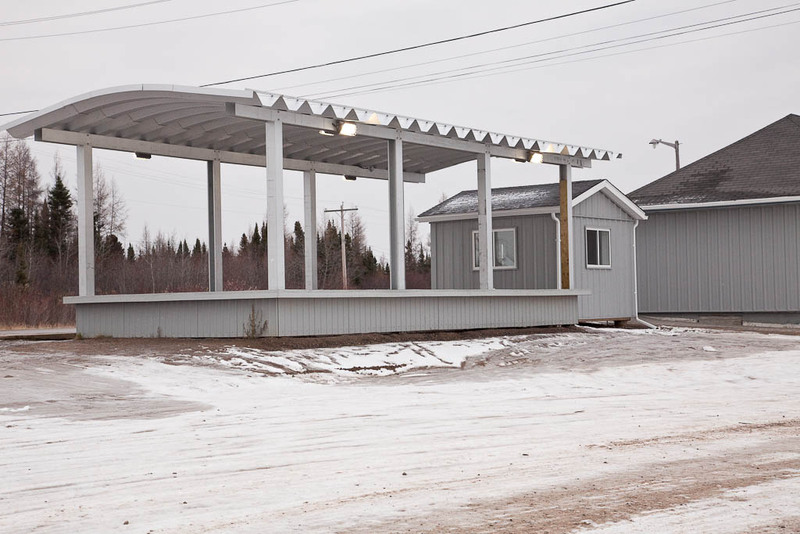 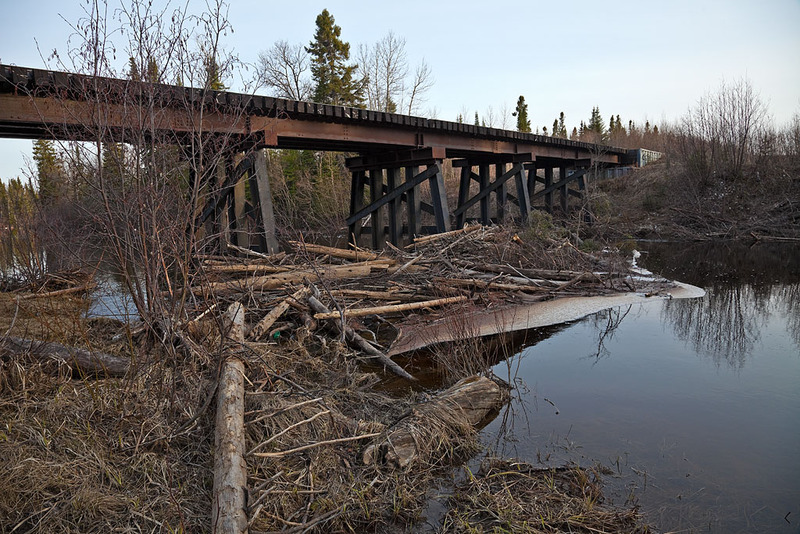 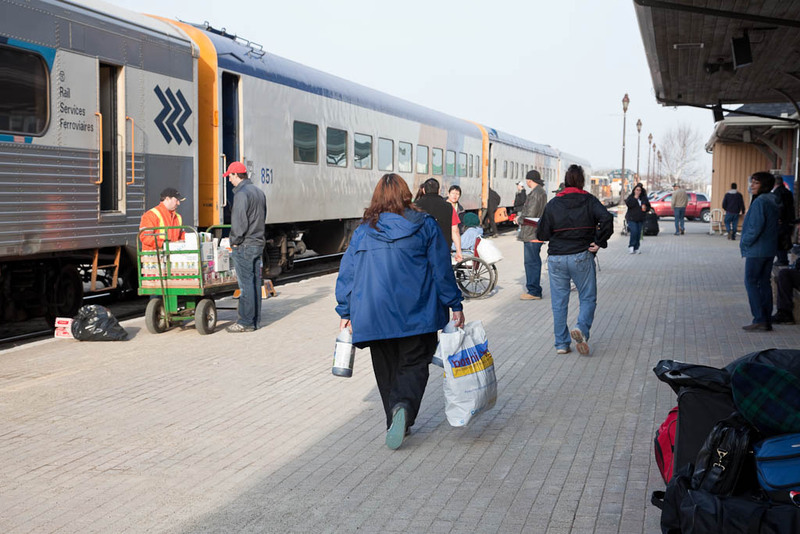 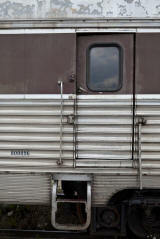 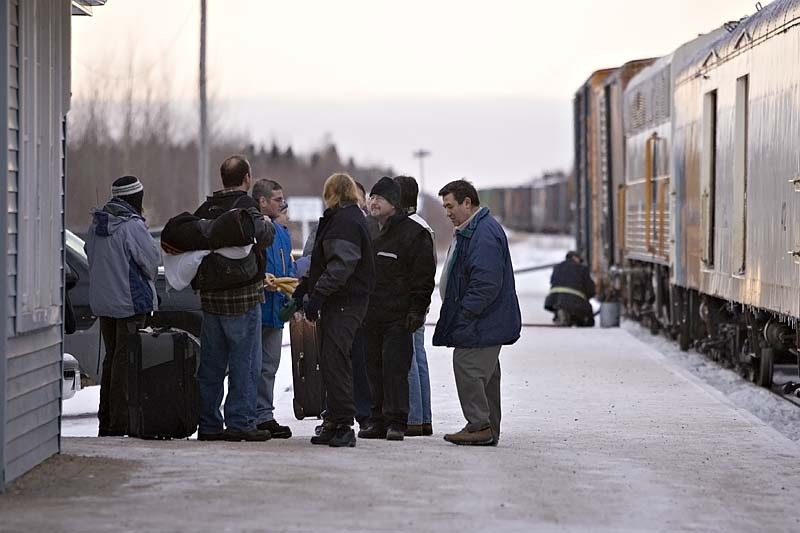 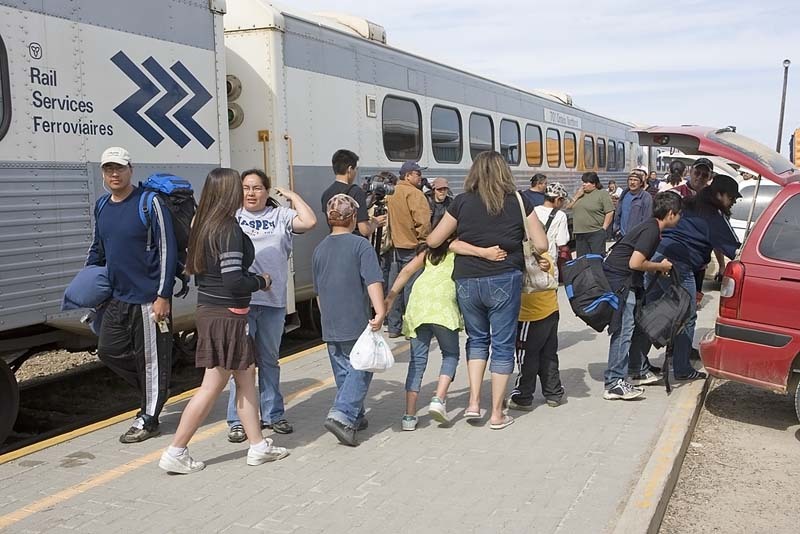 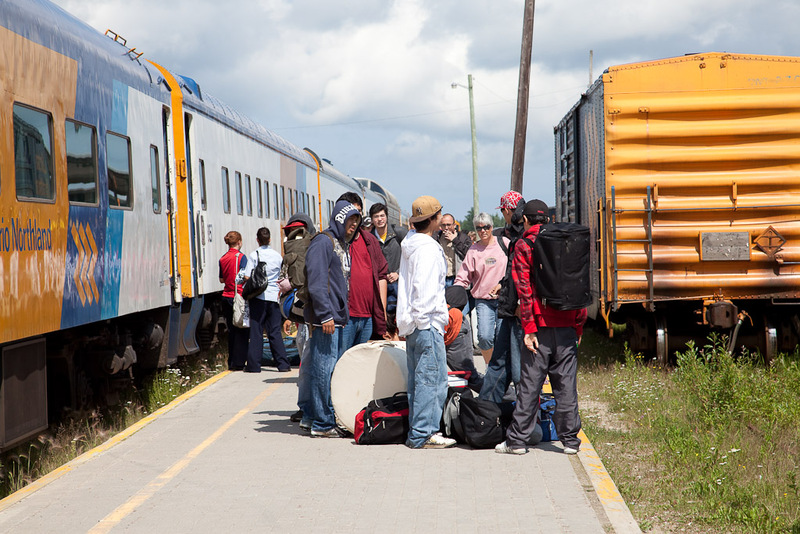 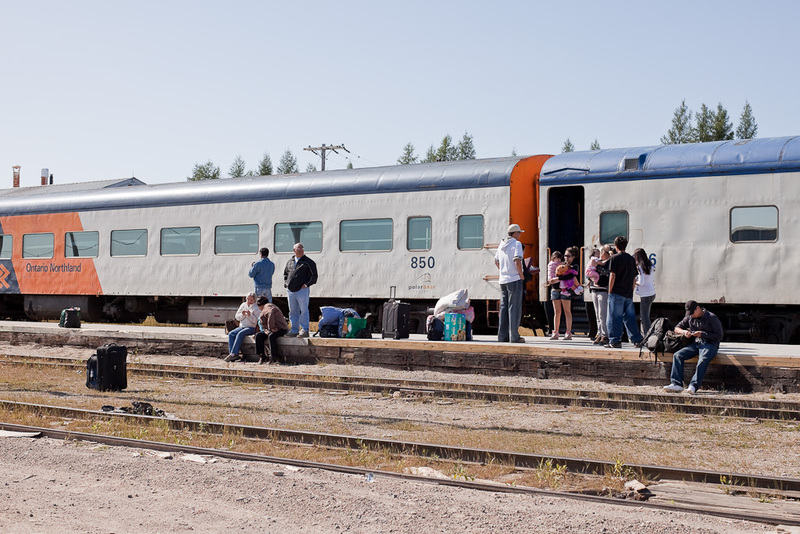 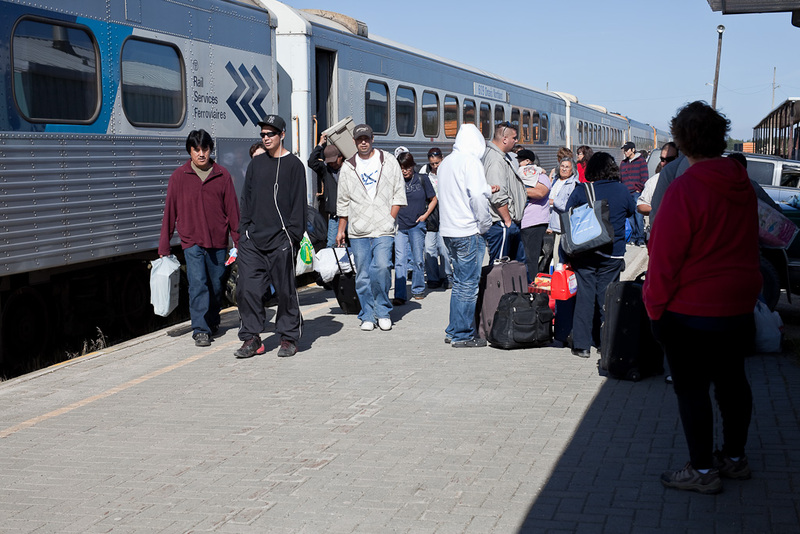 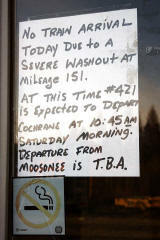 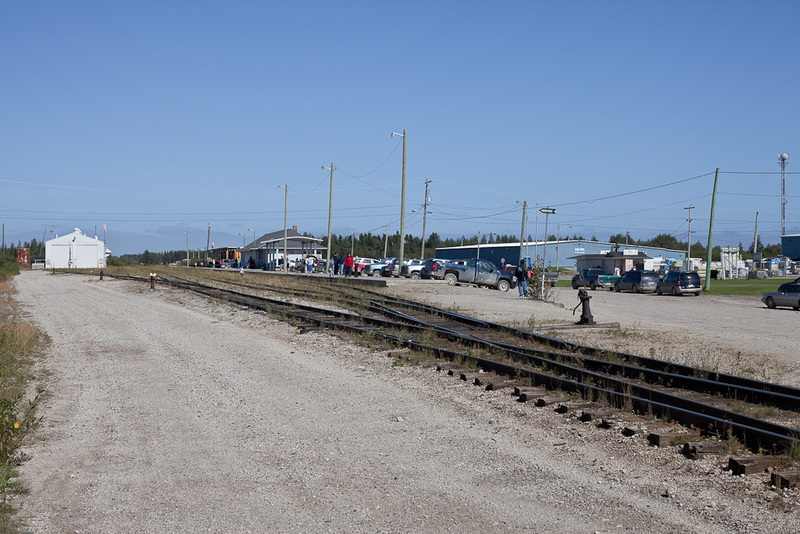 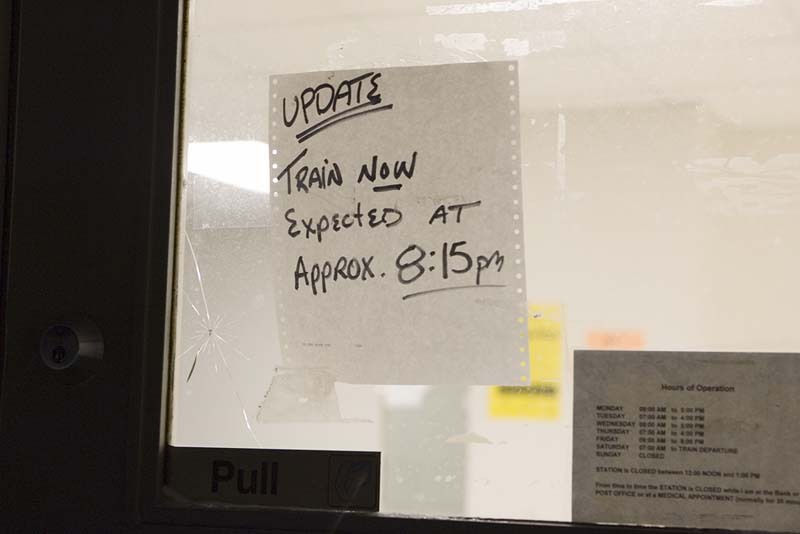 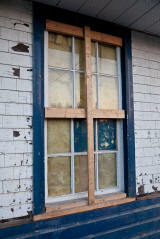 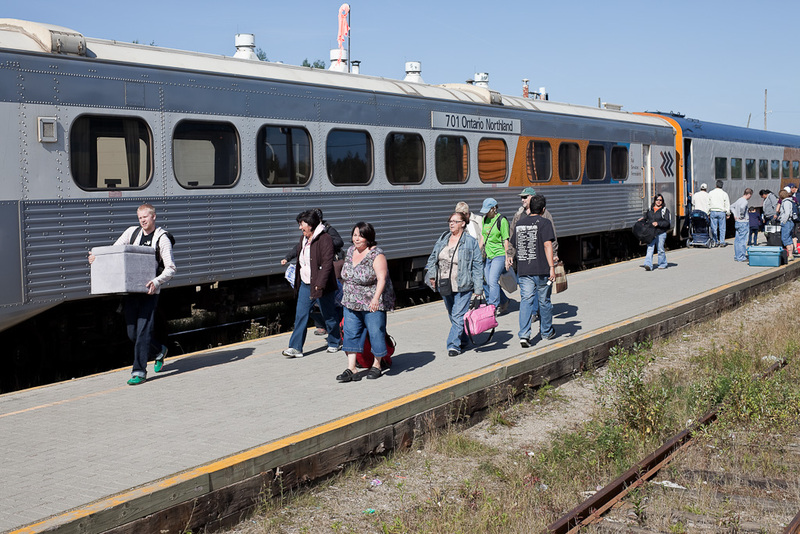 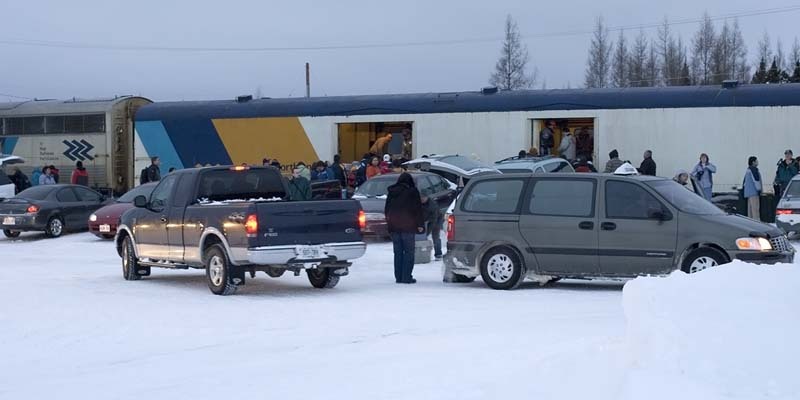 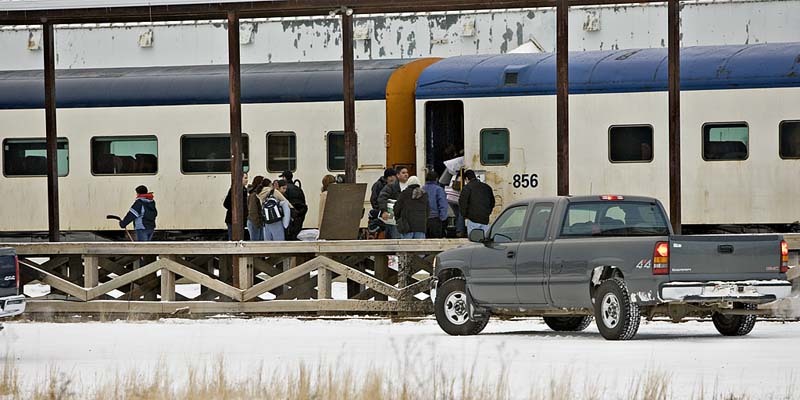 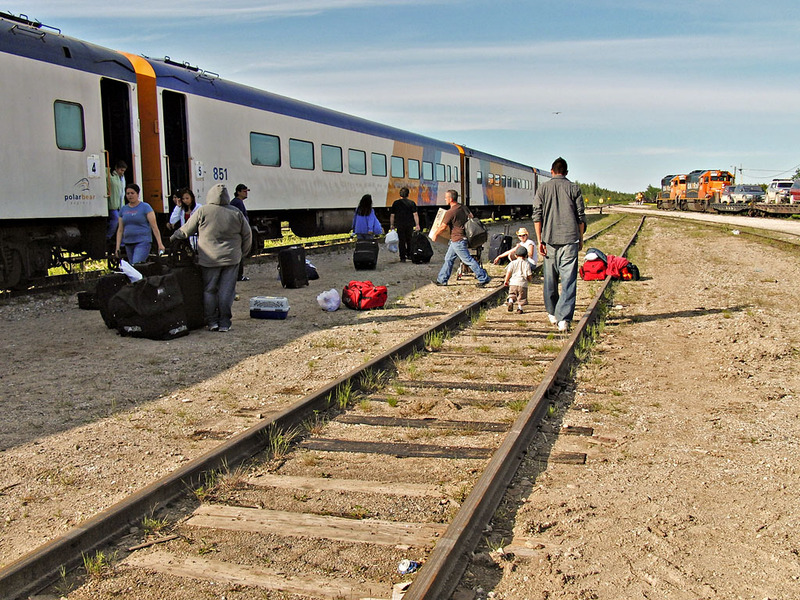 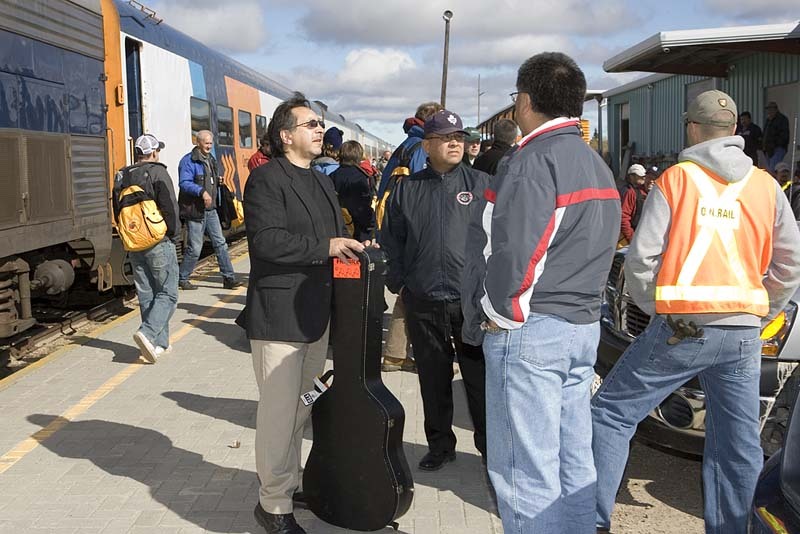 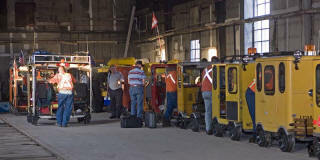 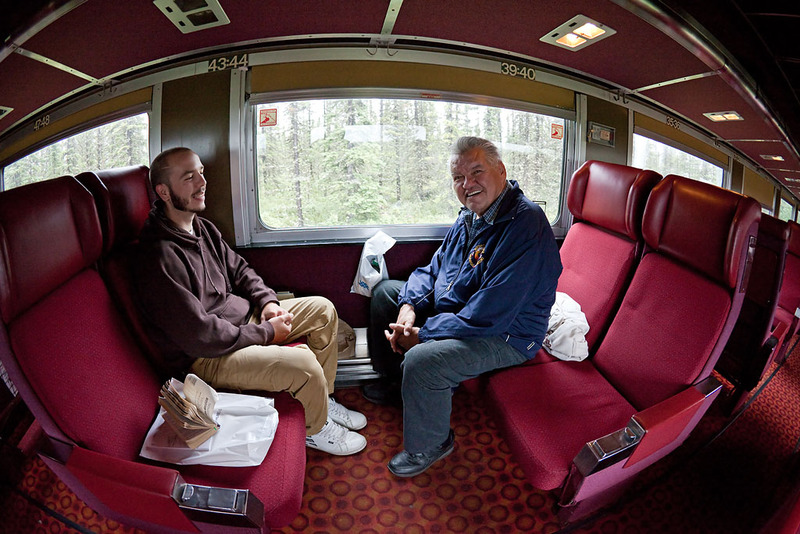 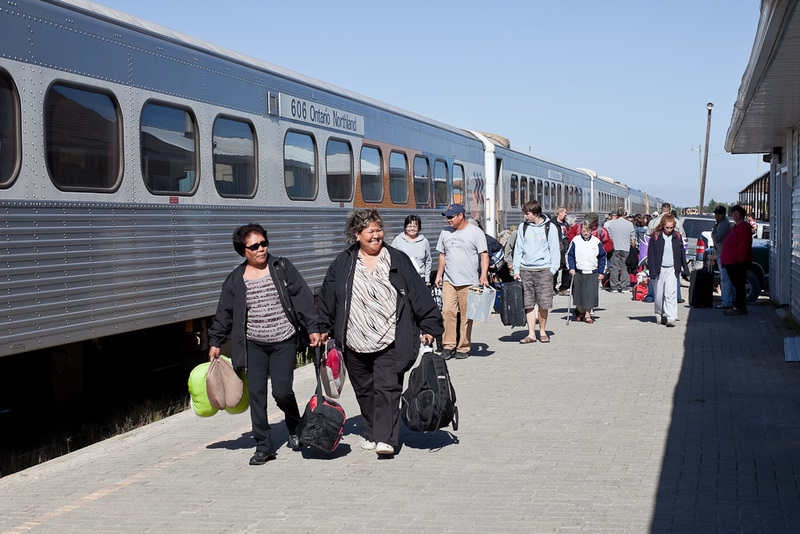 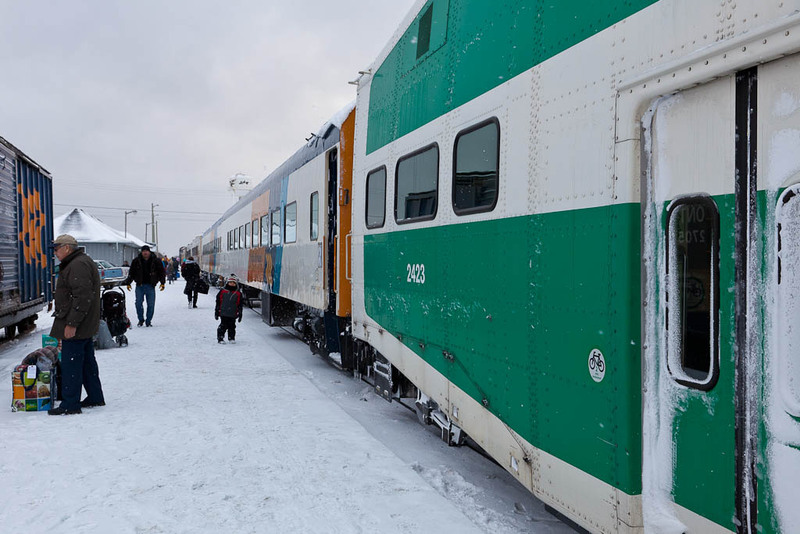 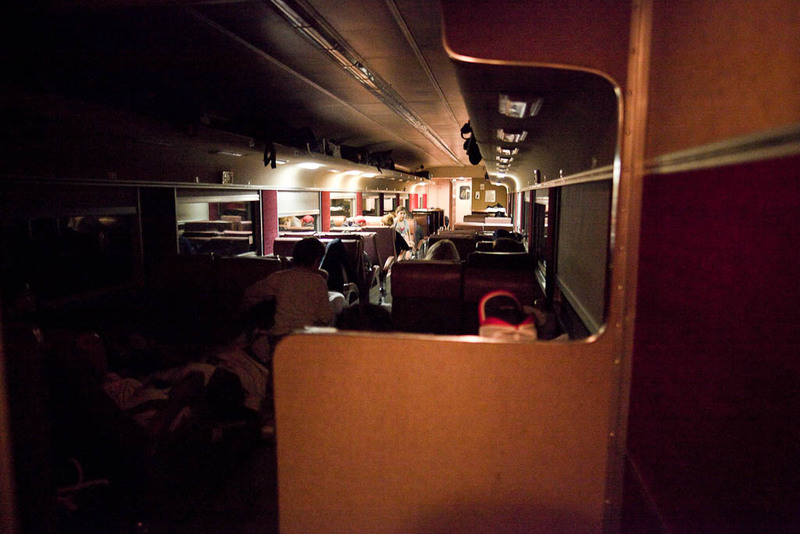 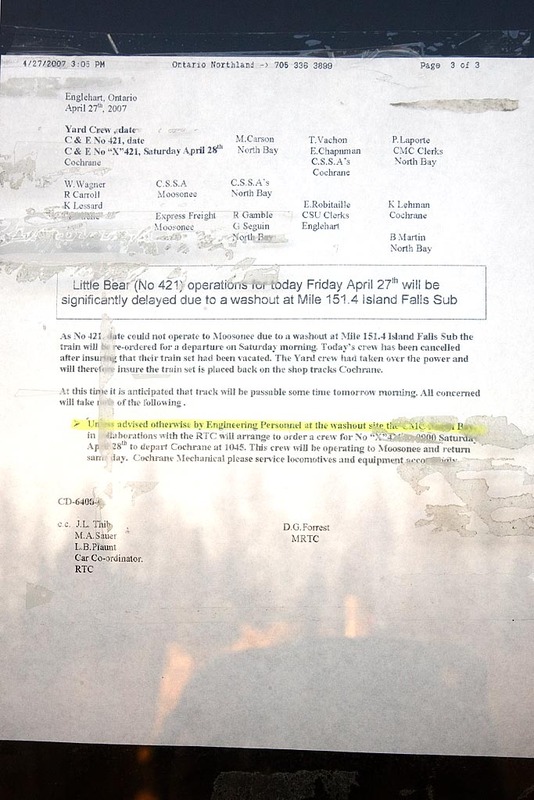 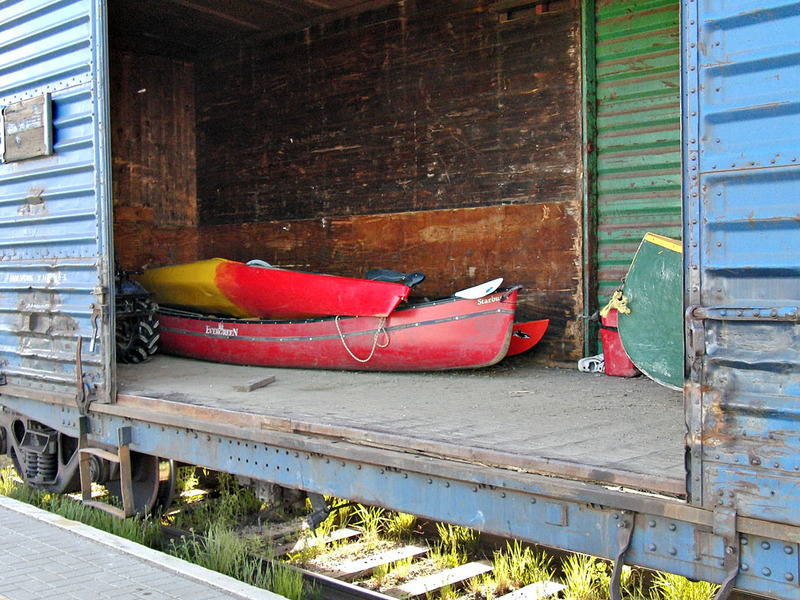 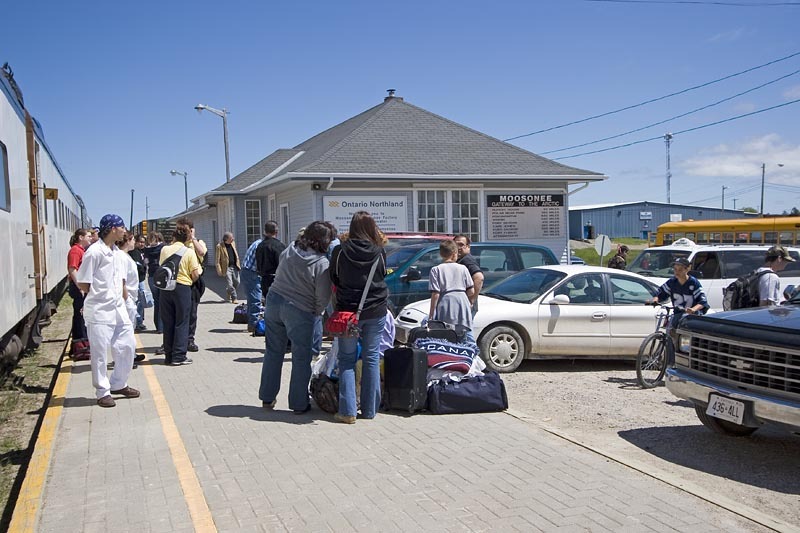 Due to flooding, Attawapiskat residents flown to Moosonee by Canadian Forces and on to Timmins by rail.